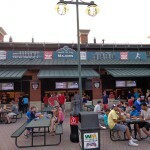 Every great ballpark finds some way to represent its region or city. 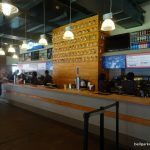 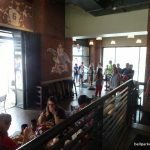 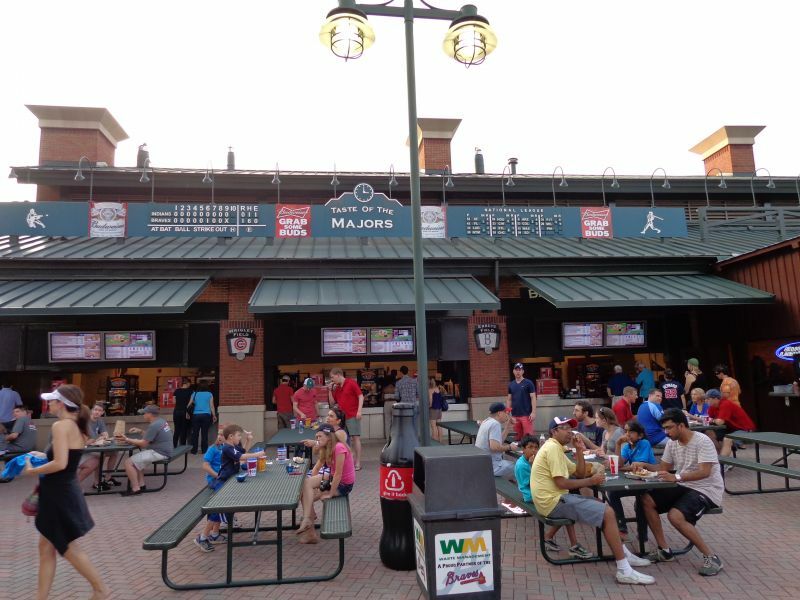 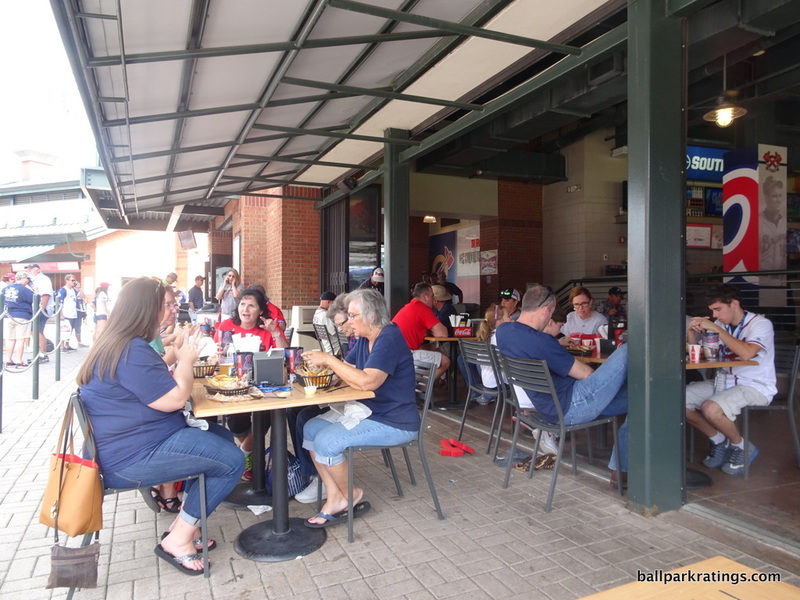 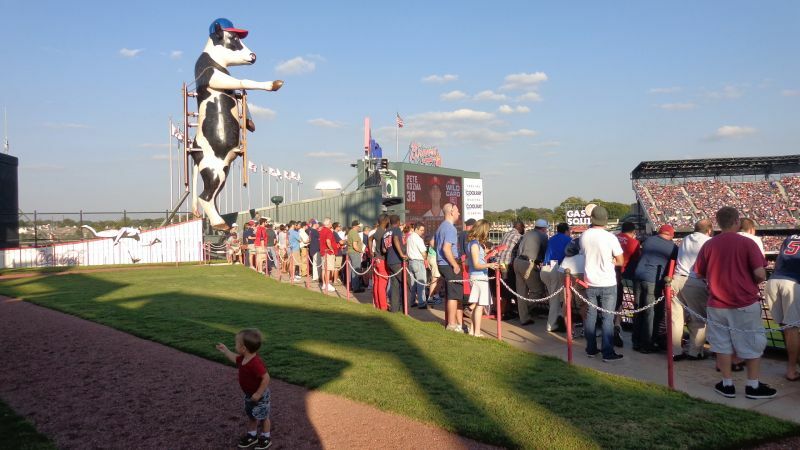 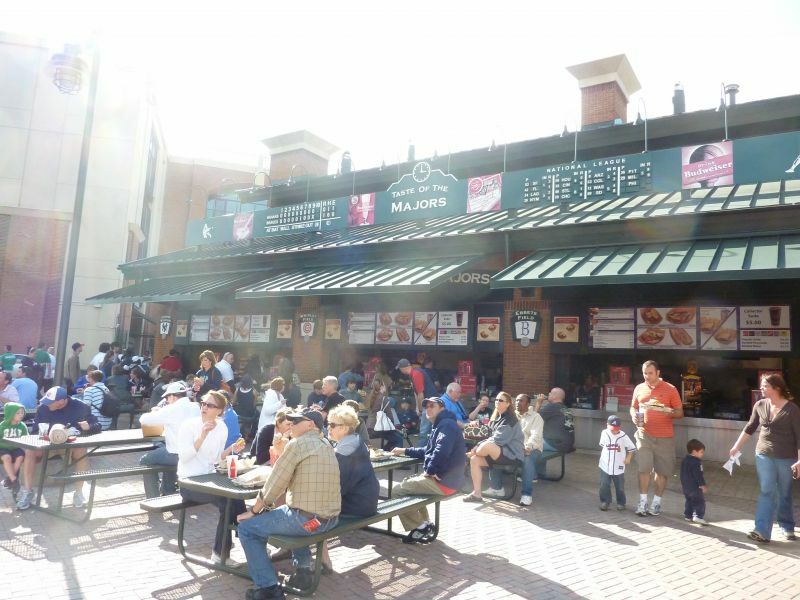 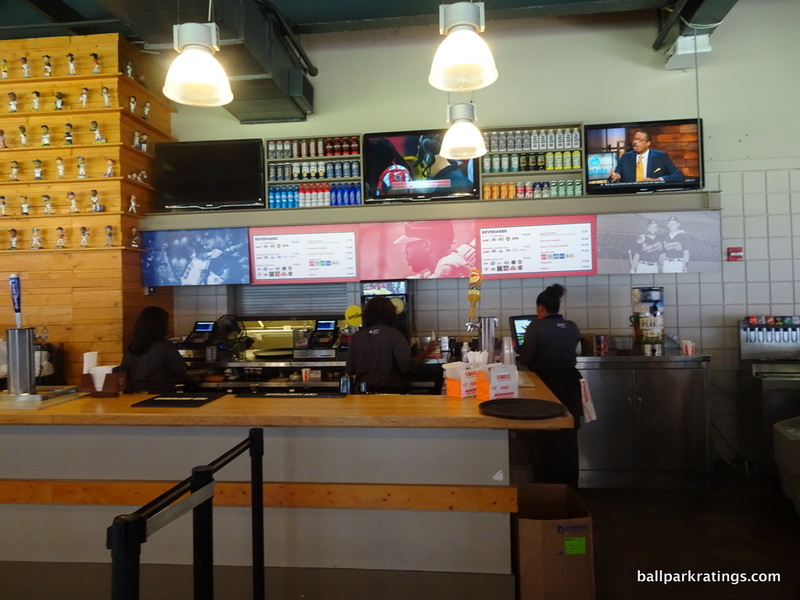 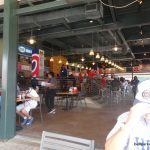 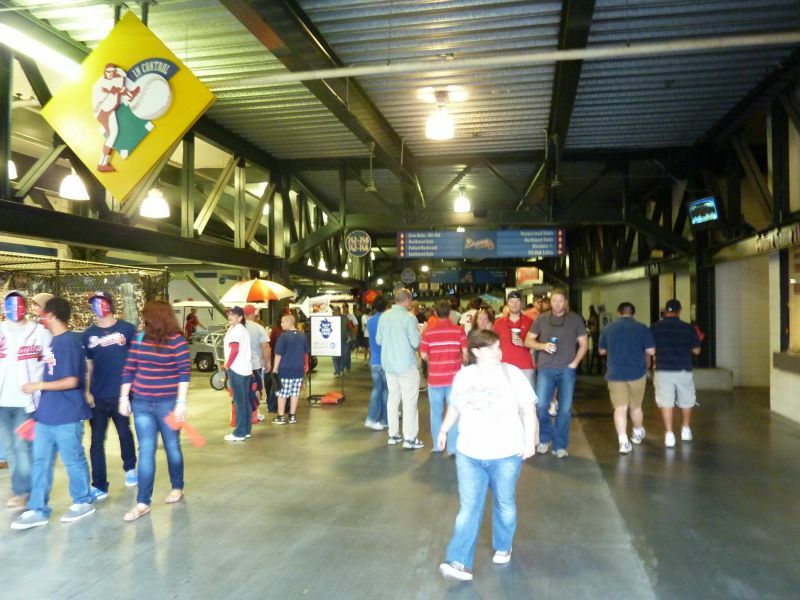 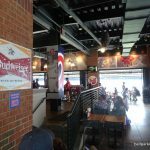 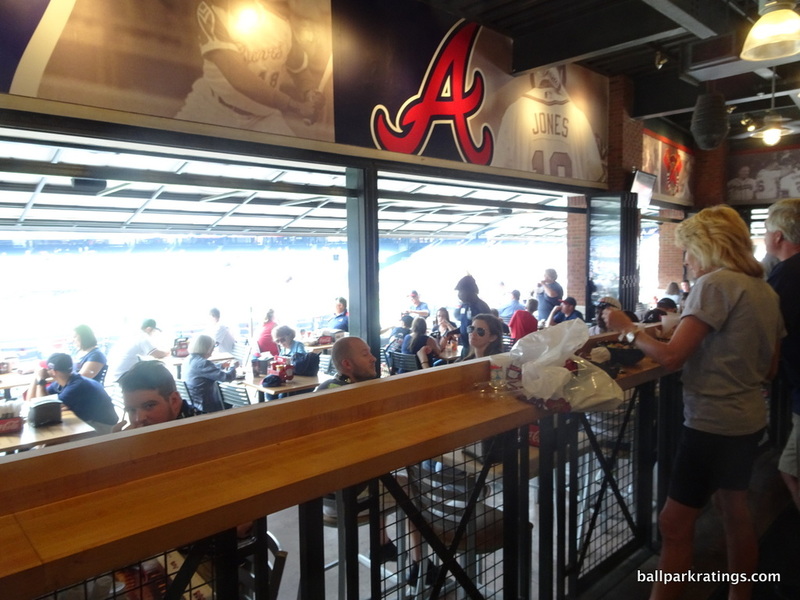 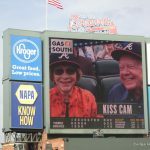 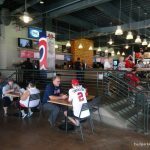 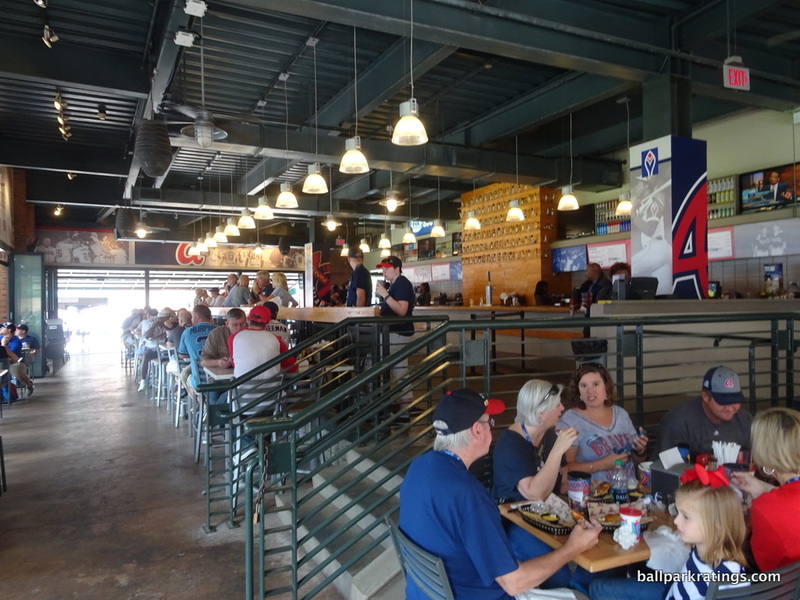 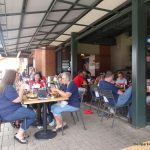 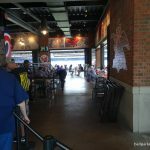 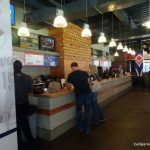 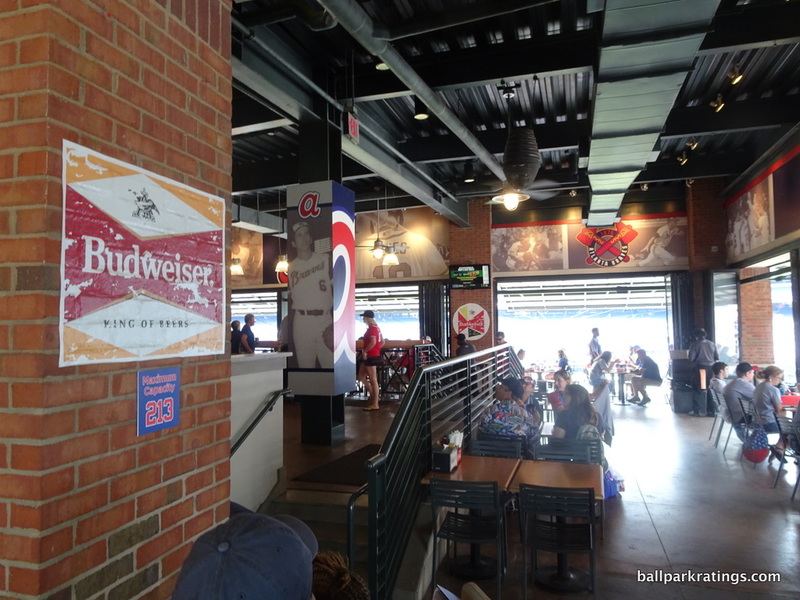 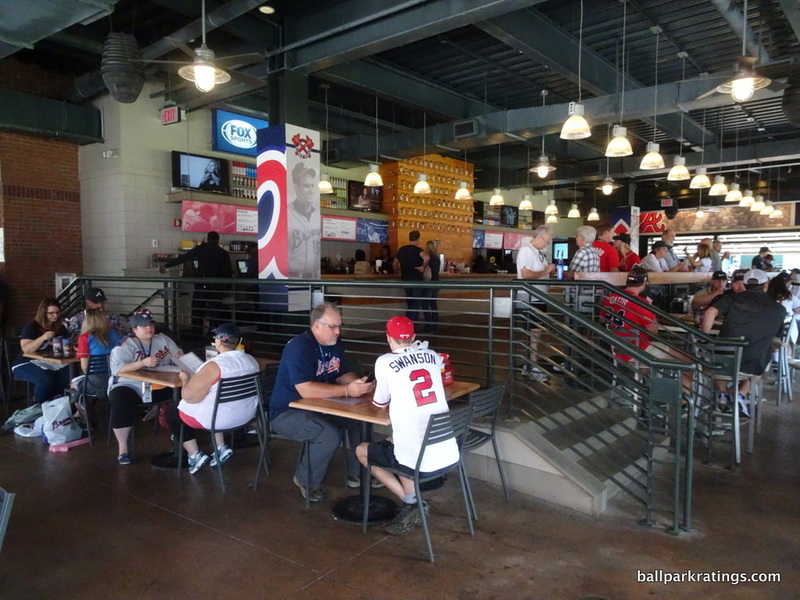 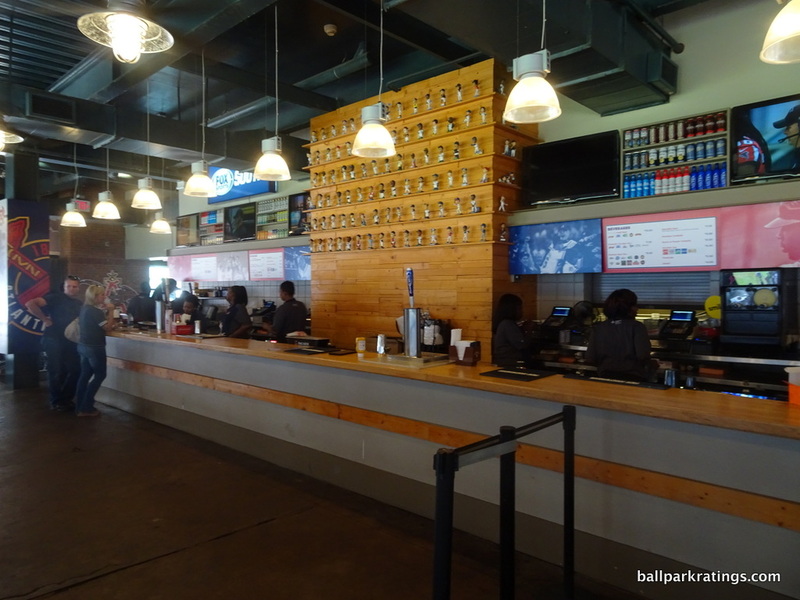 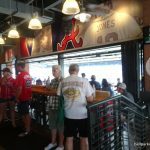 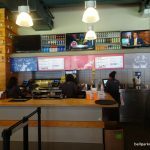 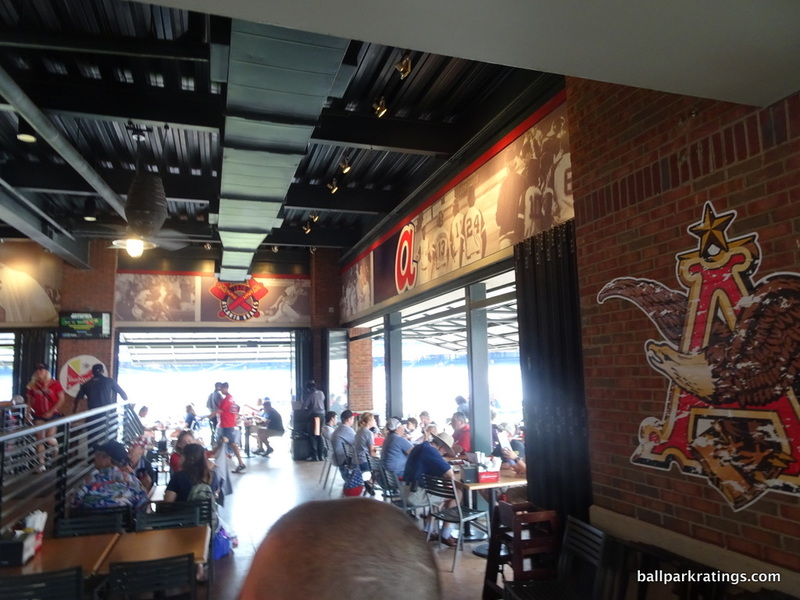 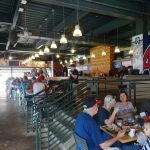 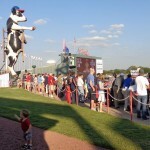 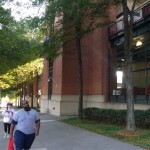 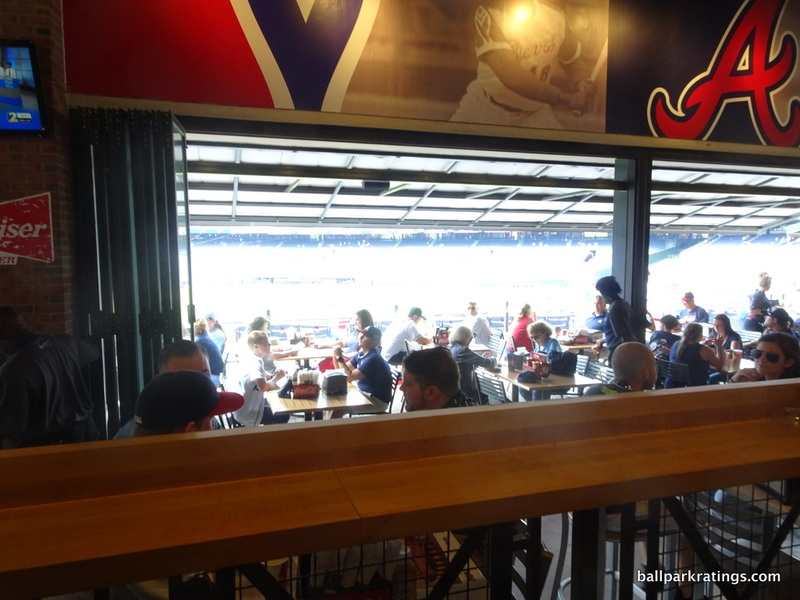 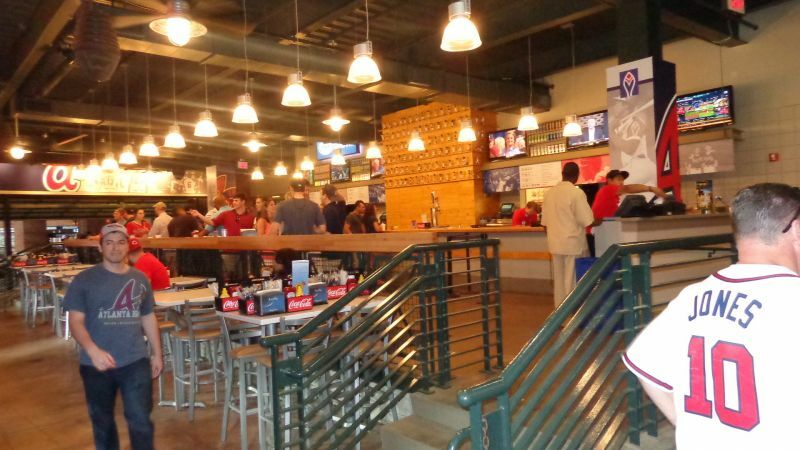 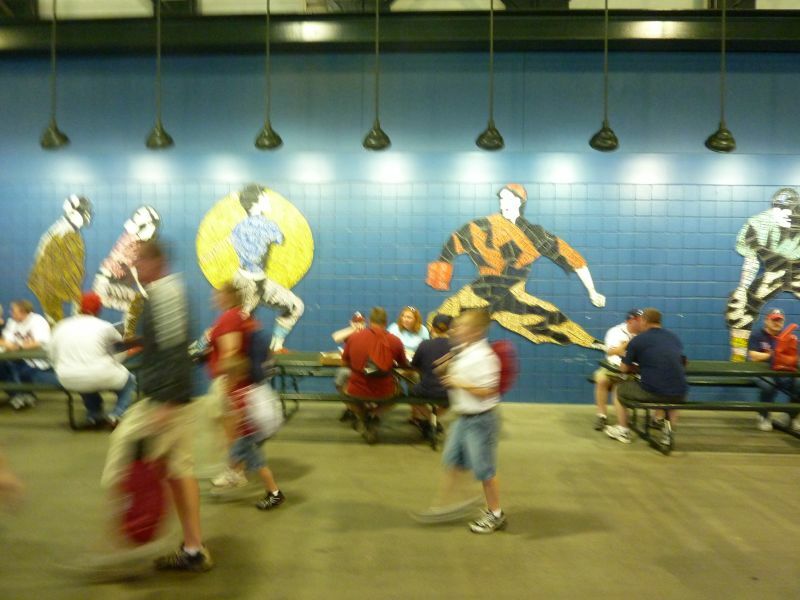 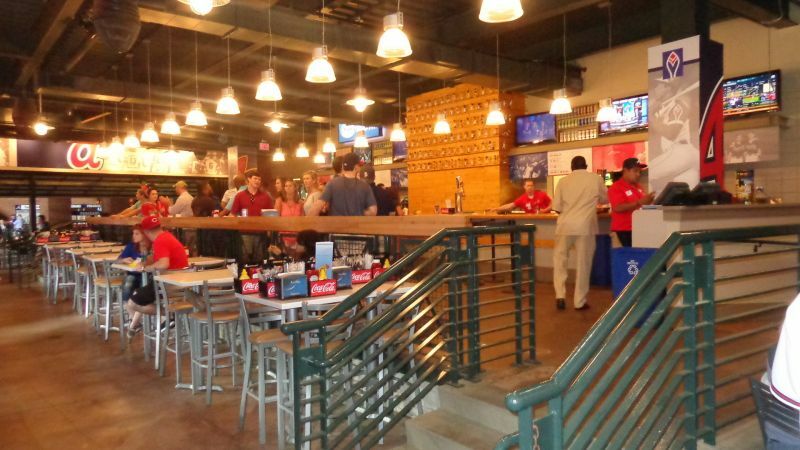 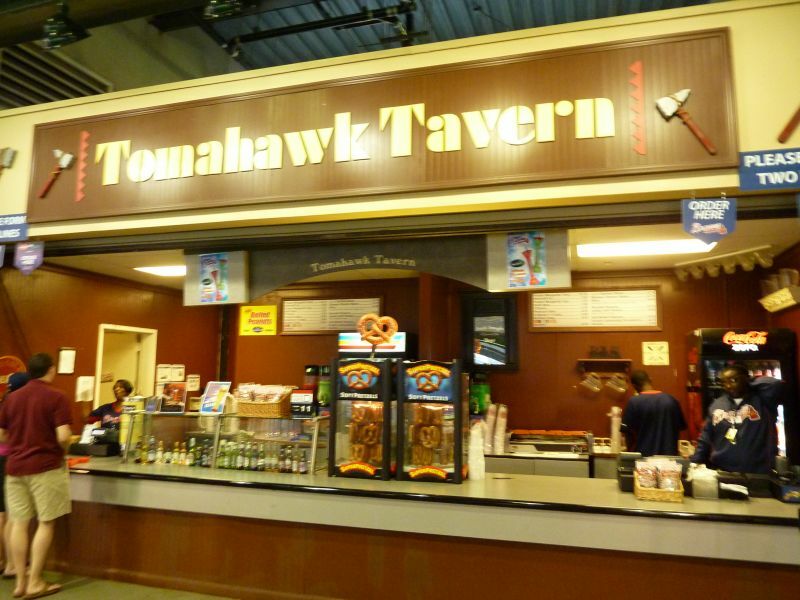 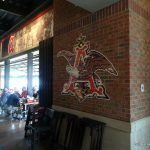 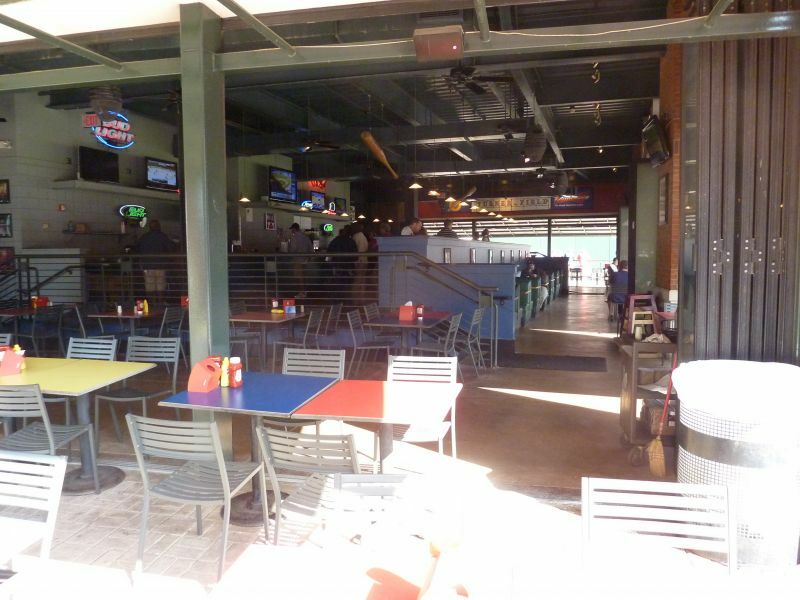 Whether it is through highlighting the surroundings, using contextual building materials, or serving regional food options, pretty much every ballpark gives a somewhat local vibe. 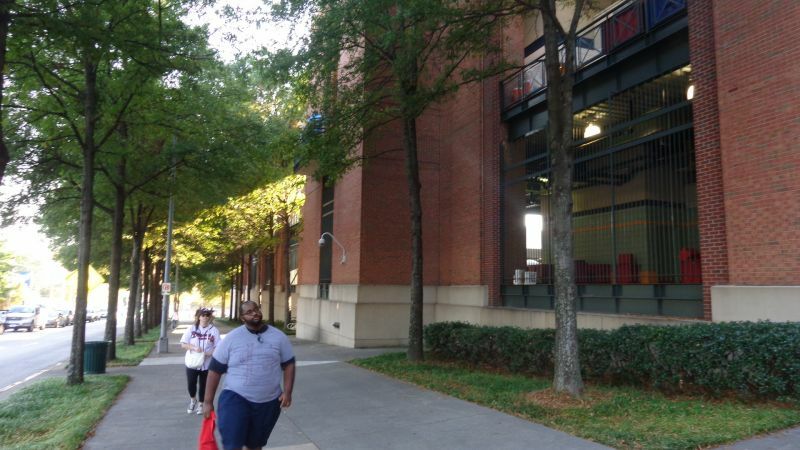 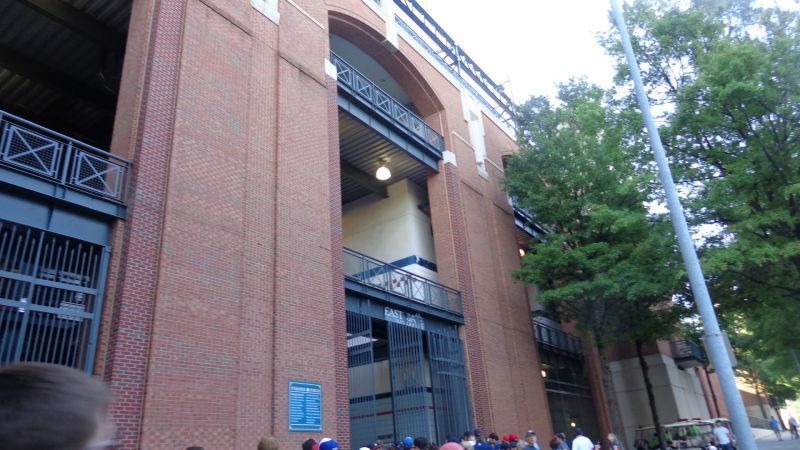 Turner Field’s extraordinarily banal red brick exterior façade has all the qualities of a generic expansion city trying to look retro. 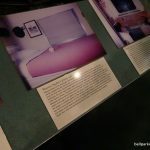 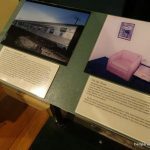 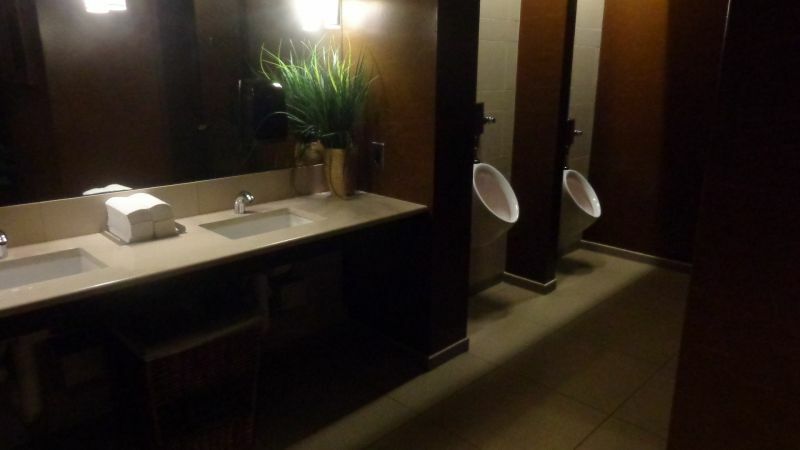 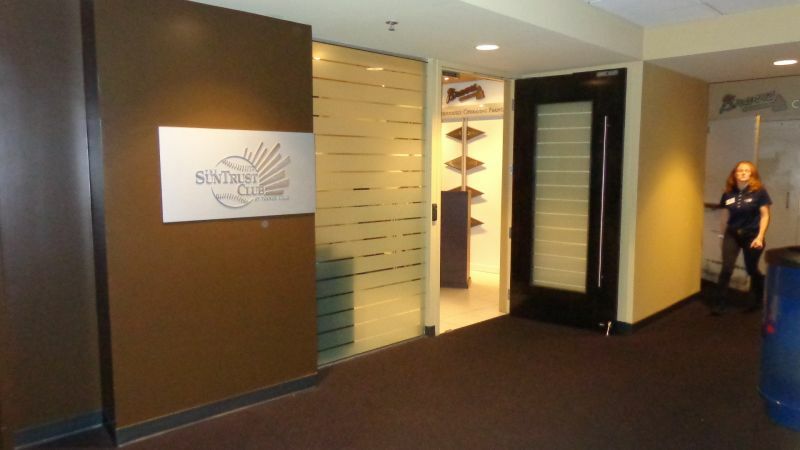 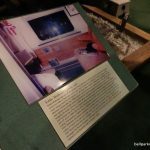 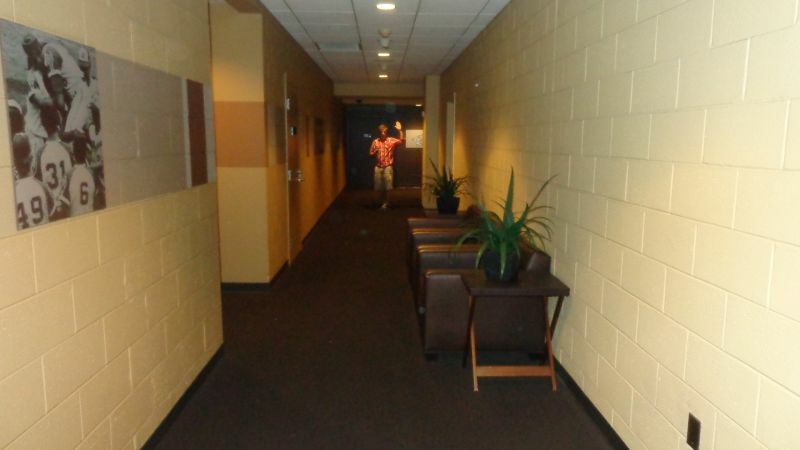 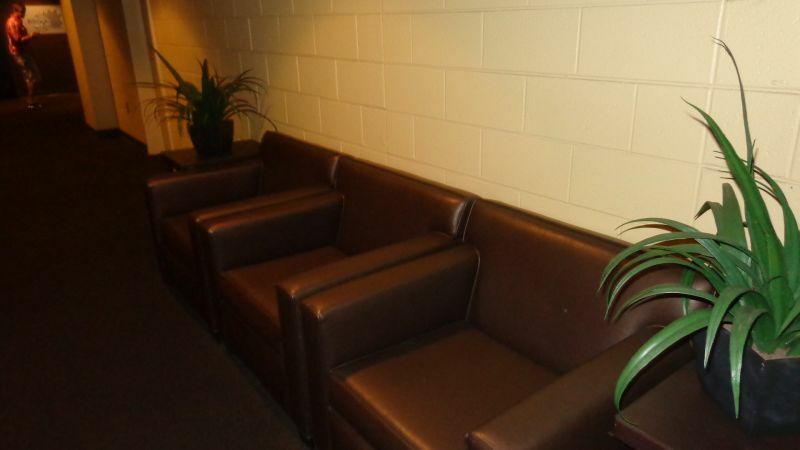 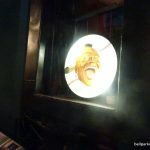 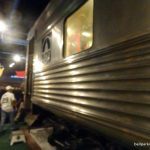 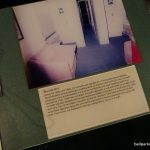 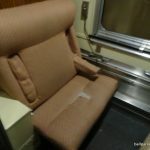 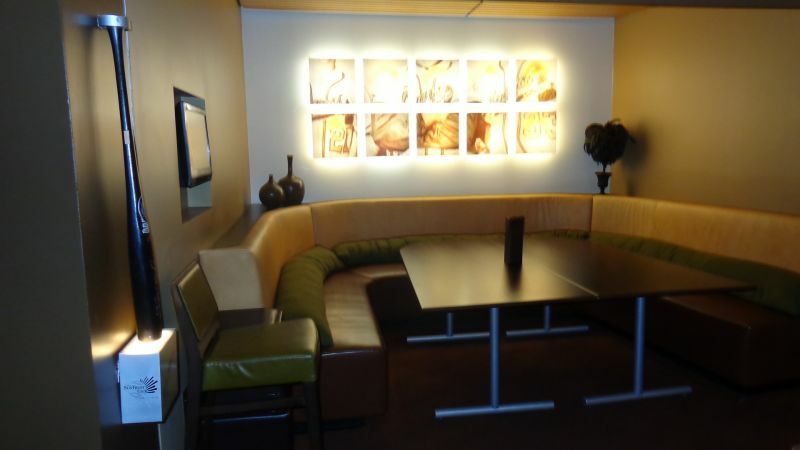 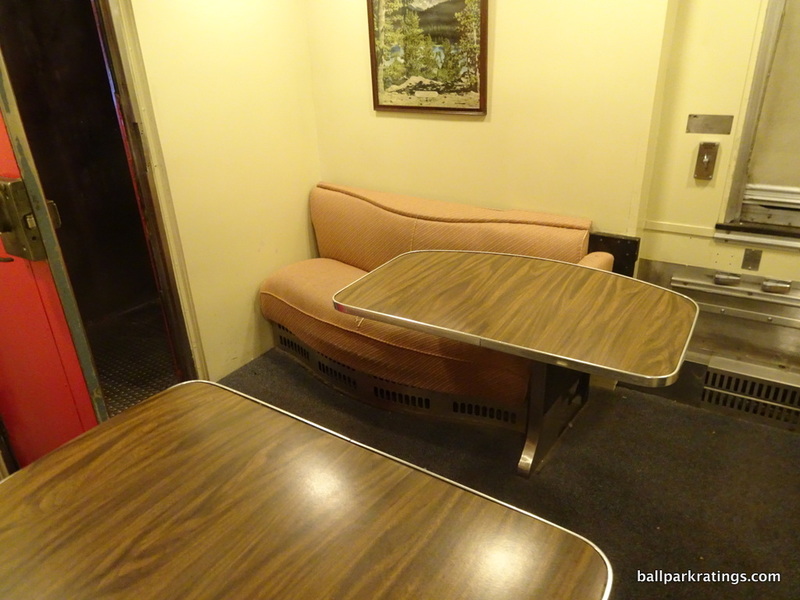 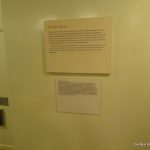 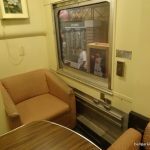 Its interior aesthetics are thoughtless and solely functional, lacking any distinctive design cues or acknowledgements to the environment, yet somehow also superficially muddled with annoying gimmicks. 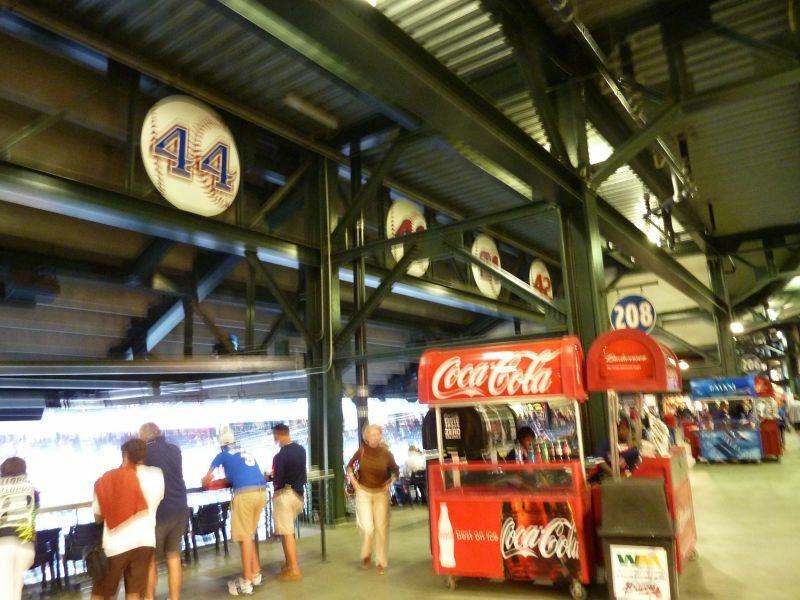 It has a striking lack of regional flare seen in almost all other retro ballparks. 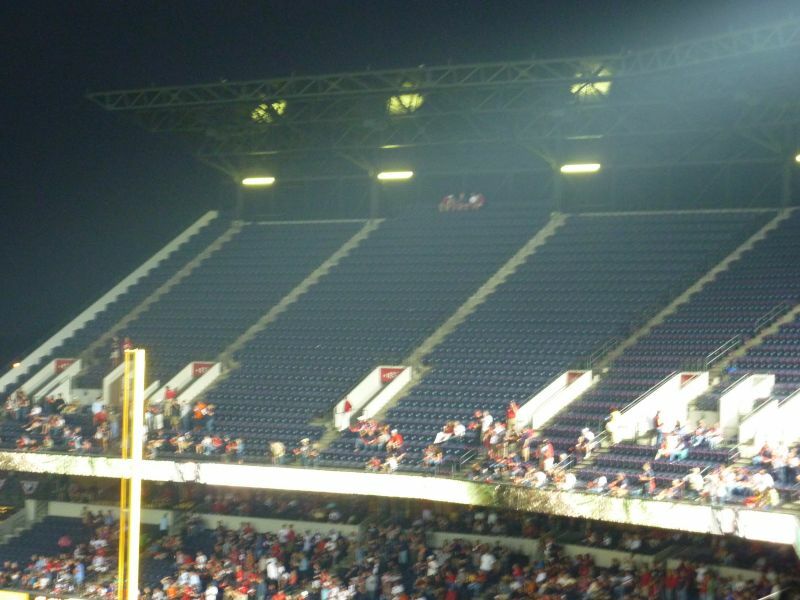 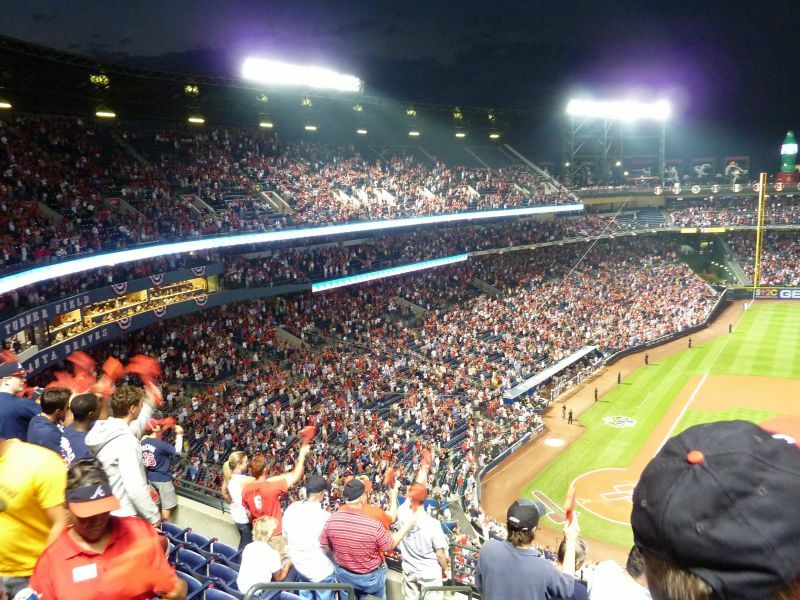 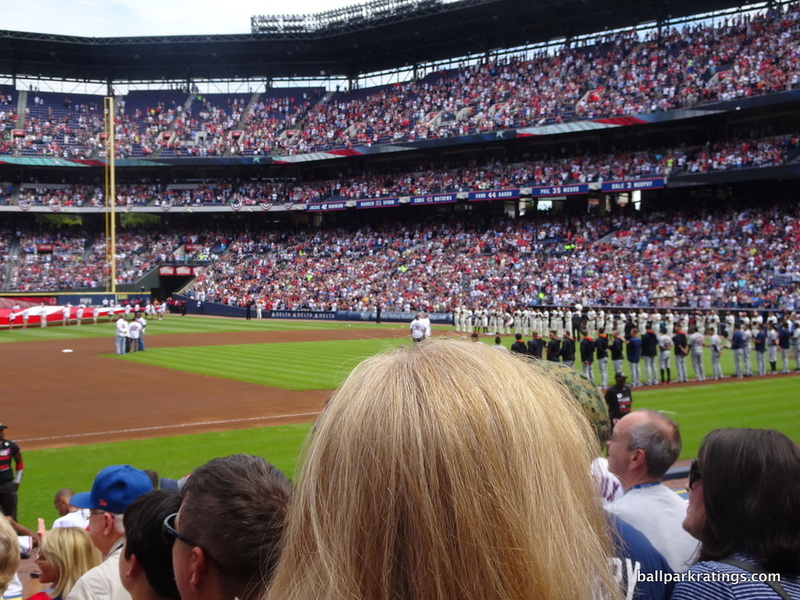 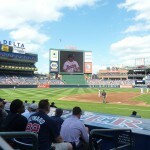 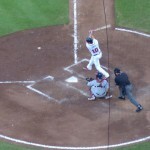 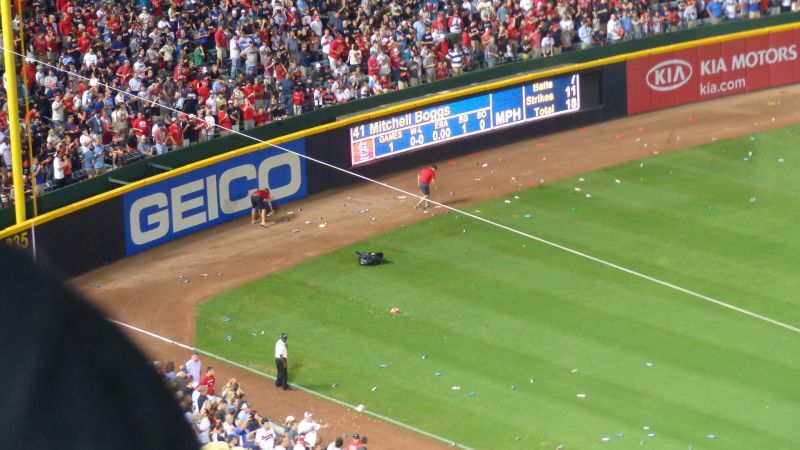 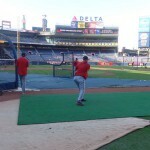 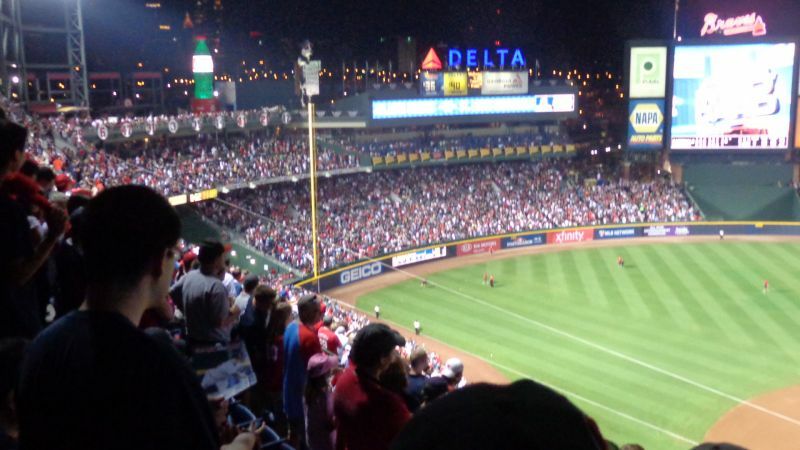 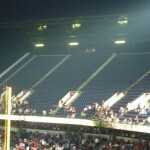 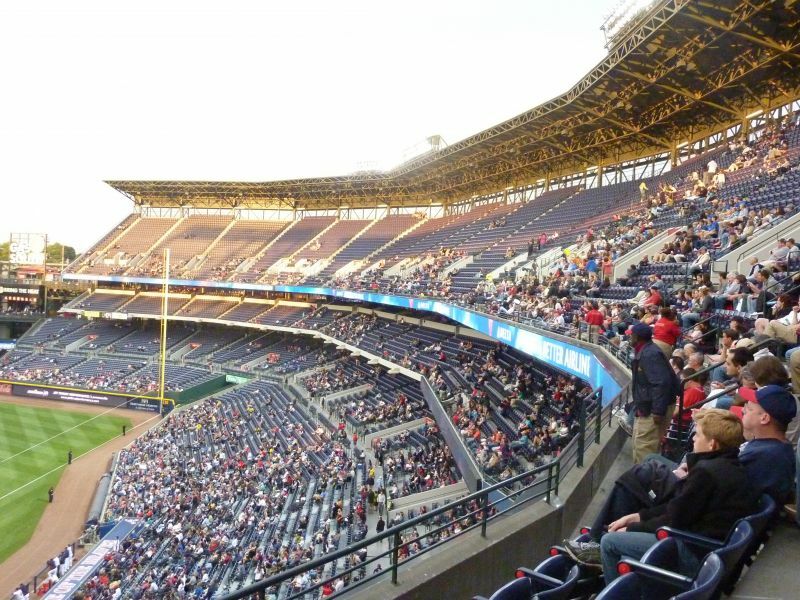 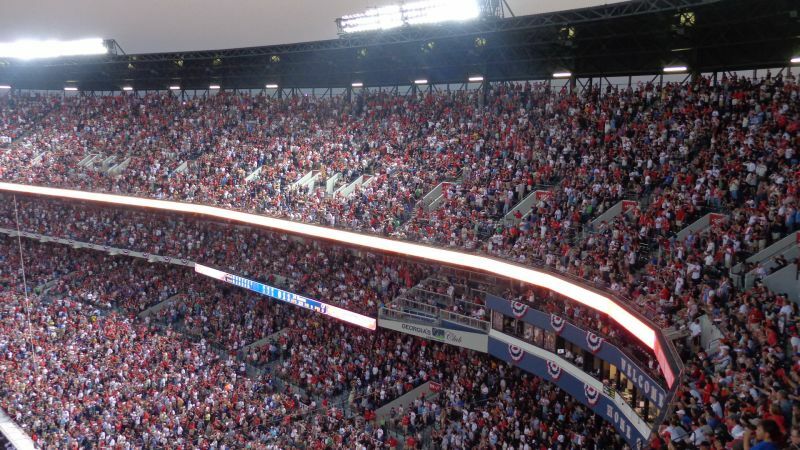 Along with its bland atmosphere and transplanted fan base, Turner Field pretty much represents Atlanta perfectly. 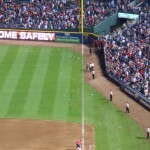 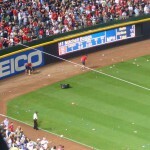 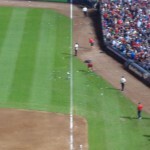 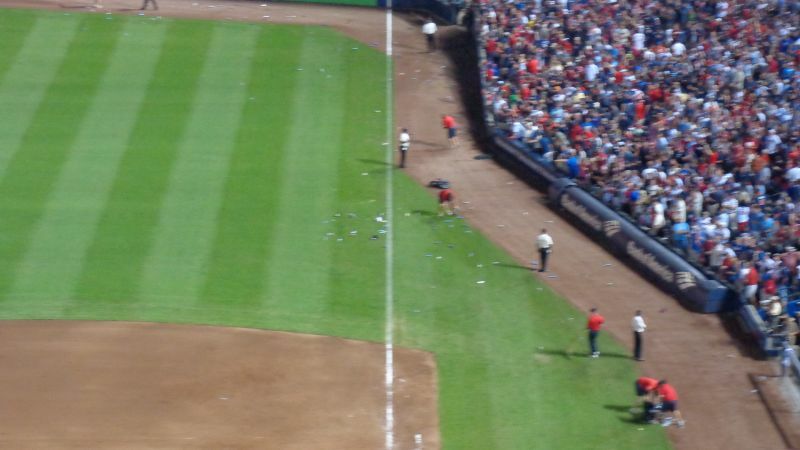 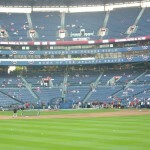 The characterless Turner Field. 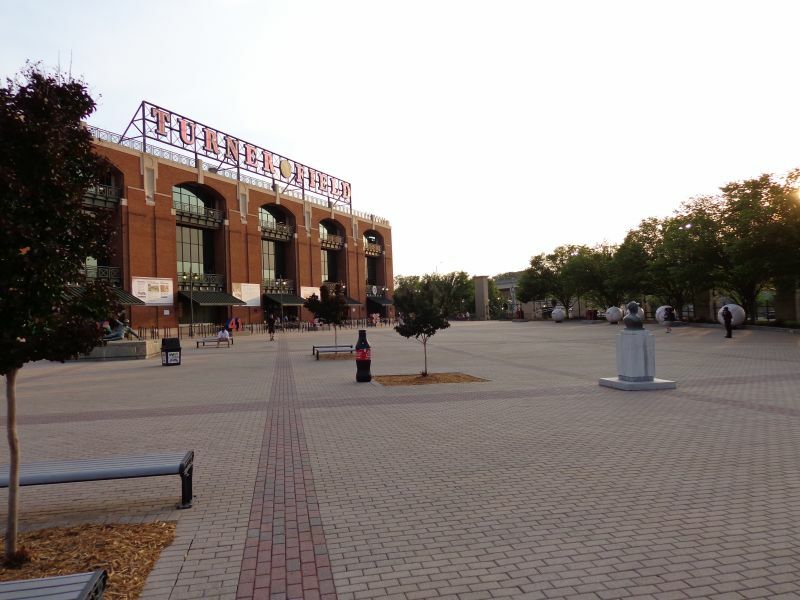 This isn’t to say the ballpark doesn’t have some nice features, but all post-1991 ballparks are good ballparks, and I think it’s clear Turner offers the least to a now crowded ballpark landscape. 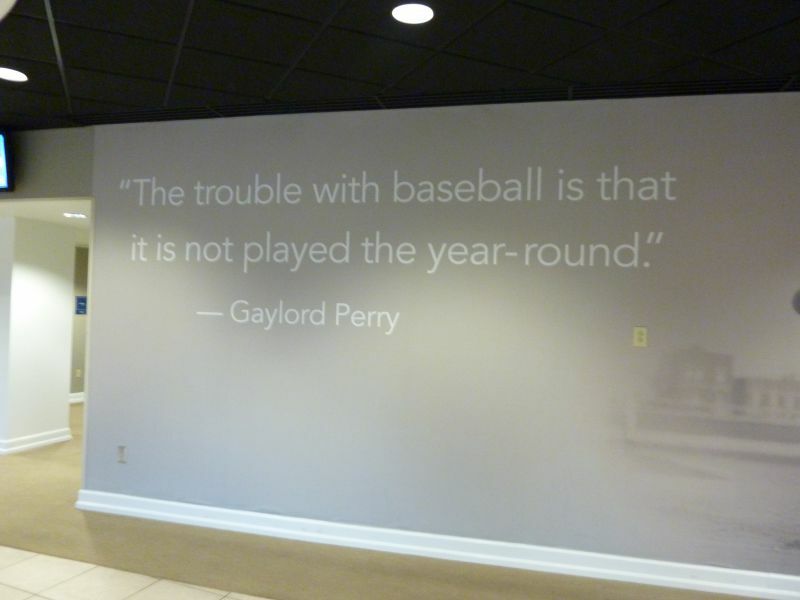 And I’m really sorry, but I mean that in the worst possible way. 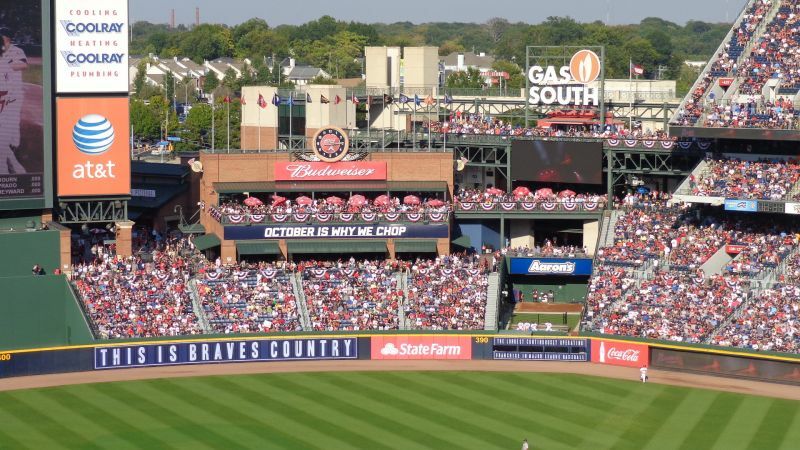 You’ll never see me bash a particular city on this website, but perhaps I feel immune because I actually live in Atlanta. 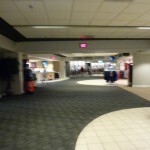 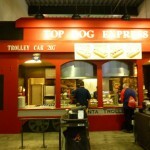 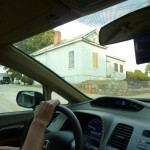 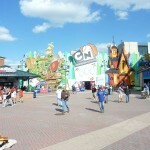 I can attest that it’s the ultimate copycat city, offering very little in terms of originality, other than consumerism. 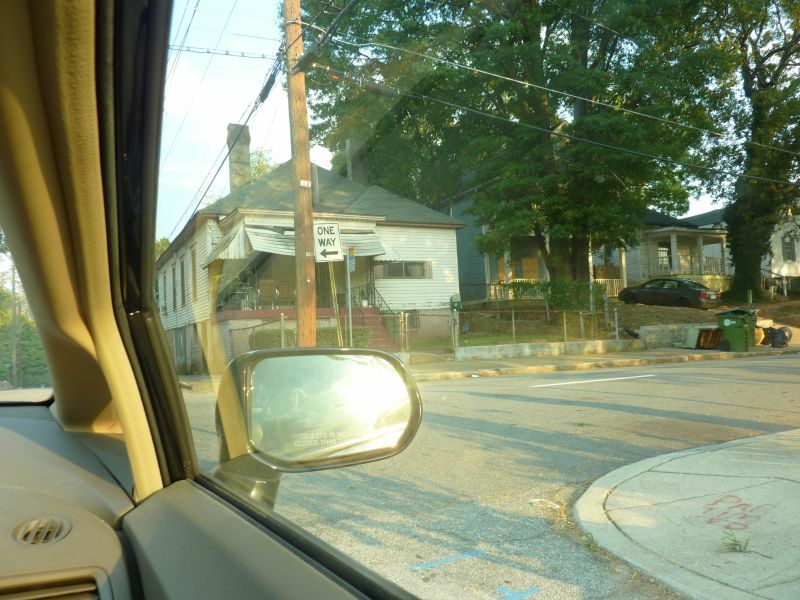 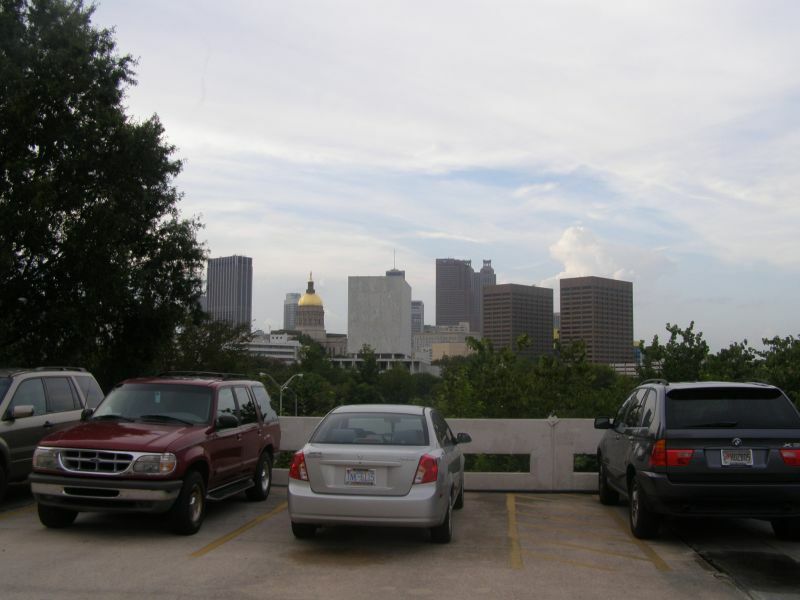 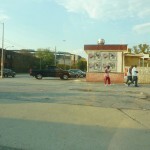 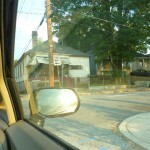 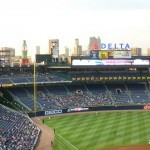 It’s hard to find a metropolis more characterless and derivative than Atlanta. 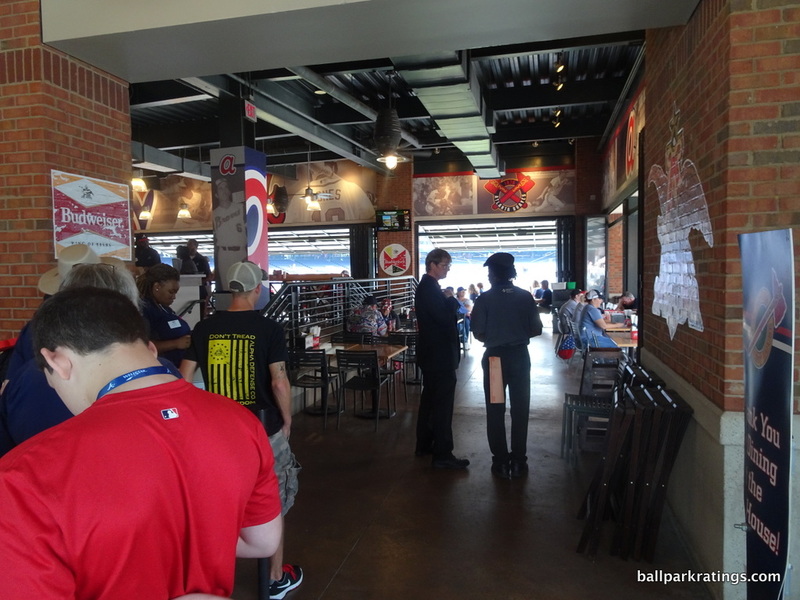 Like I always say, whether you’re a baseball fan or not, the American ballpark merits study because it often seems to represent its city better than anything else. 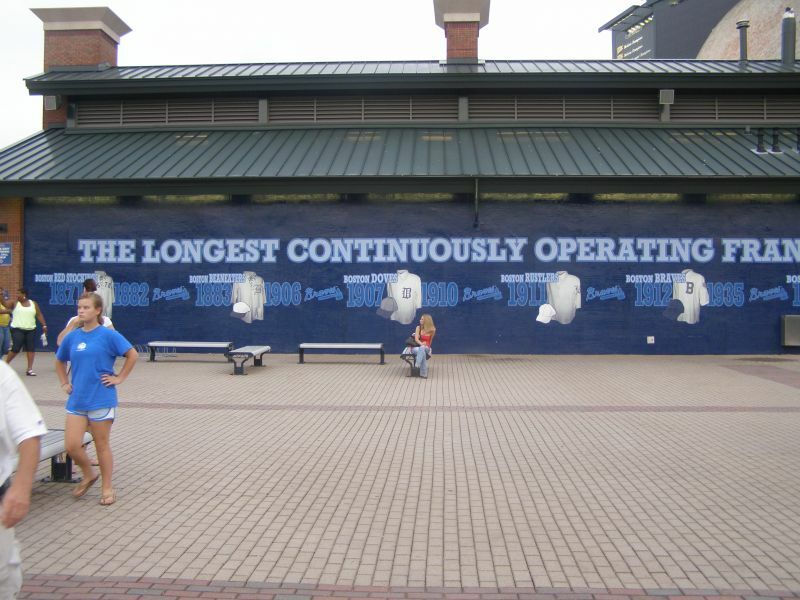 It’s relatively more immune to the recent “stripmallization” of America. 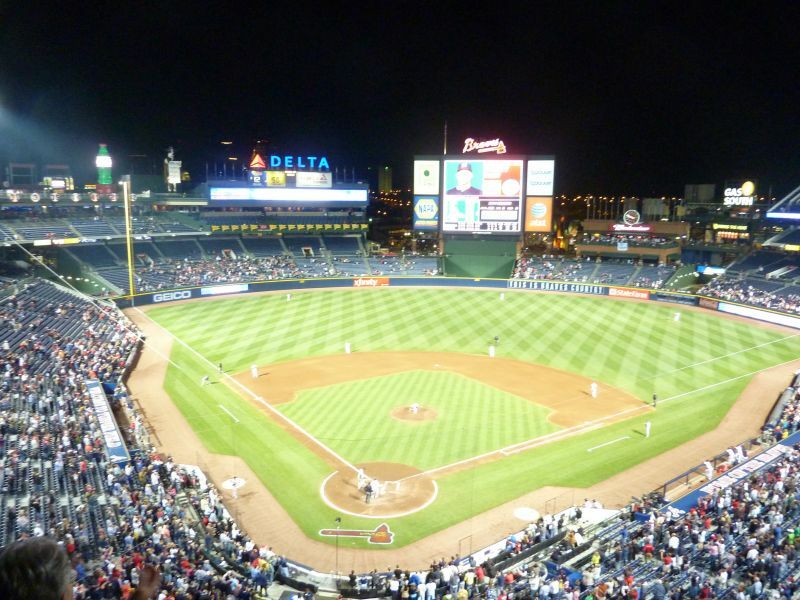 But Turner Field is the exception. 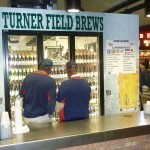 As bland as Atlanta may be, Turner Field is the party I’m trying to blame here, just to be clear. 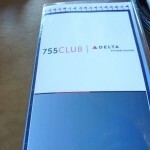 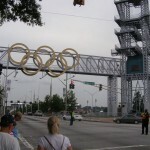 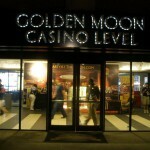 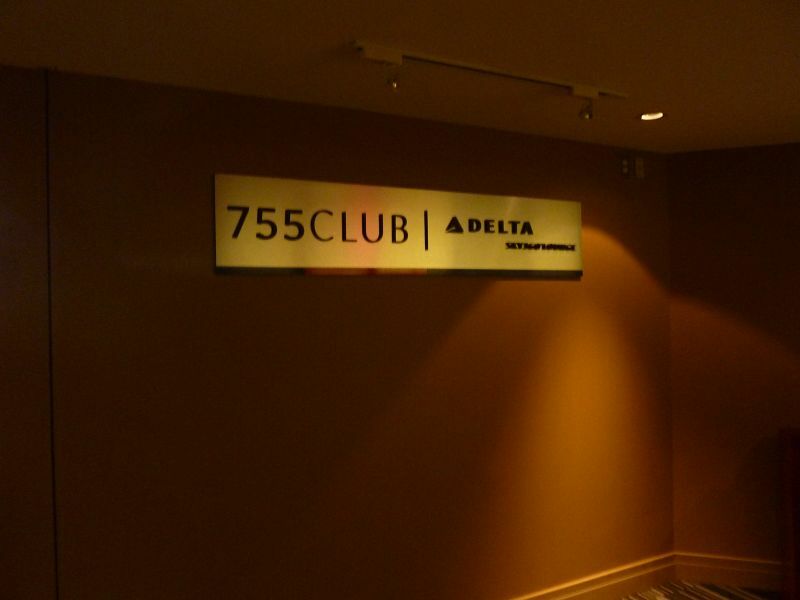 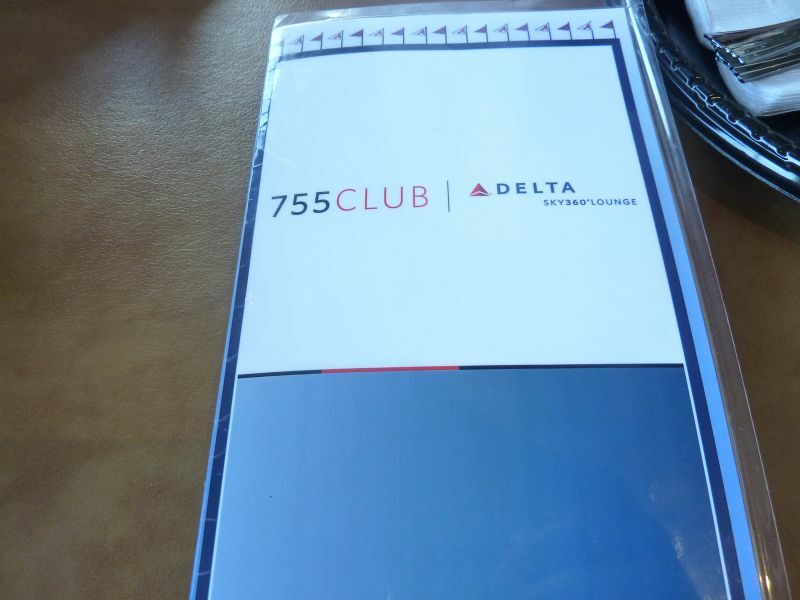 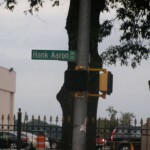 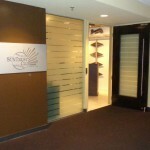 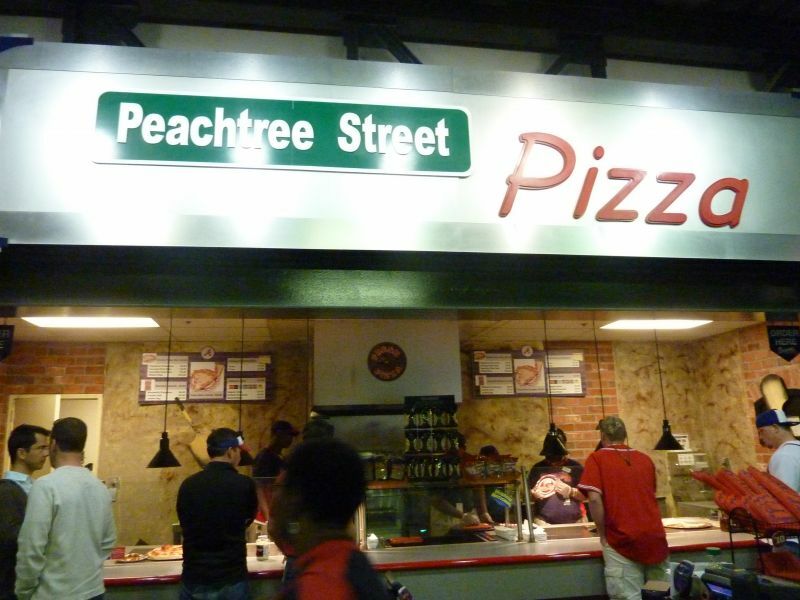 It doesn’t even try, even if you grant its qualities are derived from the fact that it’s in Atlanta. 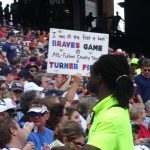 Go to every other ballpark and compare the unique cultural vibe to that of Turner’s generic feel and you’ll see what I mean. 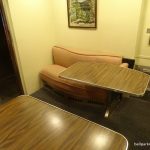 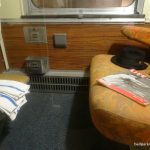 Despite having absolutely nothing distinguishing or contextual, its interior lines are clean and simple, free from contrivances. 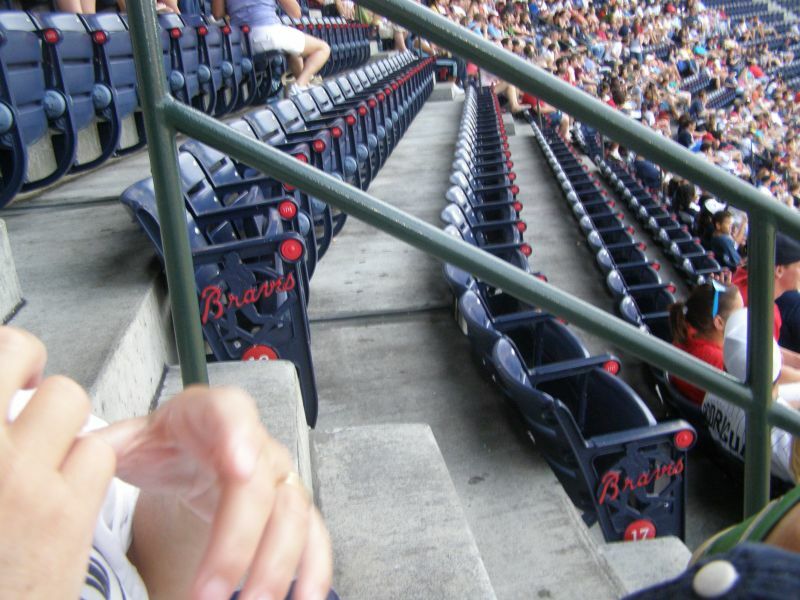 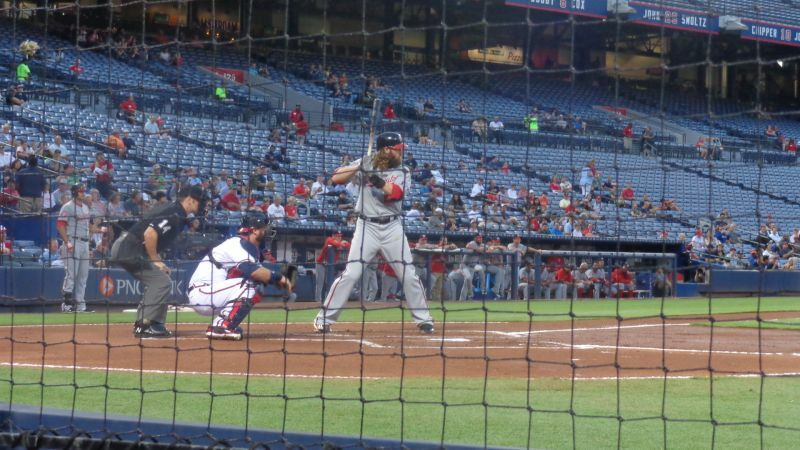 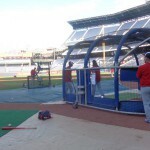 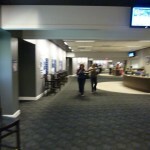 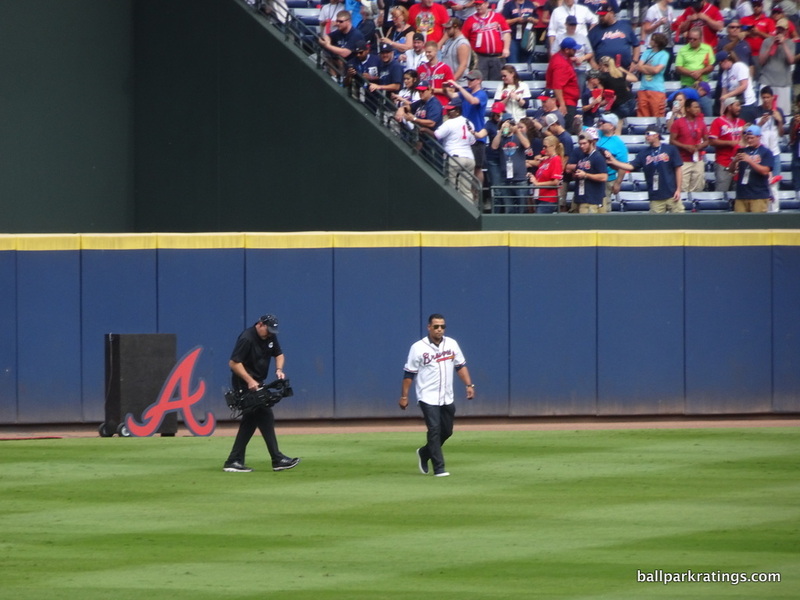 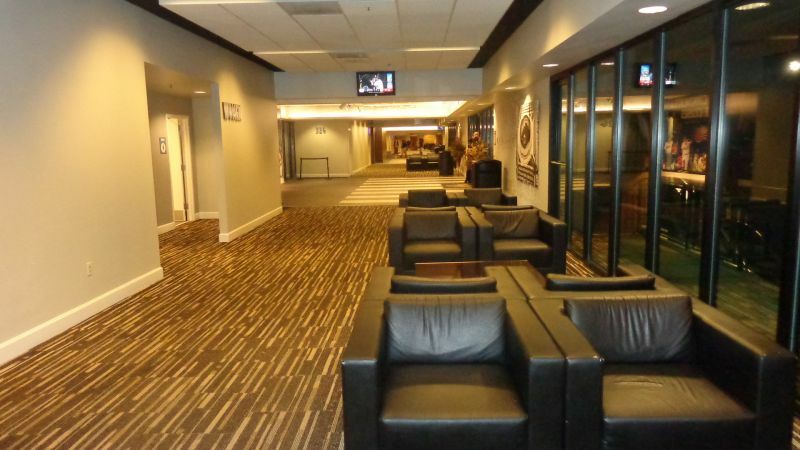 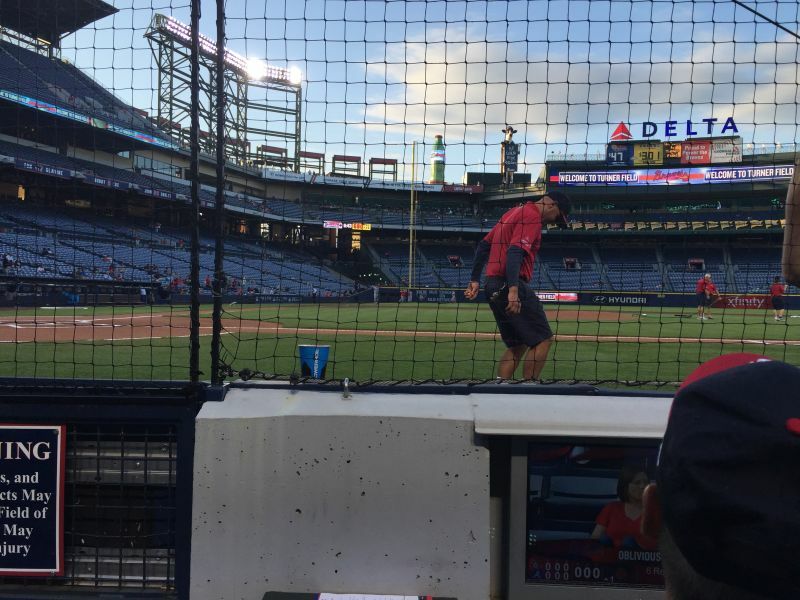 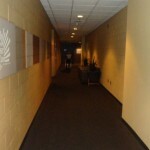 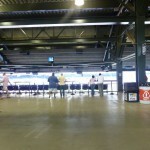 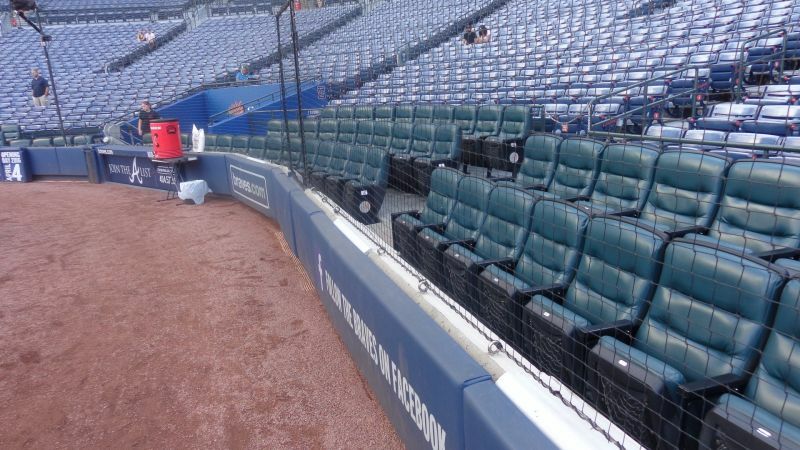 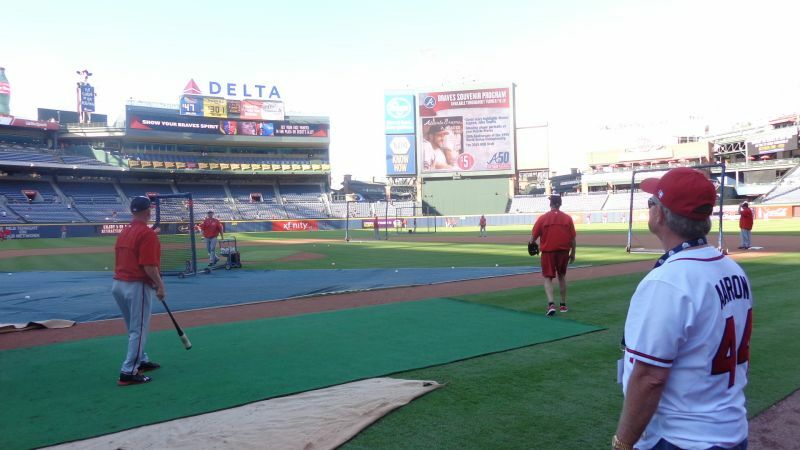 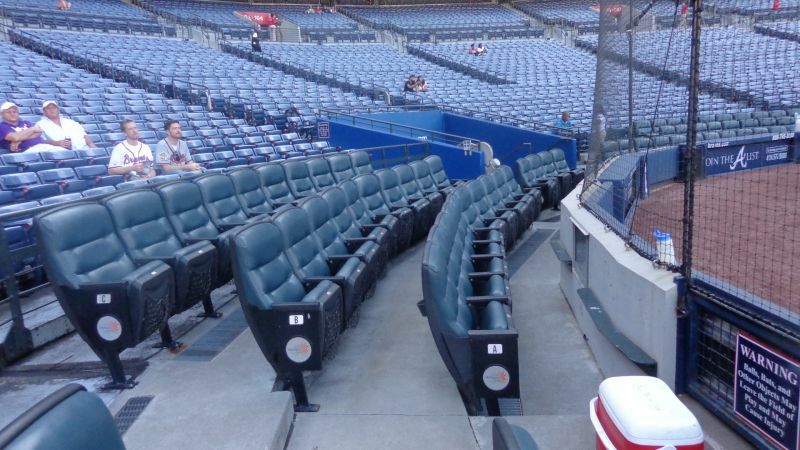 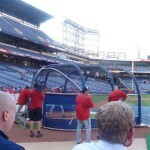 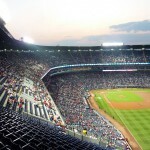 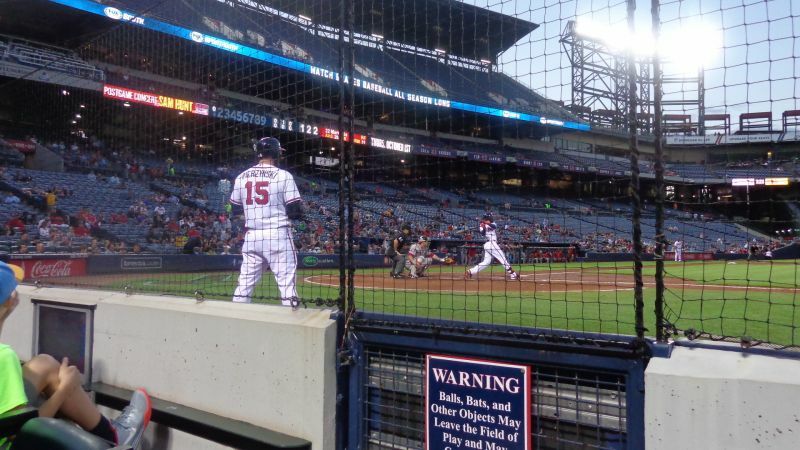 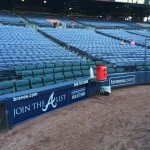 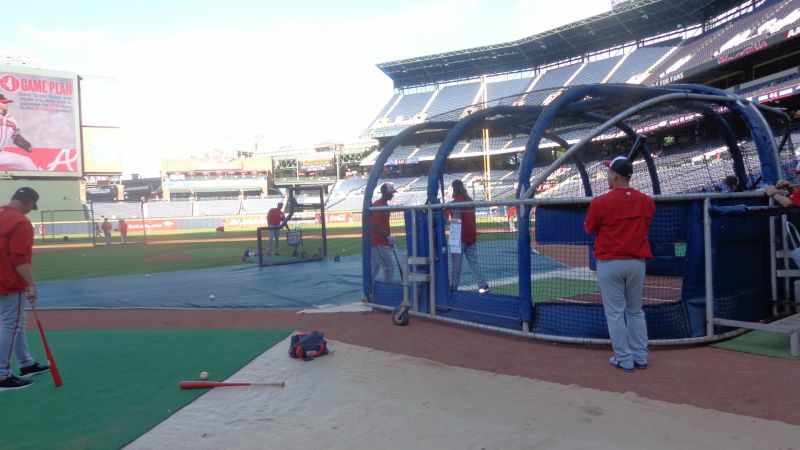 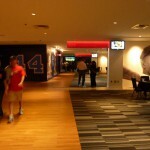 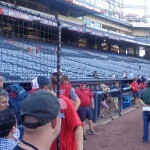 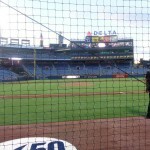 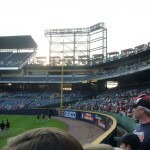 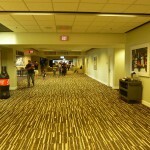 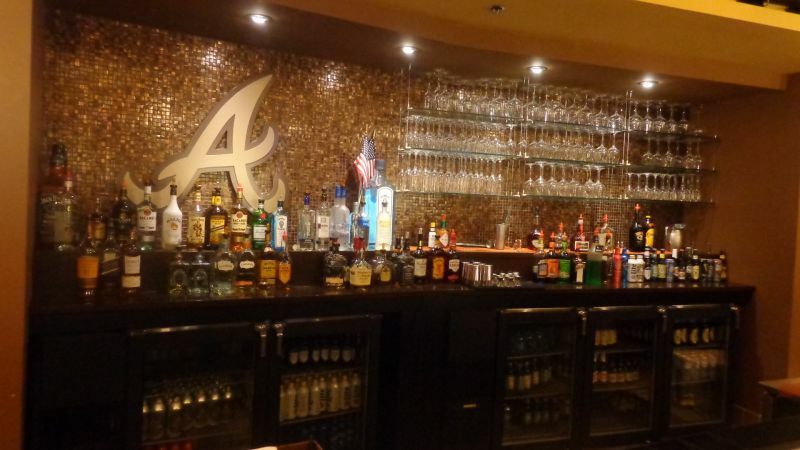 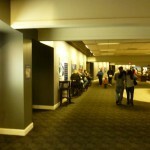 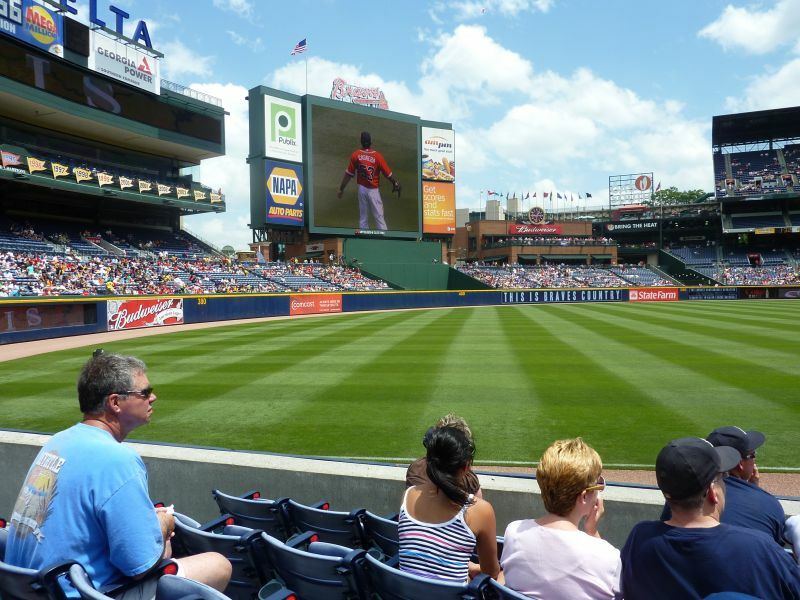 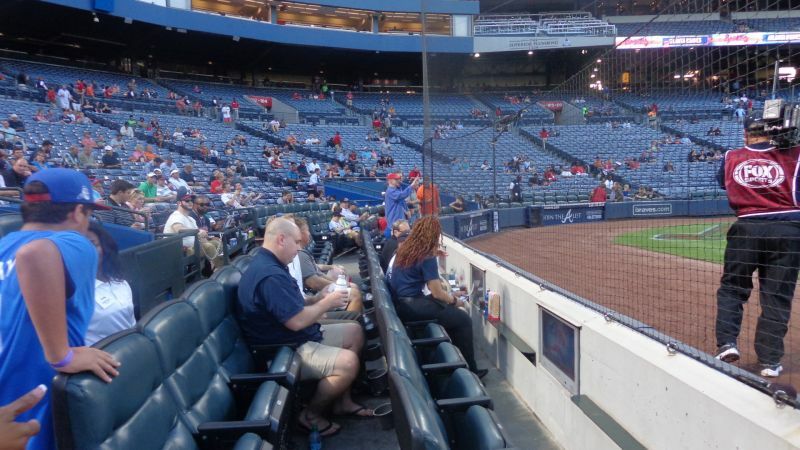 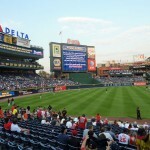 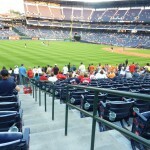 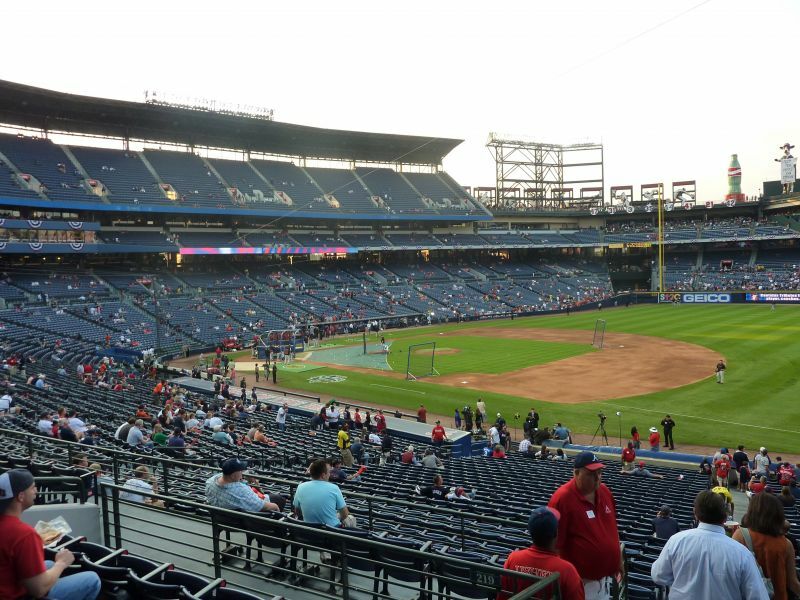 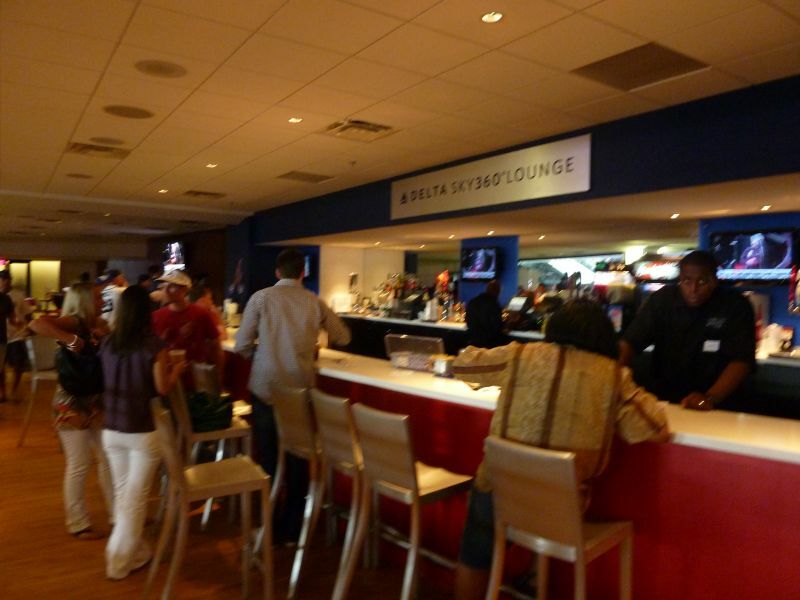 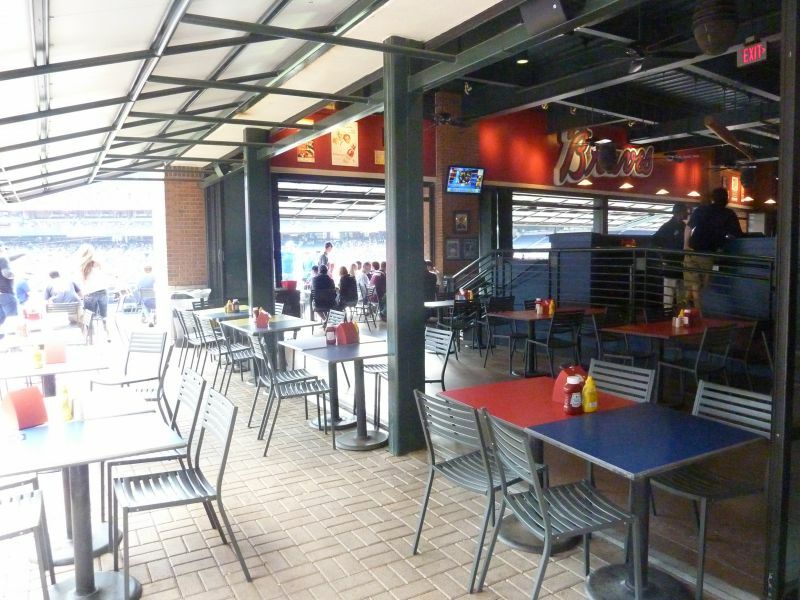 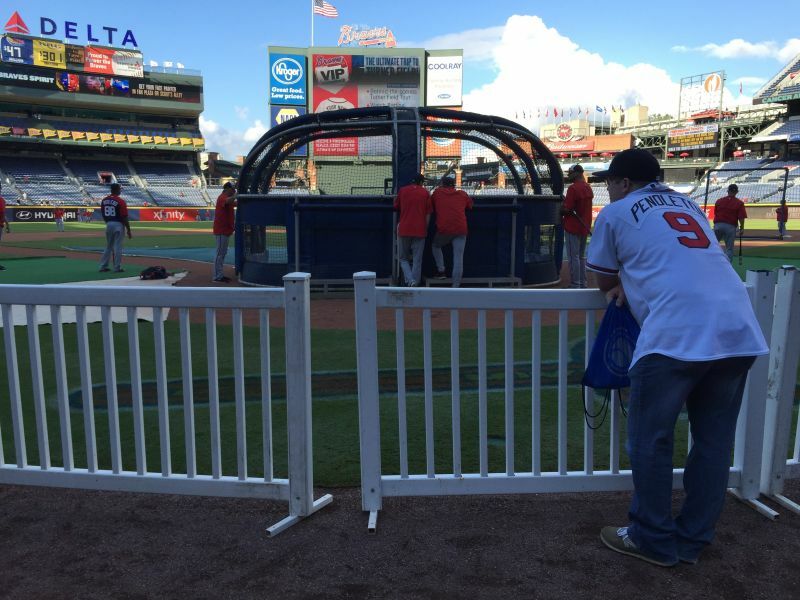 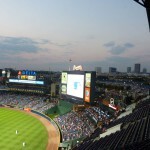 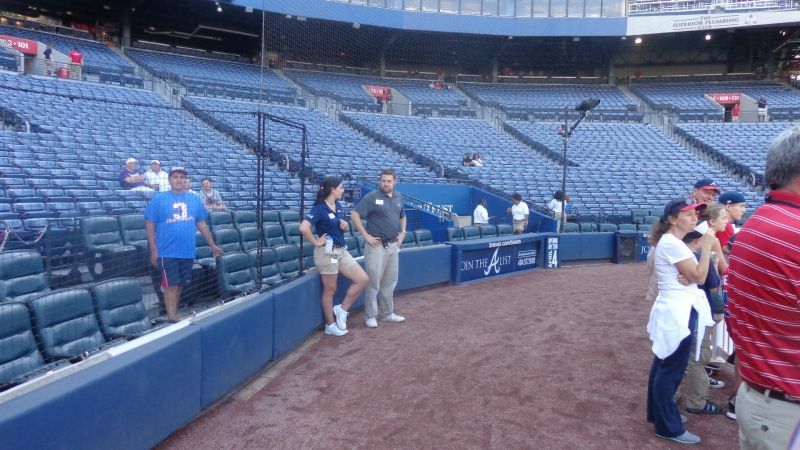 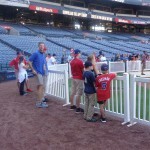 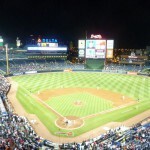 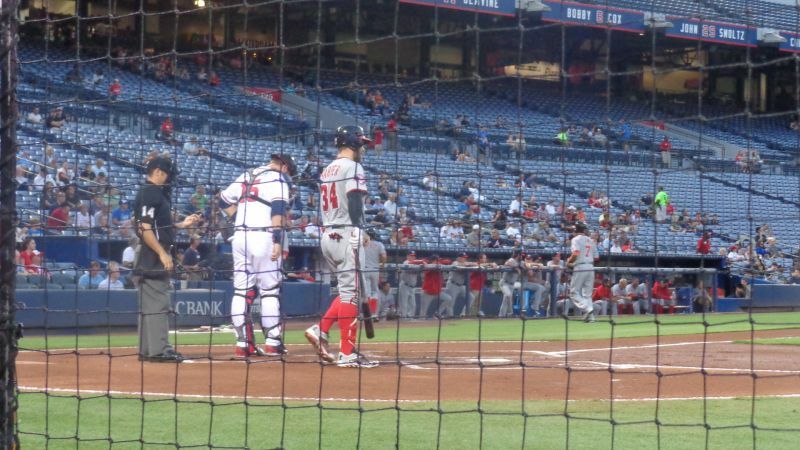 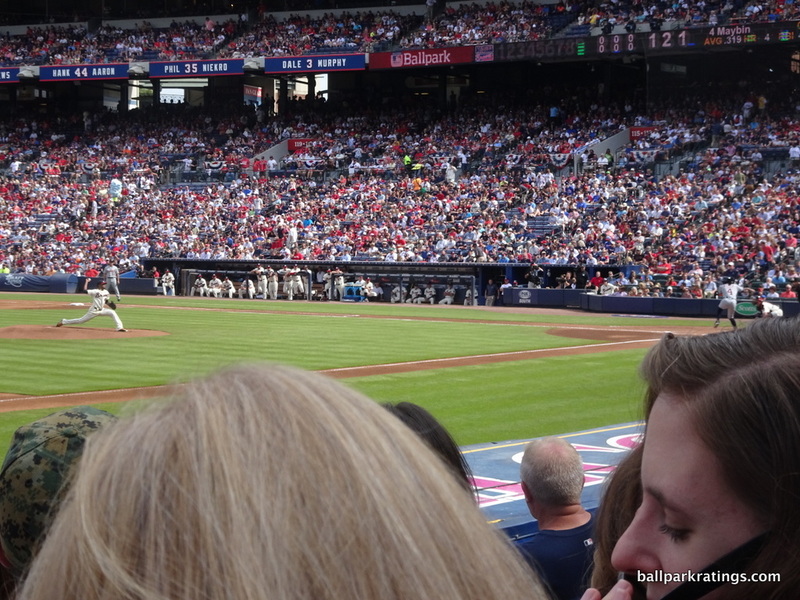 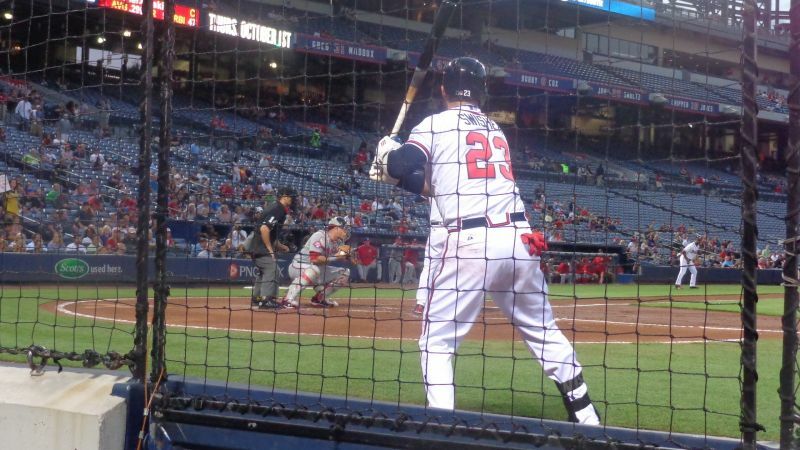 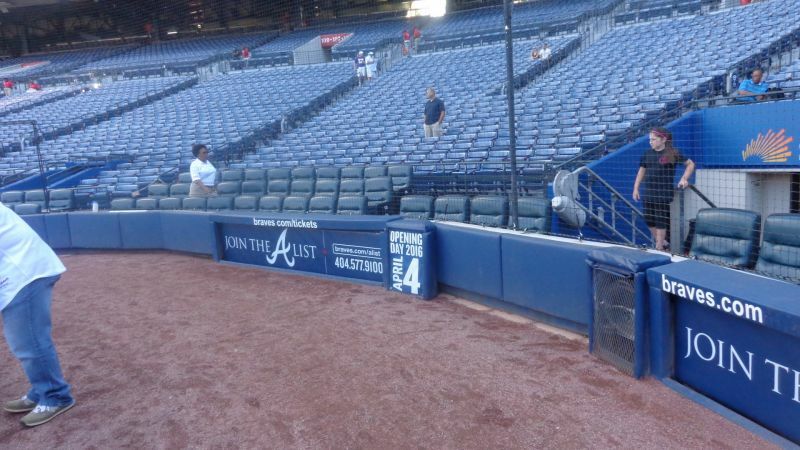 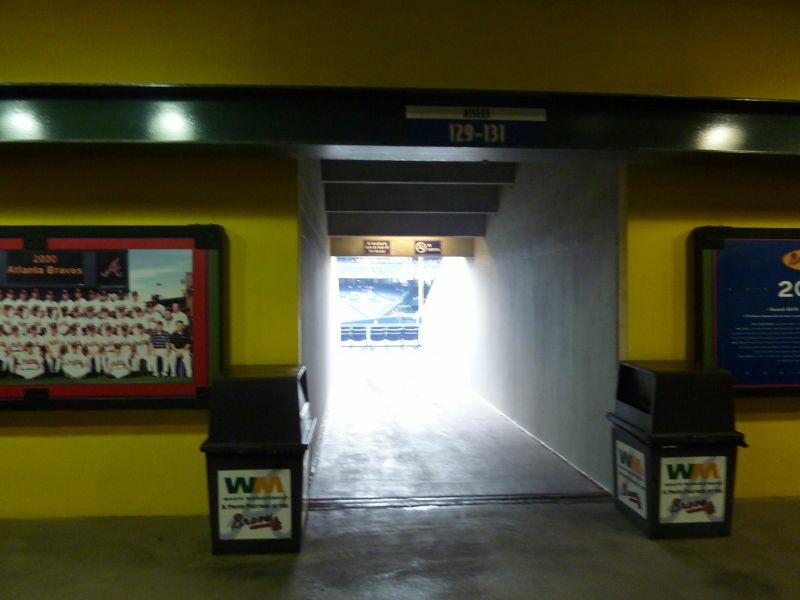 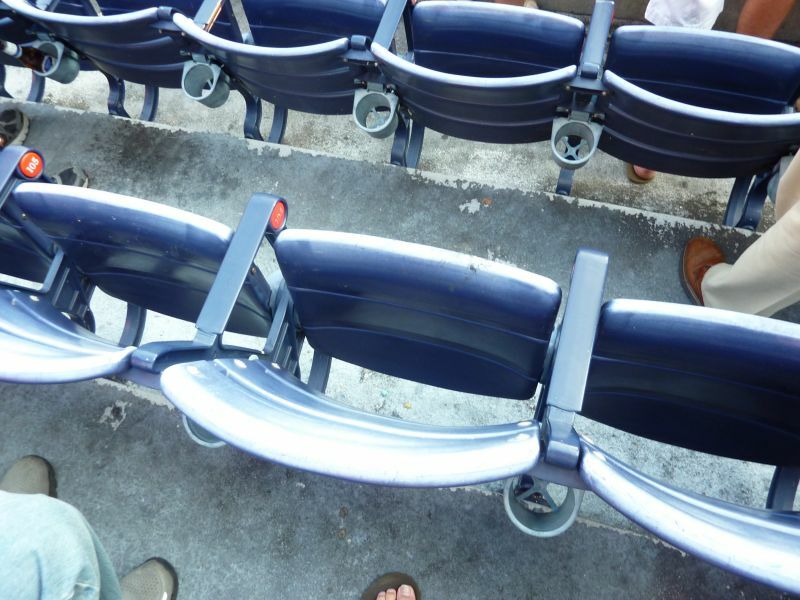 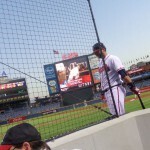 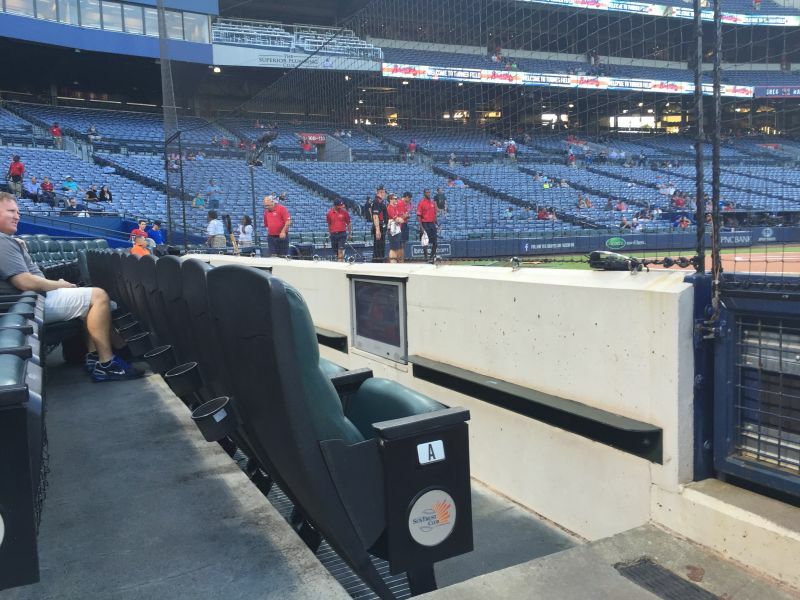 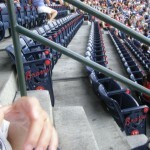 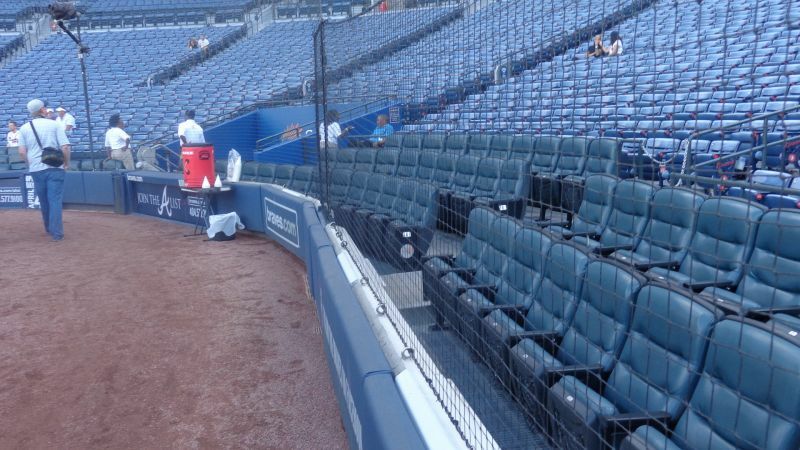 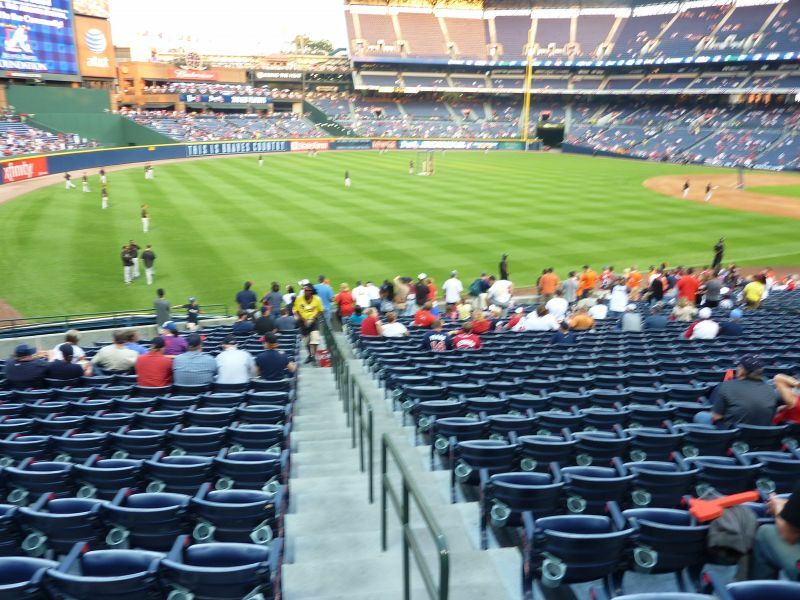 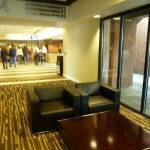 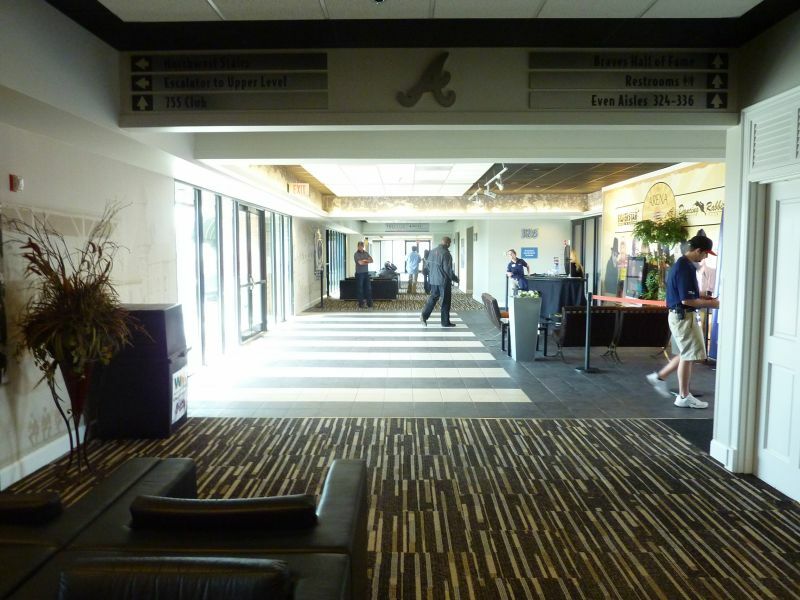 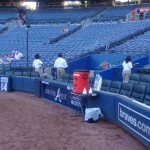 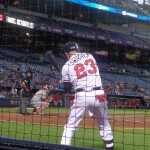 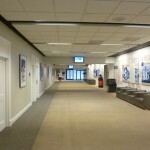 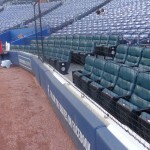 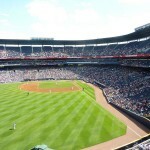 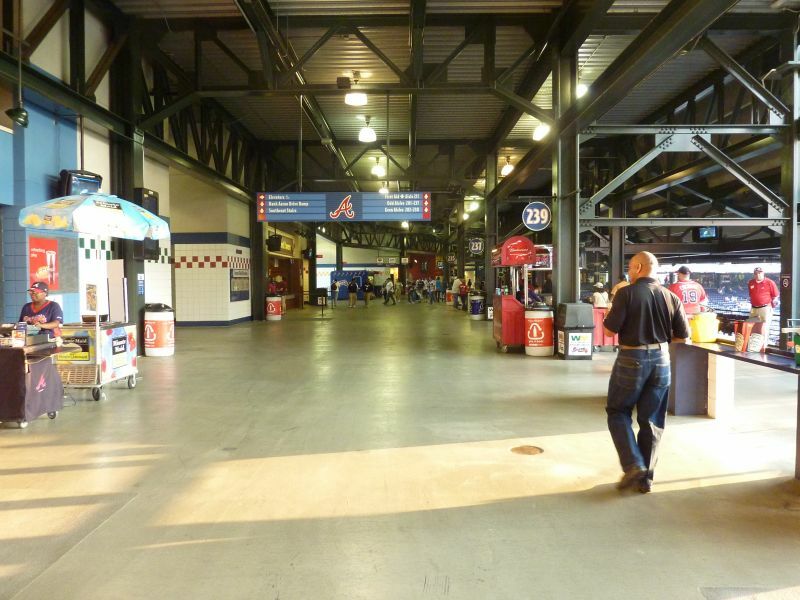 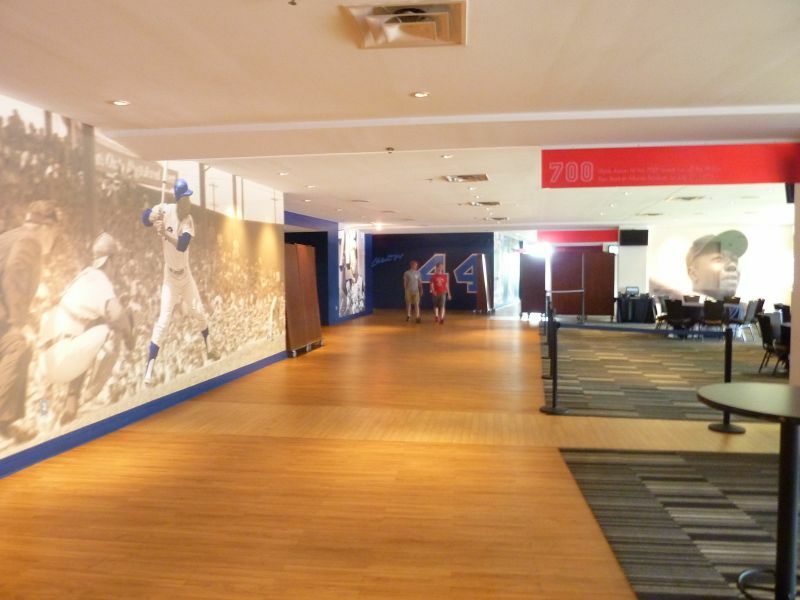 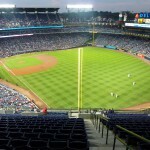 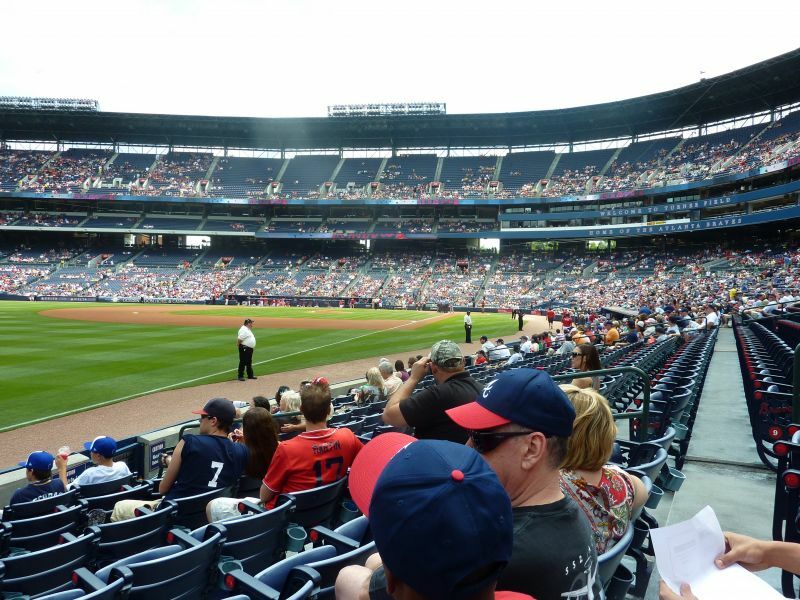 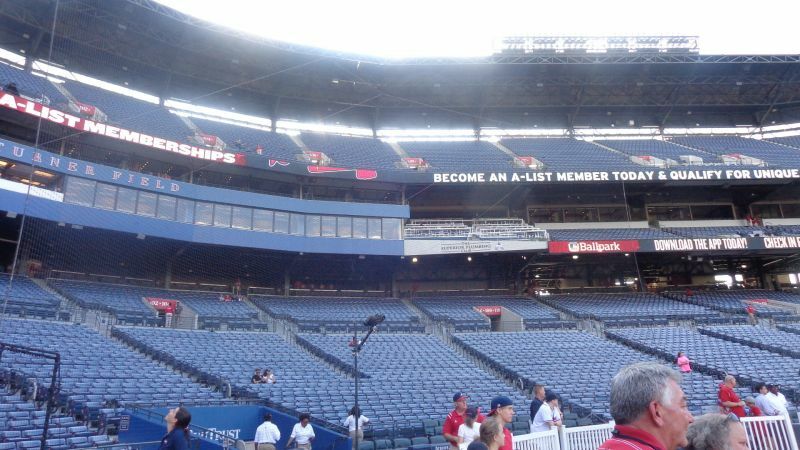 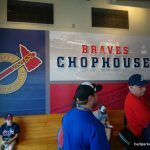 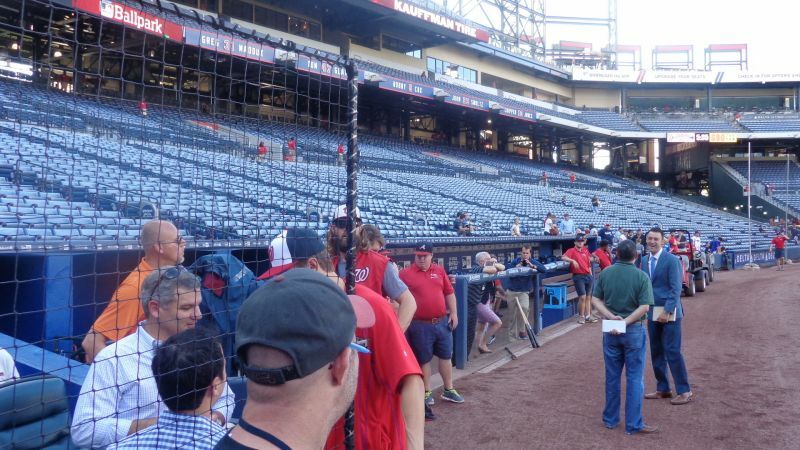 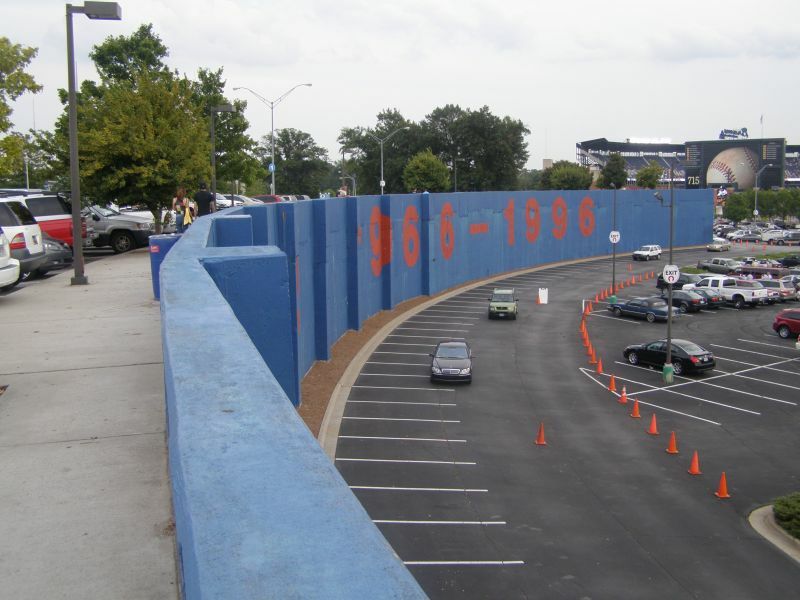 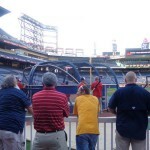 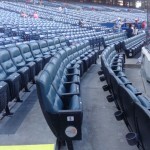 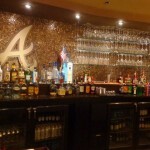 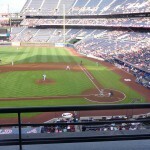 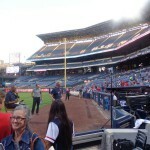 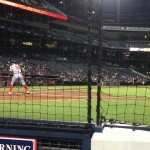 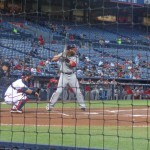 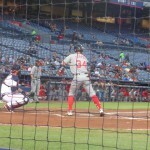 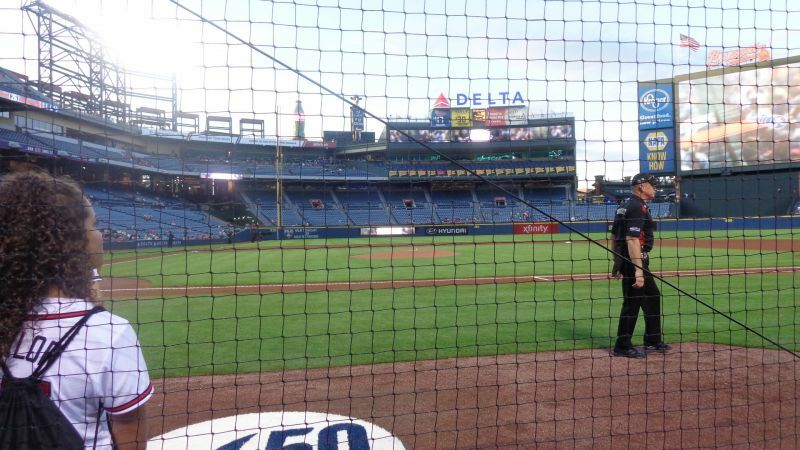 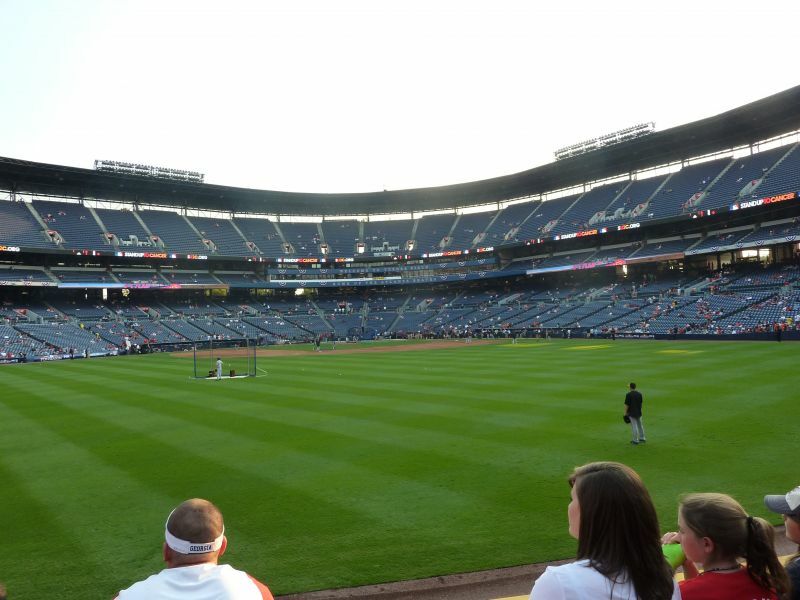 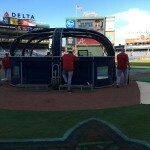 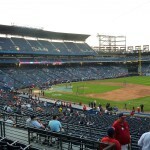 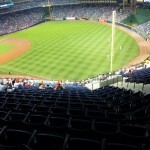 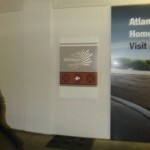 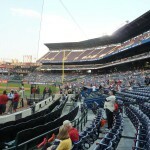 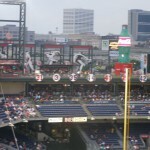 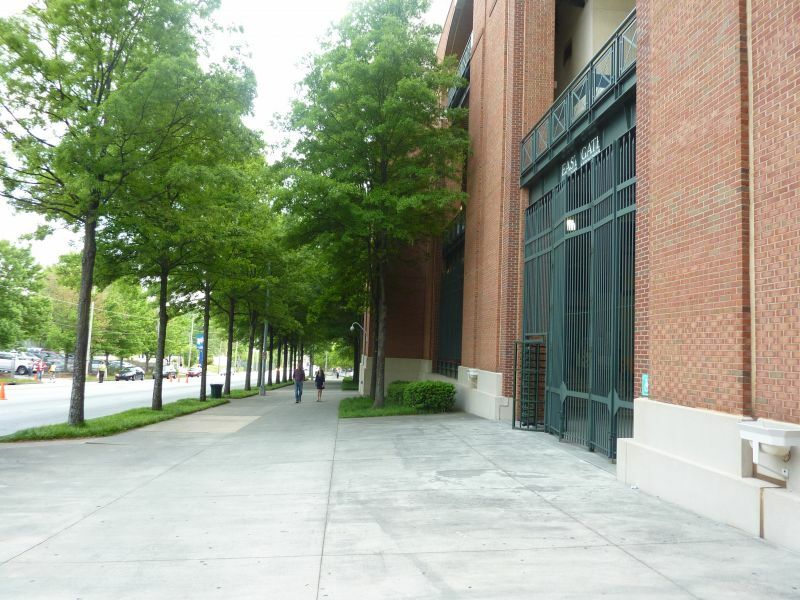 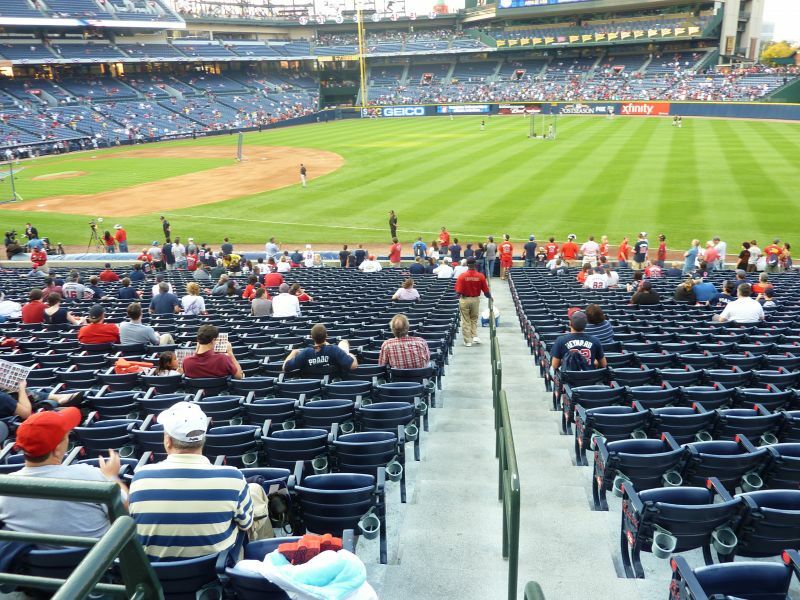 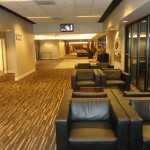 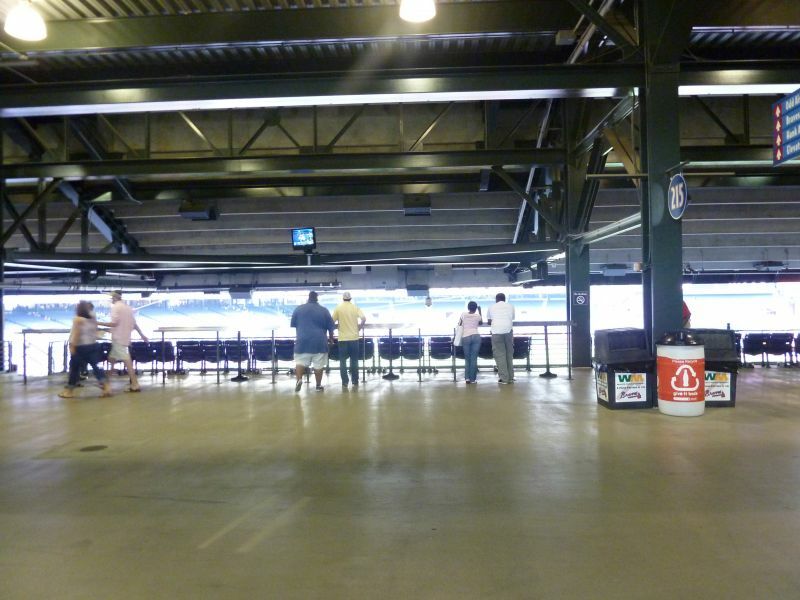 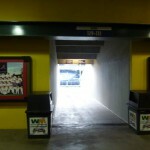 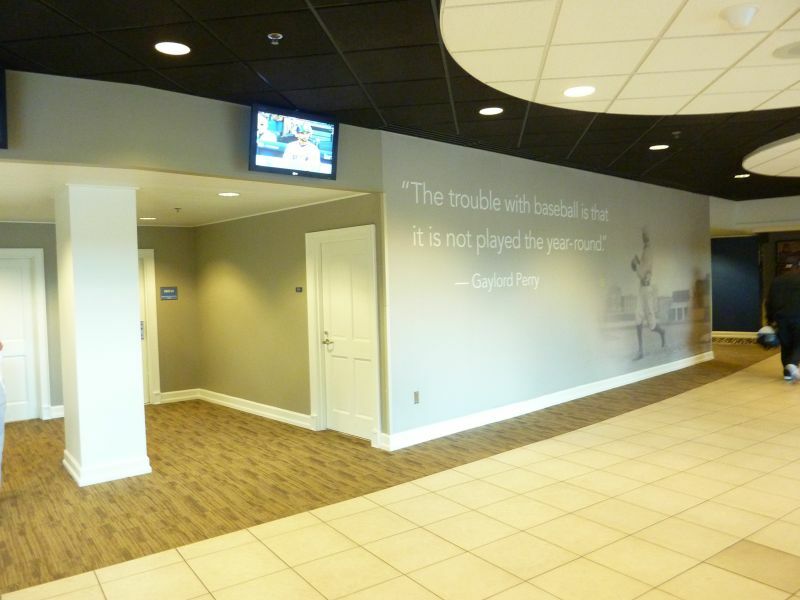 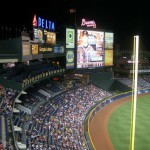 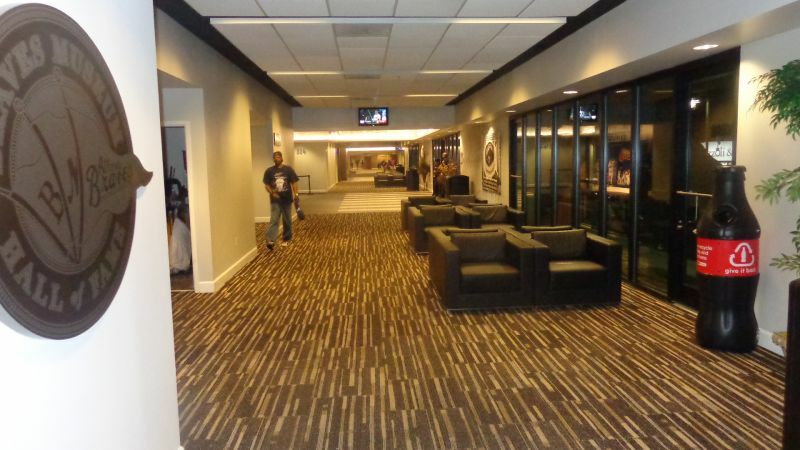 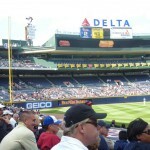 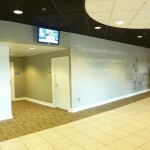 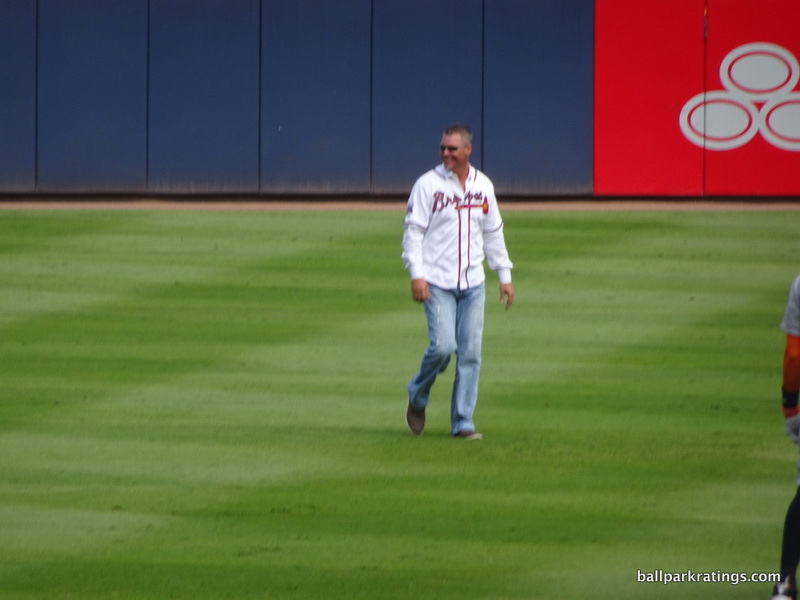 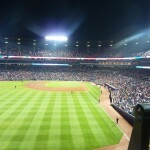 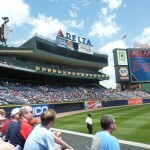 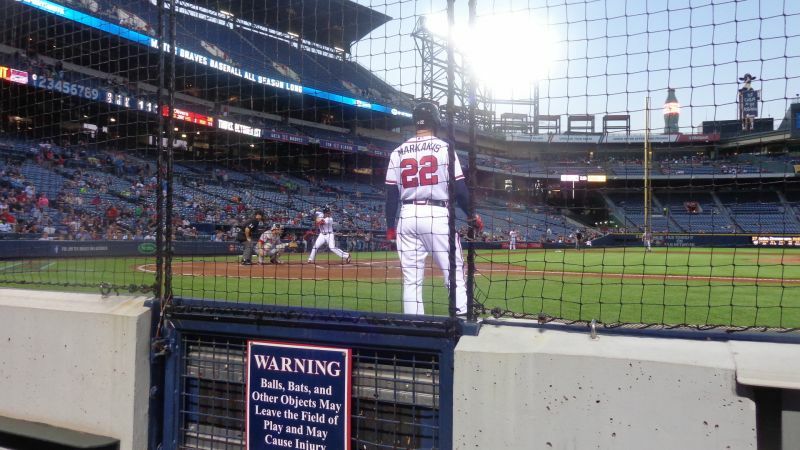 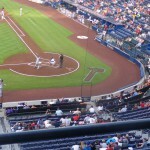 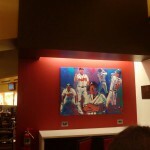 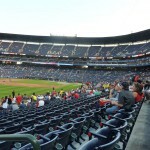 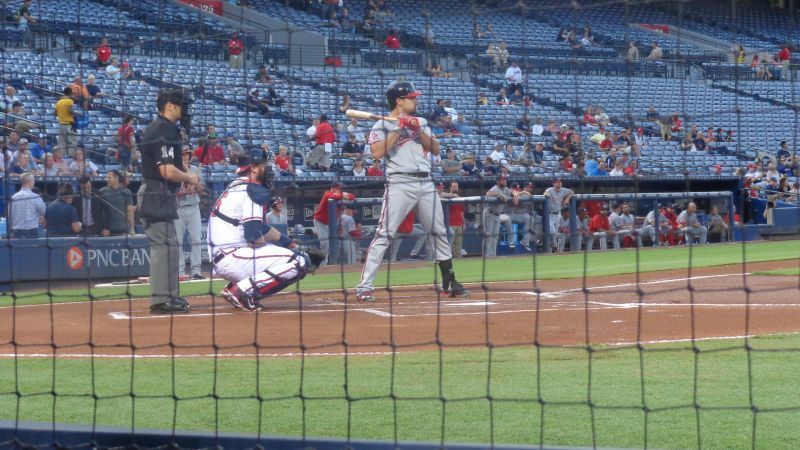 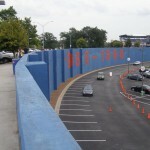 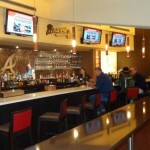 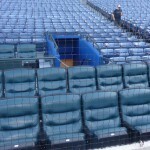 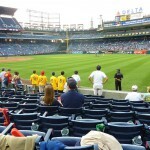 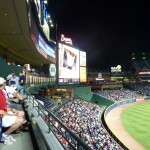 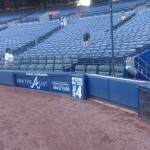 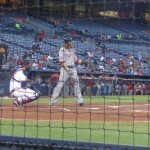 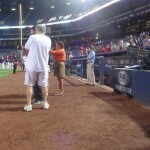 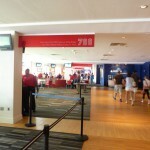 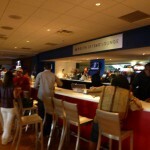 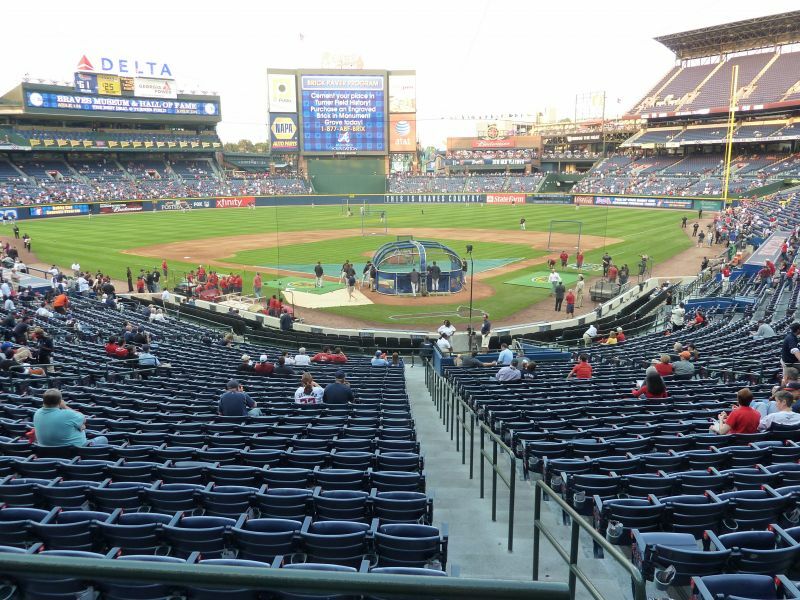 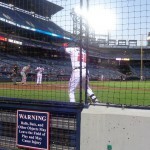 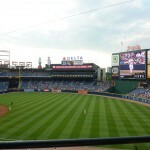 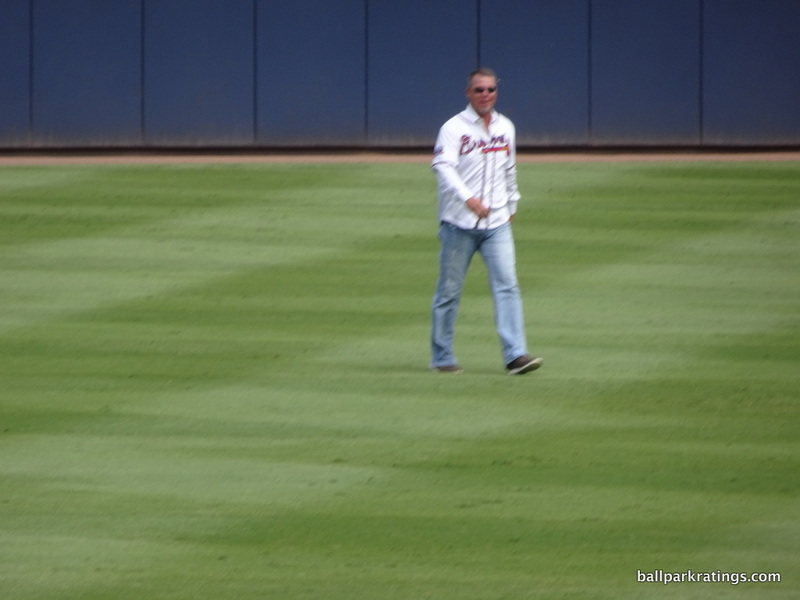 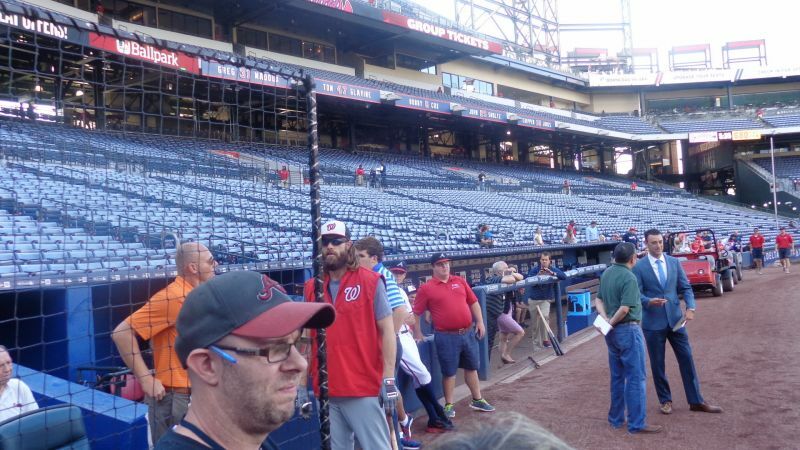 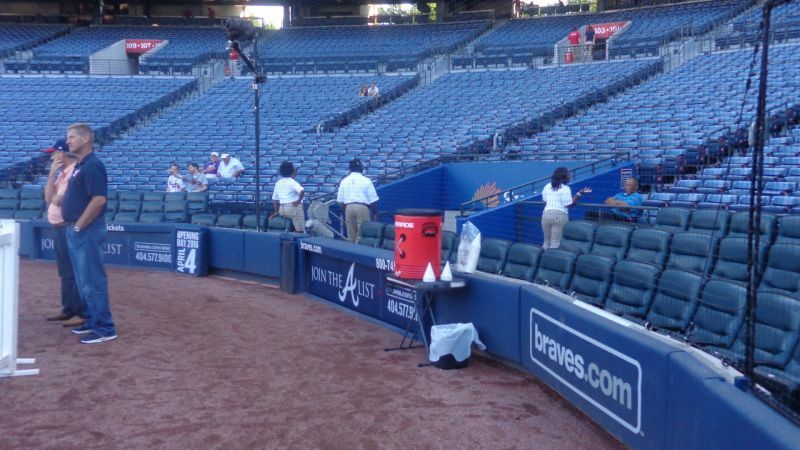 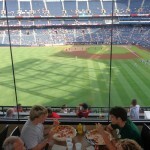 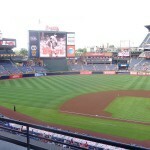 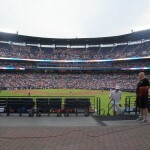 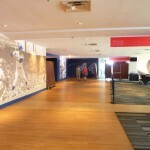 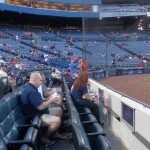 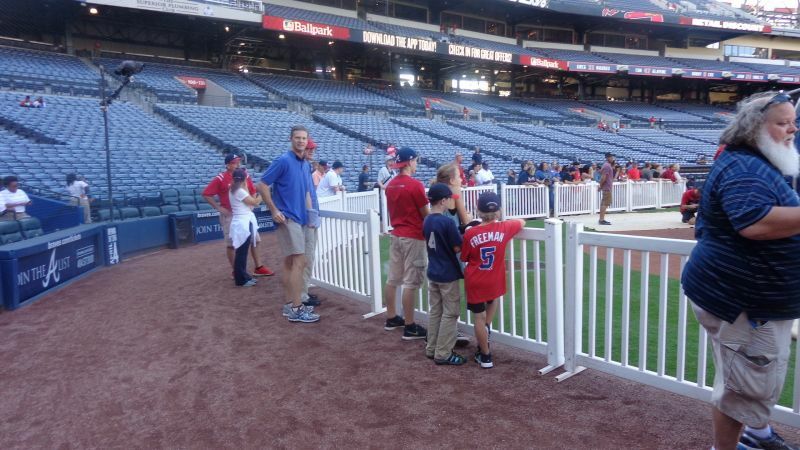 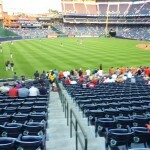 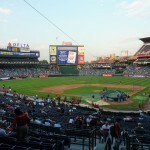 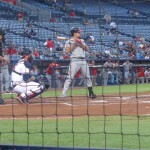 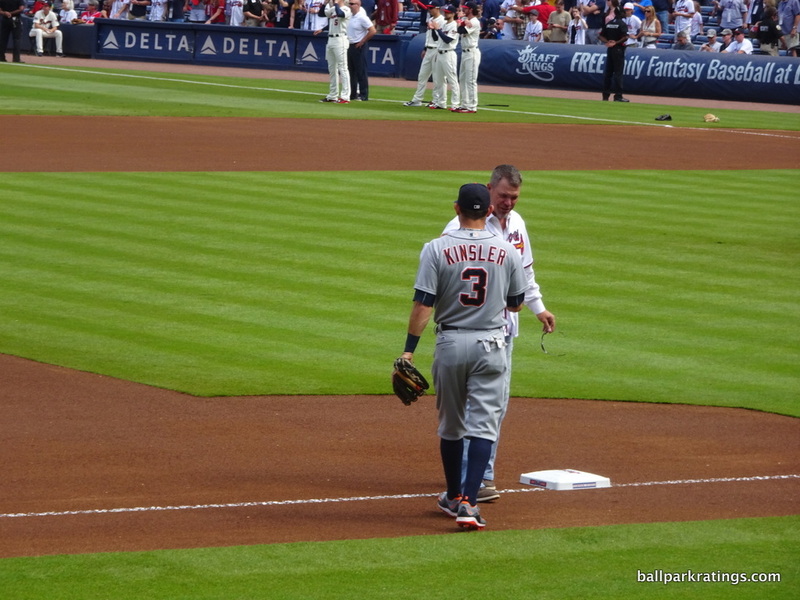 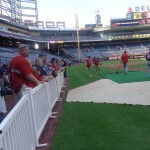 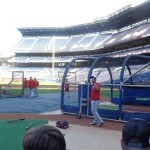 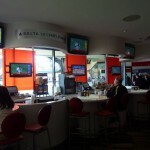 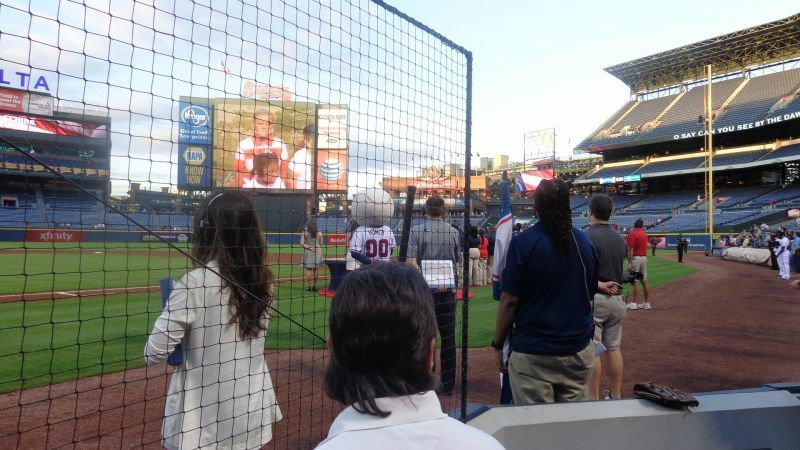 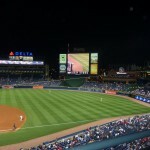 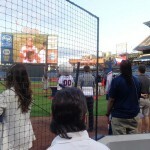 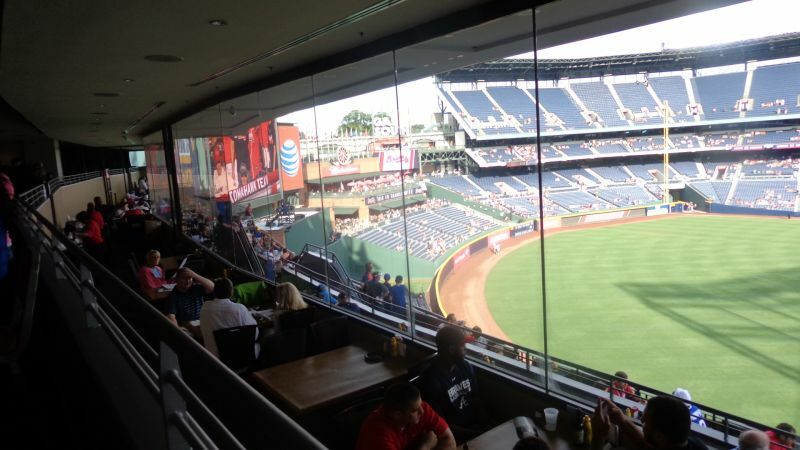 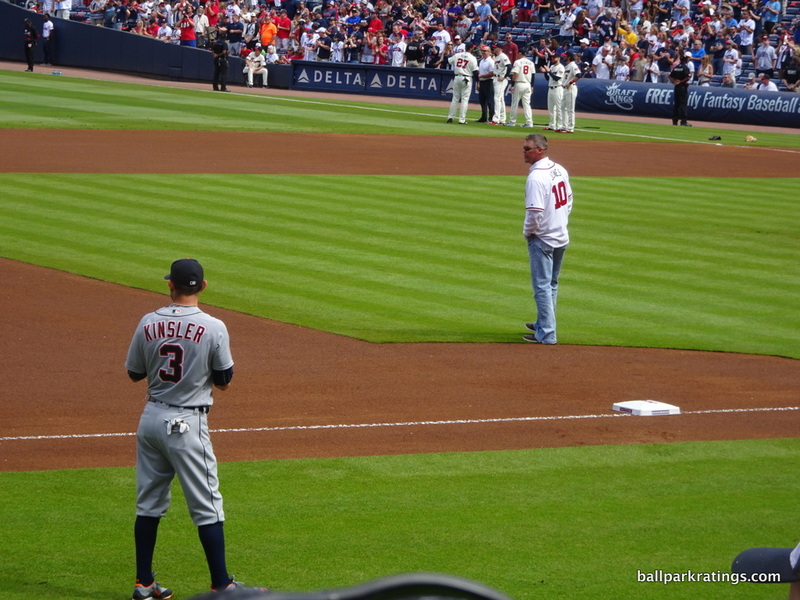 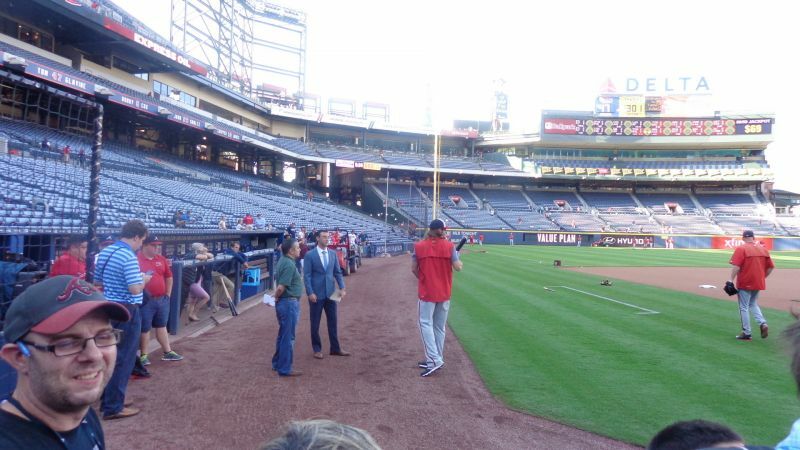 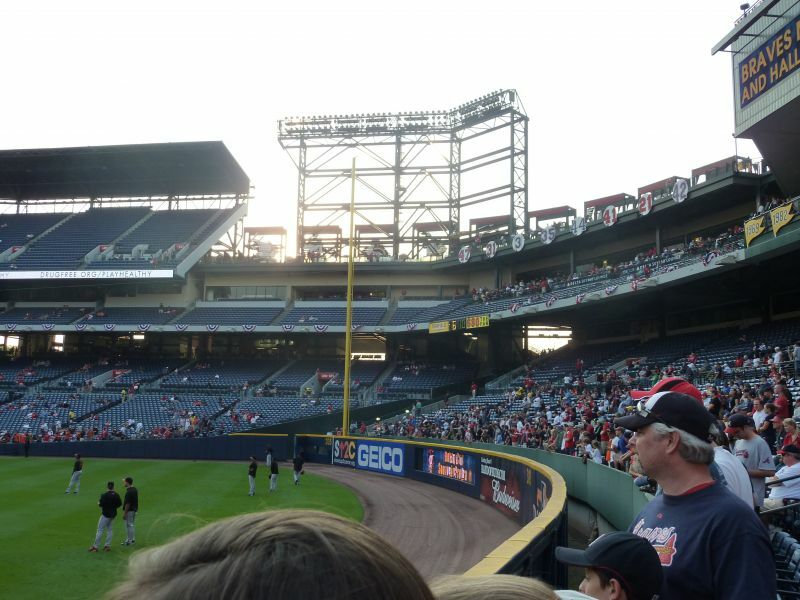 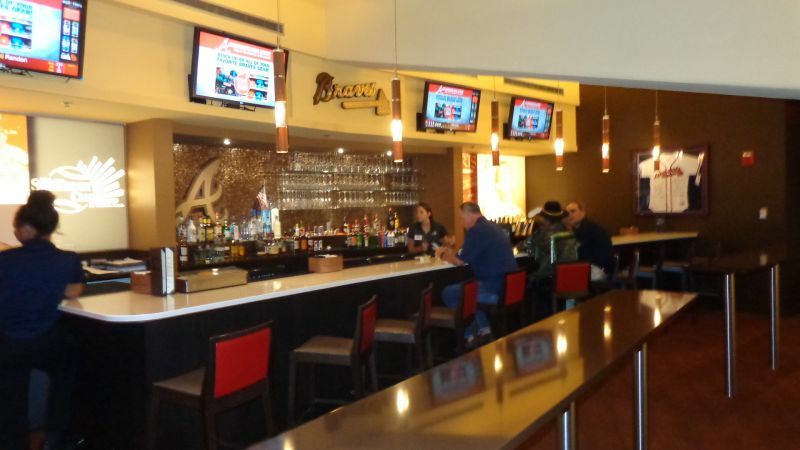 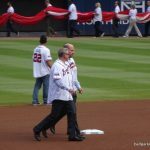 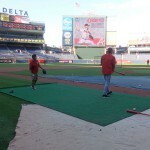 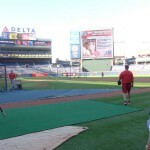 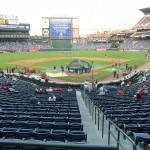 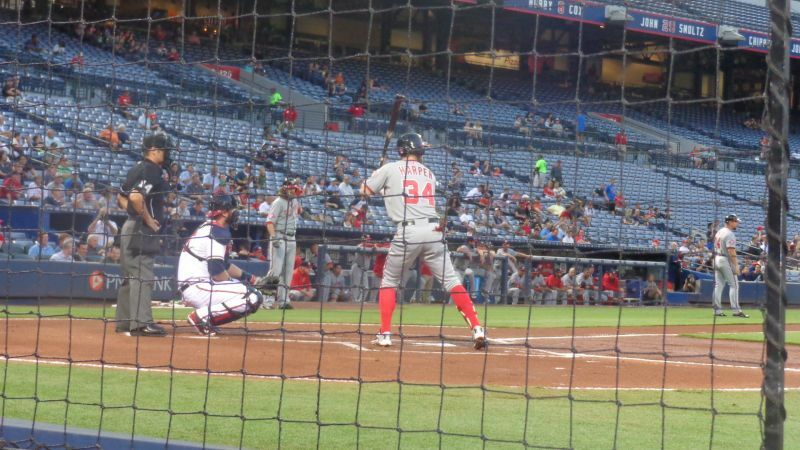 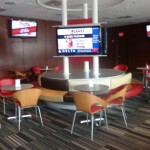 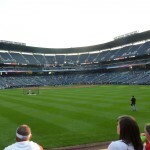 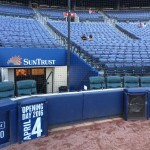 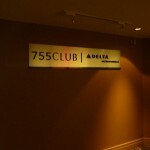 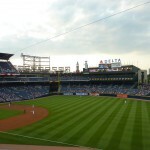 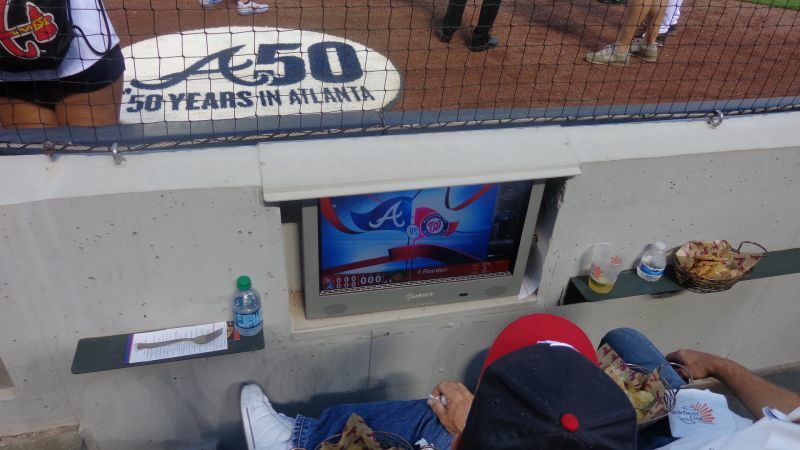 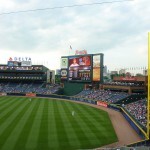 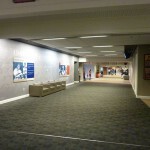 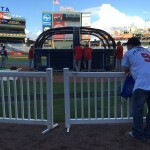 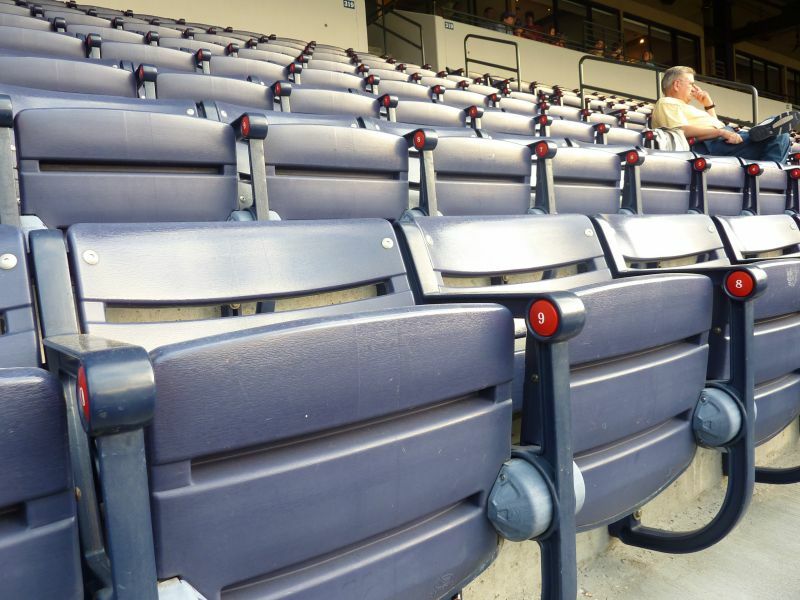 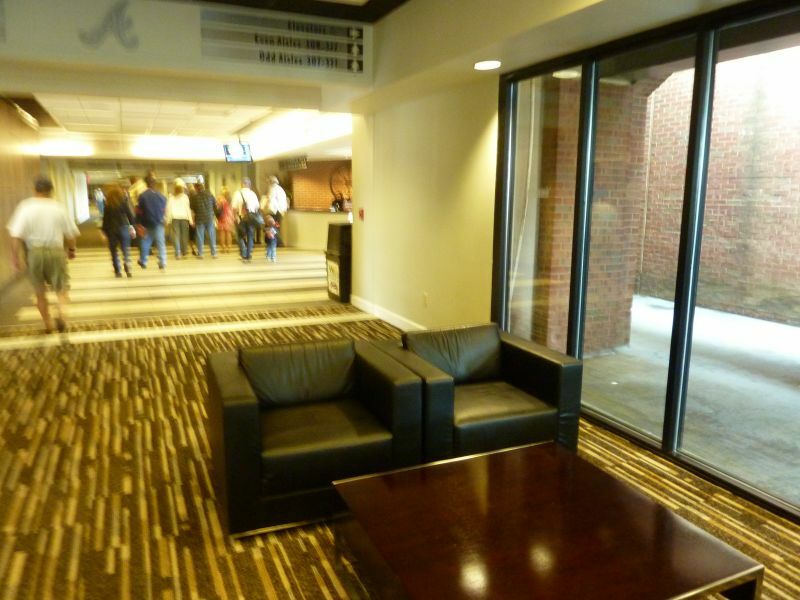 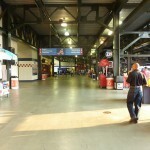 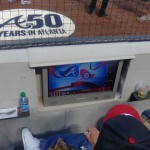 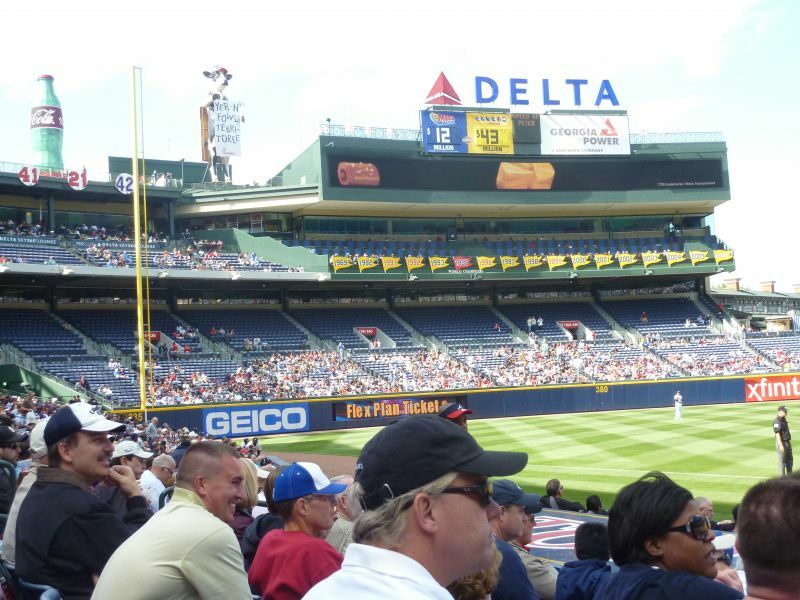 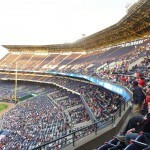 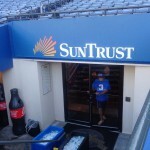 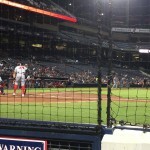 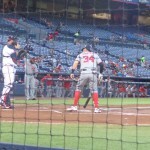 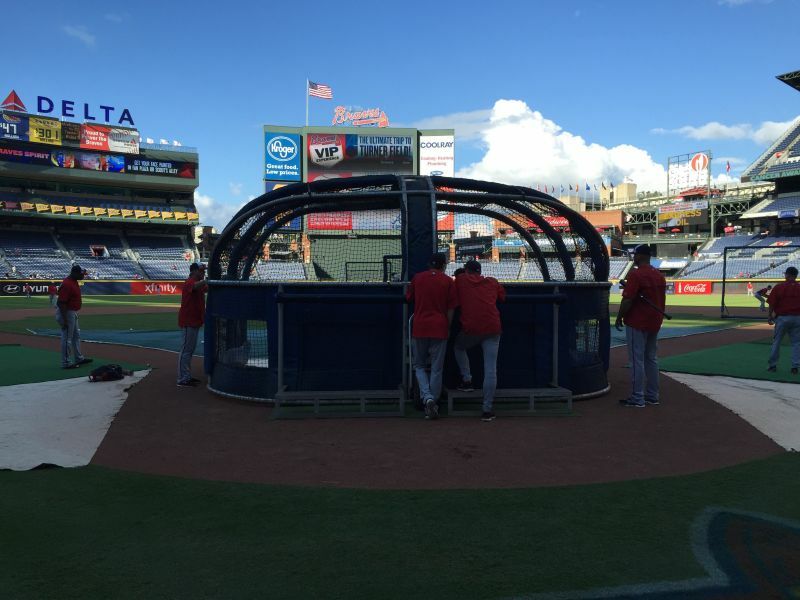 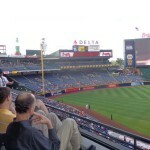 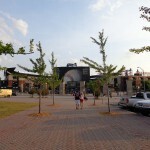 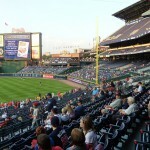 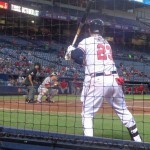 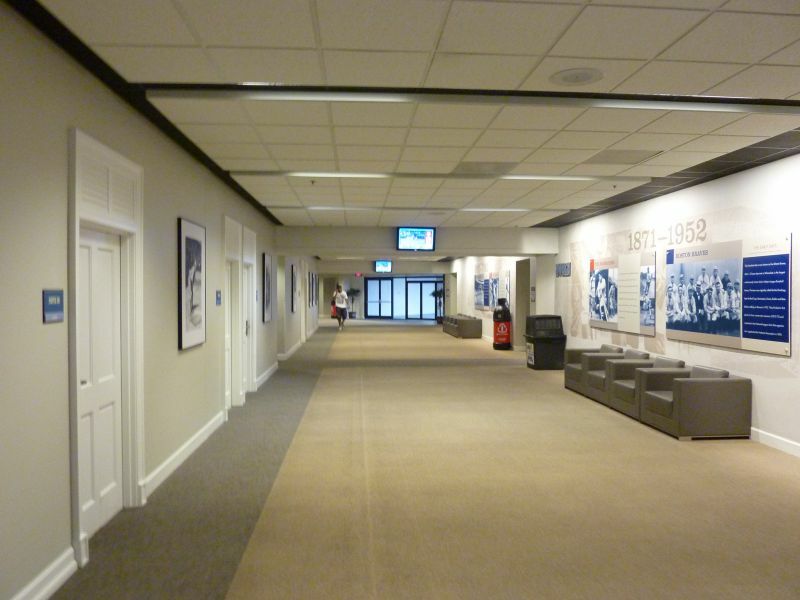 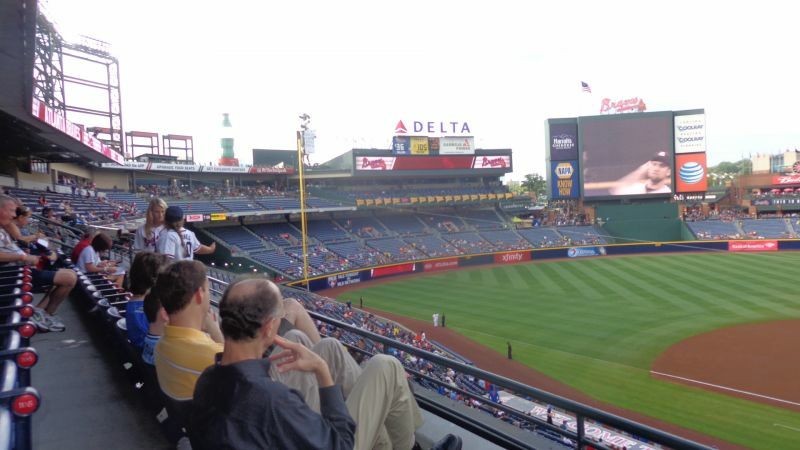 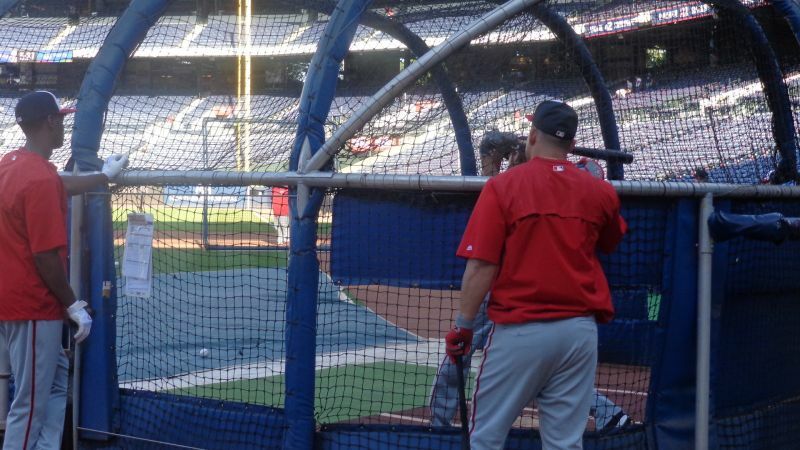 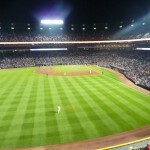 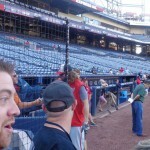 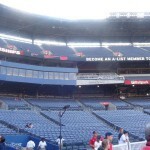 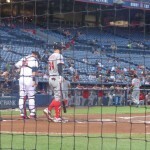 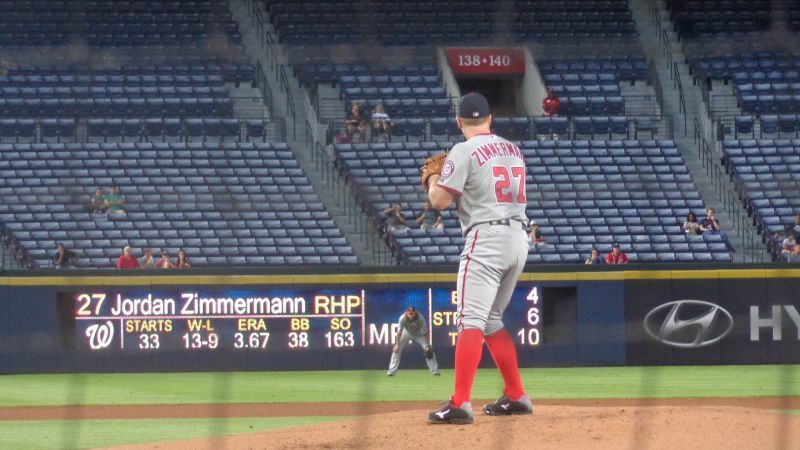 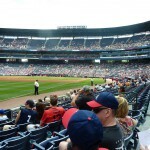 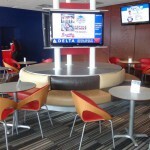 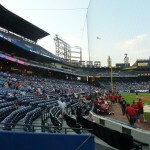 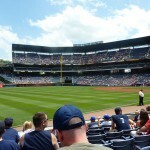 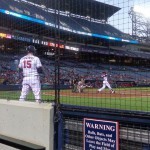 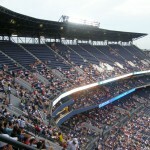 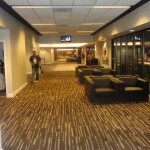 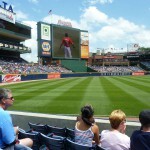 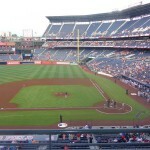 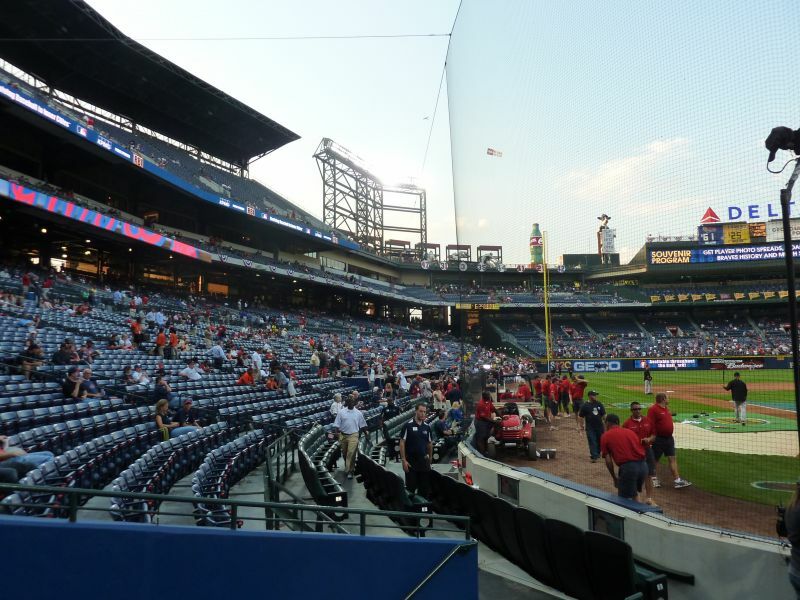 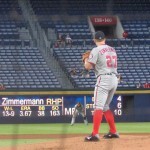 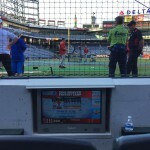 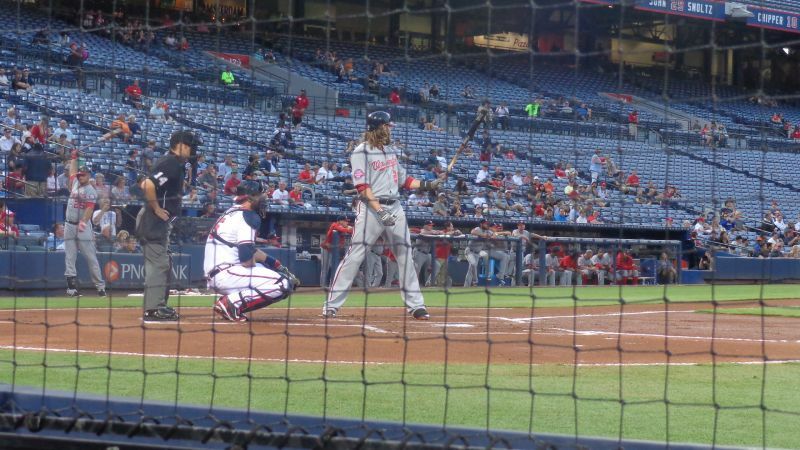 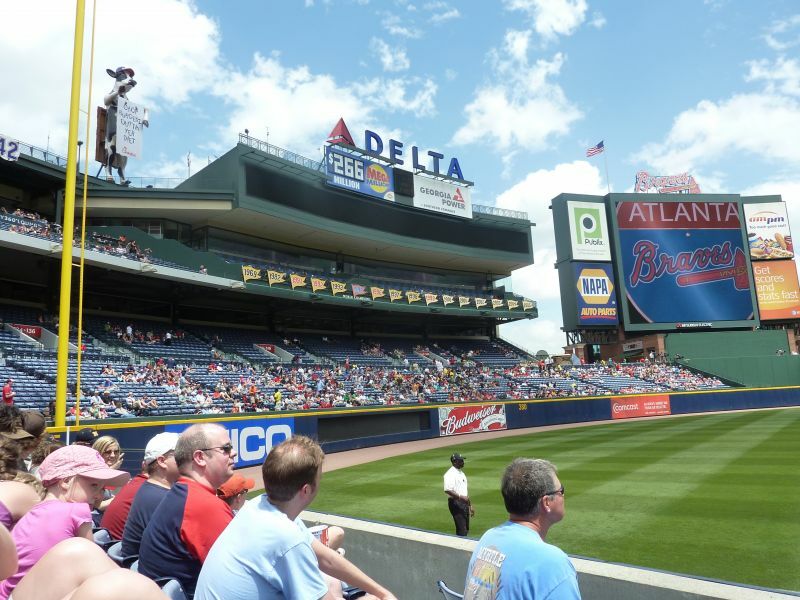 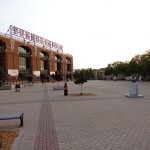 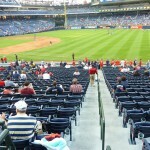 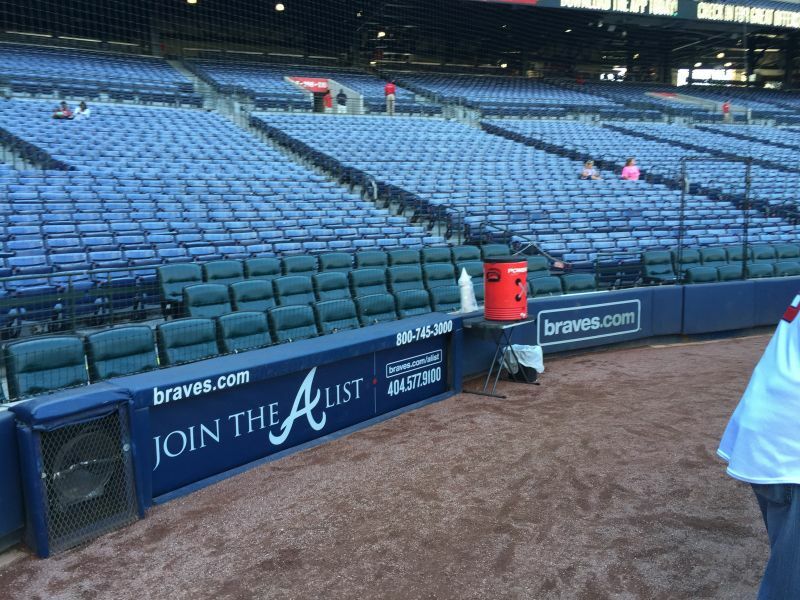 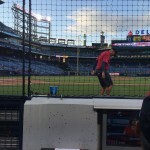 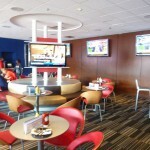 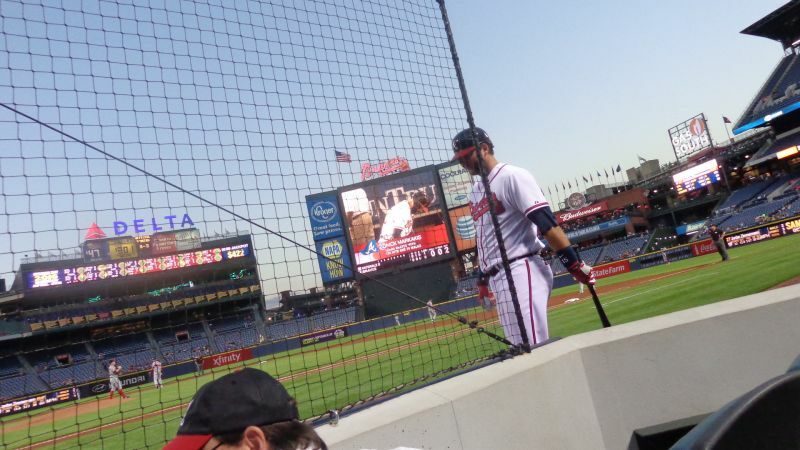 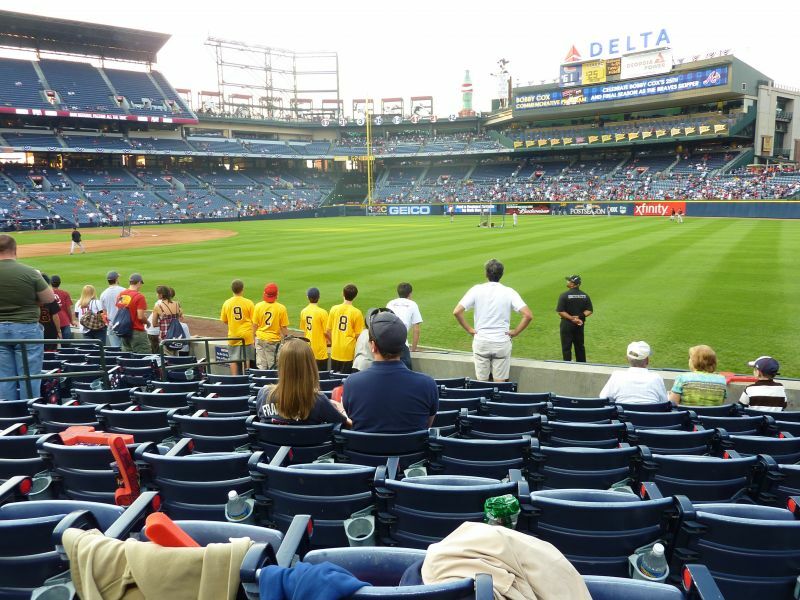 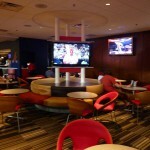 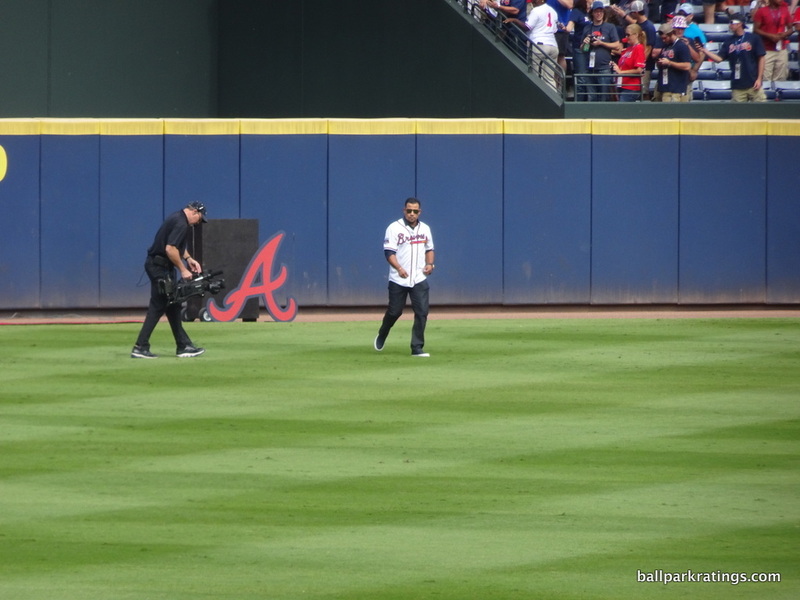 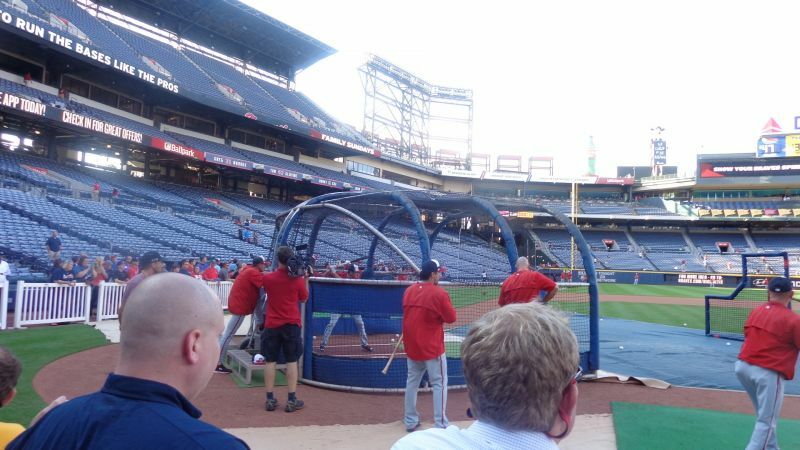 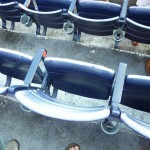 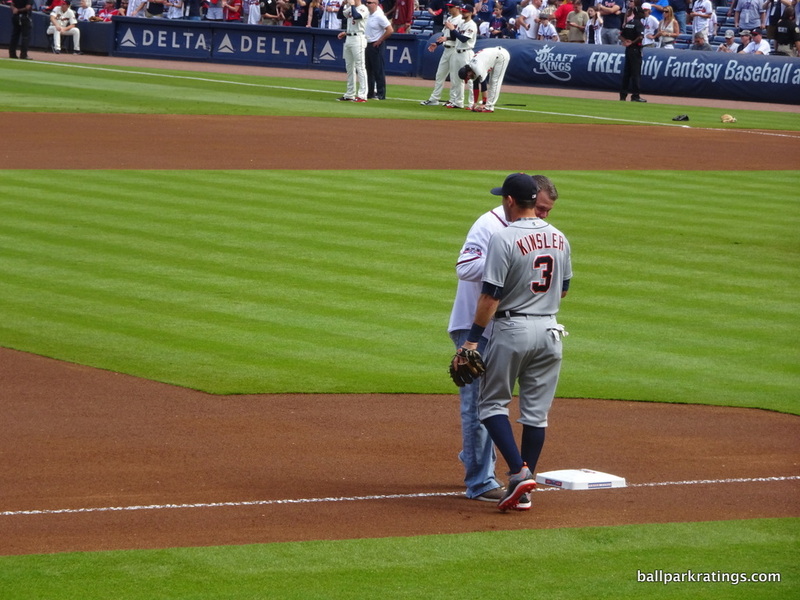 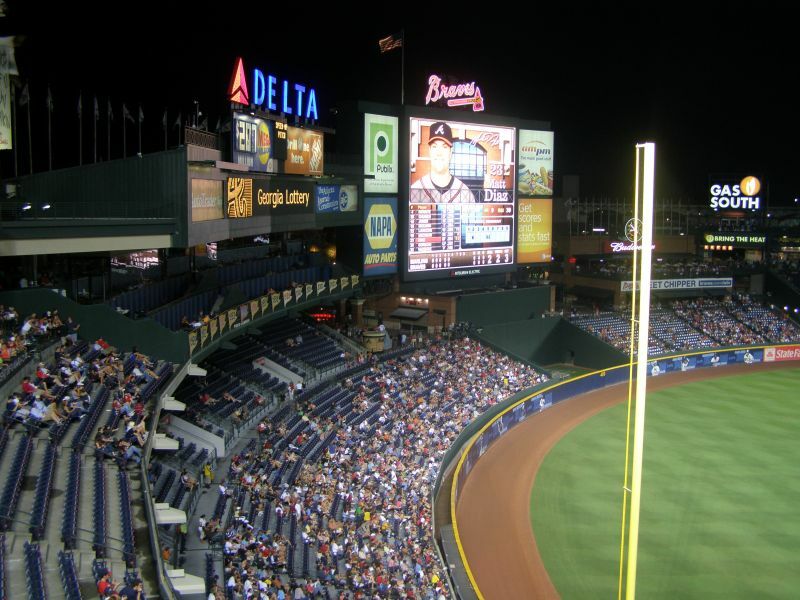 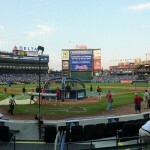 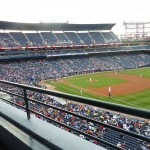 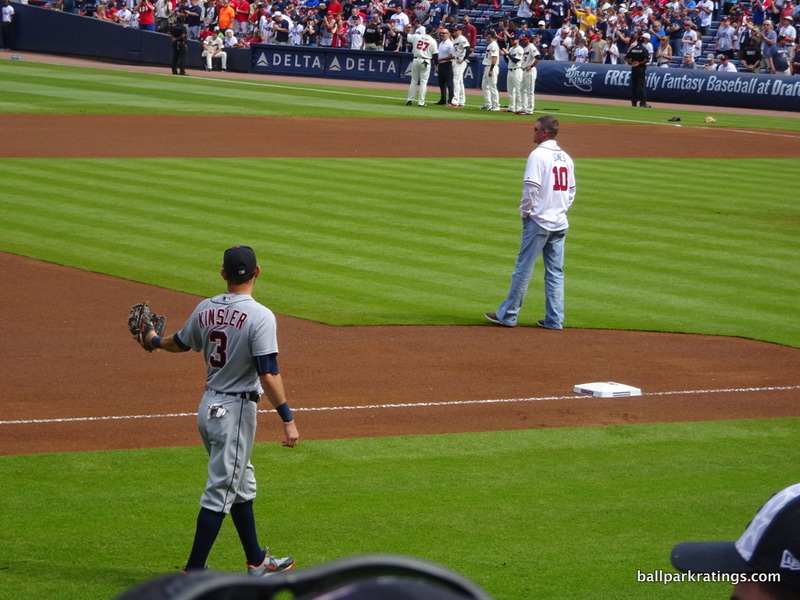 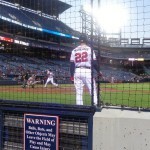 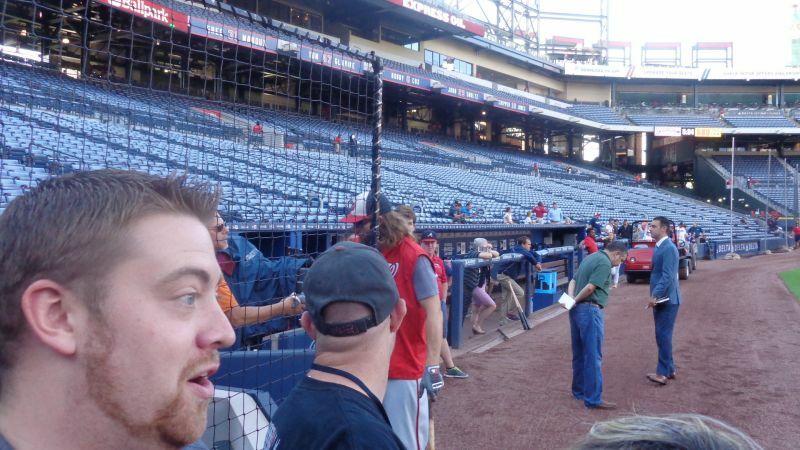 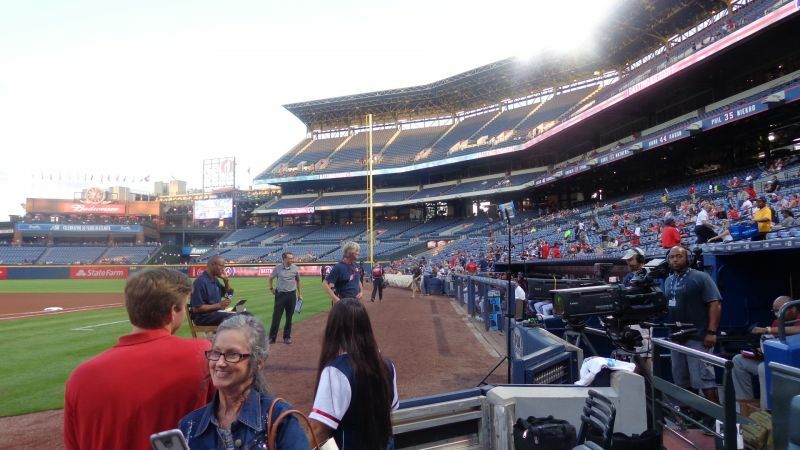 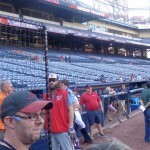 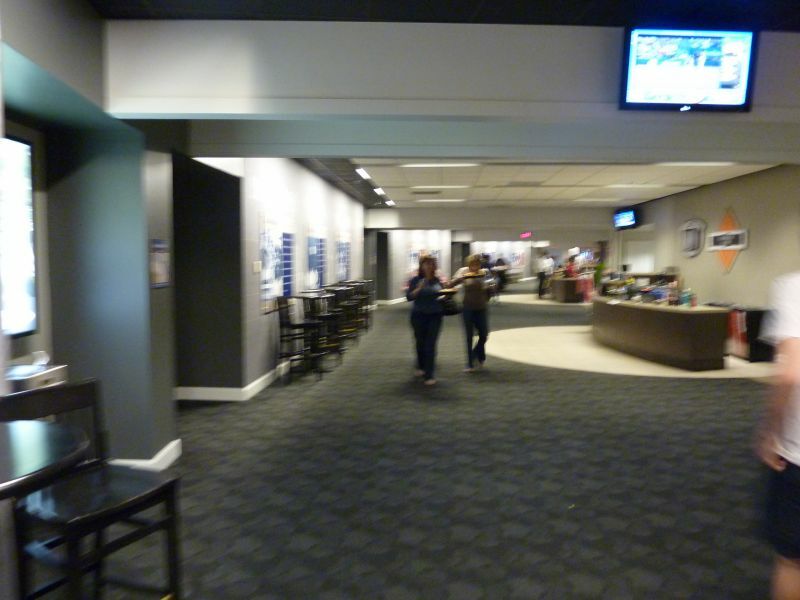 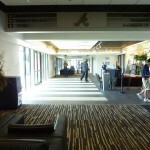 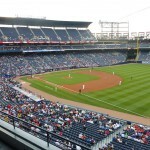 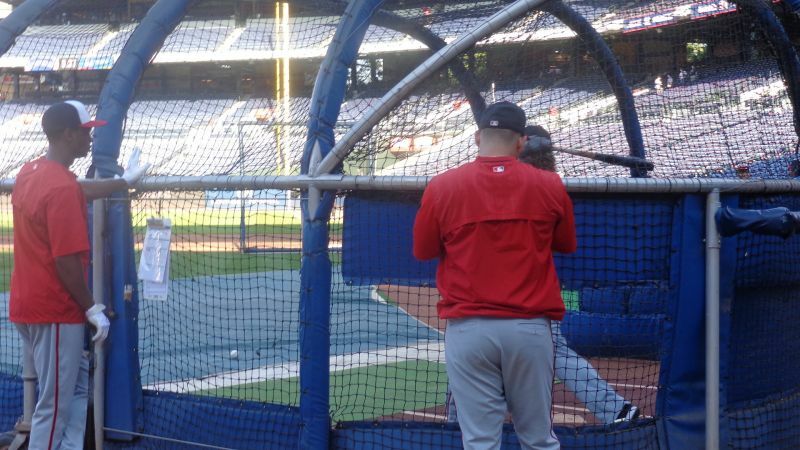 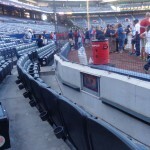 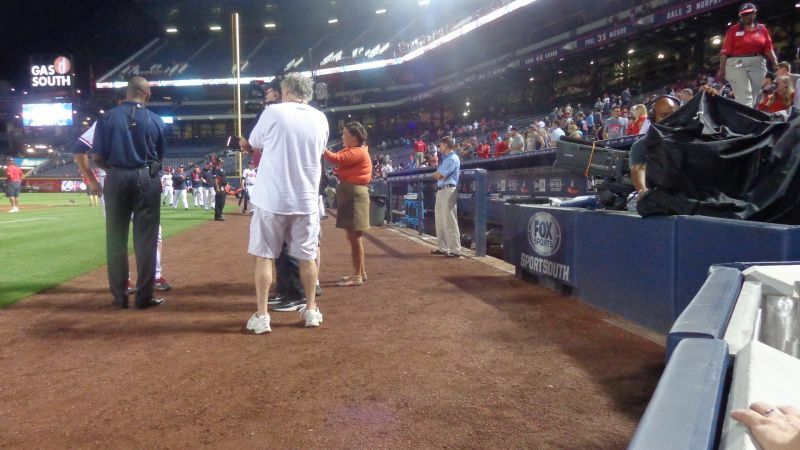 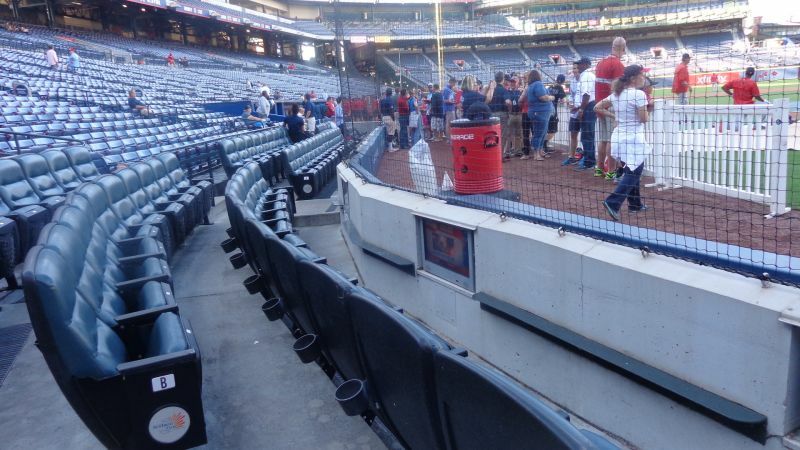 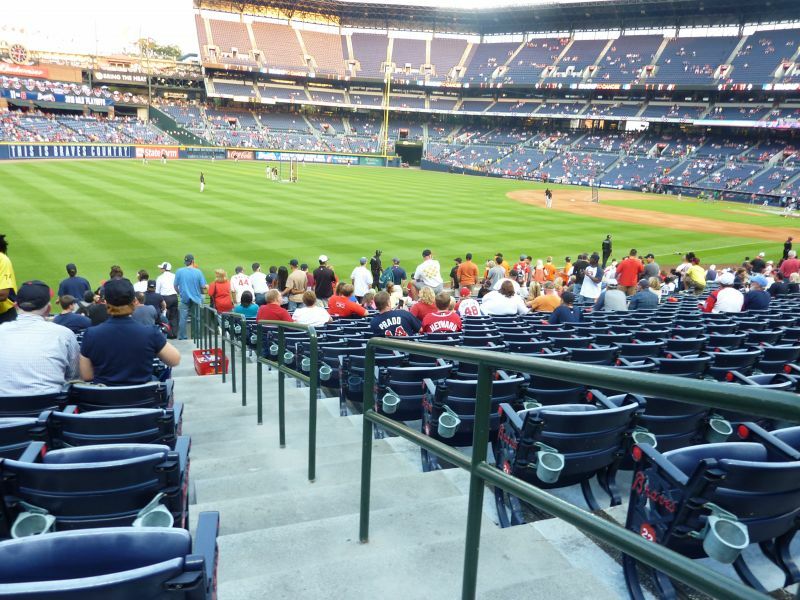 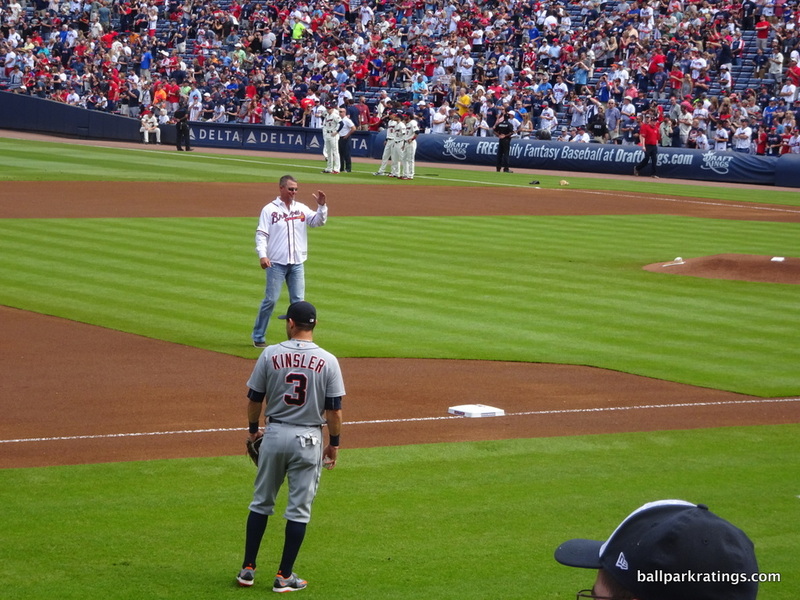 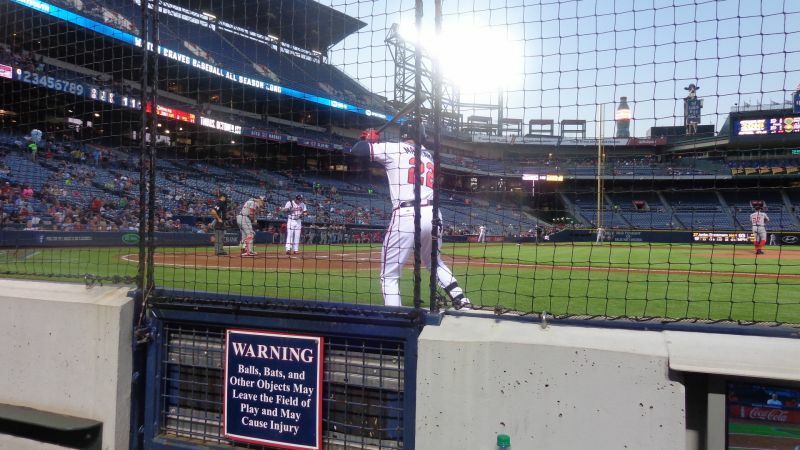 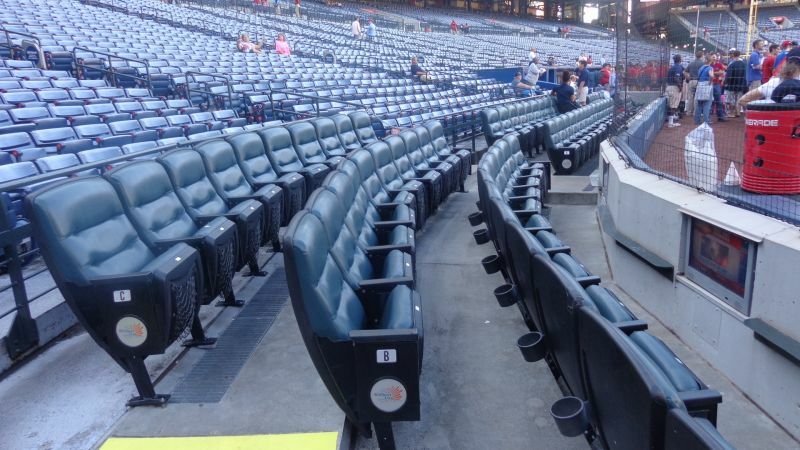 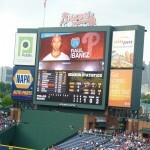 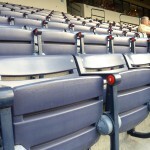 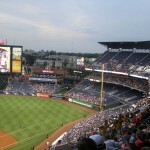 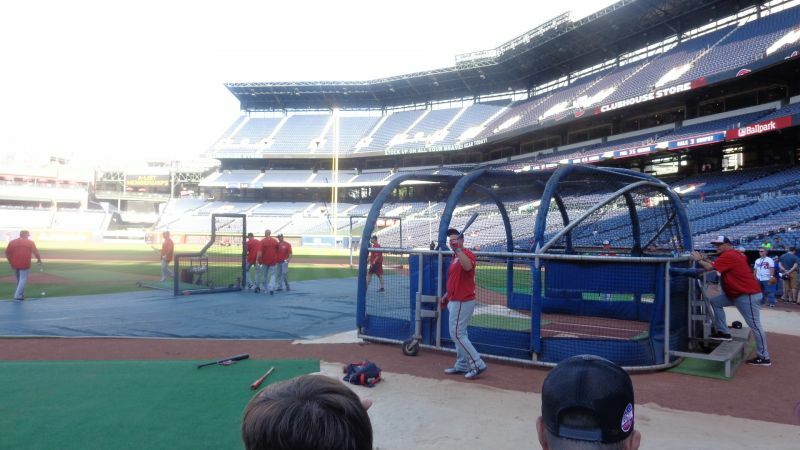 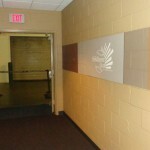 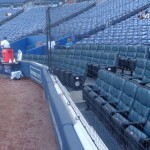 The problem is Turner Field crosses the line into bland and uninspired, not at all authentic or minimalist. 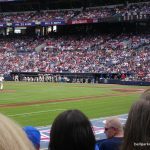 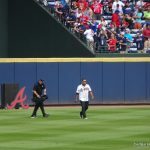 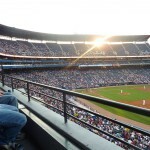 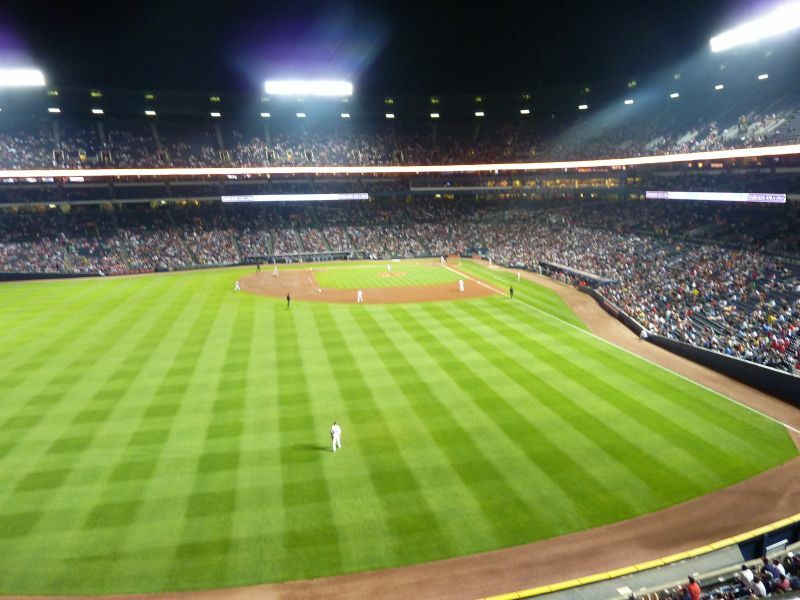 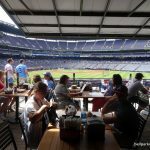 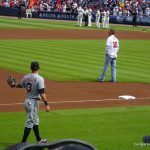 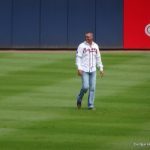 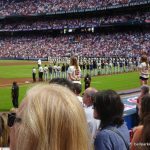 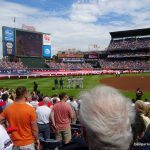 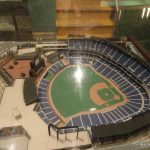 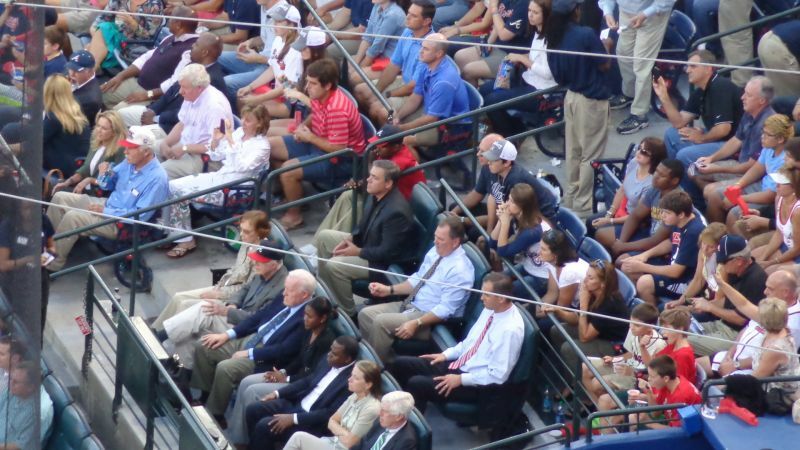 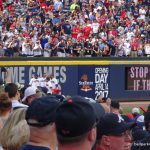 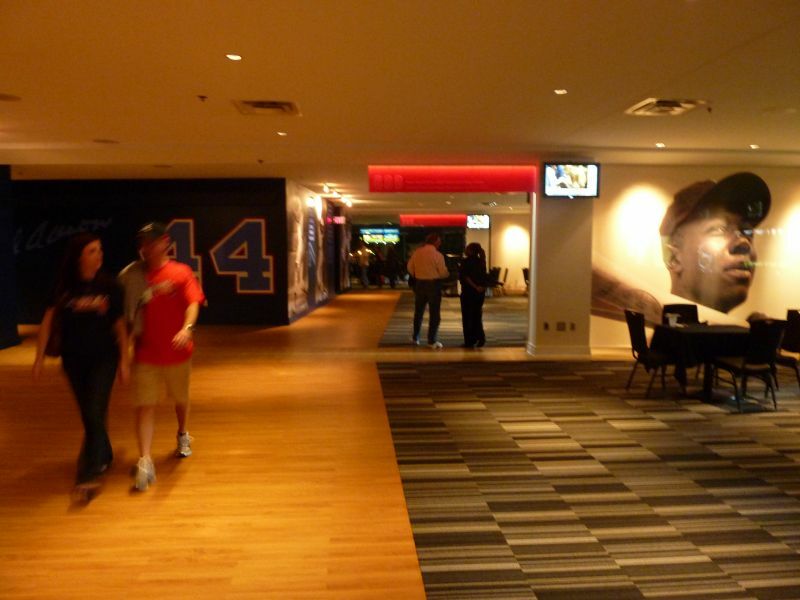 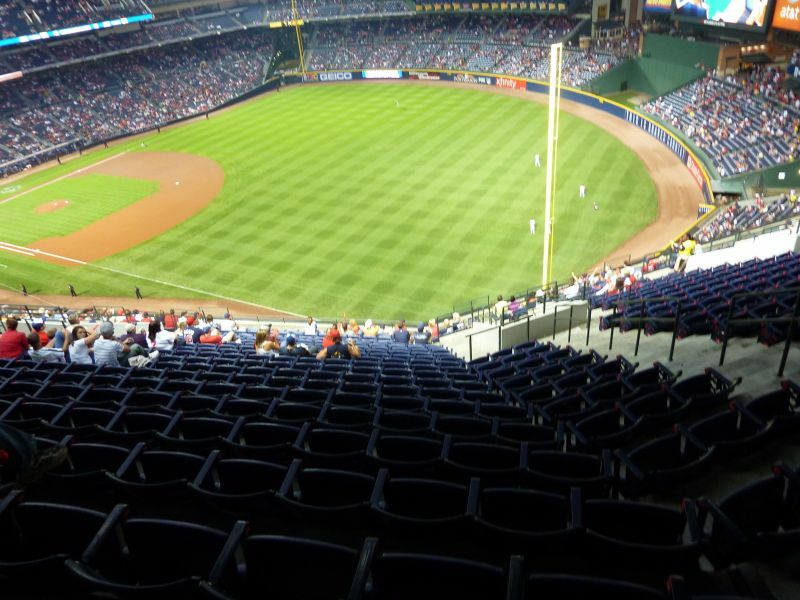 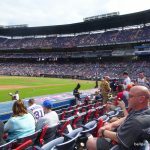 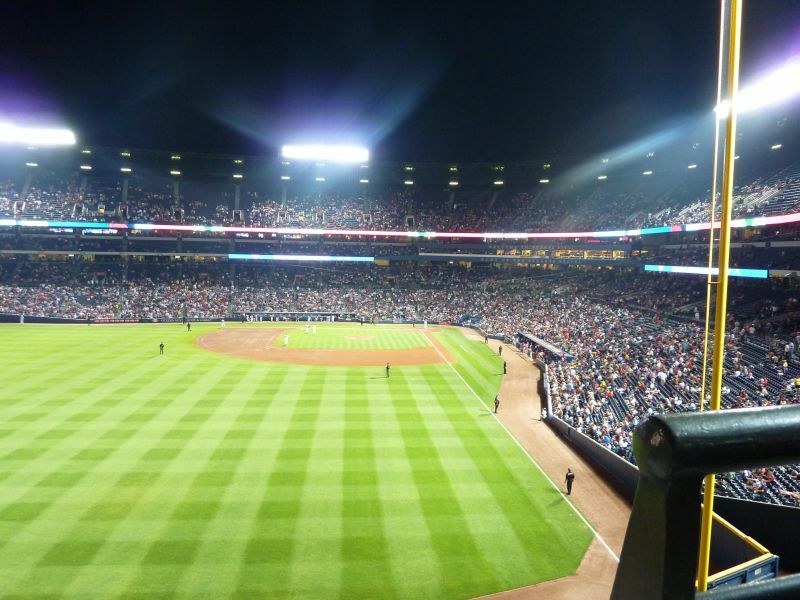 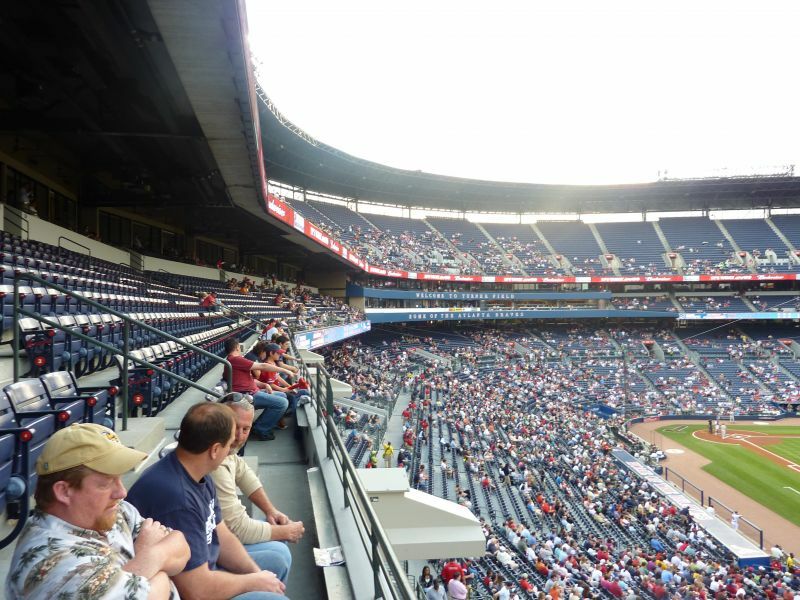 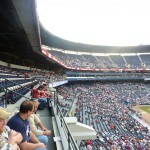 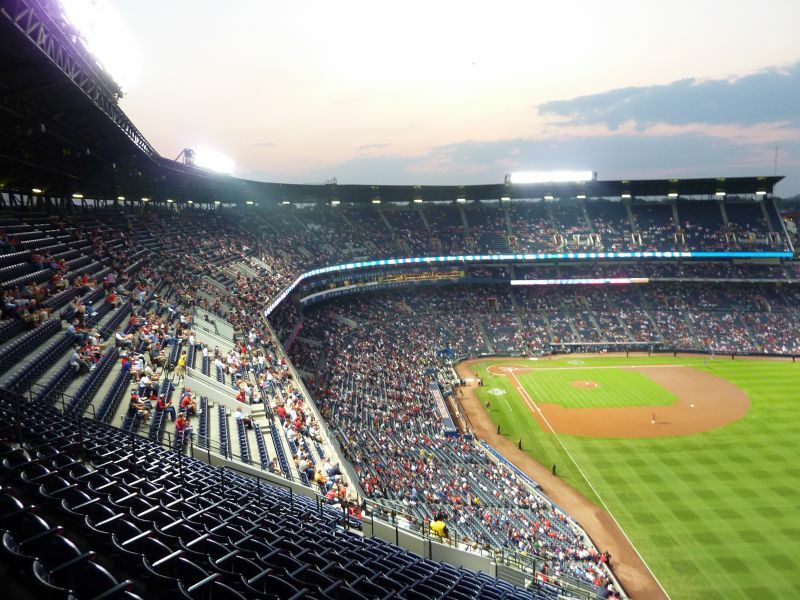 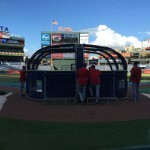 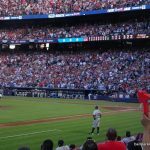 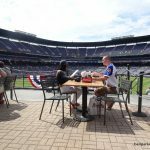 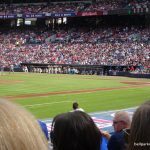 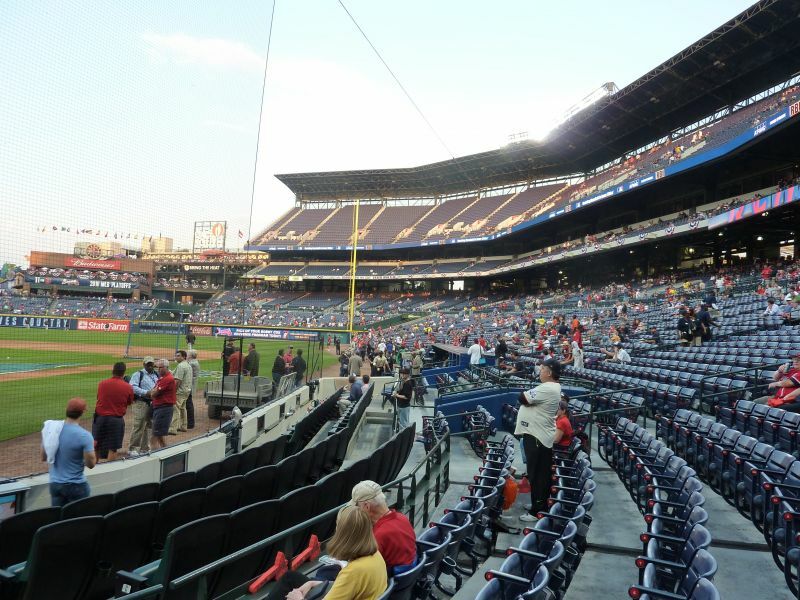 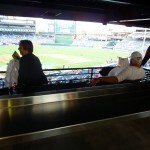 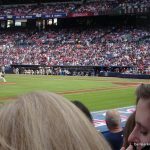 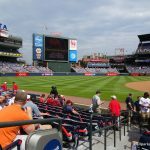 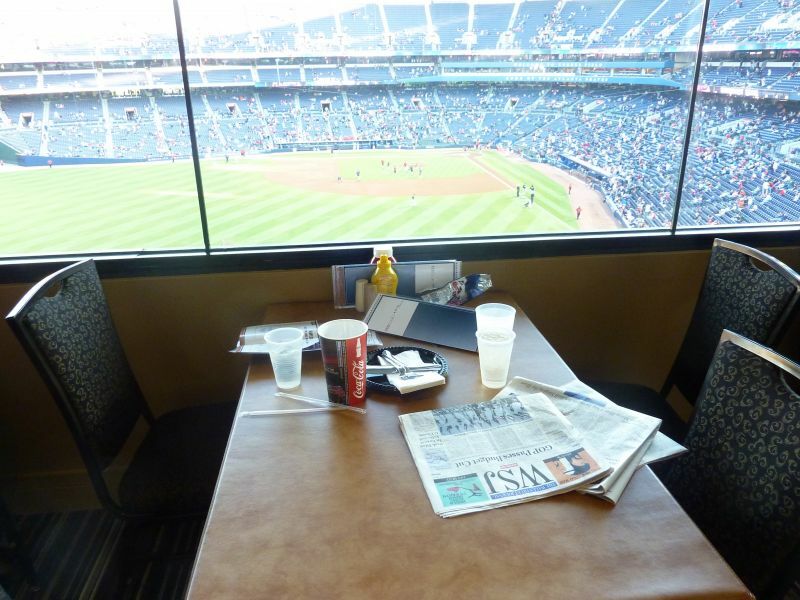 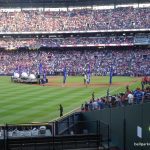 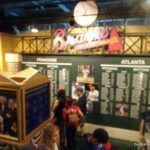 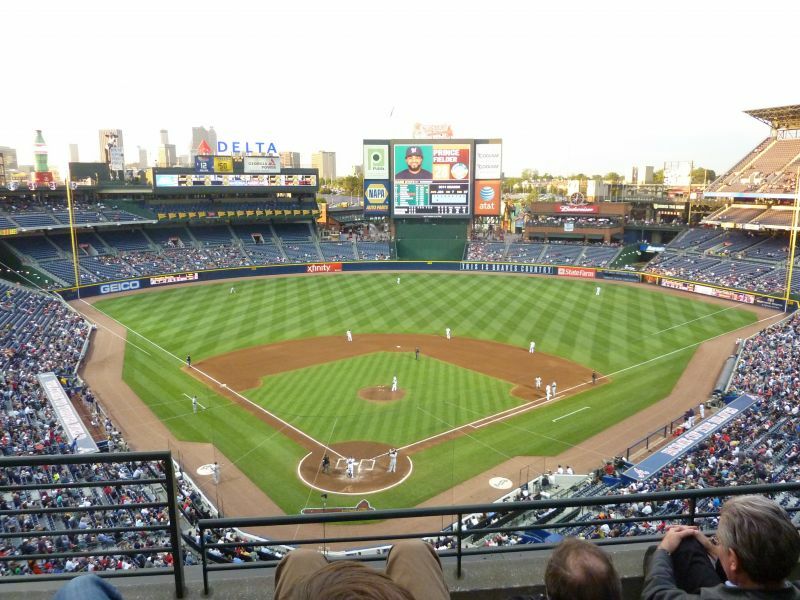 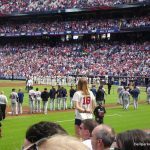 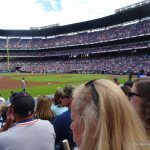 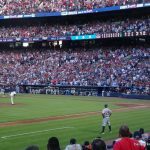 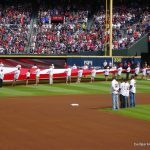 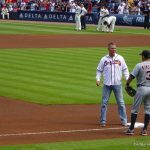 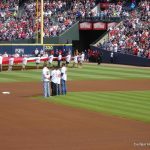 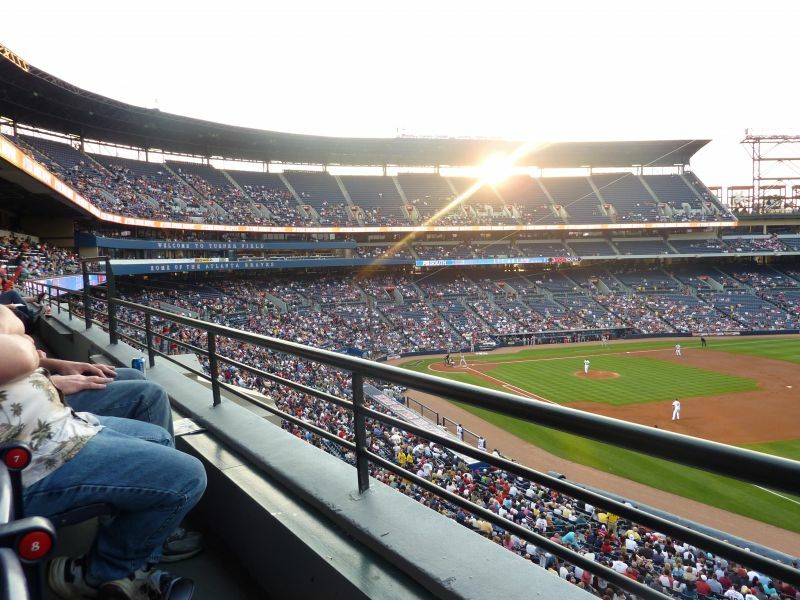 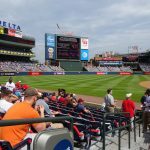 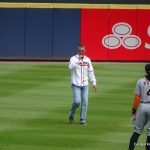 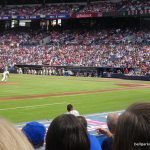 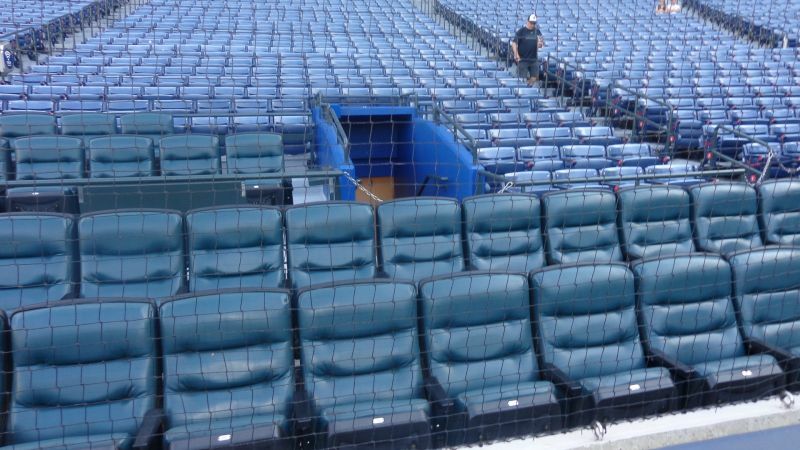 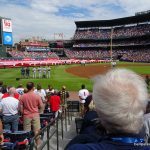 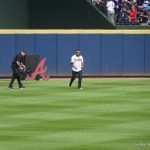 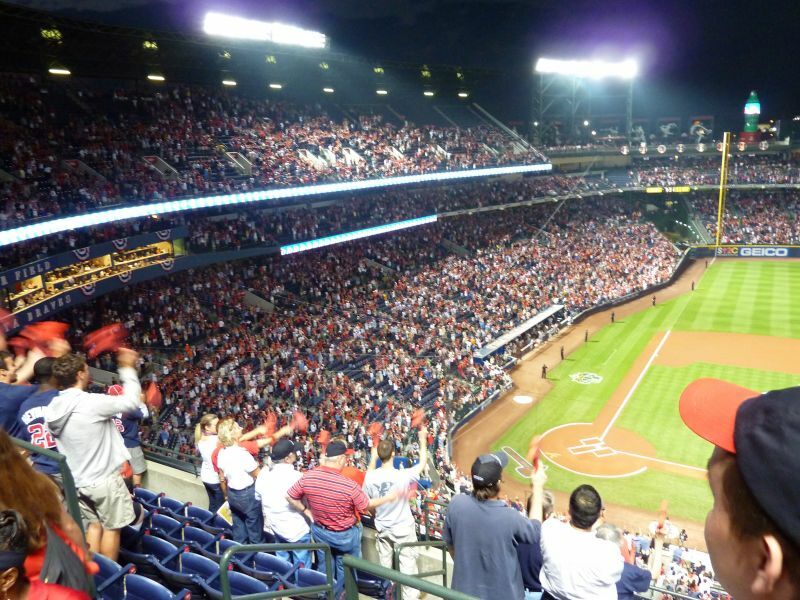 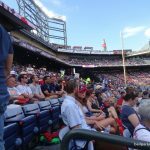 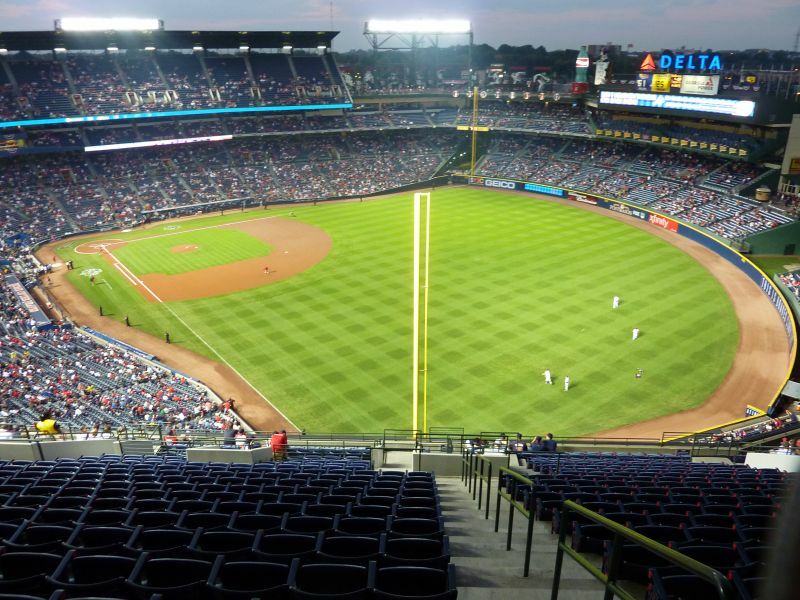 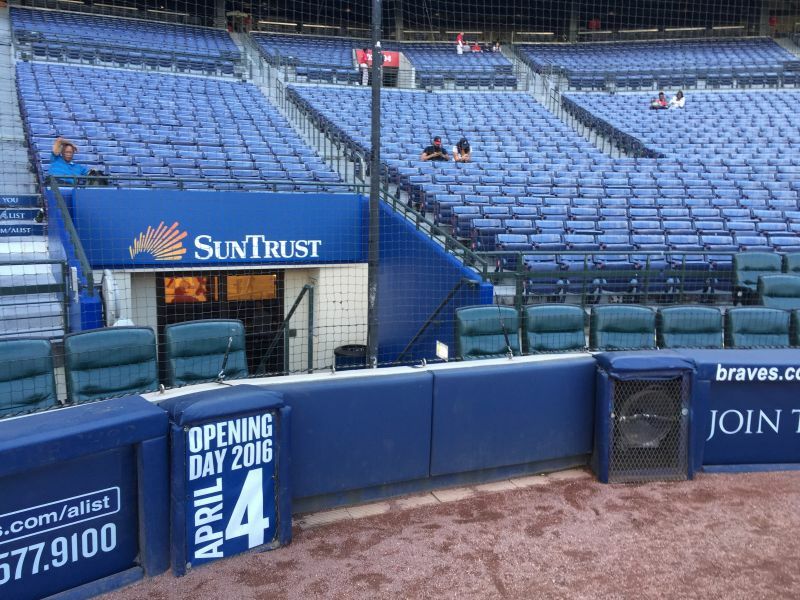 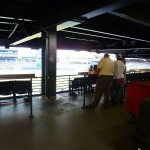 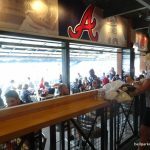 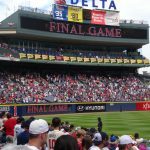 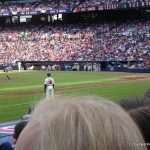 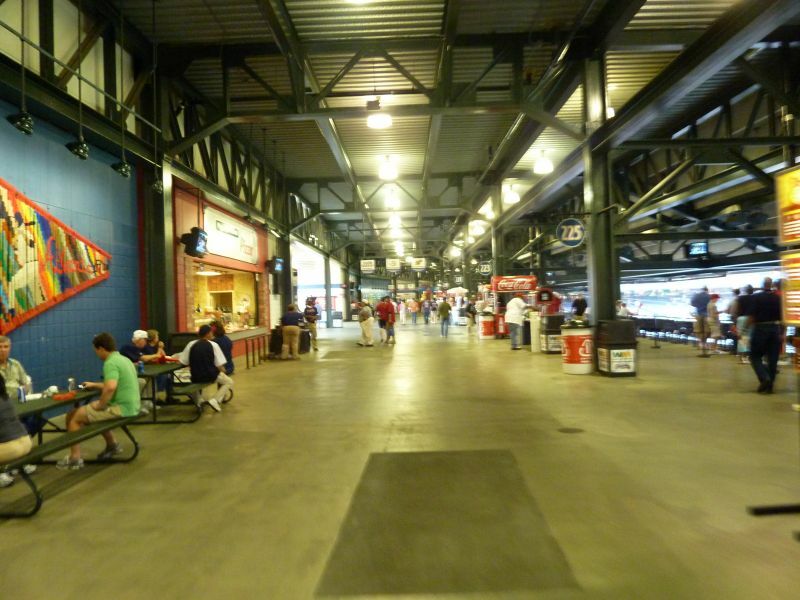 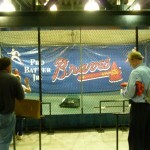 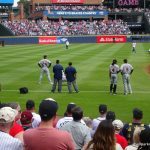 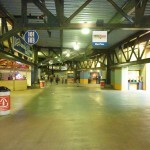 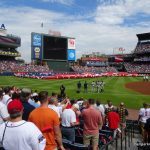 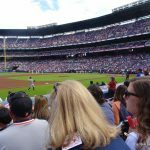 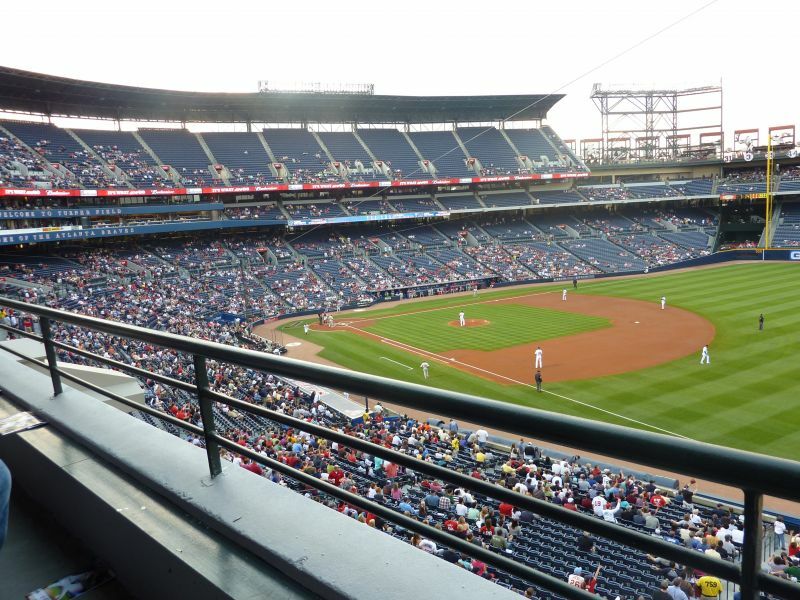 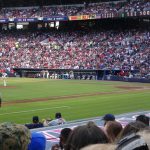 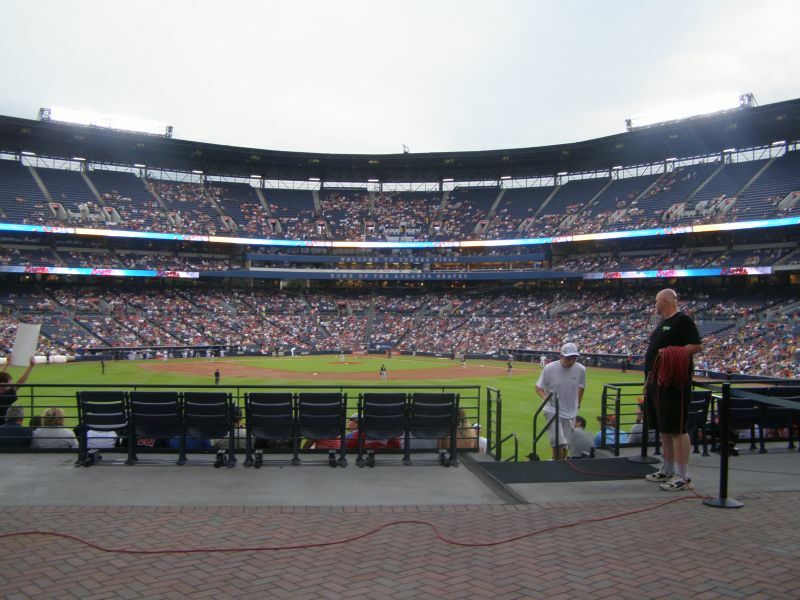 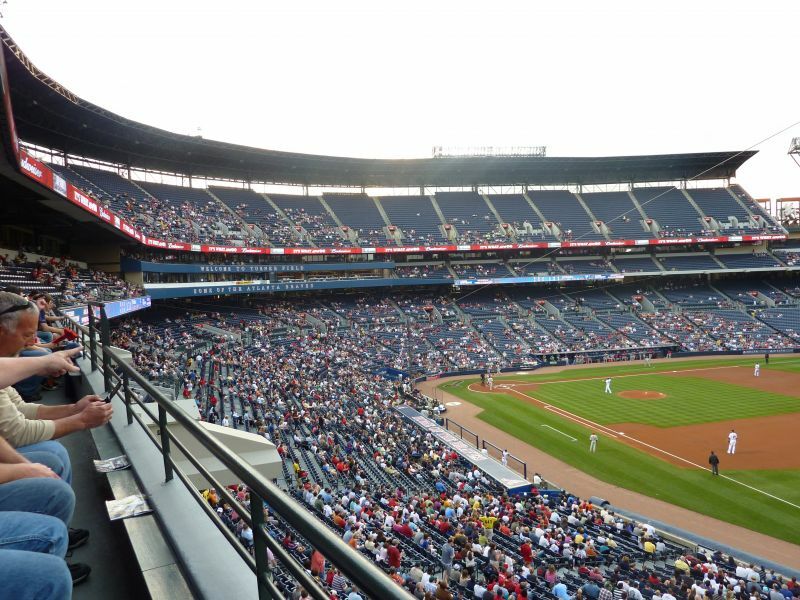 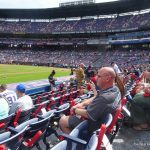 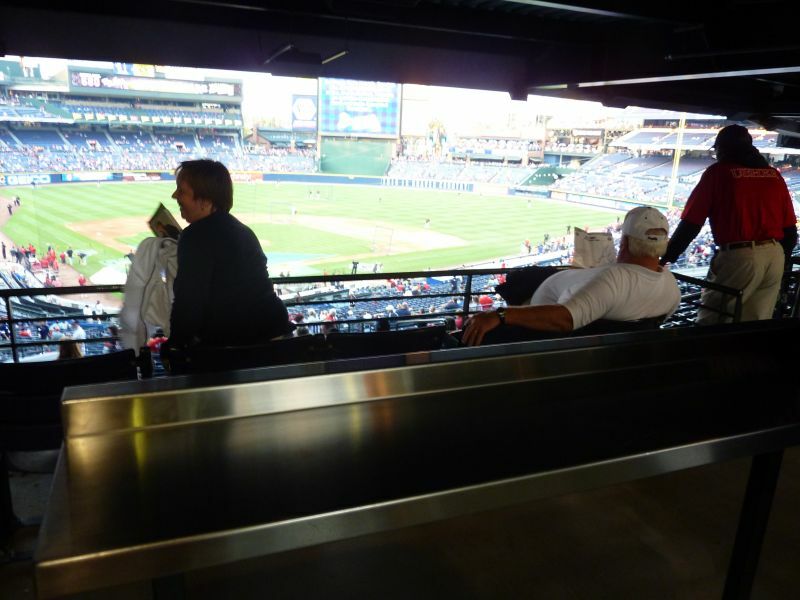 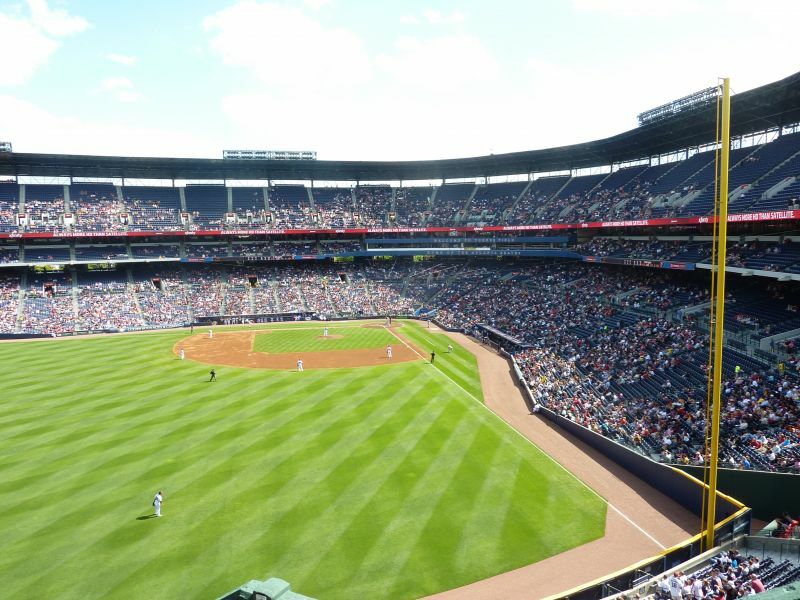 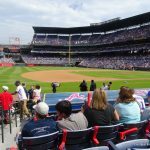 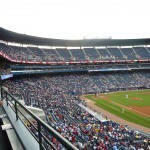 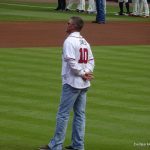 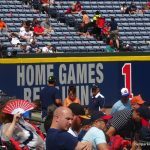 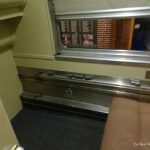 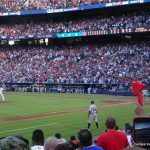 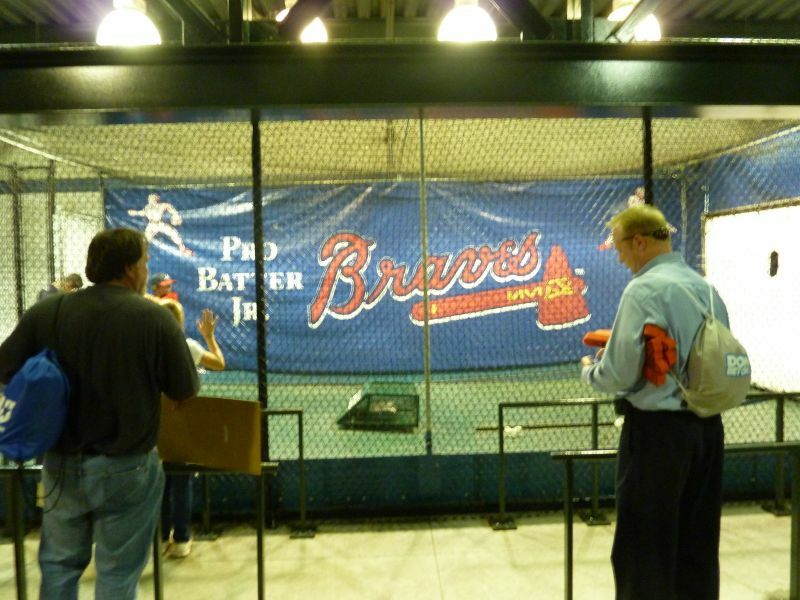 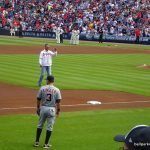 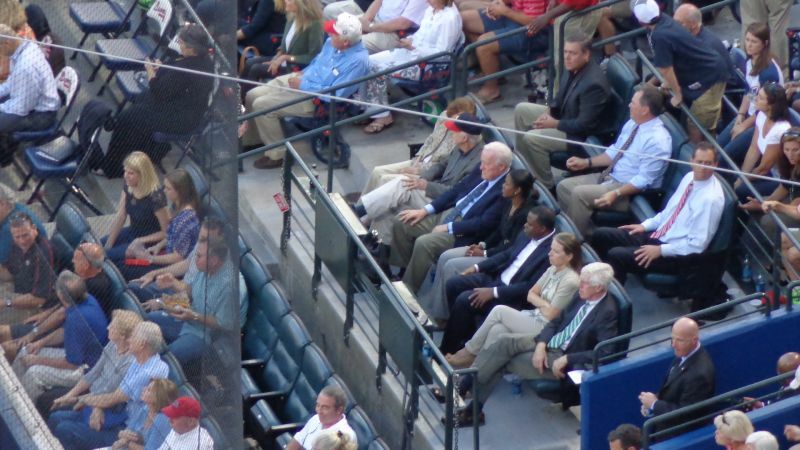 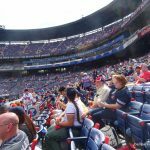 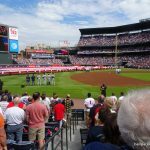 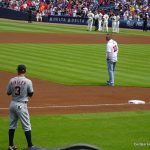 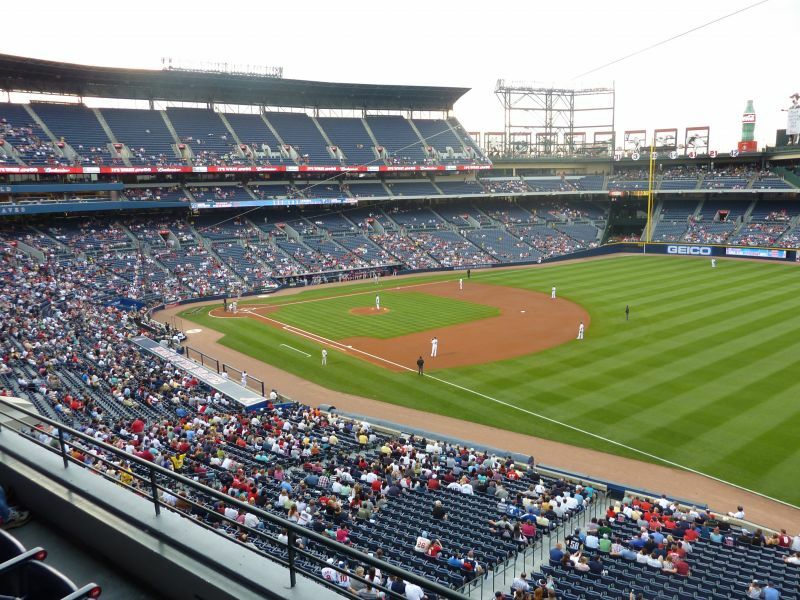 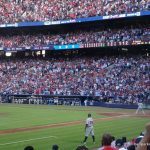 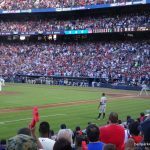 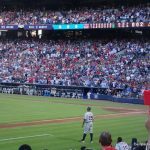 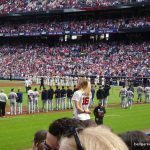 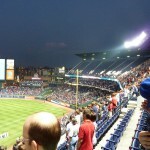 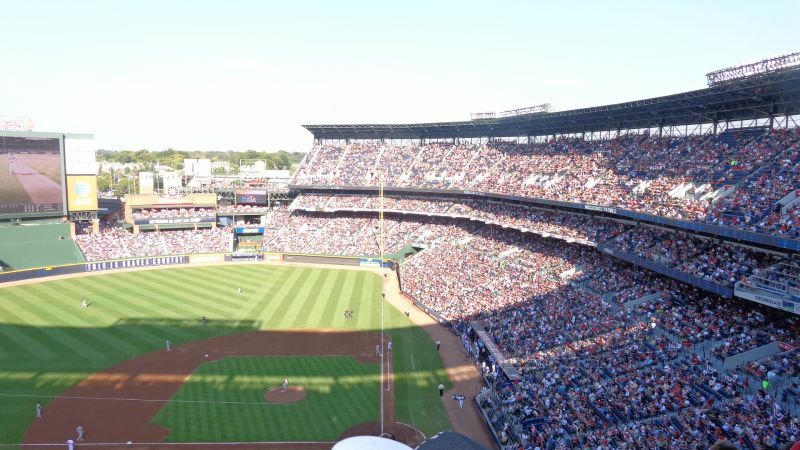 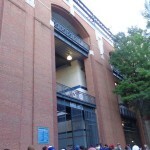 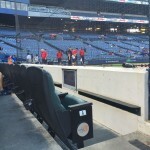 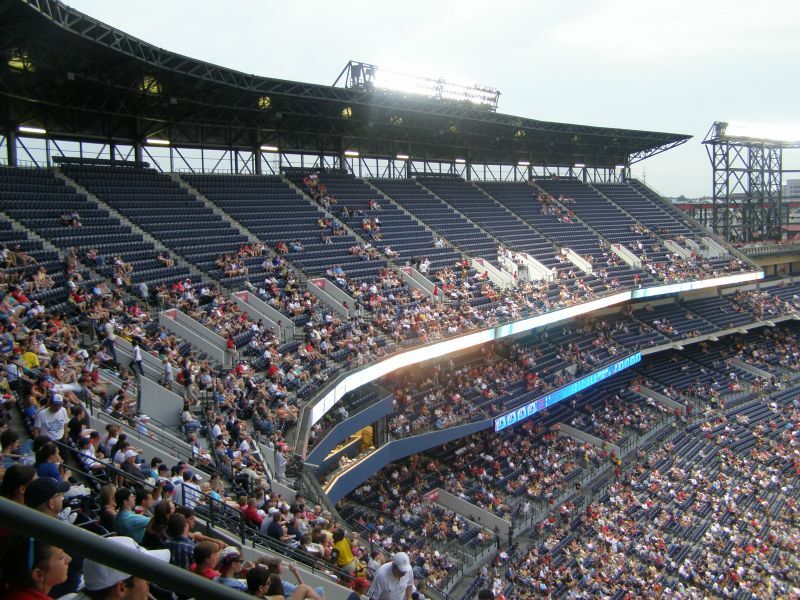 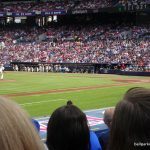 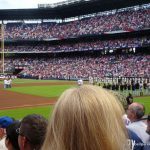 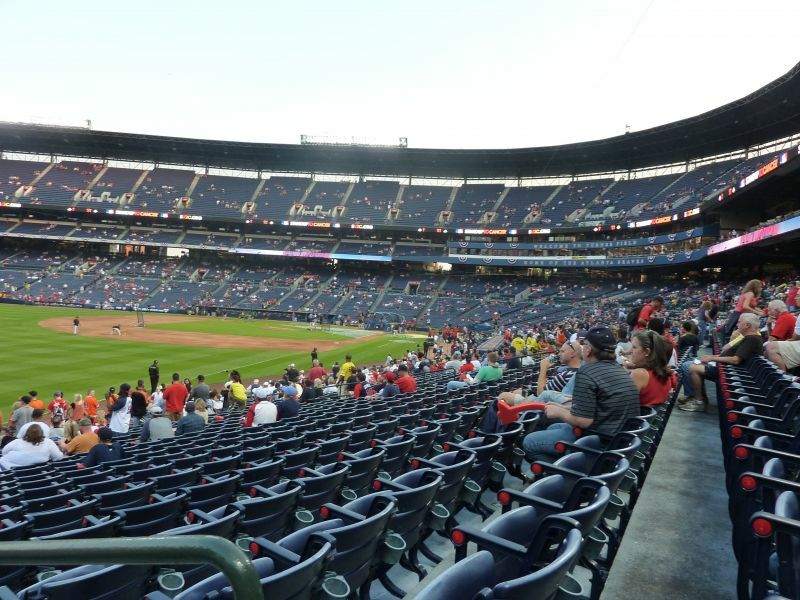 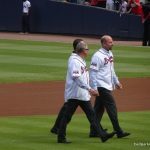 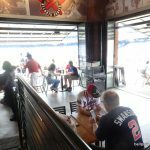 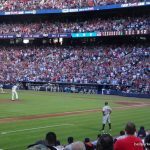 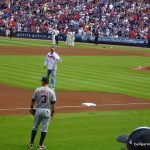 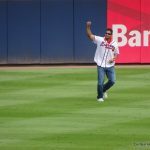 What we see on the inside of Turner Field is only functional, along the lines of a retractable roof park like Miller or Chase. 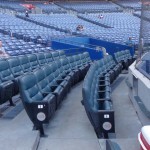 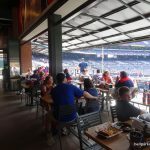 With a boring array of single deck outfield seating, it makes no attempt to provide views of its surroundings or even be aesthetically pleasing. 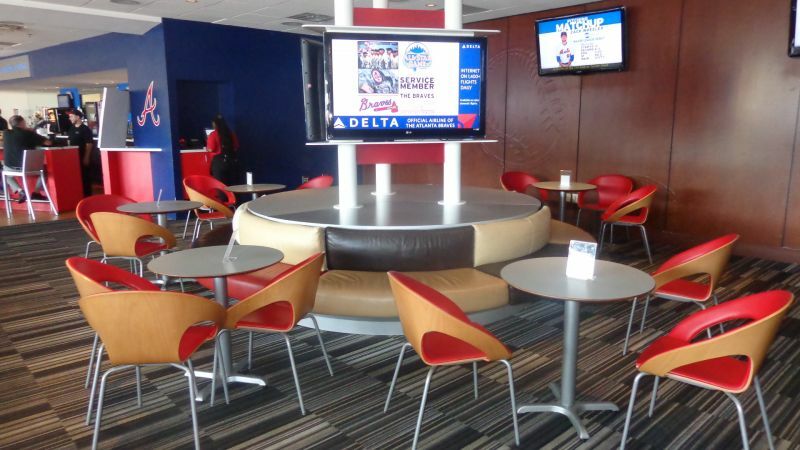 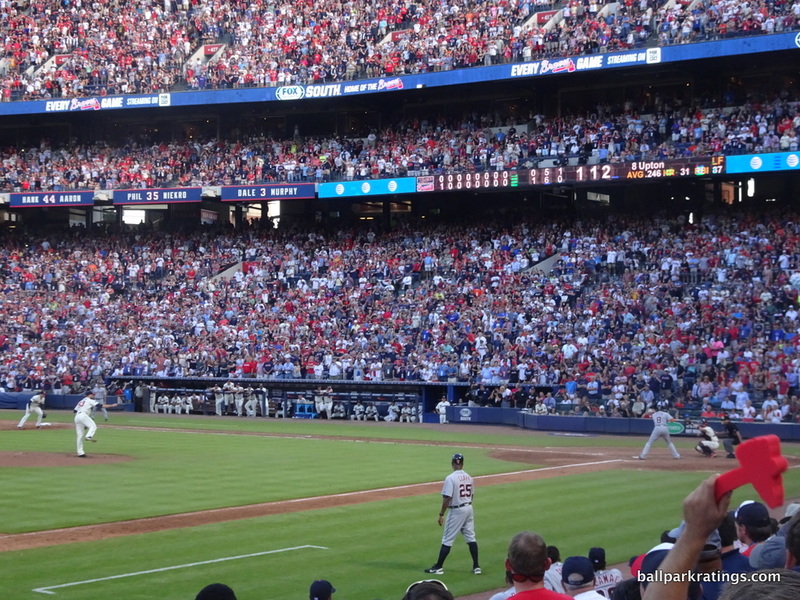 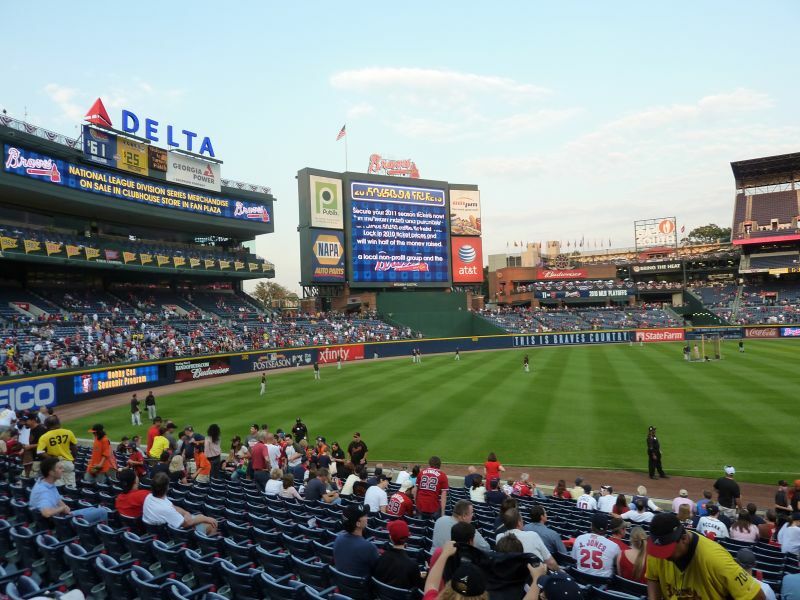 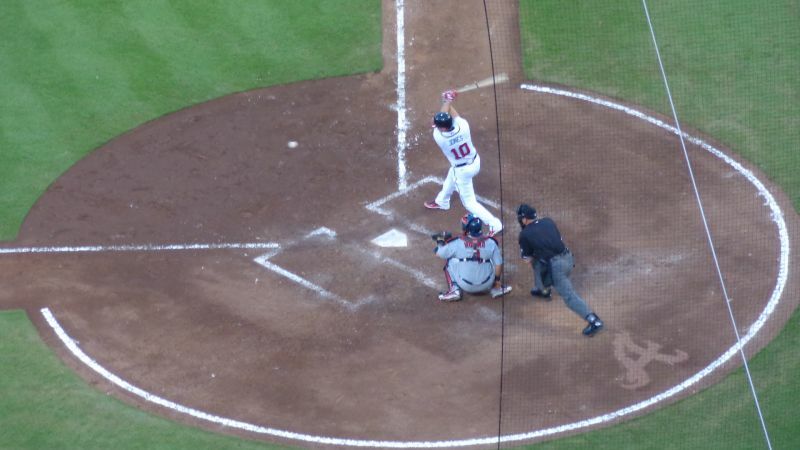 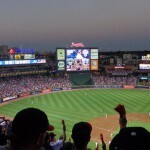 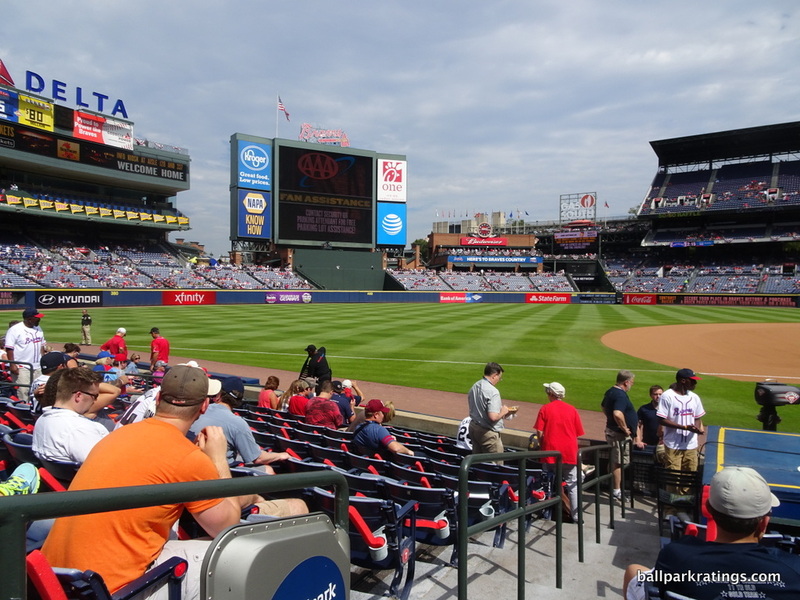 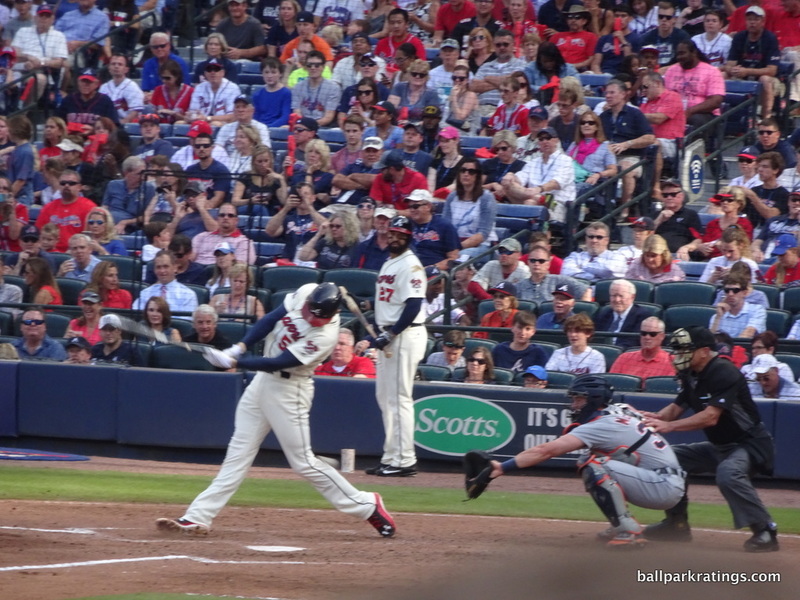 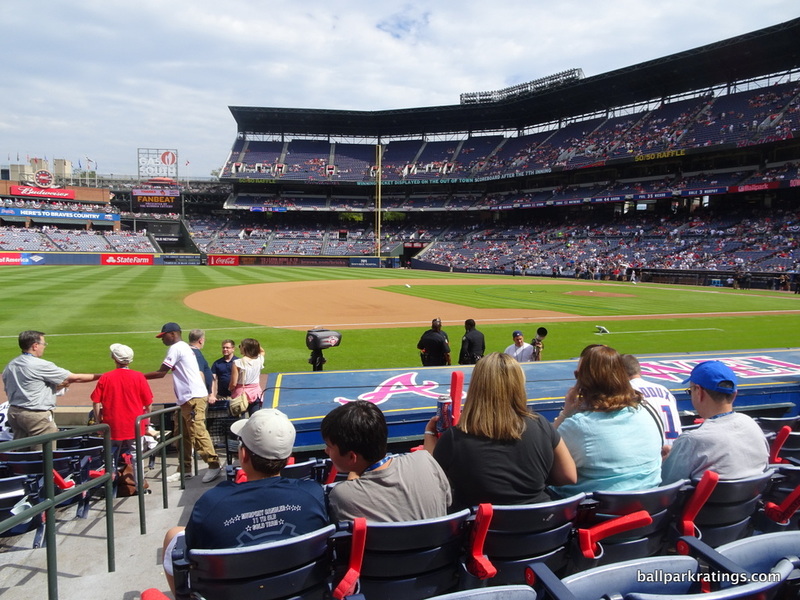 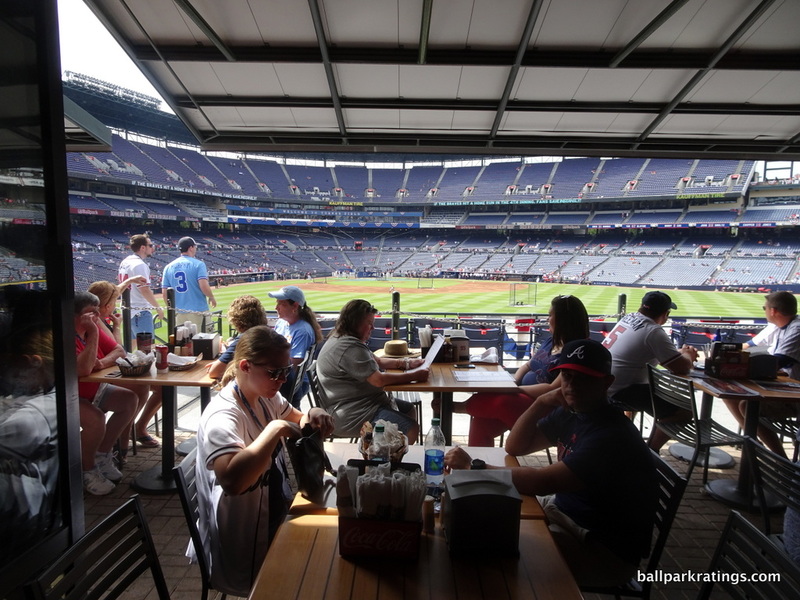 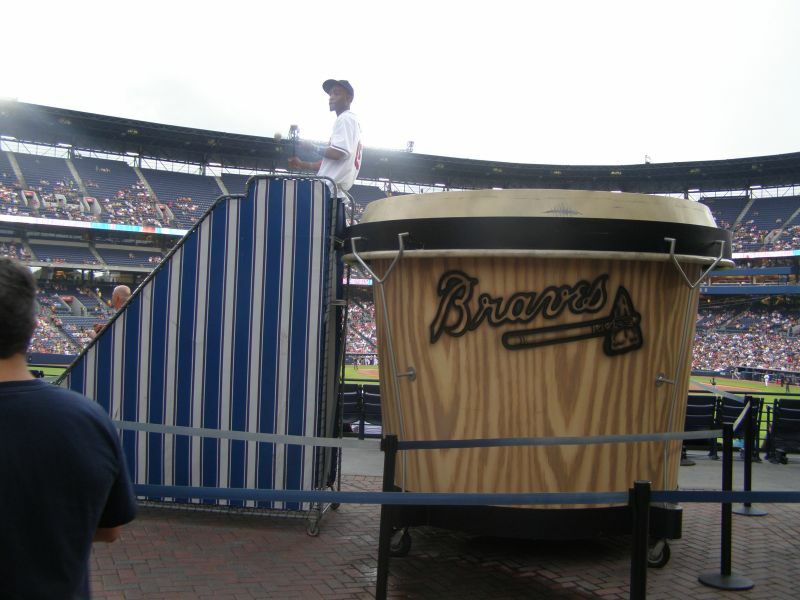 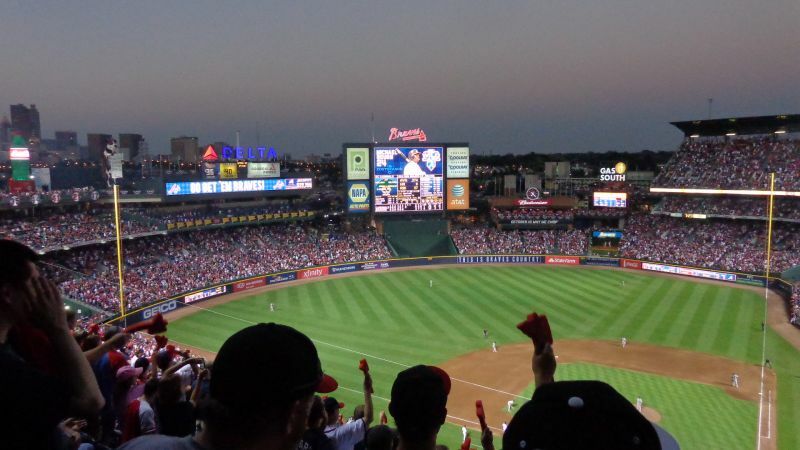 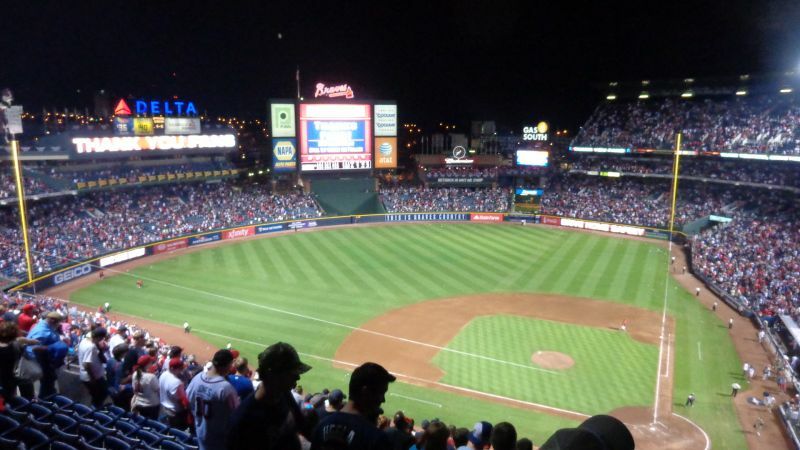 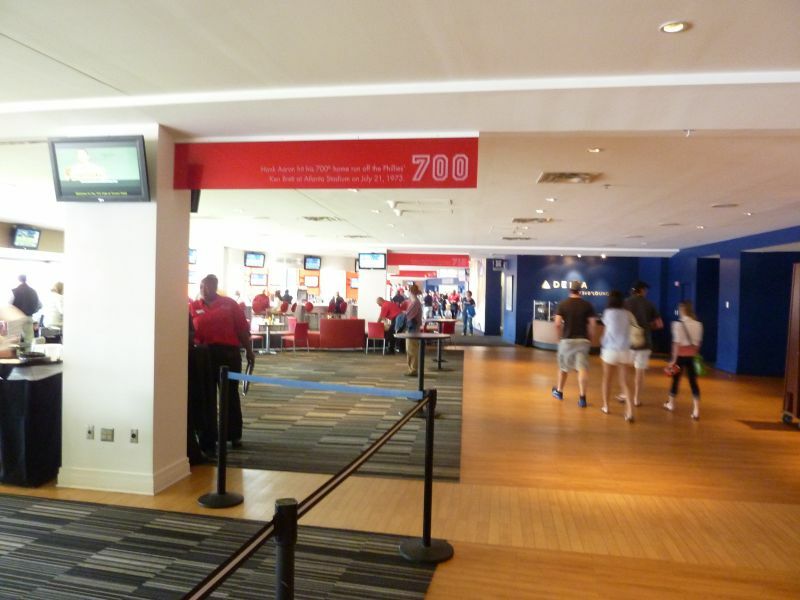 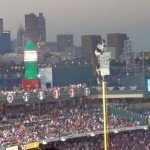 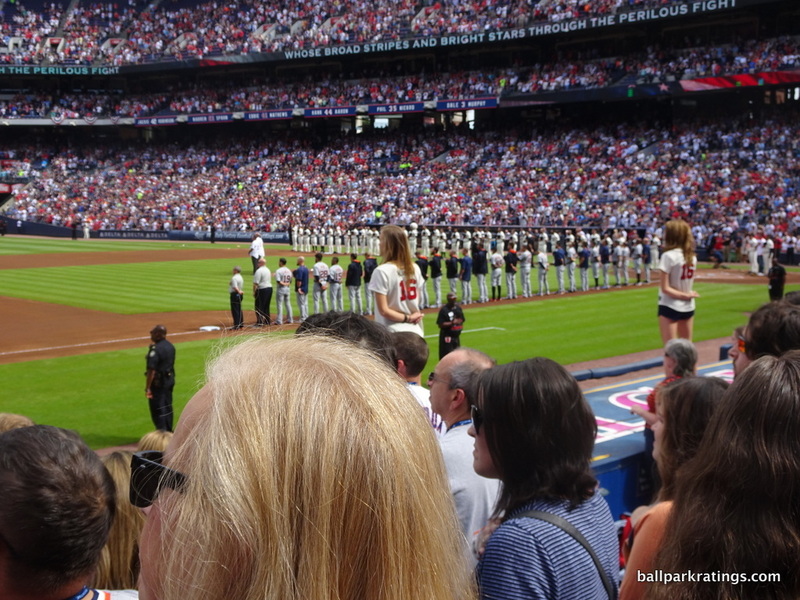 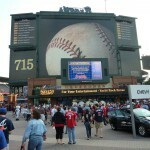 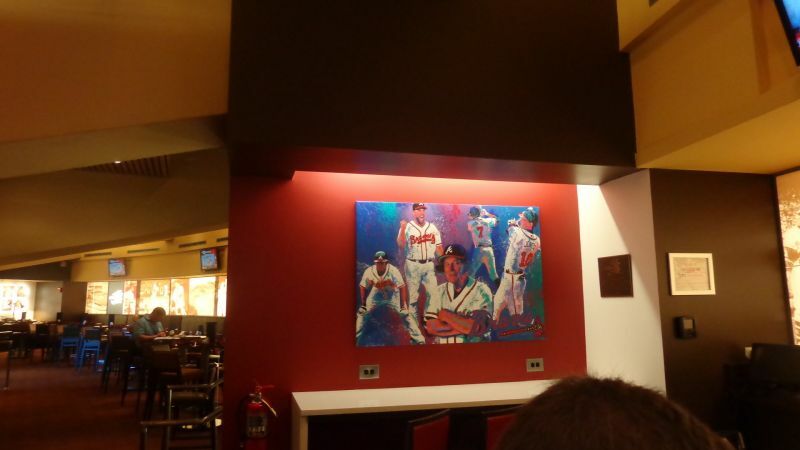 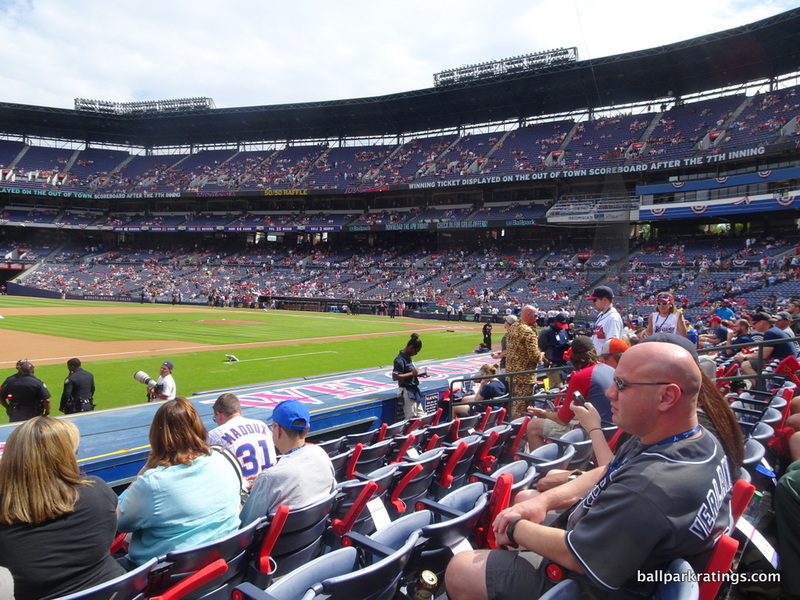 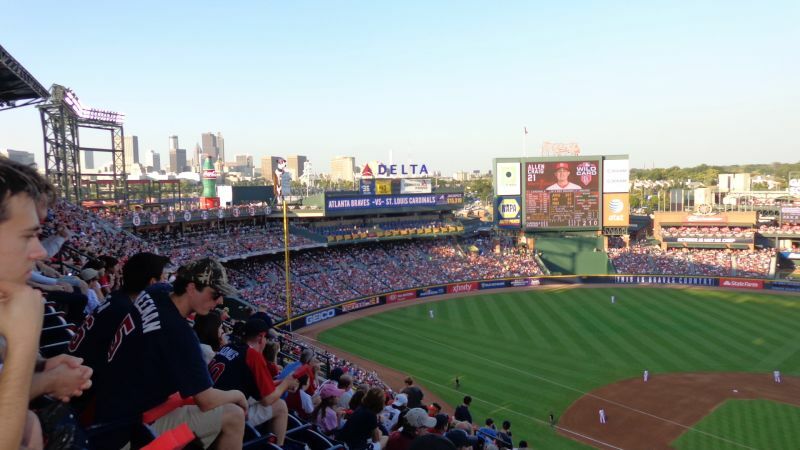 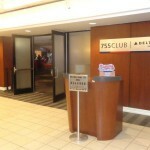 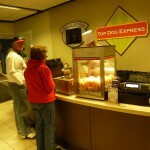 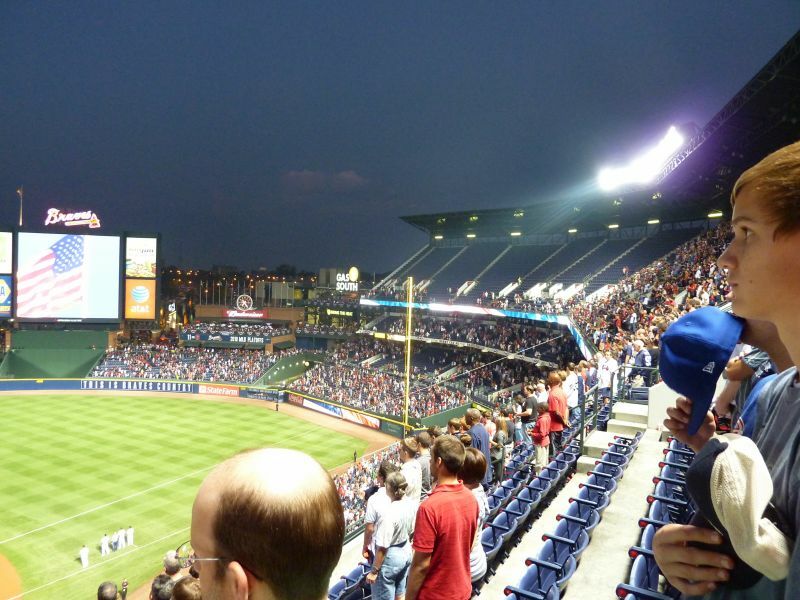 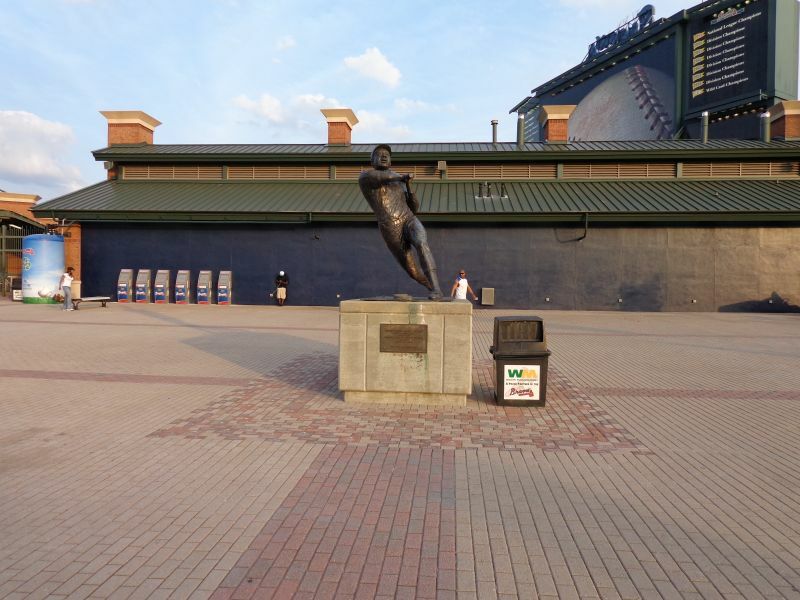 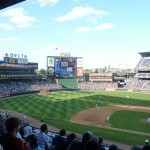 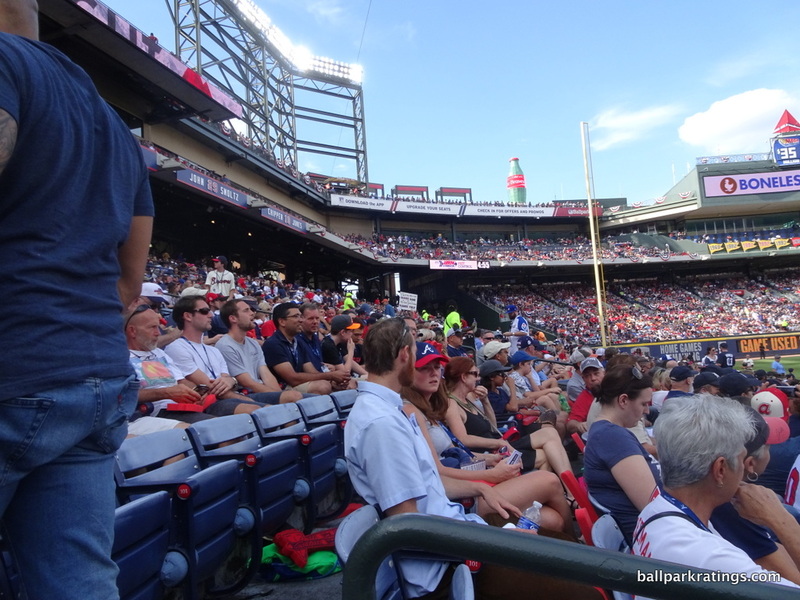 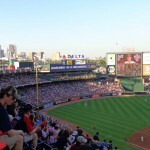 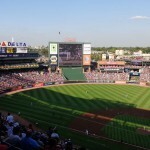 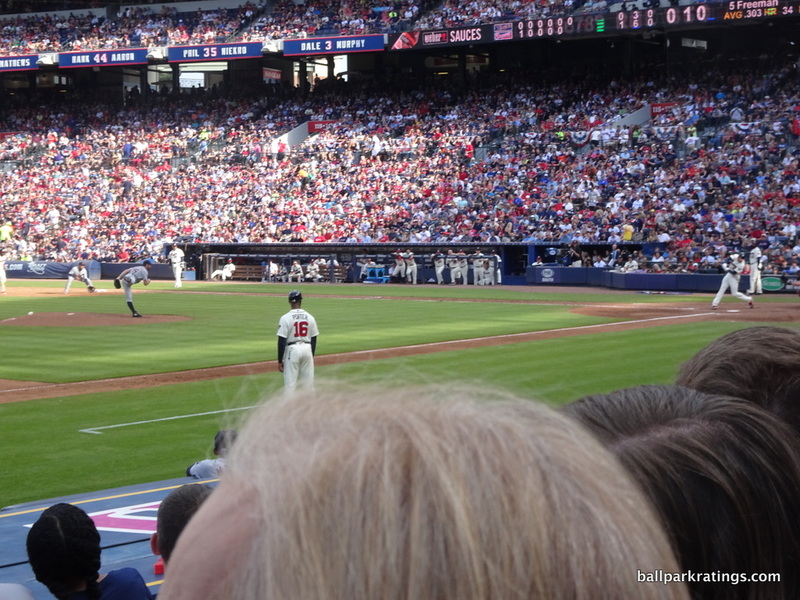 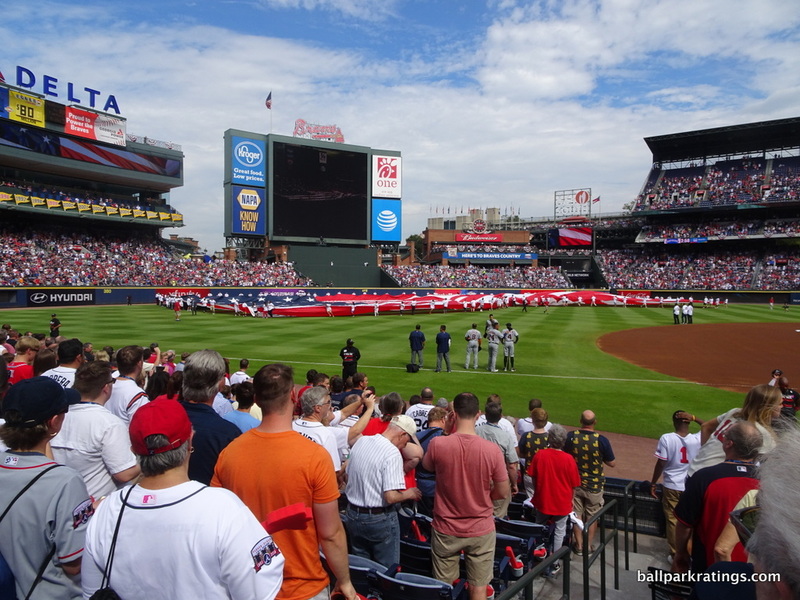 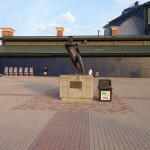 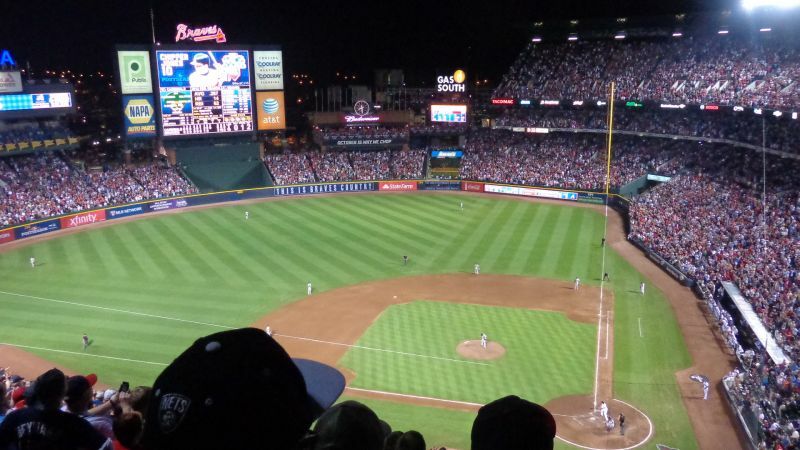 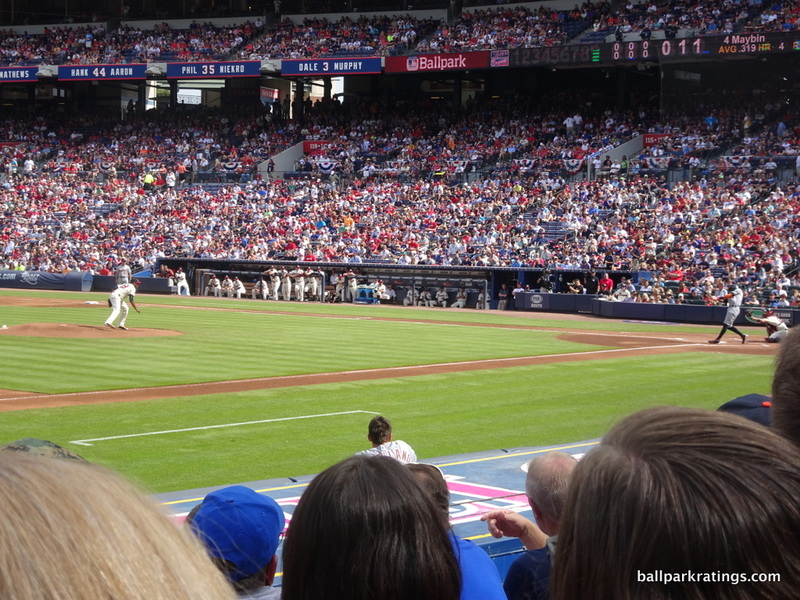 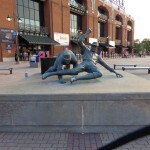 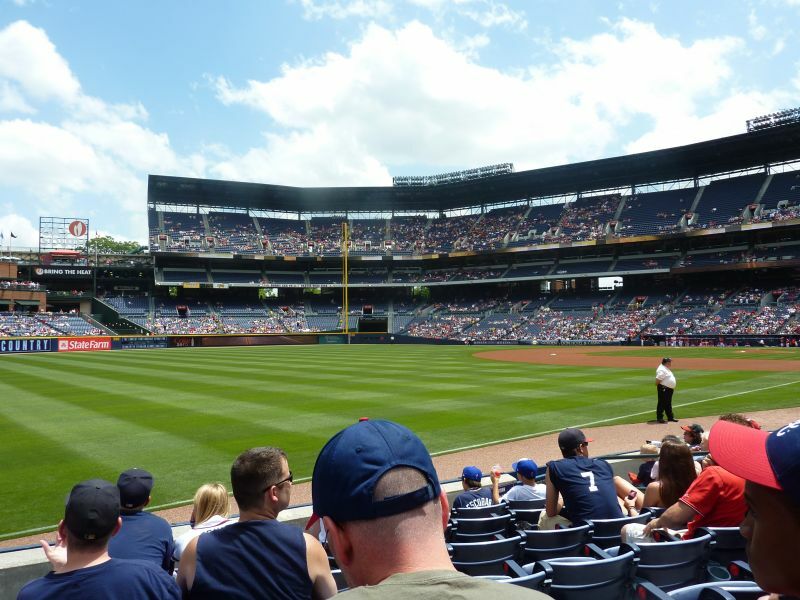 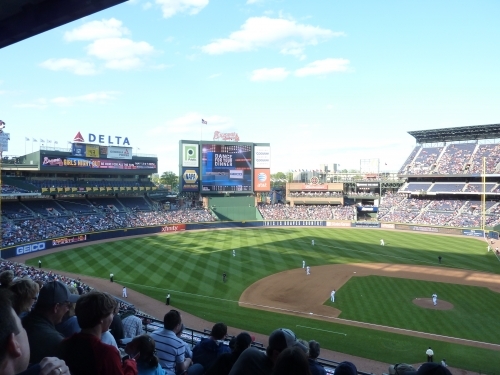 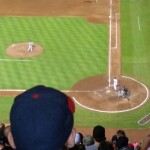 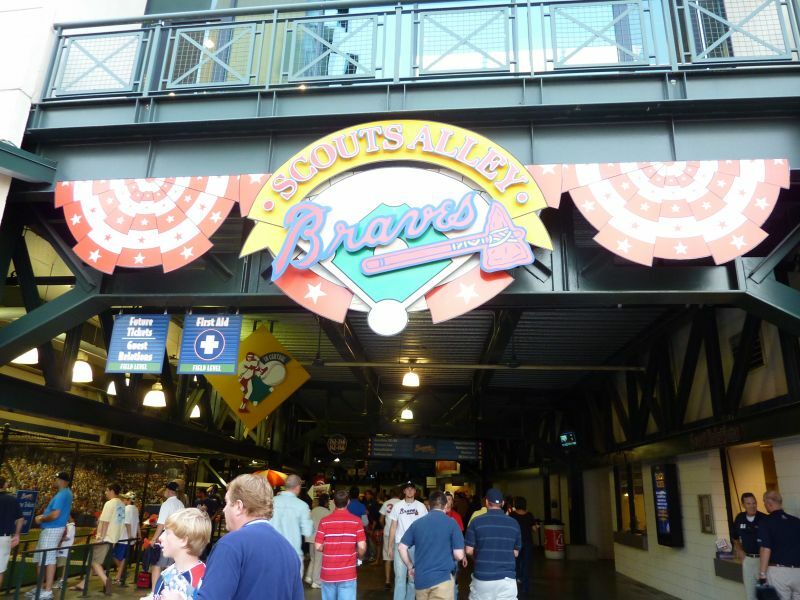 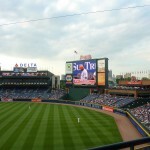 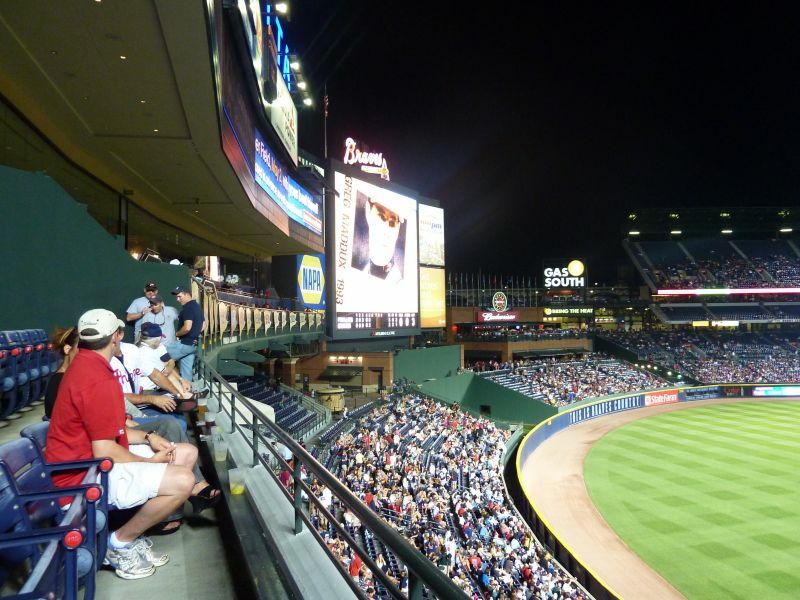 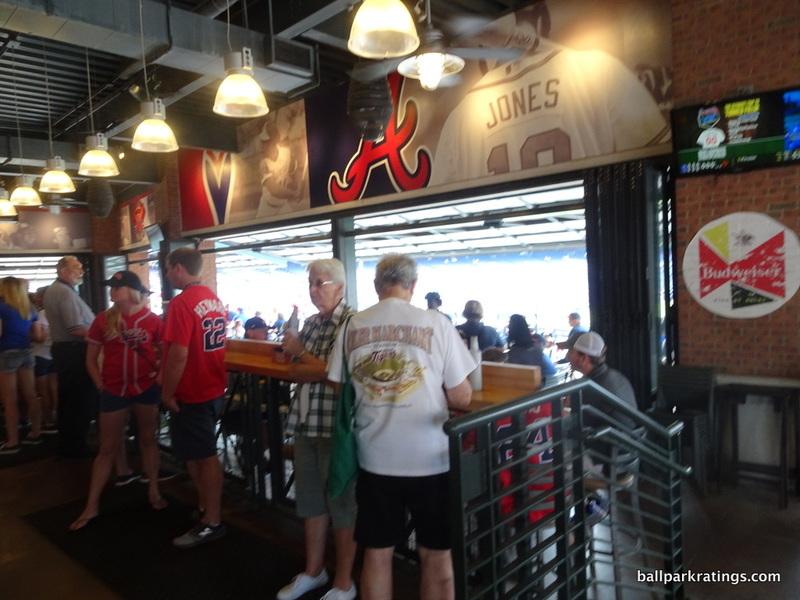 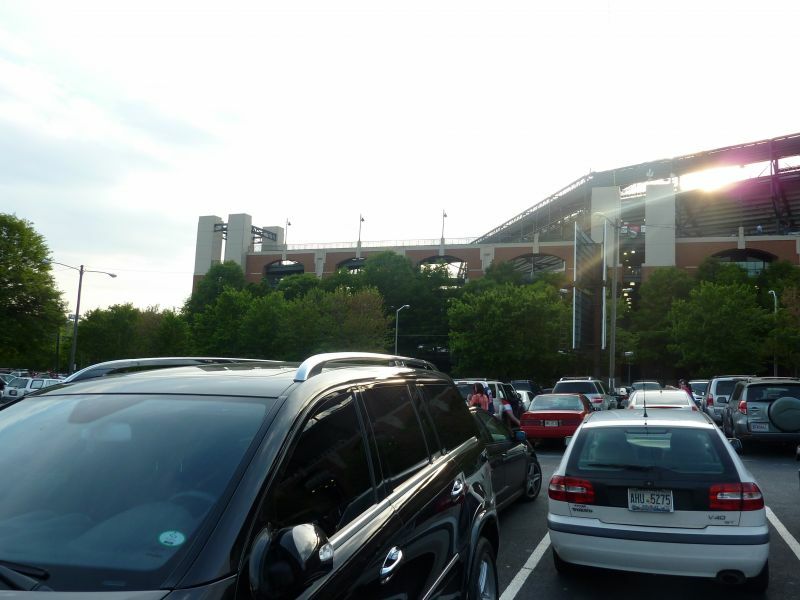 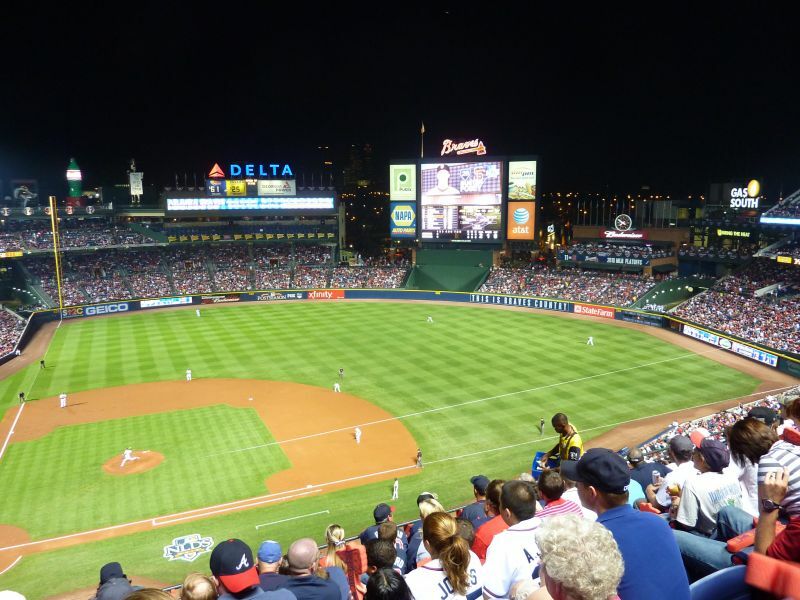 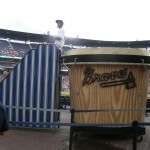 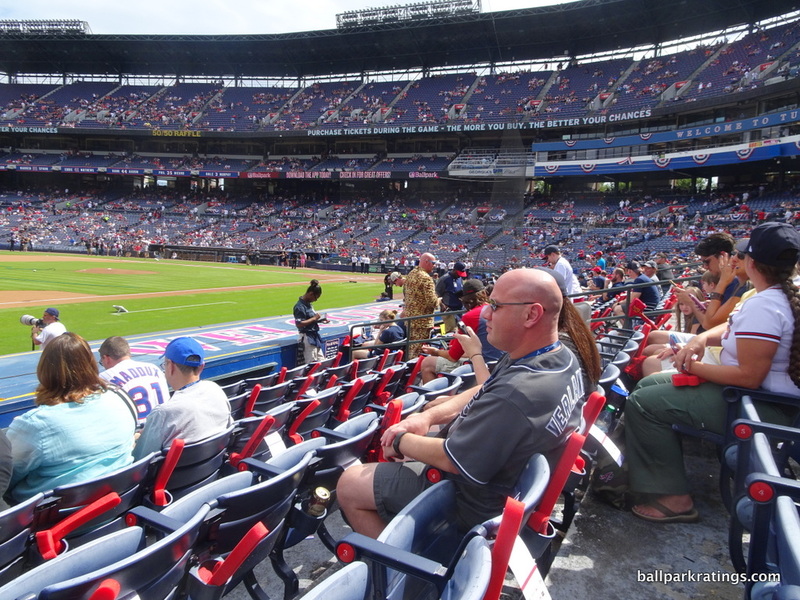 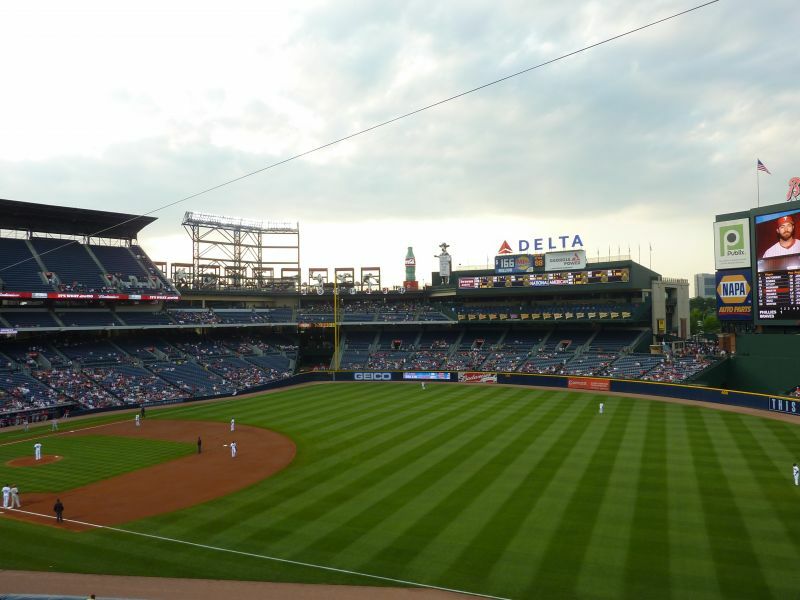 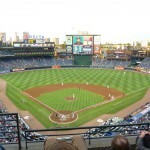 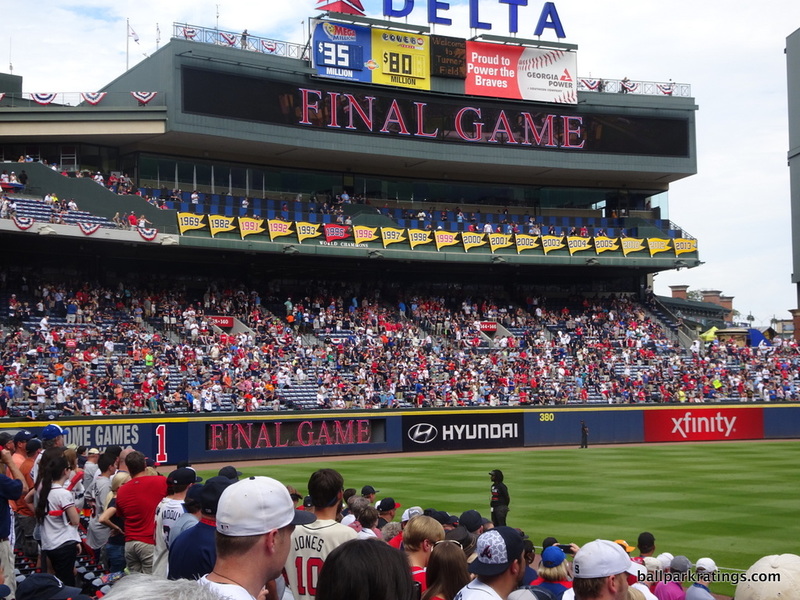 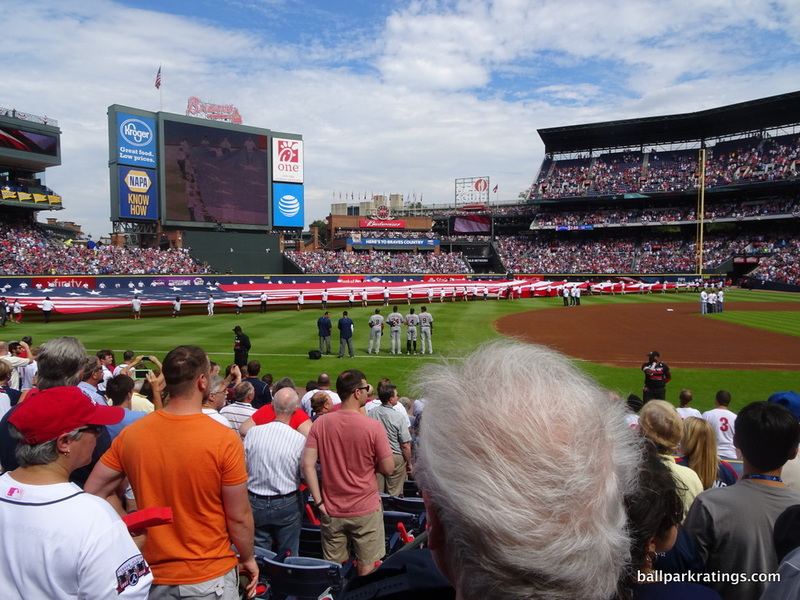 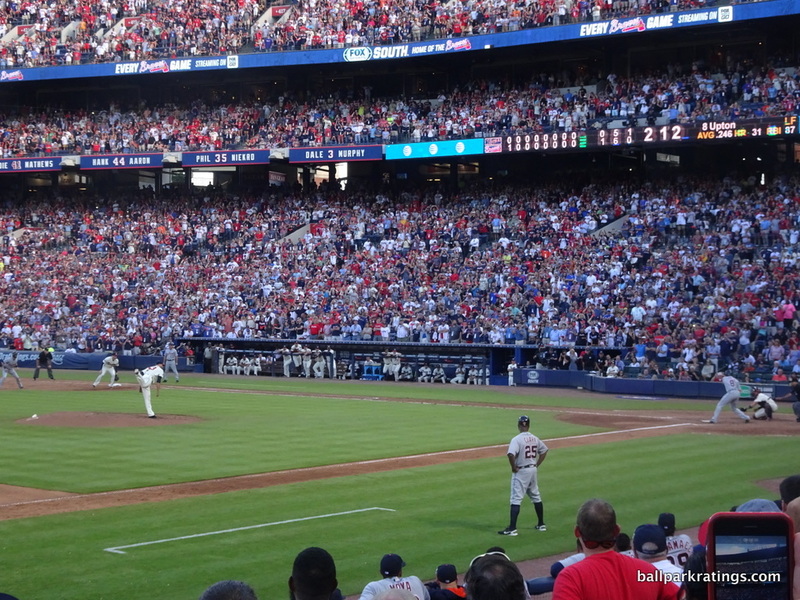 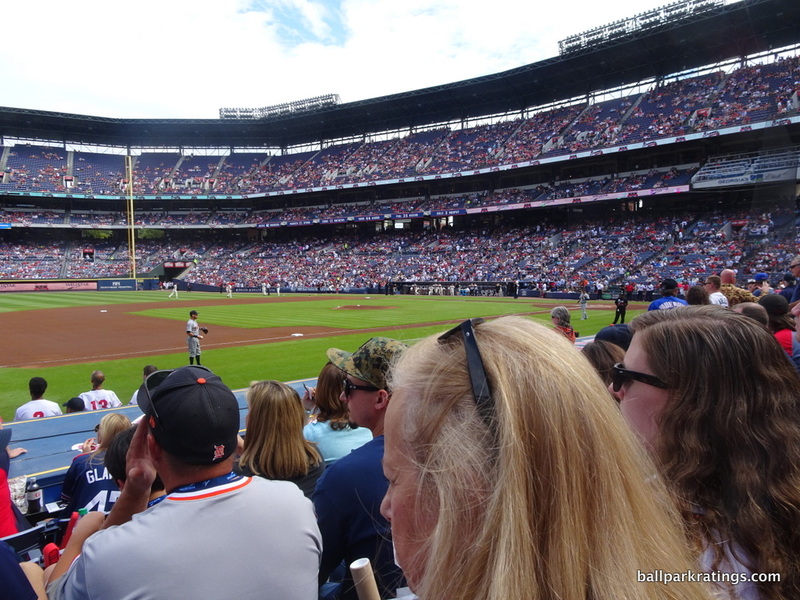 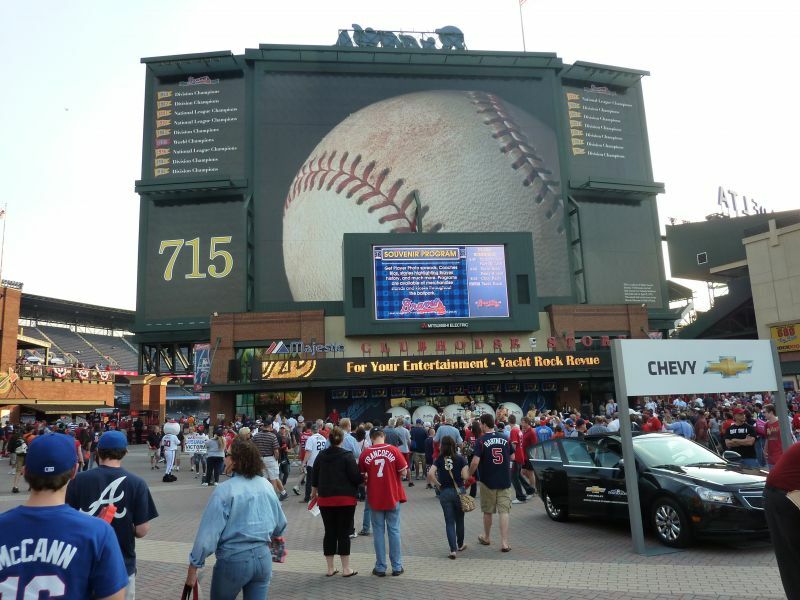 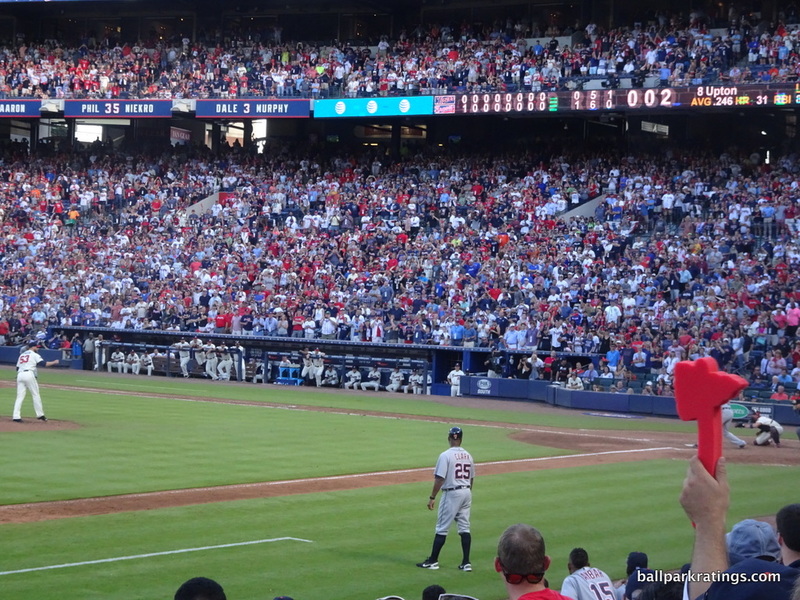 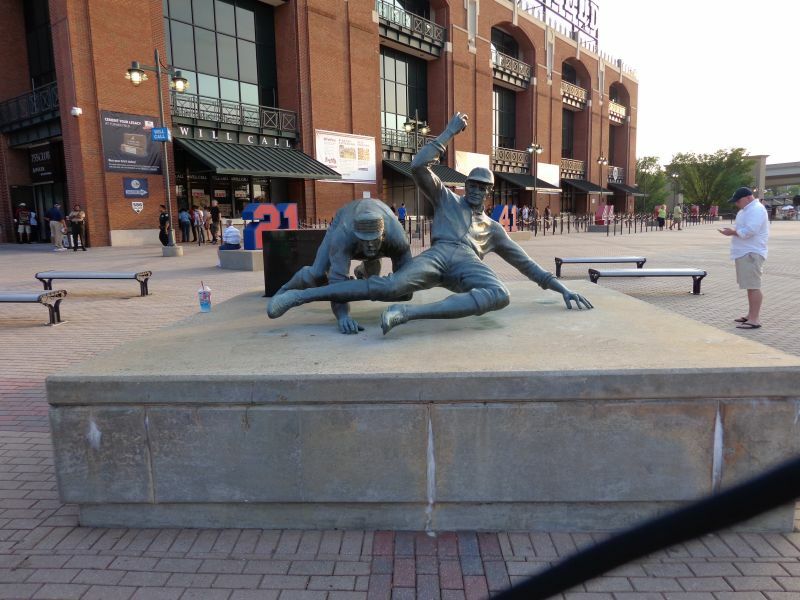 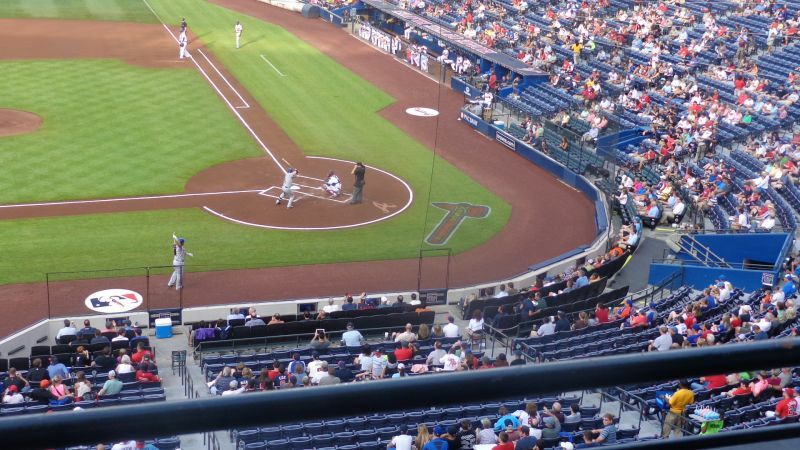 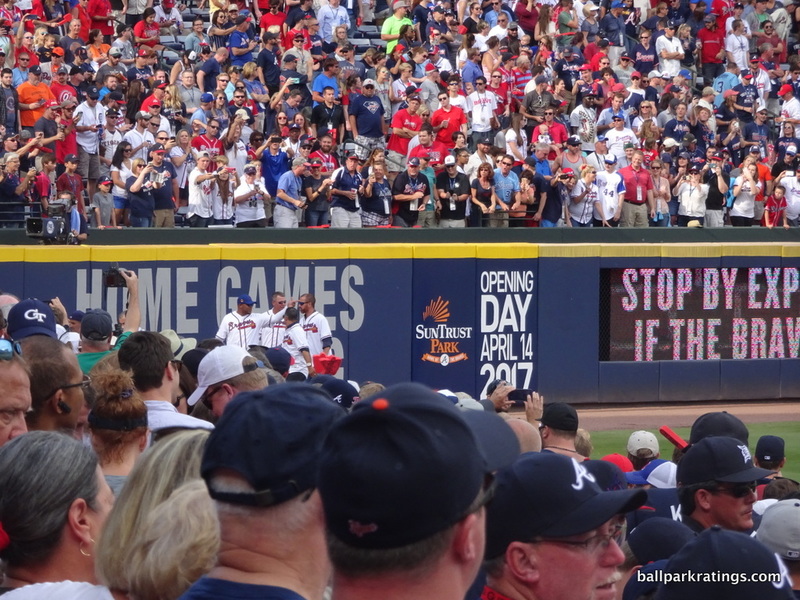 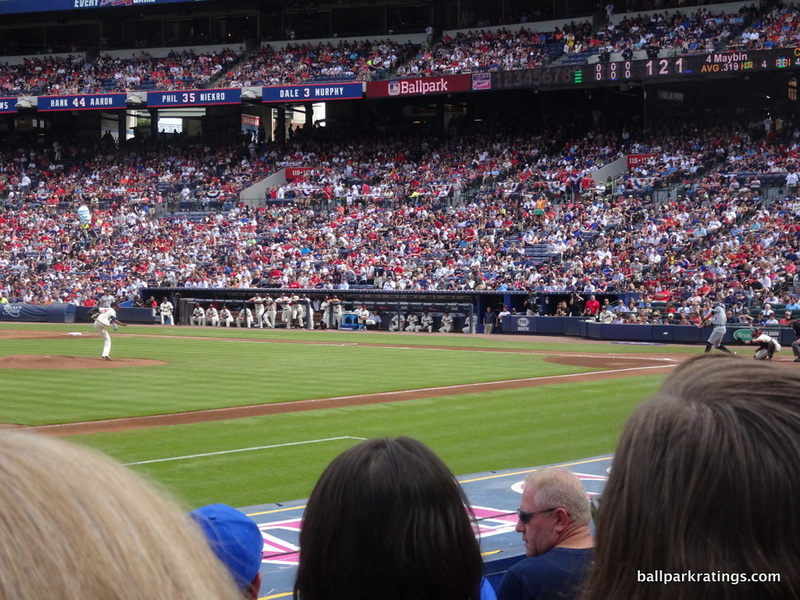 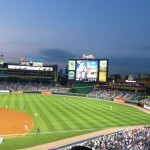 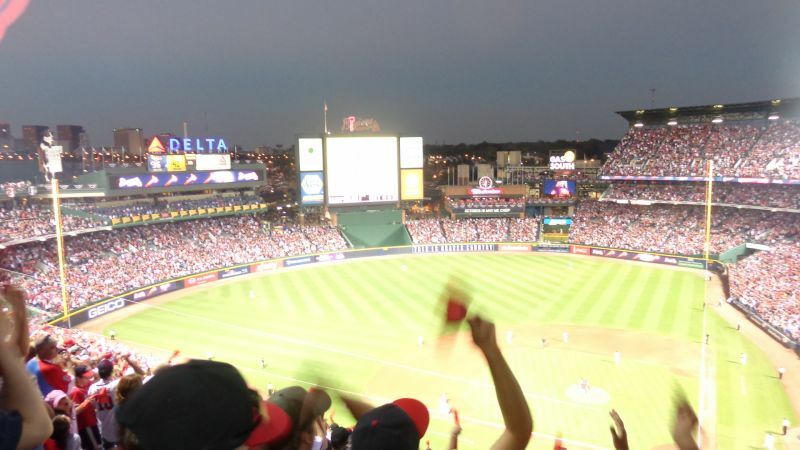 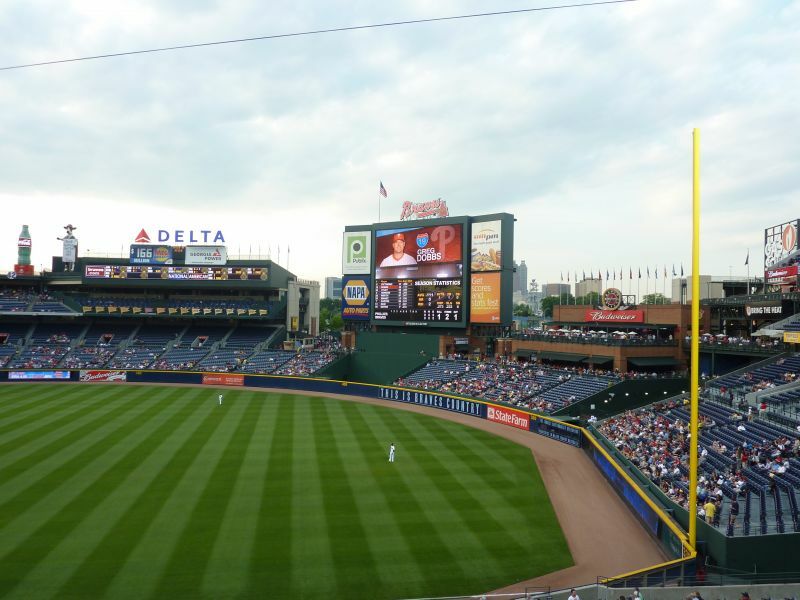 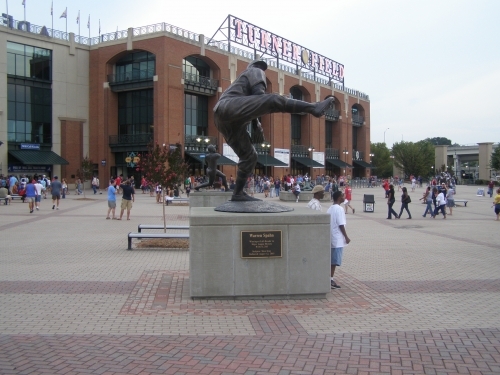 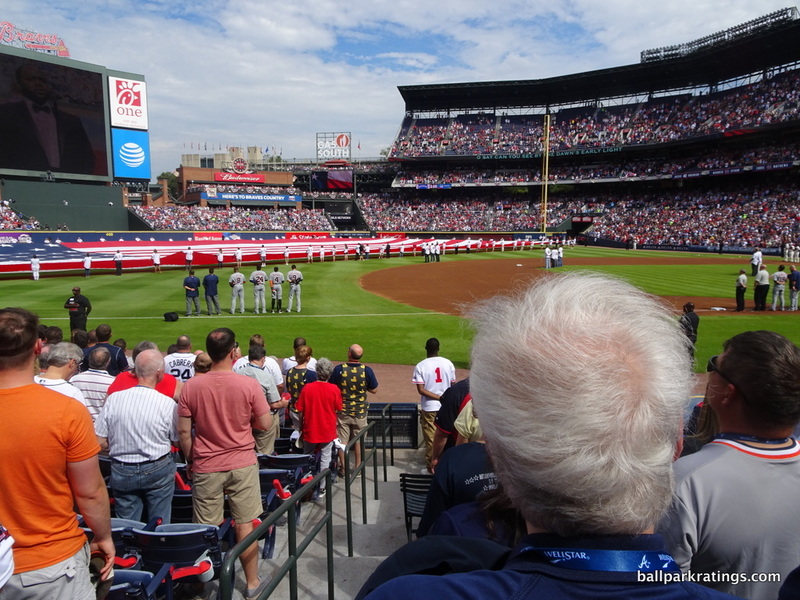 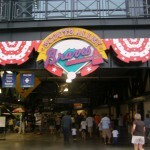 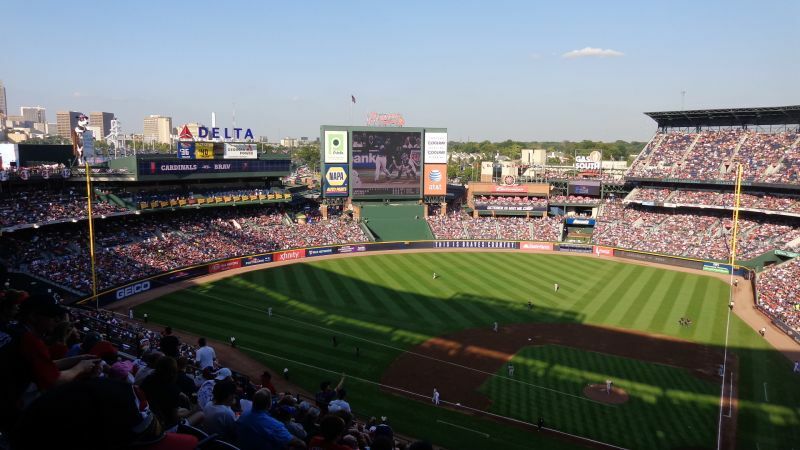 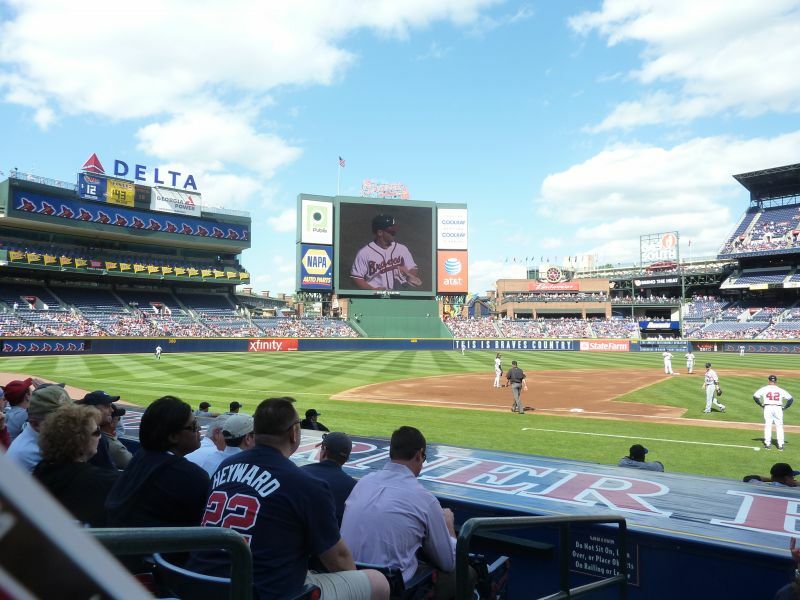 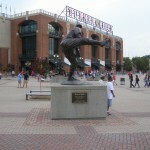 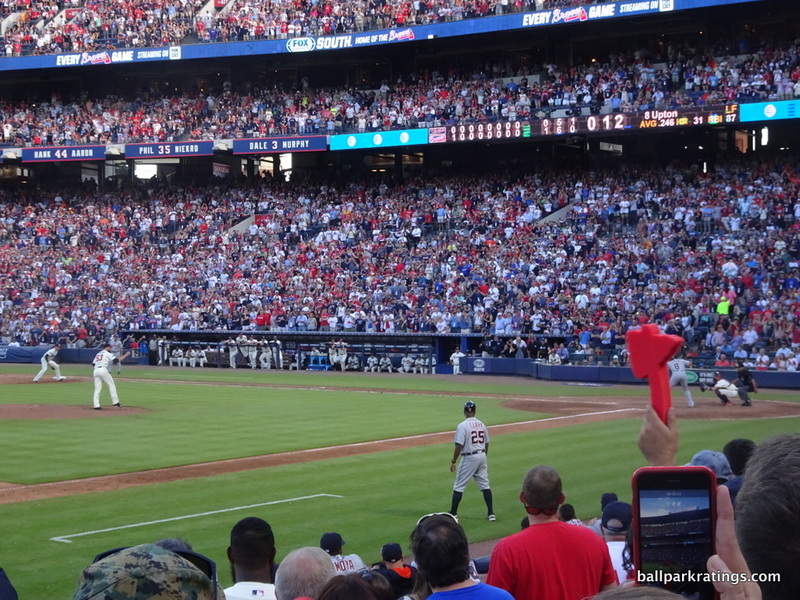 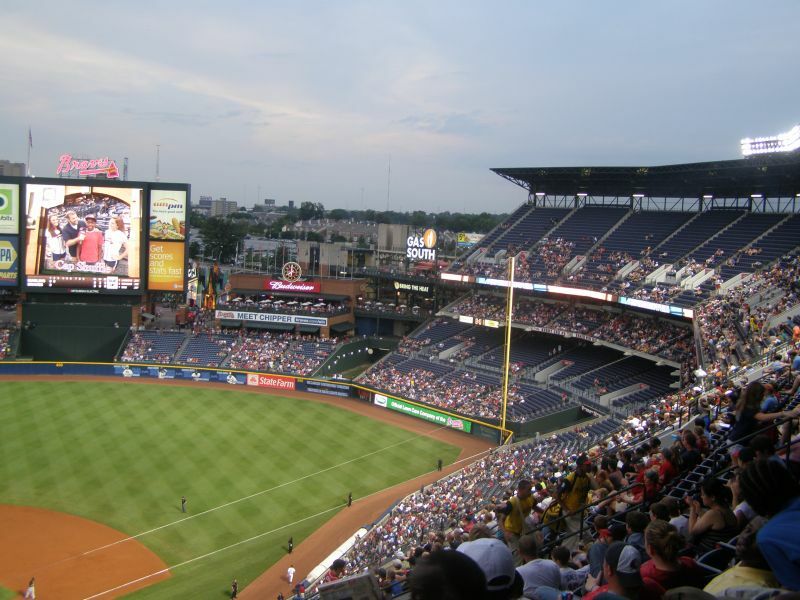 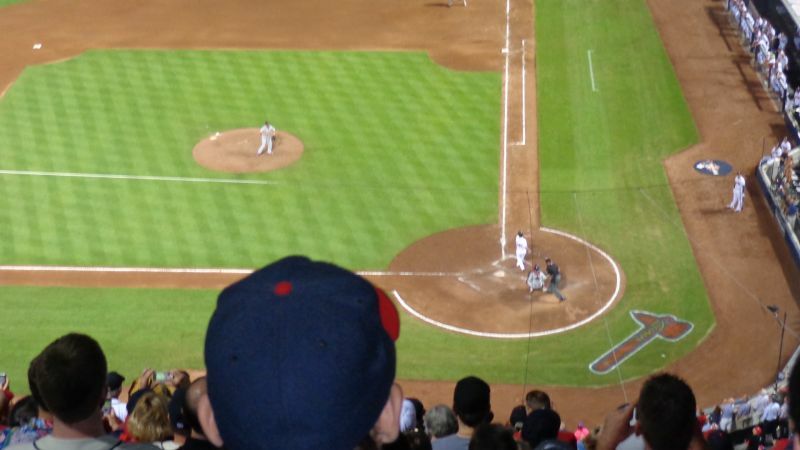 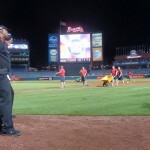 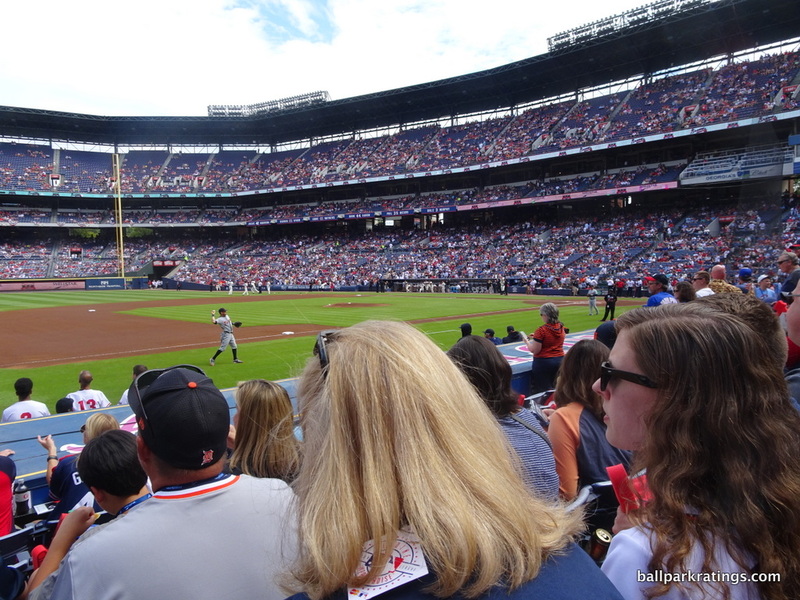 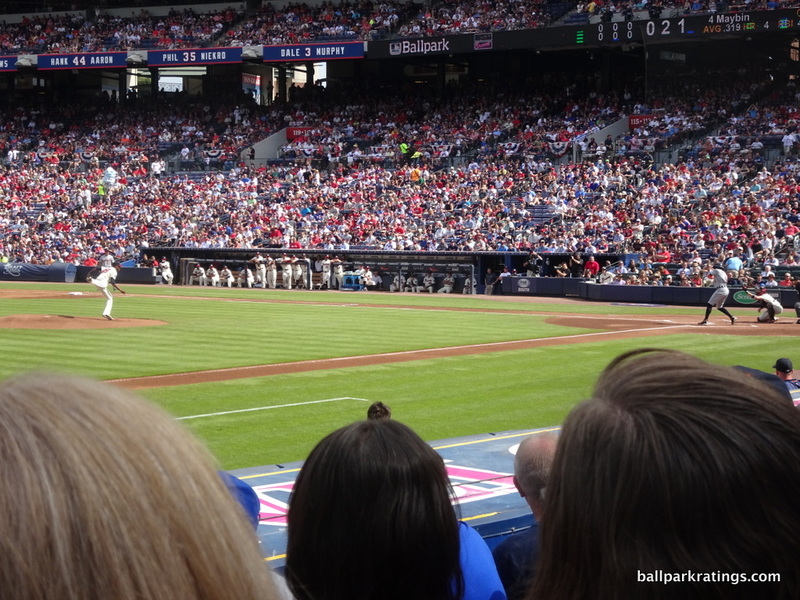 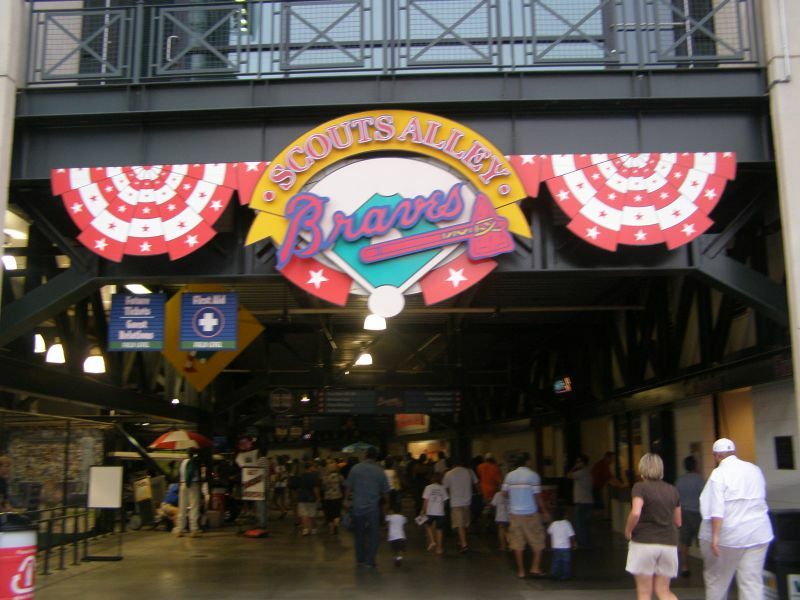 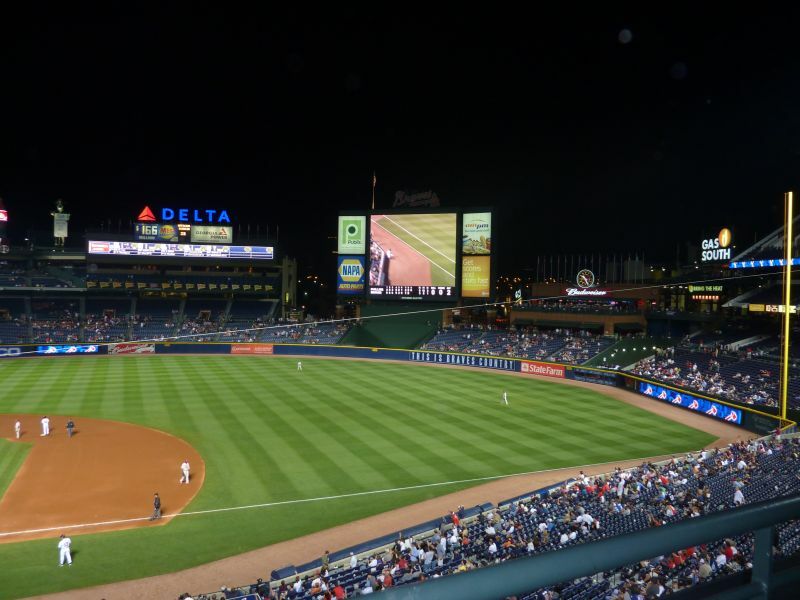 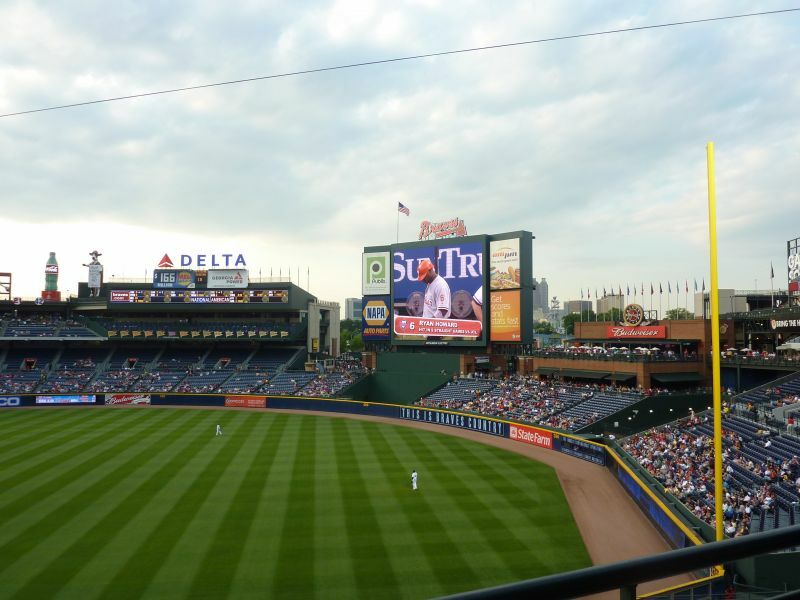 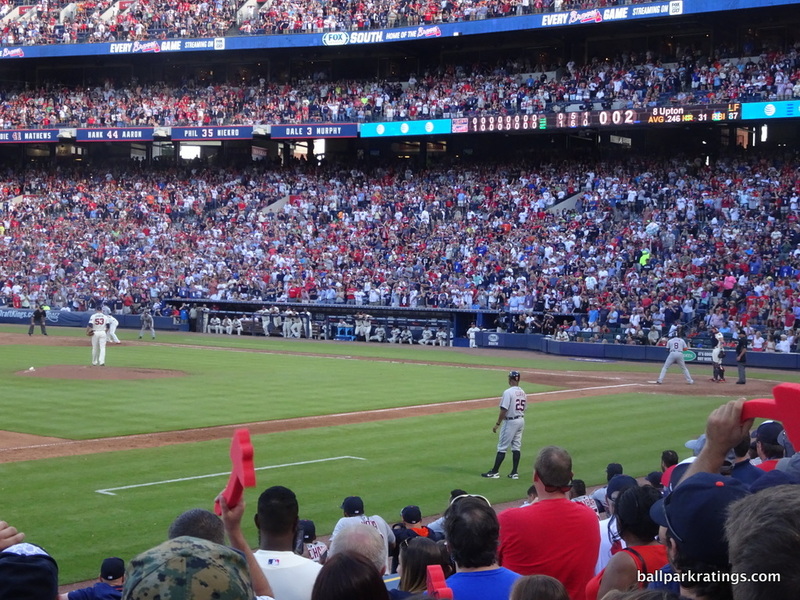 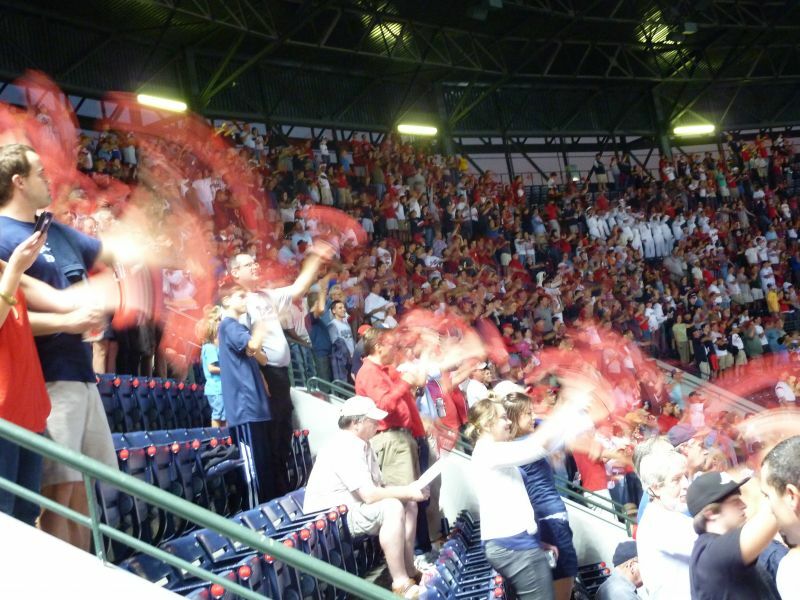 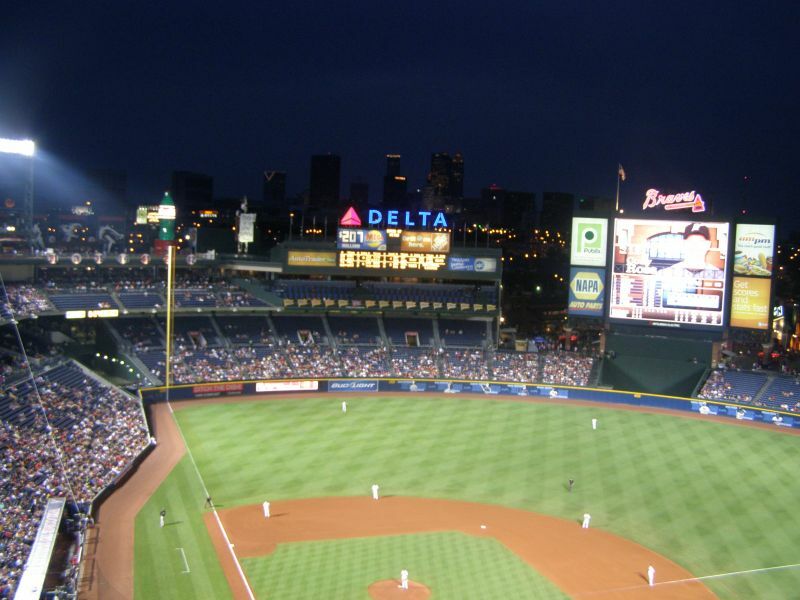 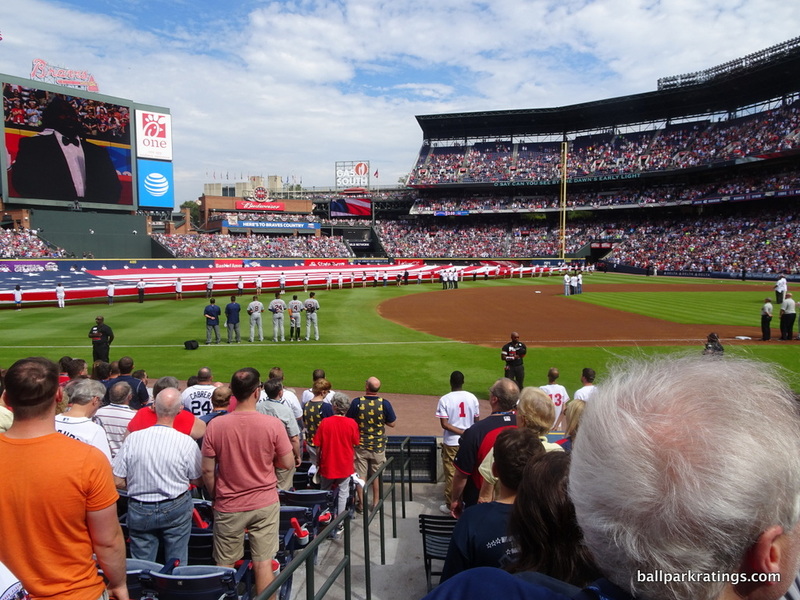 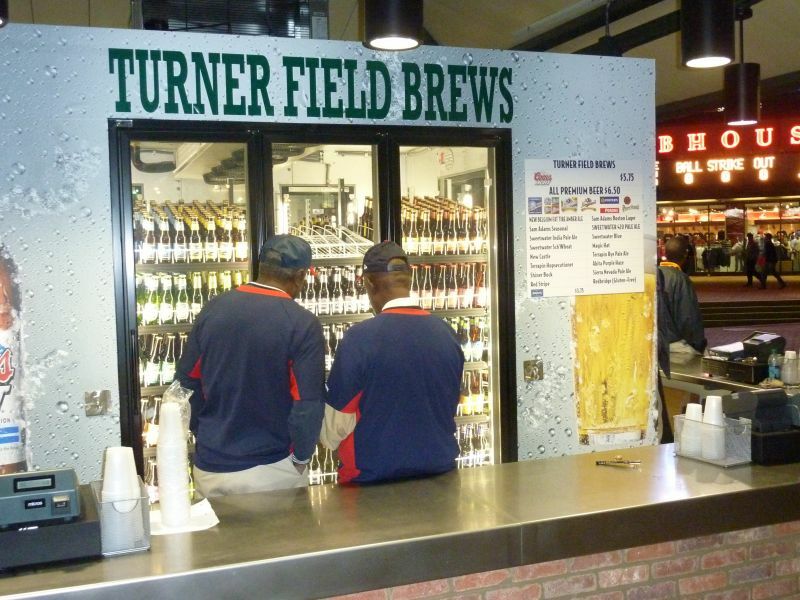 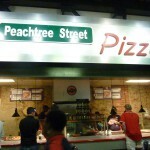 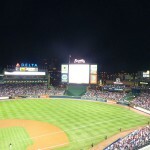 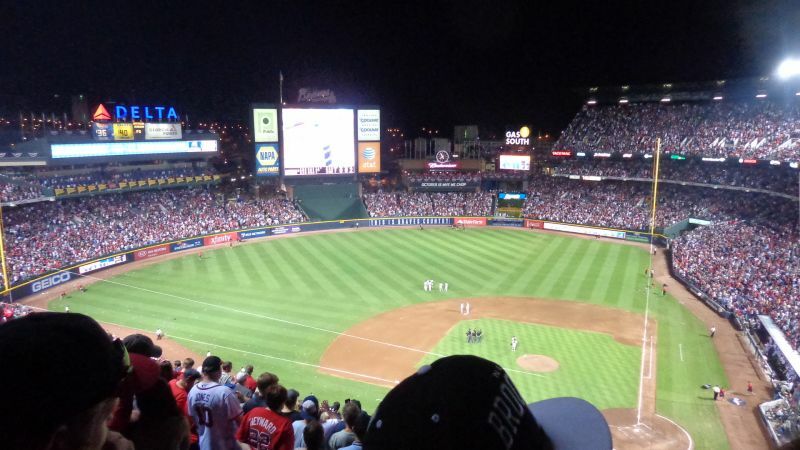 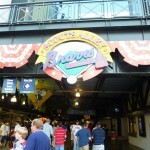 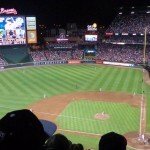 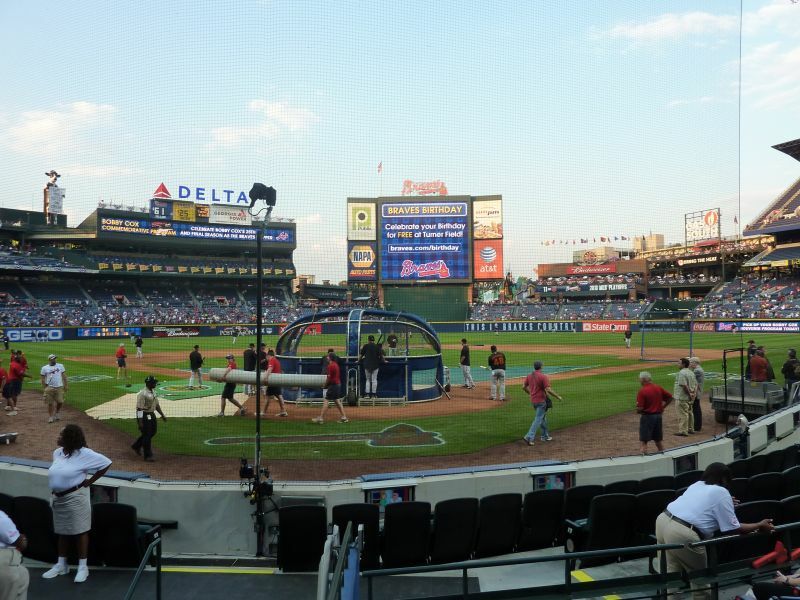 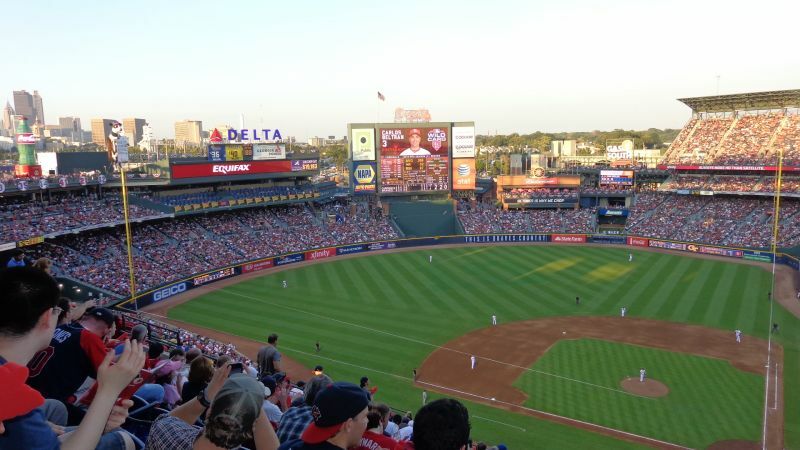 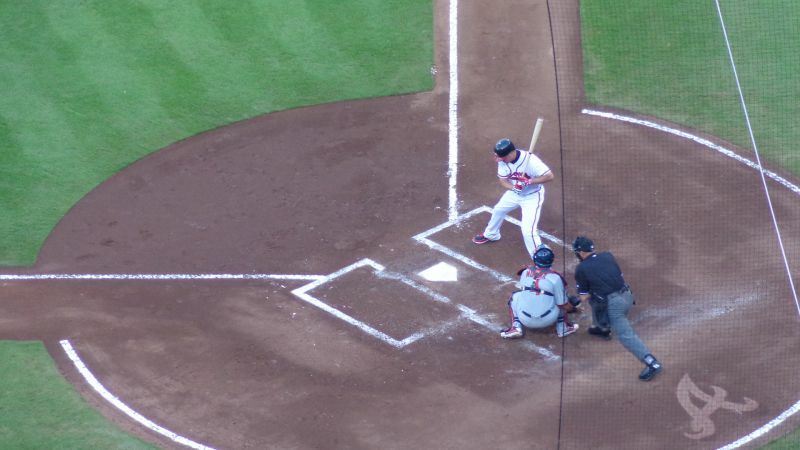 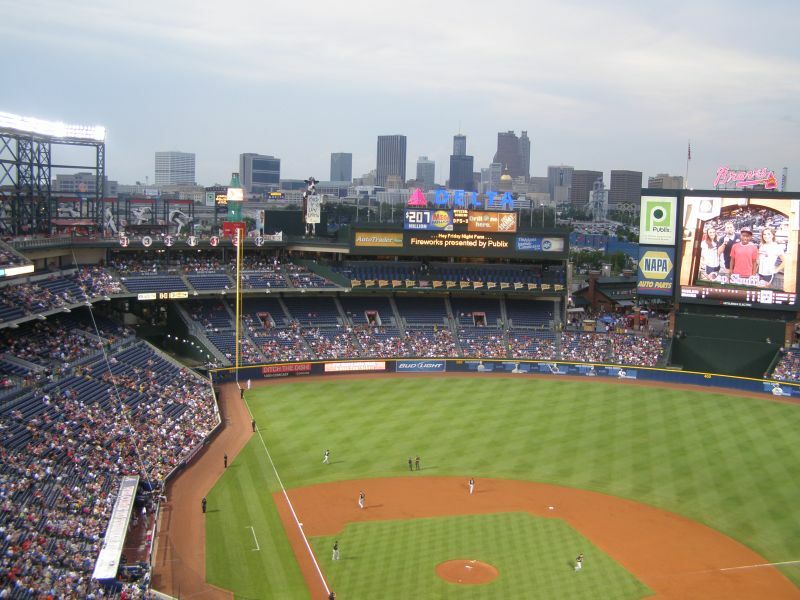 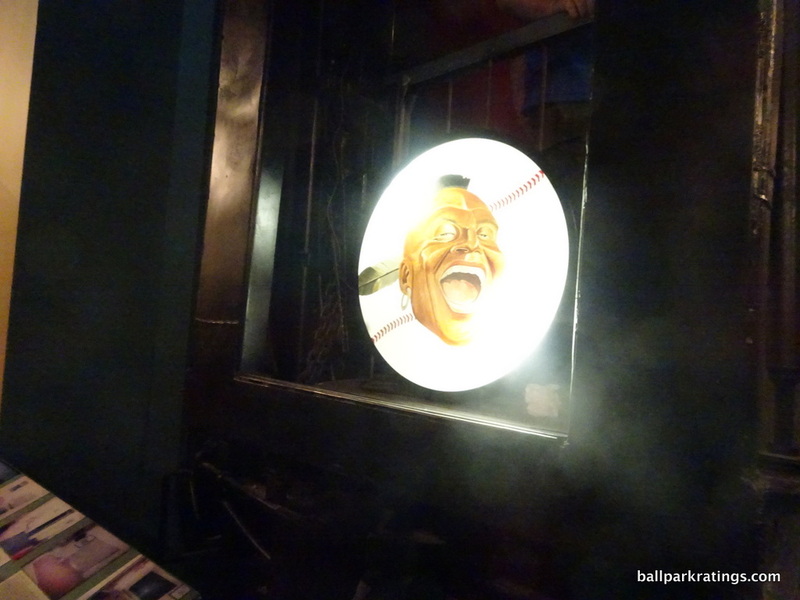 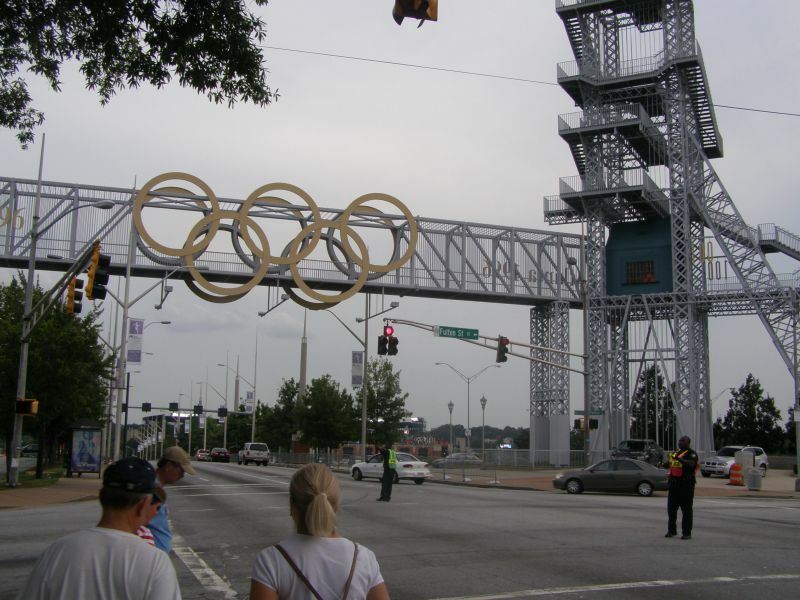 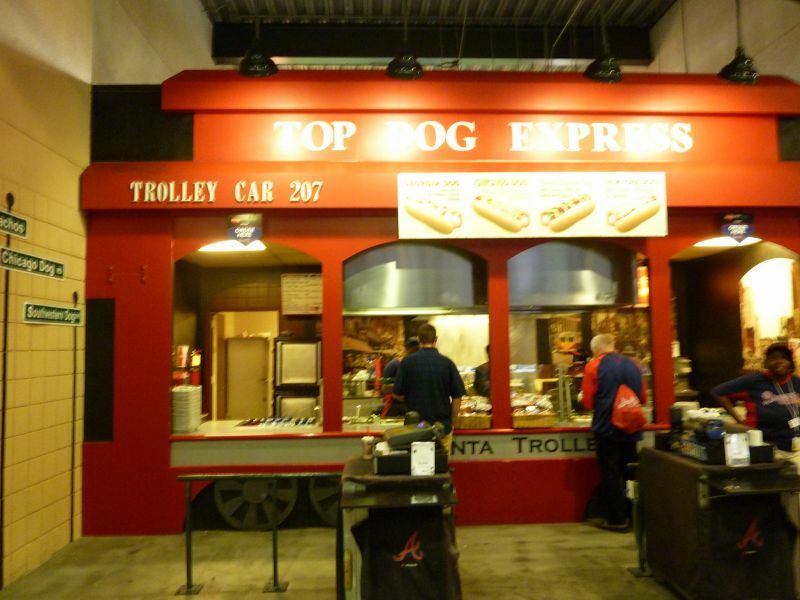 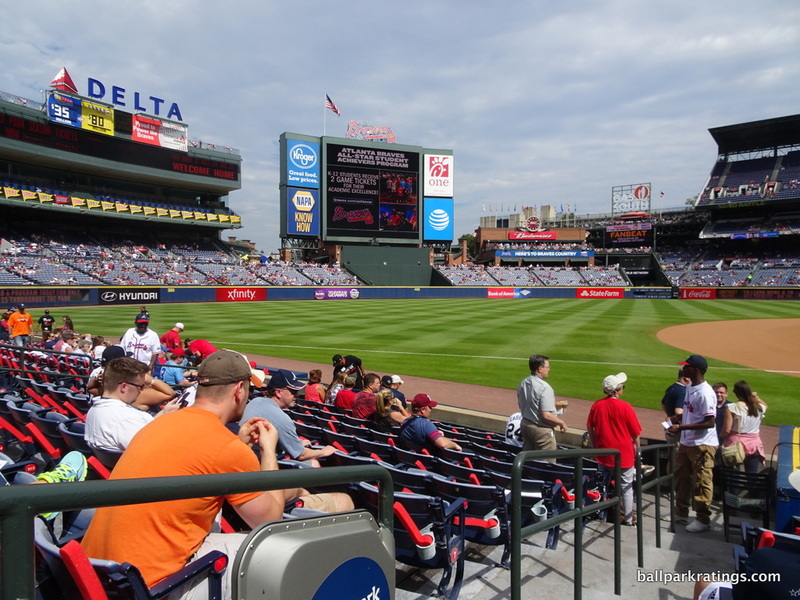 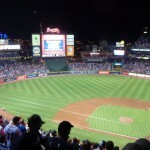 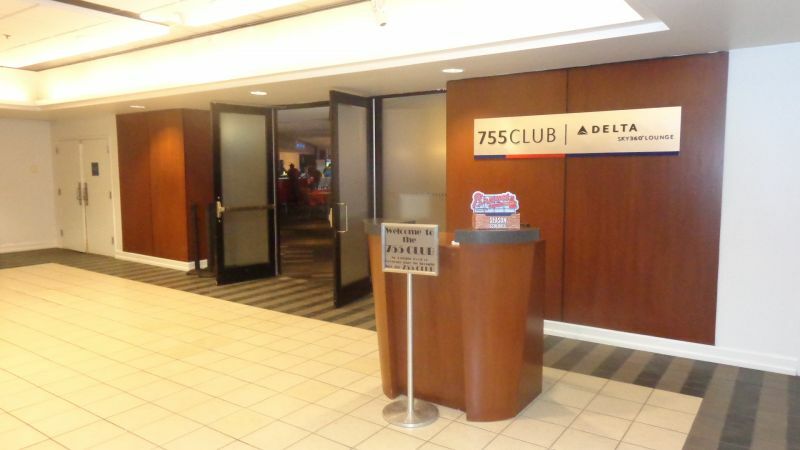 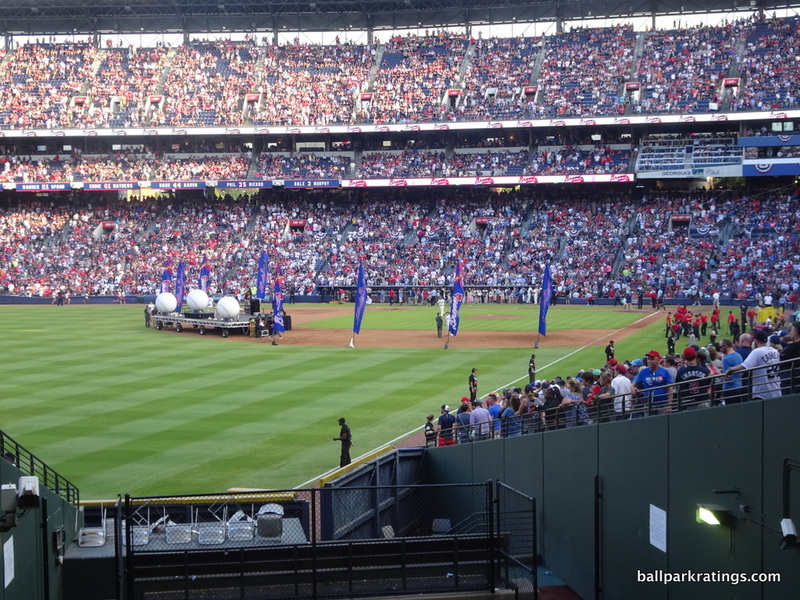 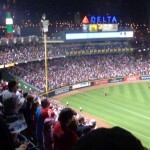 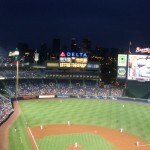 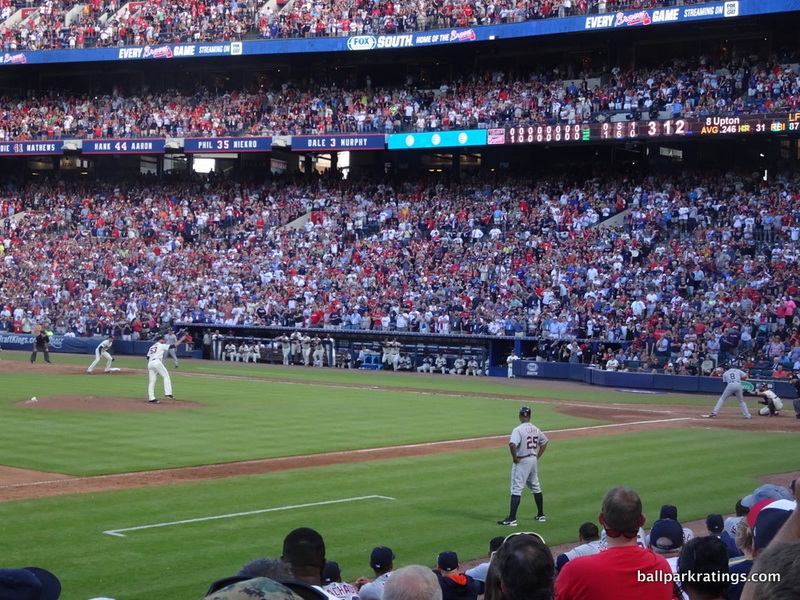 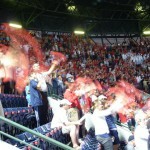 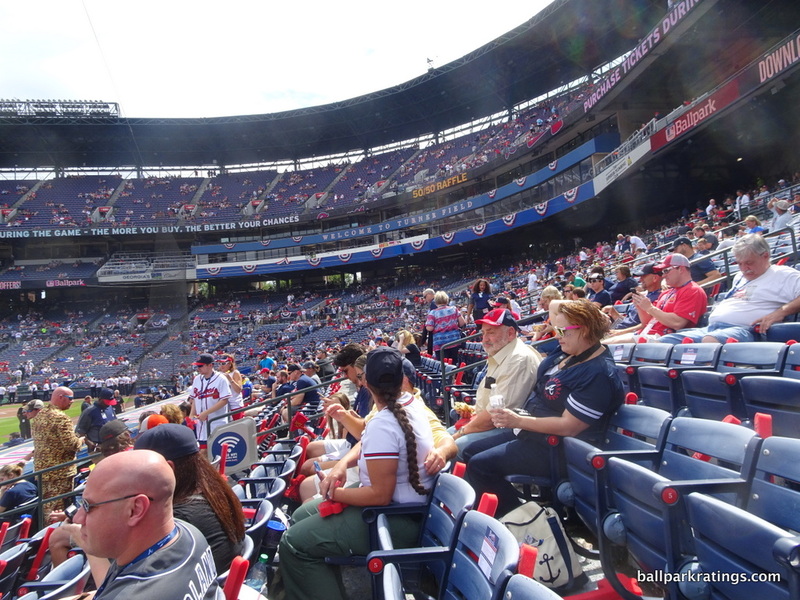 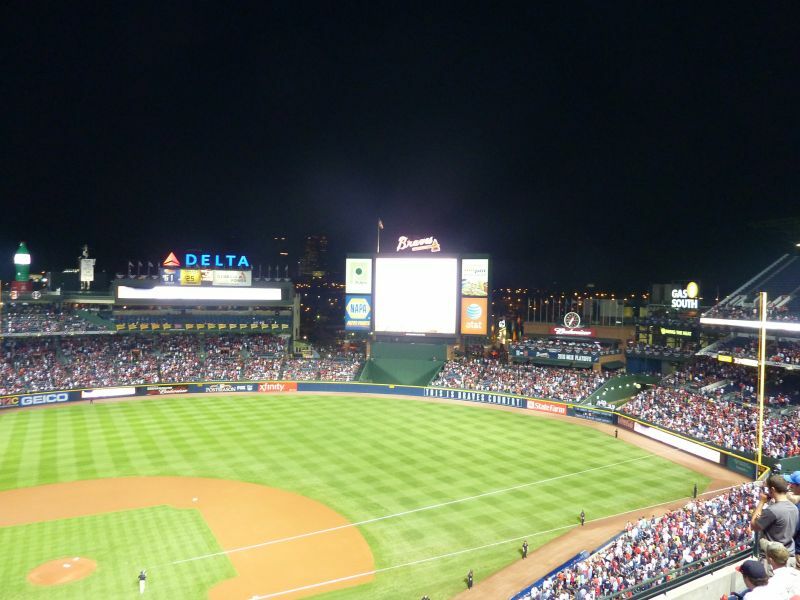 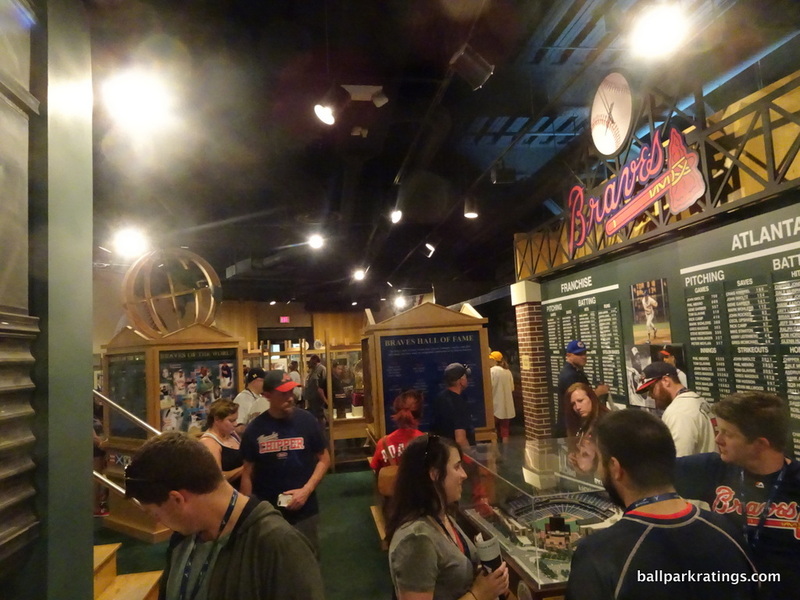 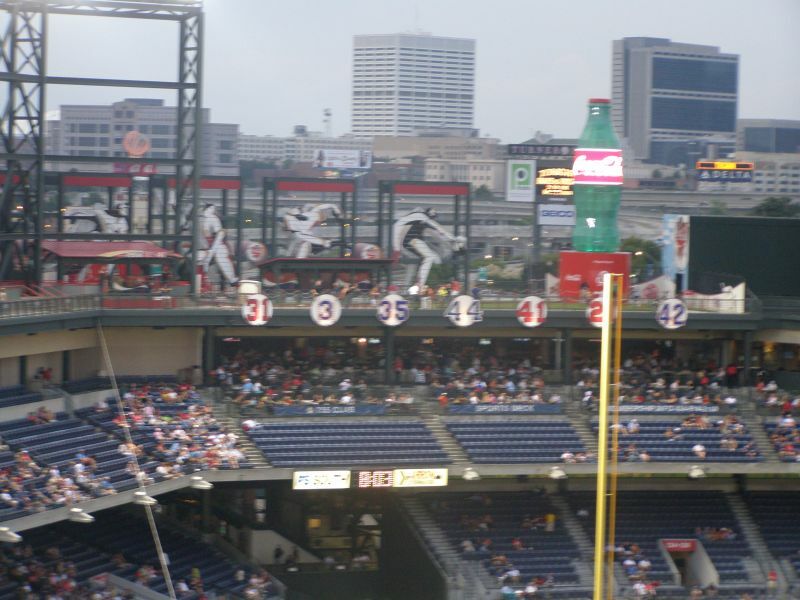 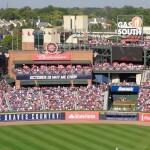 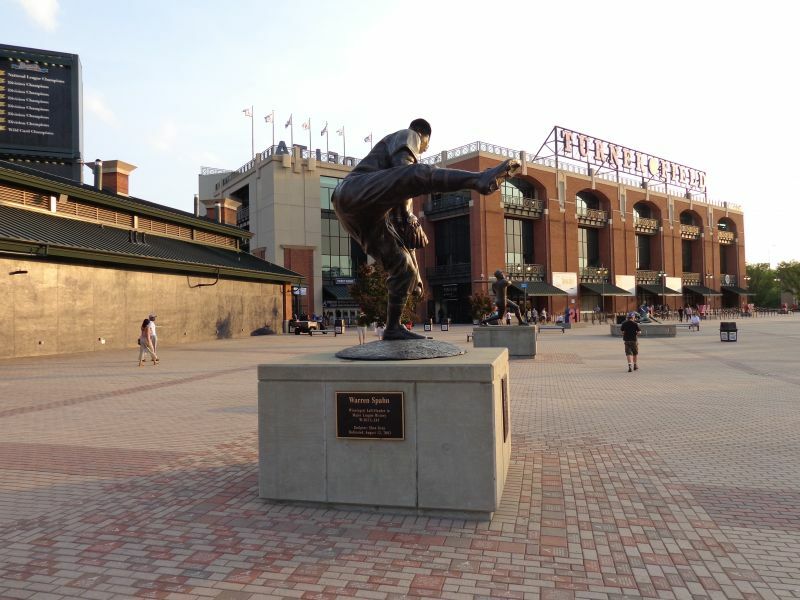 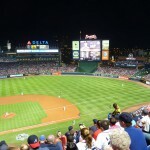 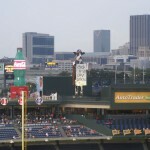 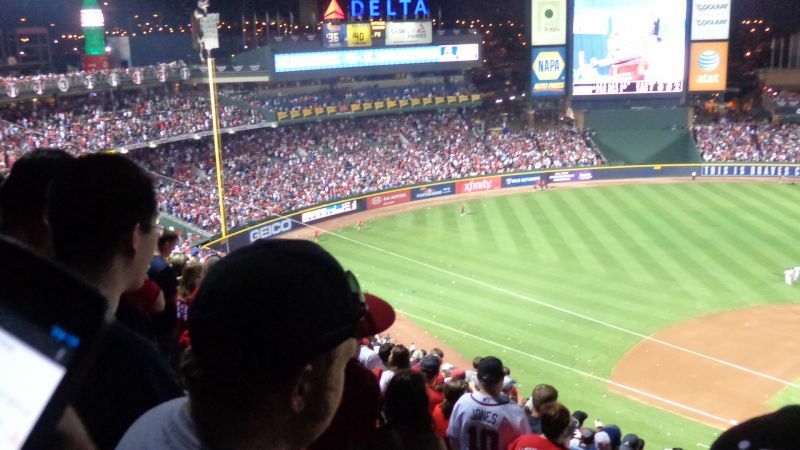 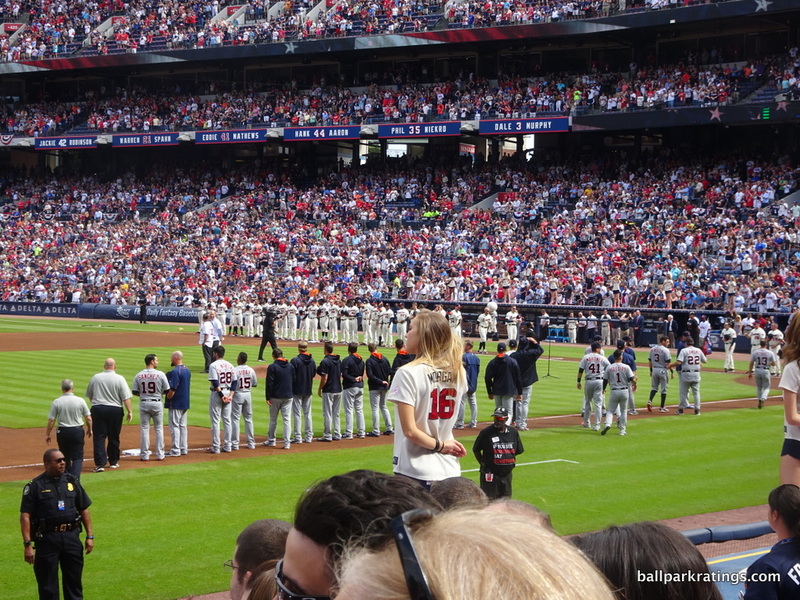 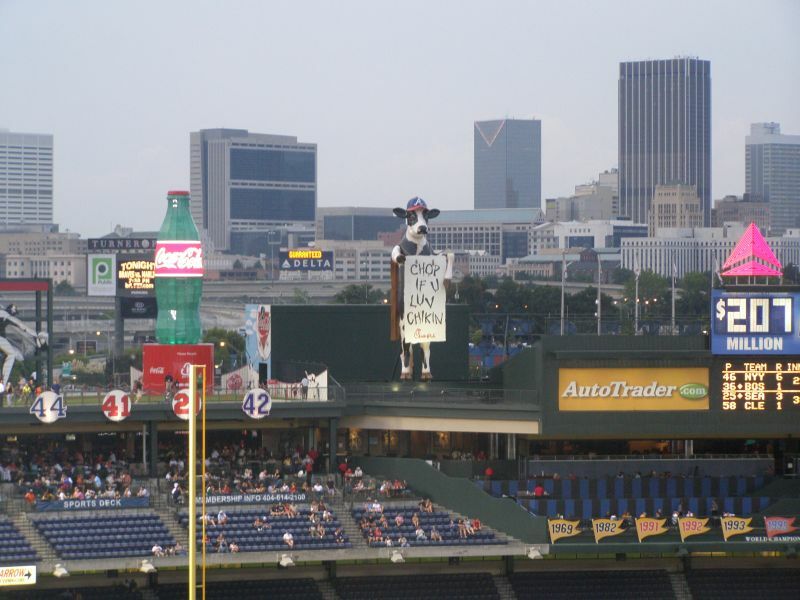 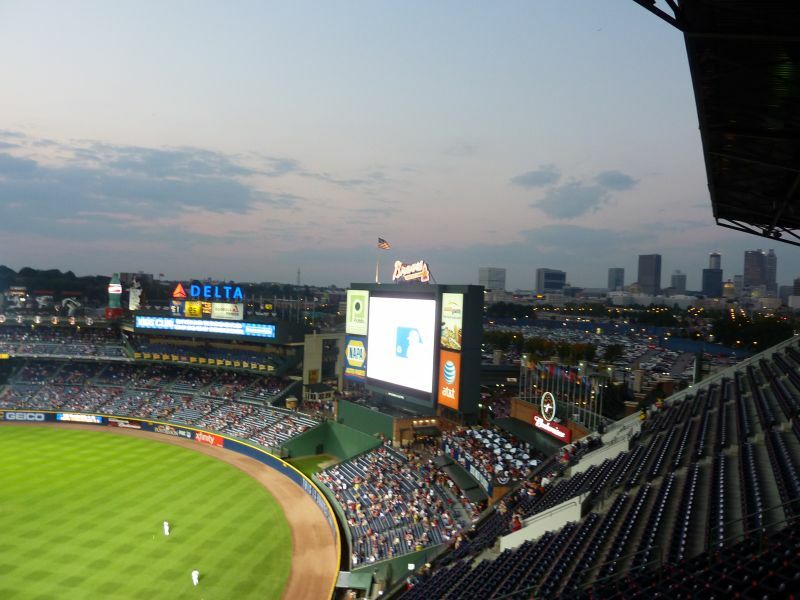 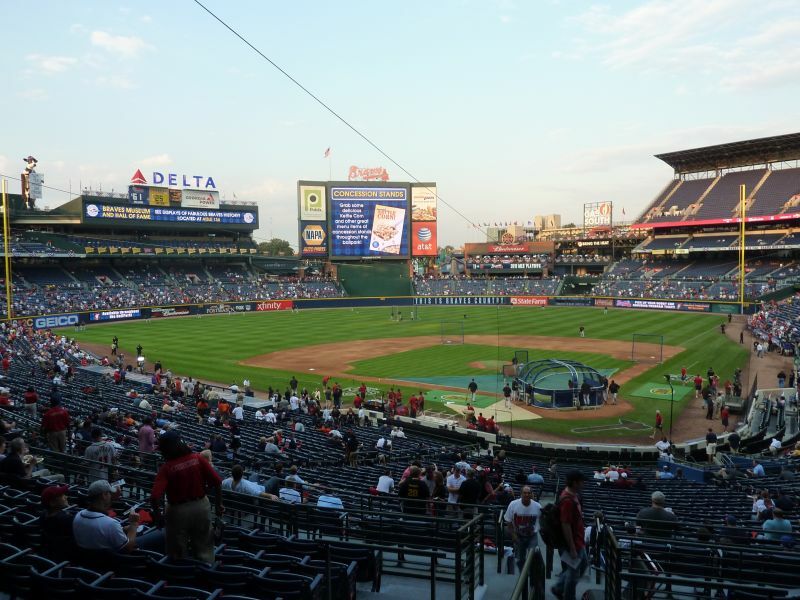 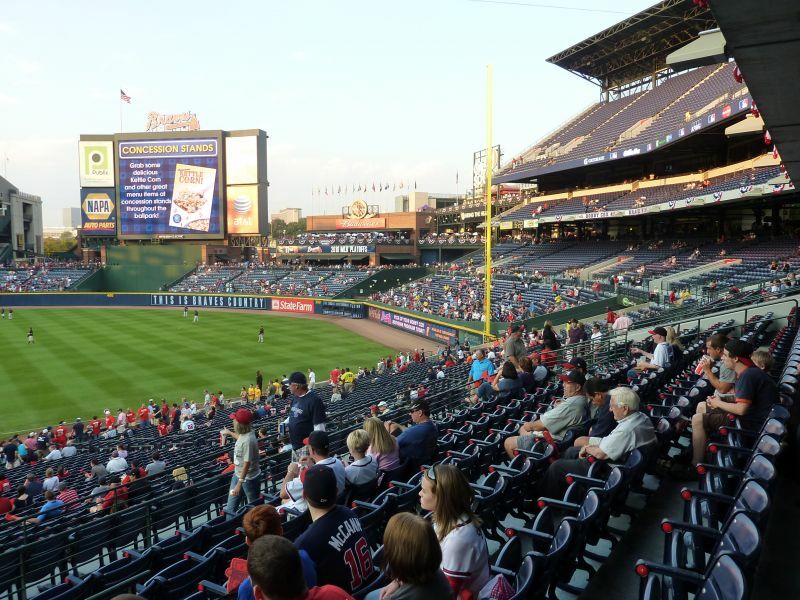 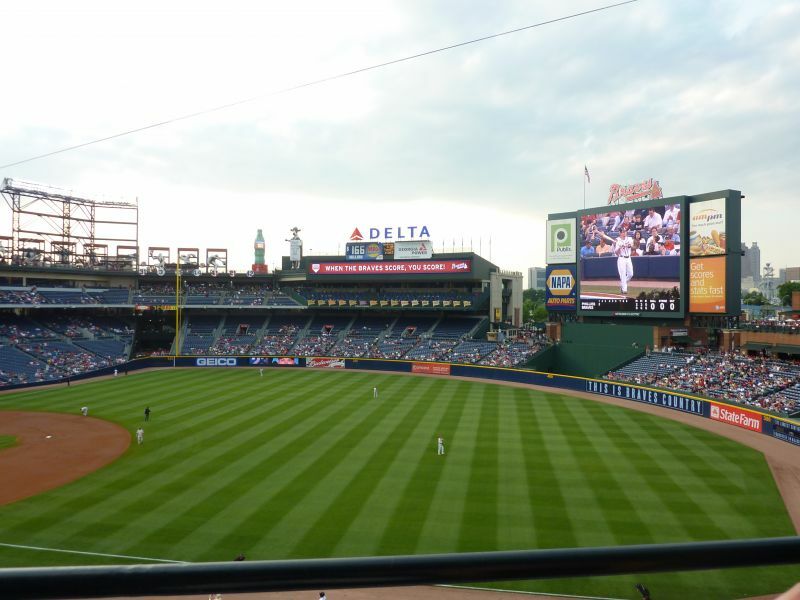 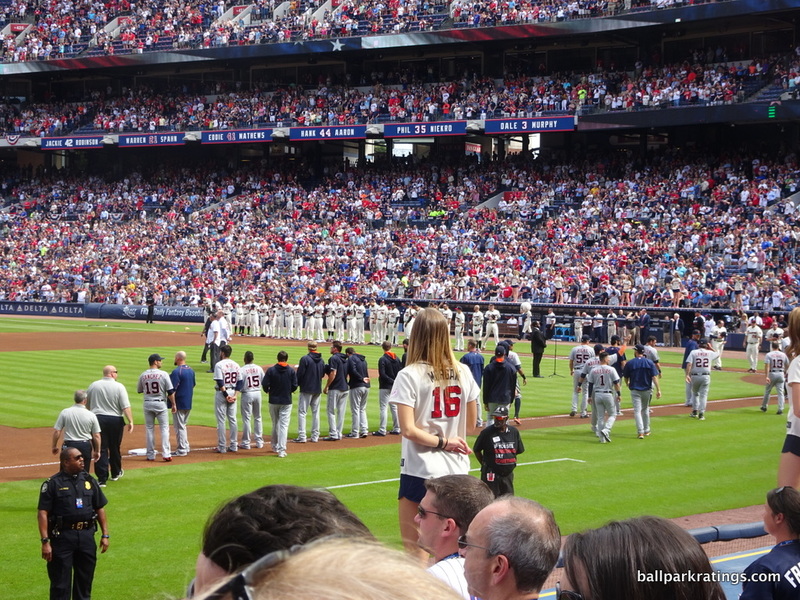 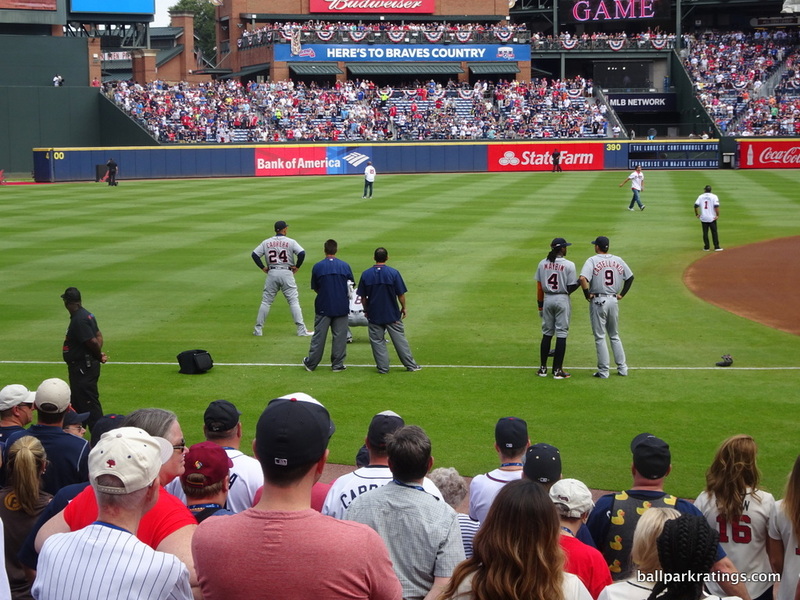 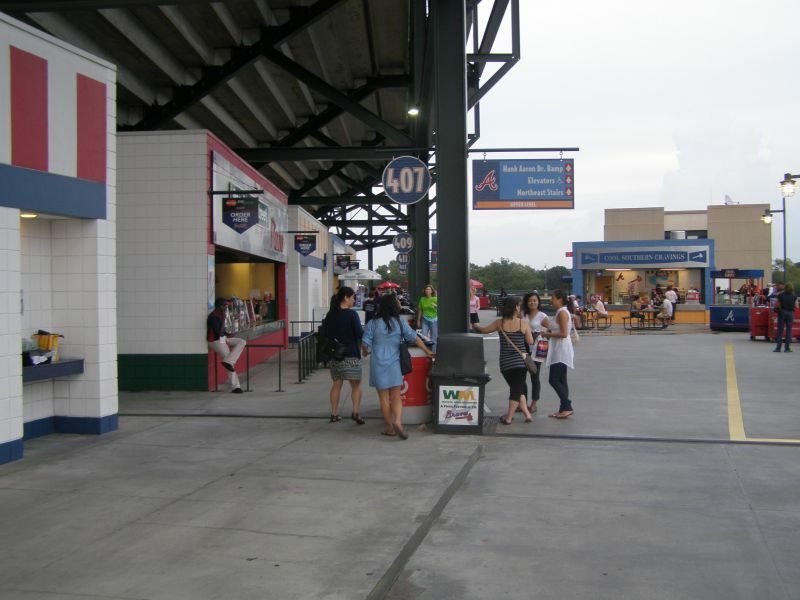 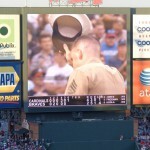 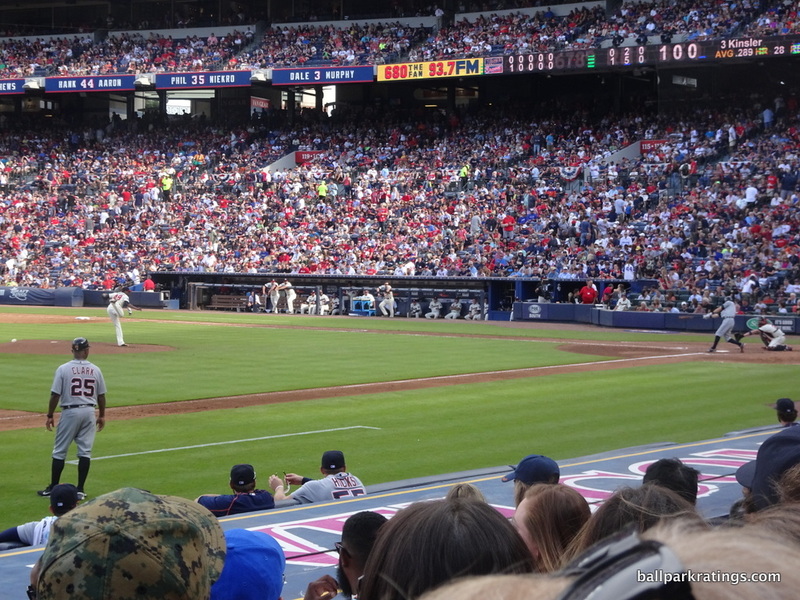 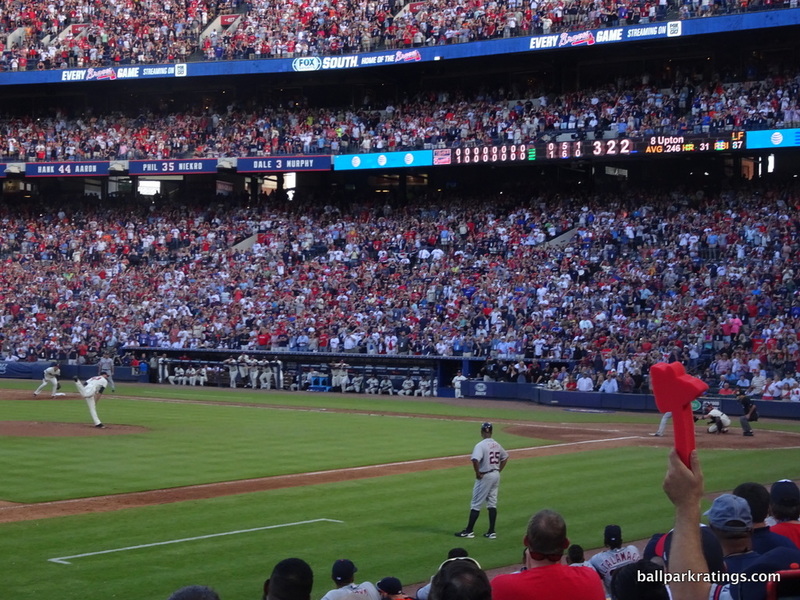 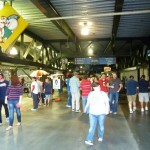 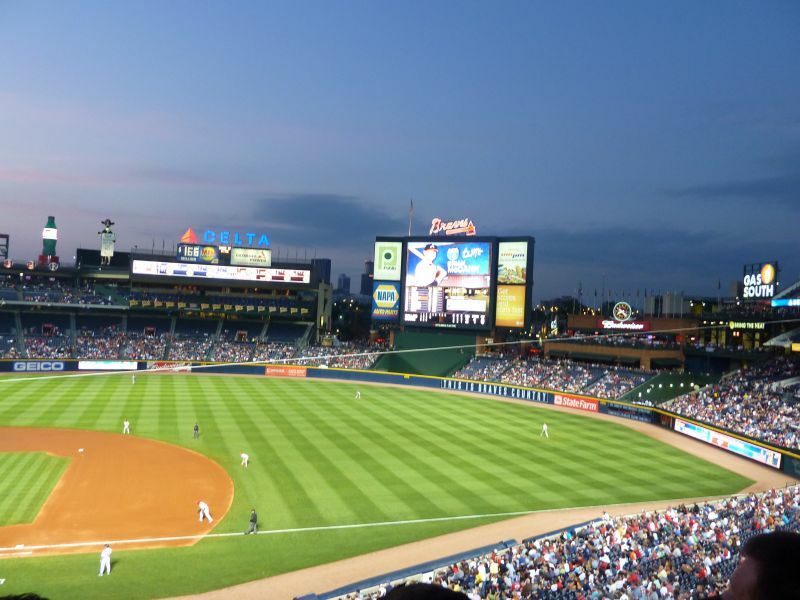 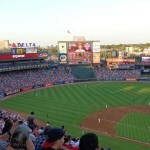 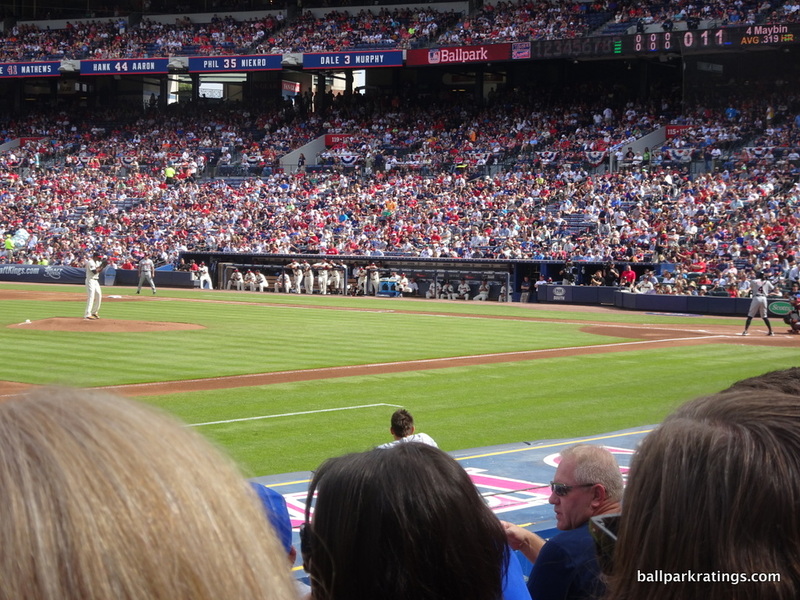 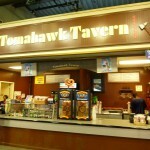 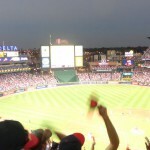 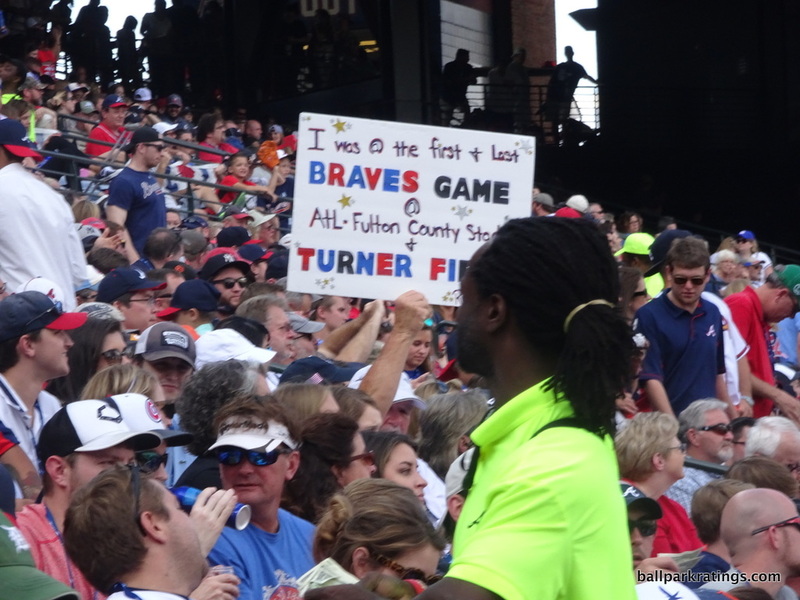 Perhaps the central irony of Turner Field is its wonderfully eccentric and creative namesake. 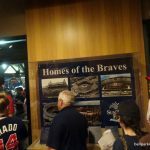 No distinguishing architectural embellishments or design quirks exist here, in what is really more of a testament to the organization and the city. 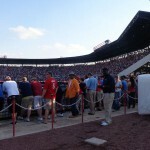 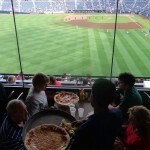 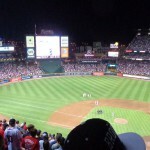 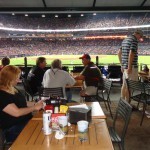 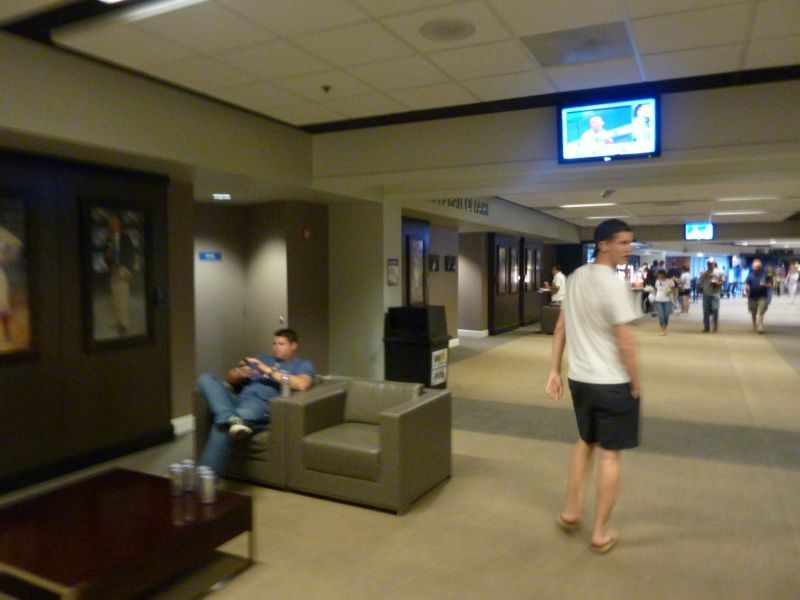 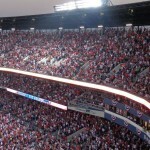 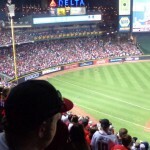 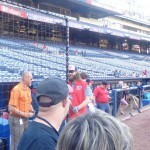 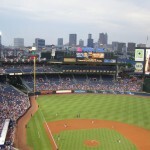 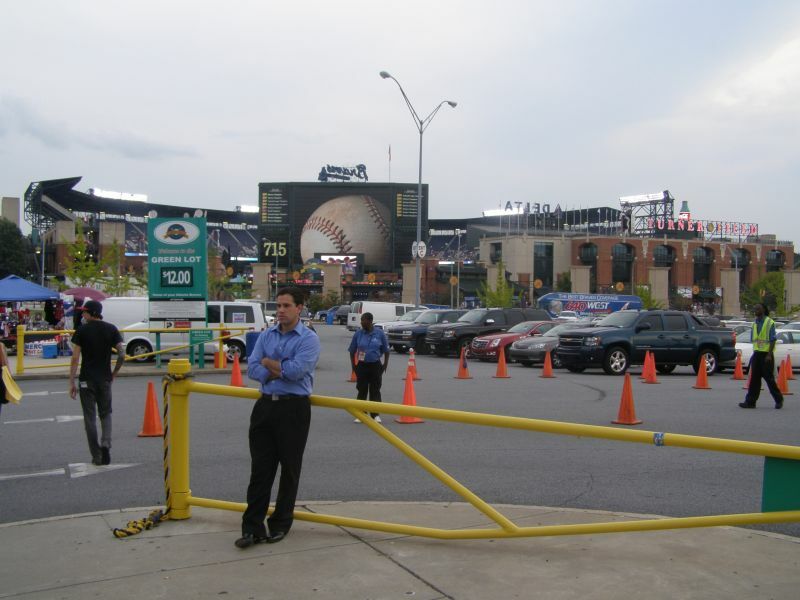 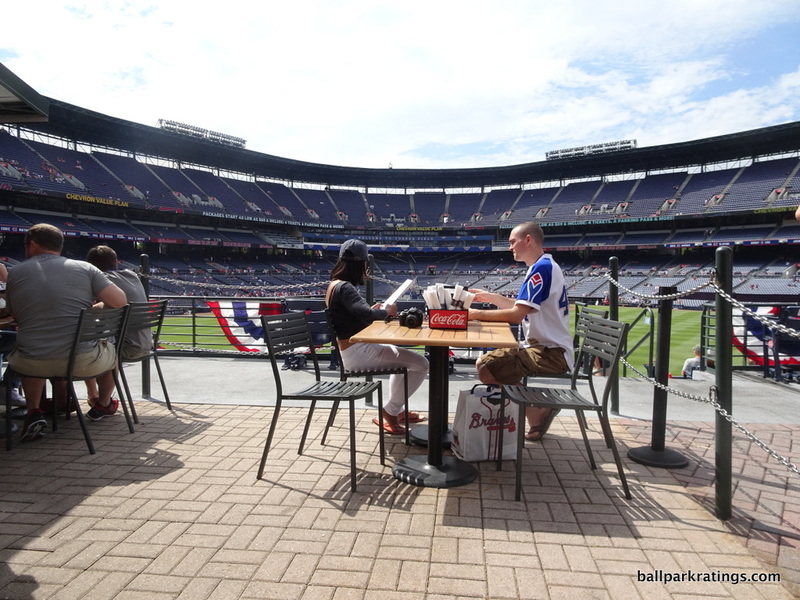 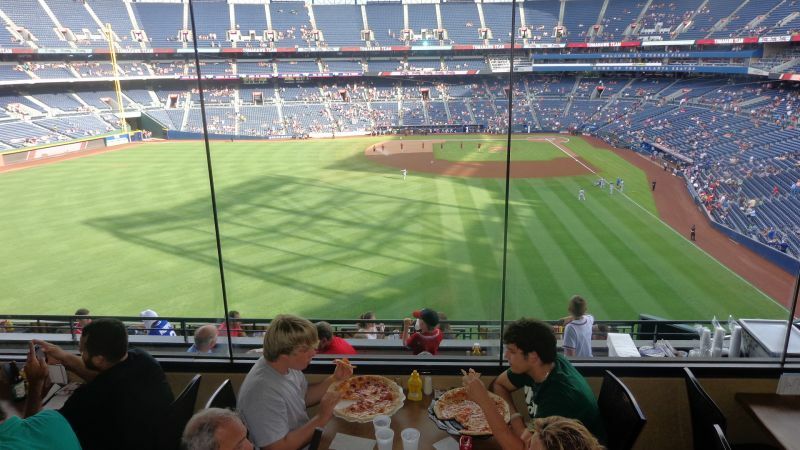 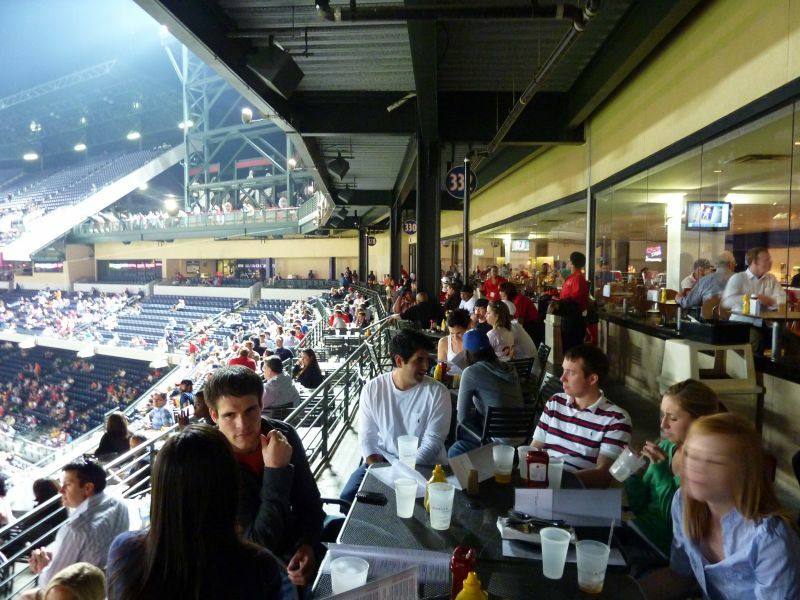 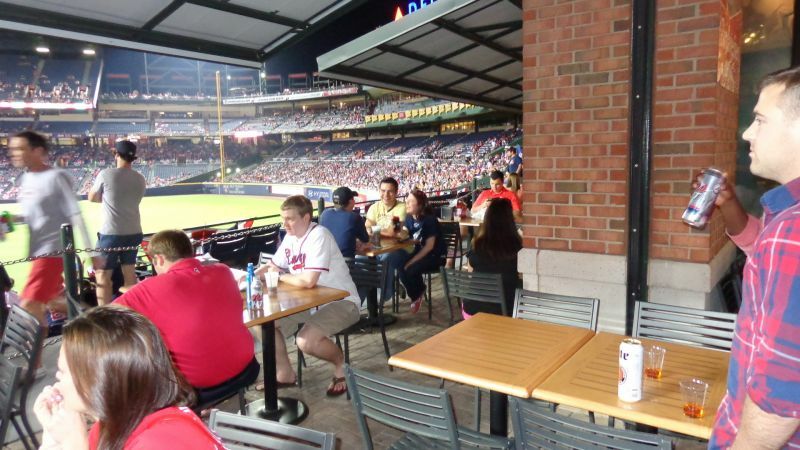 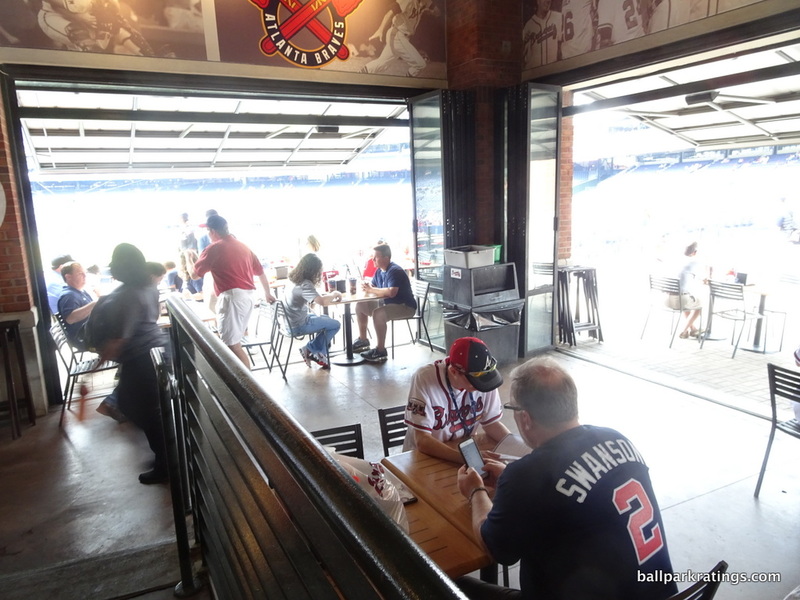 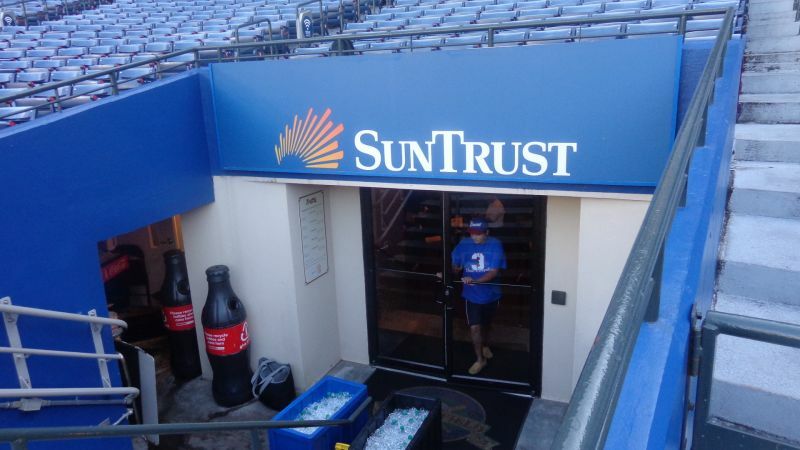 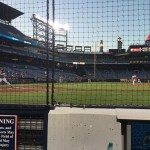 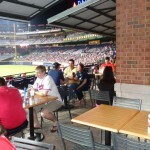 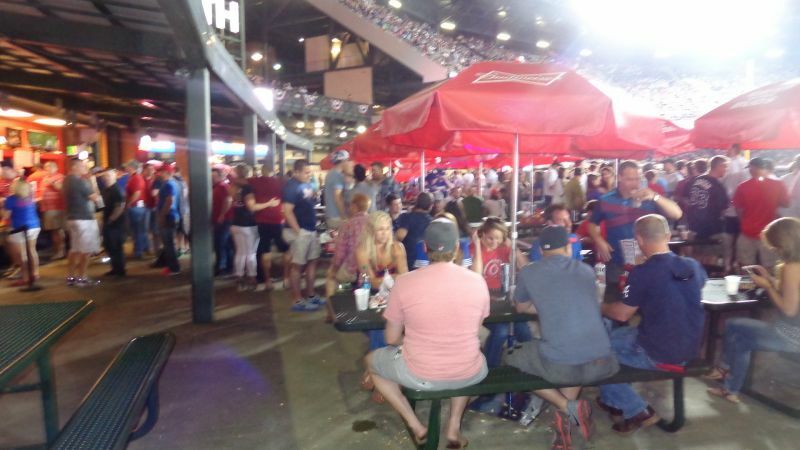 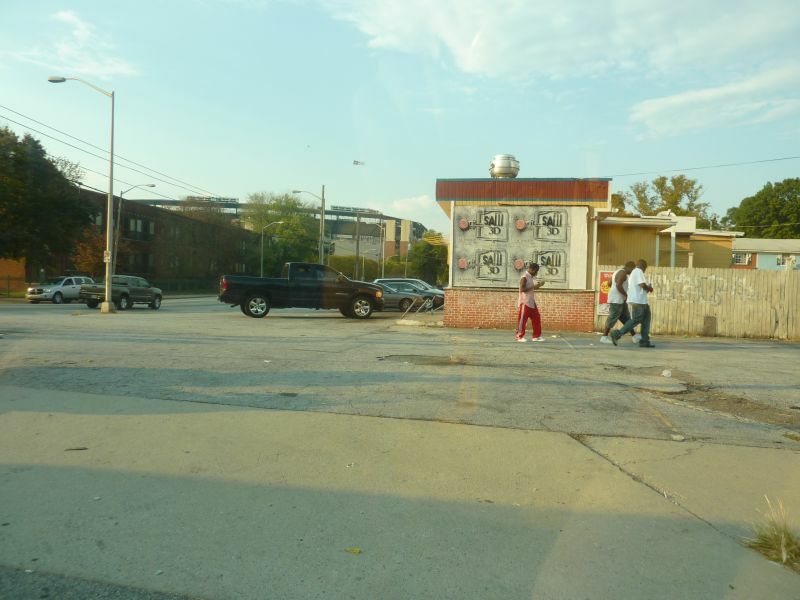 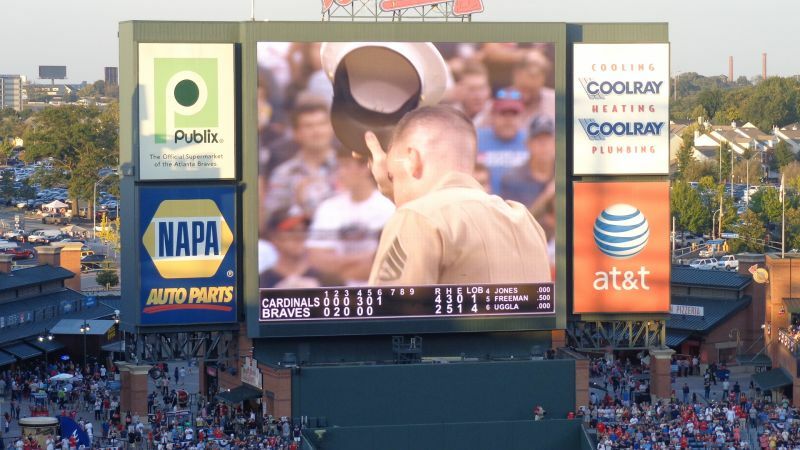 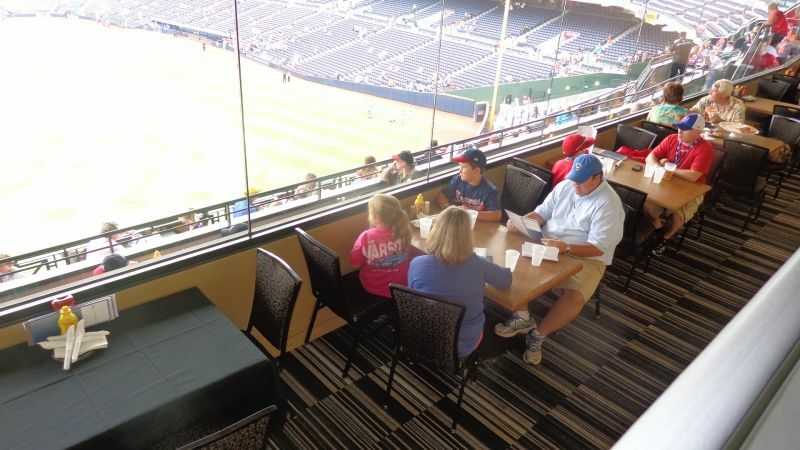 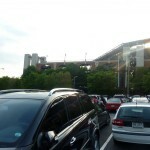 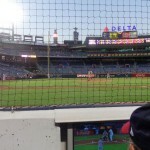 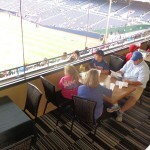 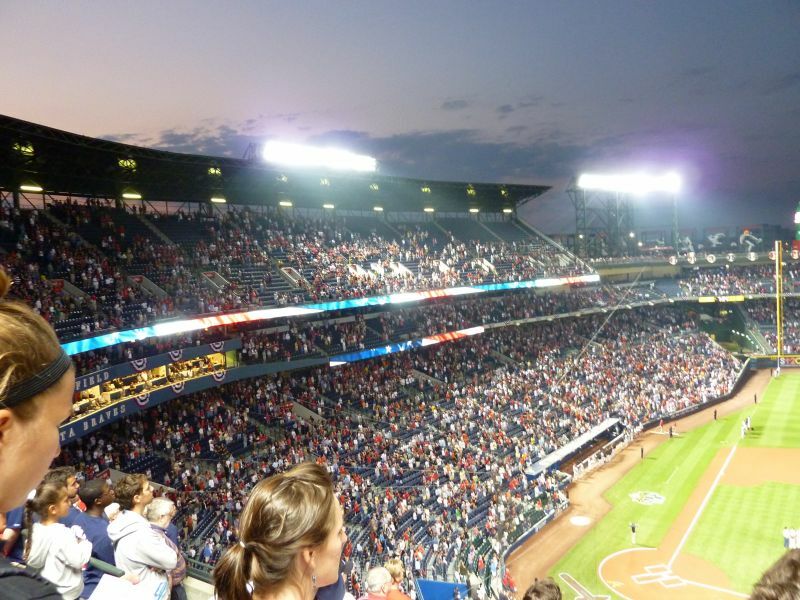 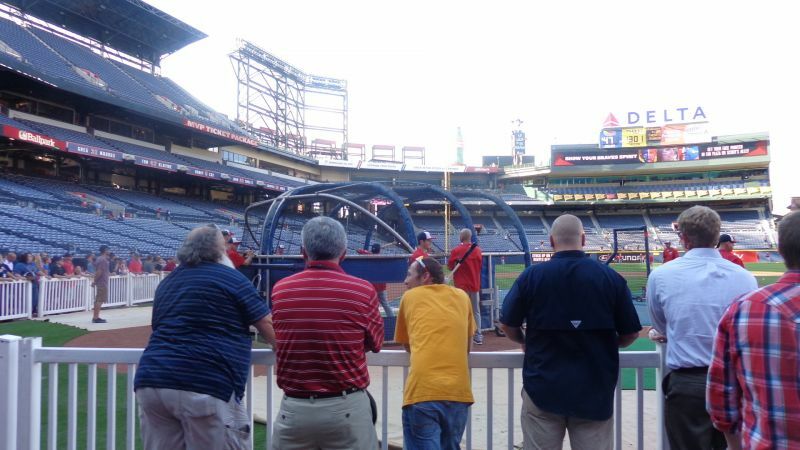 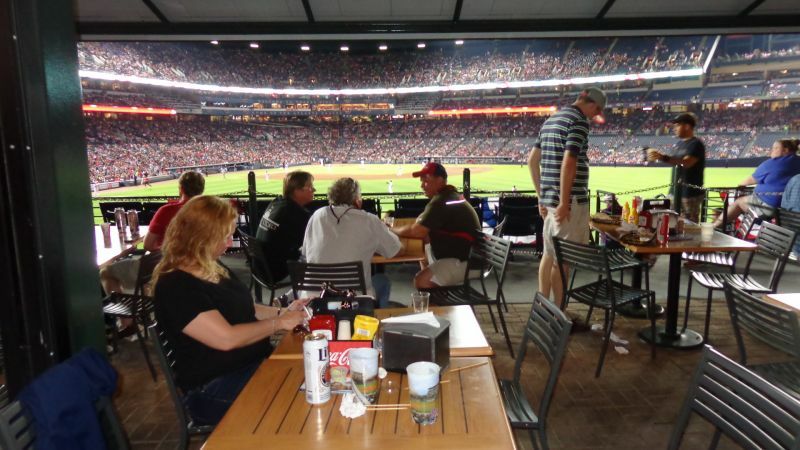 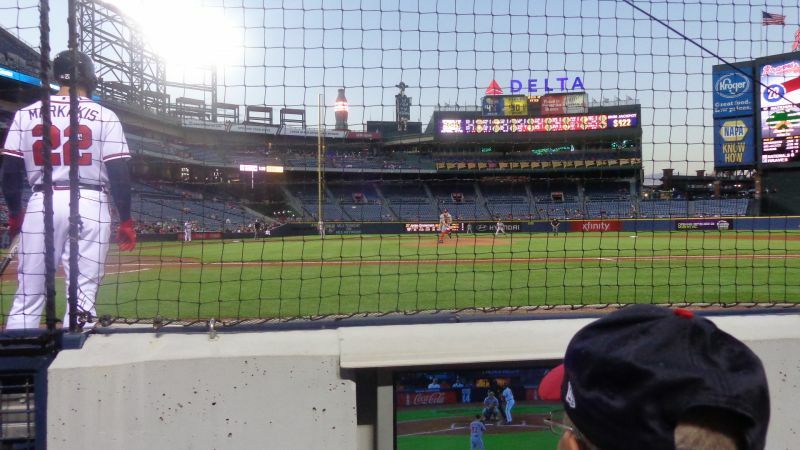 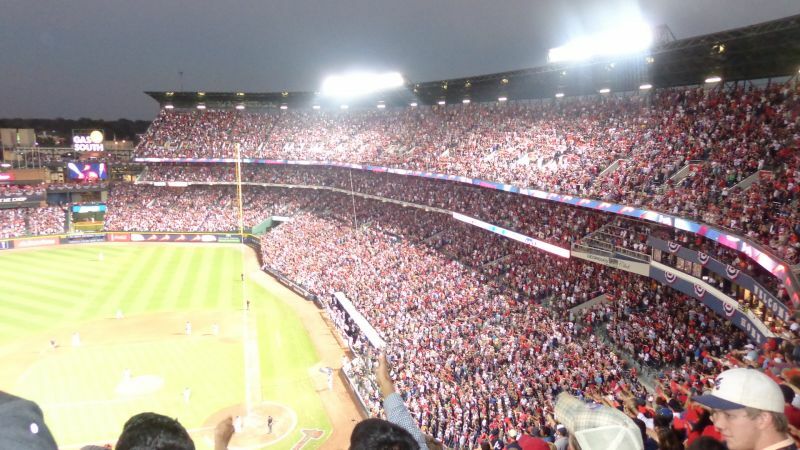 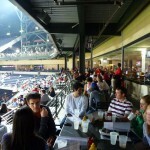 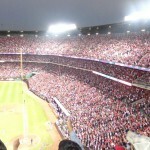 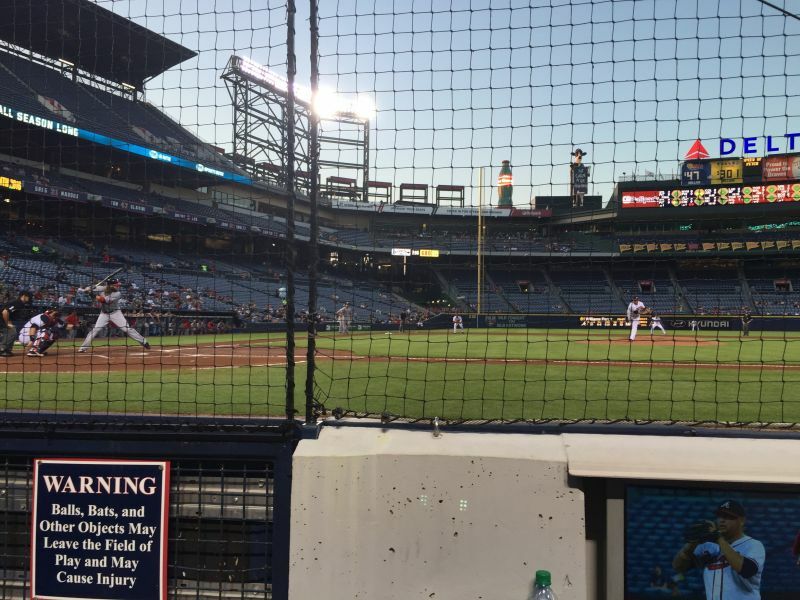 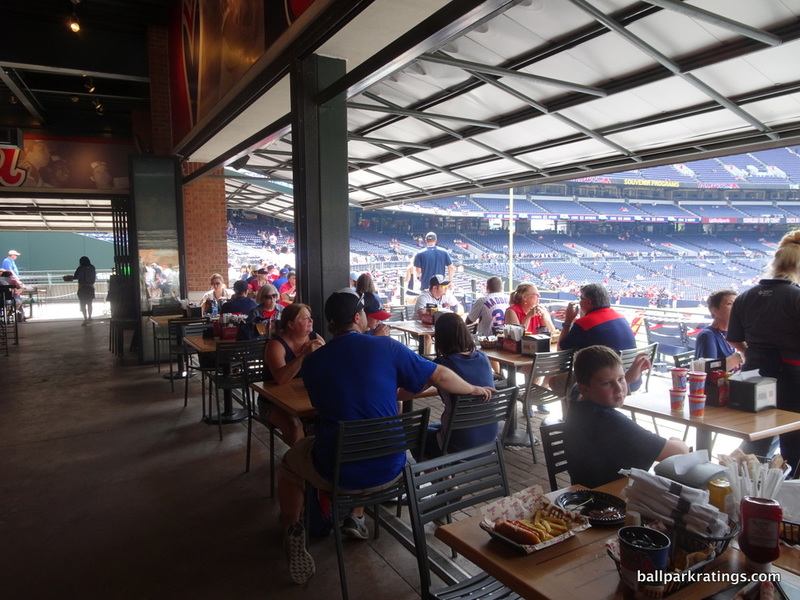 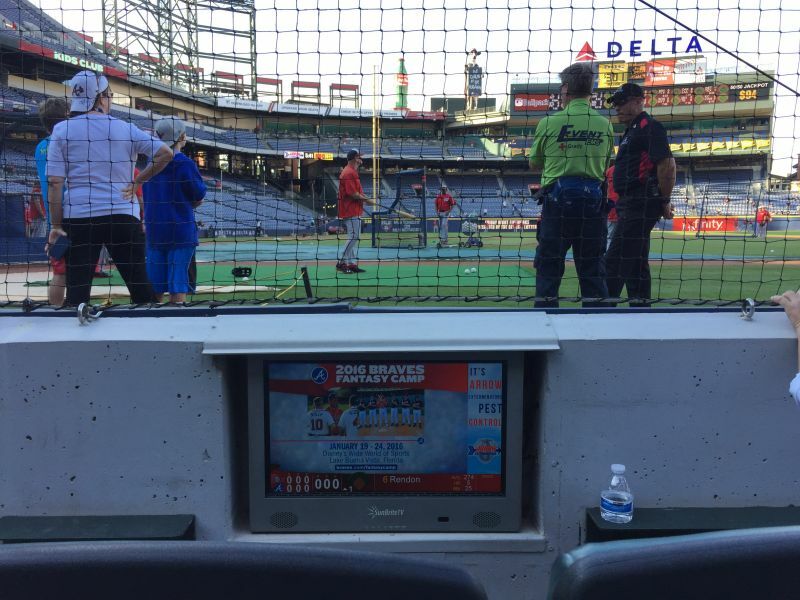 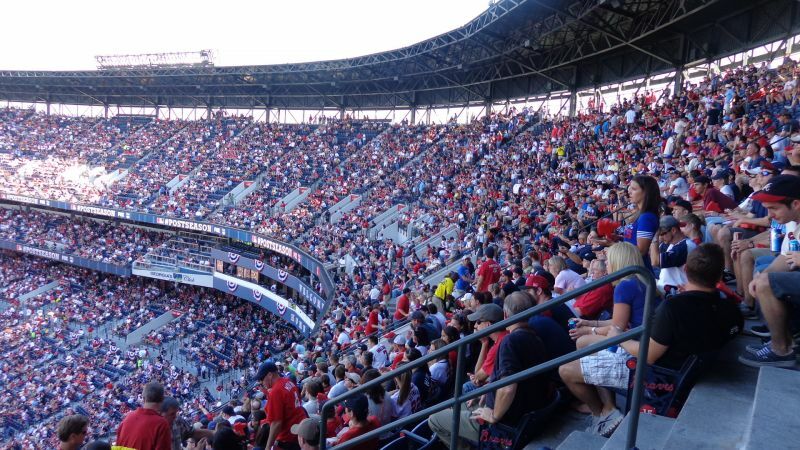 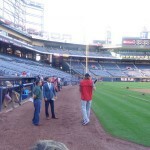 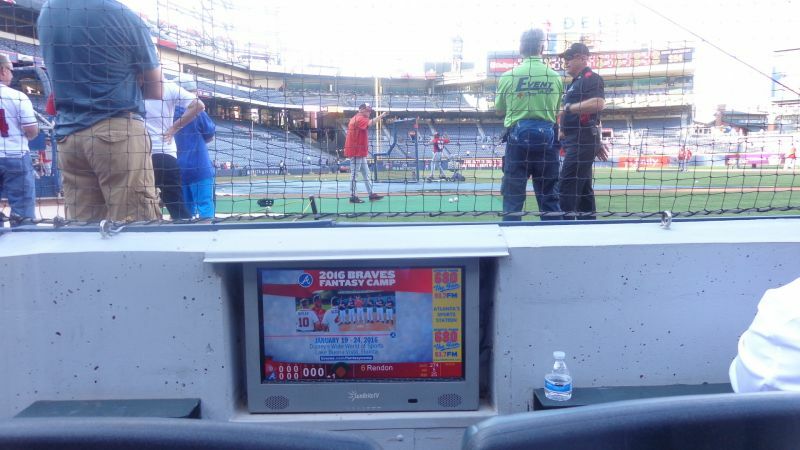 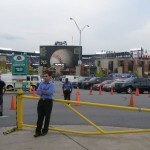 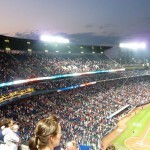 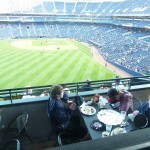 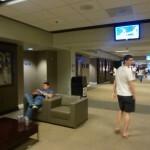 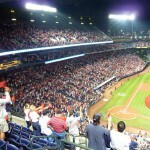 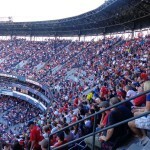 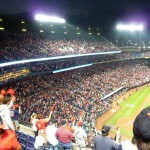 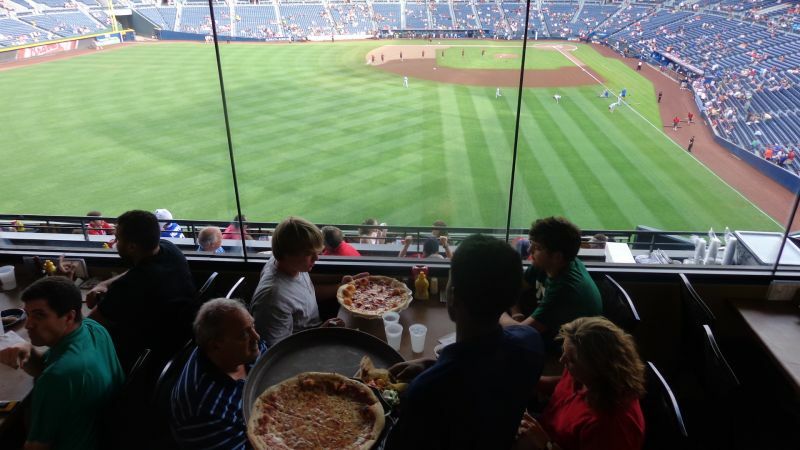 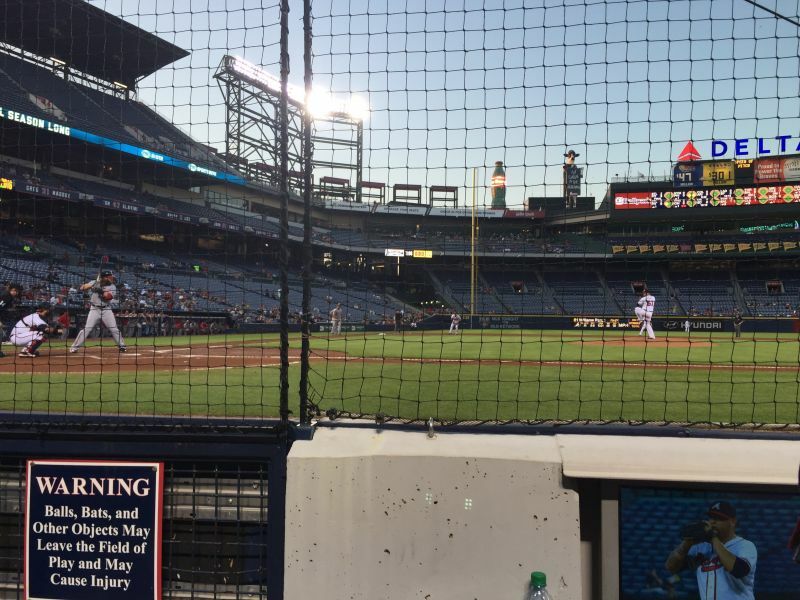 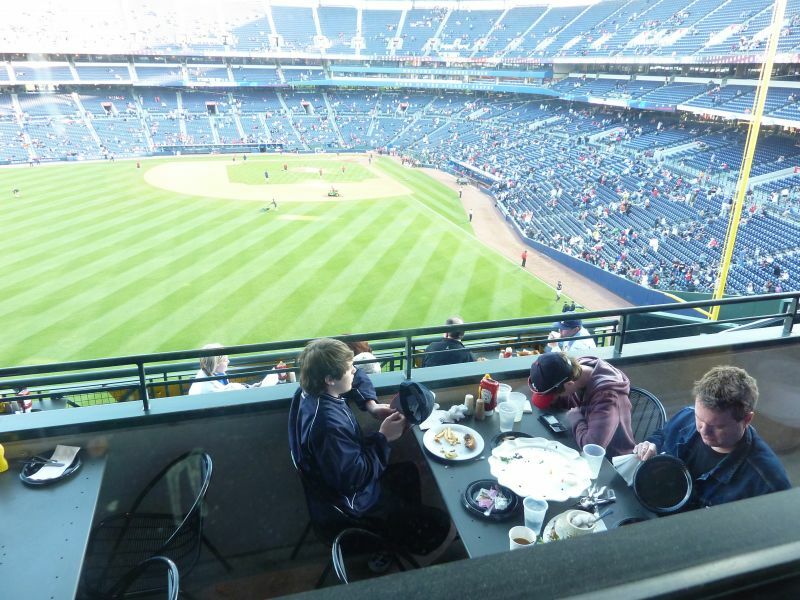 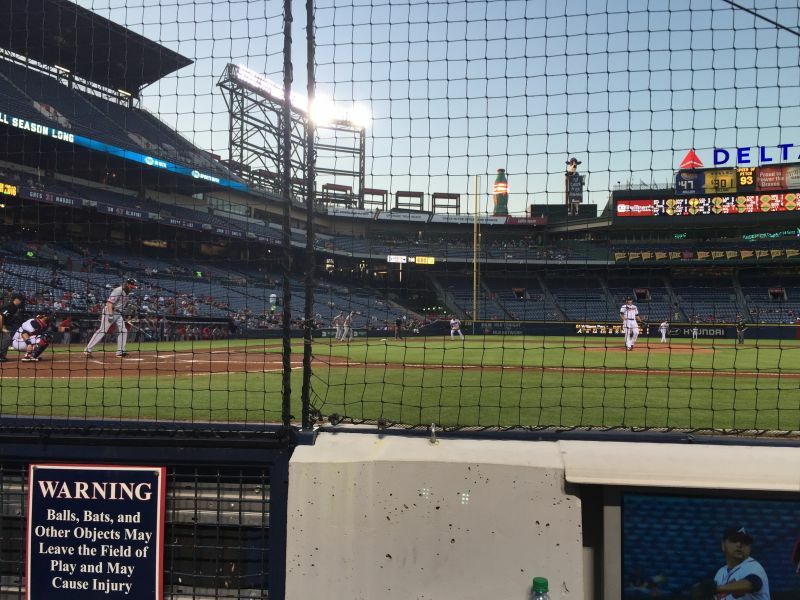 Turner Field doesn’t provide much of an environment outside the ballpark. 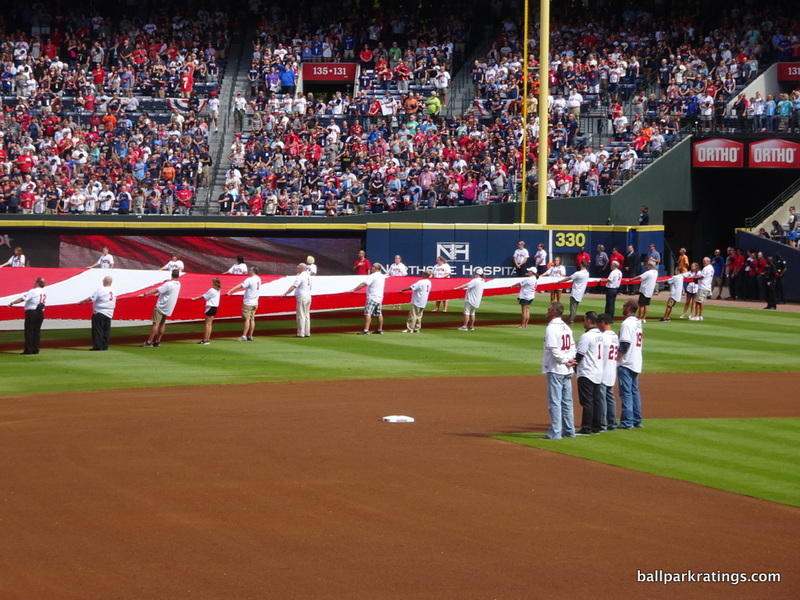 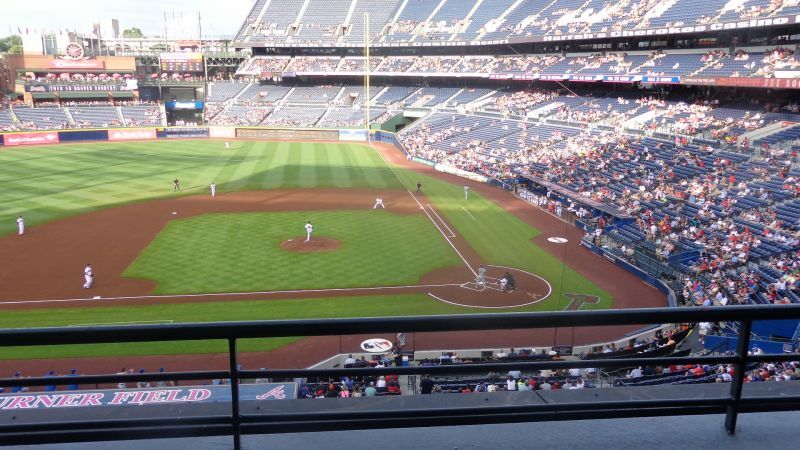 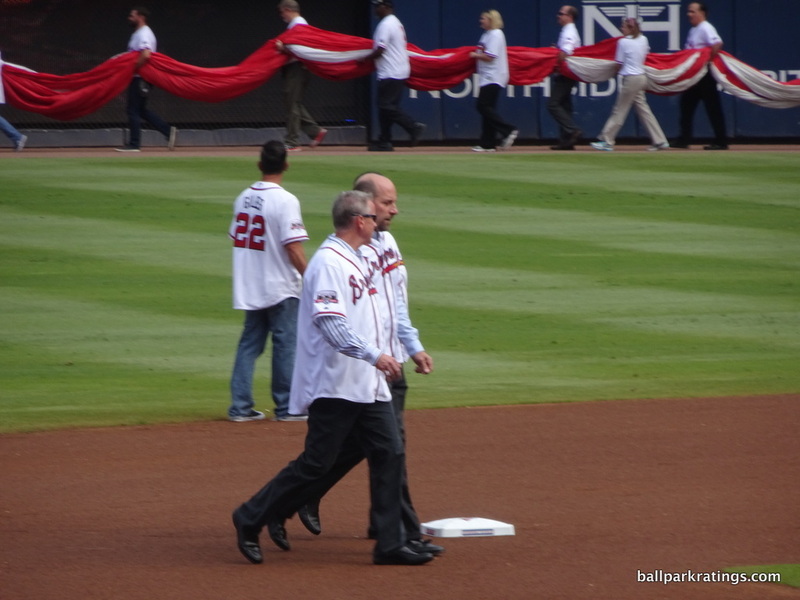 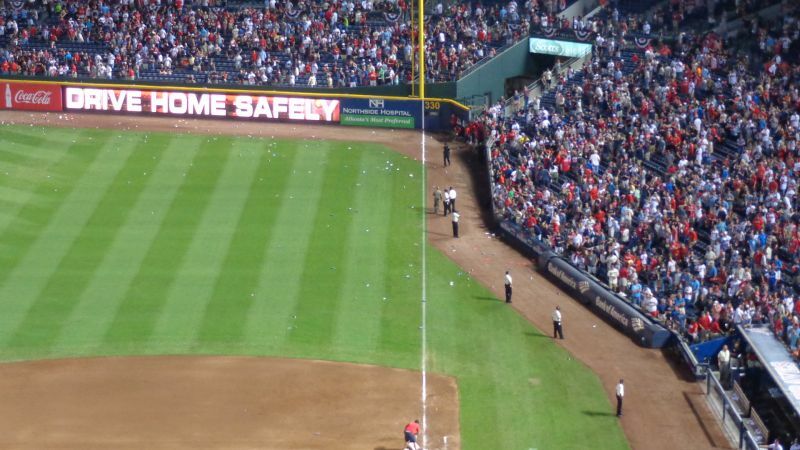 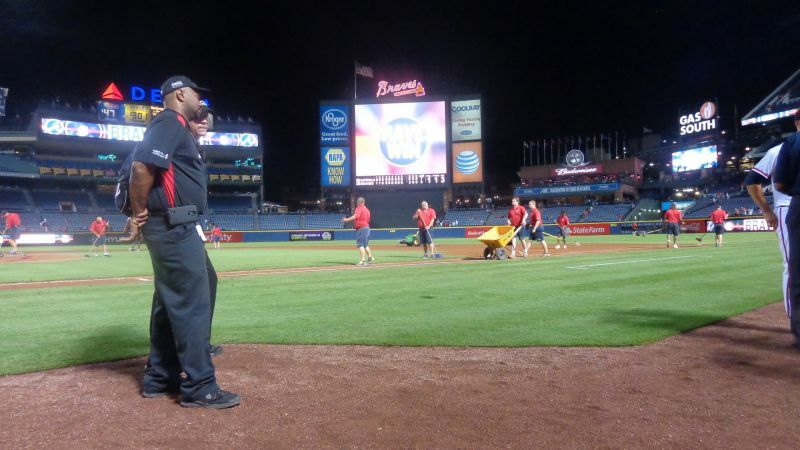 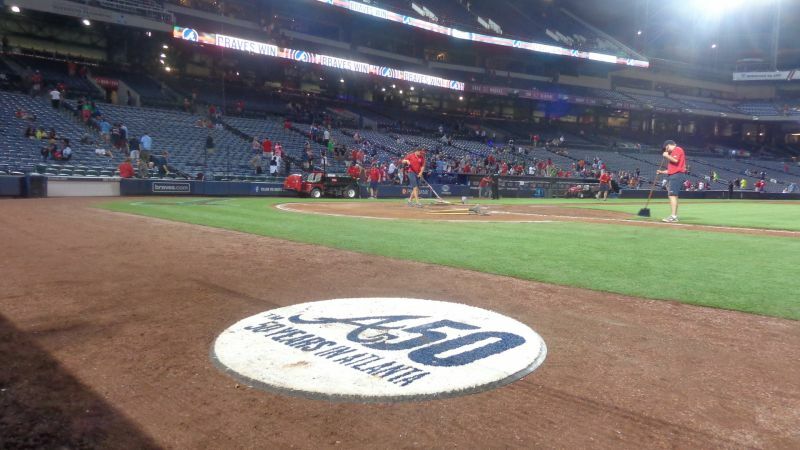 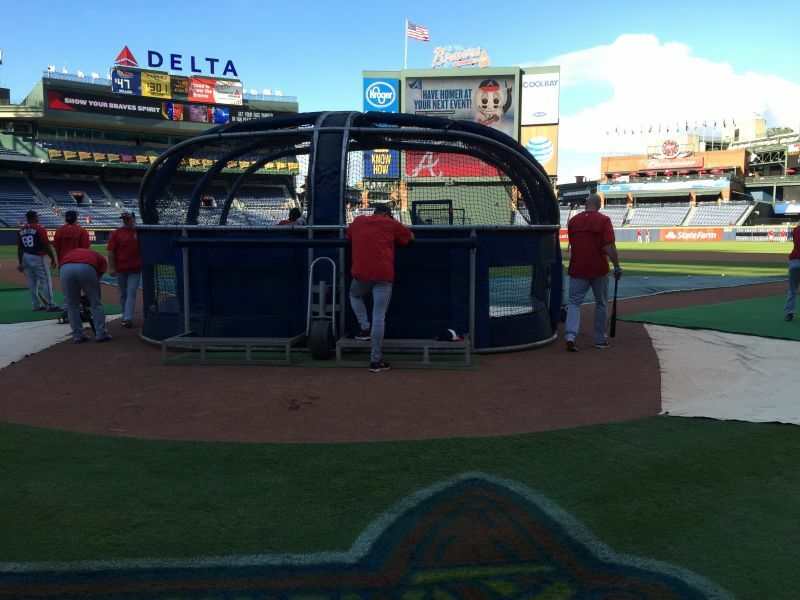 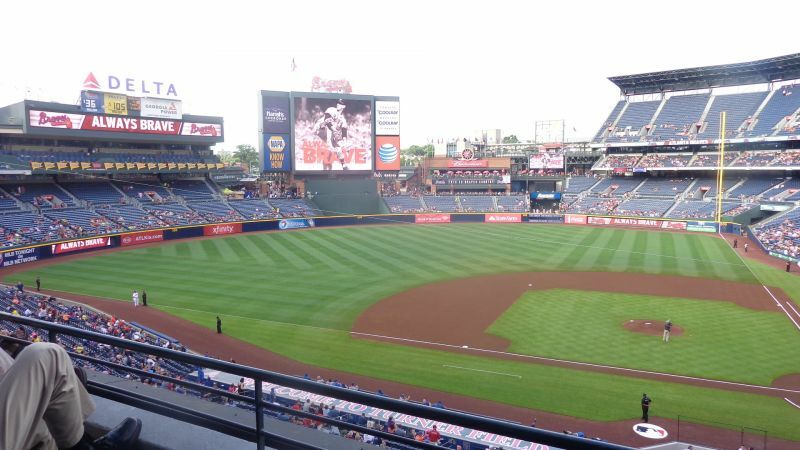 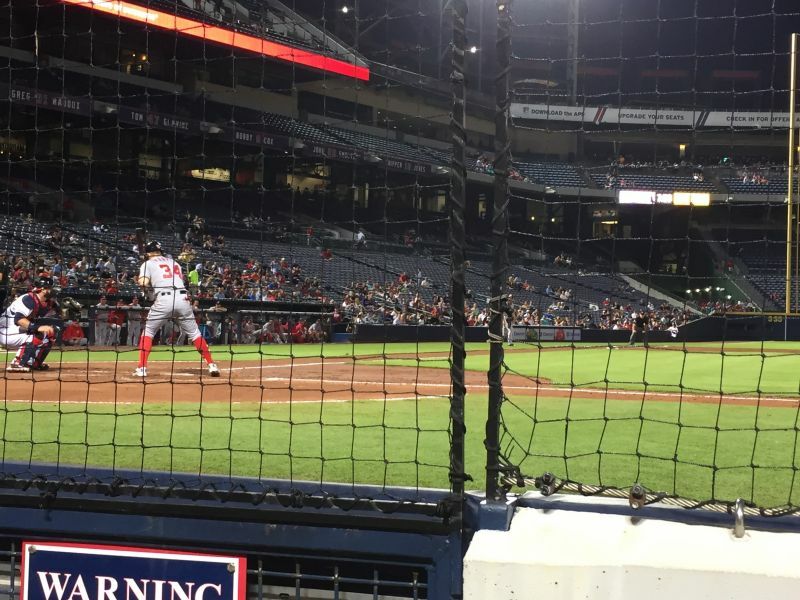 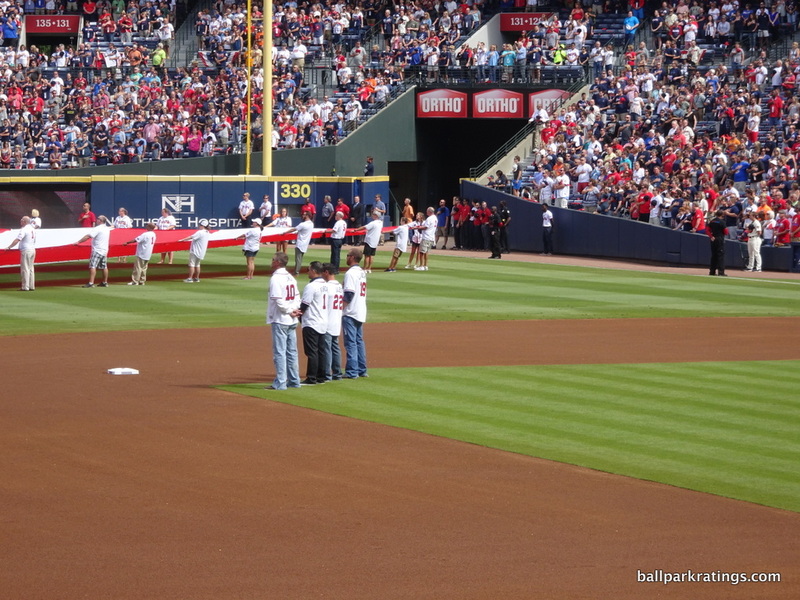 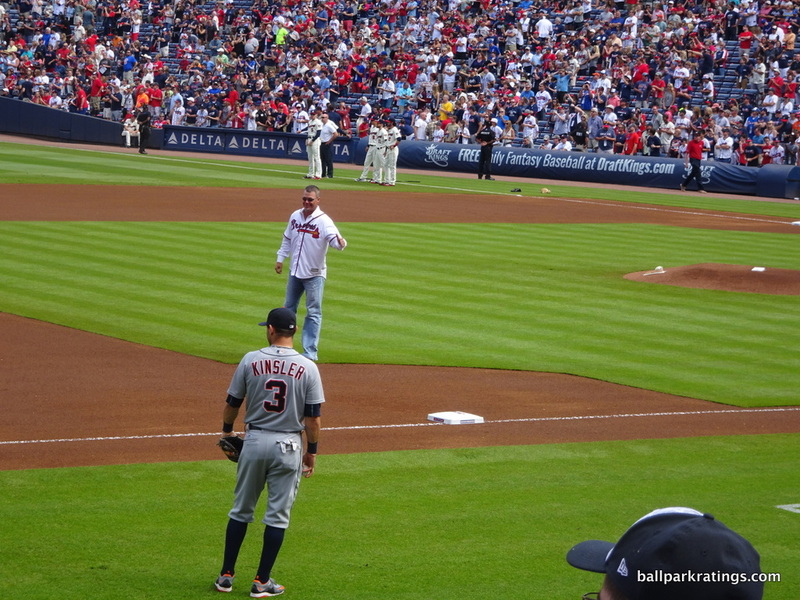 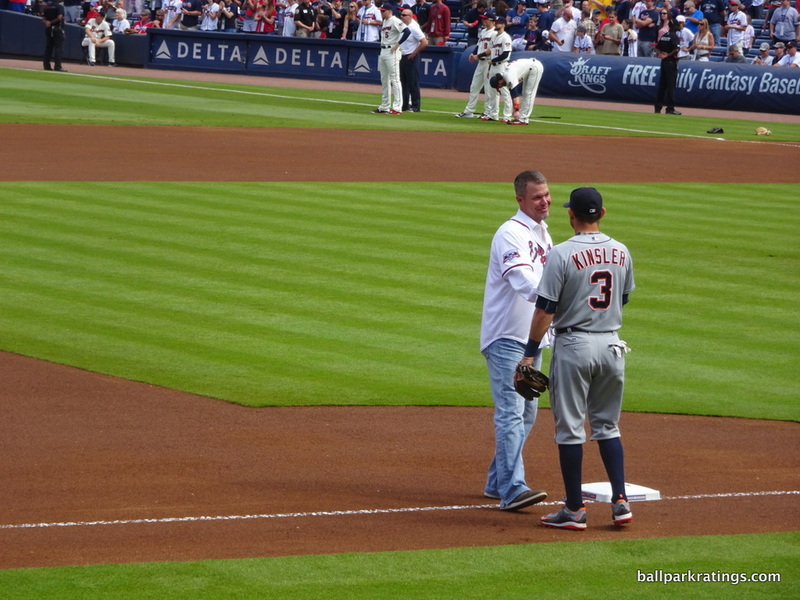 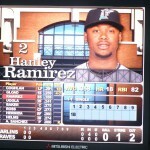 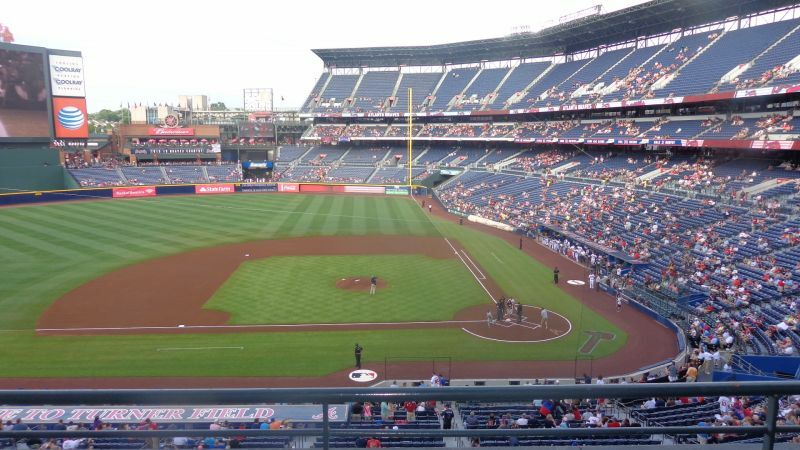 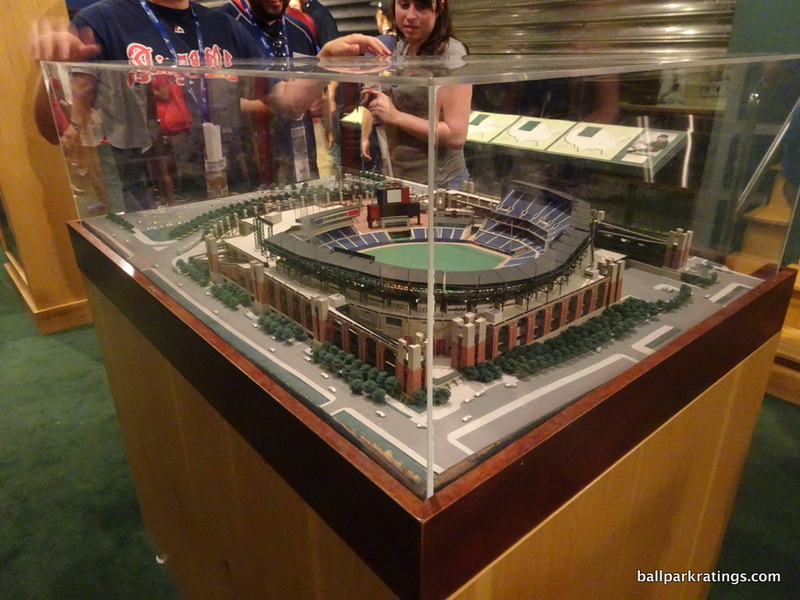 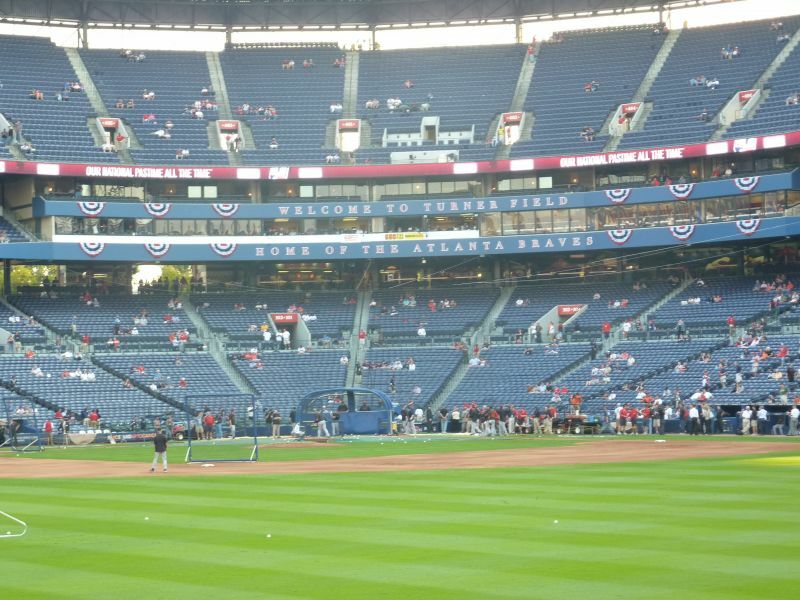 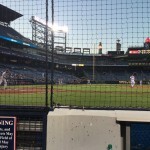 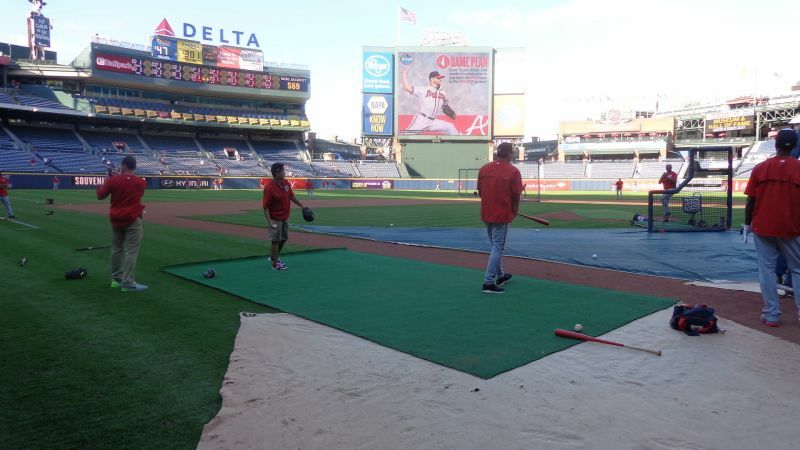 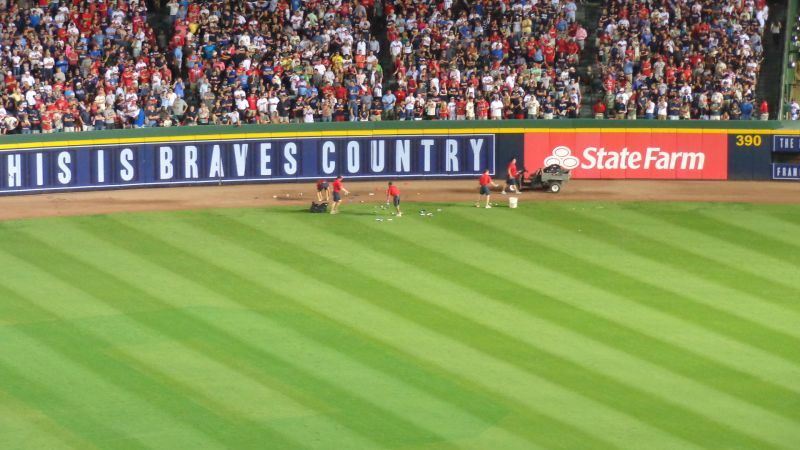 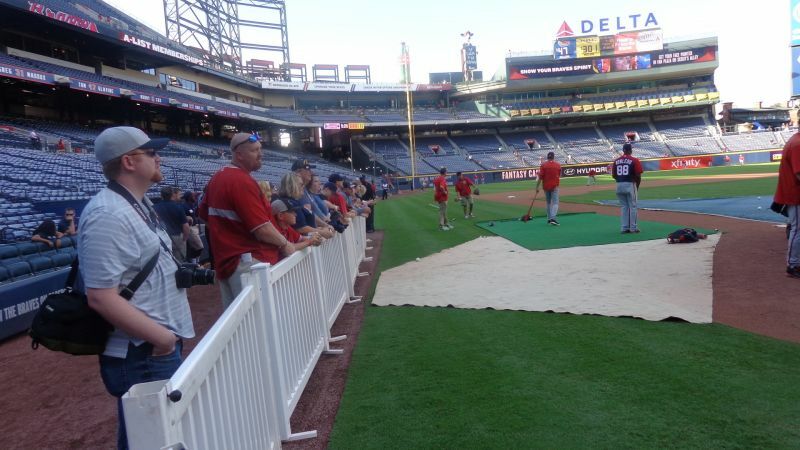 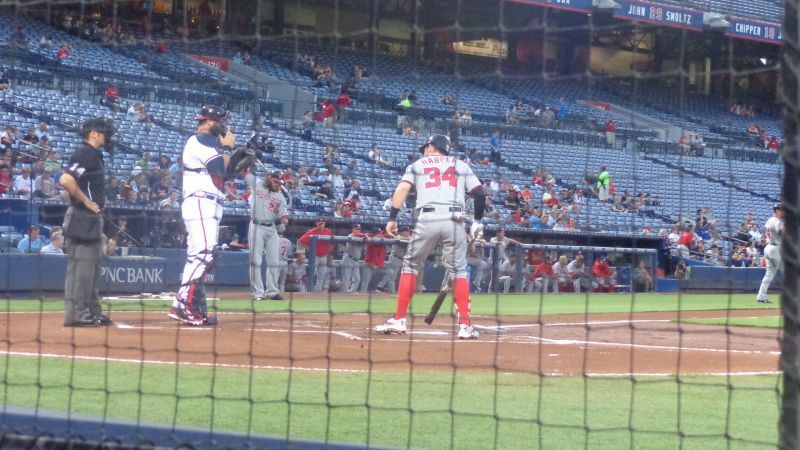 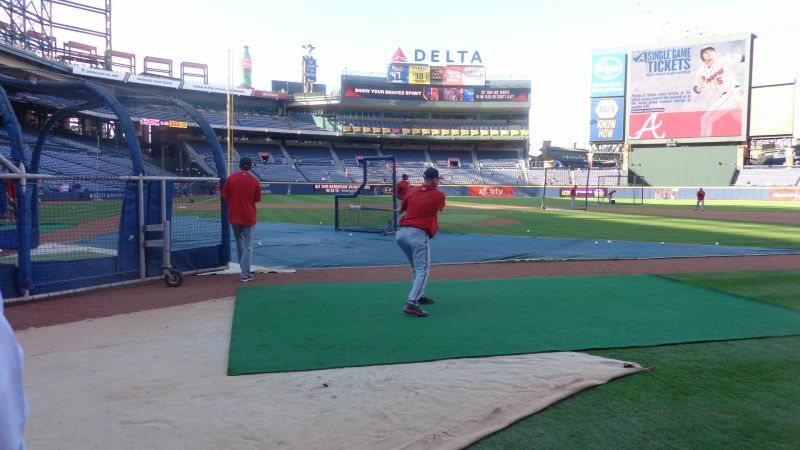 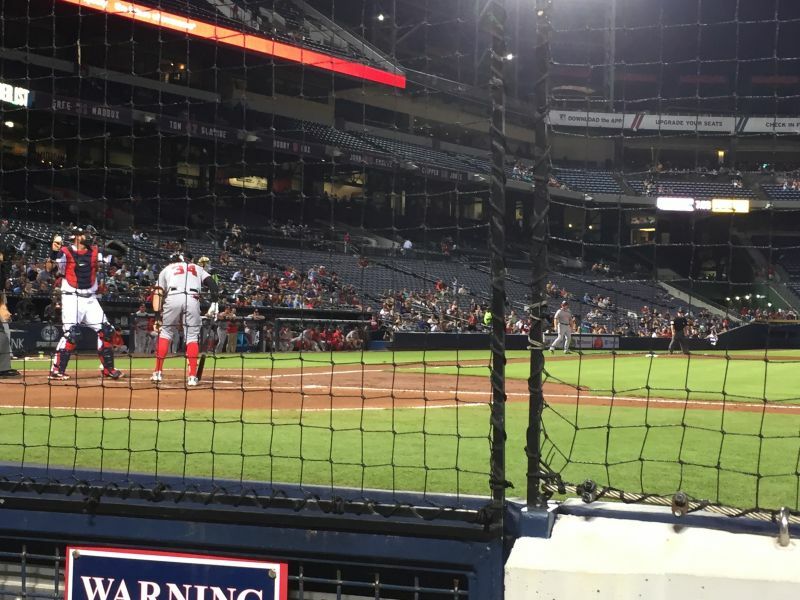 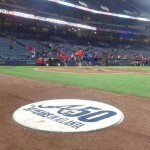 What bugs me most is that Turner Field really isn’t confident in its simple, contrivance-free look. 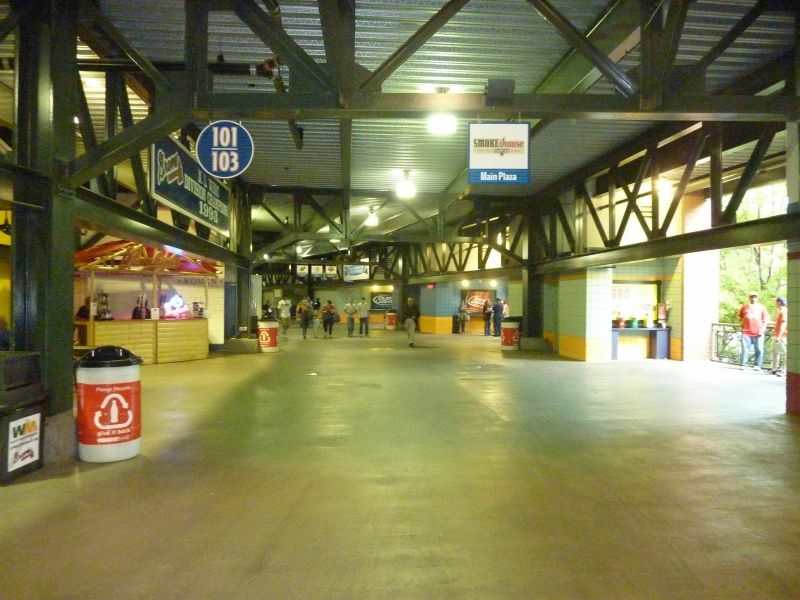 I can live with, but perhaps not love, a simple no frills baseball only park, even if it is bland and enclosed. 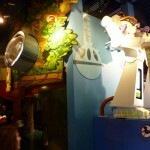 Instead, it greatly muddles a very honest structure with tons of gimmicks and distractions. 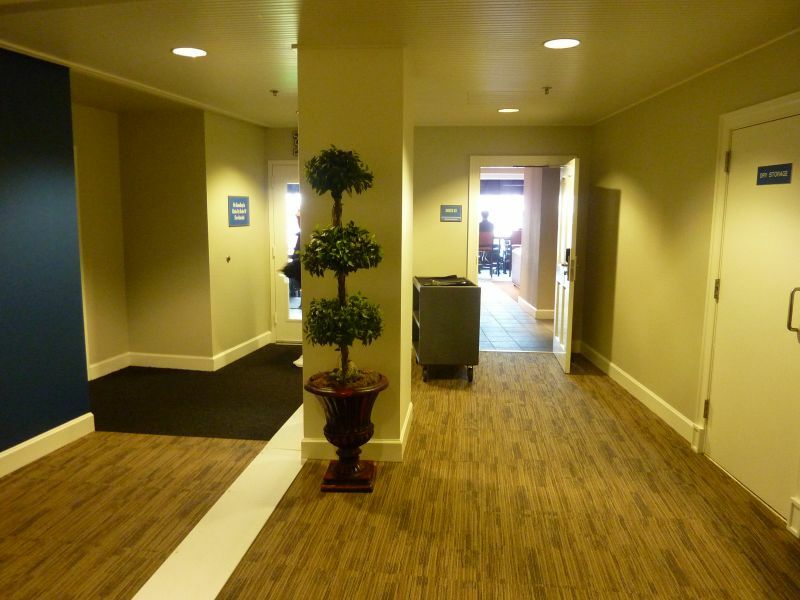 Note the difference between contrivances (artificially quirky dimensions) and gimmicks. 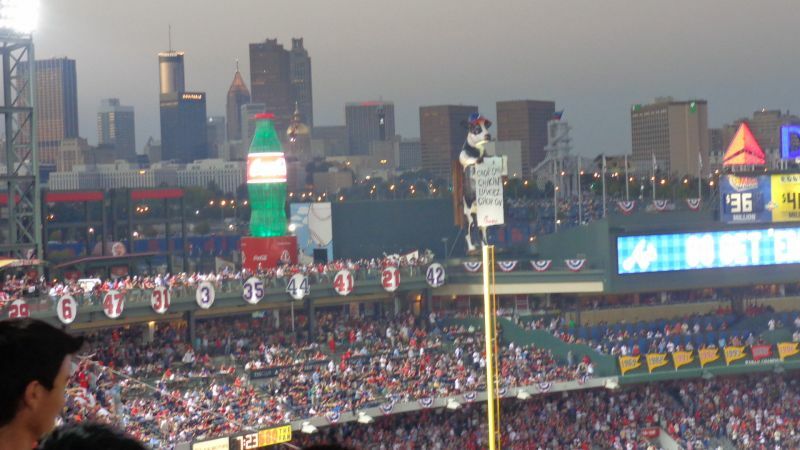 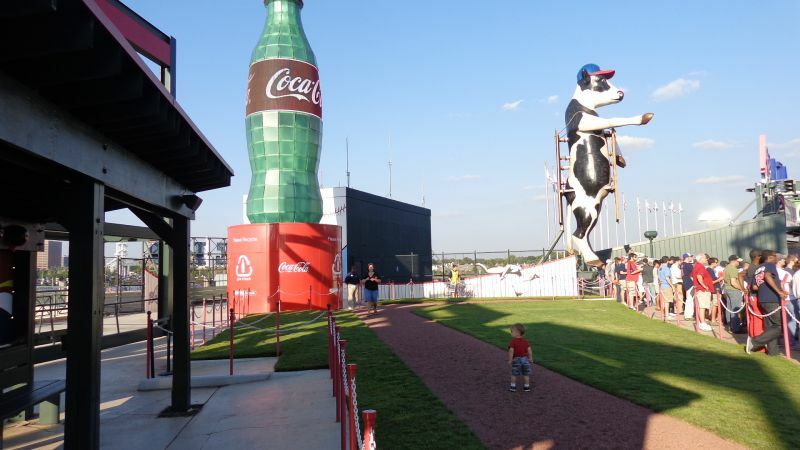 What we have here is a boring stadium superficially accentuated with Chick-fil-A cows, coke bottles, and other flashy ornaments. 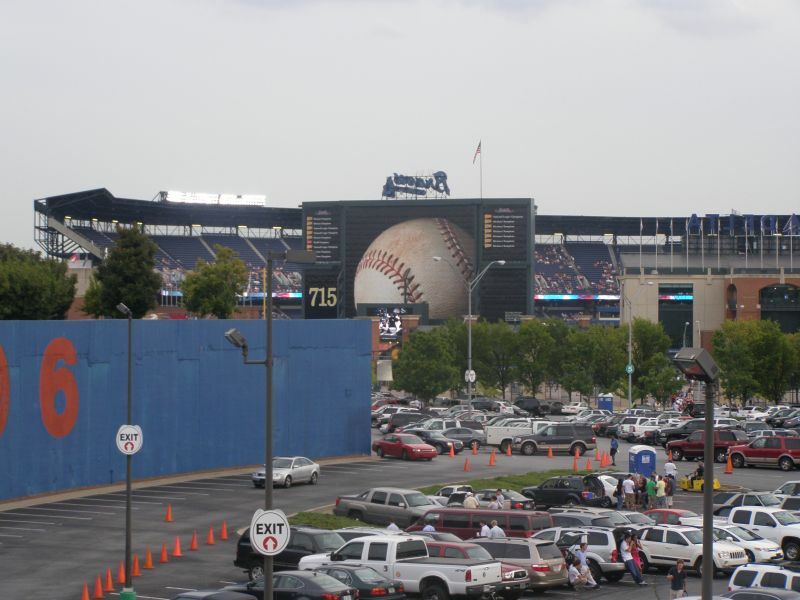 We have a formulaic retro structure with no aesthetic vision, in the middle of a parking lot that tries to compensate with busy, distracting features. 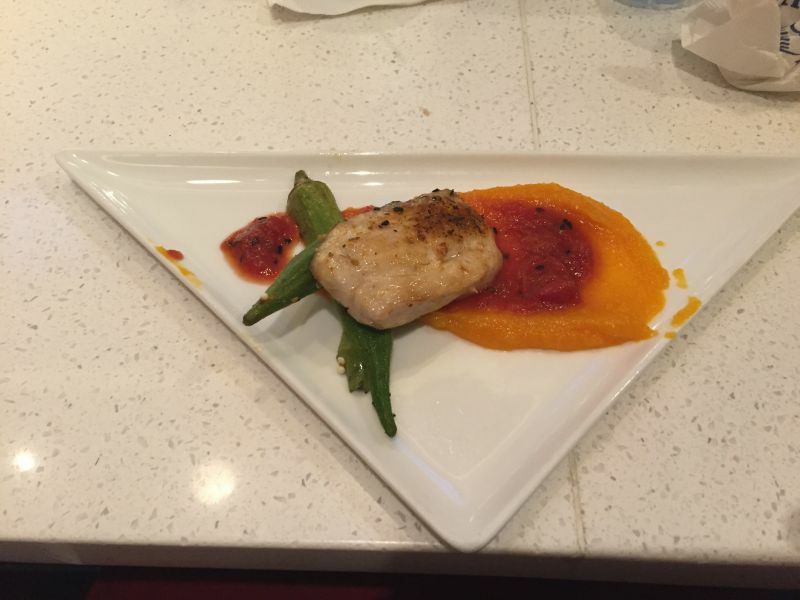 It’s really the worst of both worlds: bland and gimmicky. 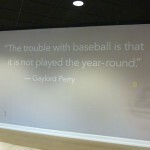 Objectively, it has very little going for it as well. 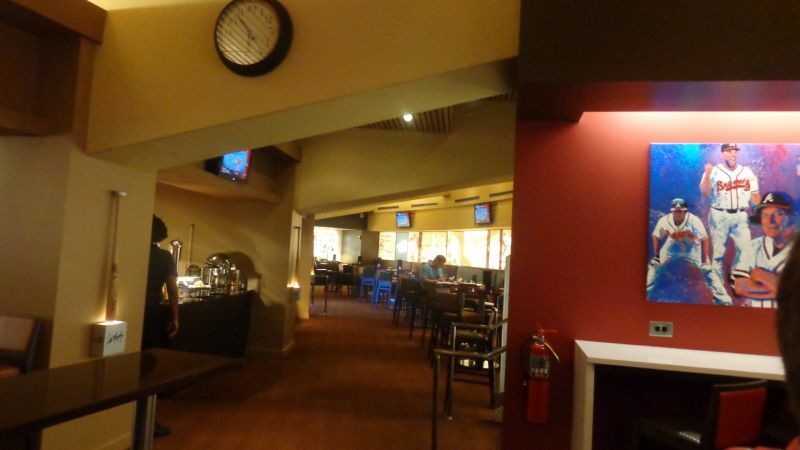 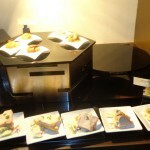 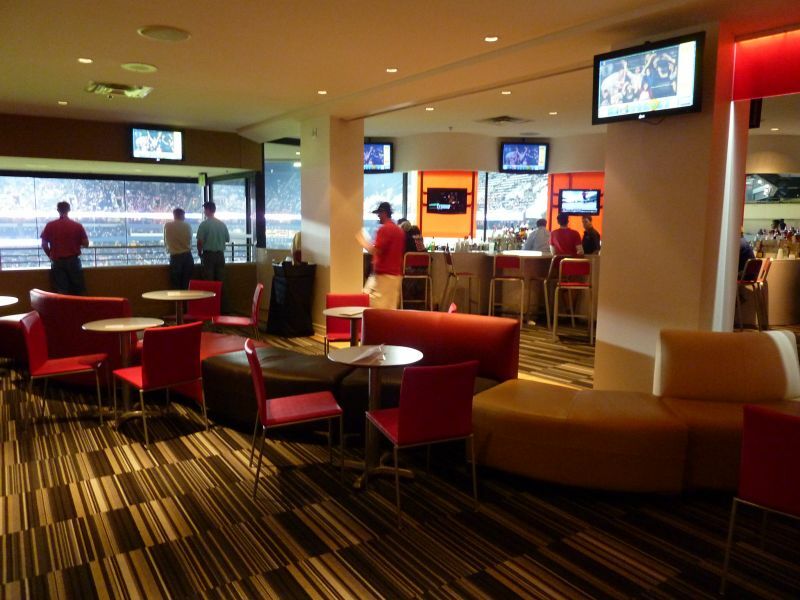 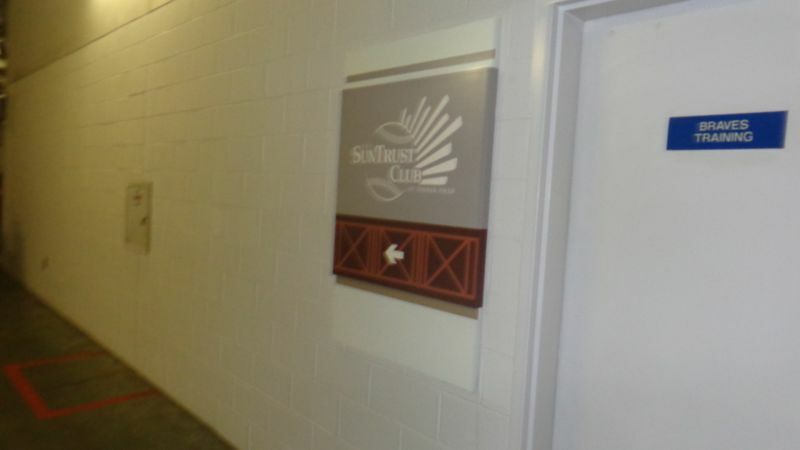 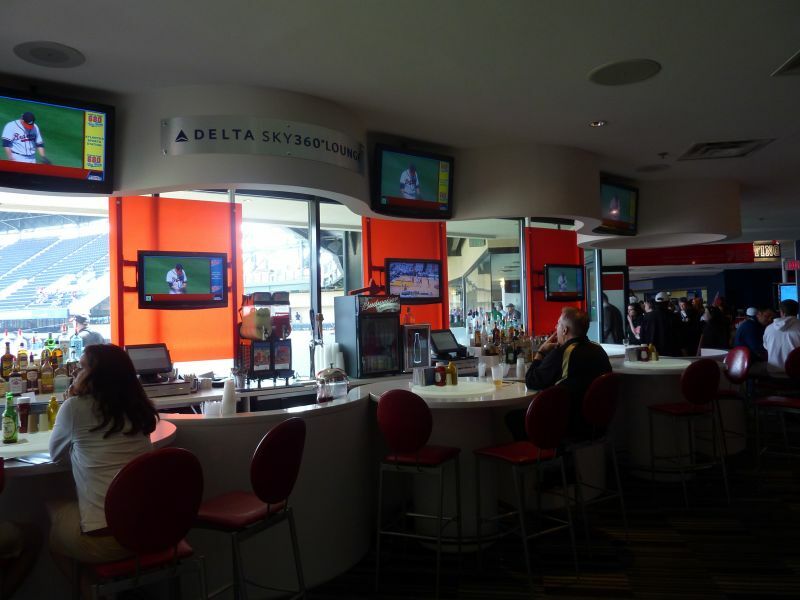 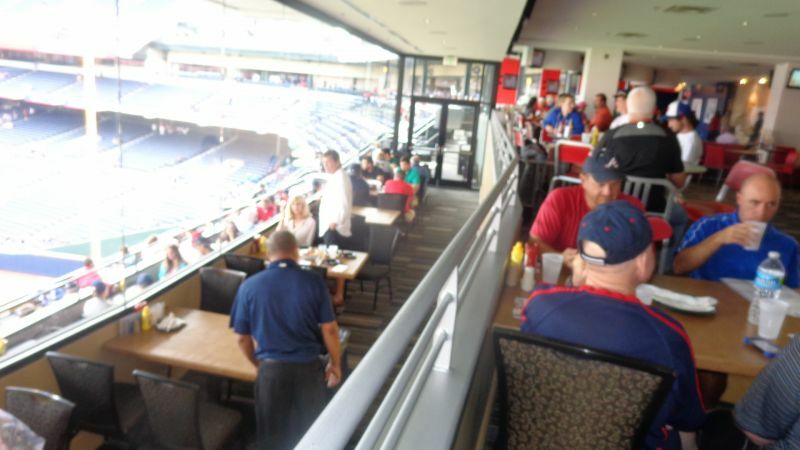 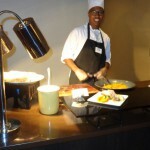 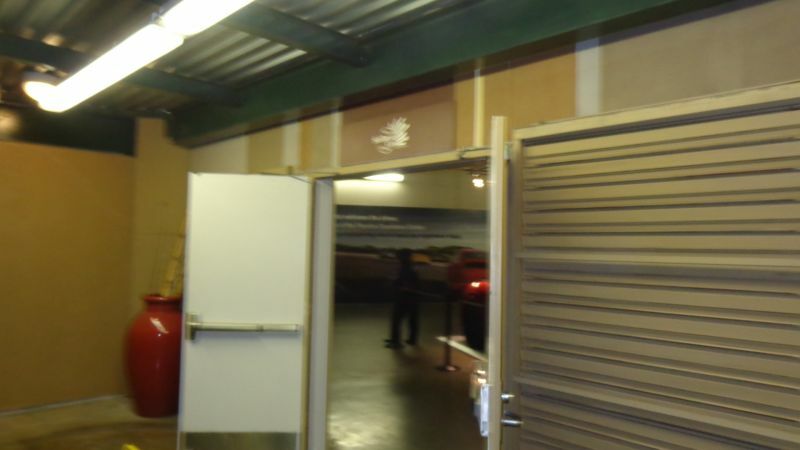 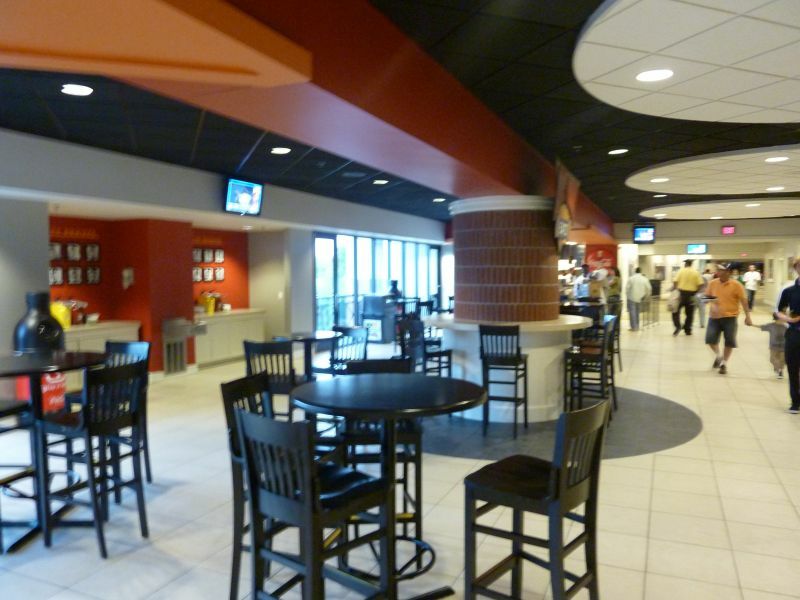 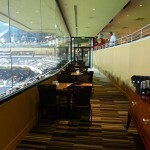 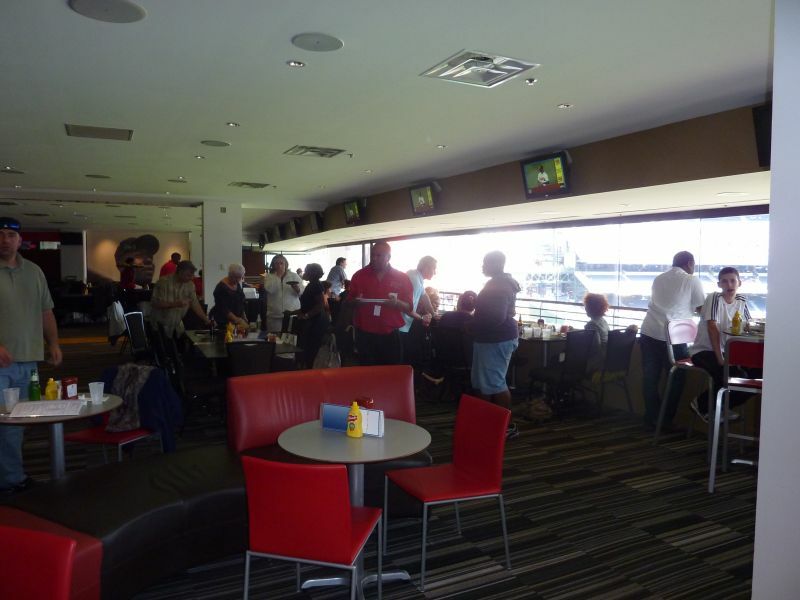 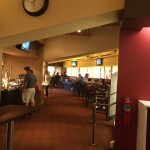 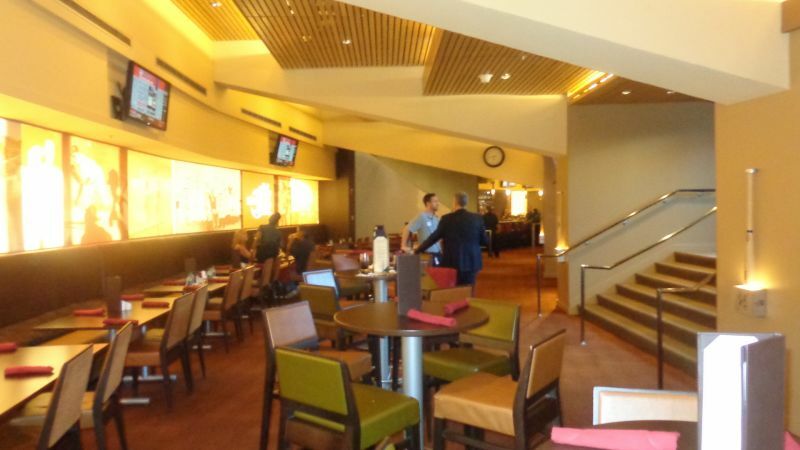 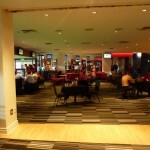 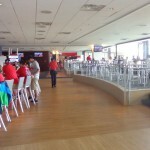 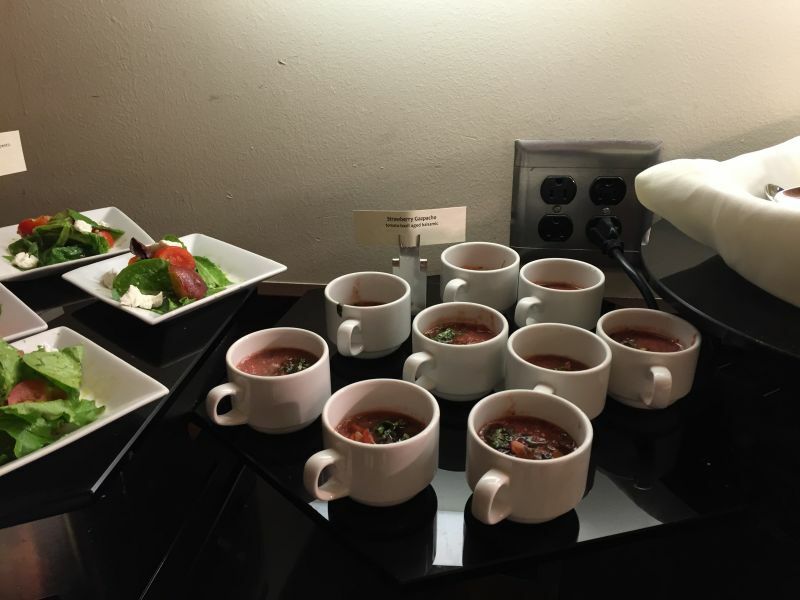 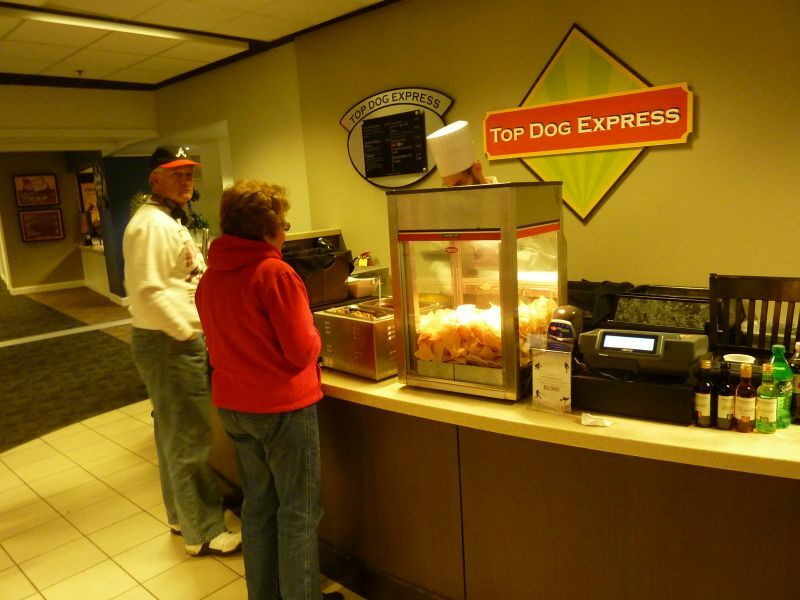 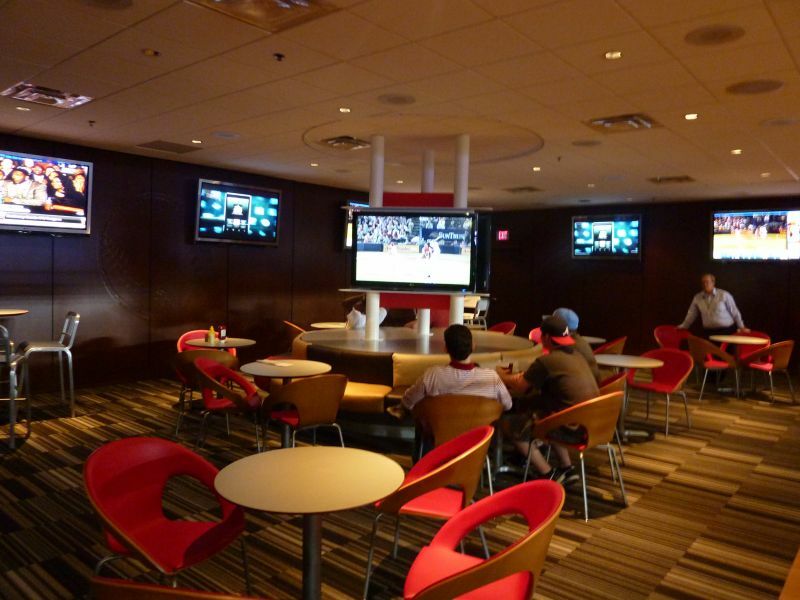 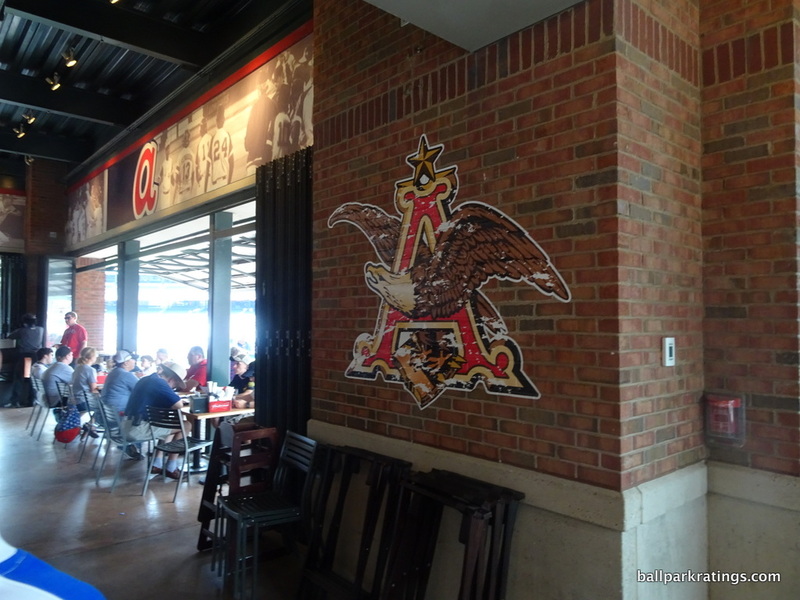 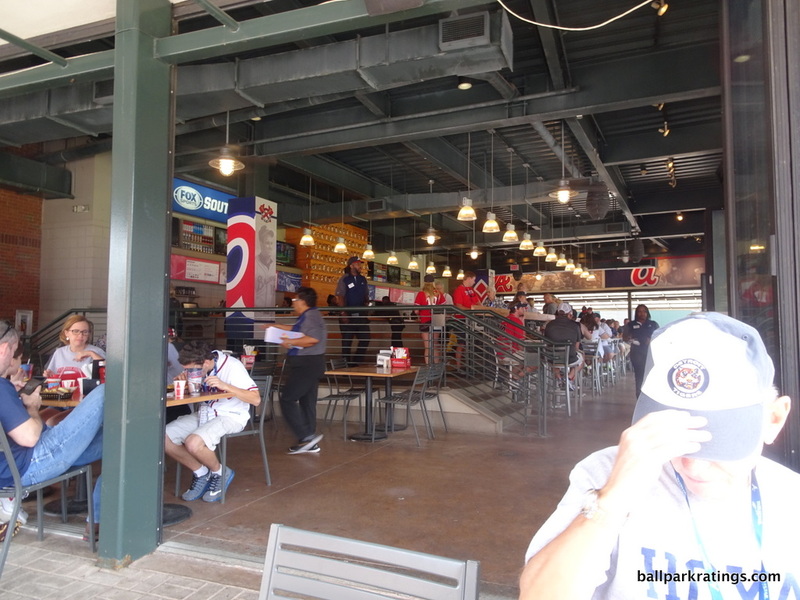 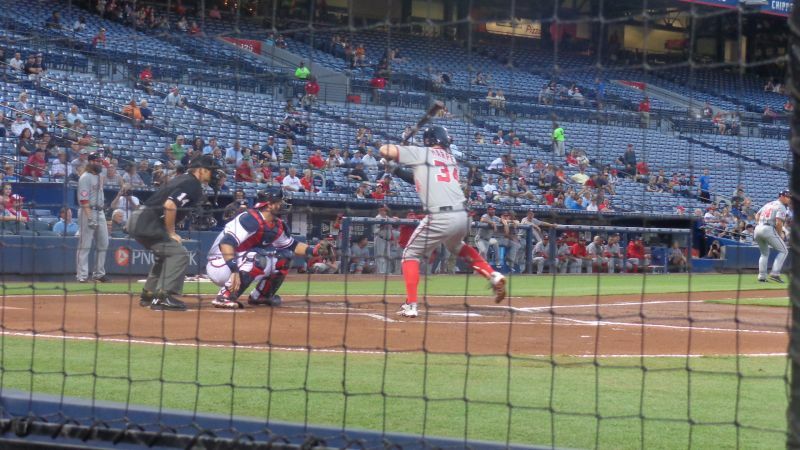 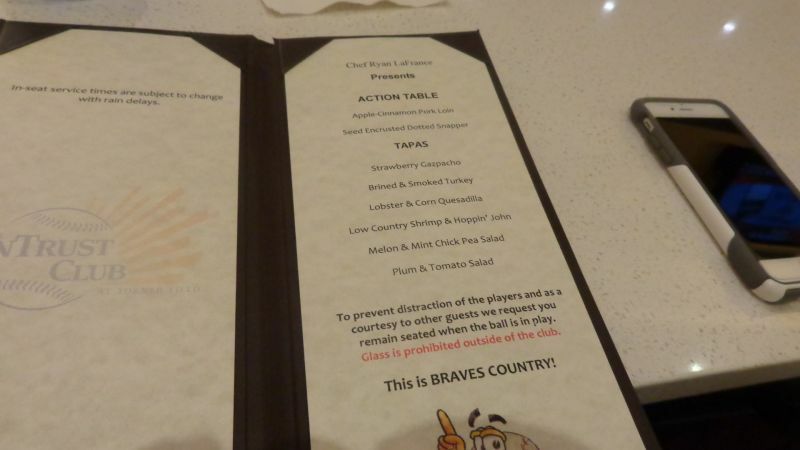 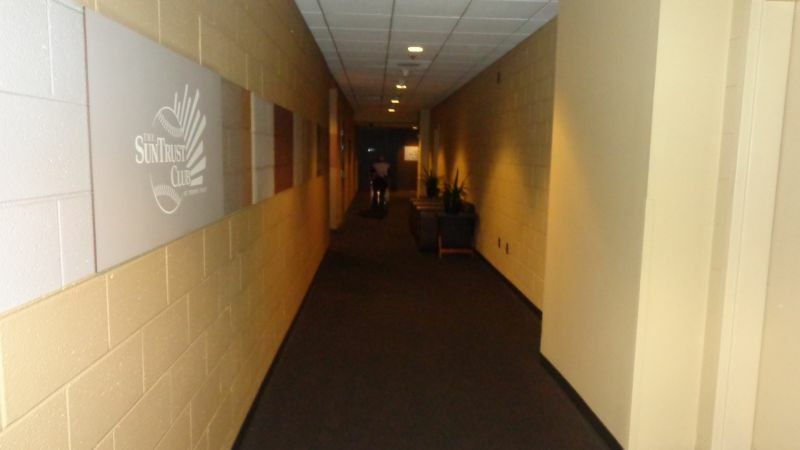 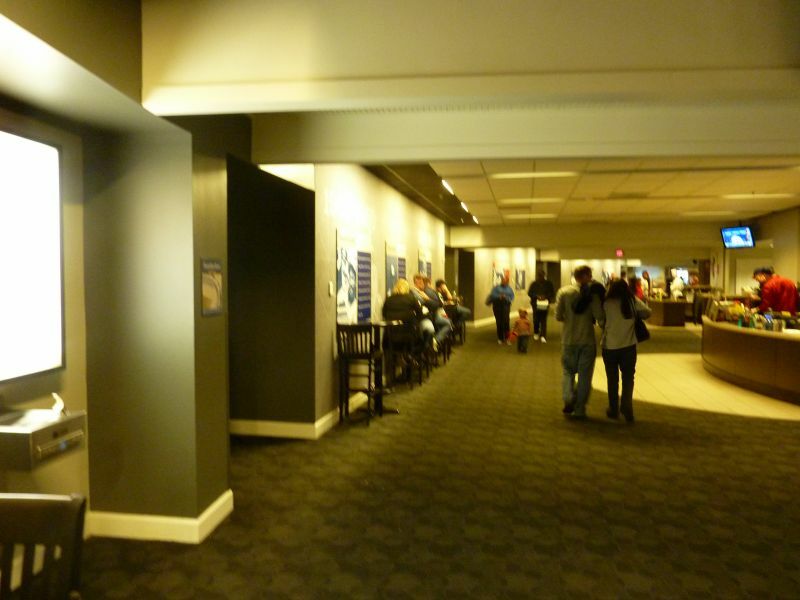 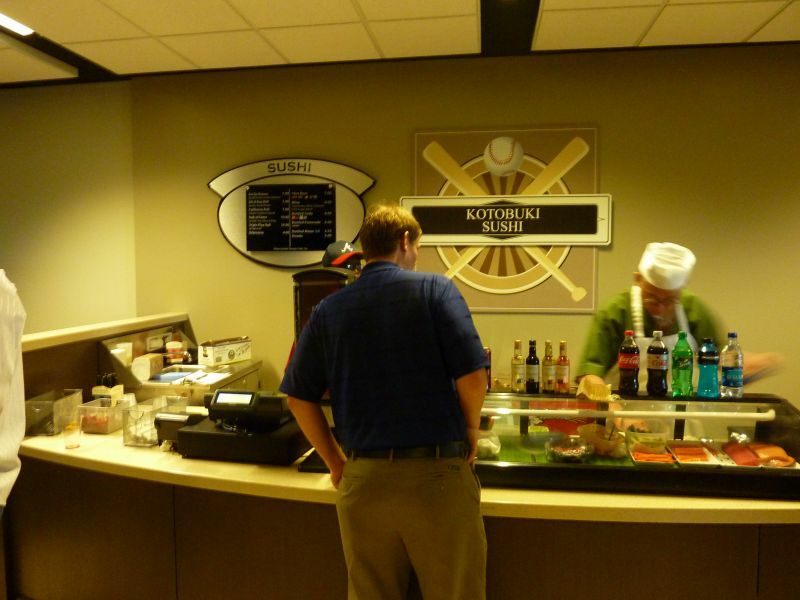 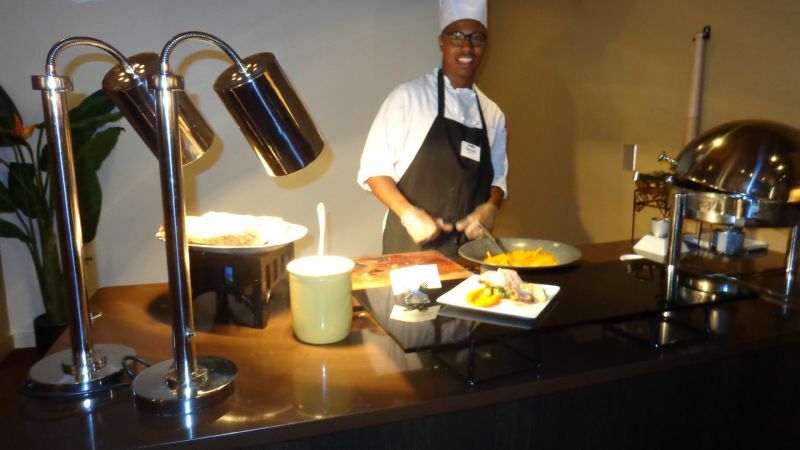 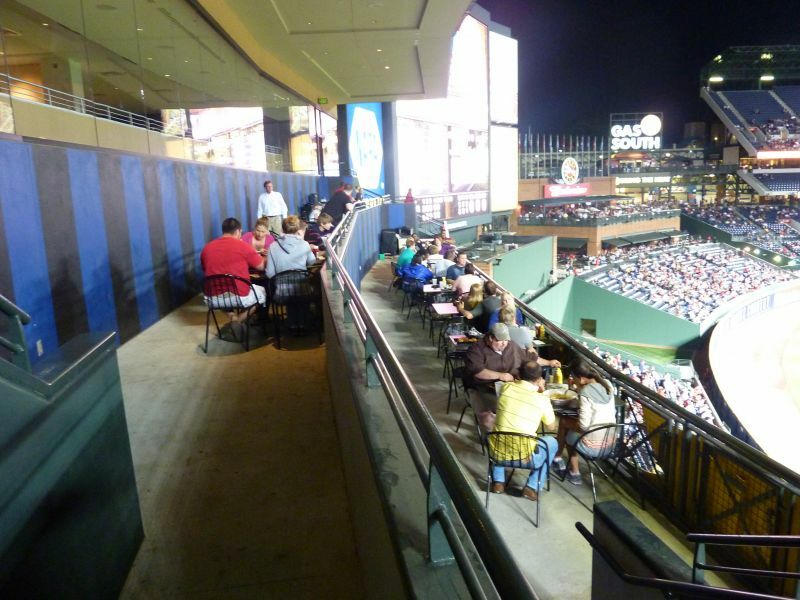 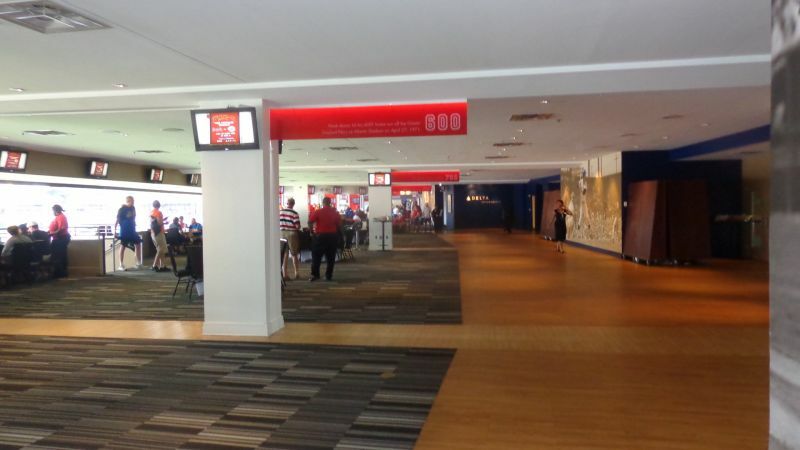 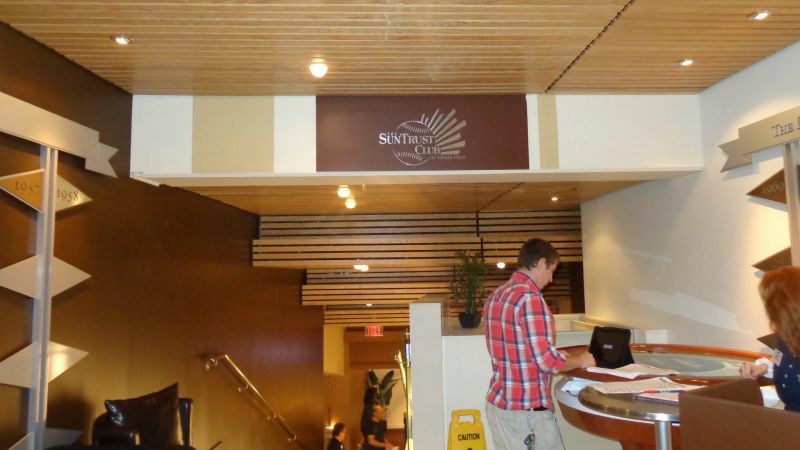 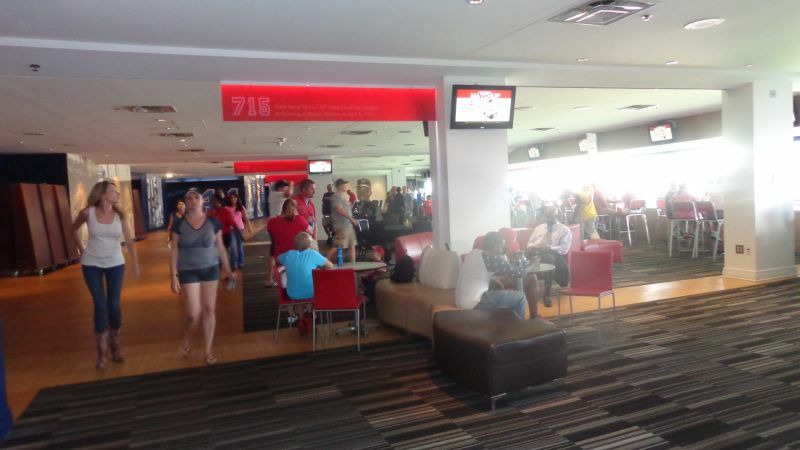 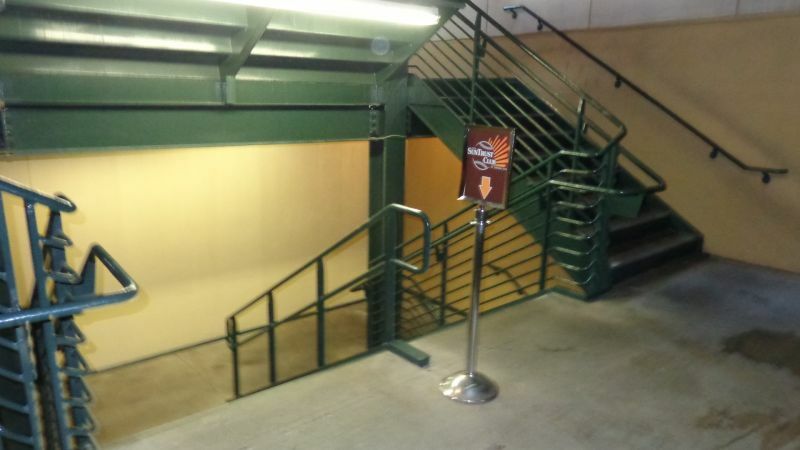 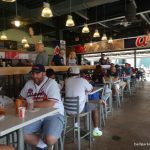 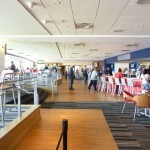 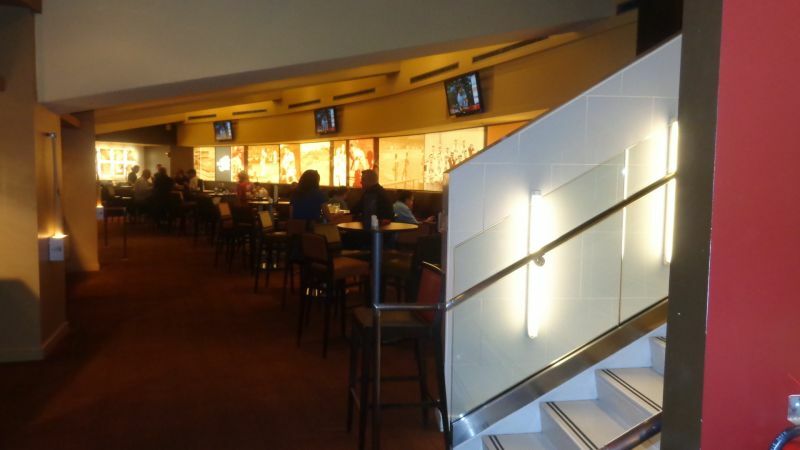 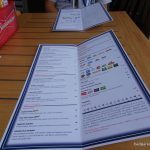 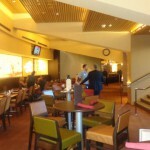 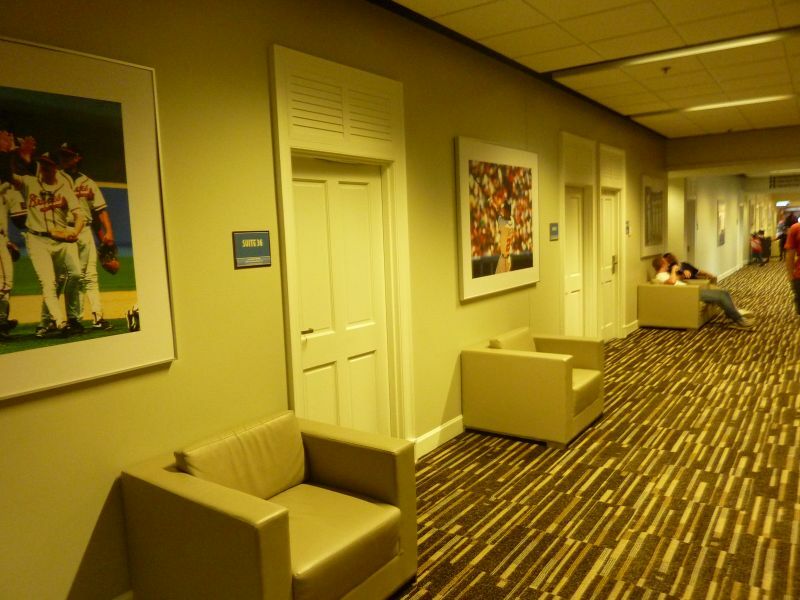 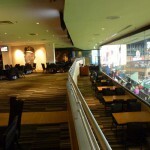 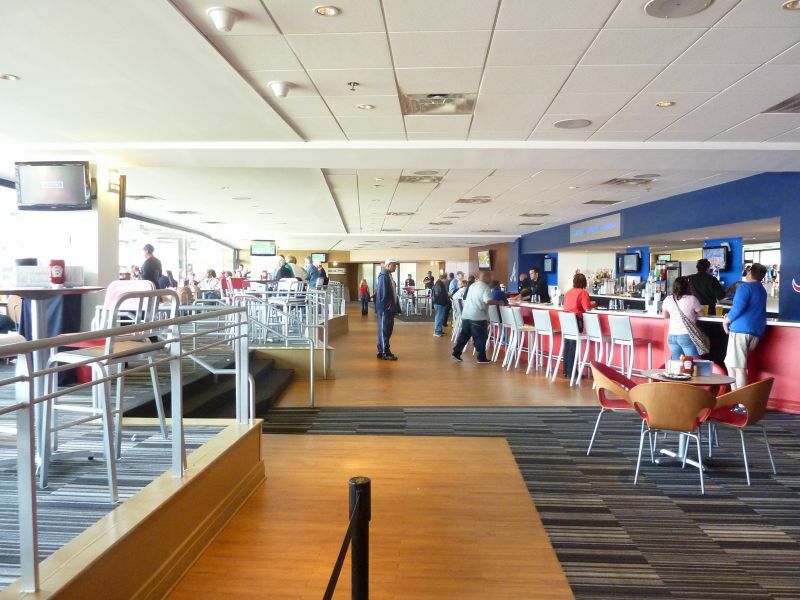 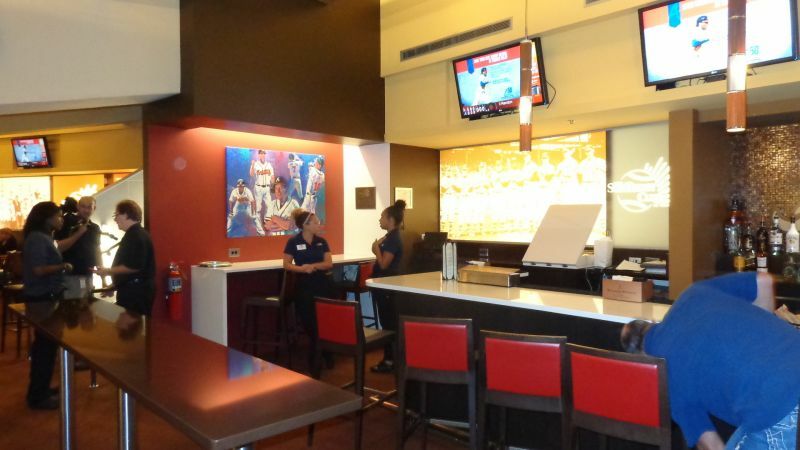 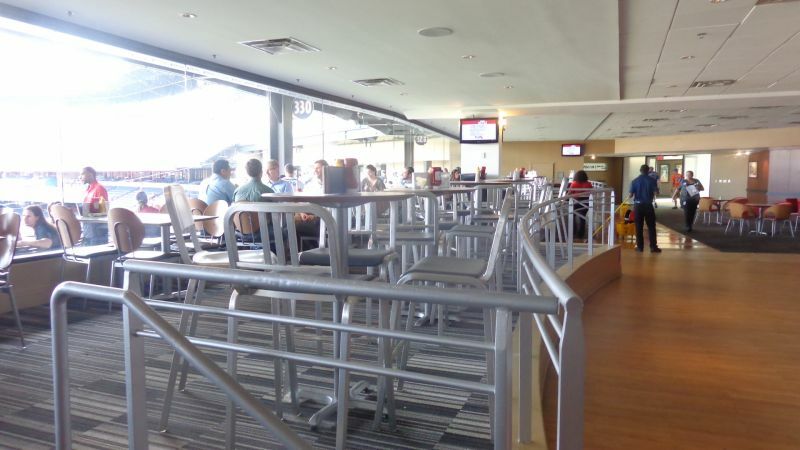 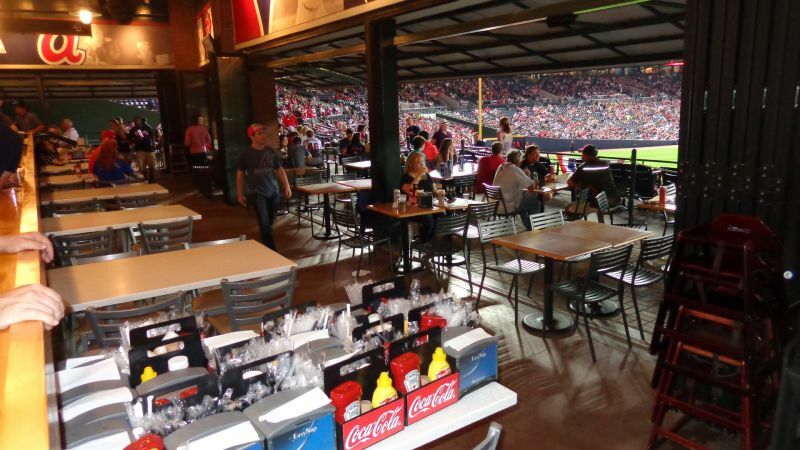 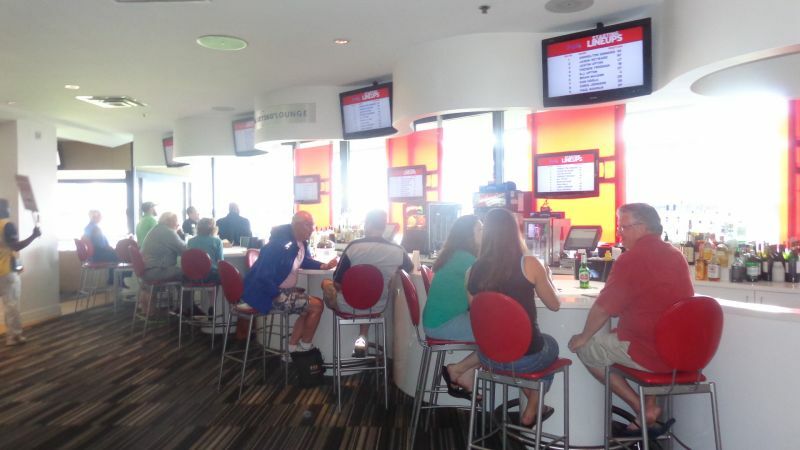 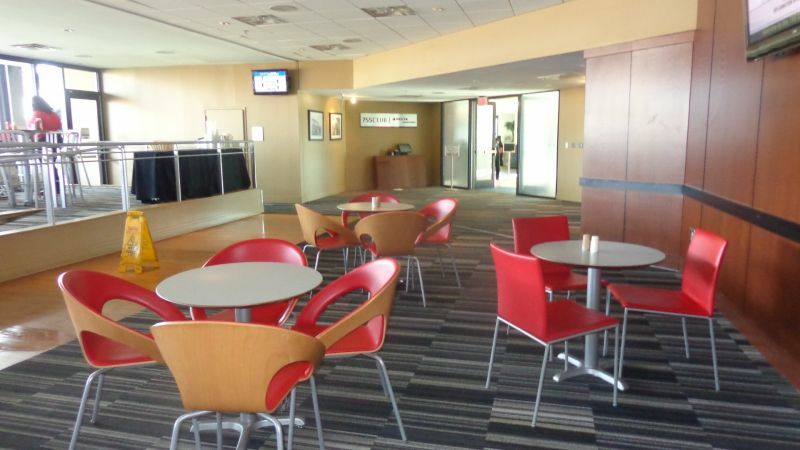 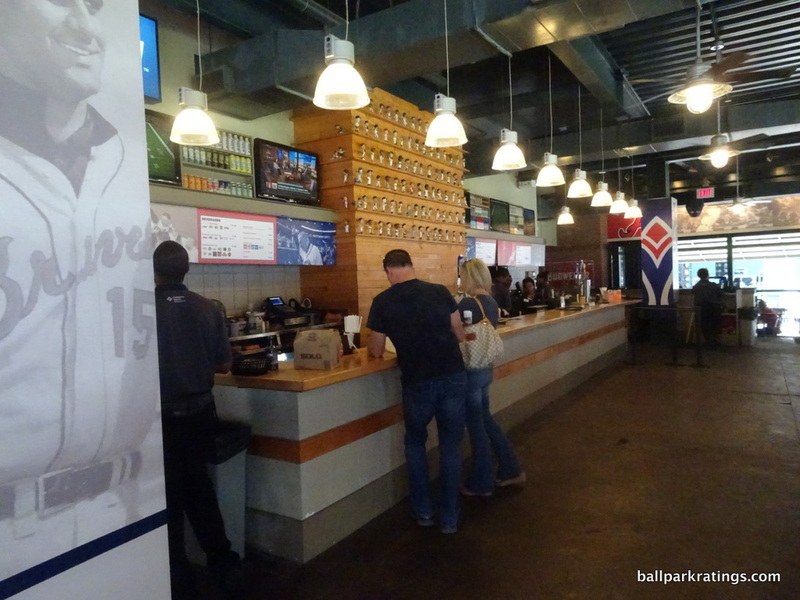 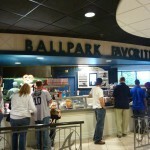 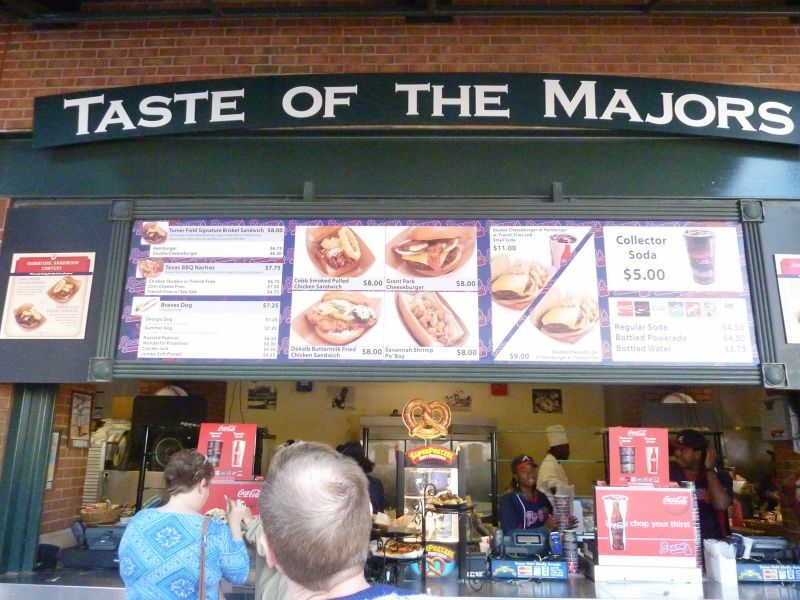 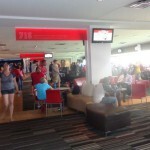 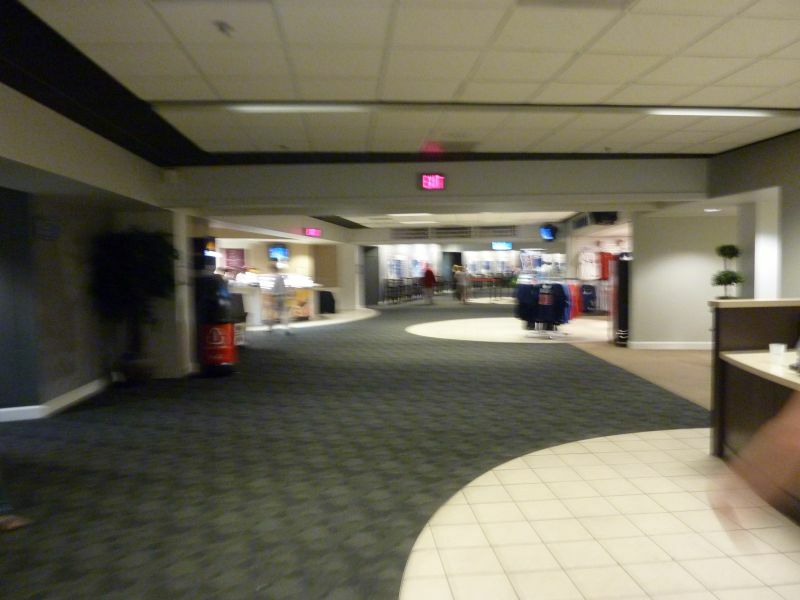 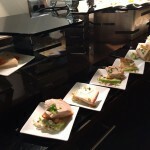 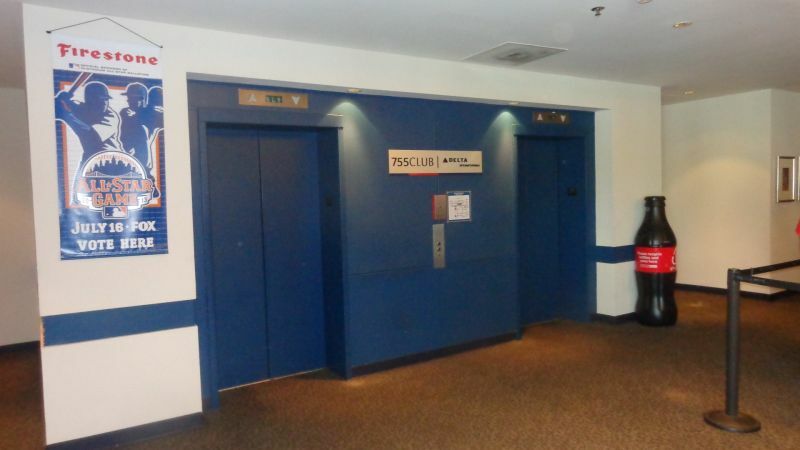 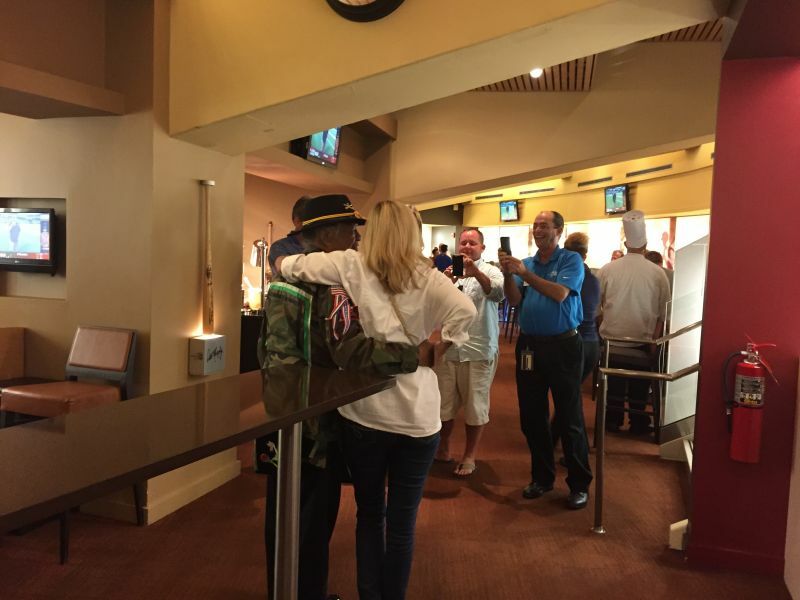 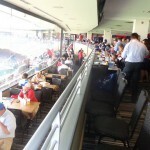 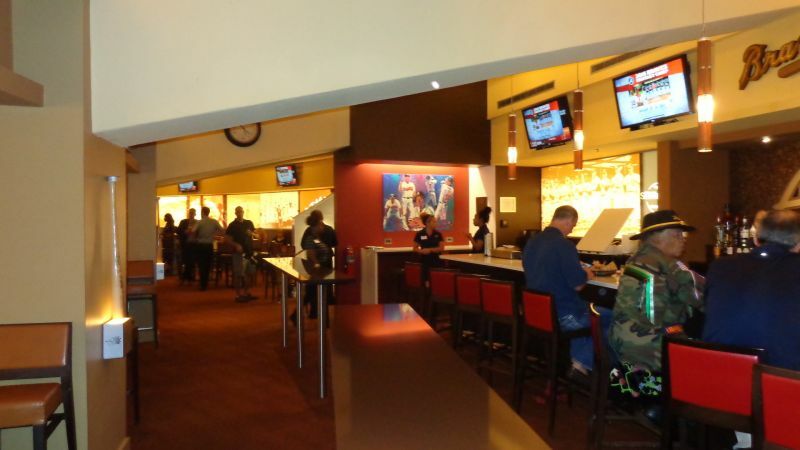 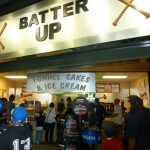 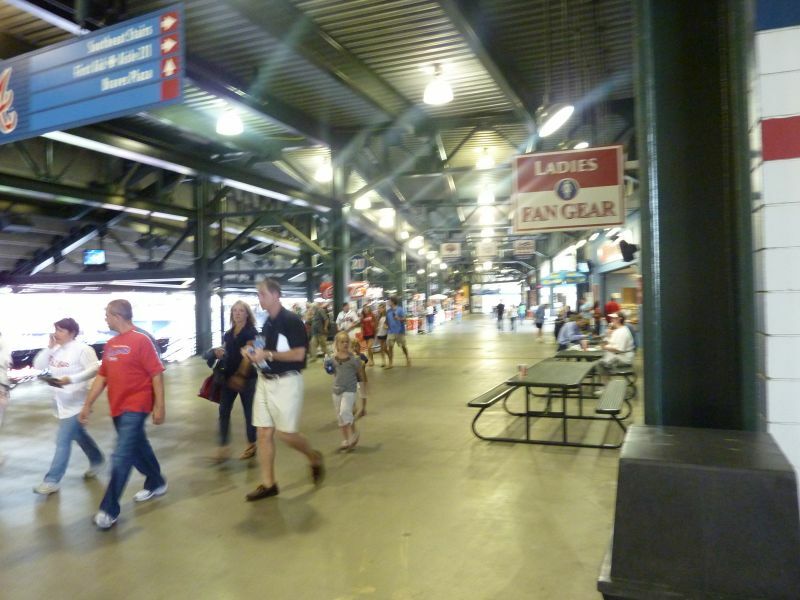 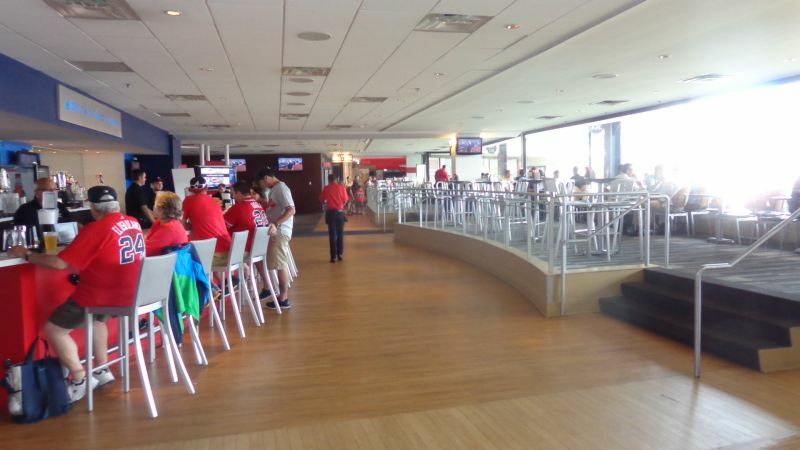 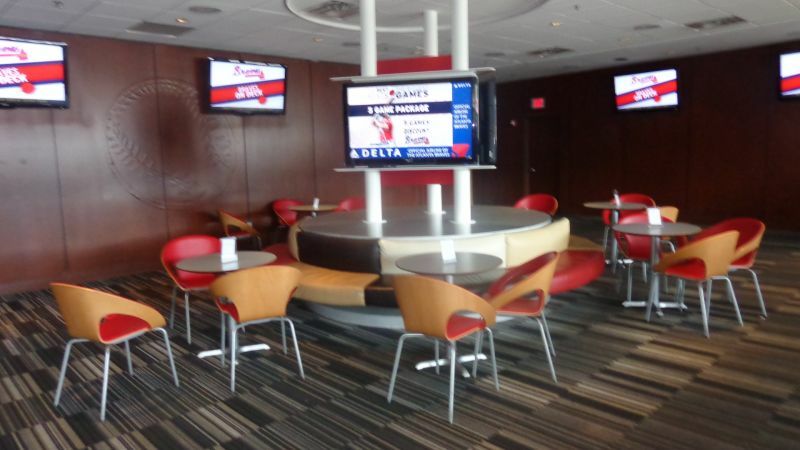 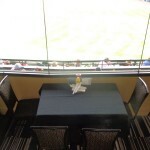 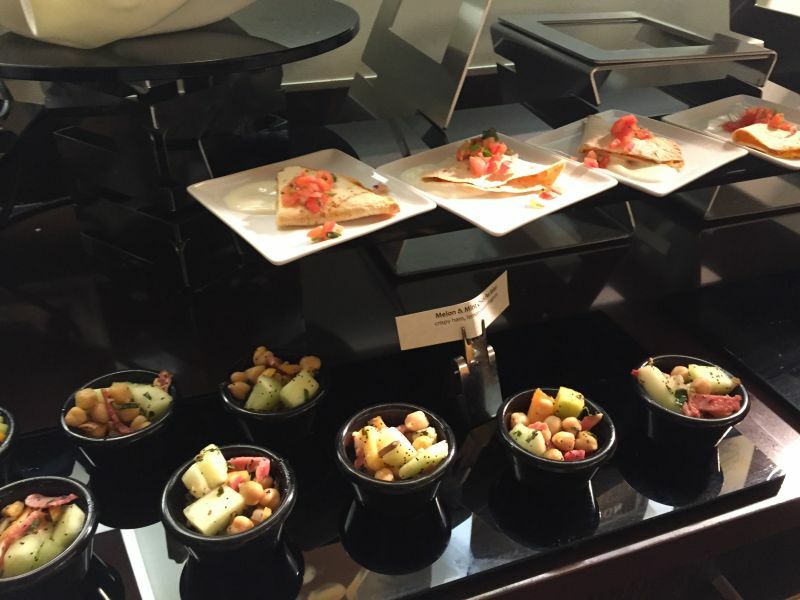 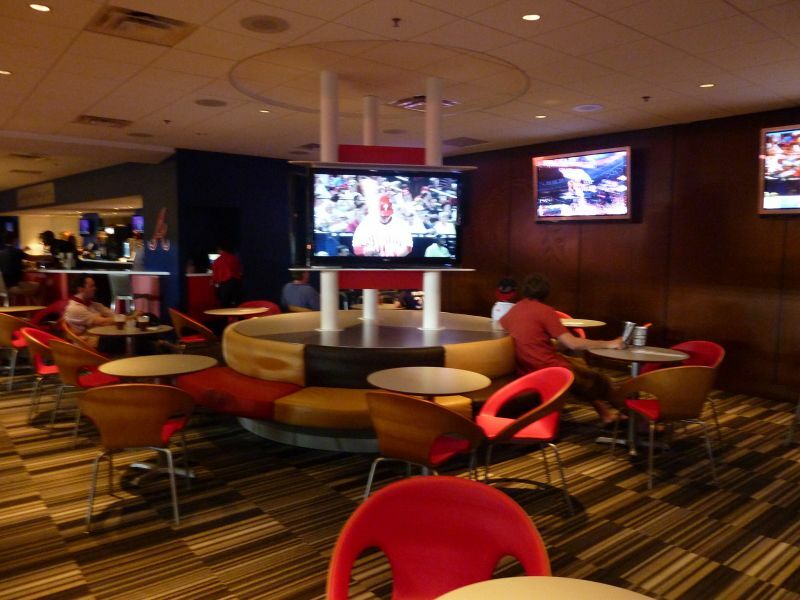 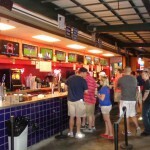 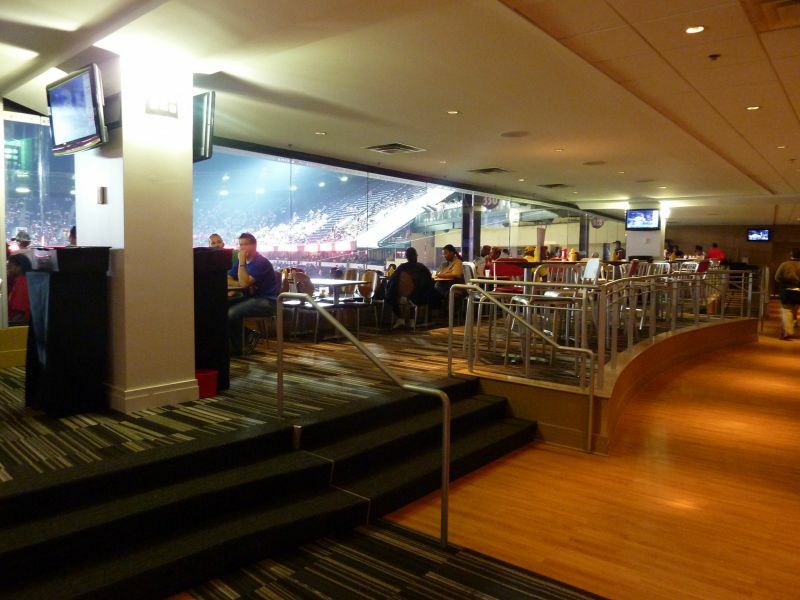 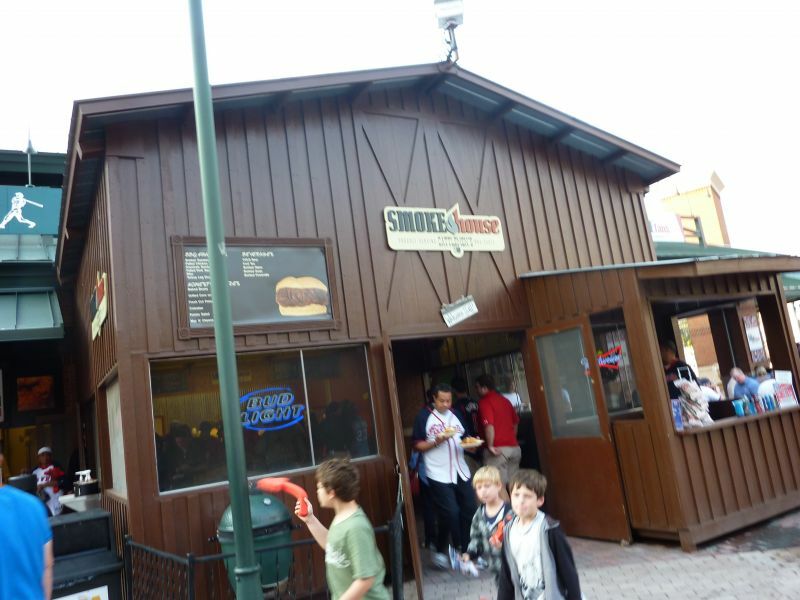 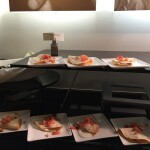 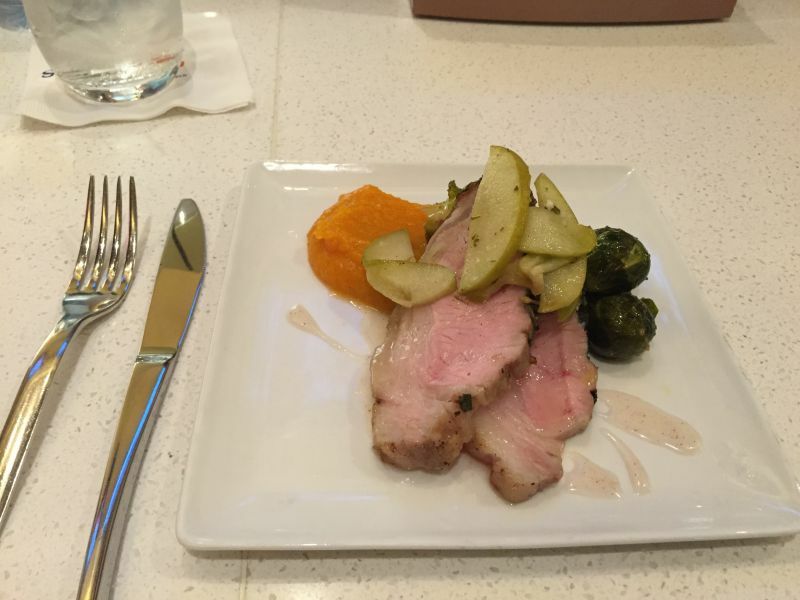 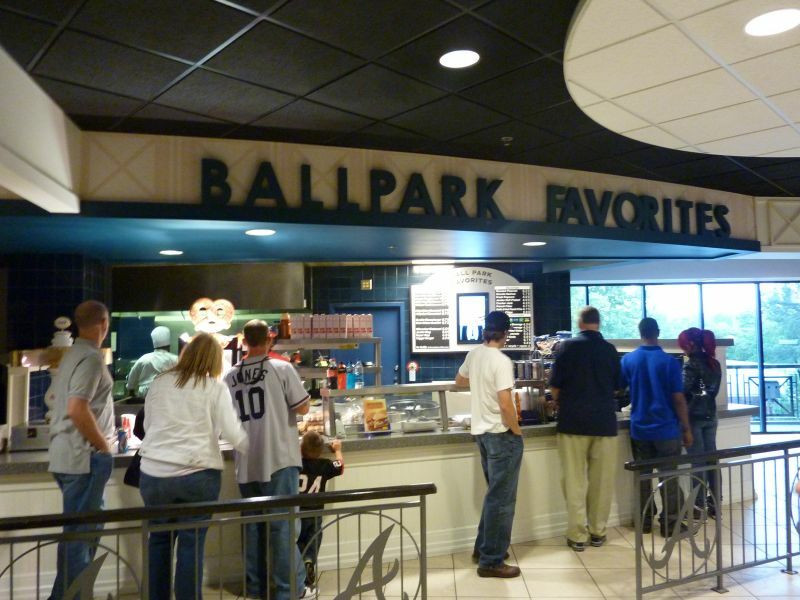 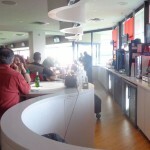 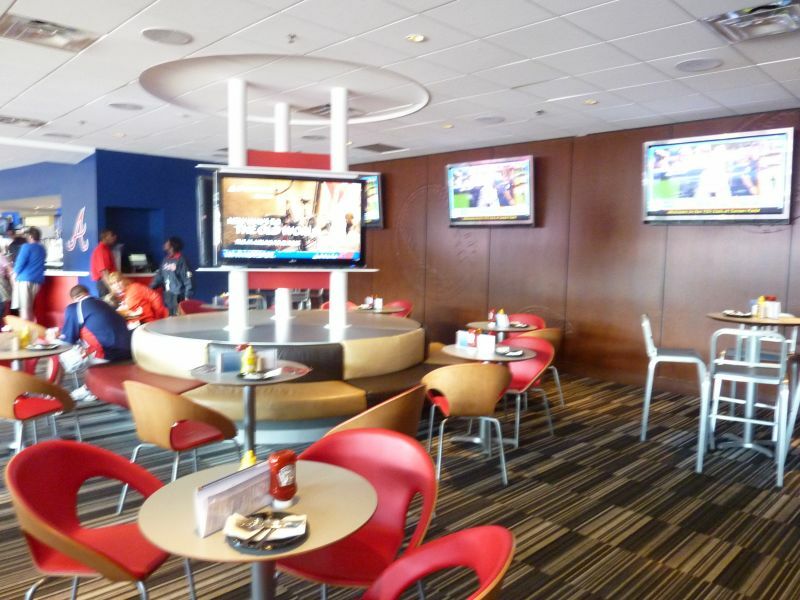 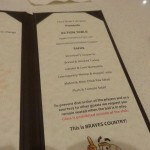 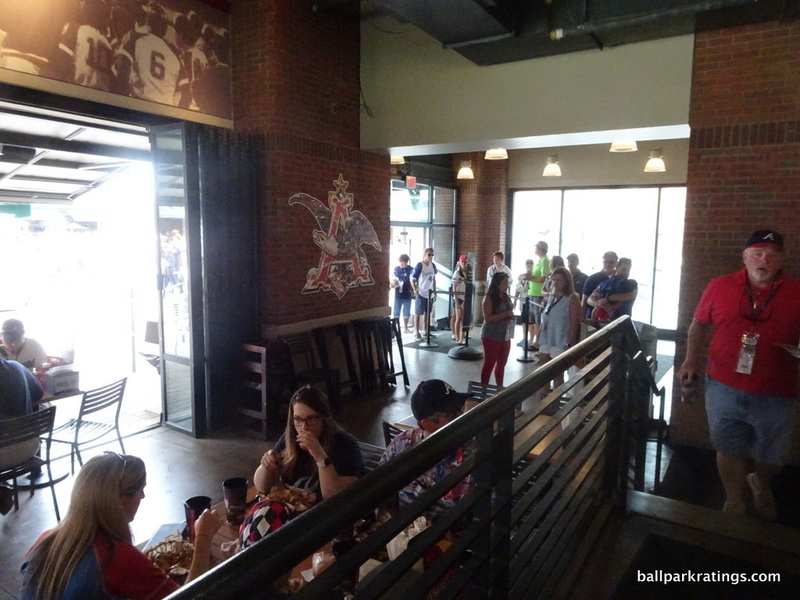 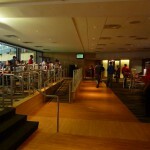 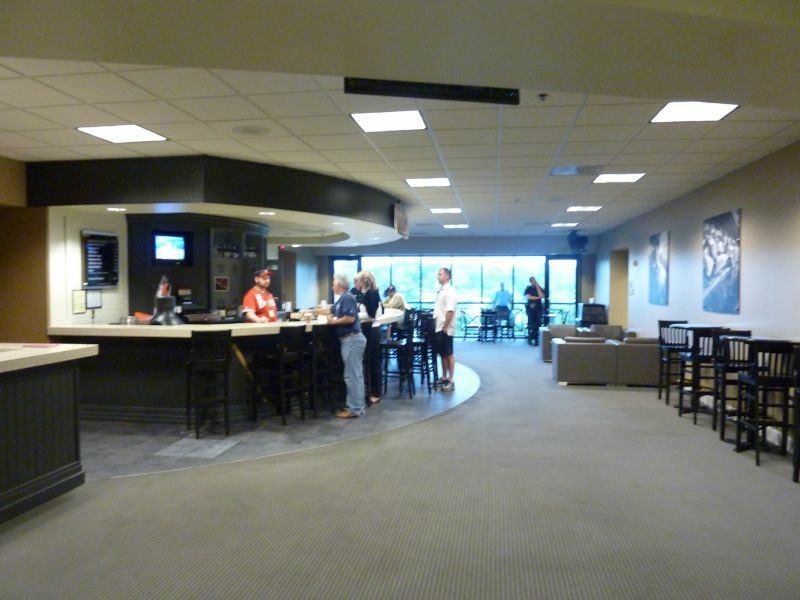 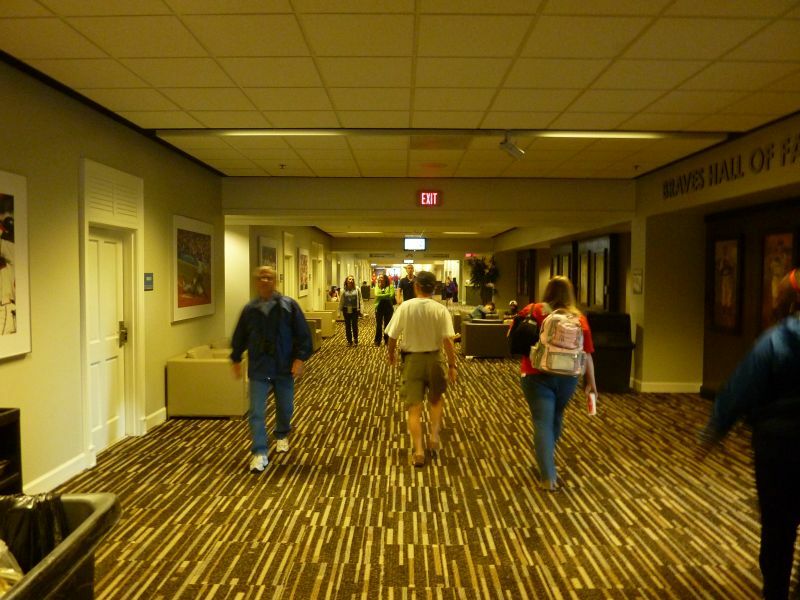 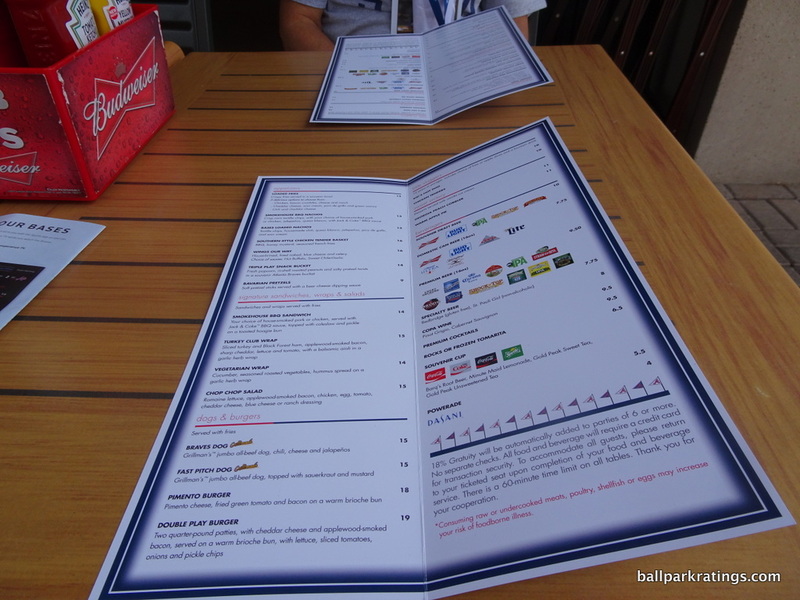 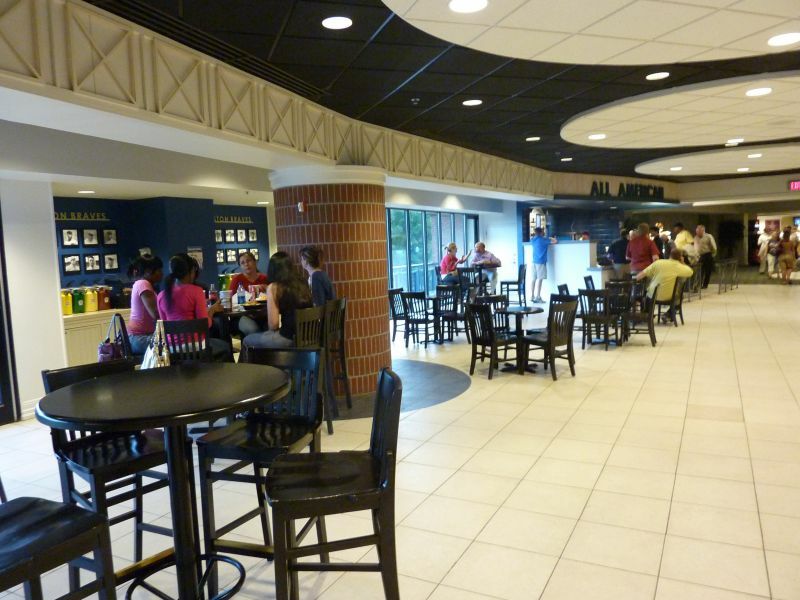 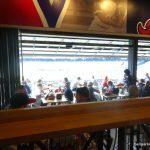 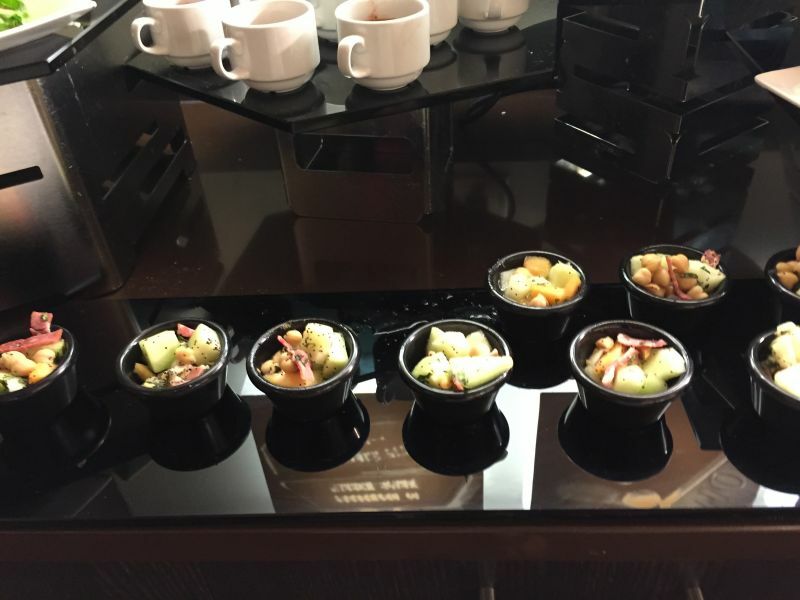 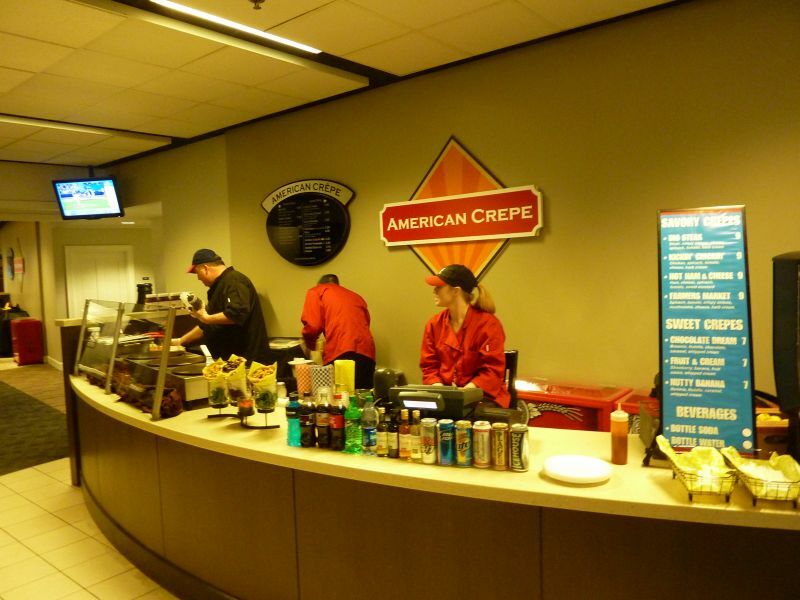 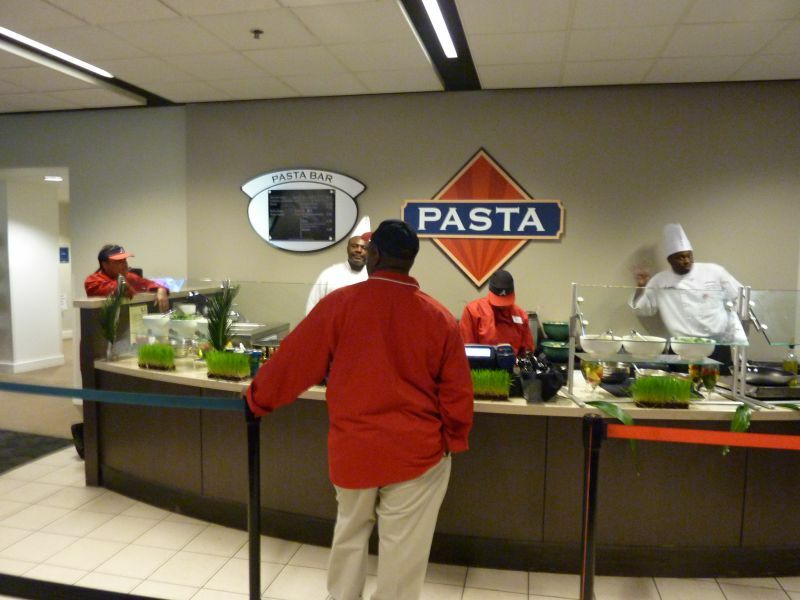 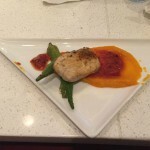 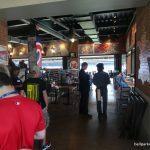 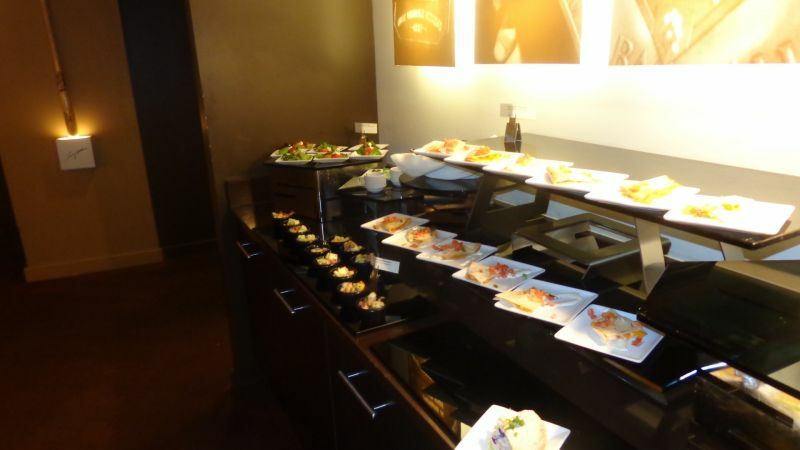 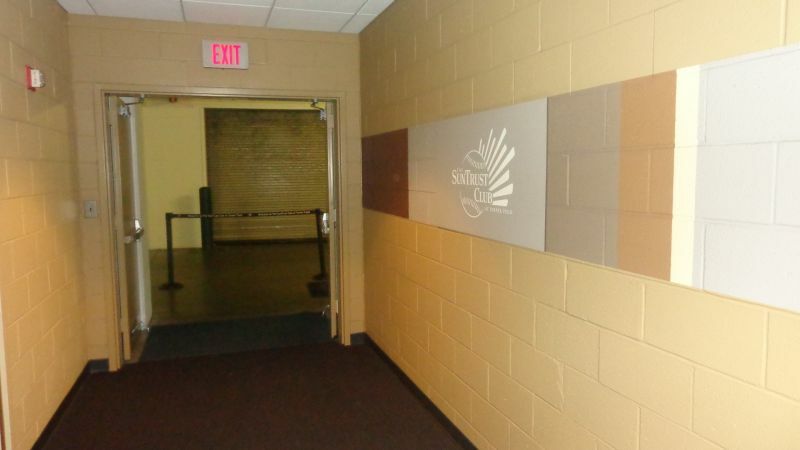 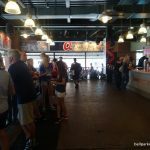 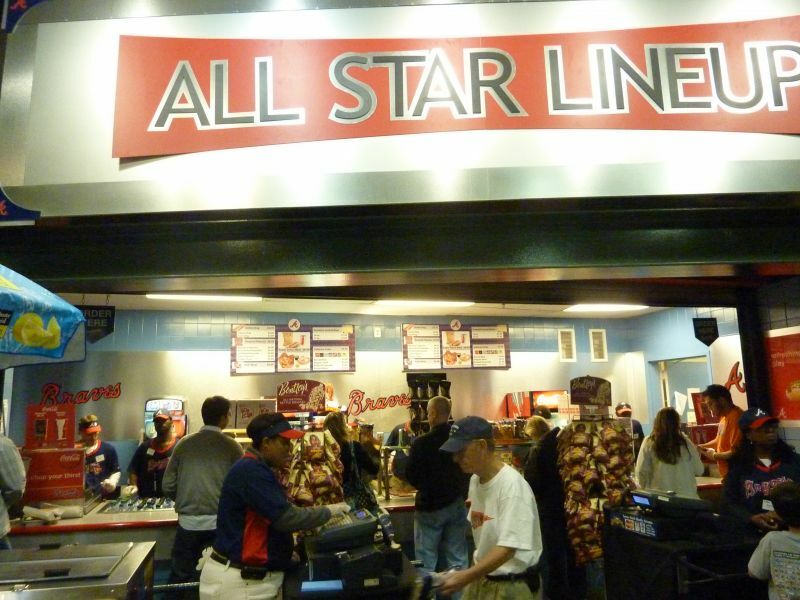 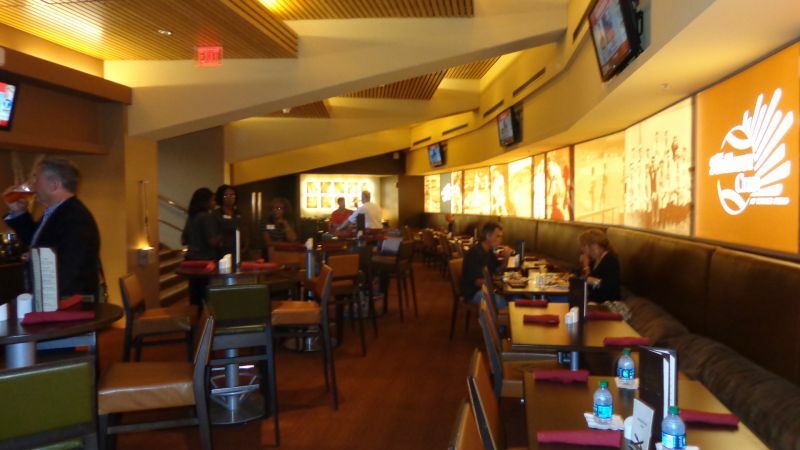 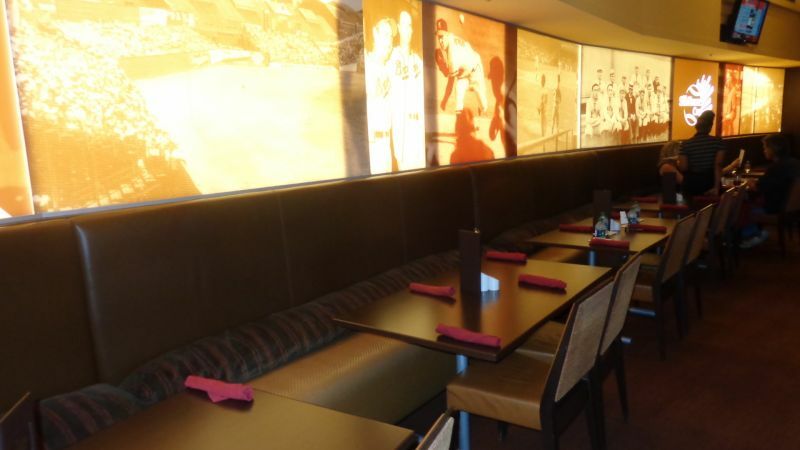 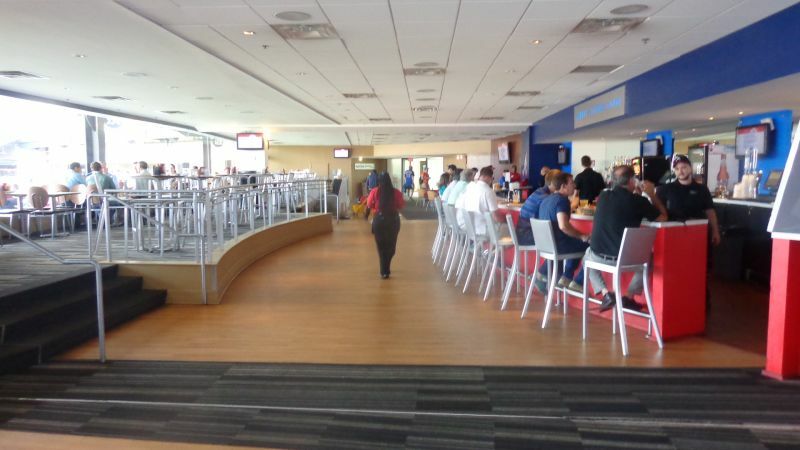 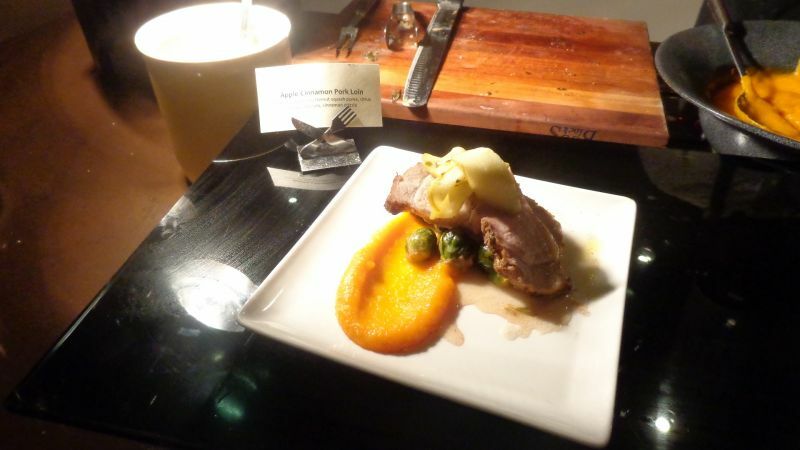 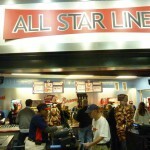 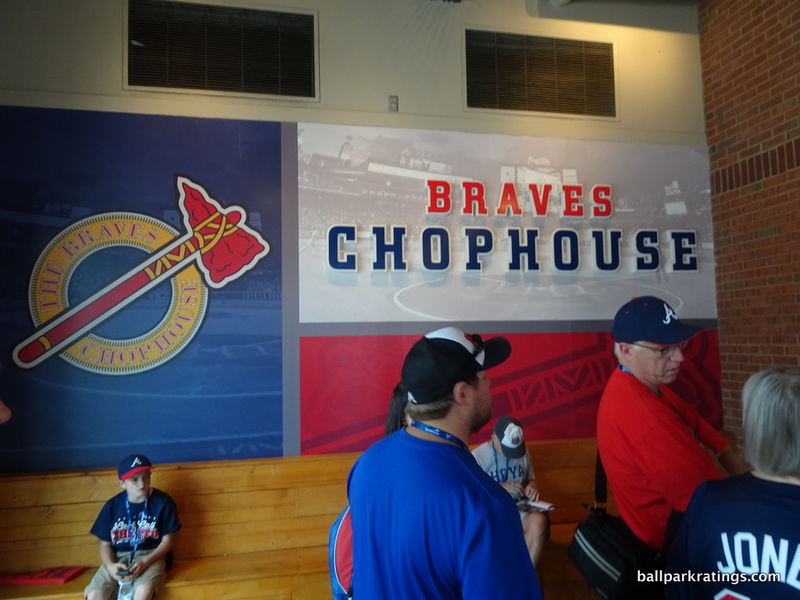 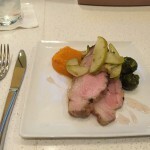 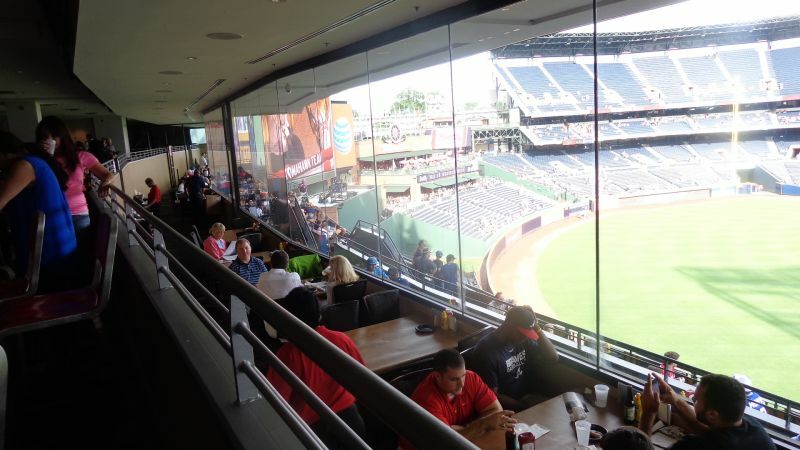 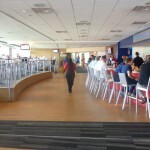 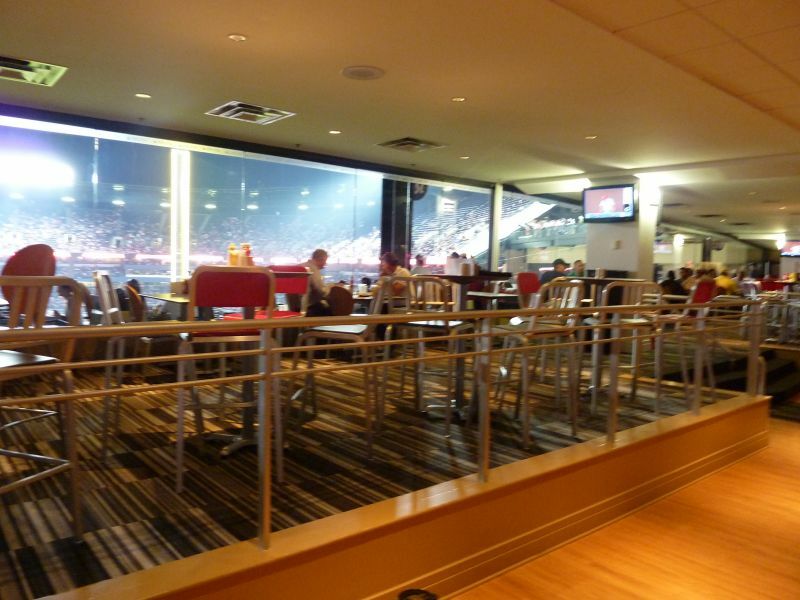 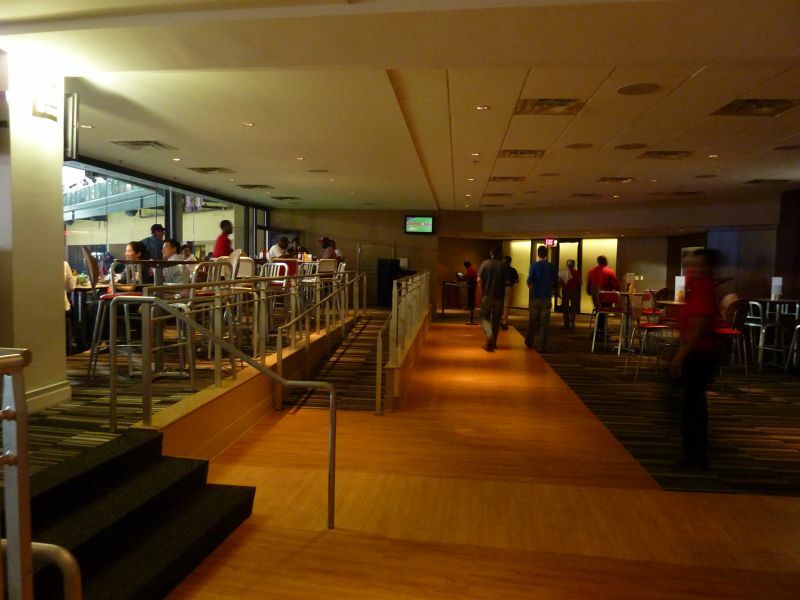 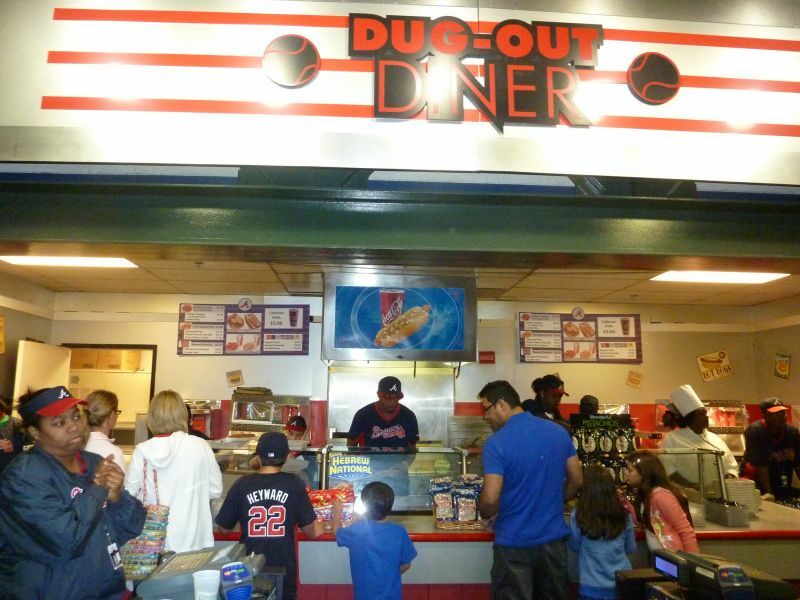 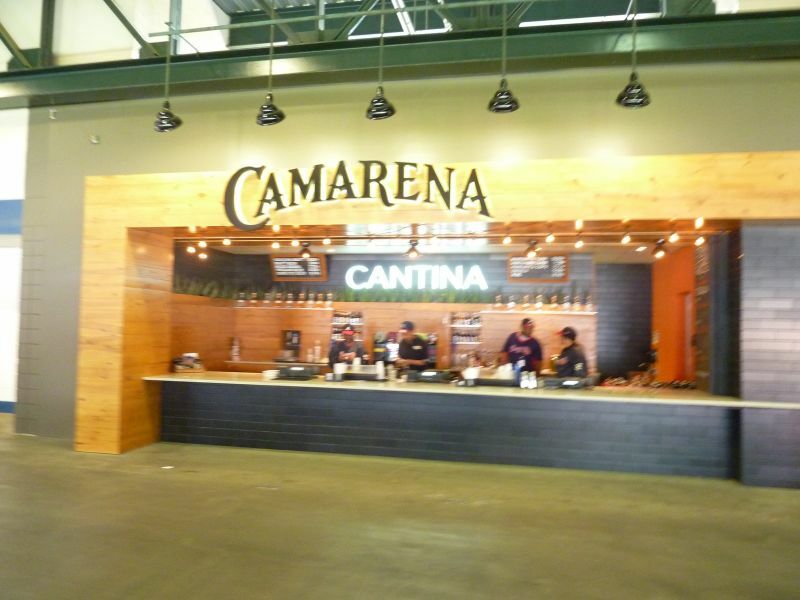 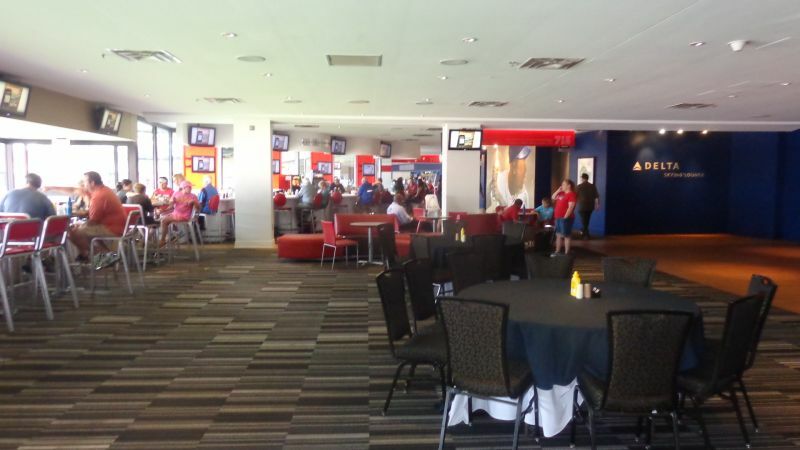 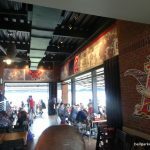 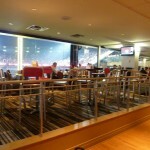 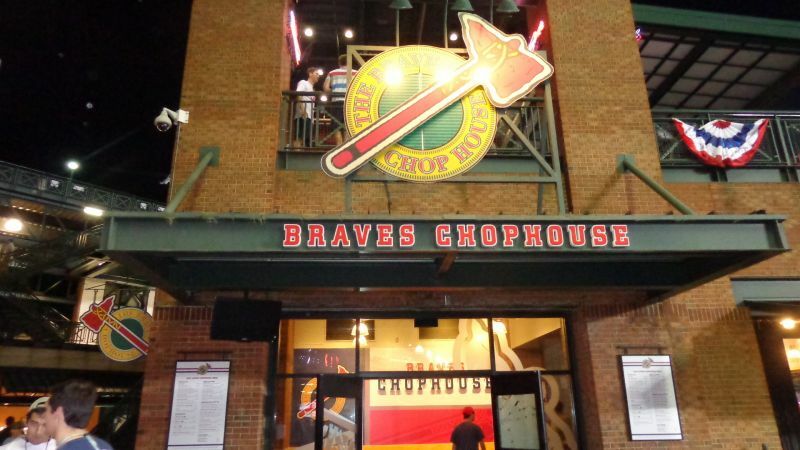 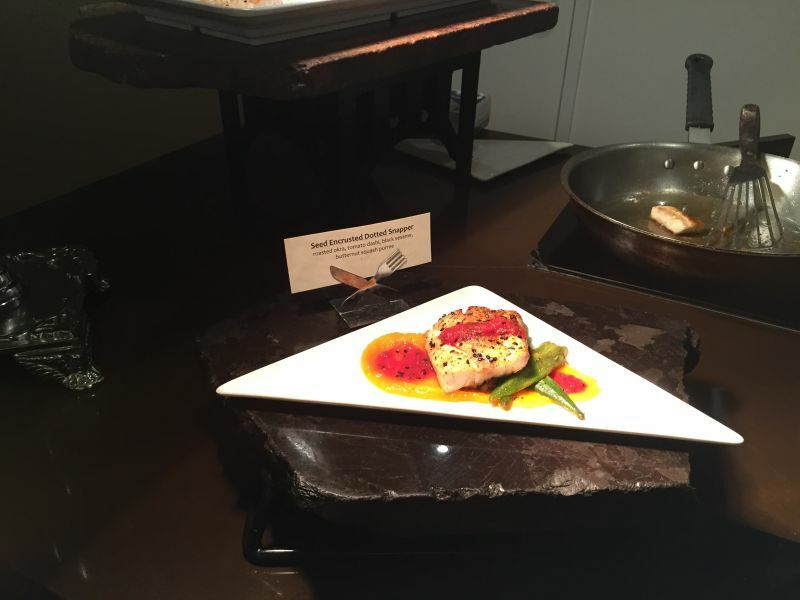 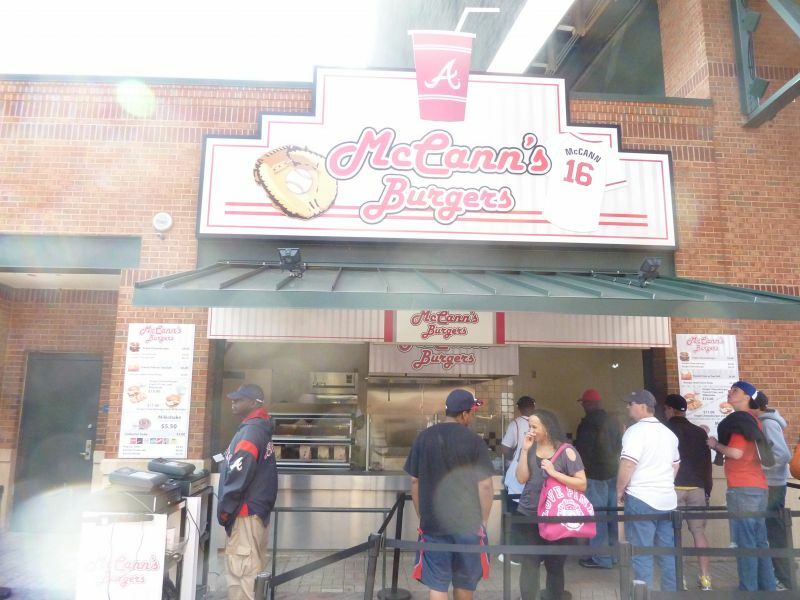 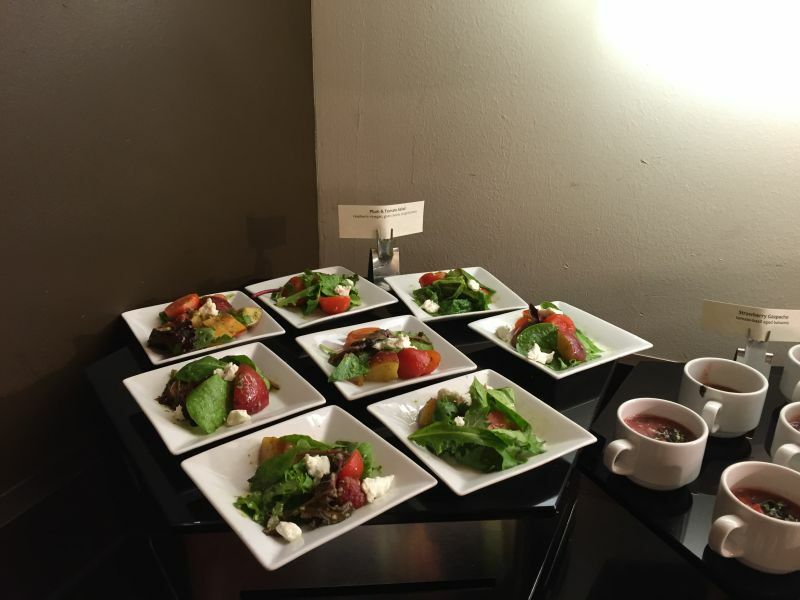 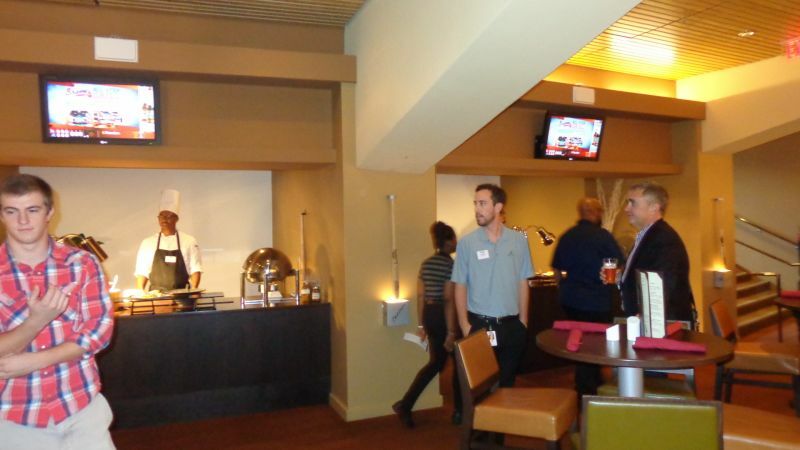 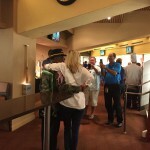 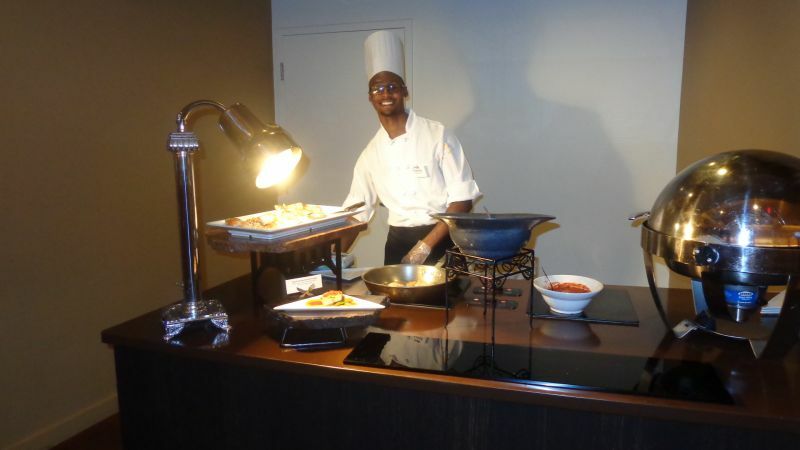 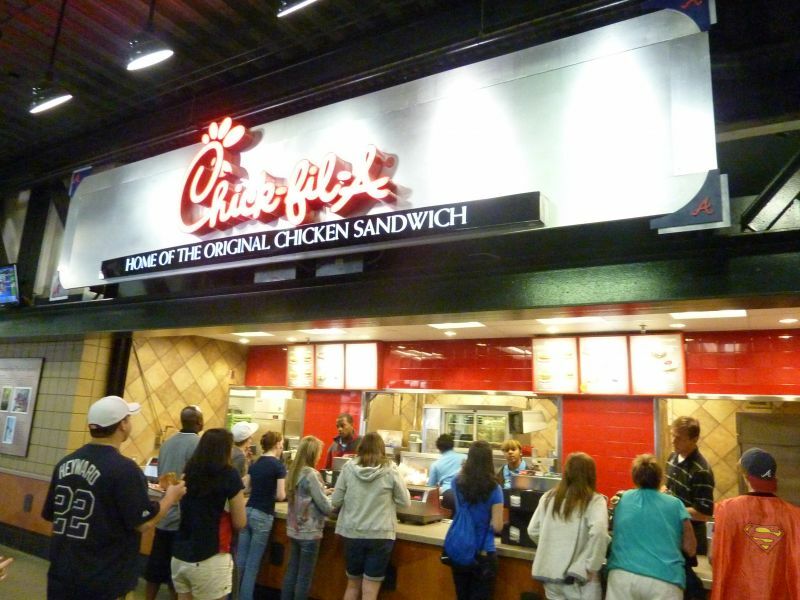 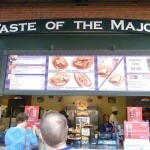 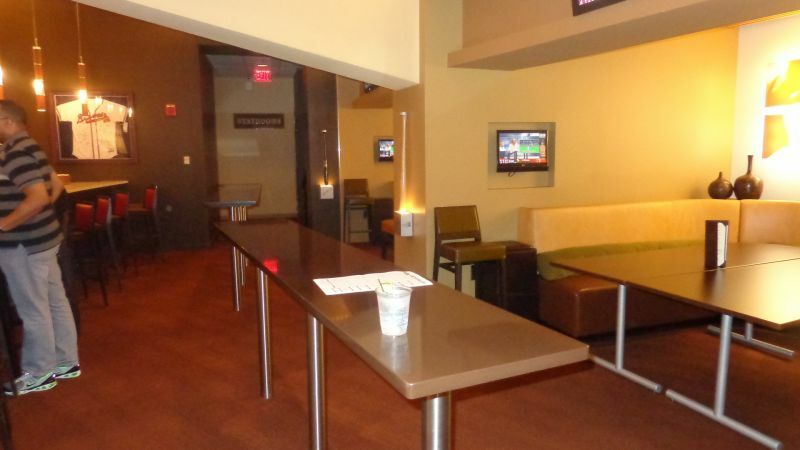 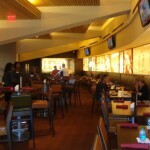 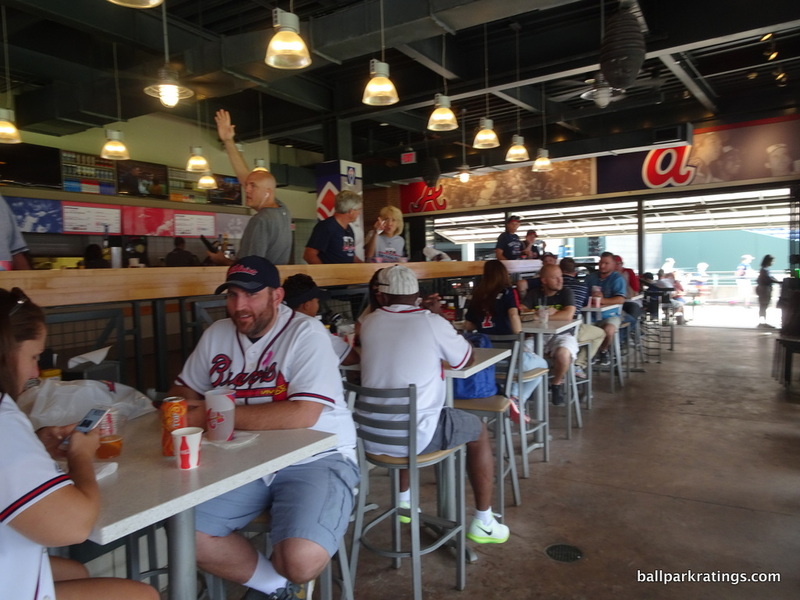 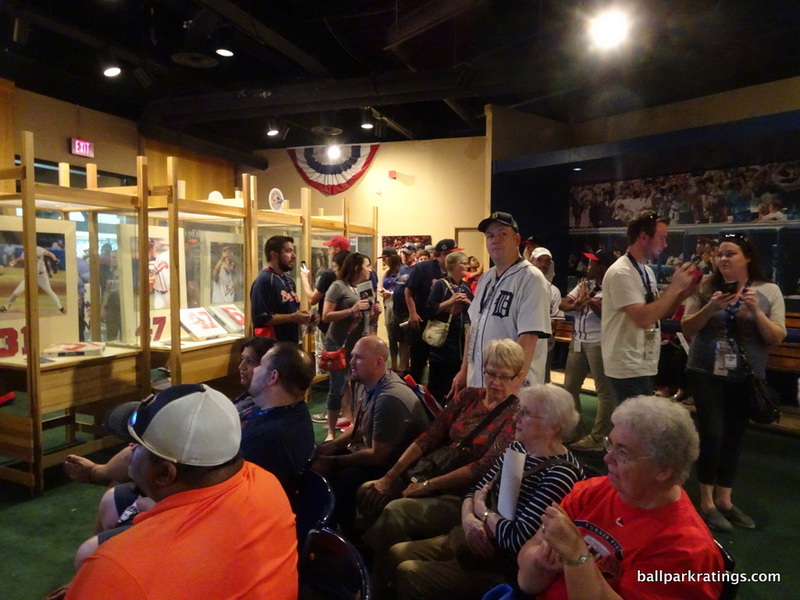 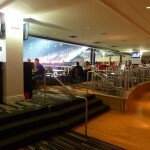 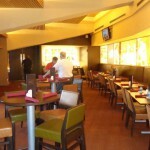 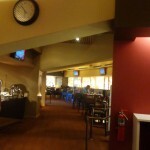 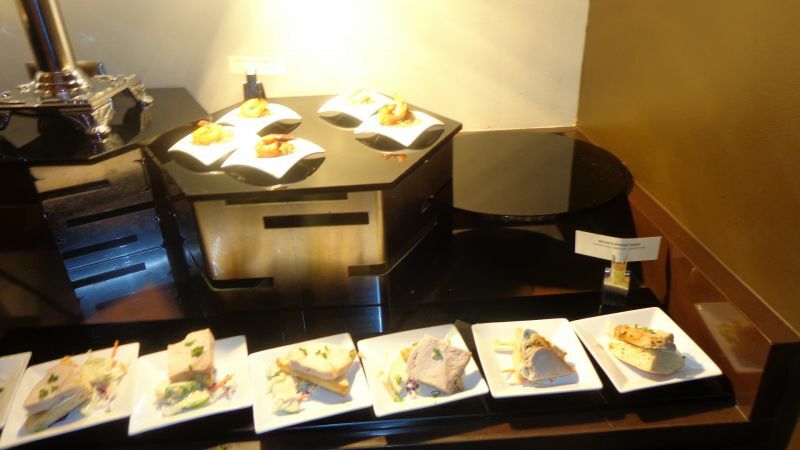 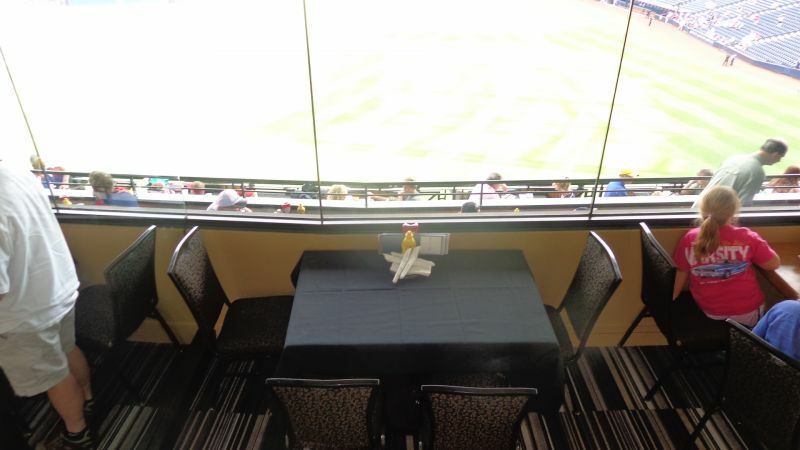 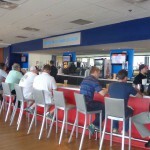 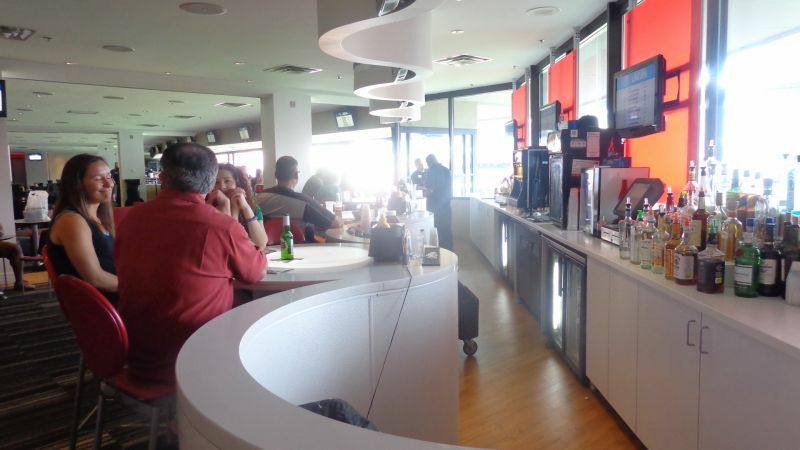 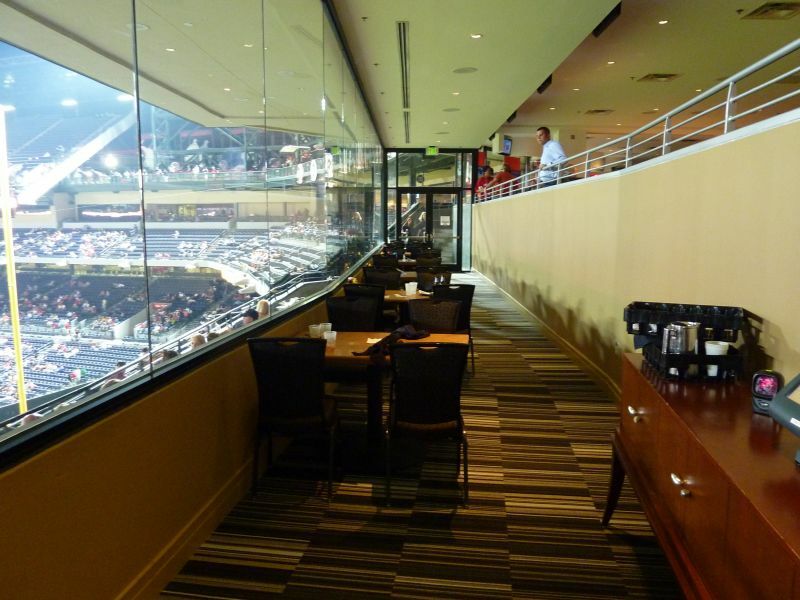 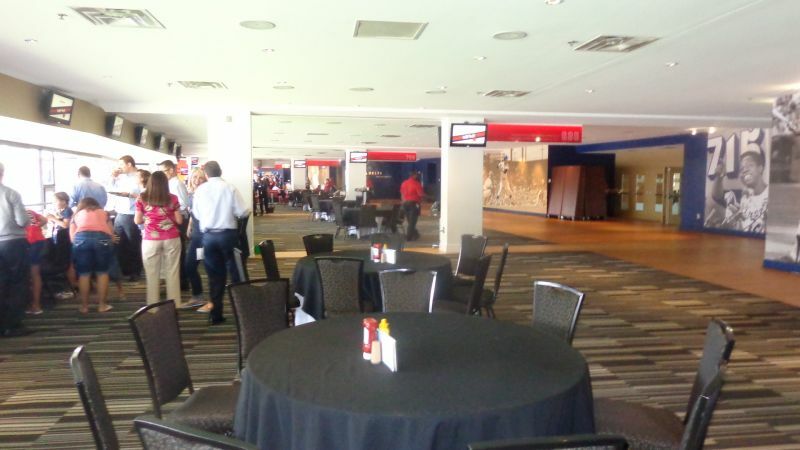 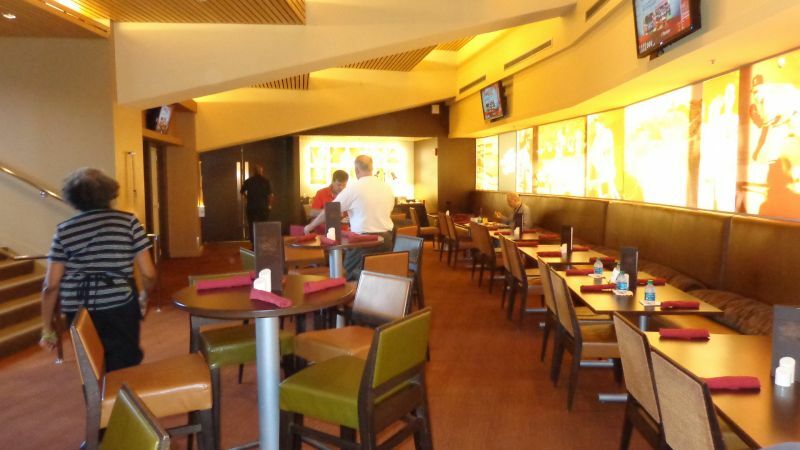 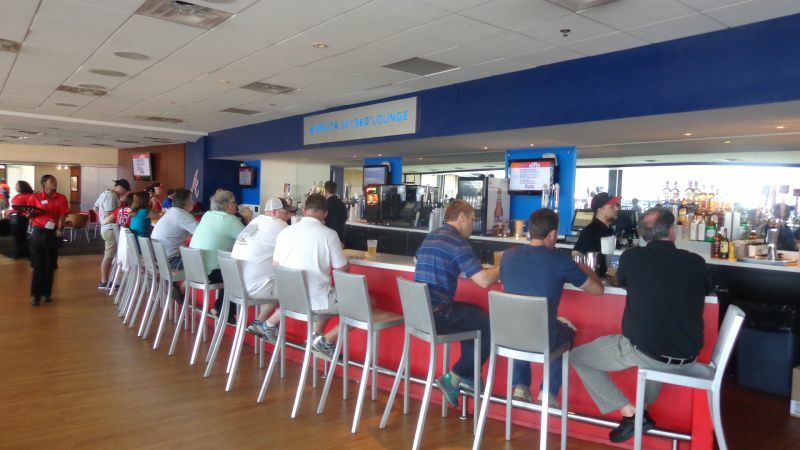 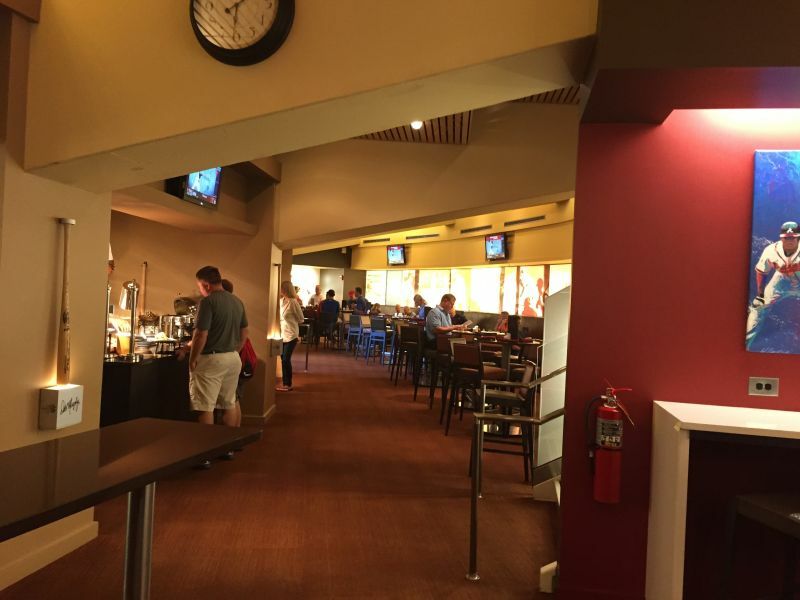 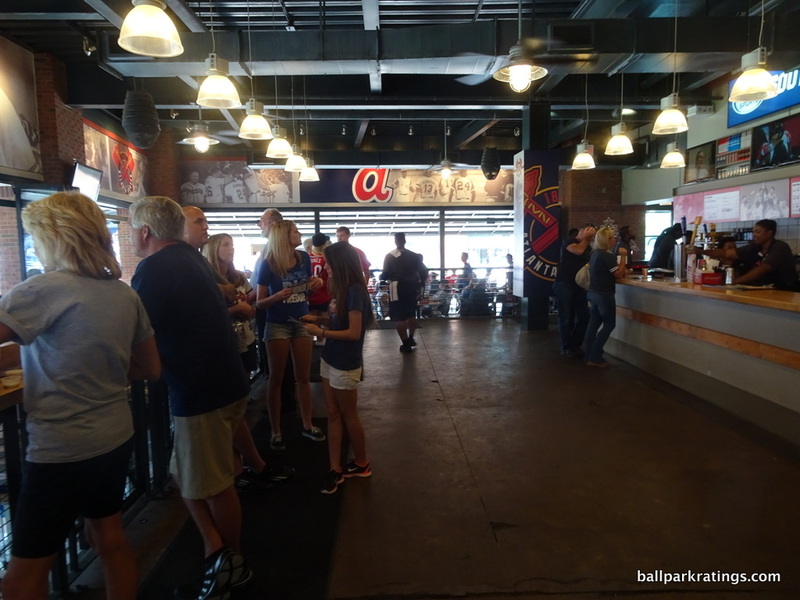 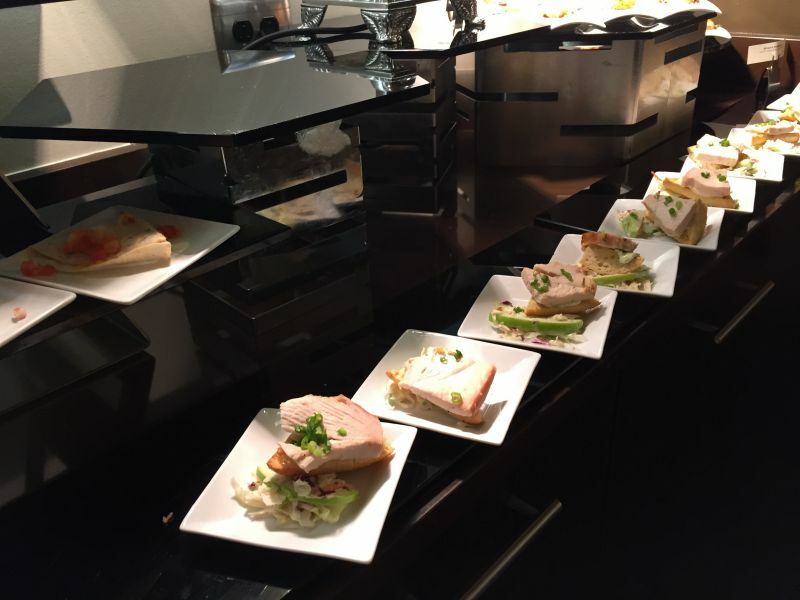 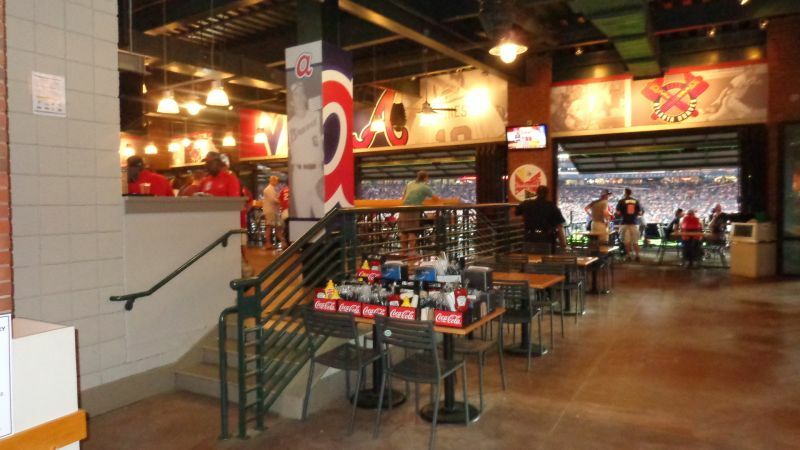 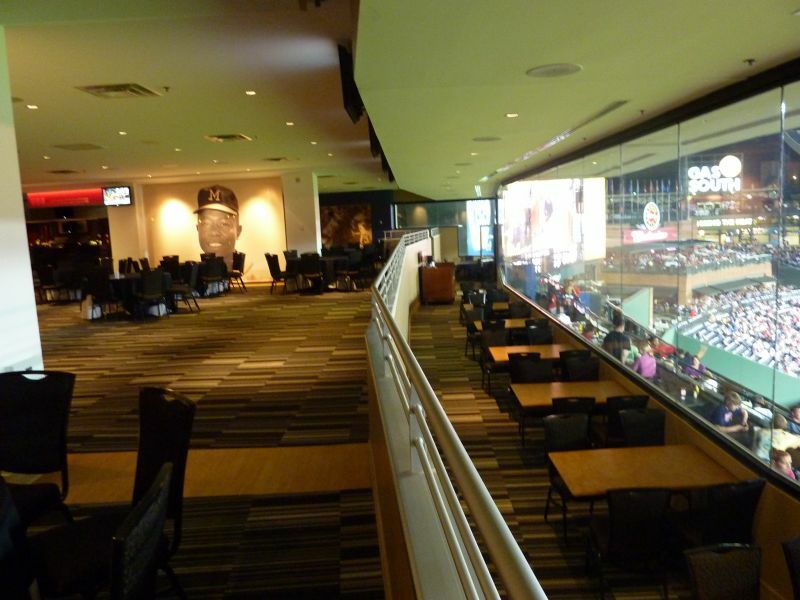 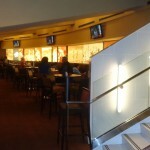 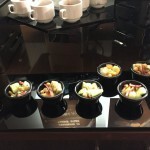 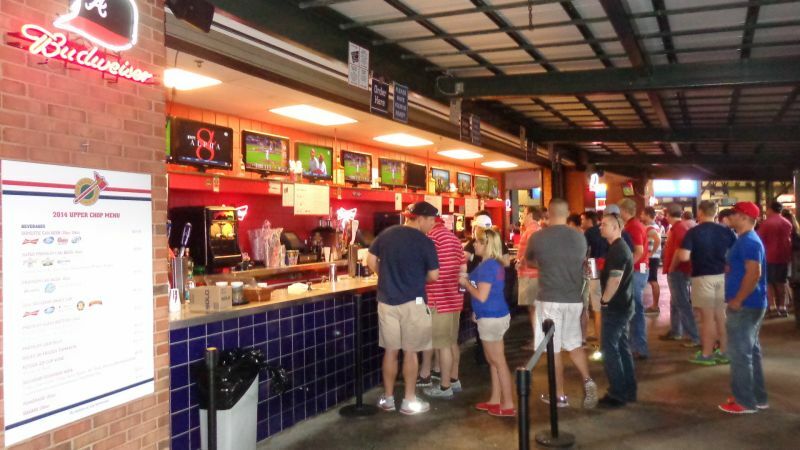 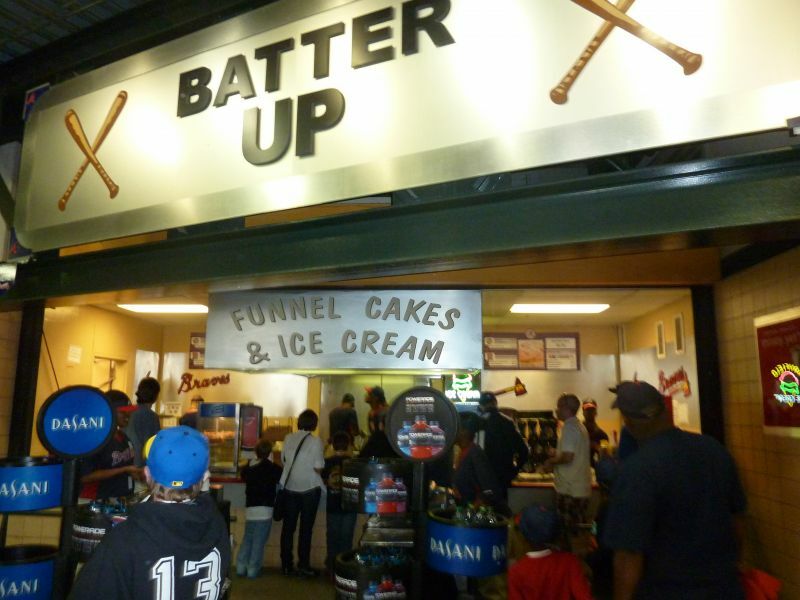 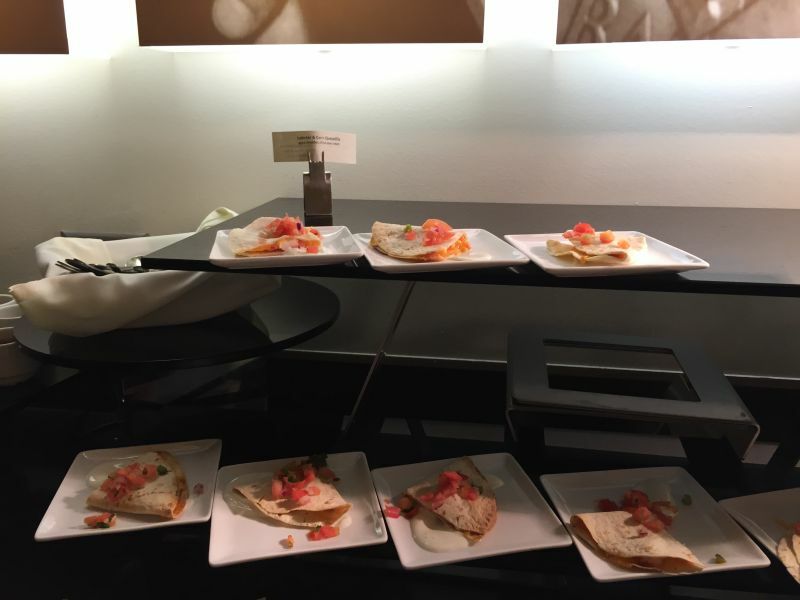 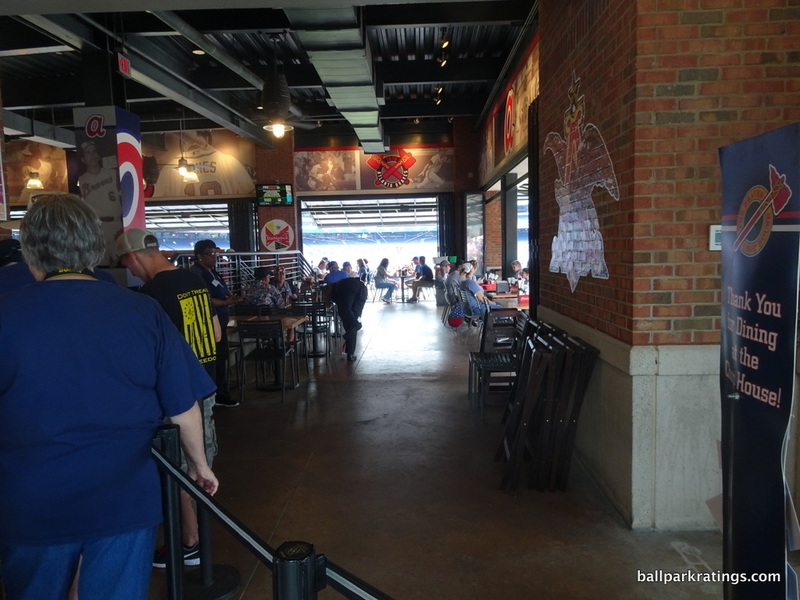 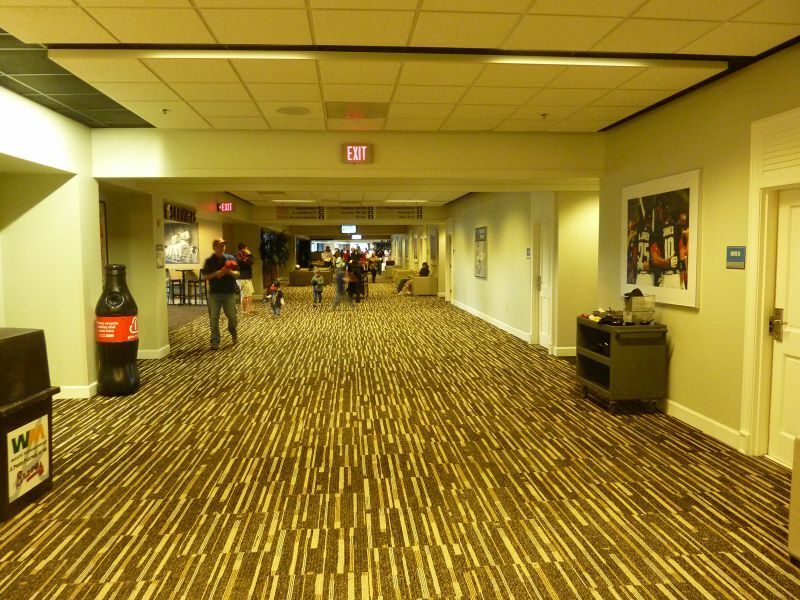 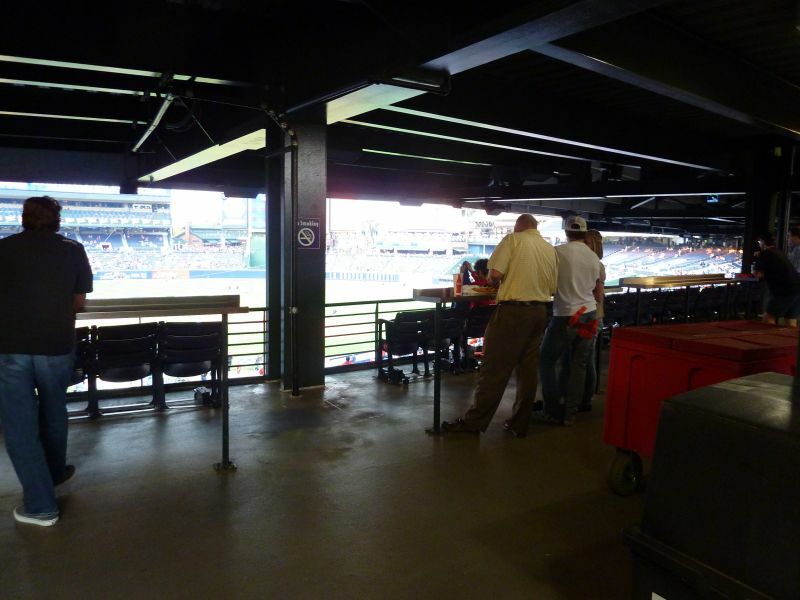 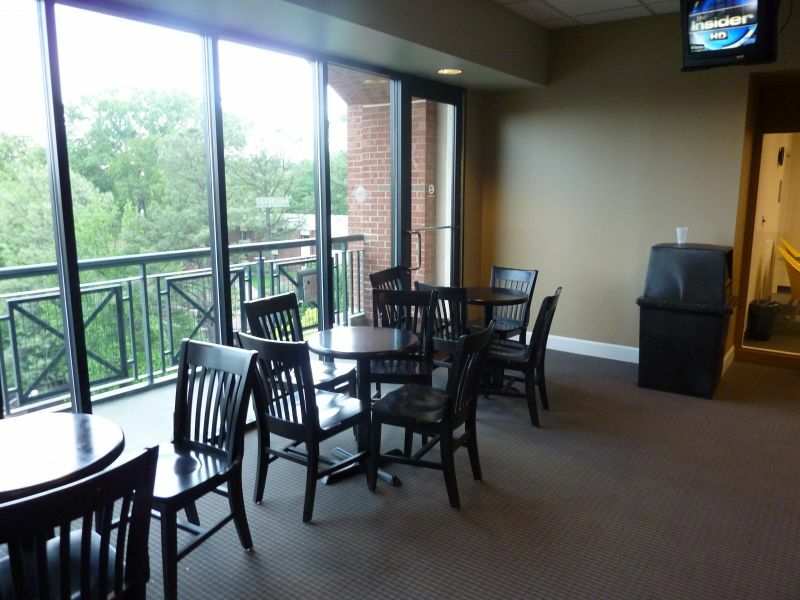 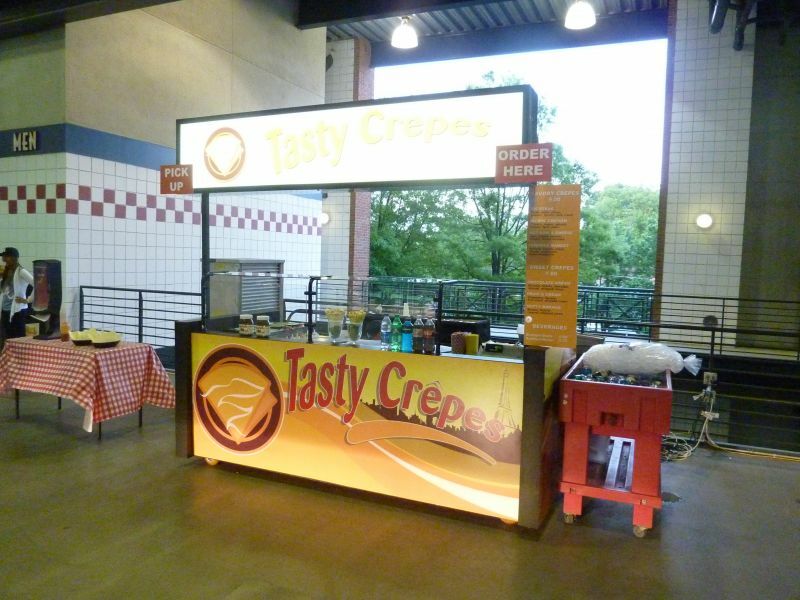 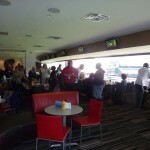 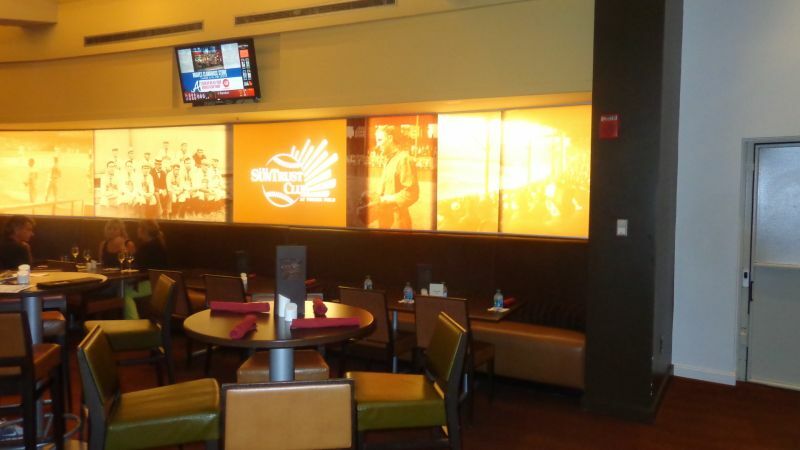 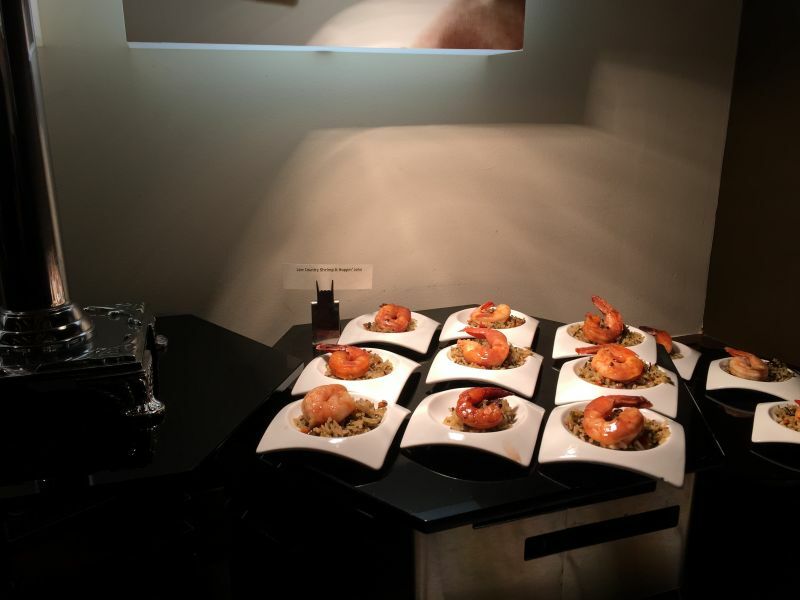 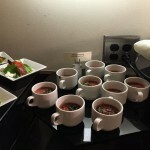 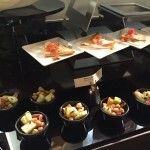 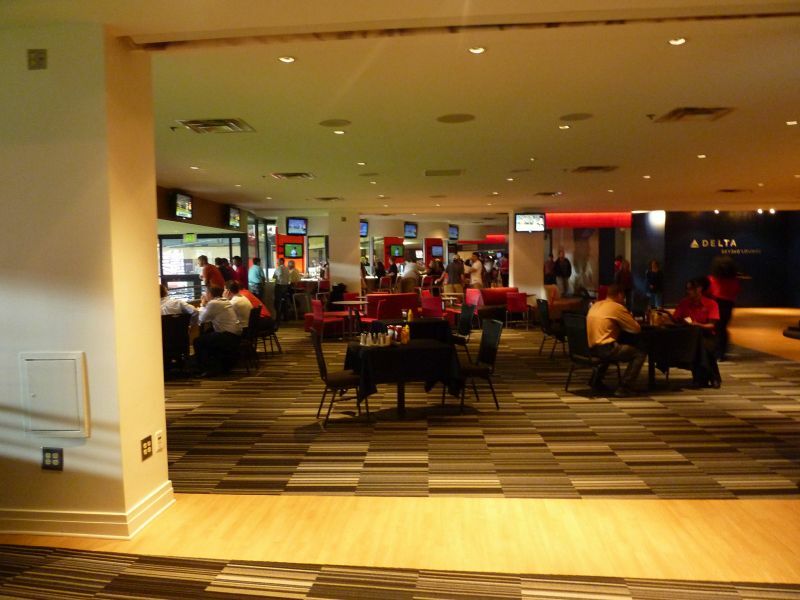 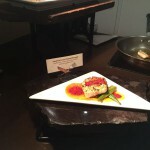 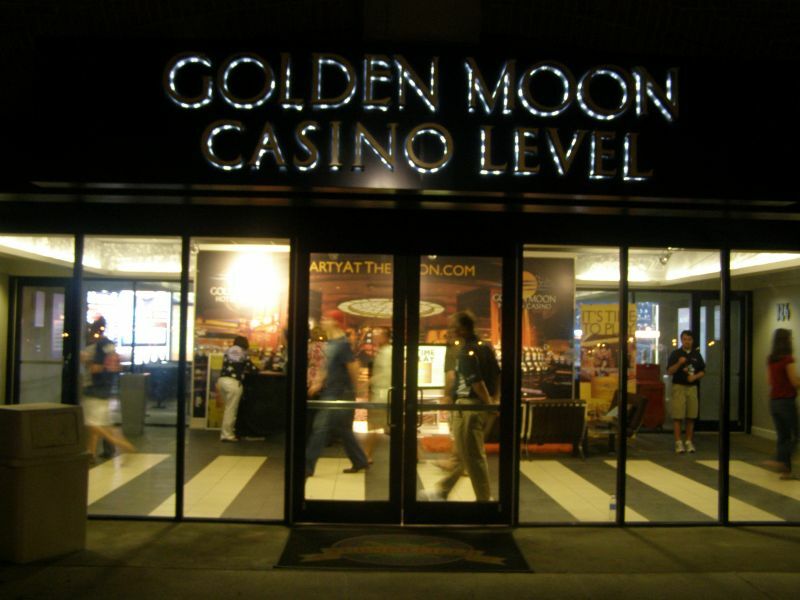 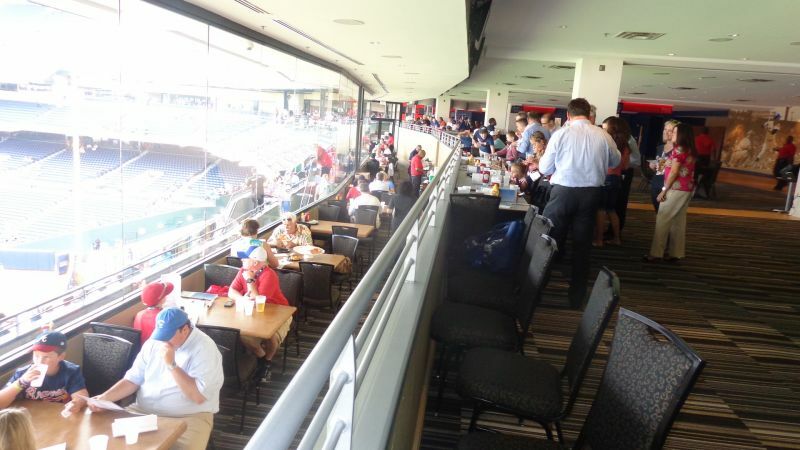 The location is awful, the food actually appears to be the worst in the majors in terms of selection and quality (club level food is premium services; although the main concessions improved in 2013), and the fan atmosphere is generally considered to be poor. 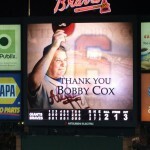 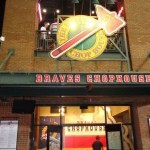 But I’ll even be generous and give a point for the Tomahawk Chop. 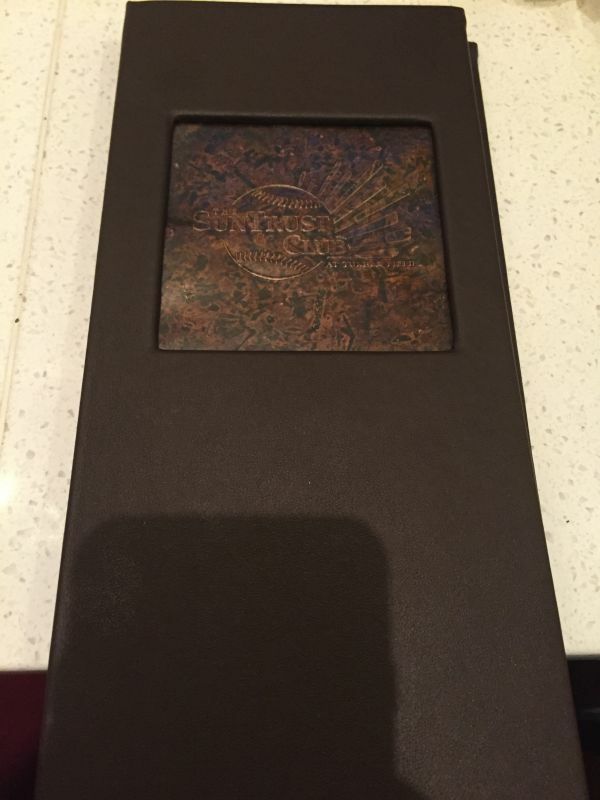 I probably bash it too much in this intro, as there are plenty of nice features I’ll point out. 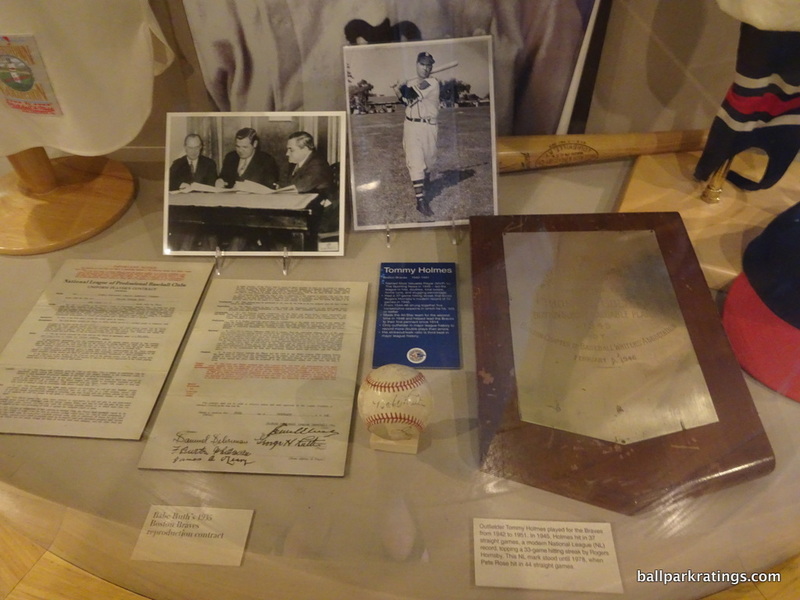 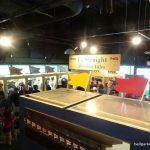 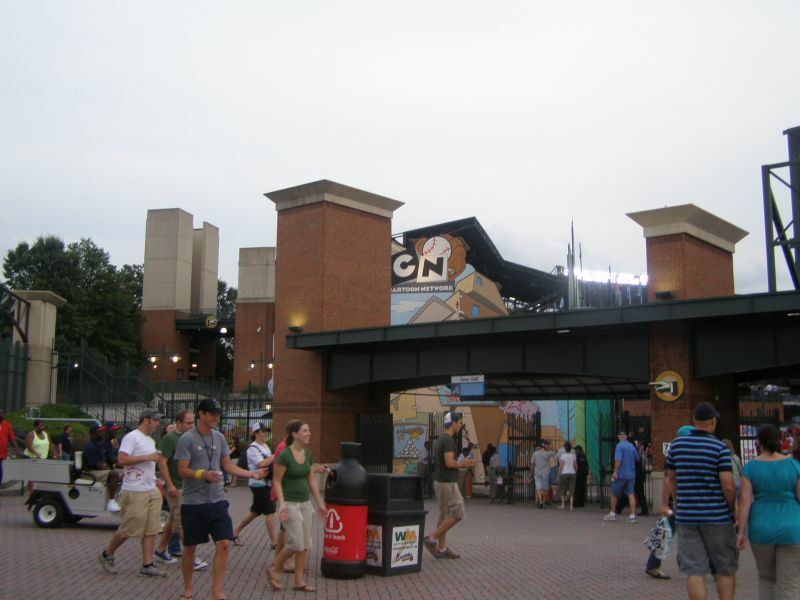 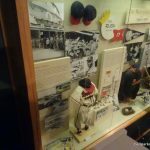 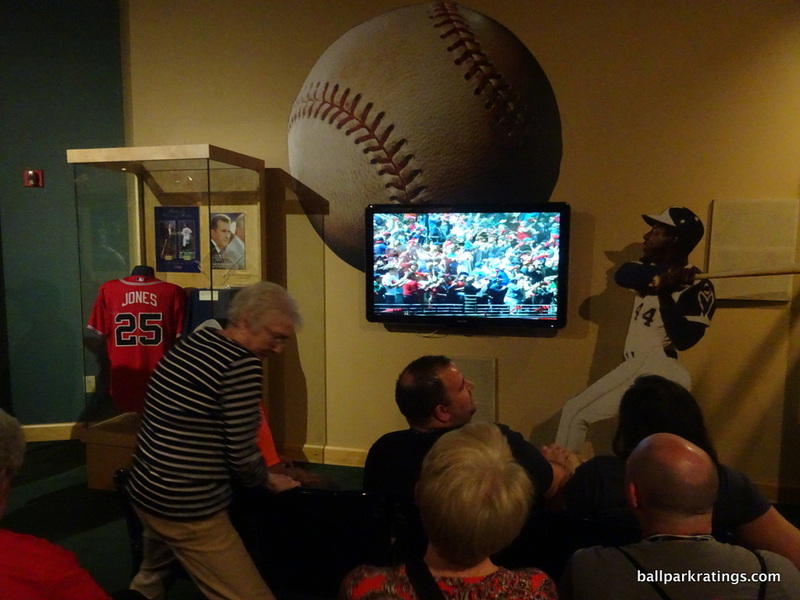 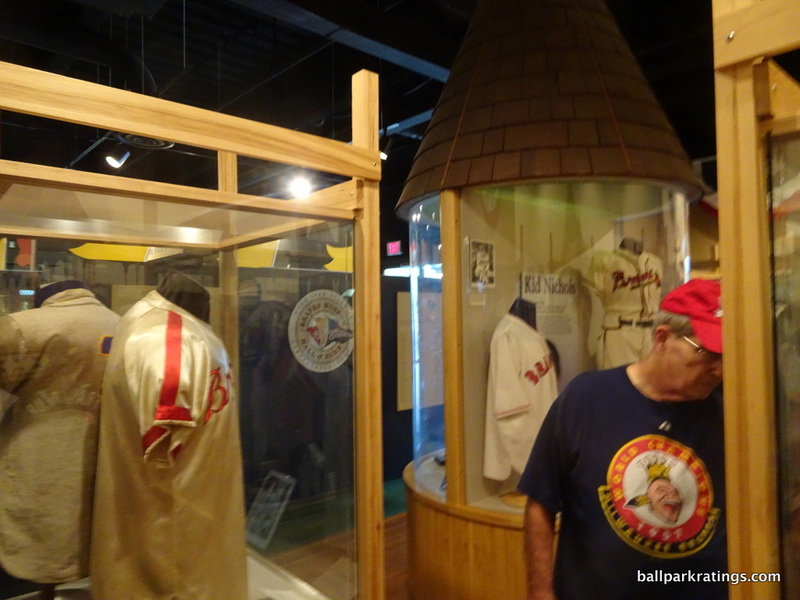 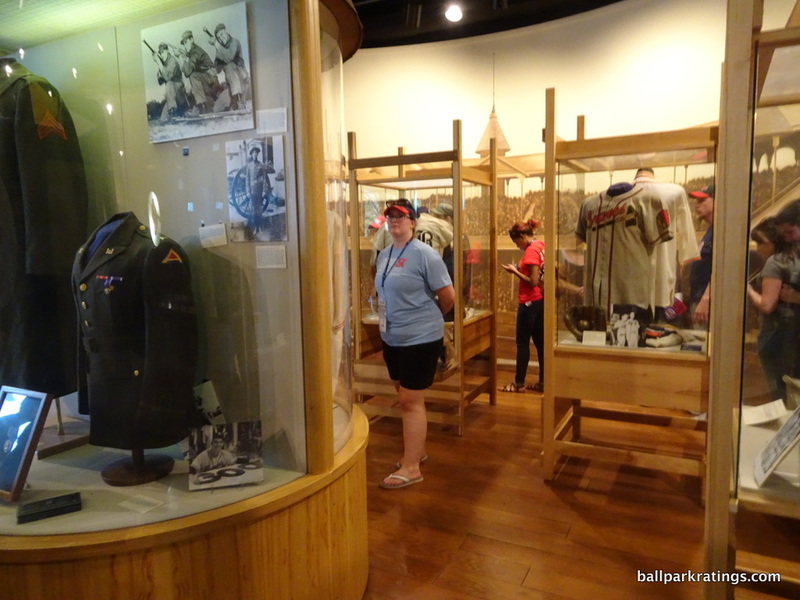 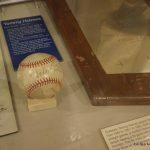 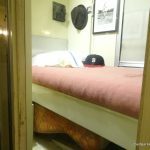 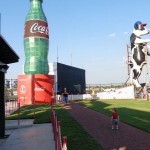 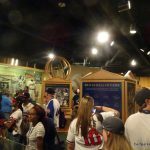 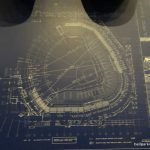 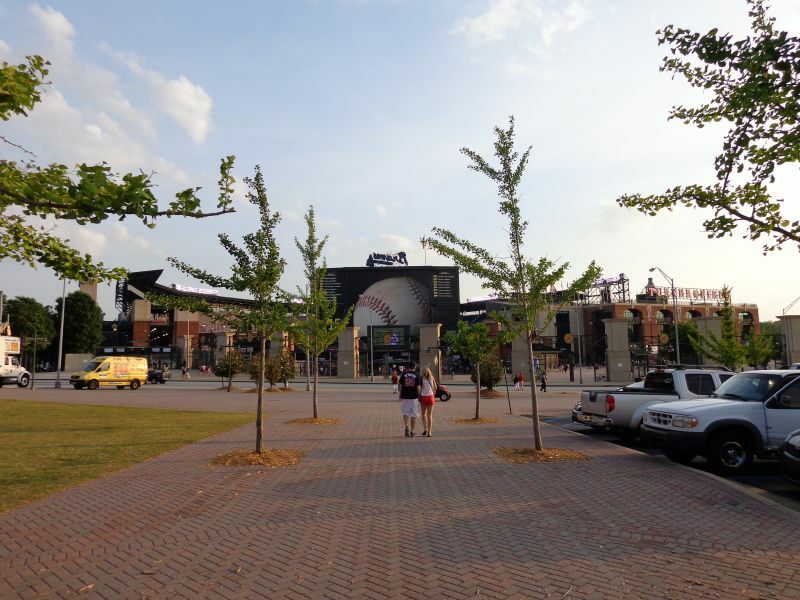 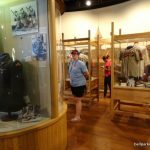 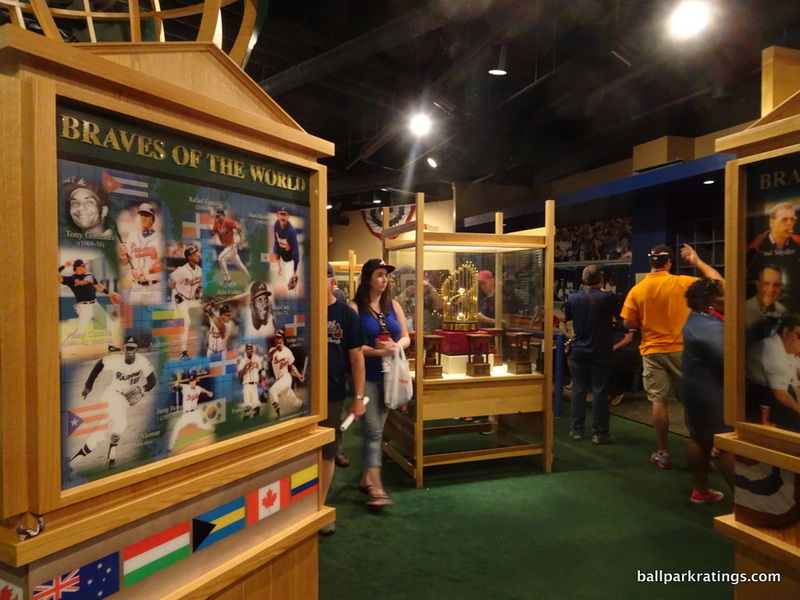 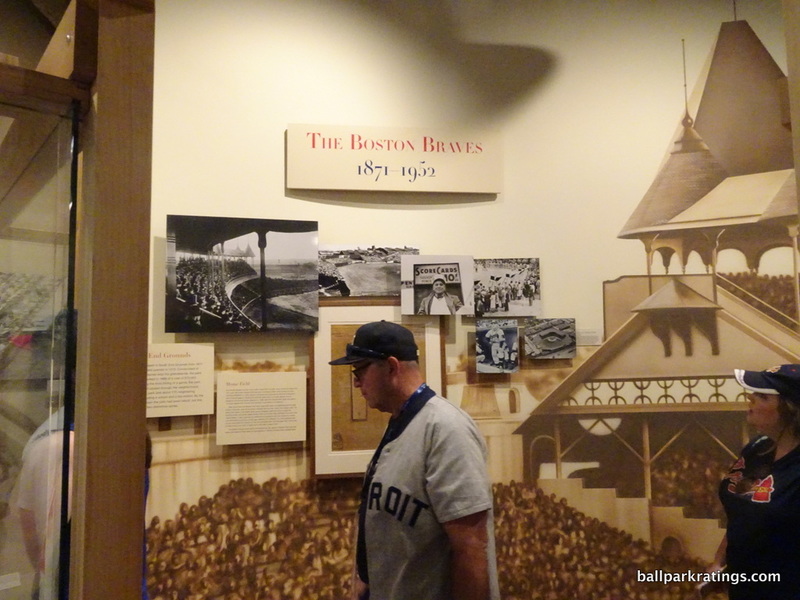 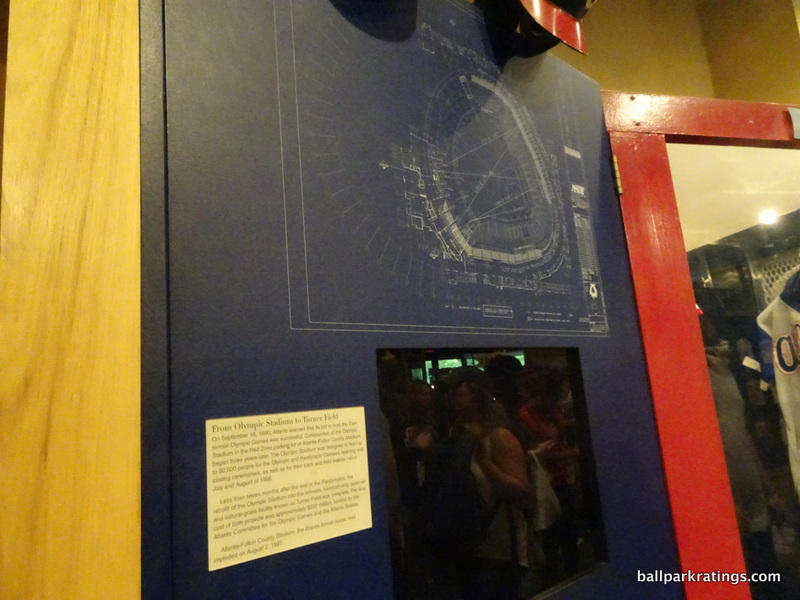 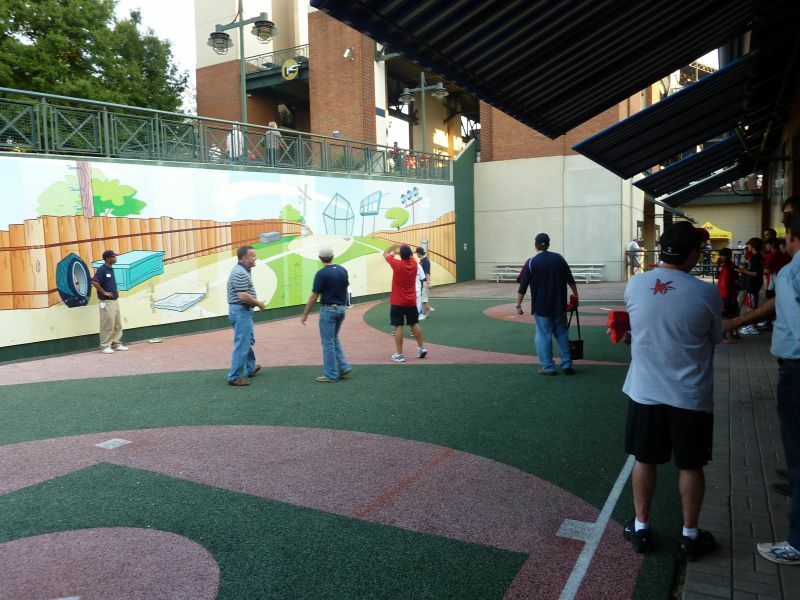 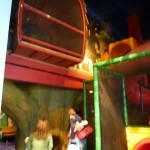 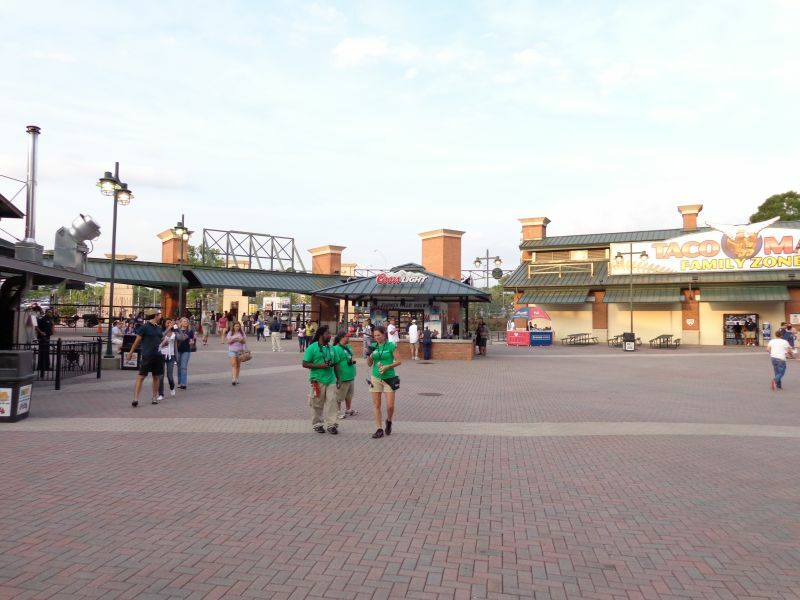 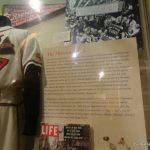 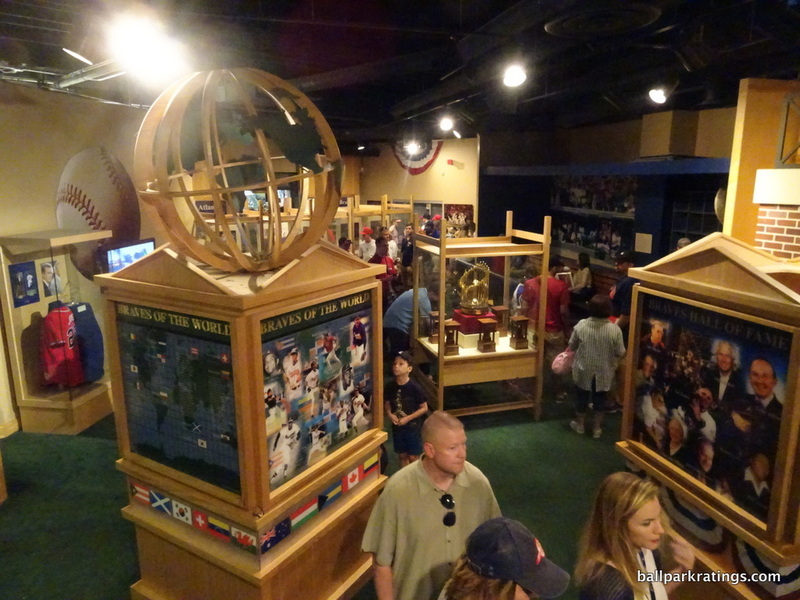 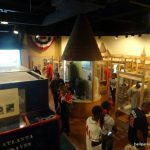 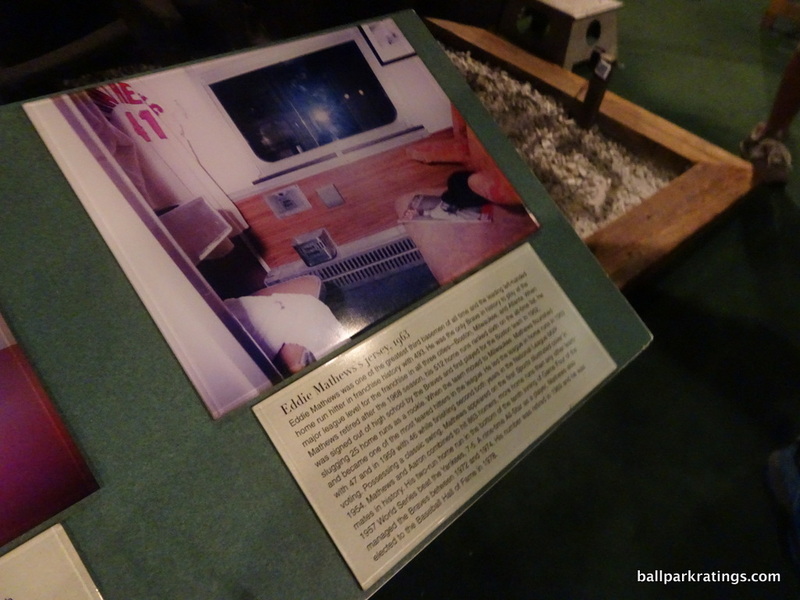 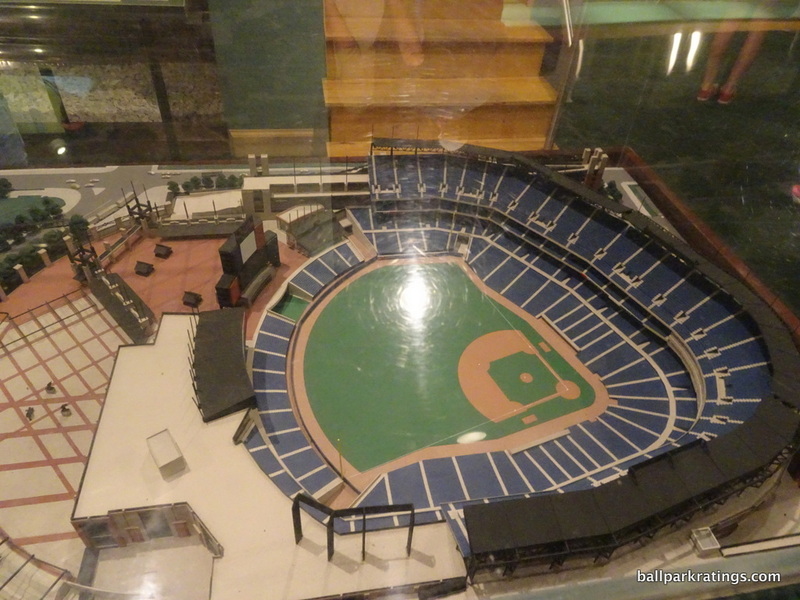 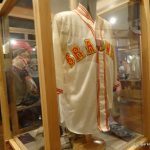 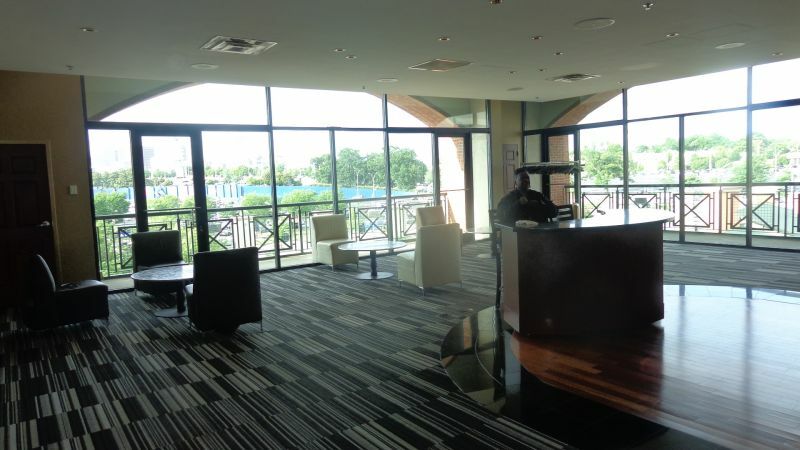 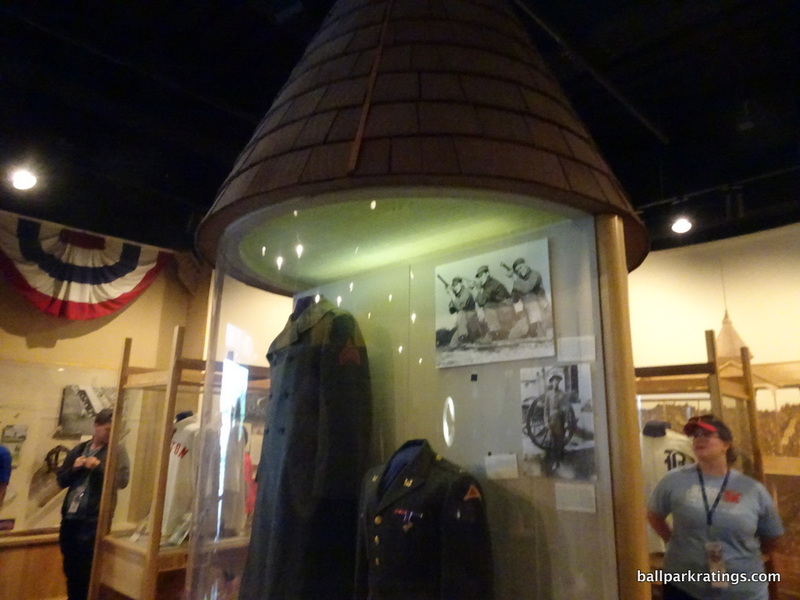 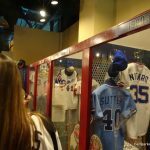 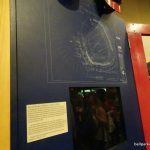 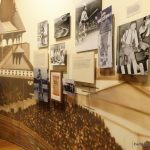 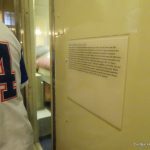 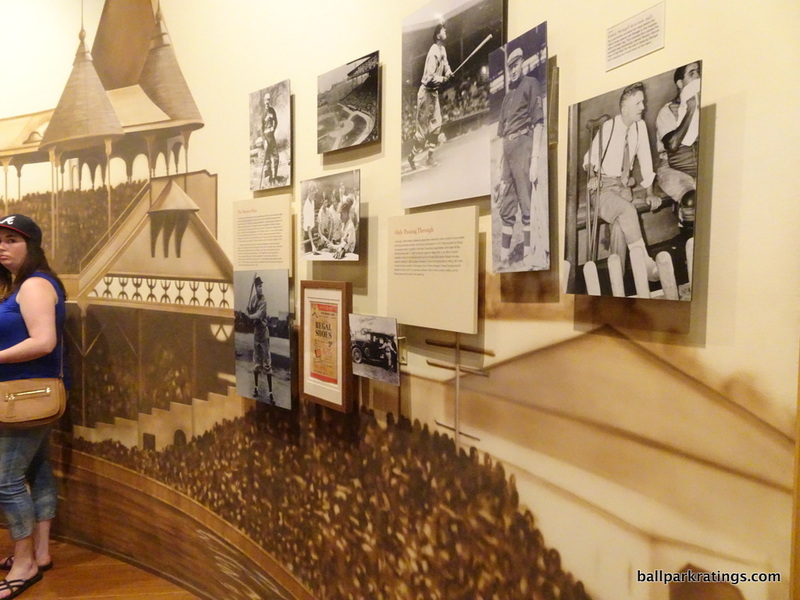 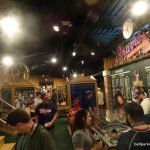 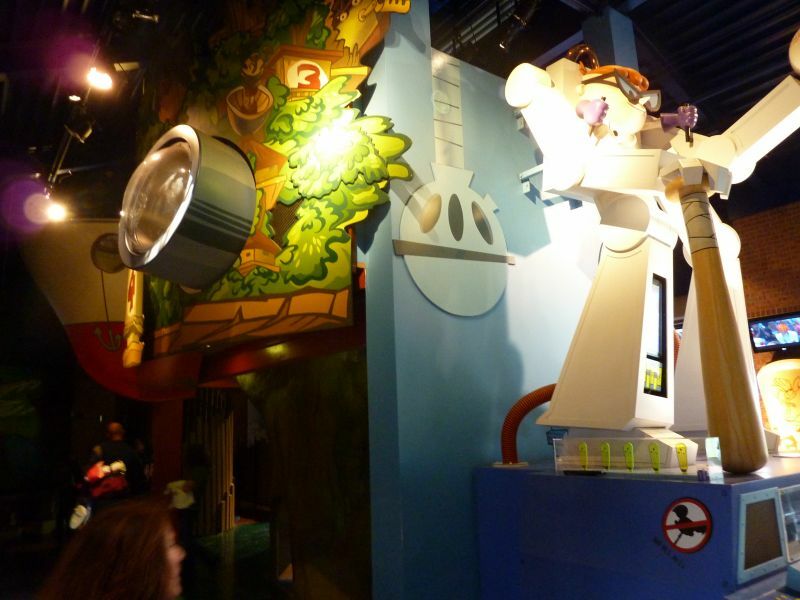 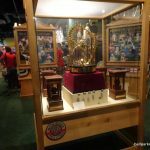 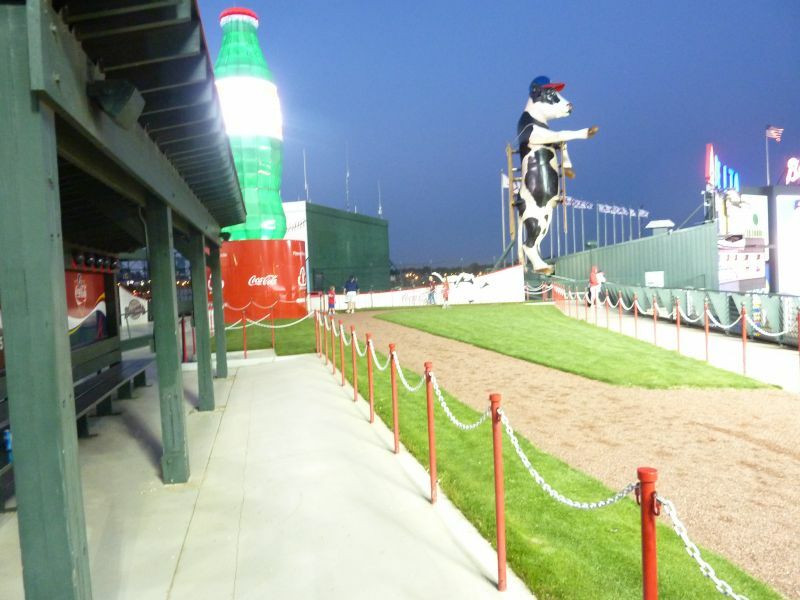 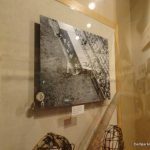 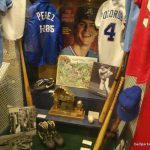 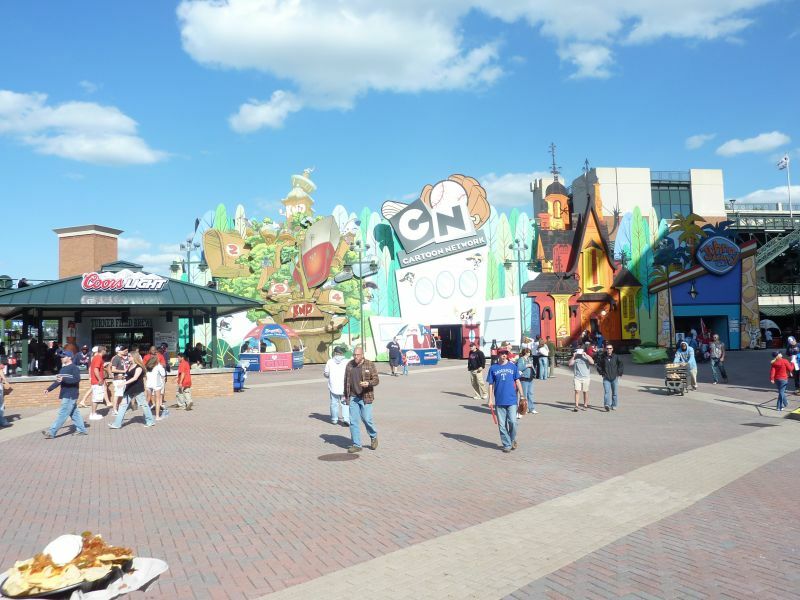 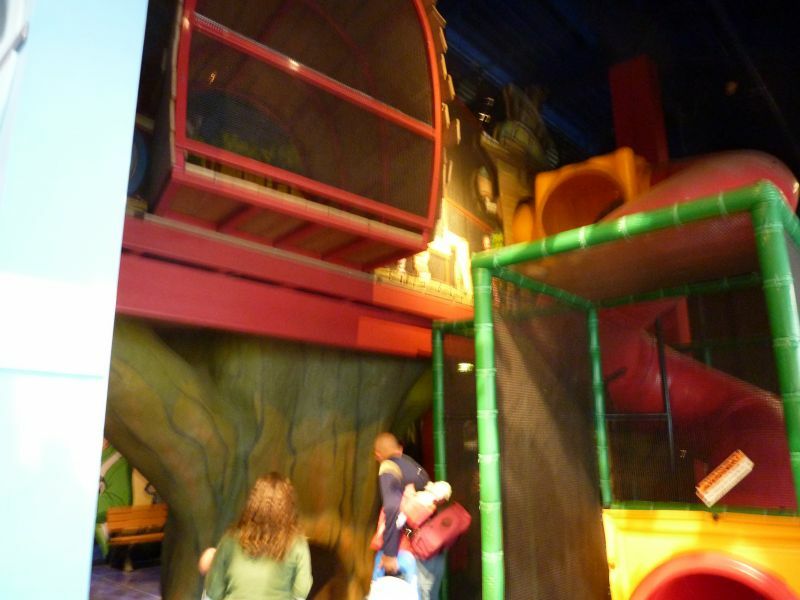 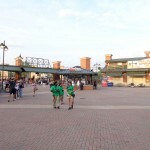 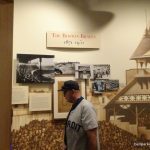 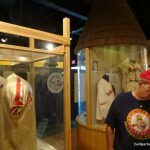 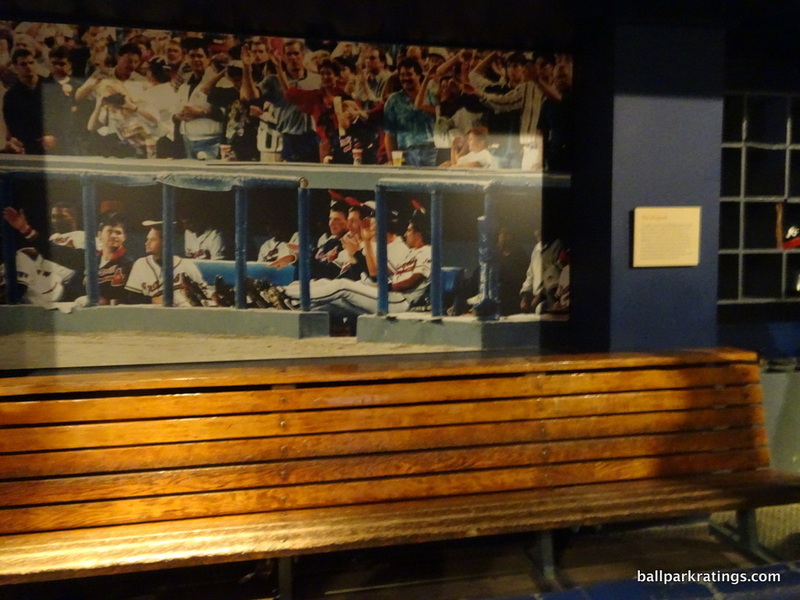 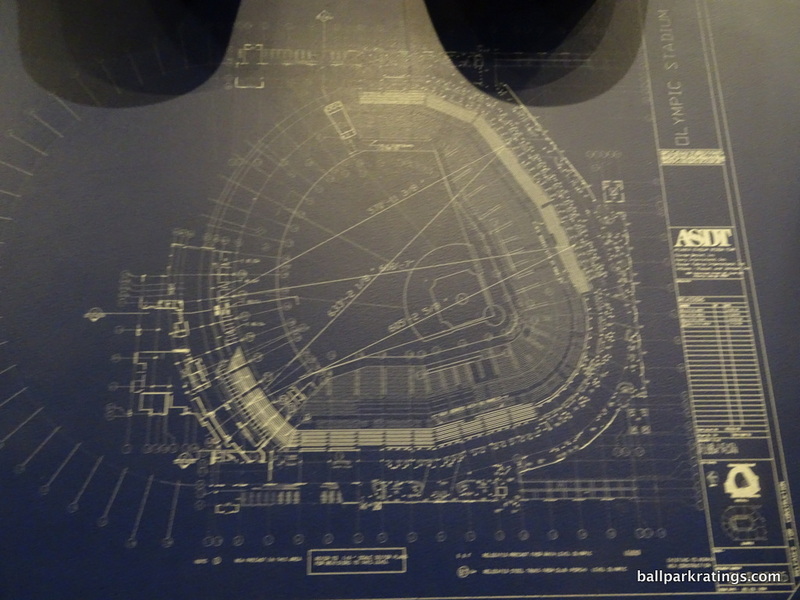 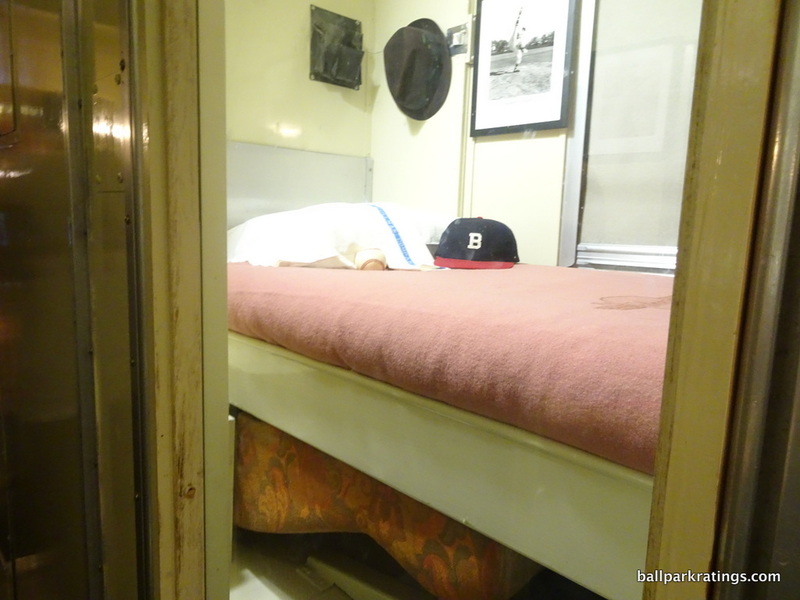 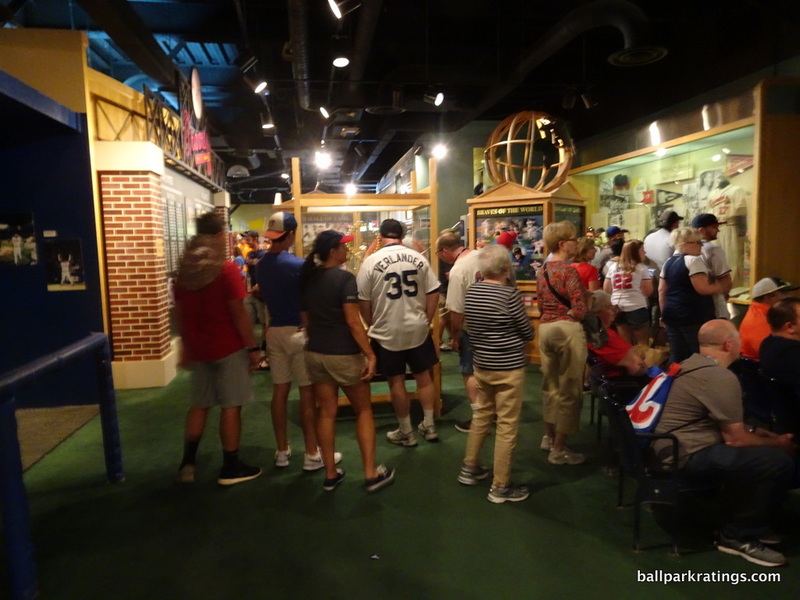 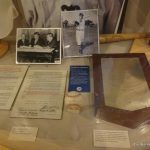 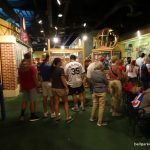 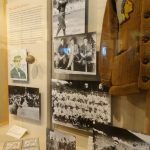 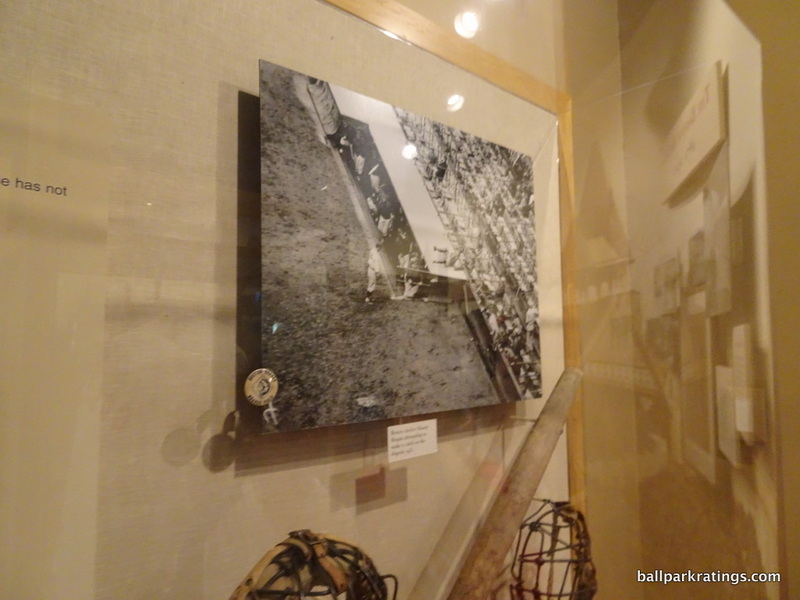 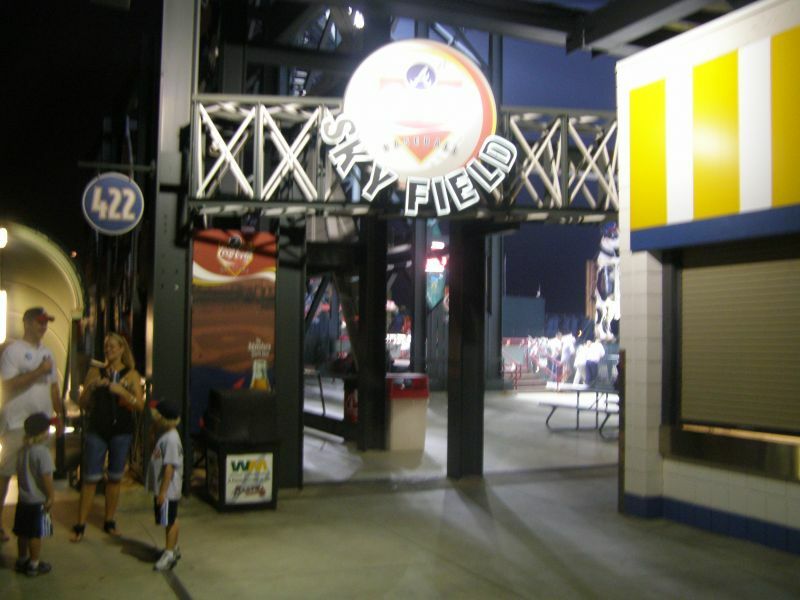 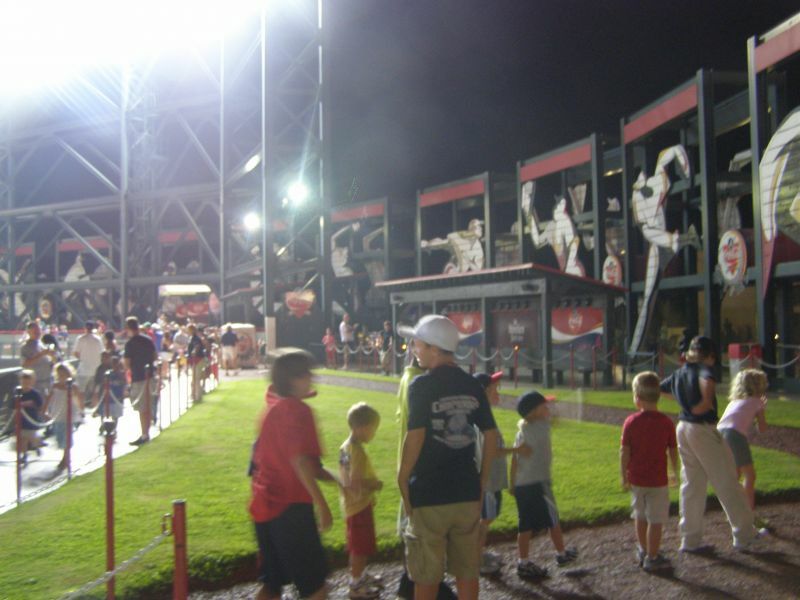 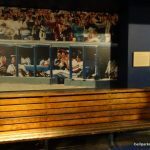 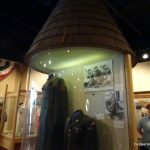 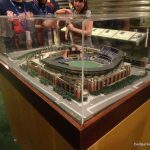 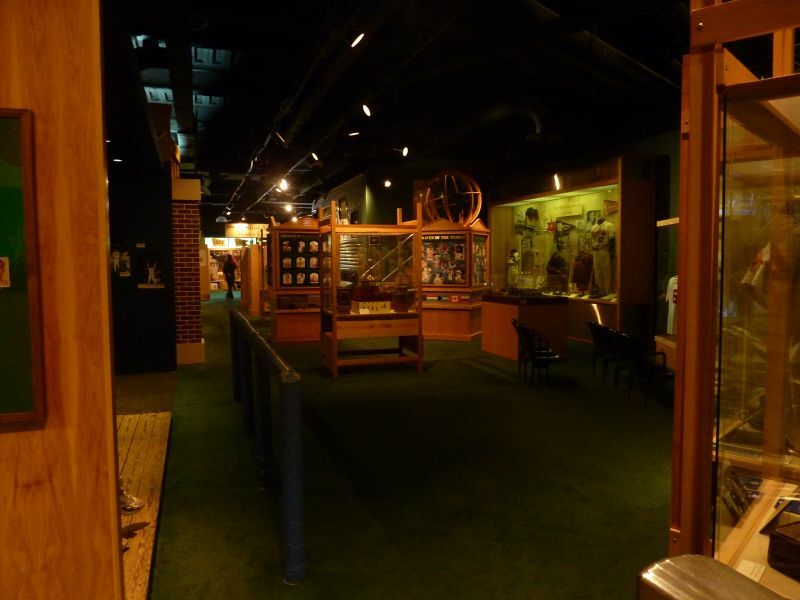 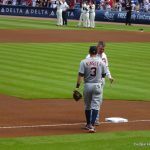 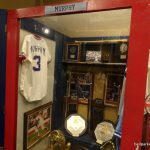 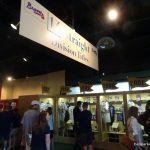 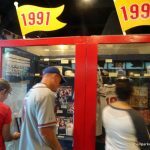 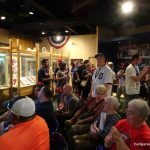 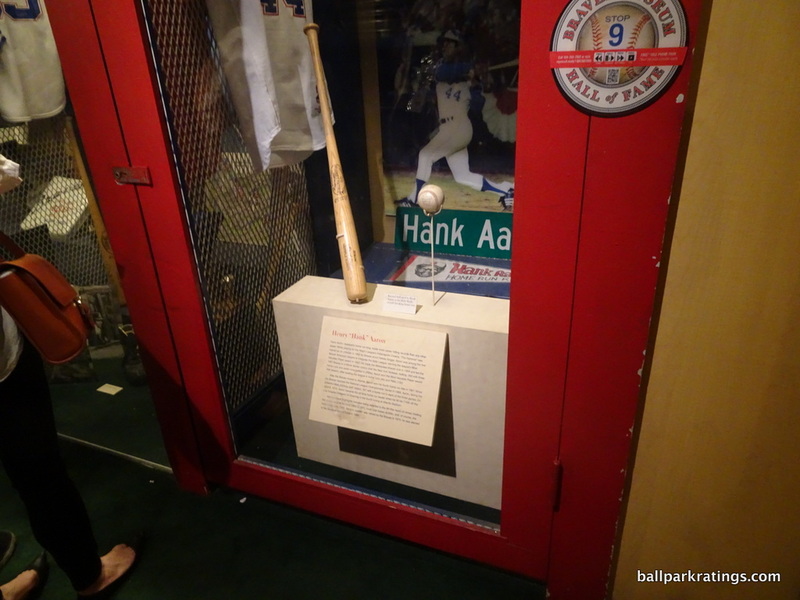 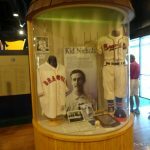 The ballpark was built on a huge footprint, integrating a museum, a giant playground, a fan plaza, multiple restaurants, and numerous other amenities into the superstructure. 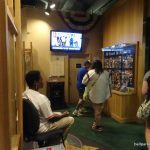 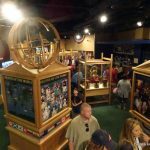 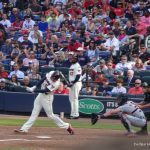 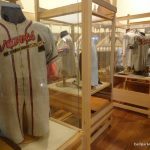 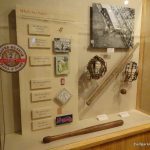 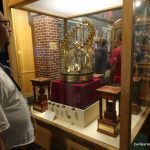 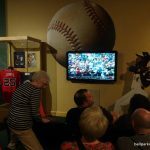 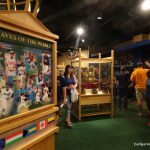 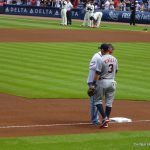 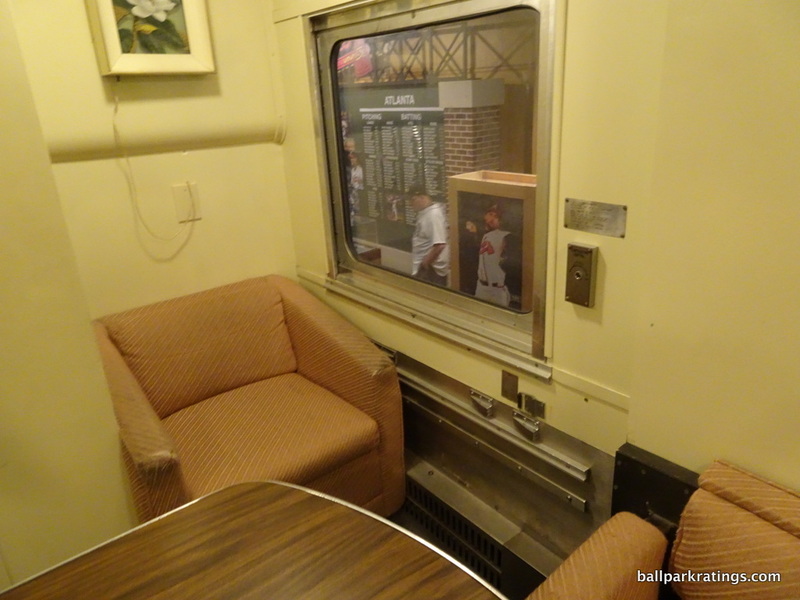 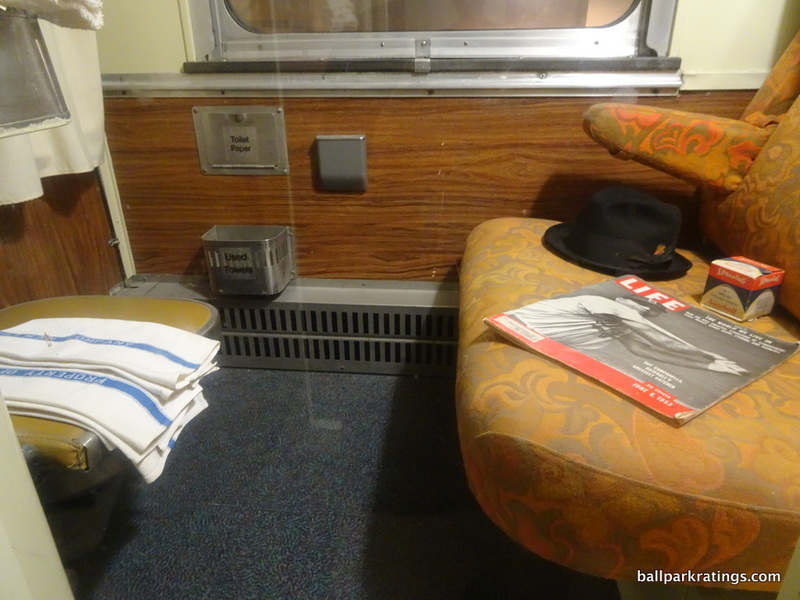 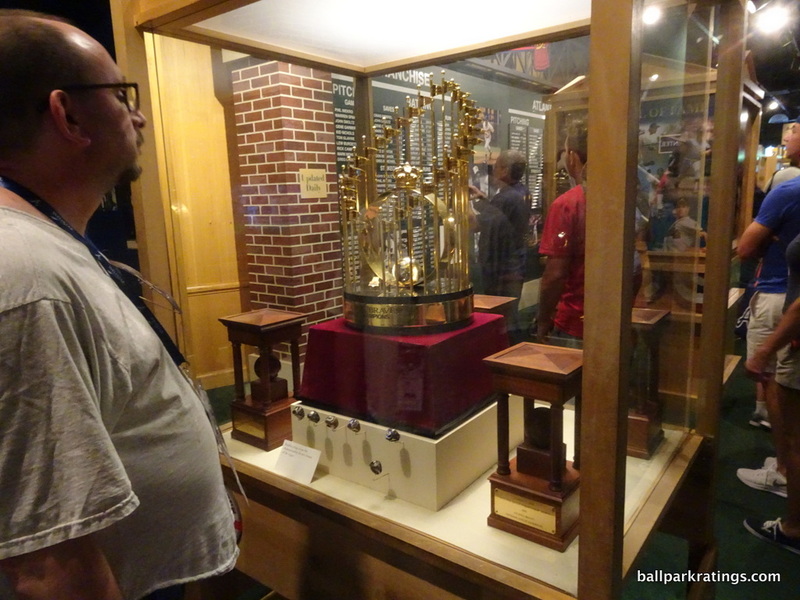 For better or for worse, it is the ultimate baseball theme park, just one that now seems to be aging fast (amenities age, timeless architecture doesn’t). 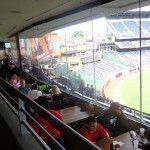 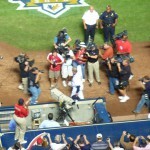 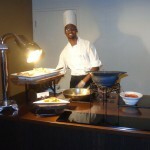 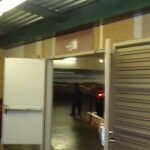 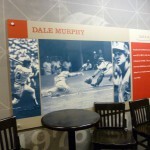 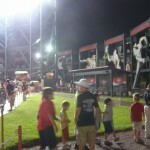 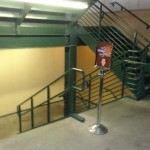 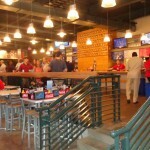 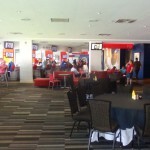 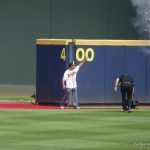 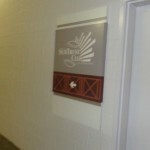 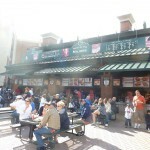 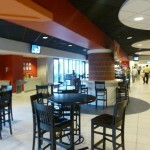 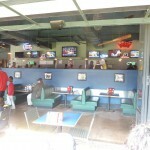 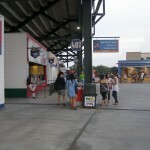 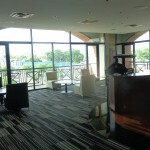 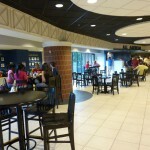 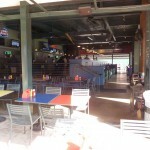 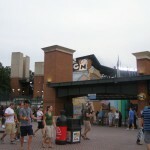 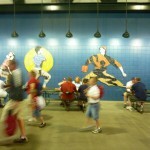 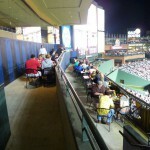 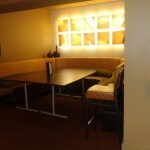 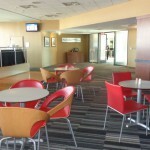 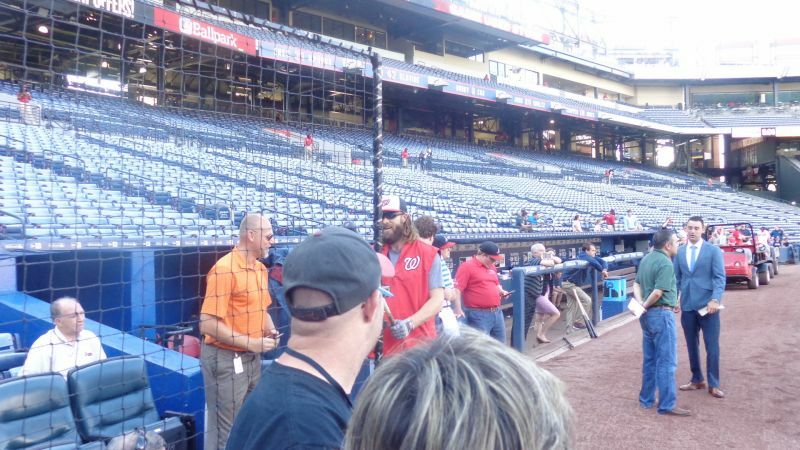 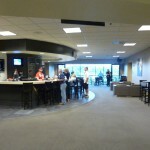 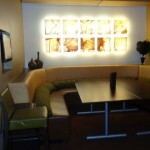 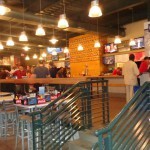 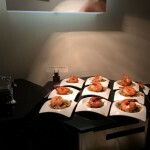 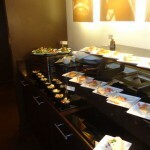 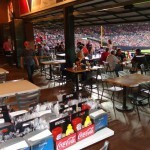 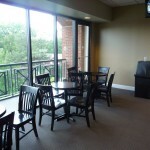 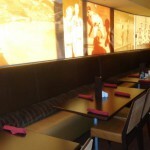 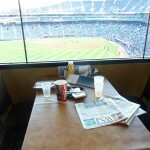 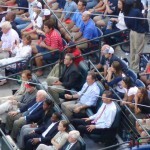 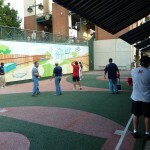 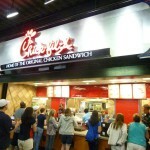 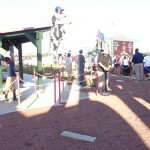 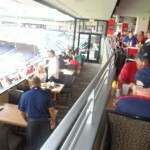 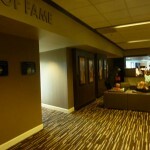 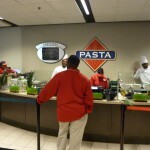 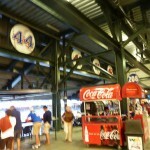 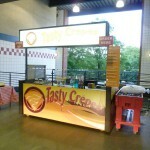 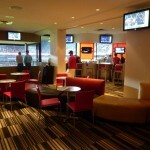 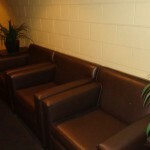 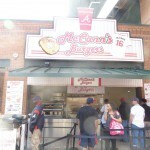 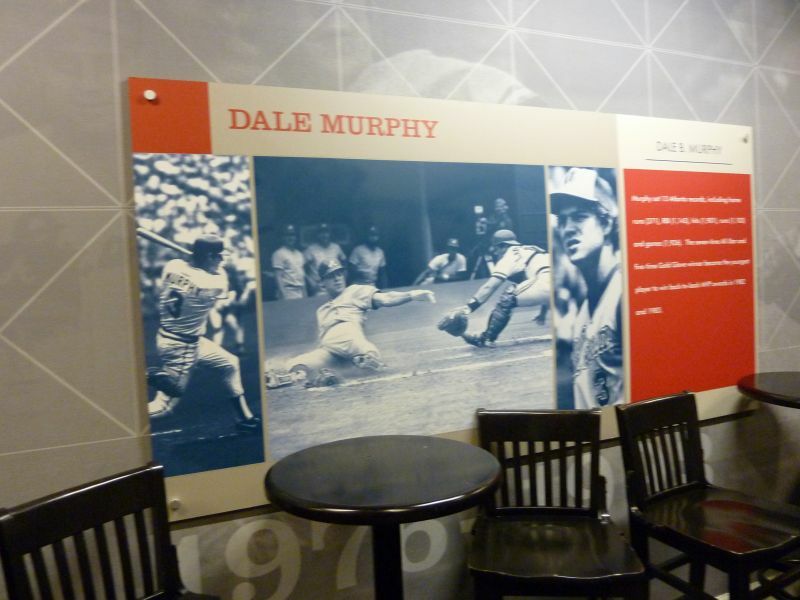 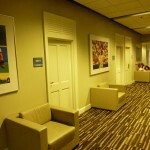 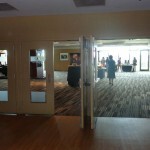 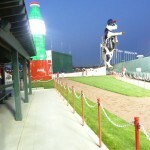 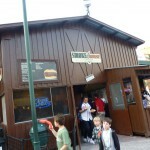 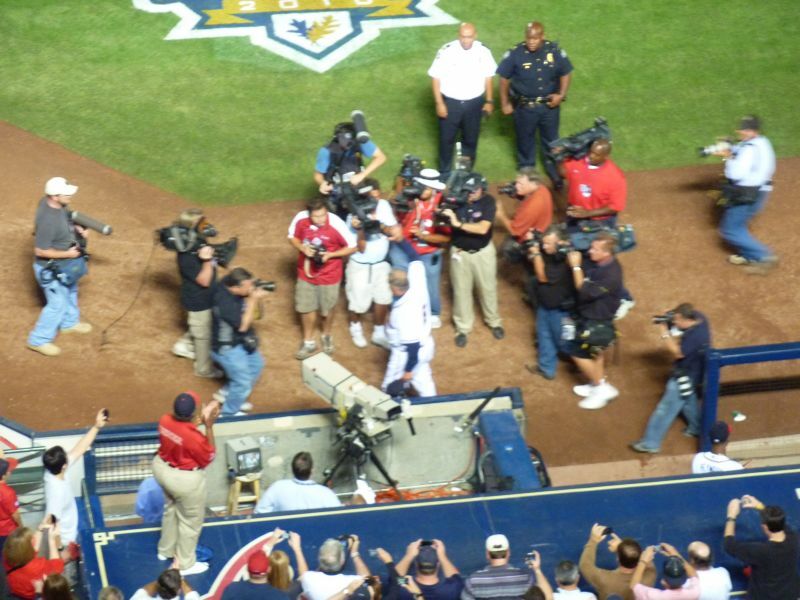 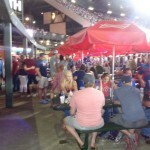 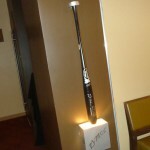 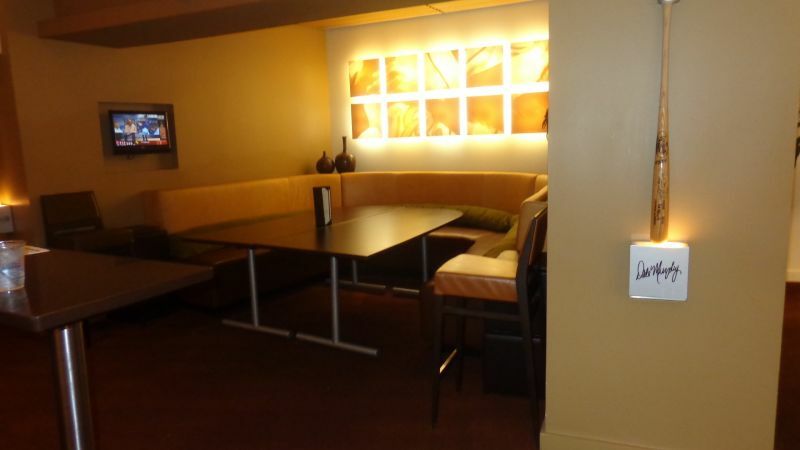 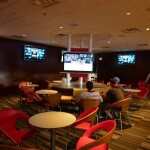 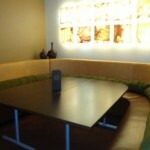 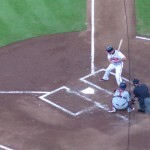 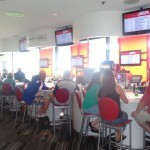 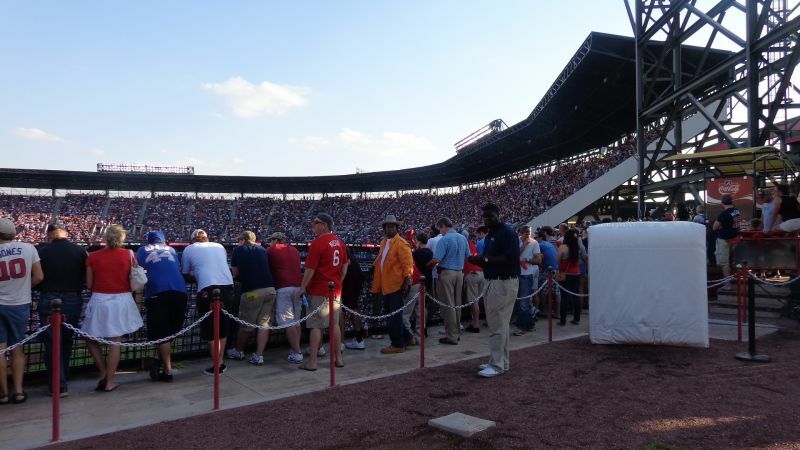 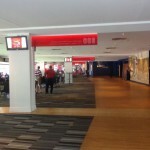 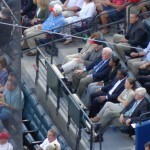 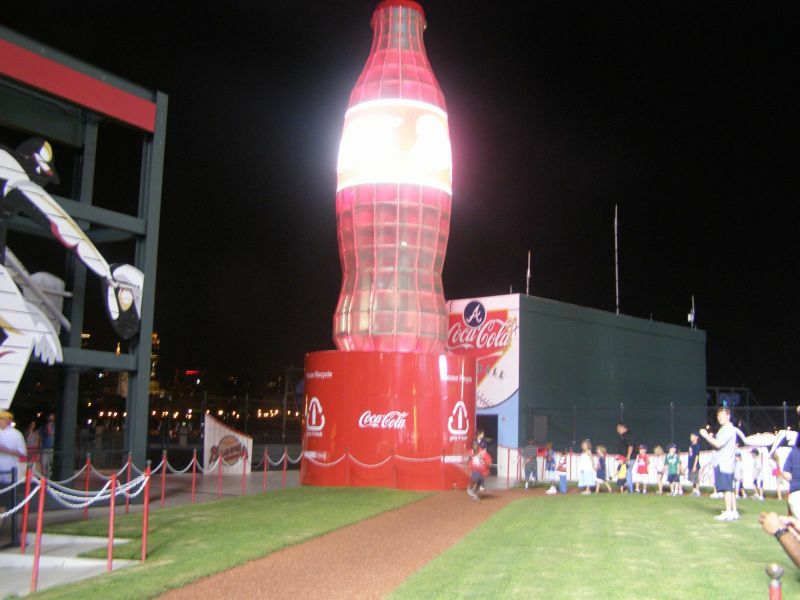 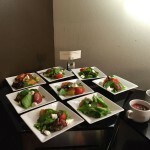 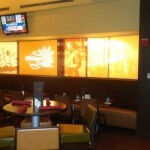 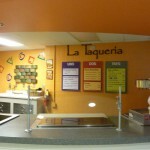 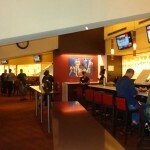 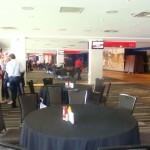 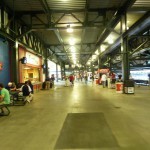 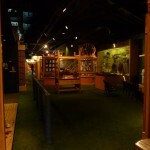 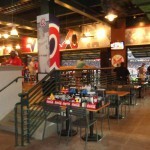 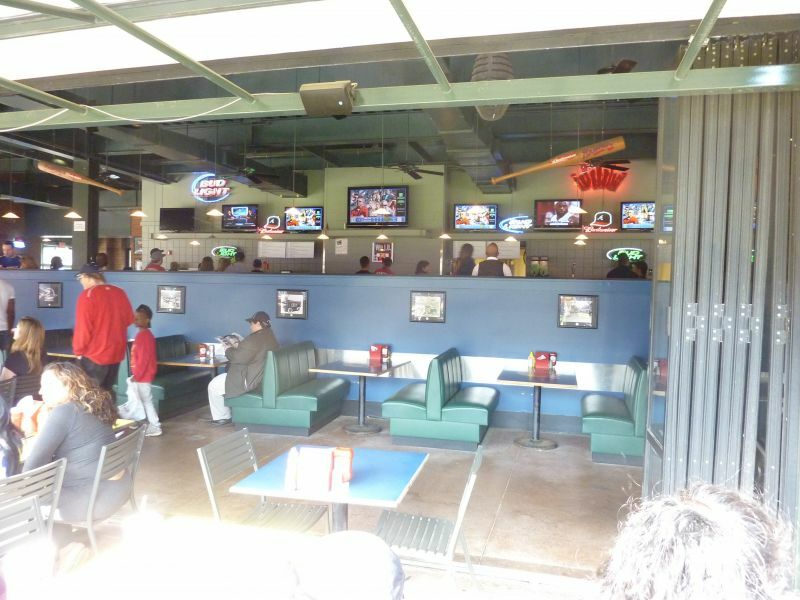 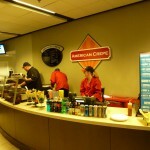 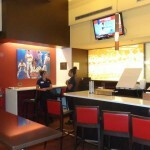 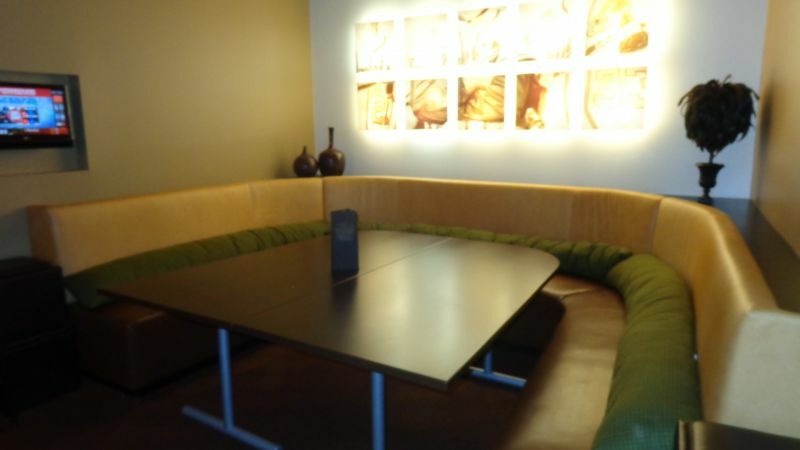 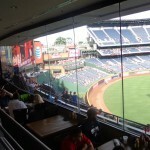 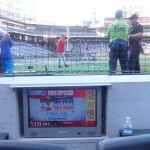 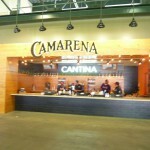 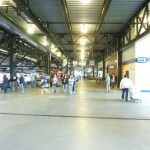 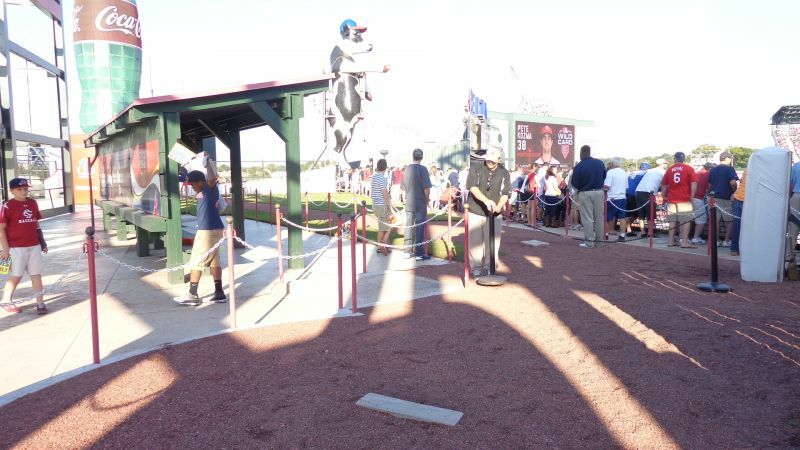 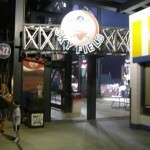 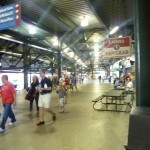 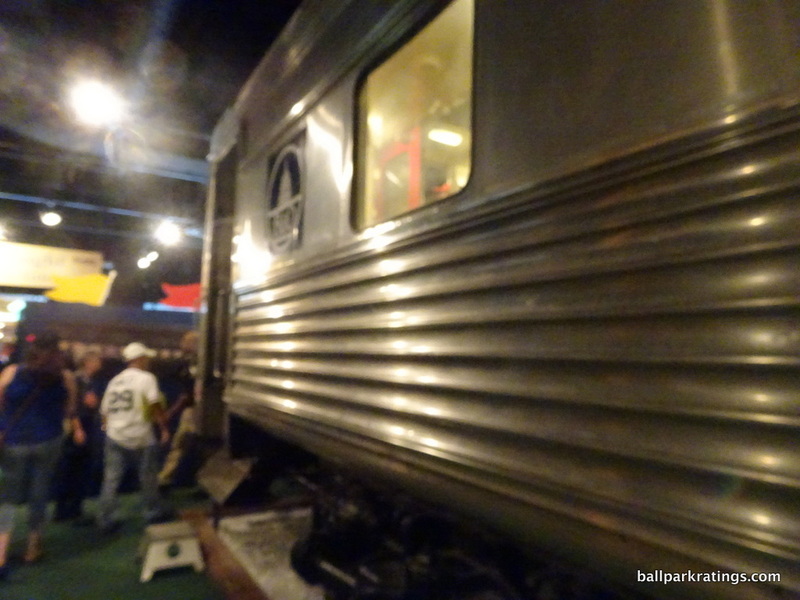 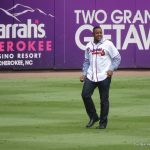 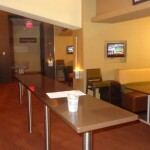 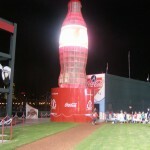 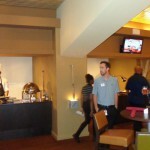 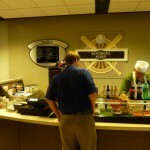 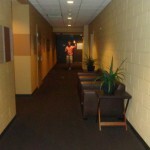 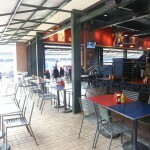 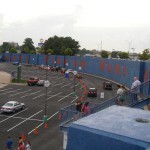 It was also the first to incorporate an open-air eatery in the outfield. 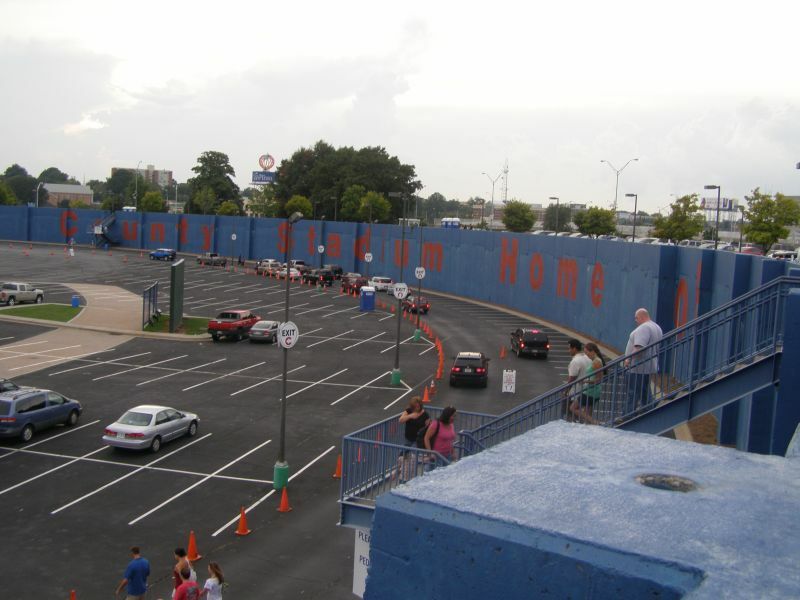 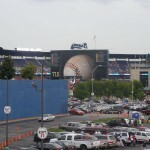 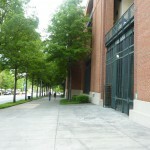 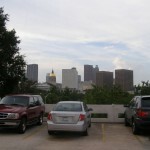 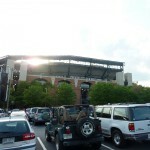 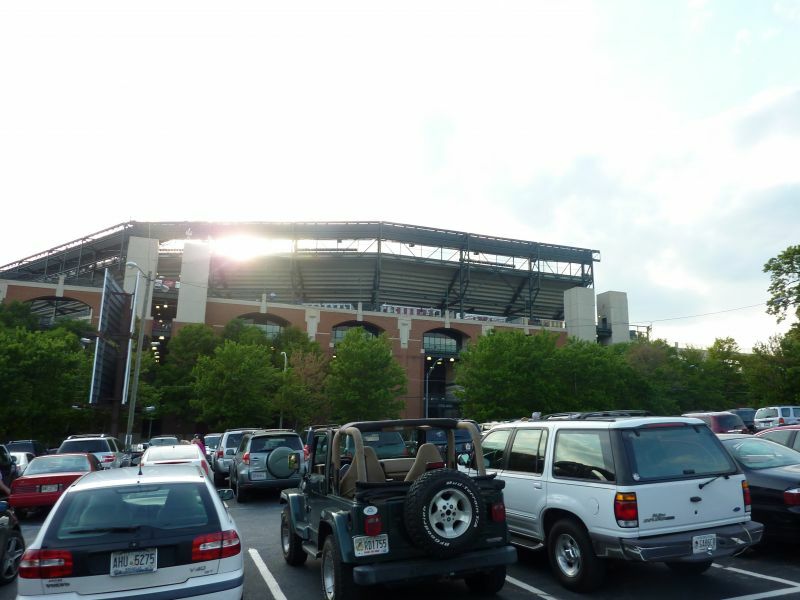 They attempted to create a neighborhood within the ballpark to compensate for the terrible location, and largely succeeded, at least at the time. 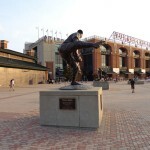 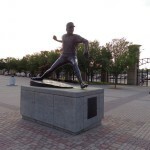 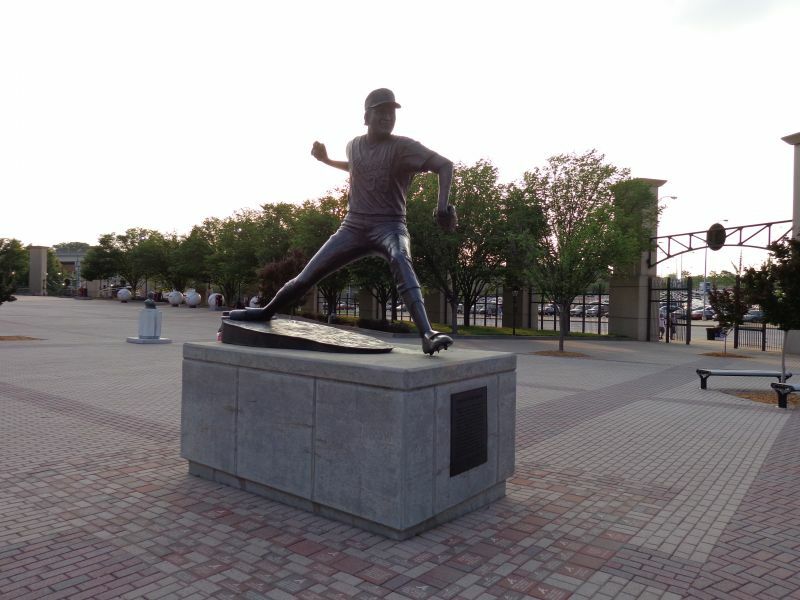 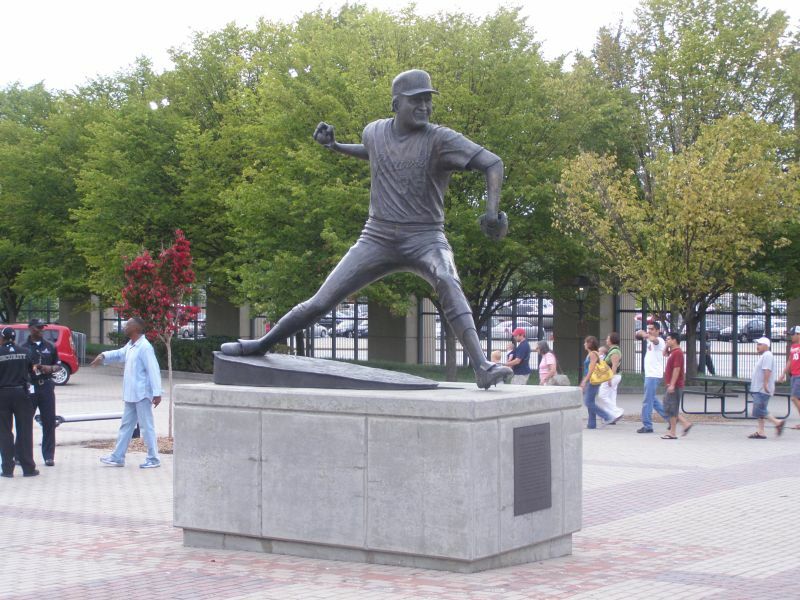 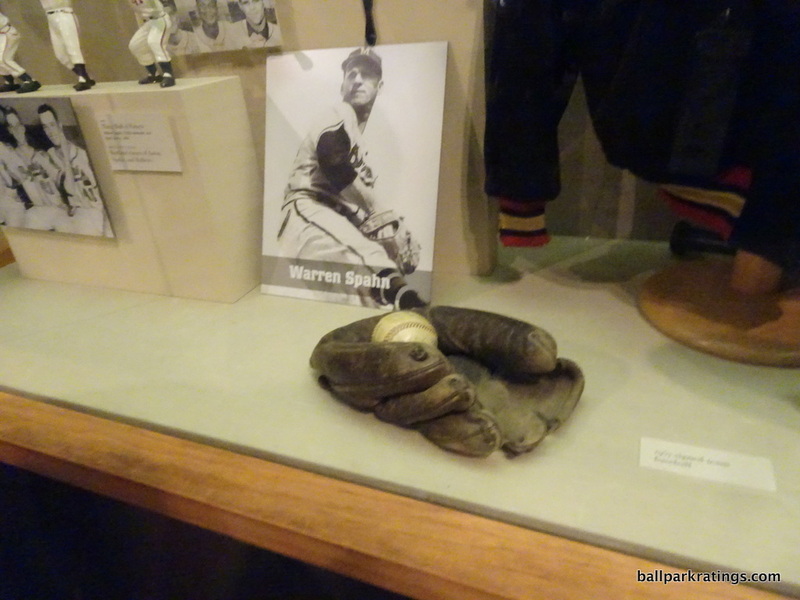 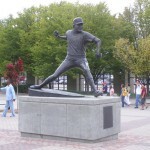 Warren Spahn statue in Monument Grove. 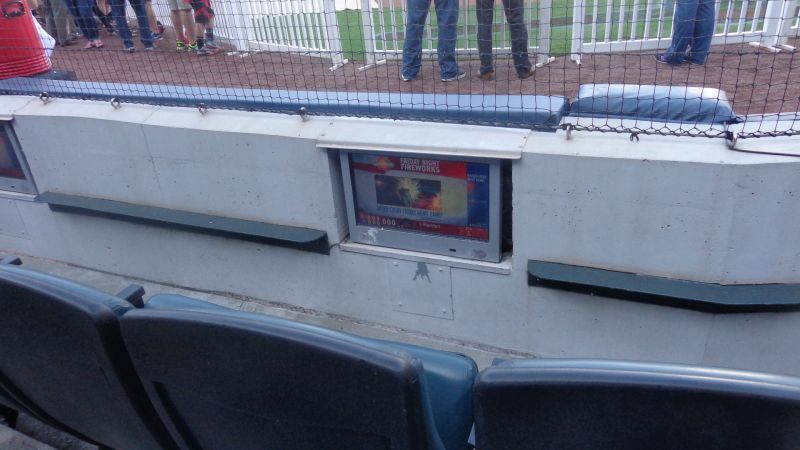 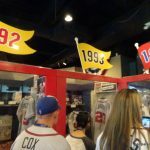 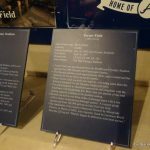 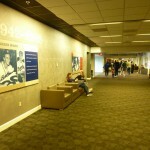 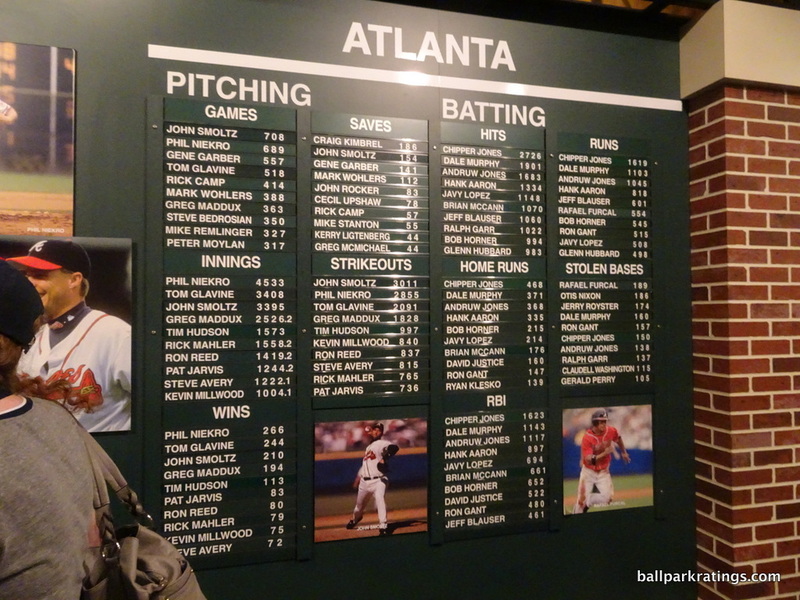 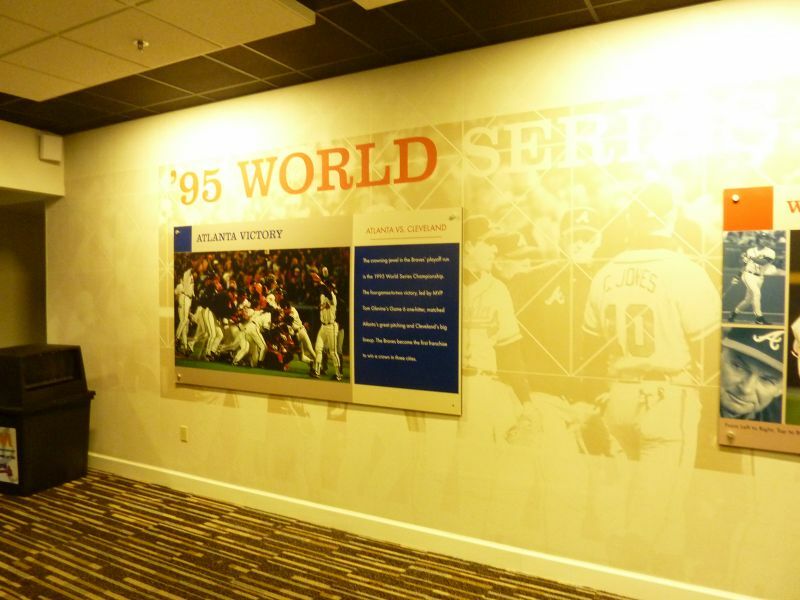 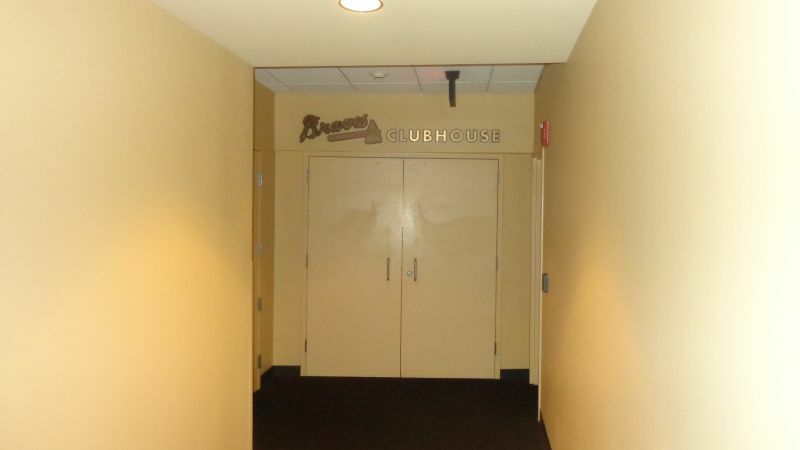 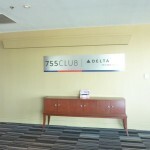 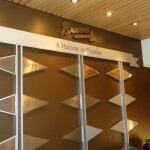 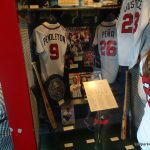 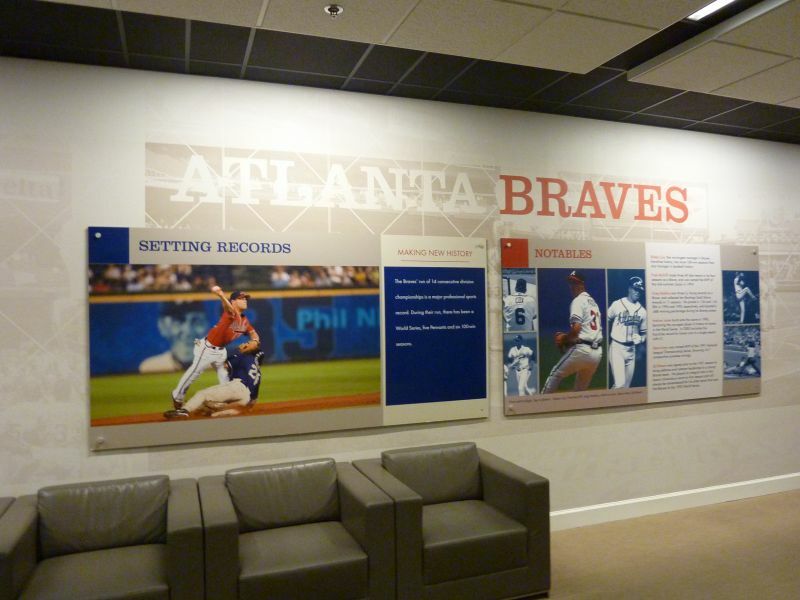 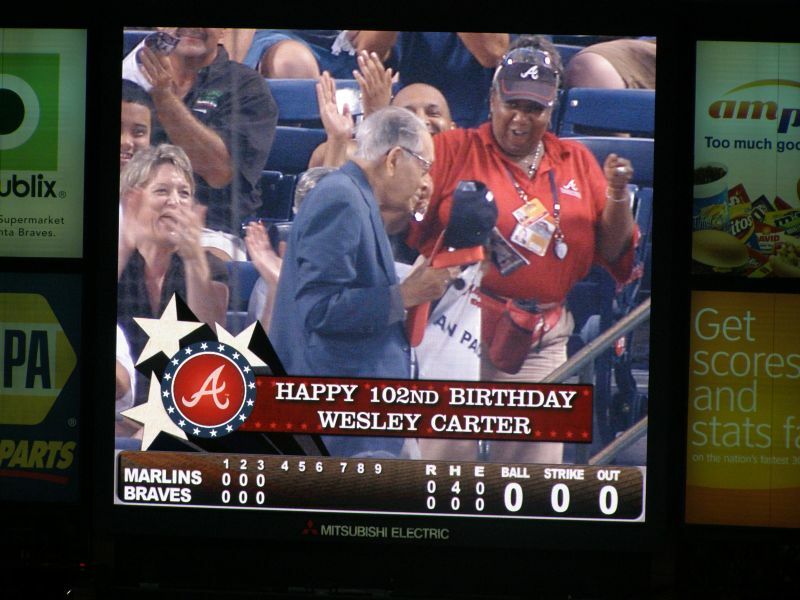 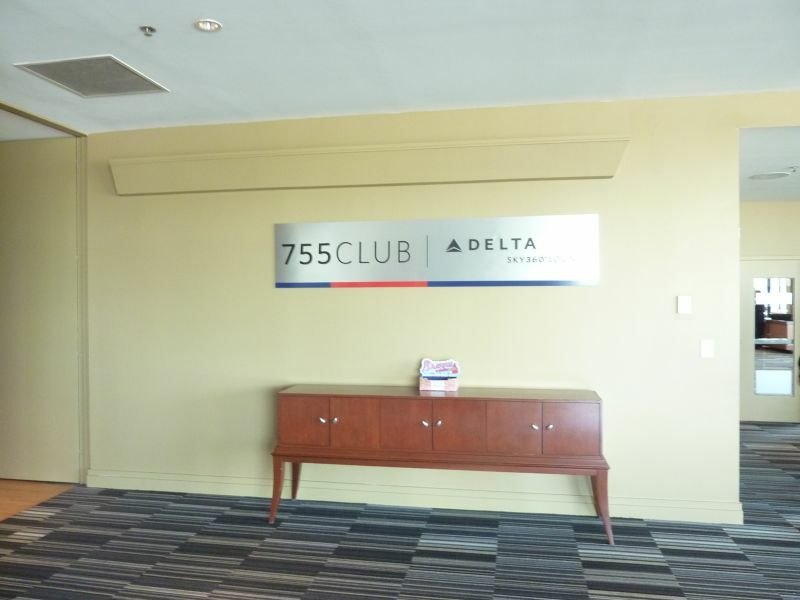 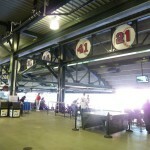 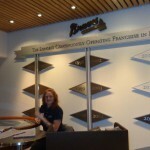 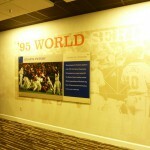 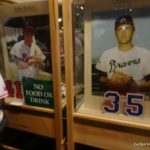 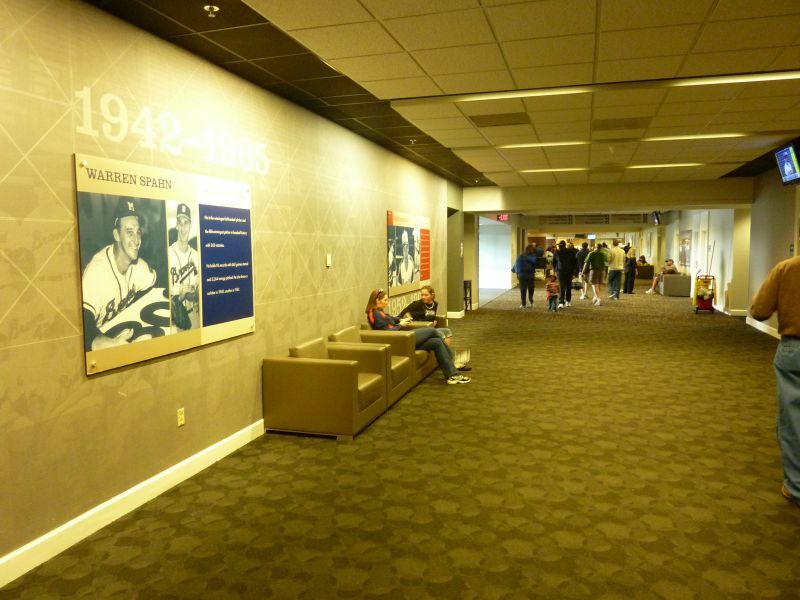 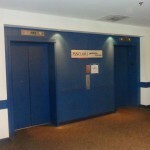 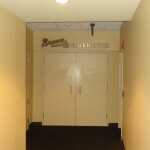 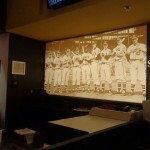 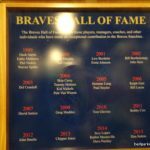 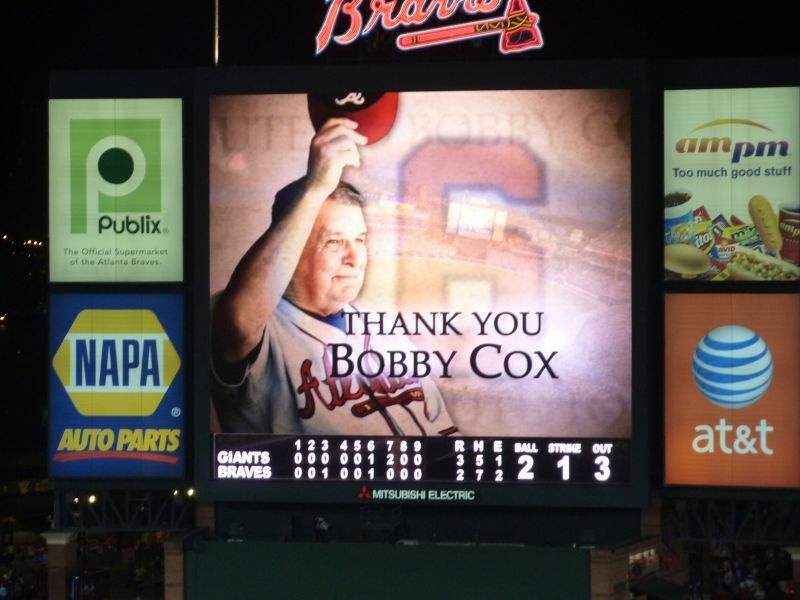 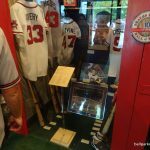 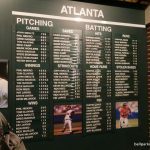 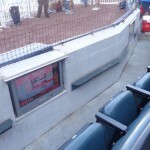 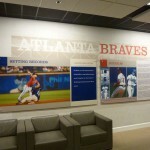 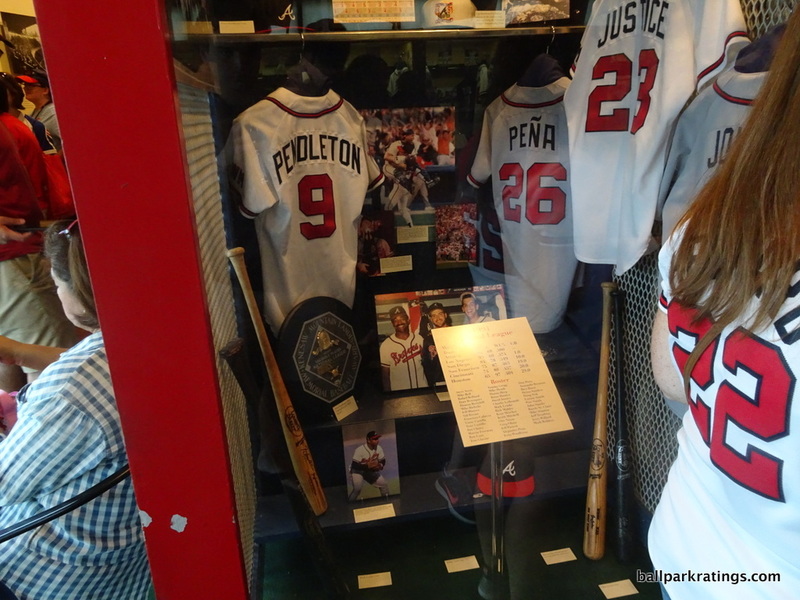 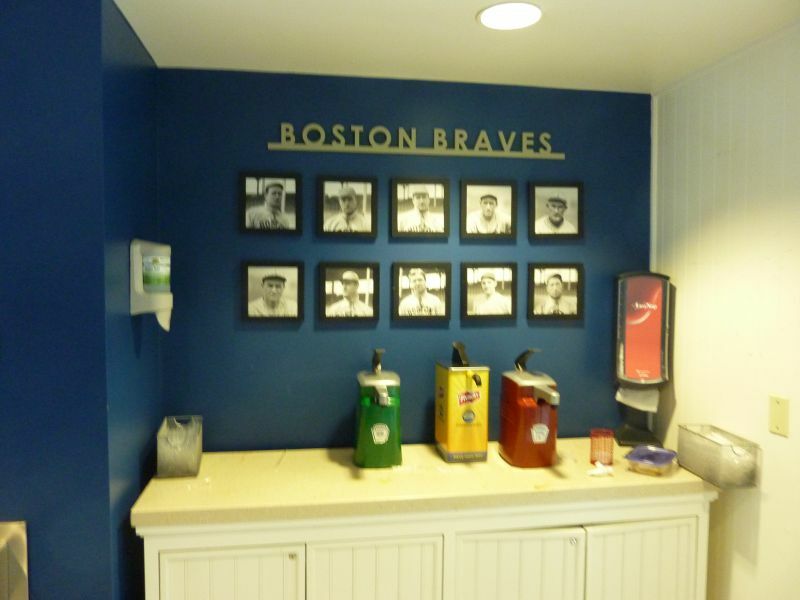 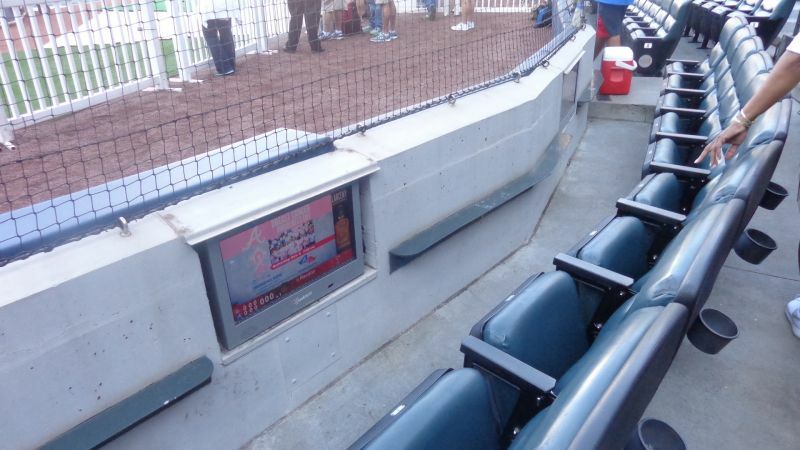 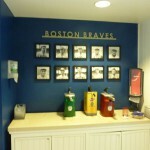 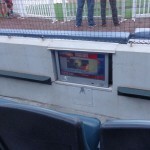 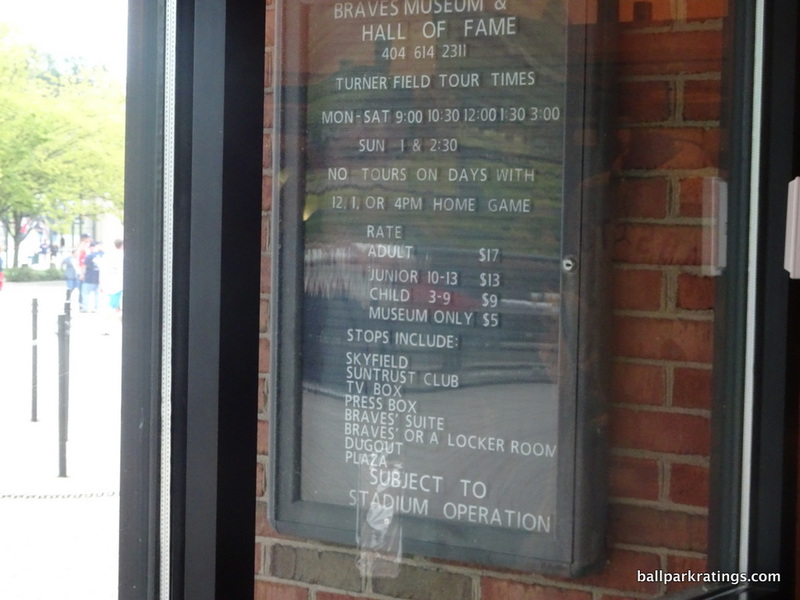 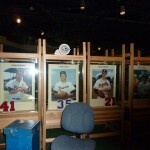 Turner Field benefits from fantastic references to team history. 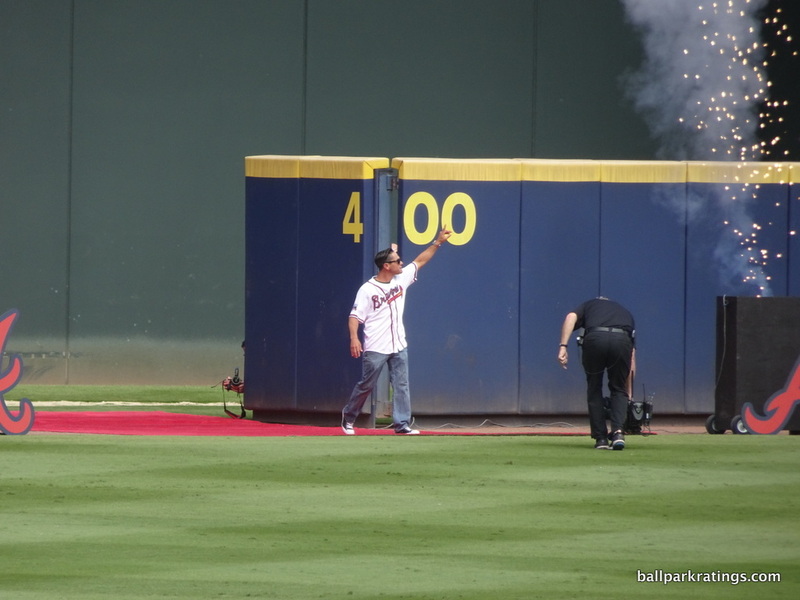 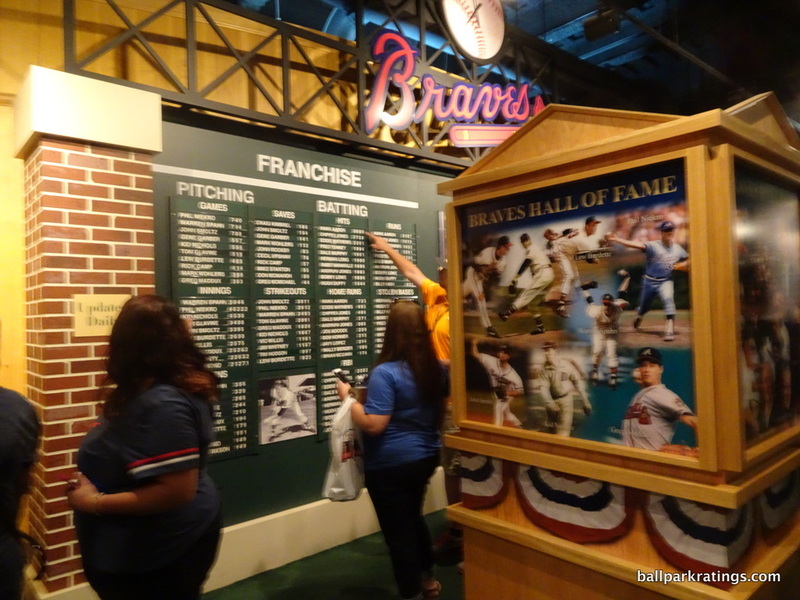 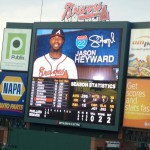 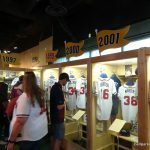 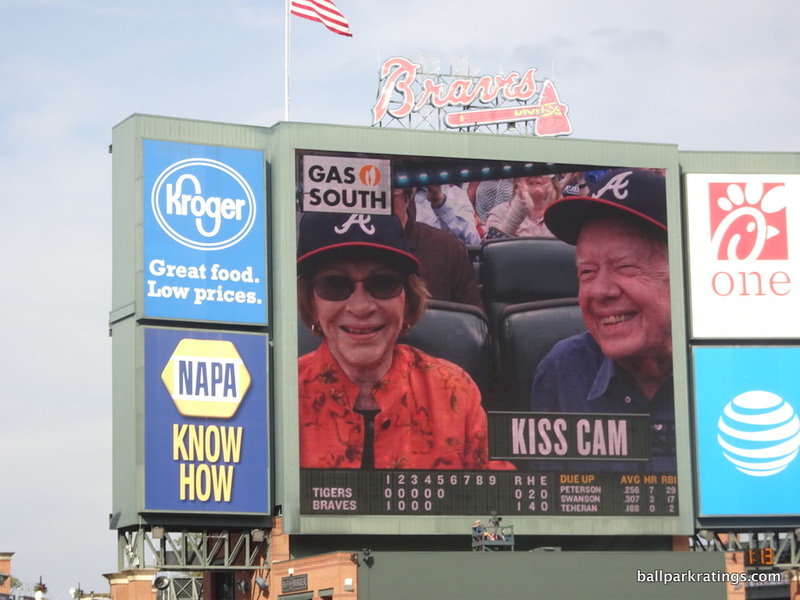 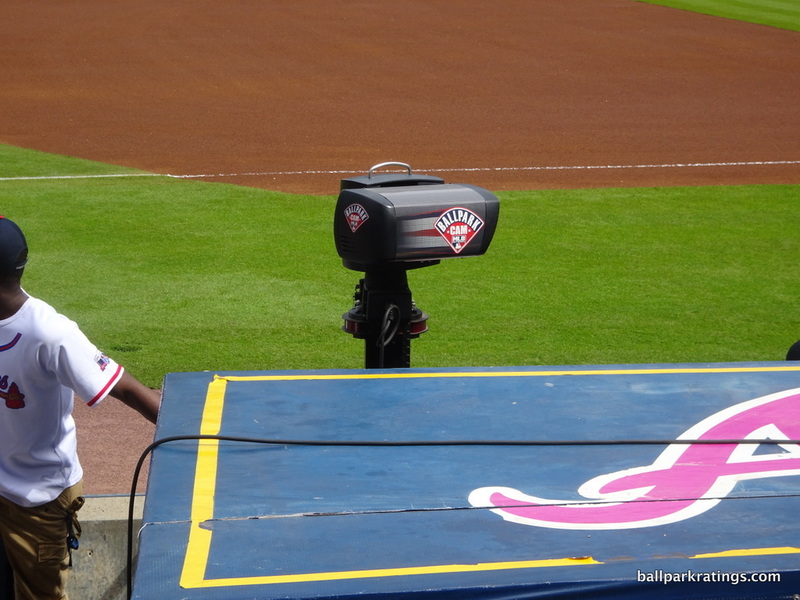 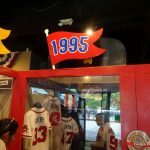 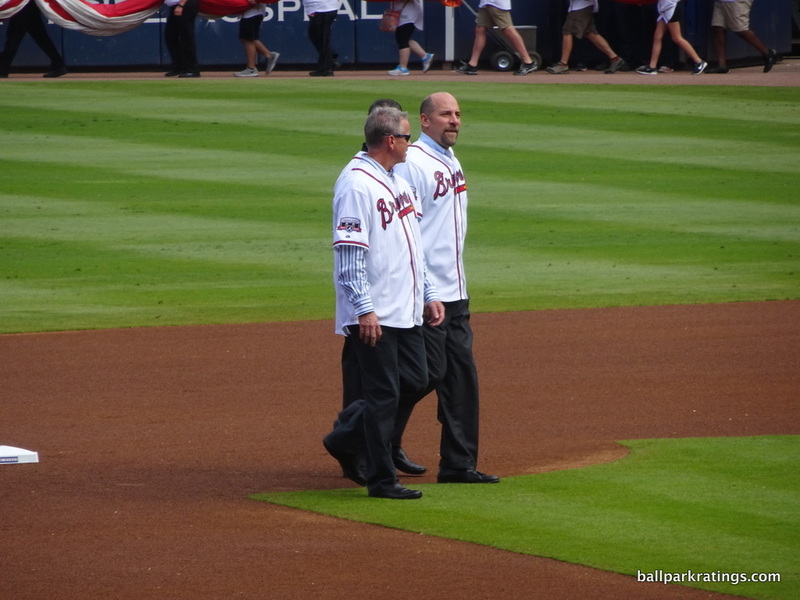 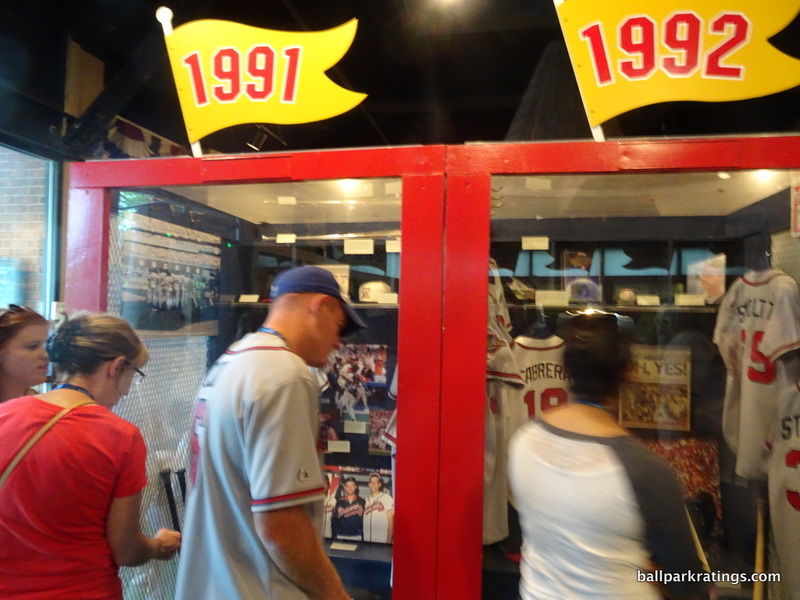 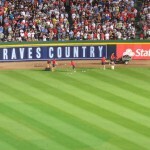 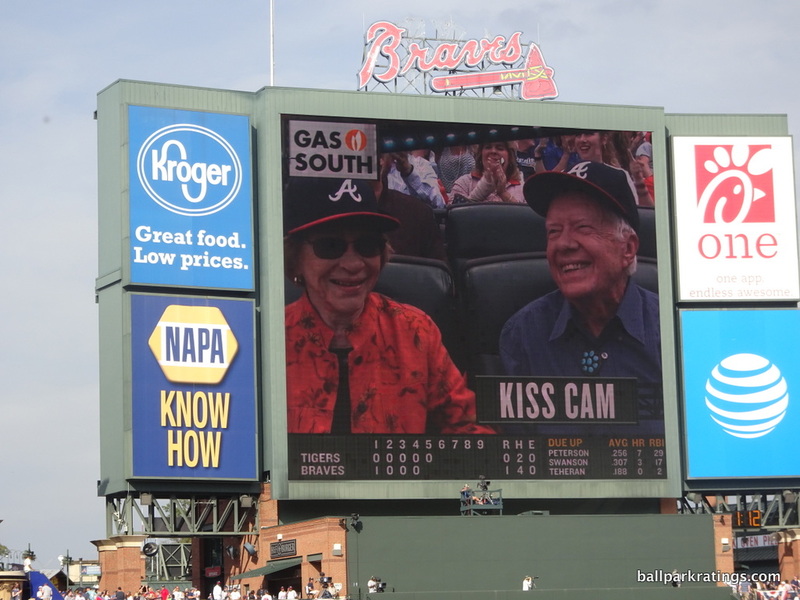 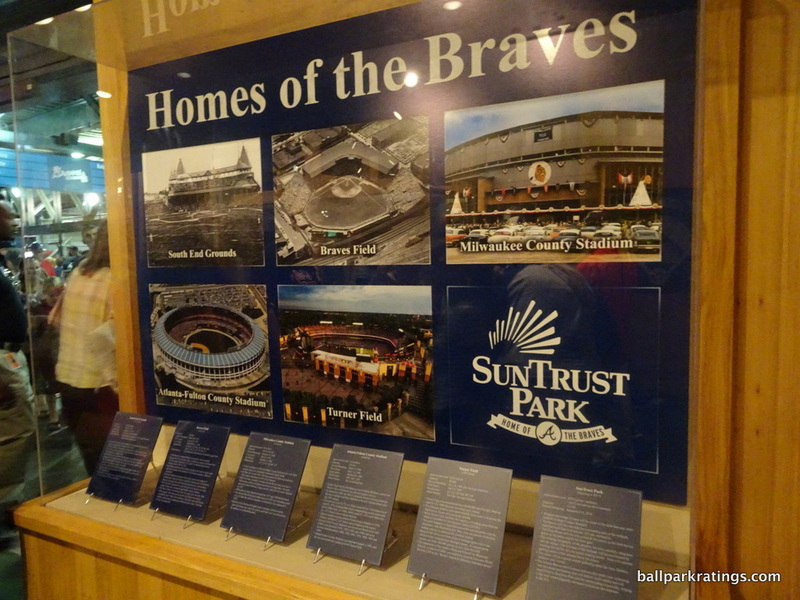 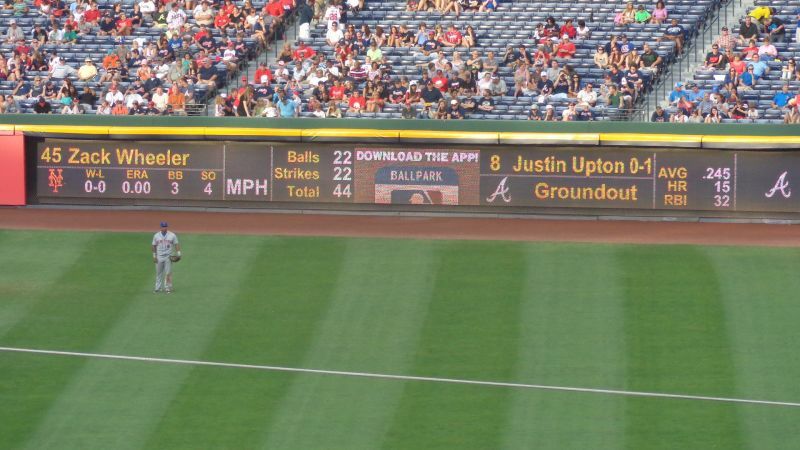 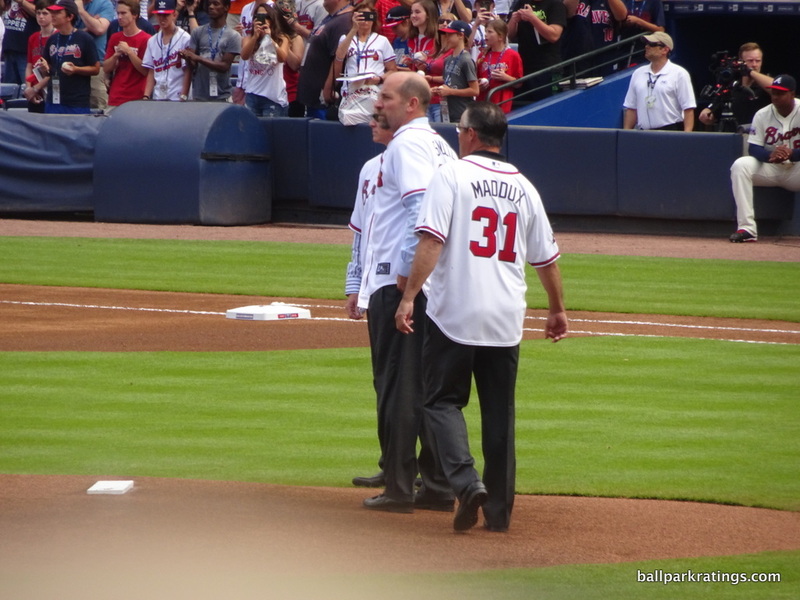 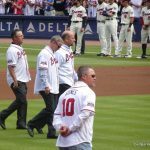 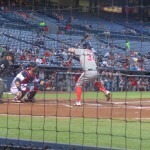 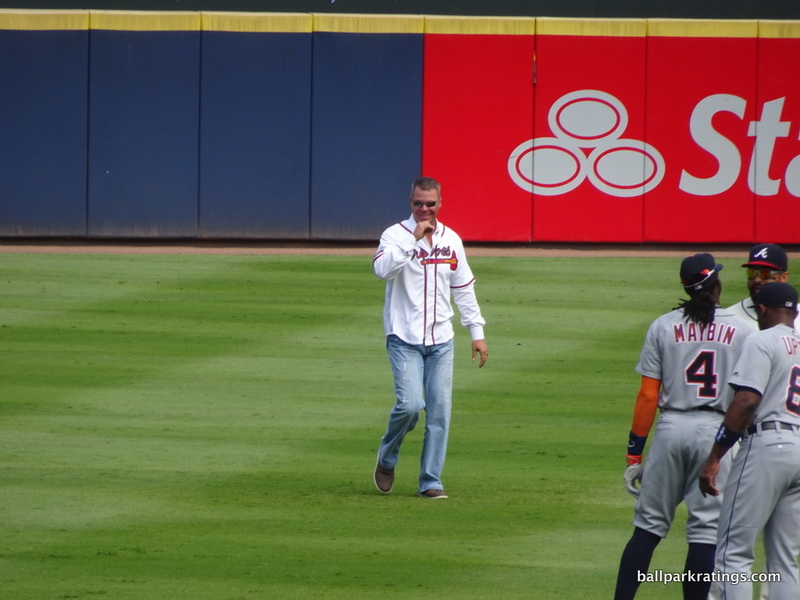 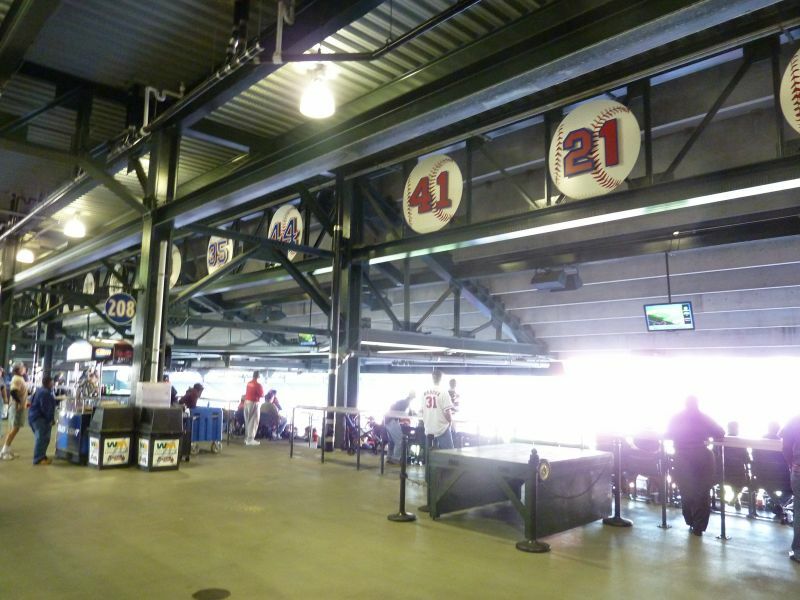 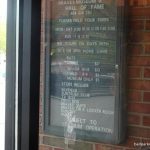 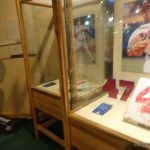 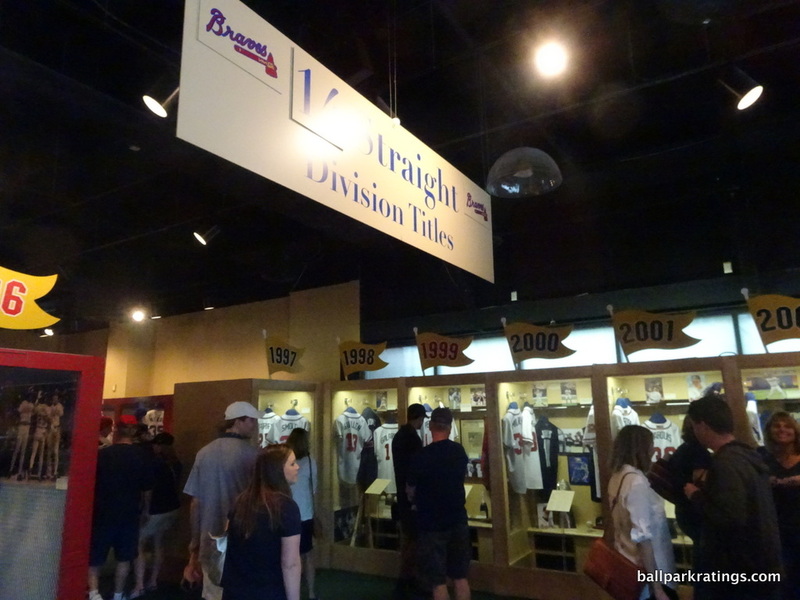 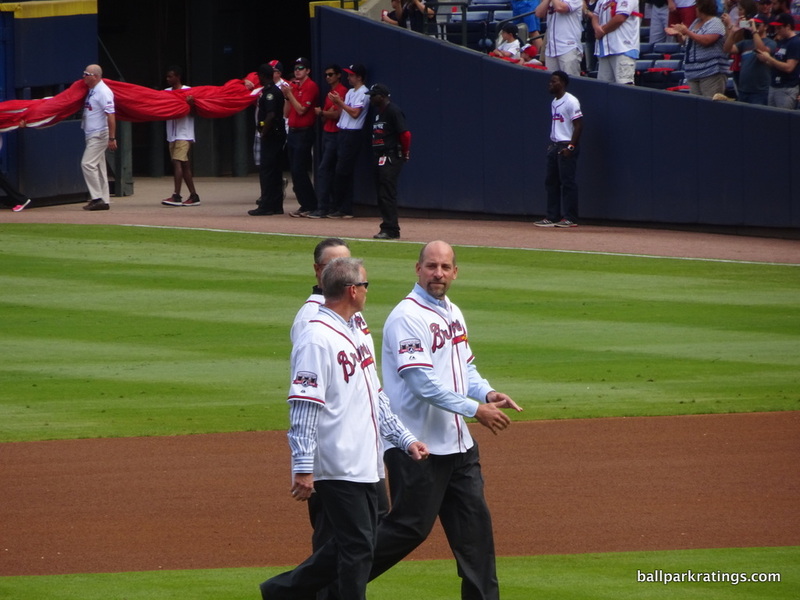 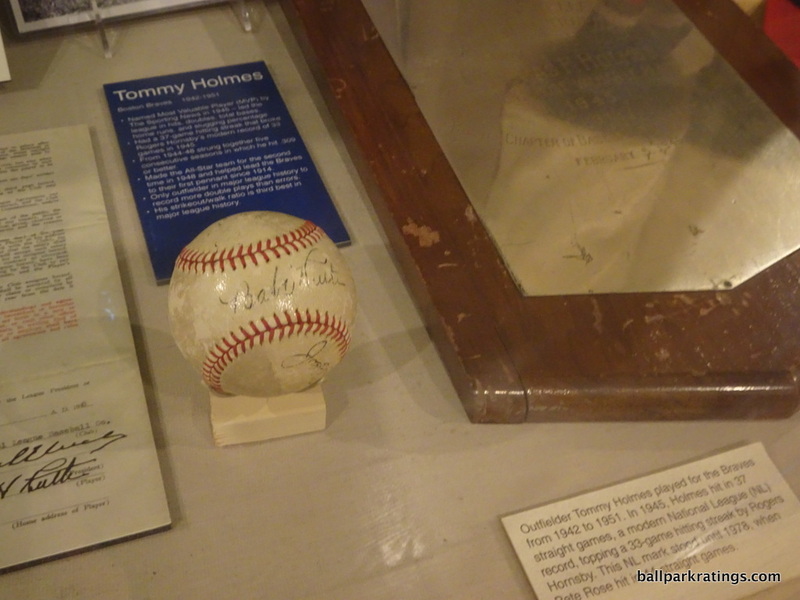 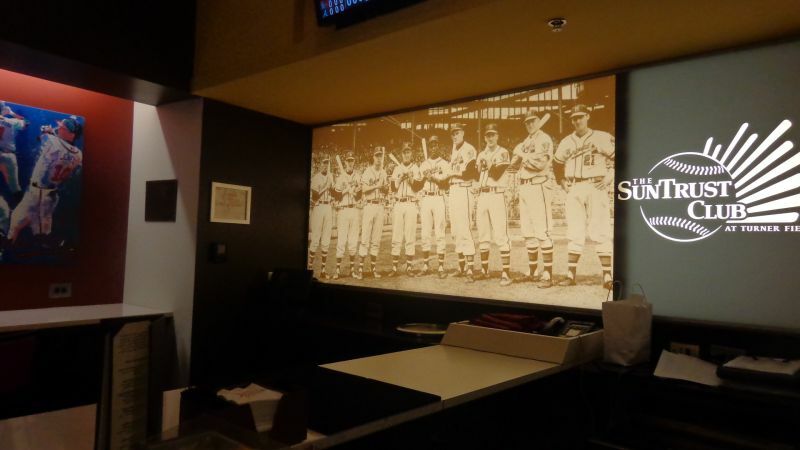 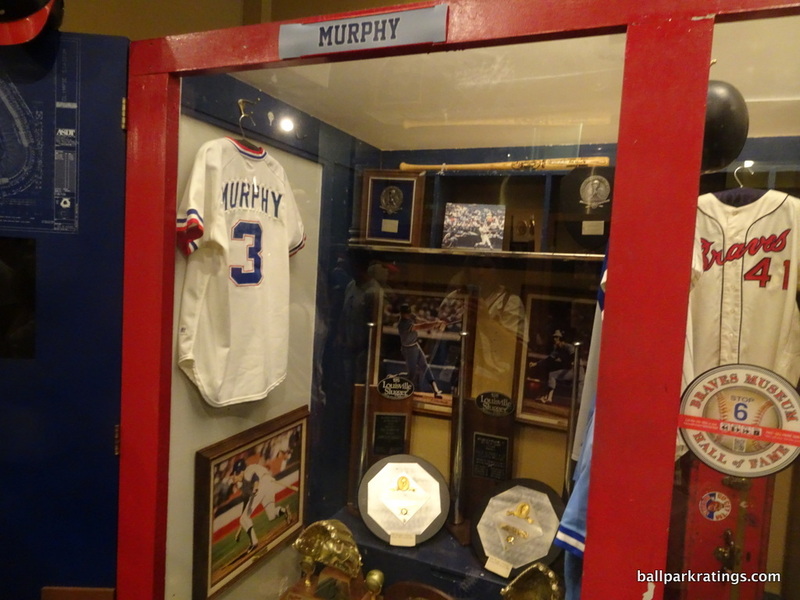 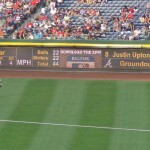 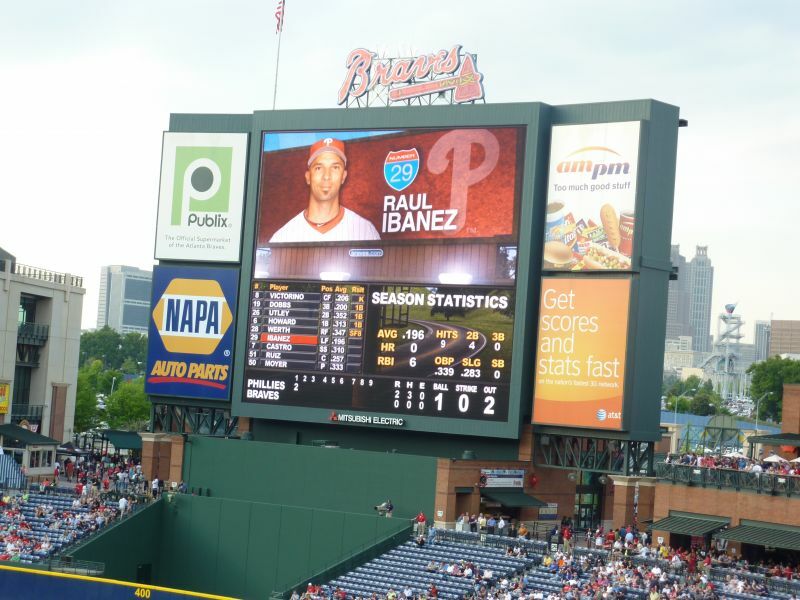 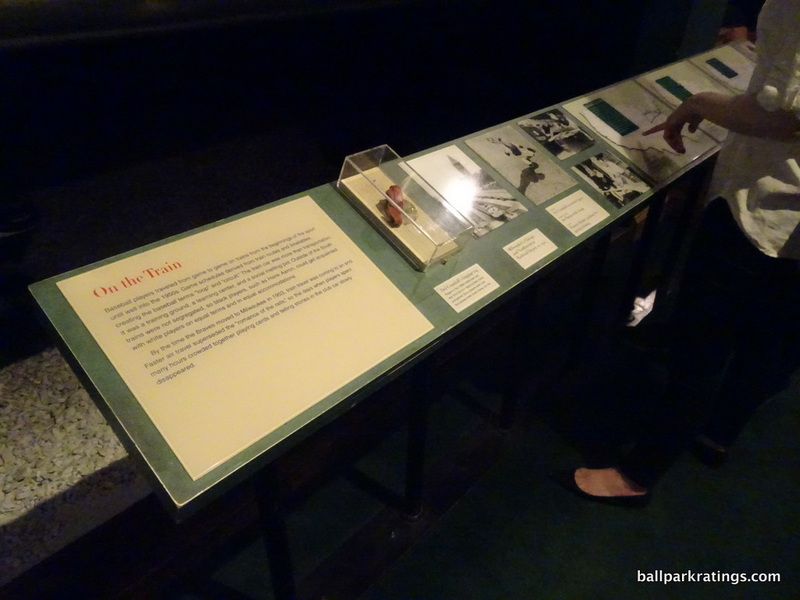 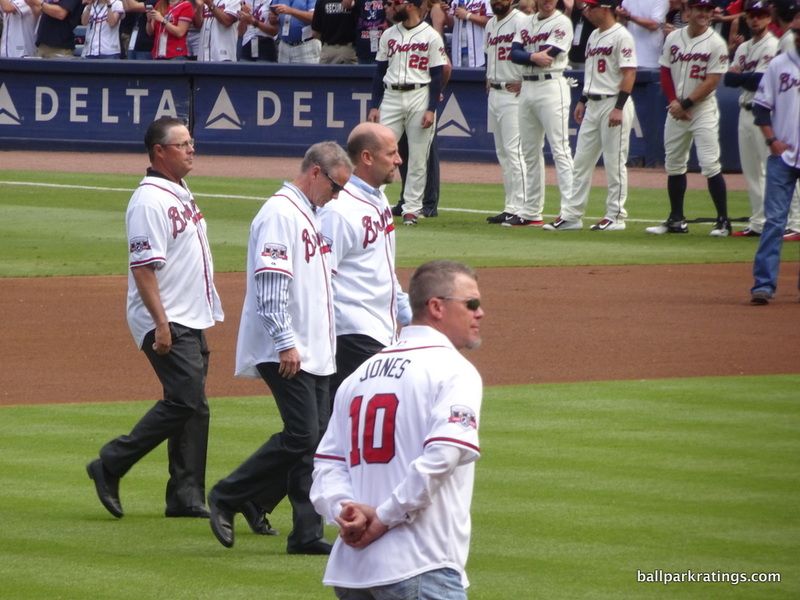 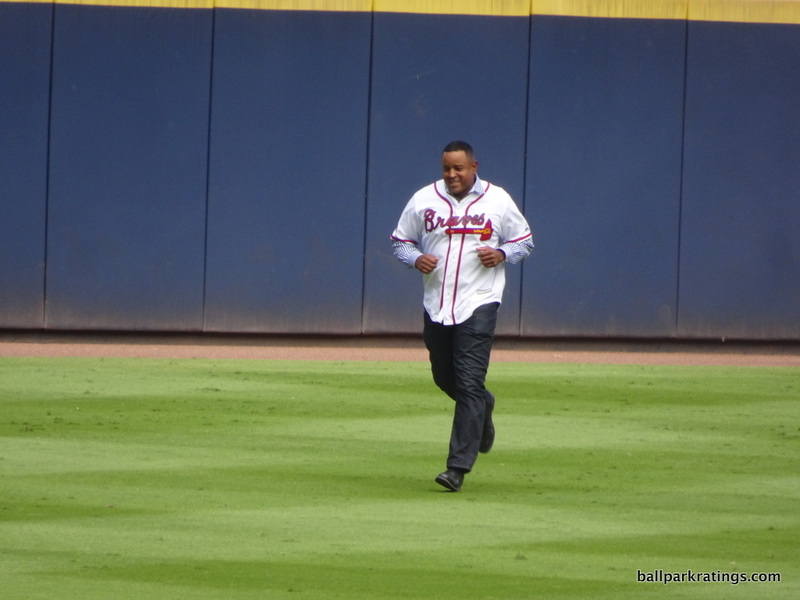 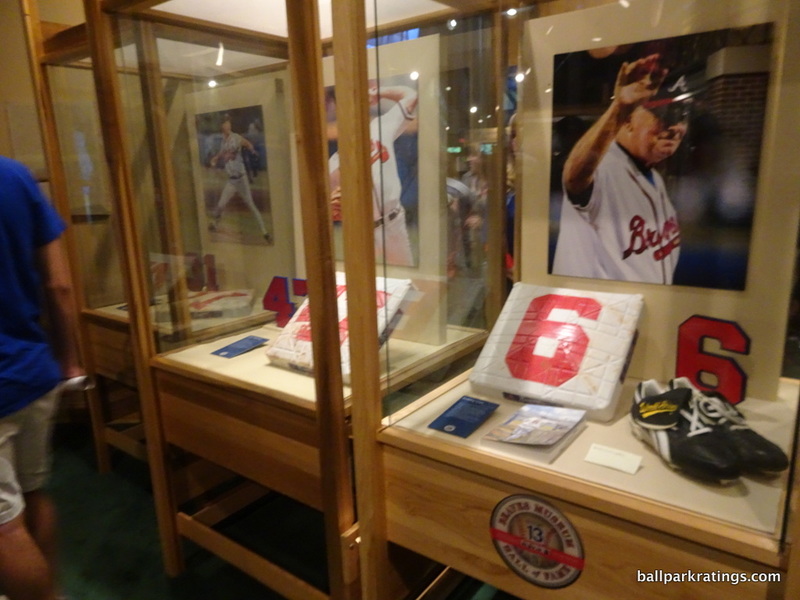 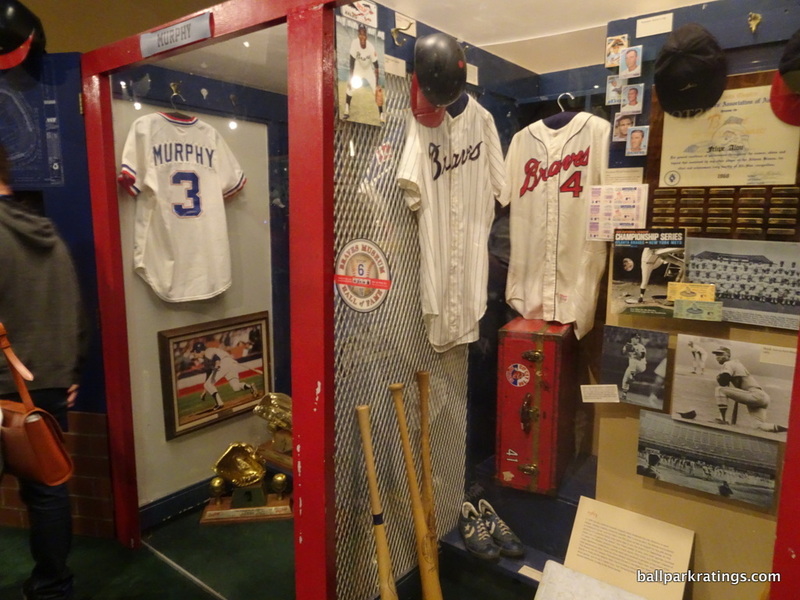 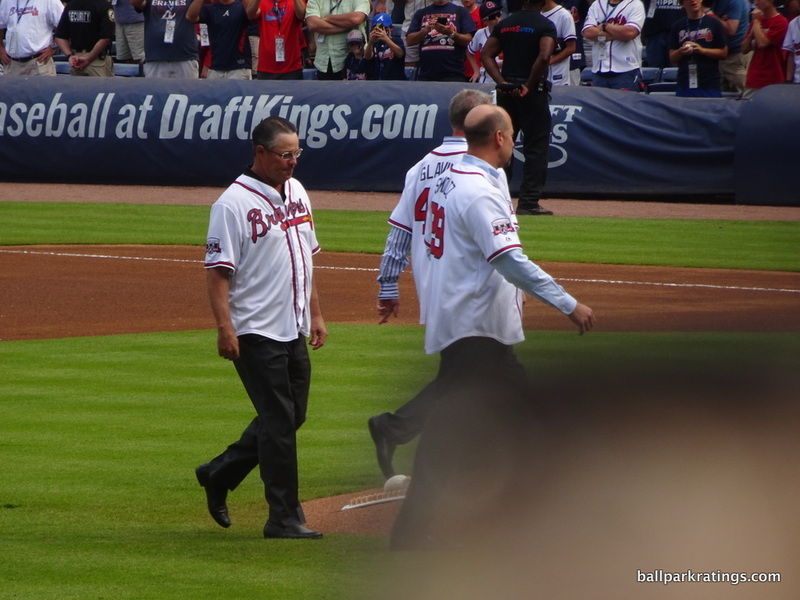 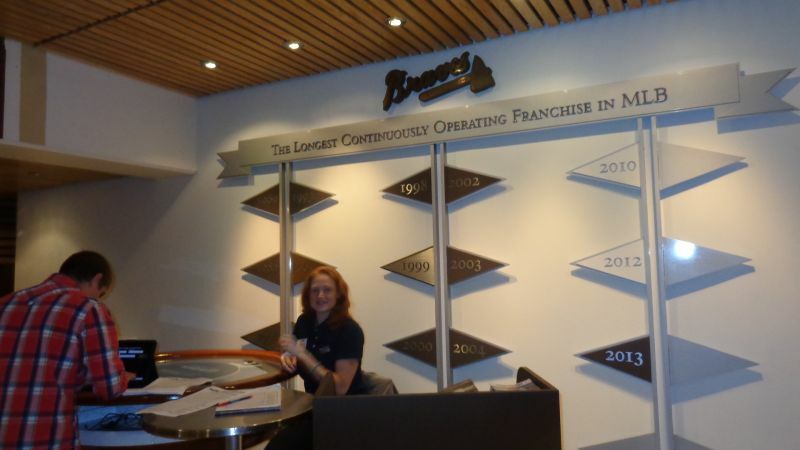 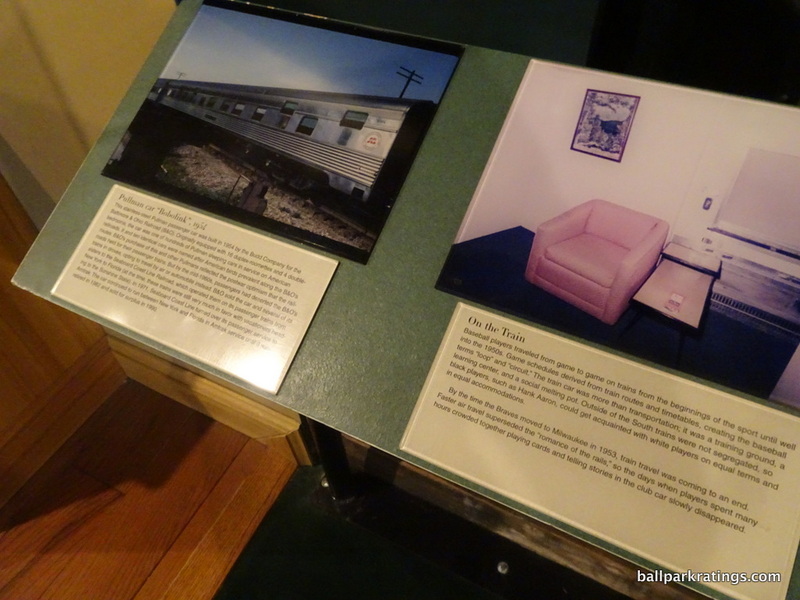 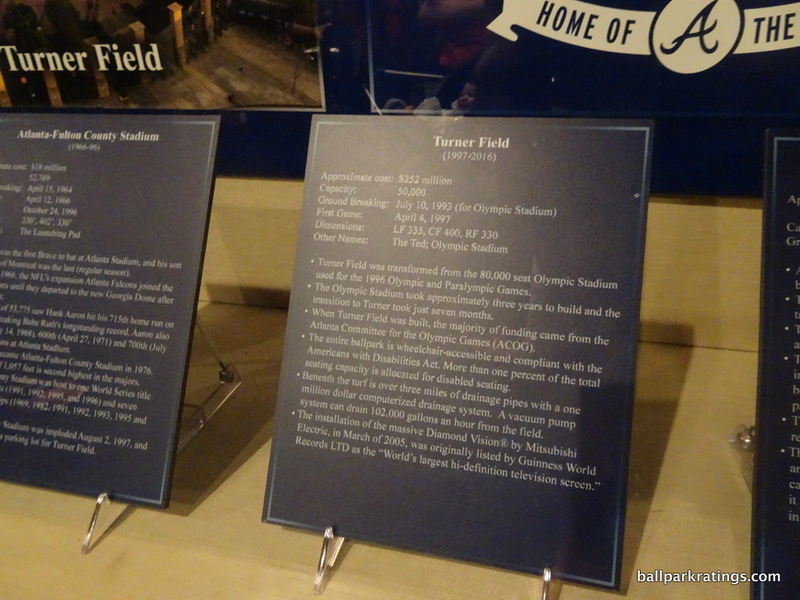 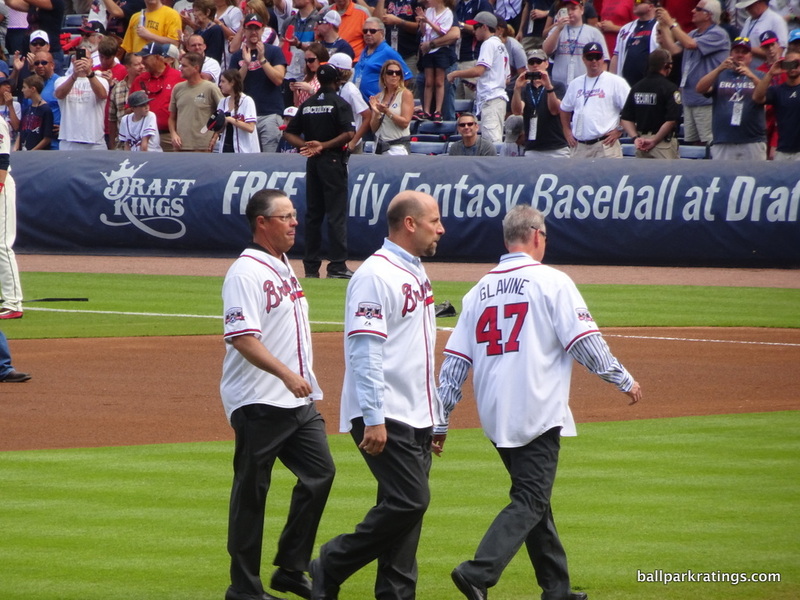 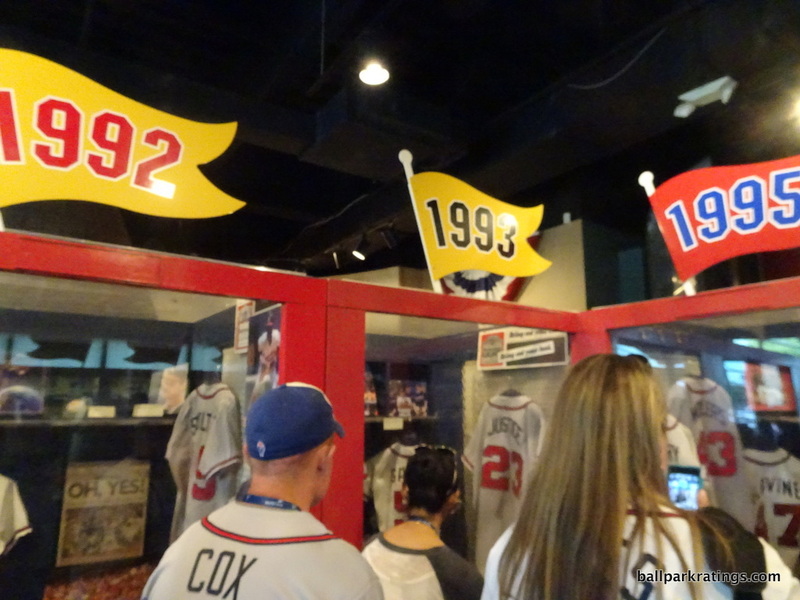 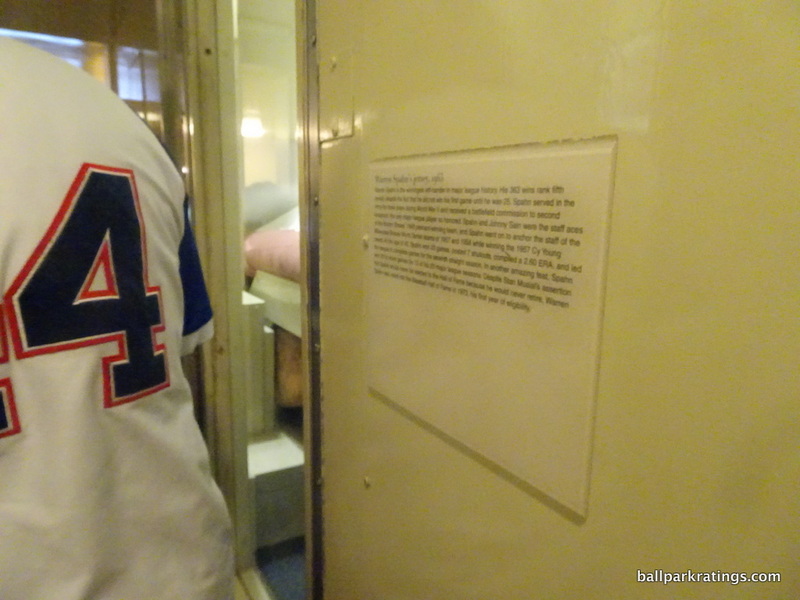 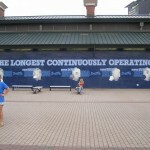 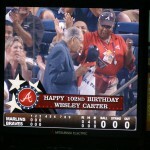 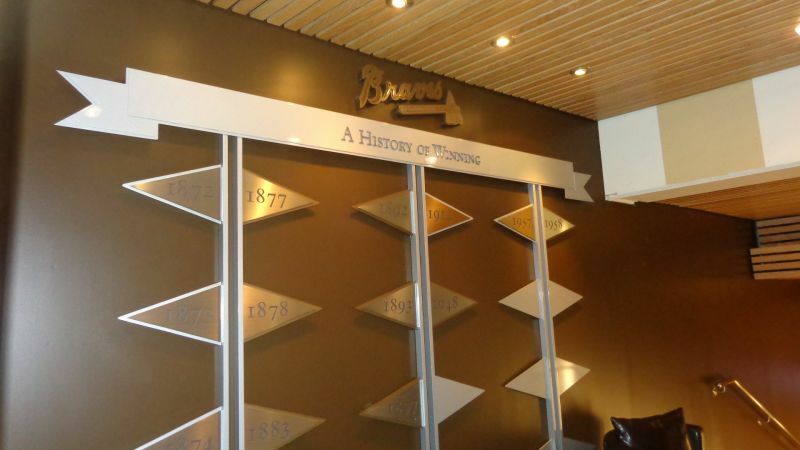 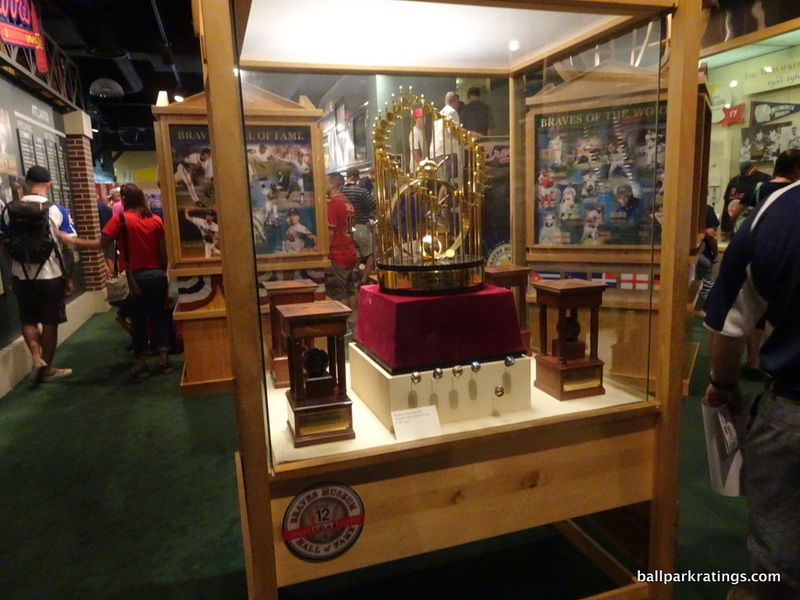 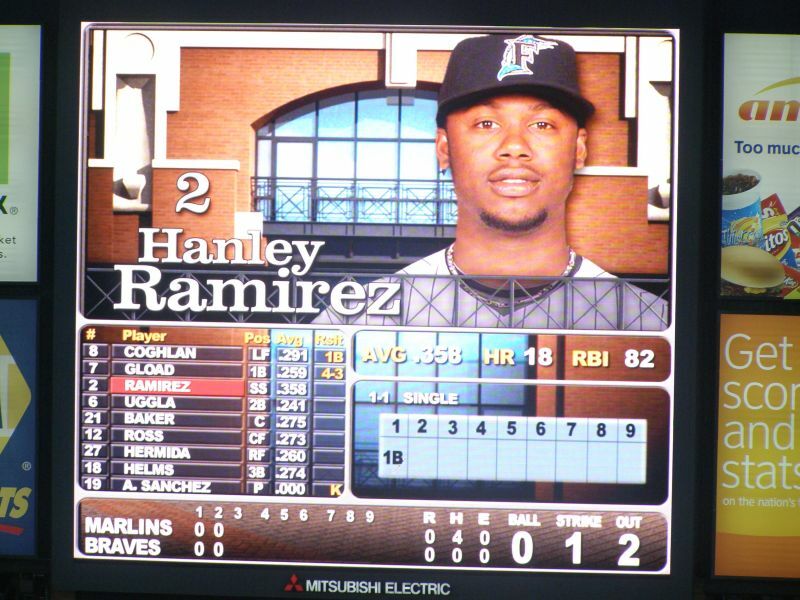 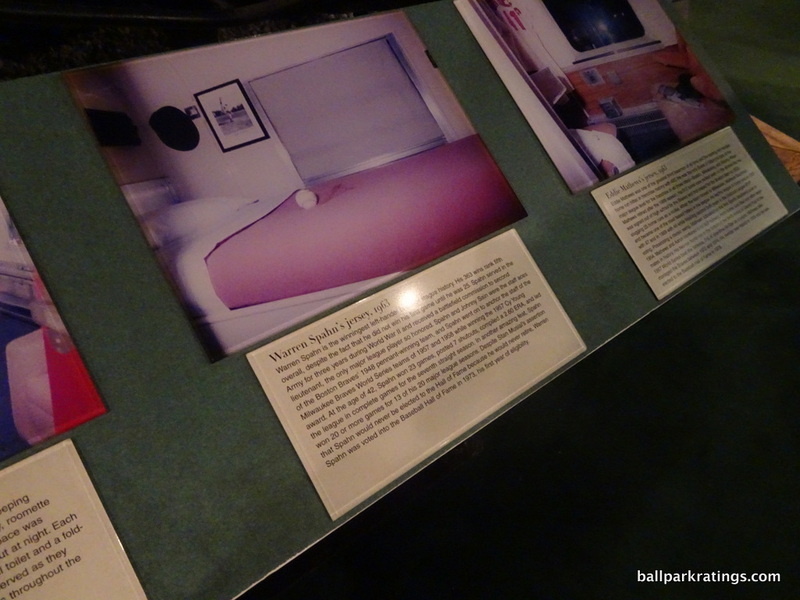 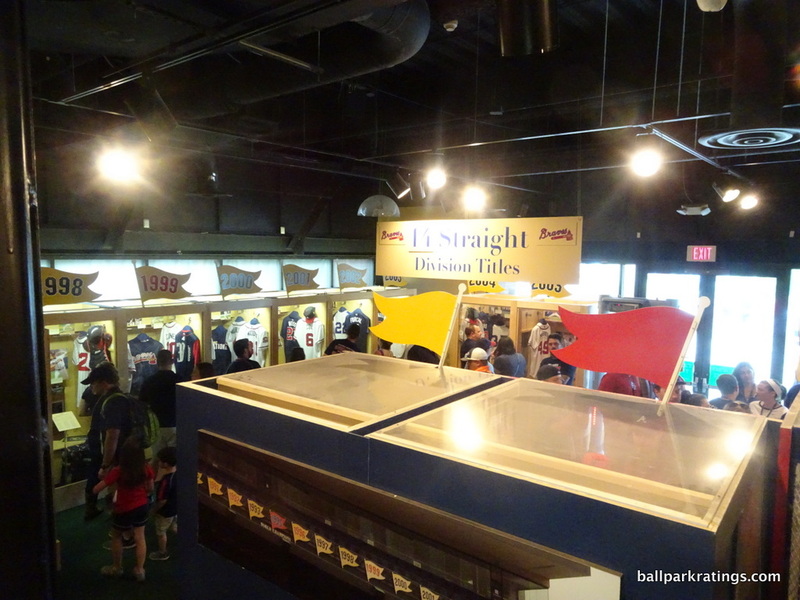 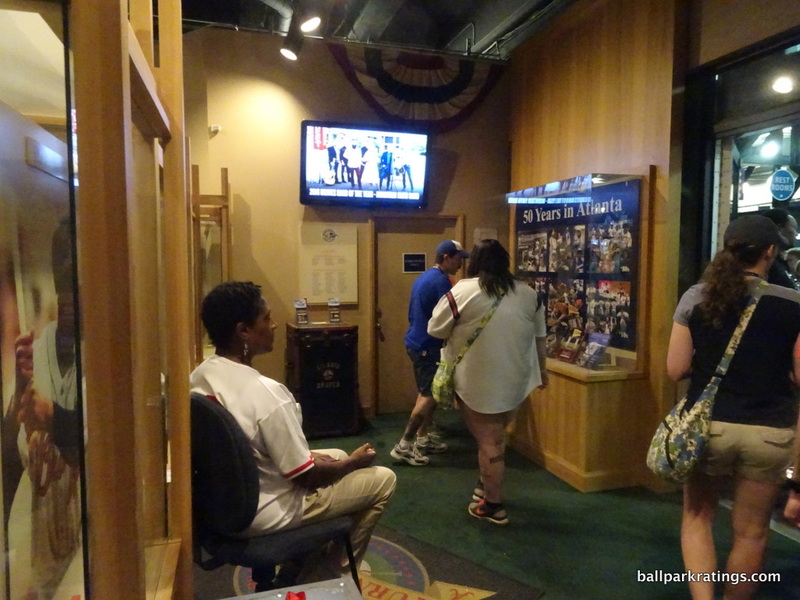 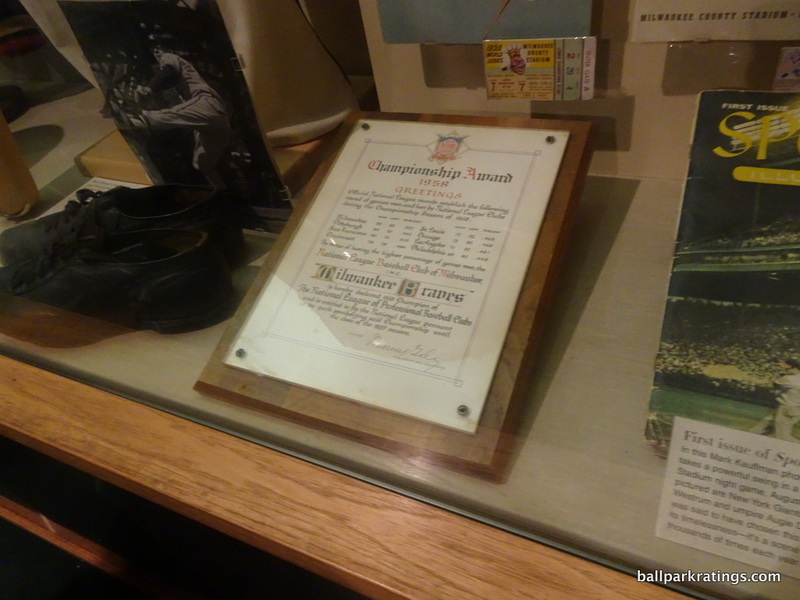 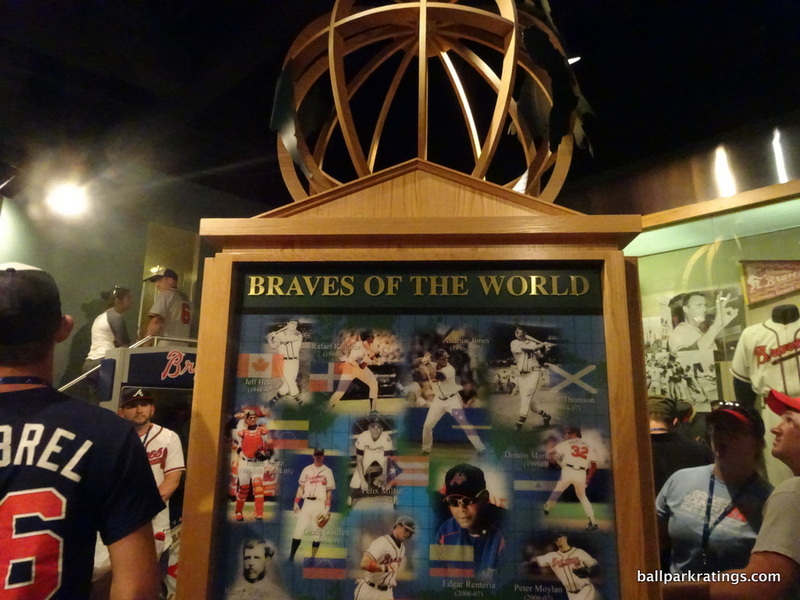 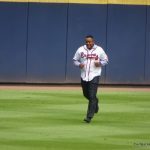 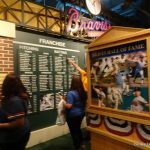 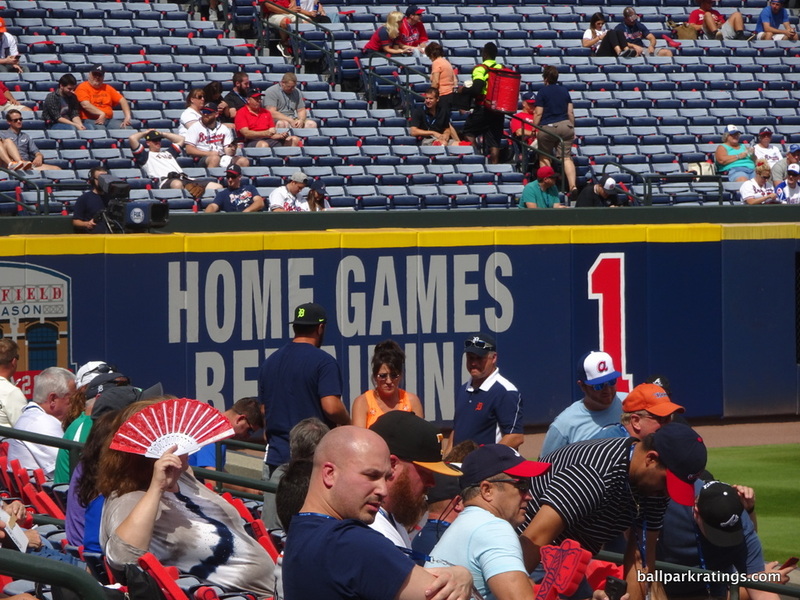 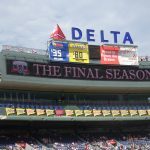 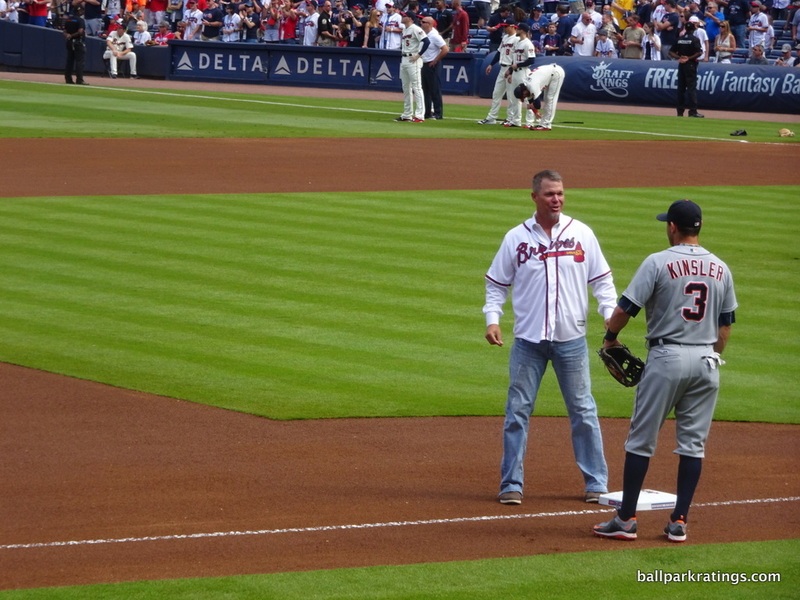 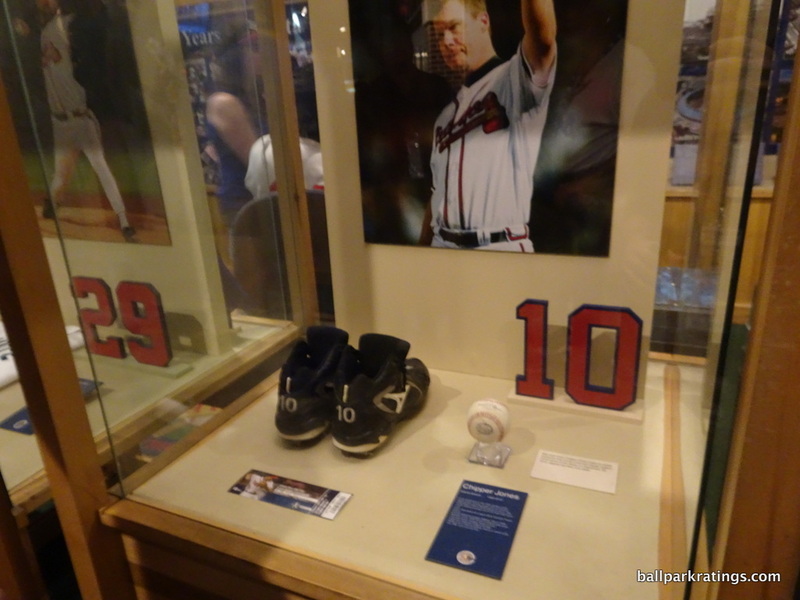 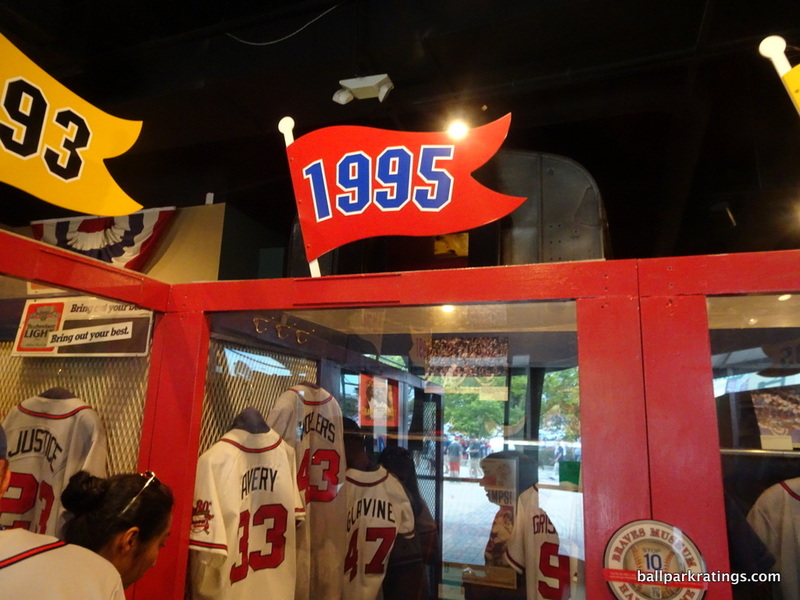 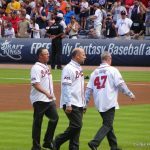 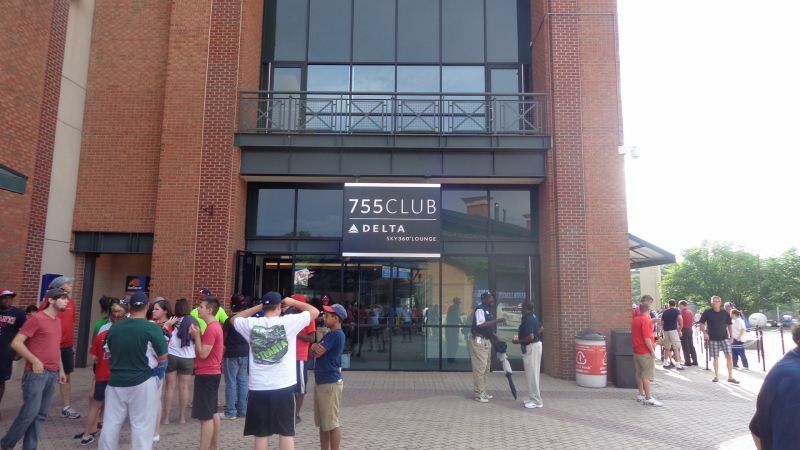 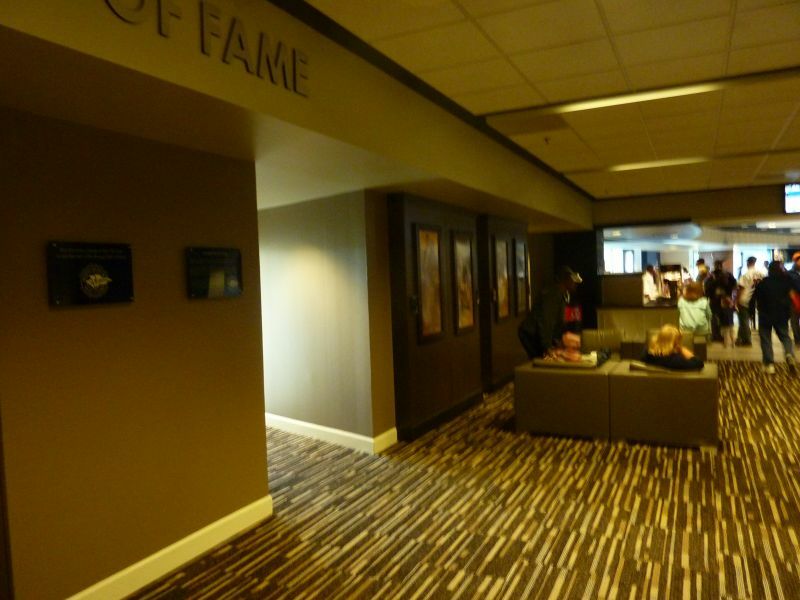 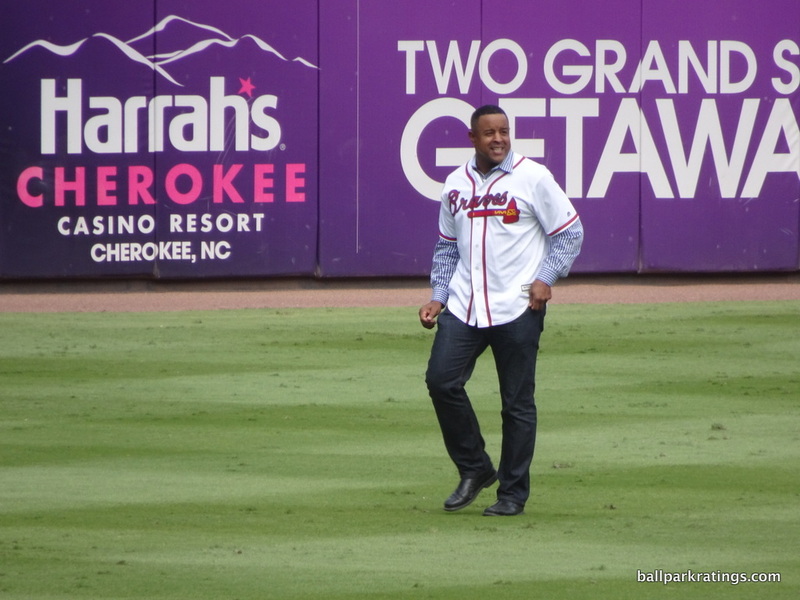 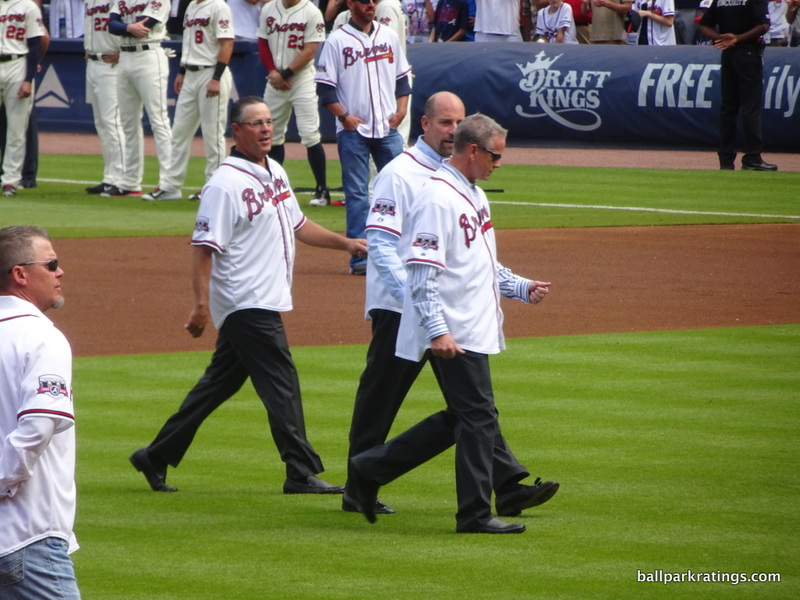 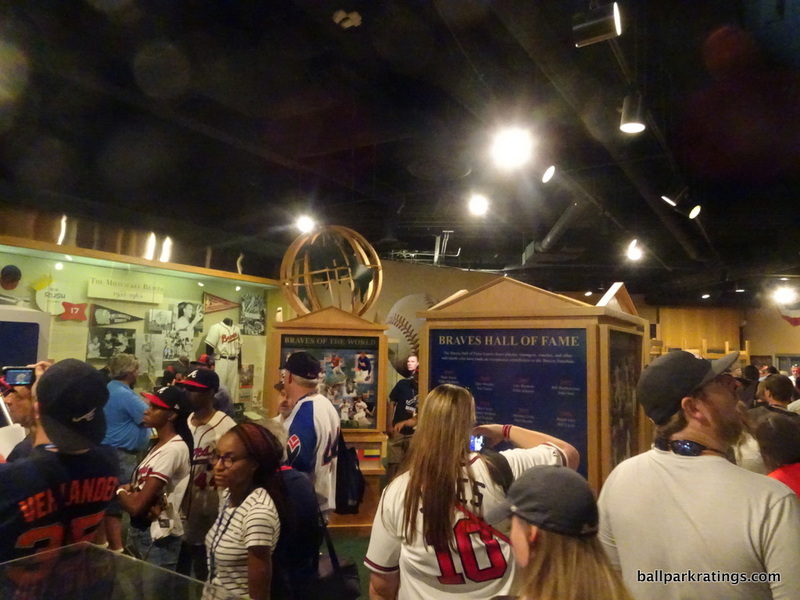 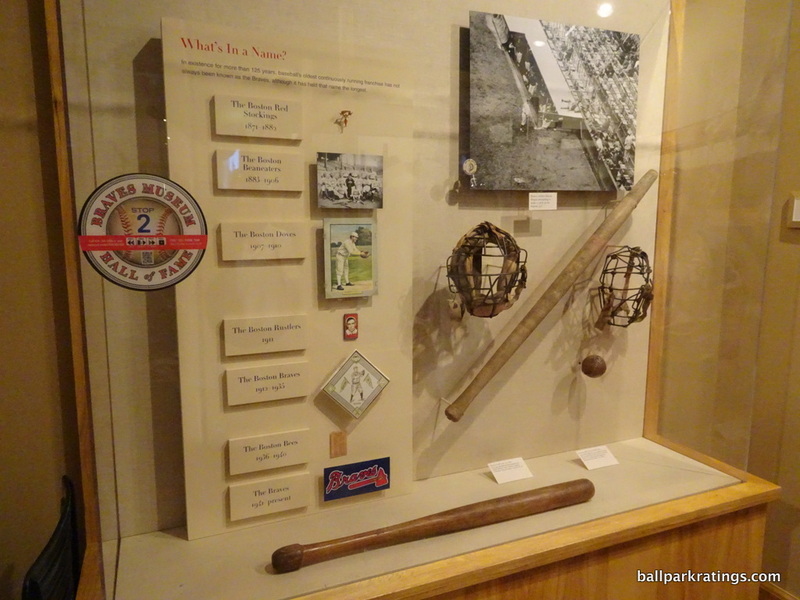 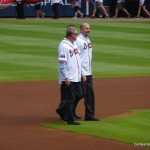 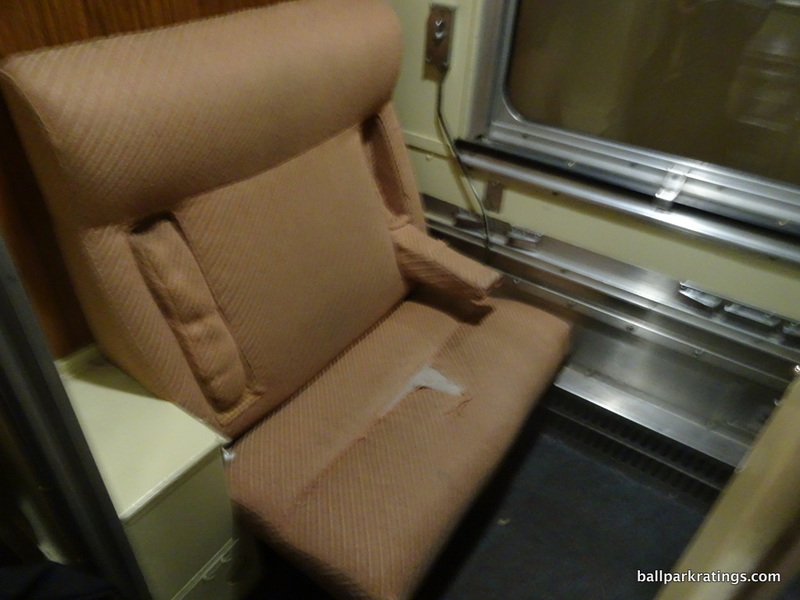 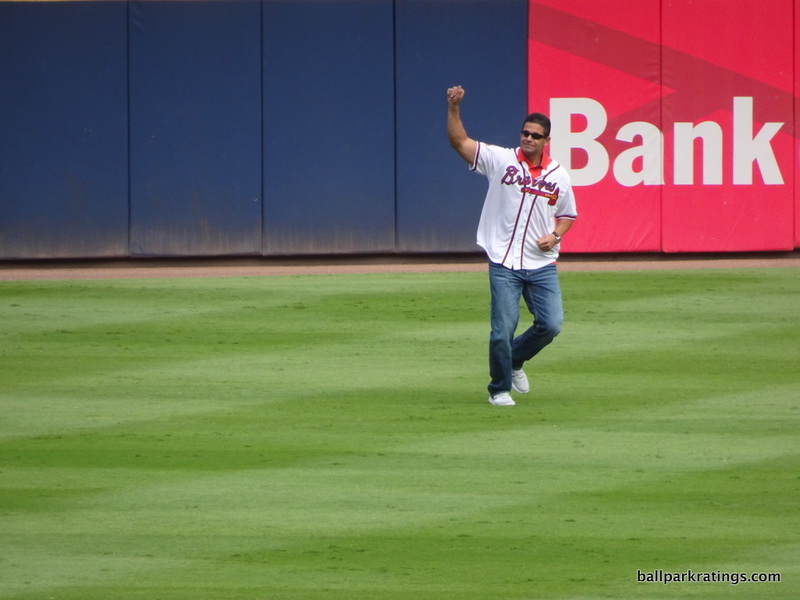 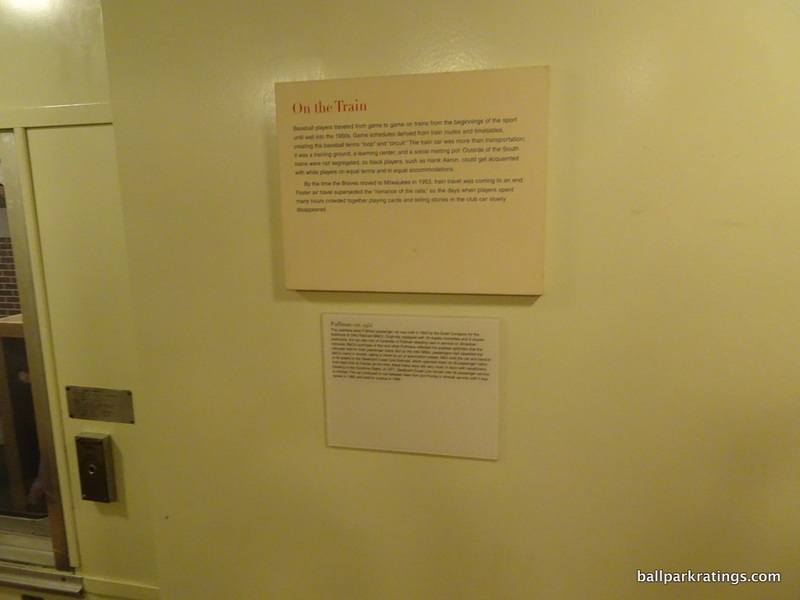 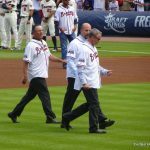 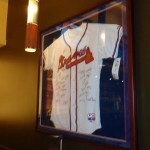 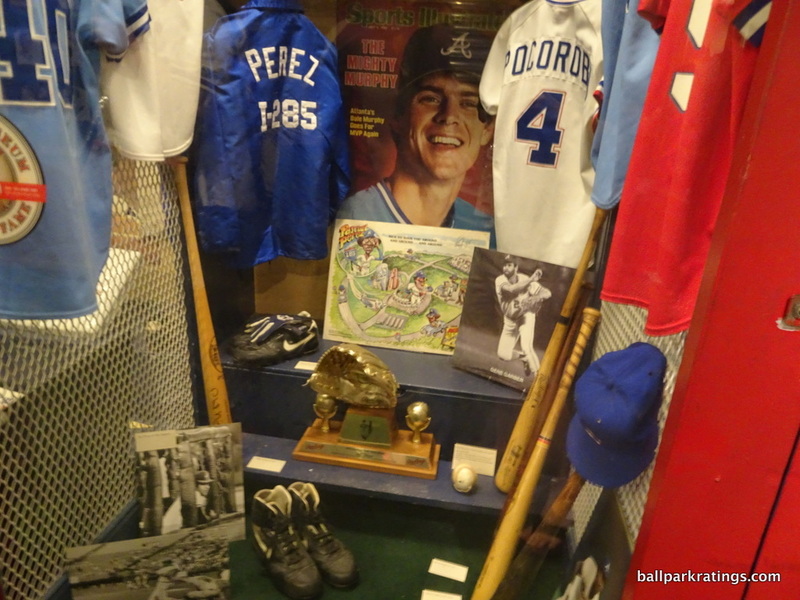 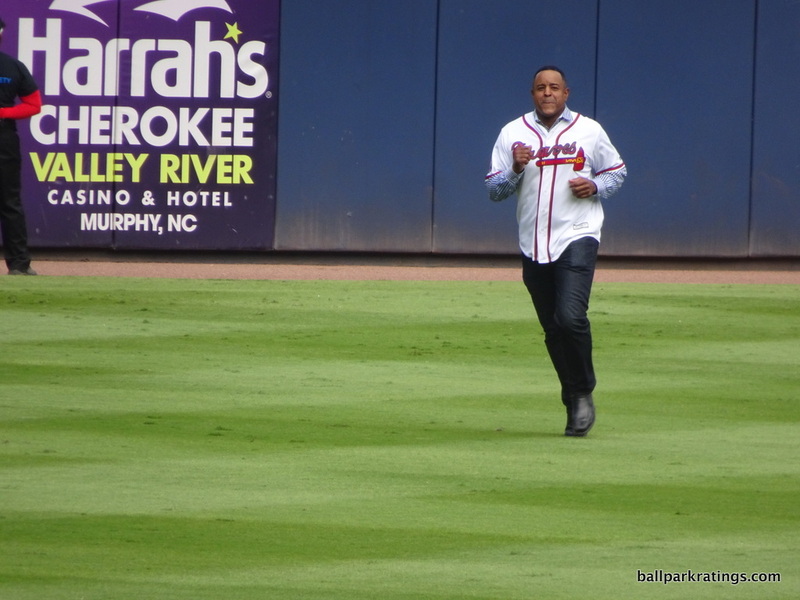 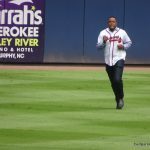 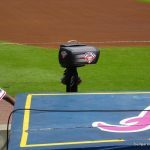 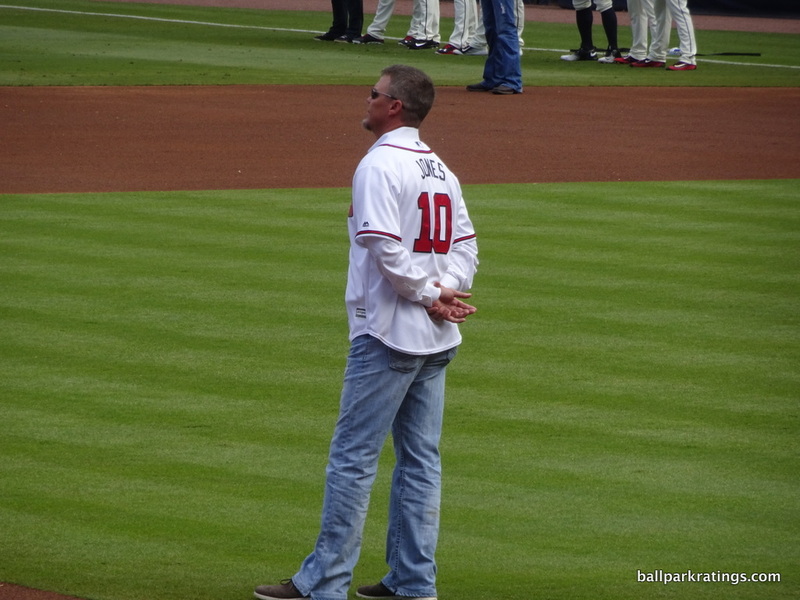 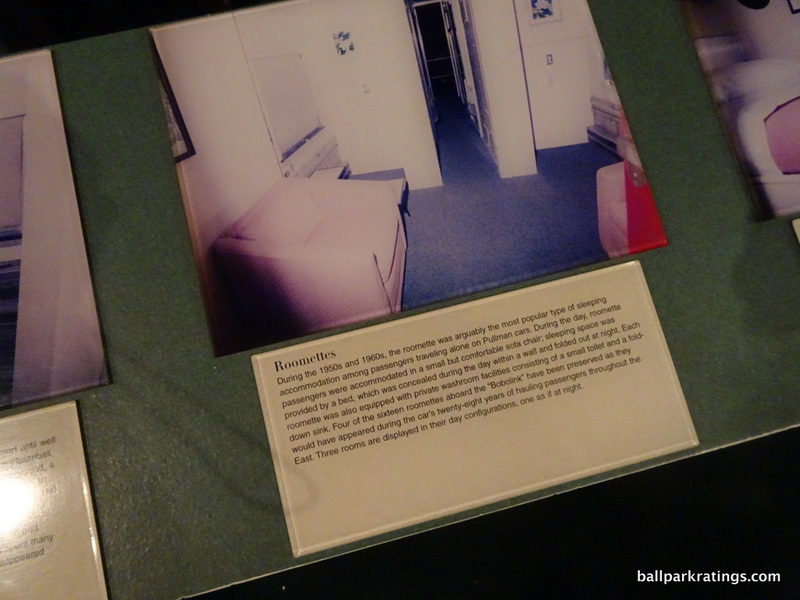 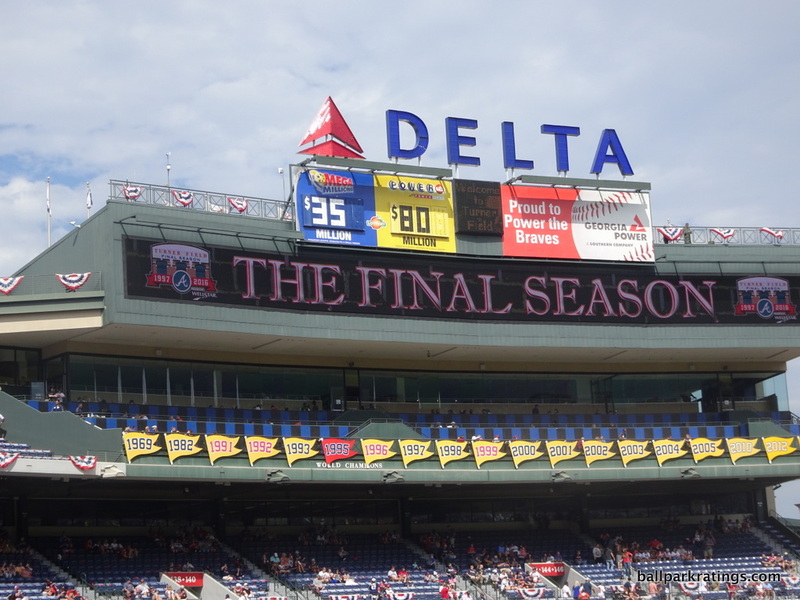 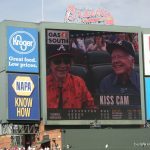 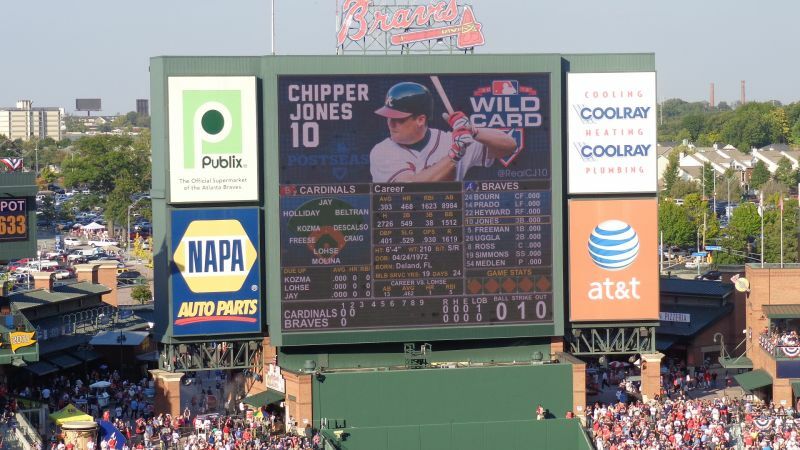 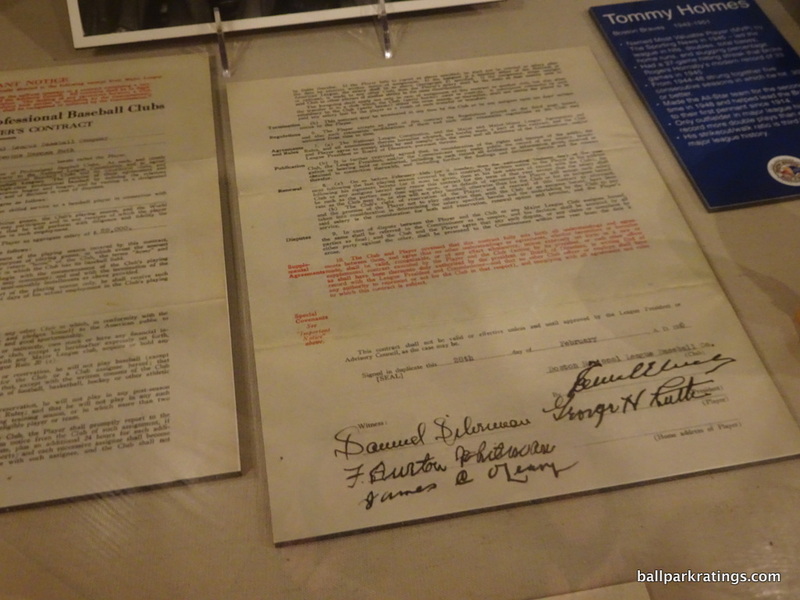 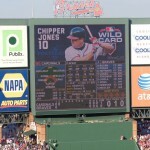 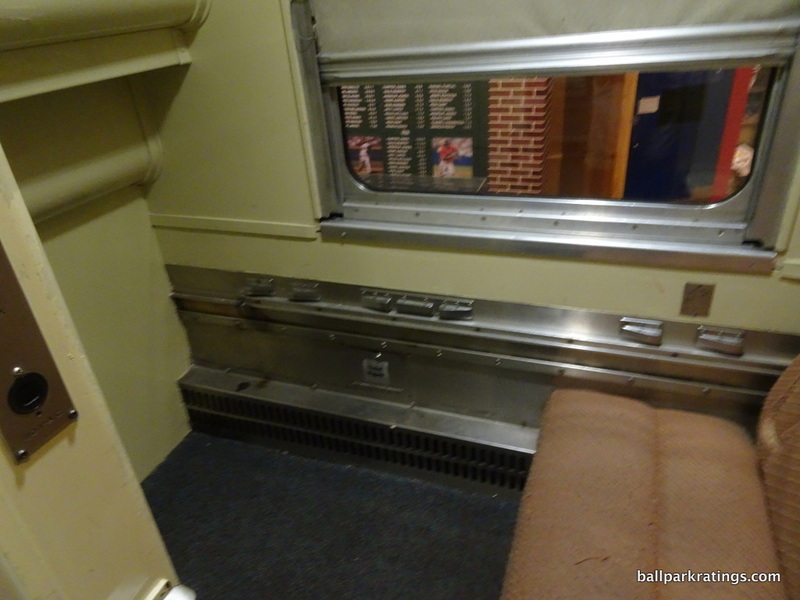 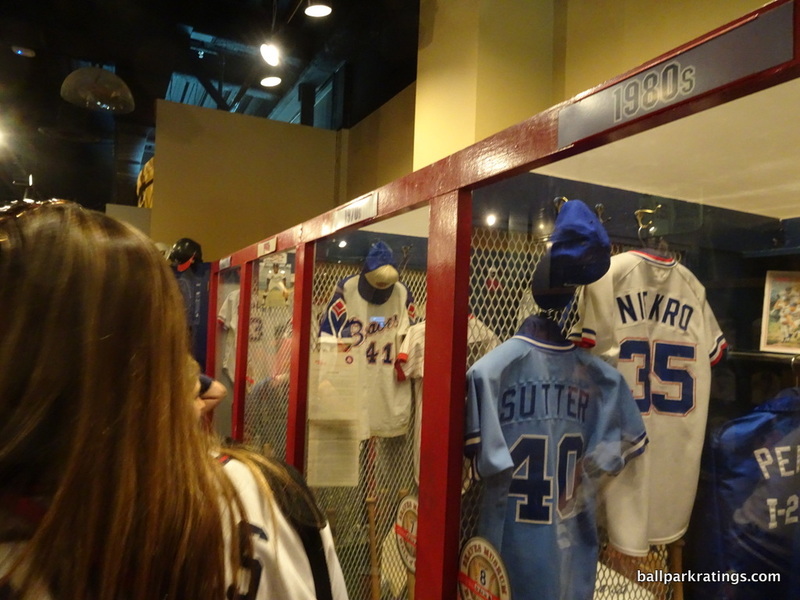 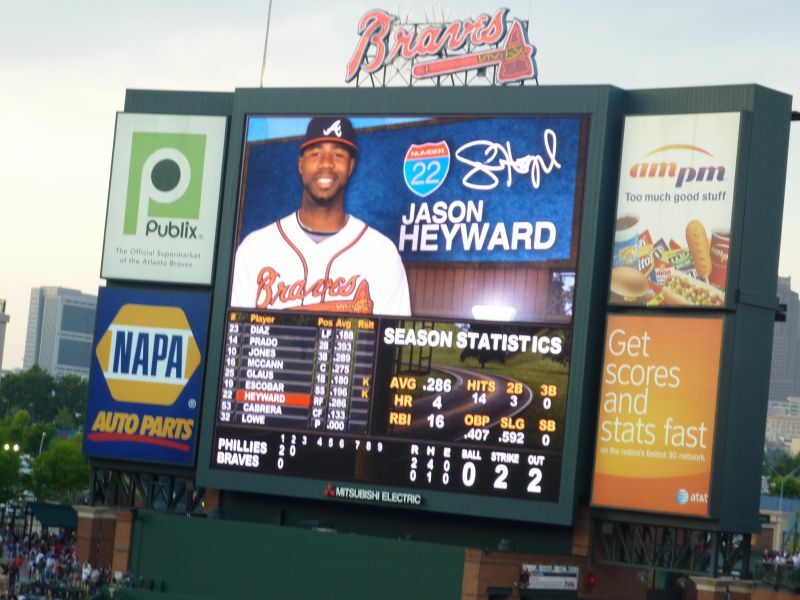 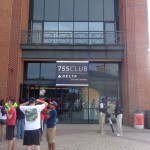 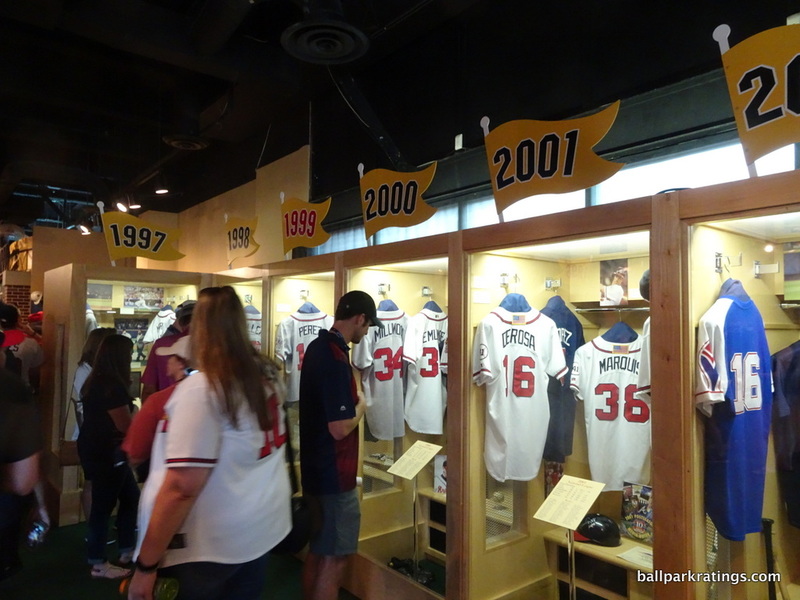 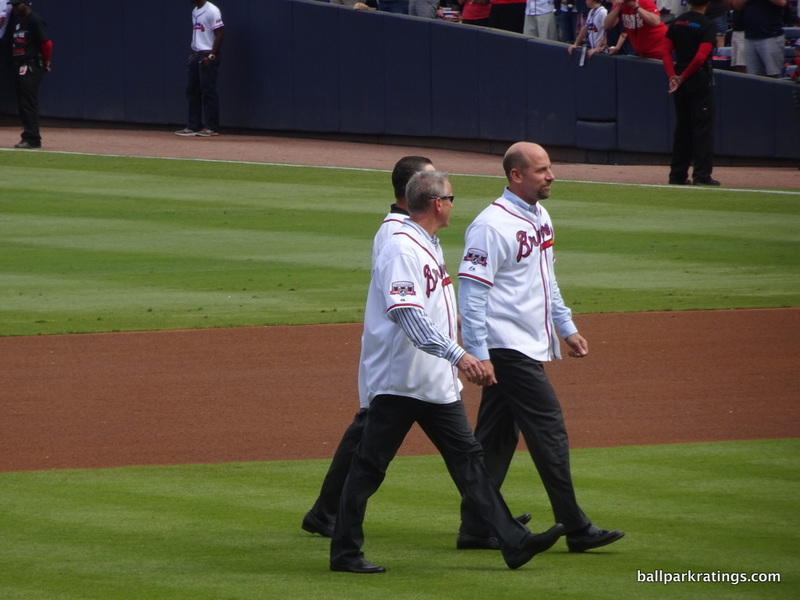 The references to team history are perhaps Turner Field’s strong point. 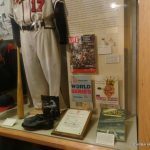 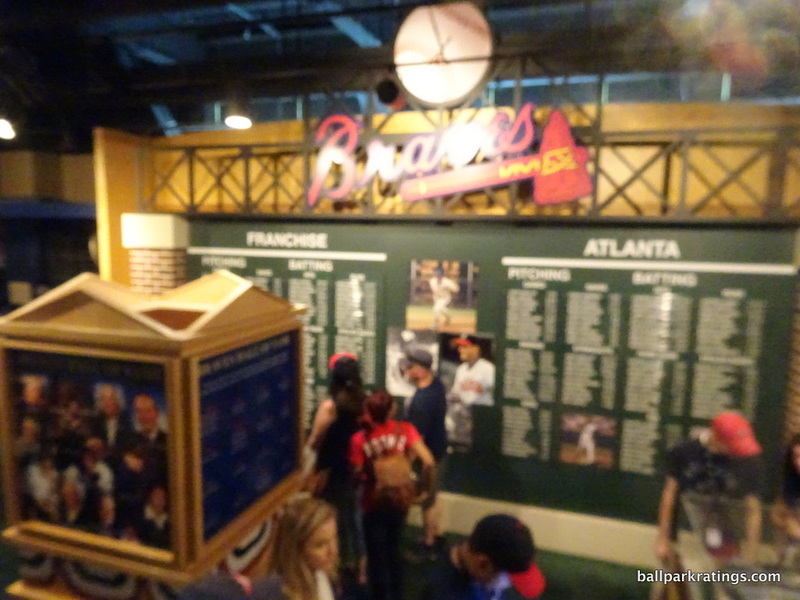 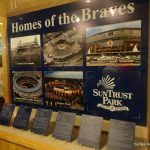 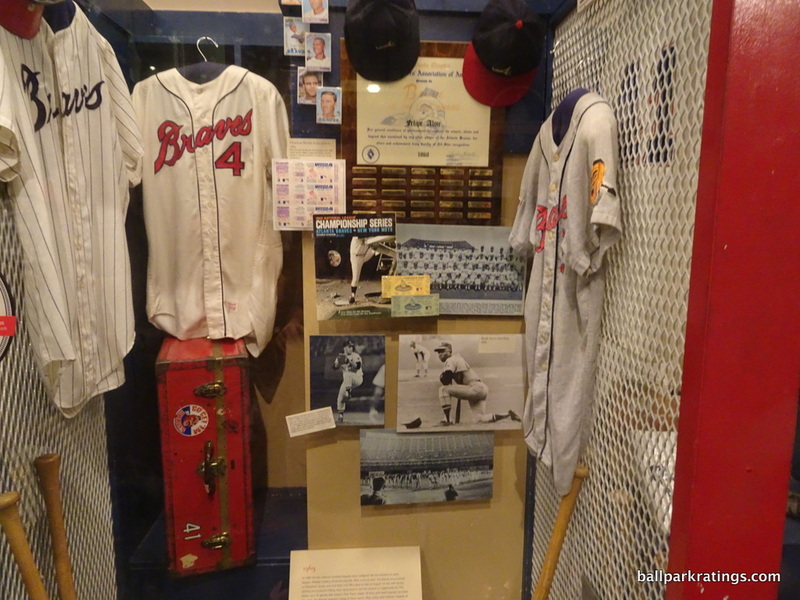 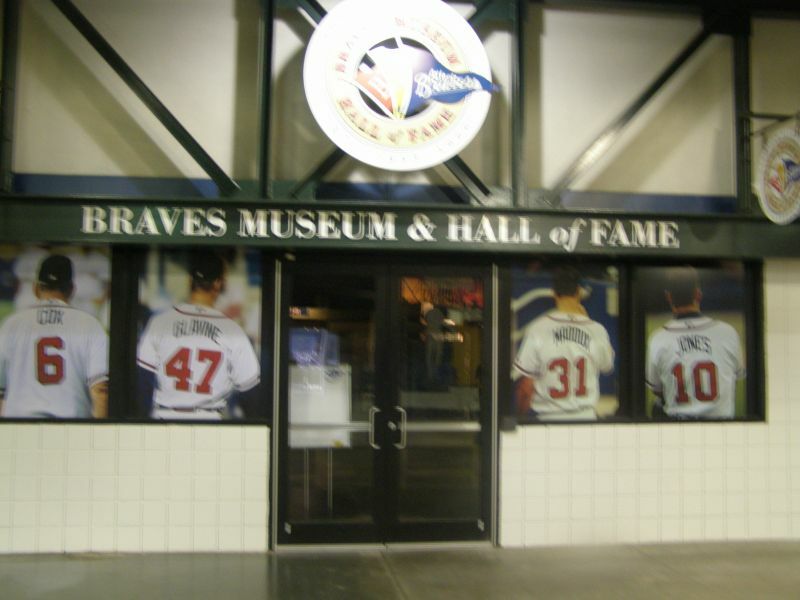 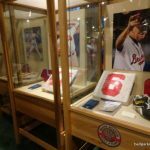 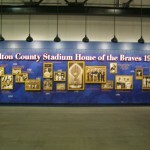 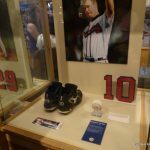 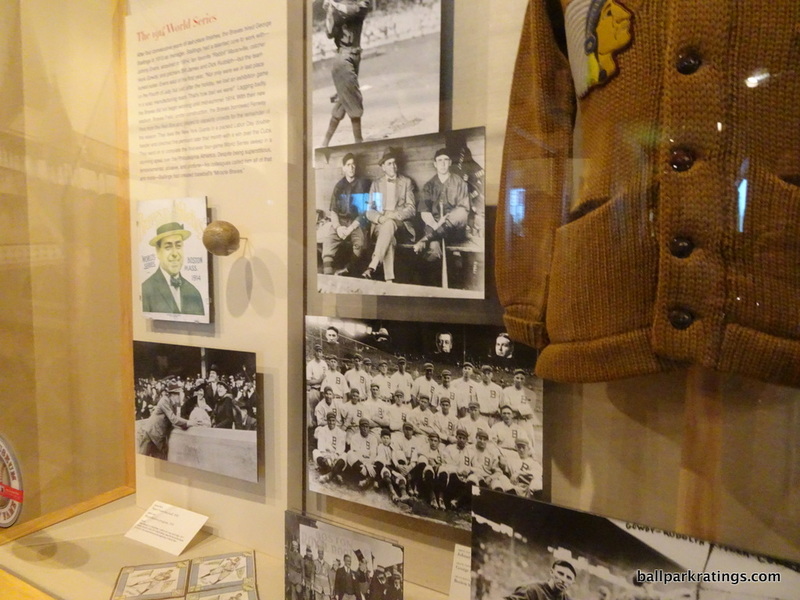 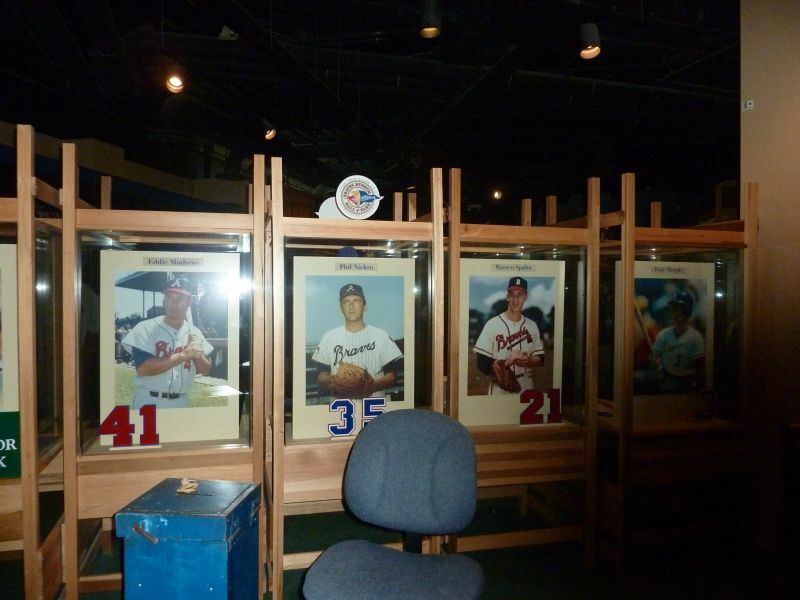 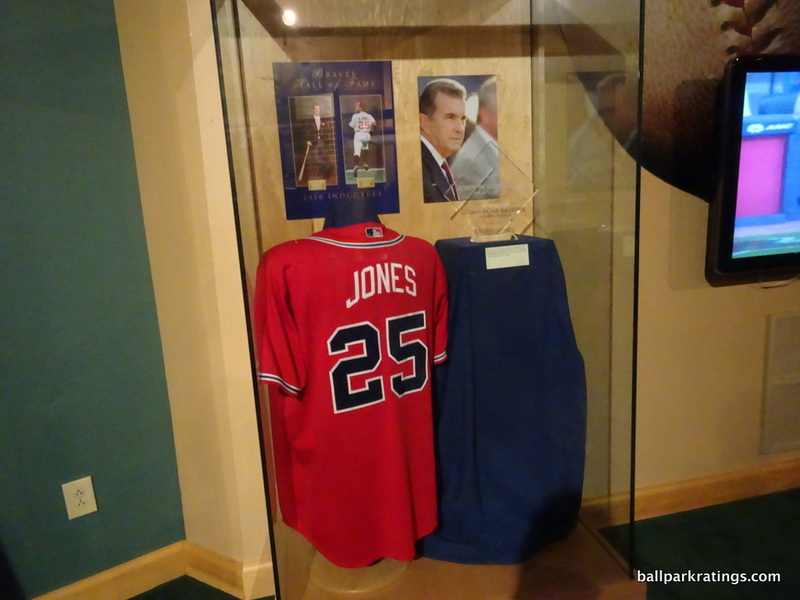 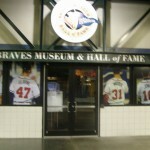 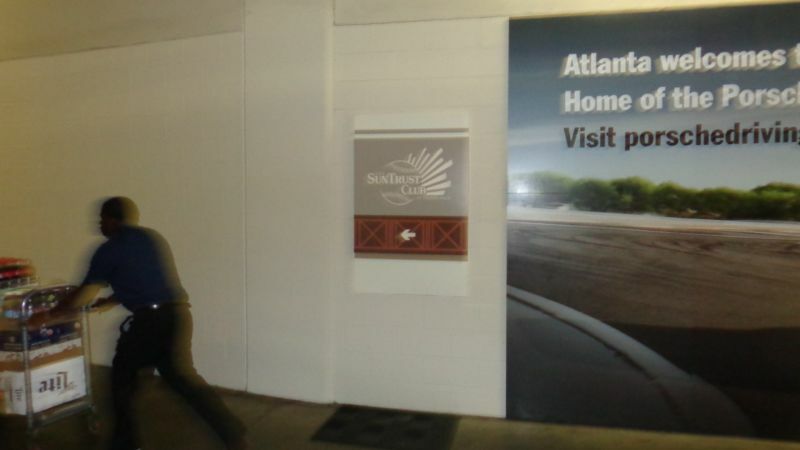 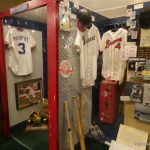 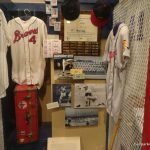 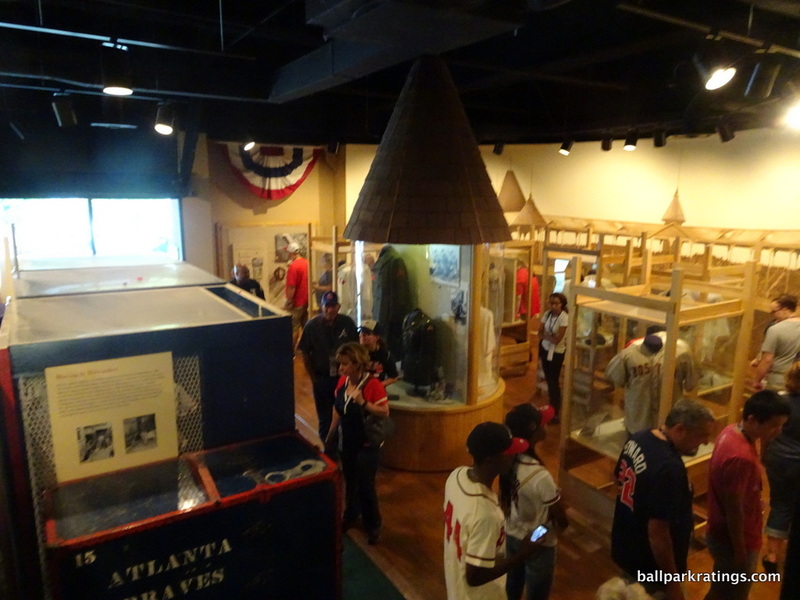 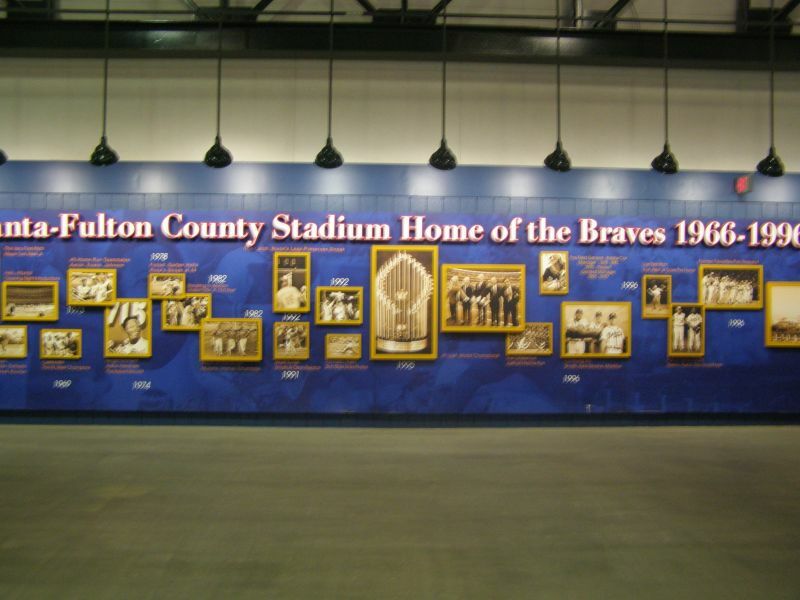 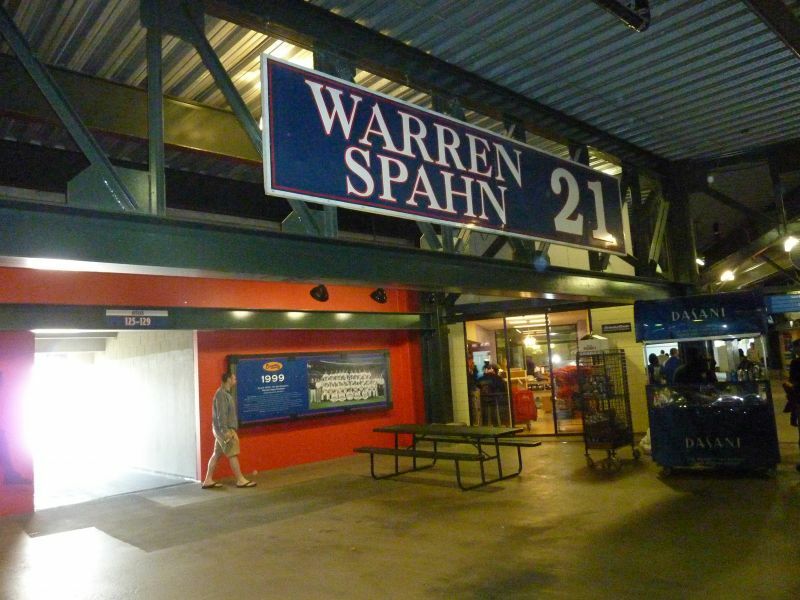 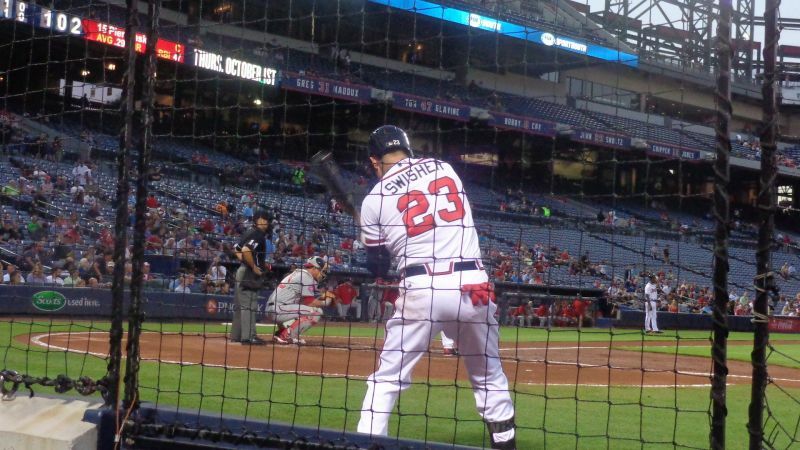 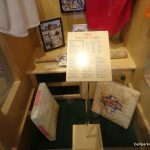 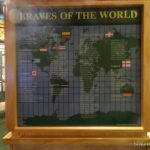 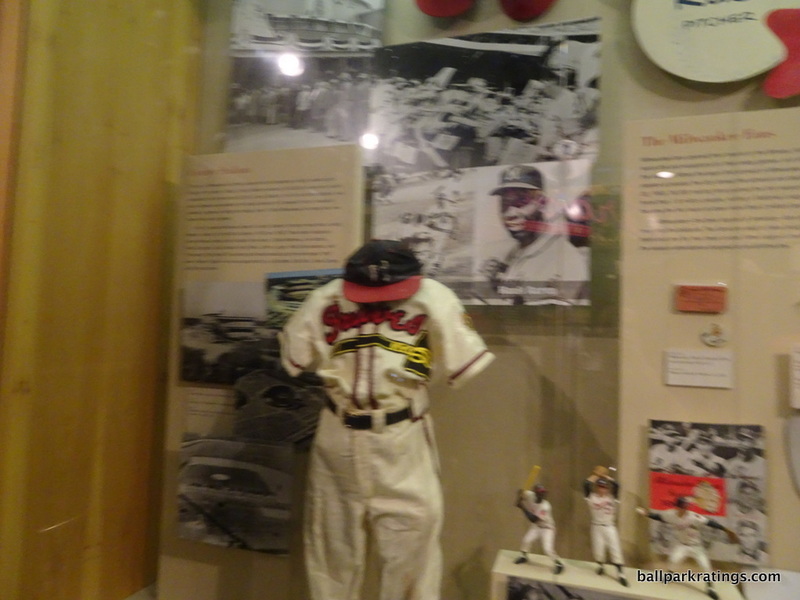 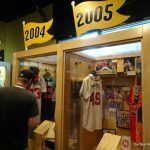 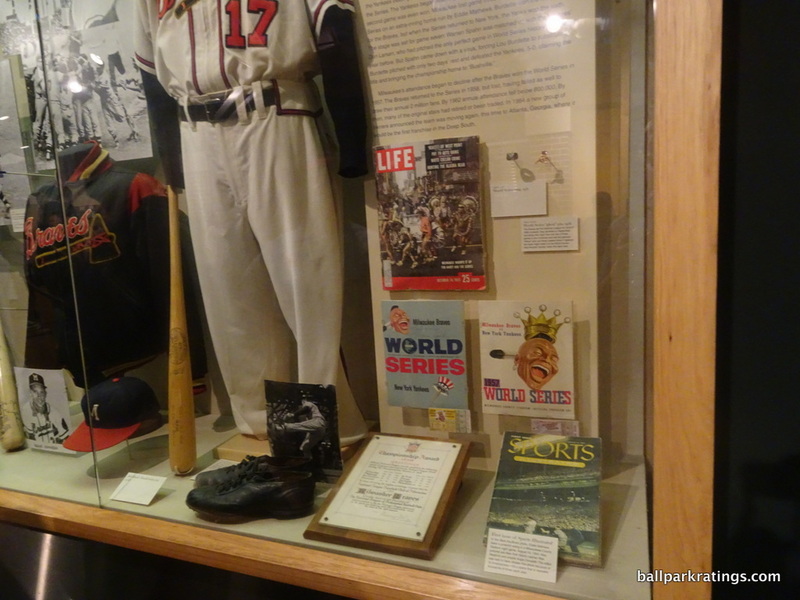 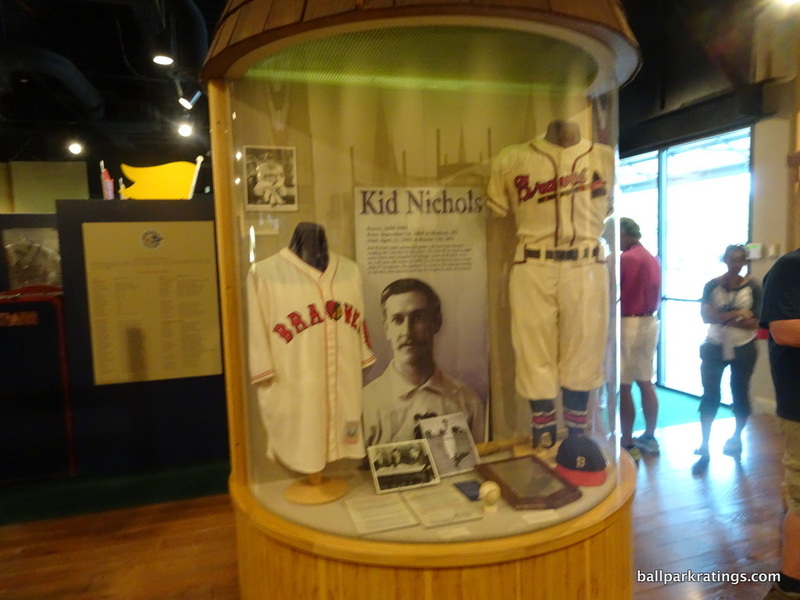 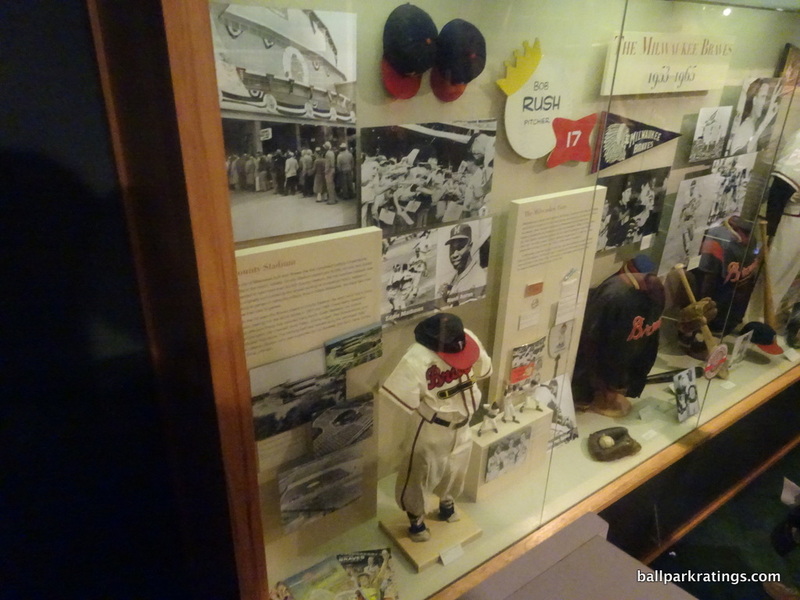 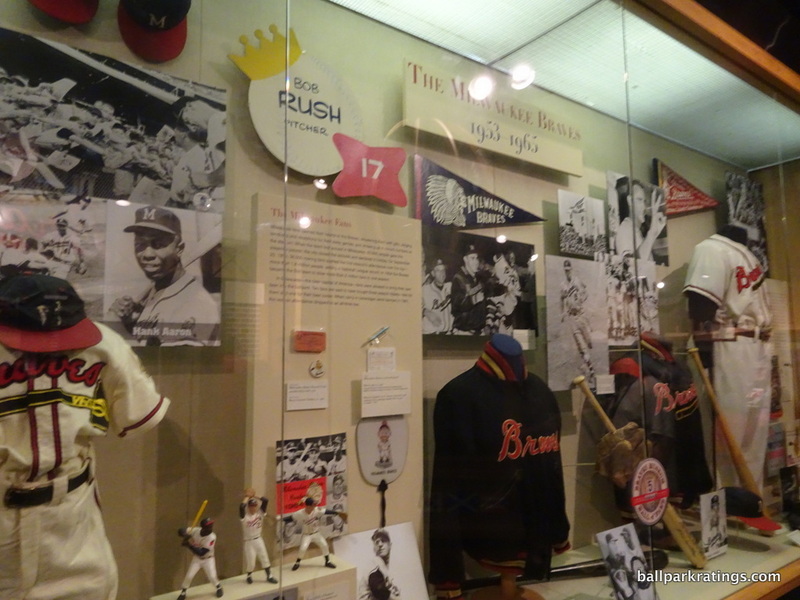 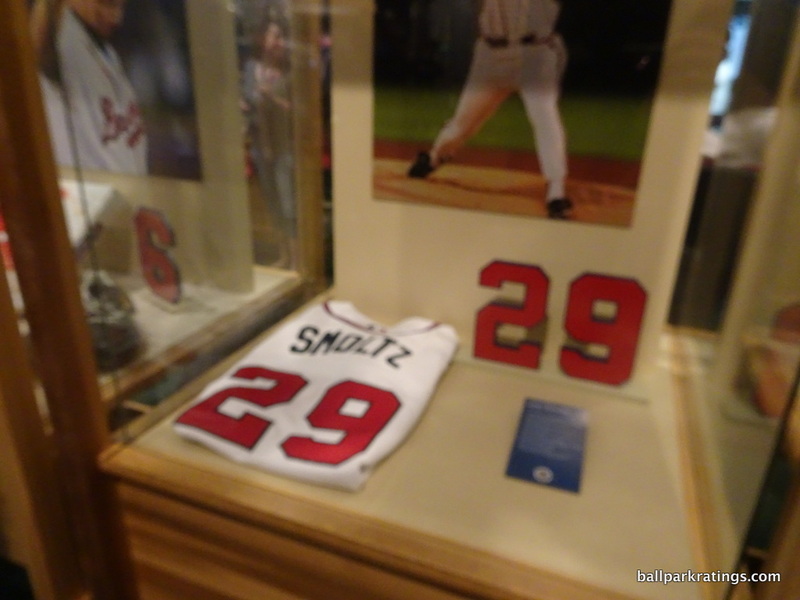 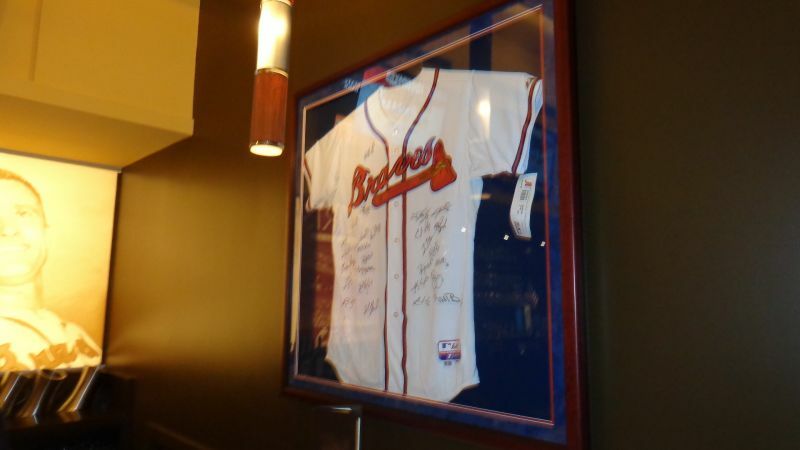 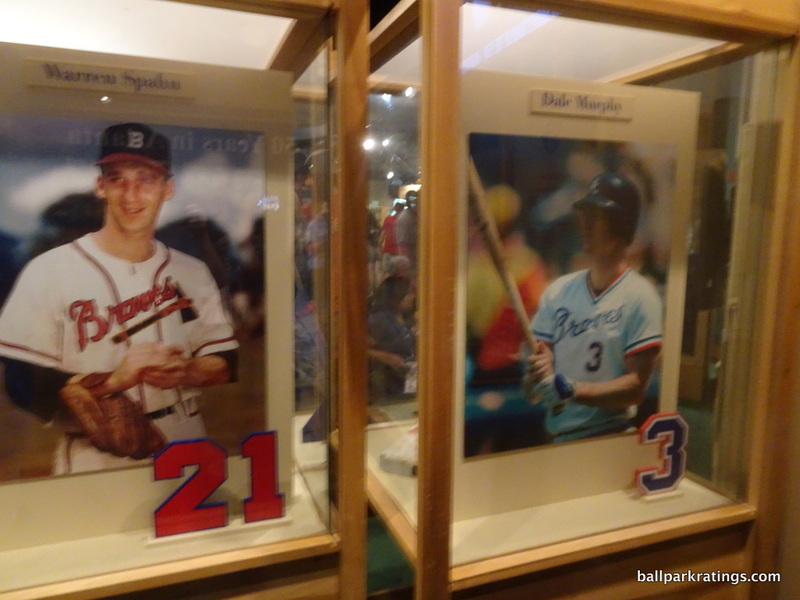 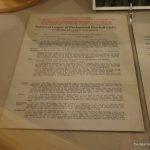 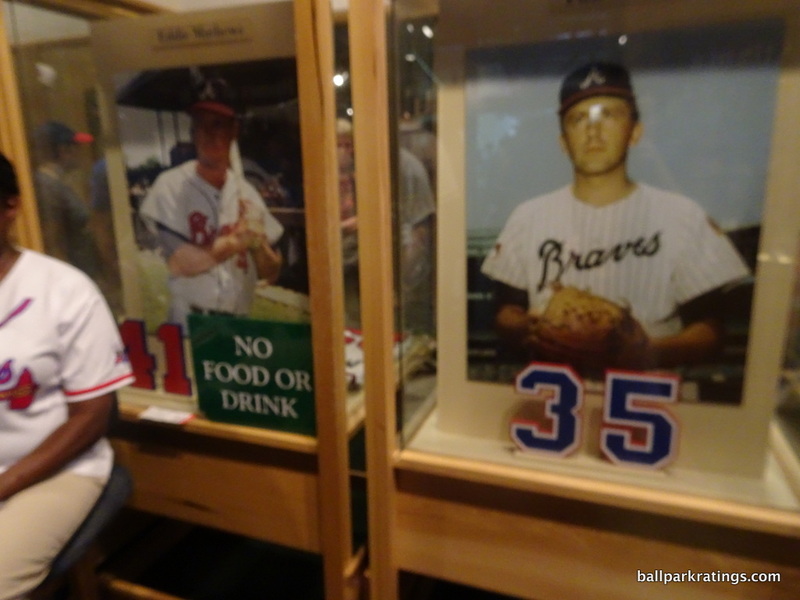 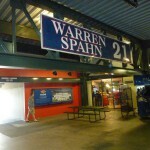 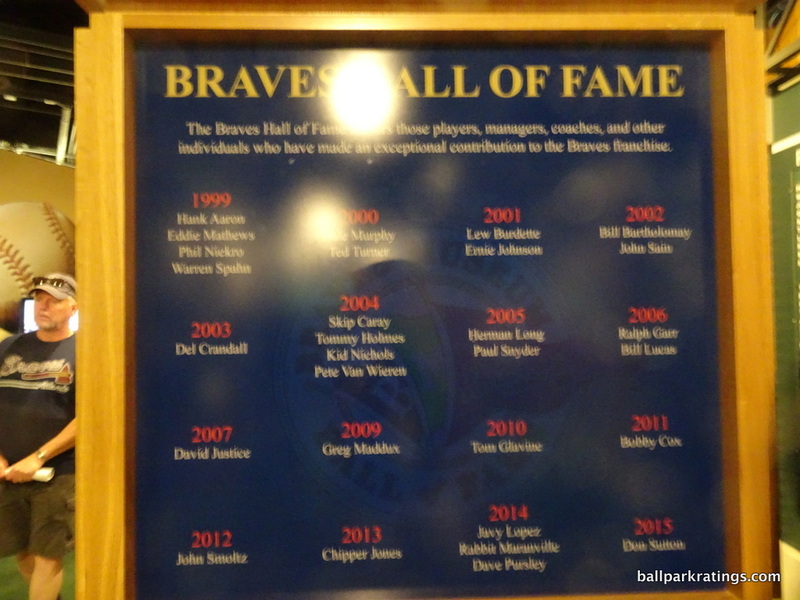 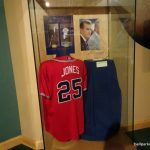 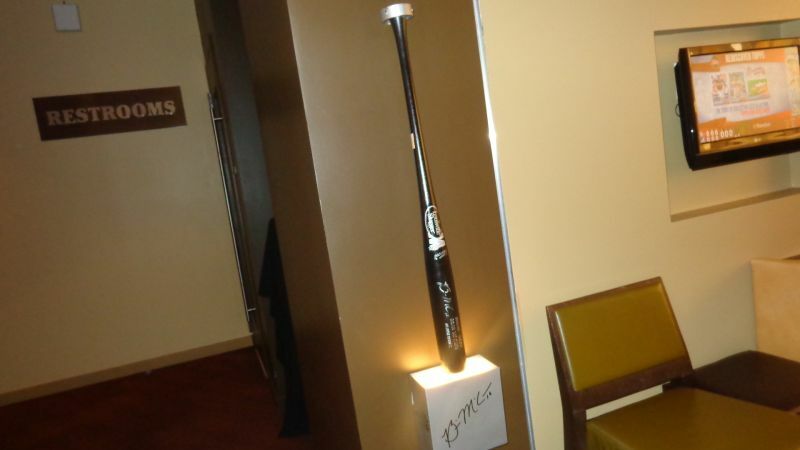 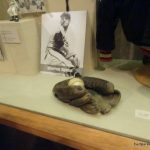 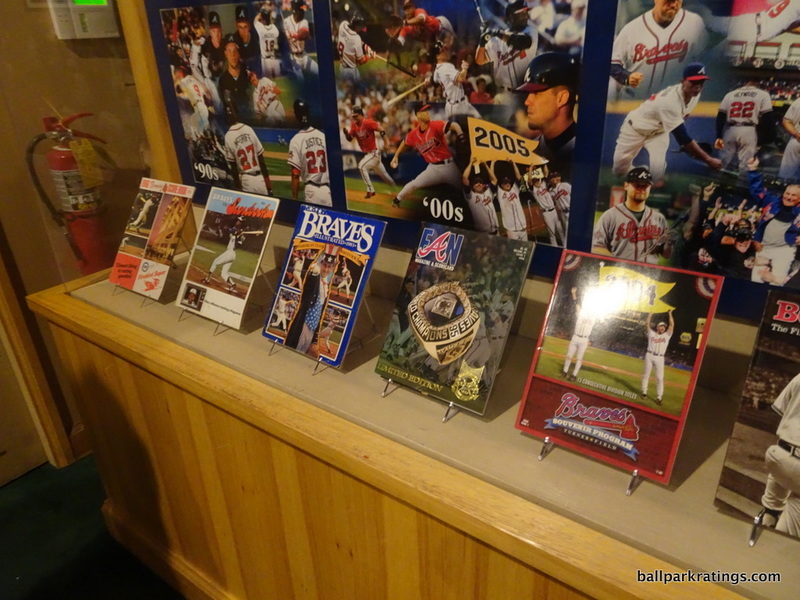 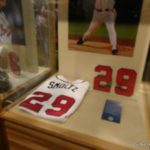 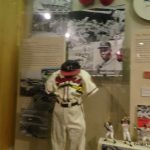 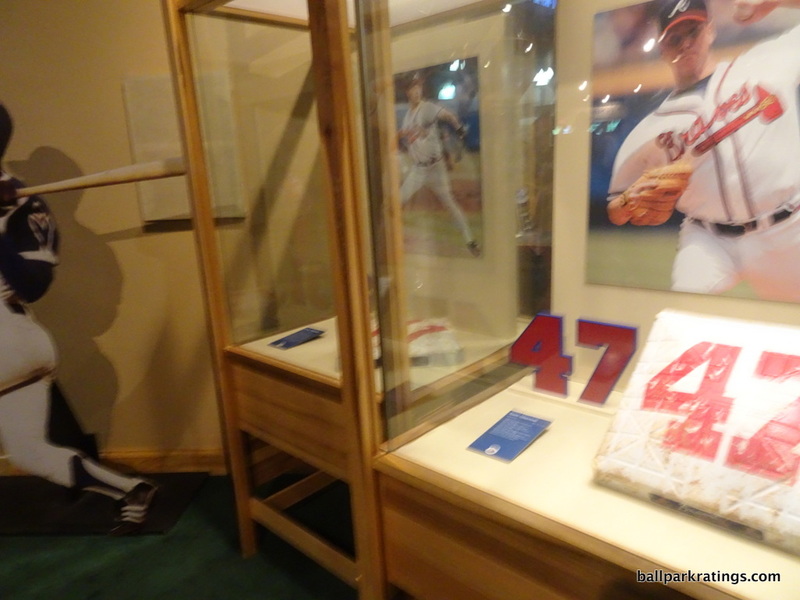 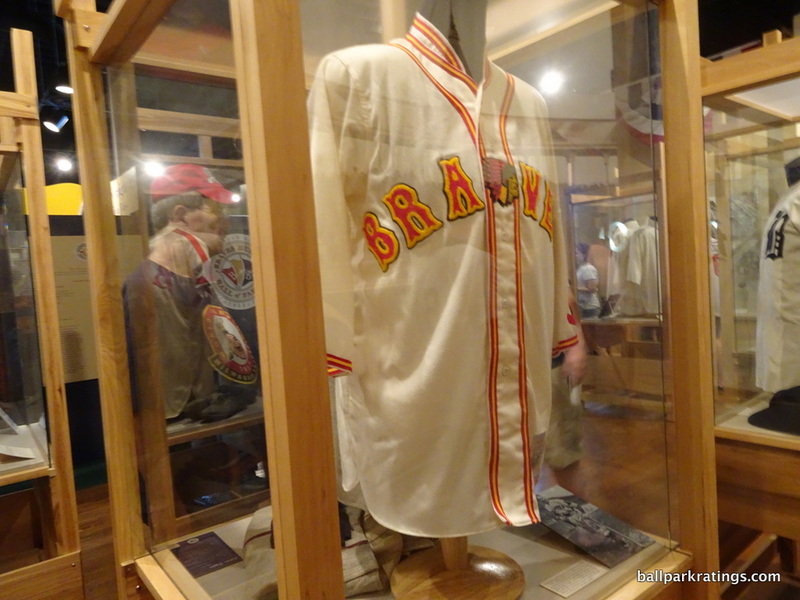 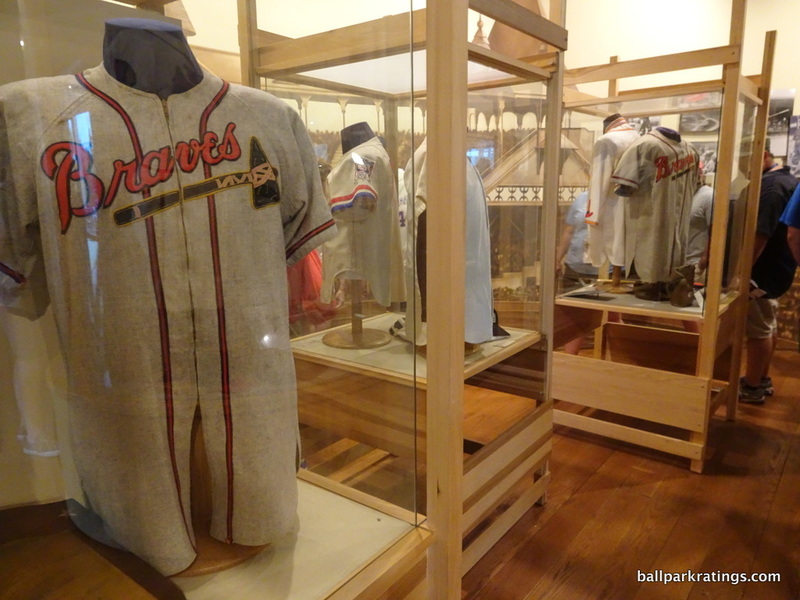 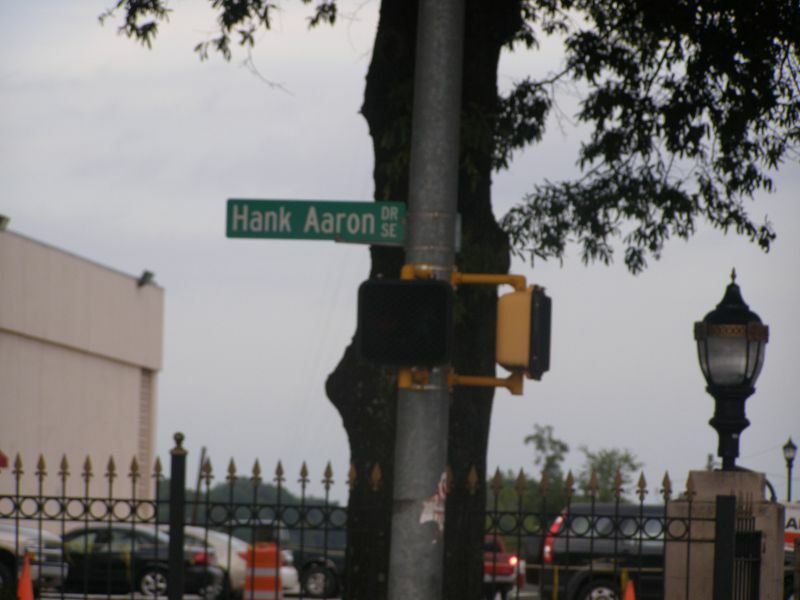 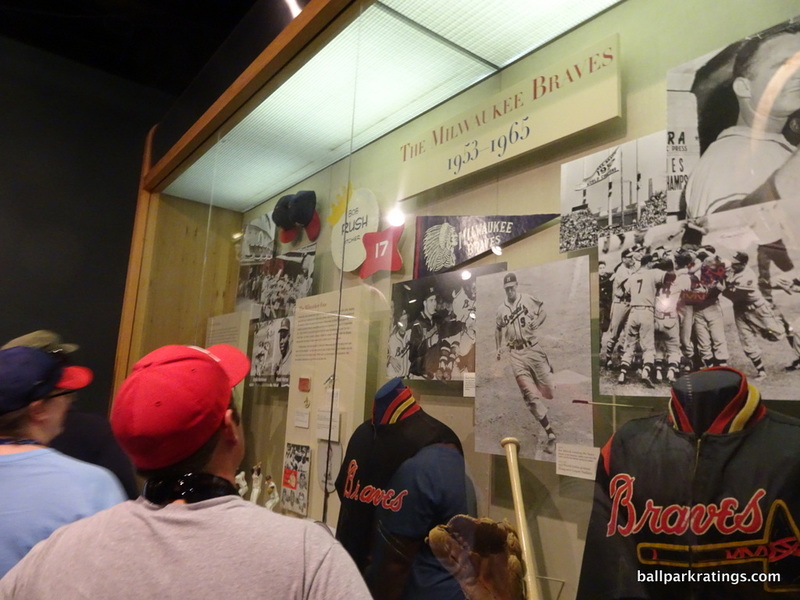 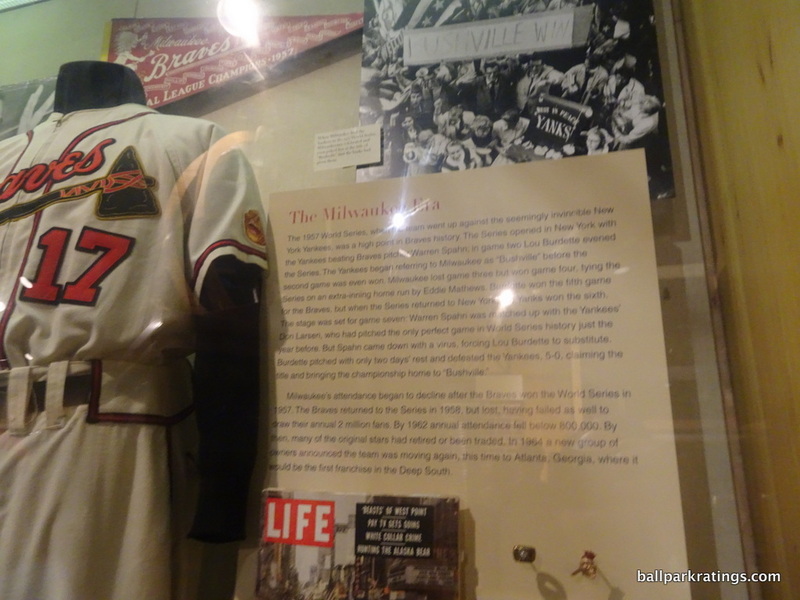 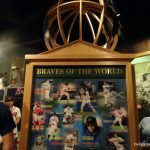 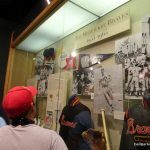 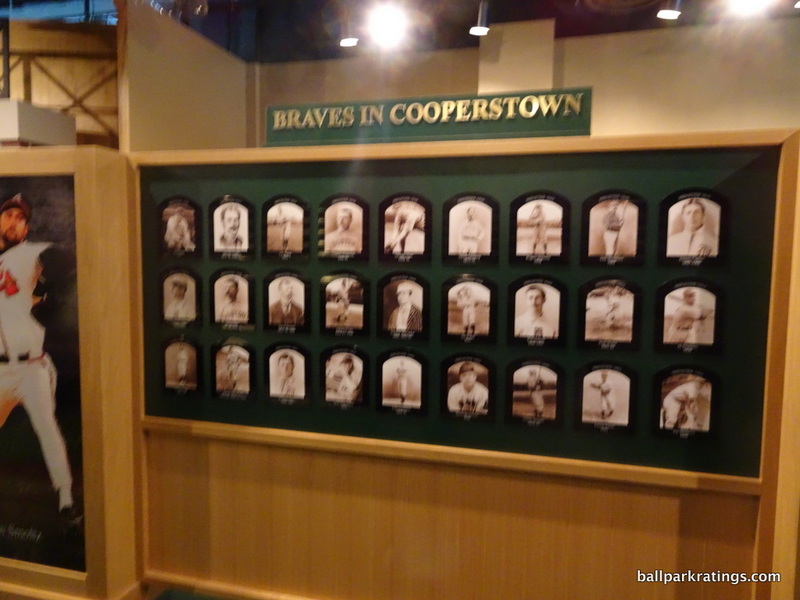 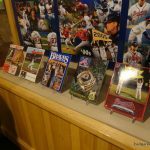 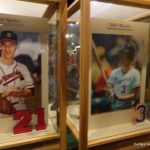 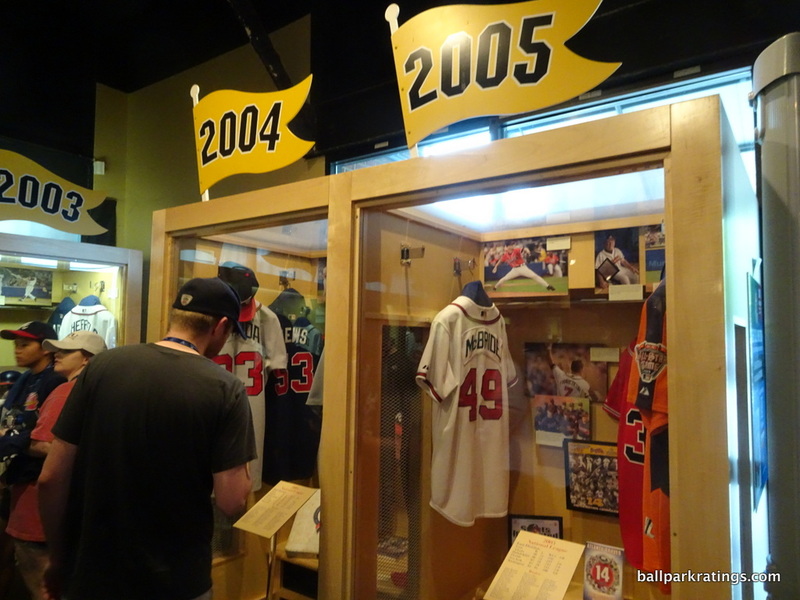 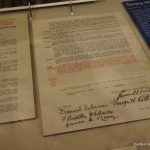 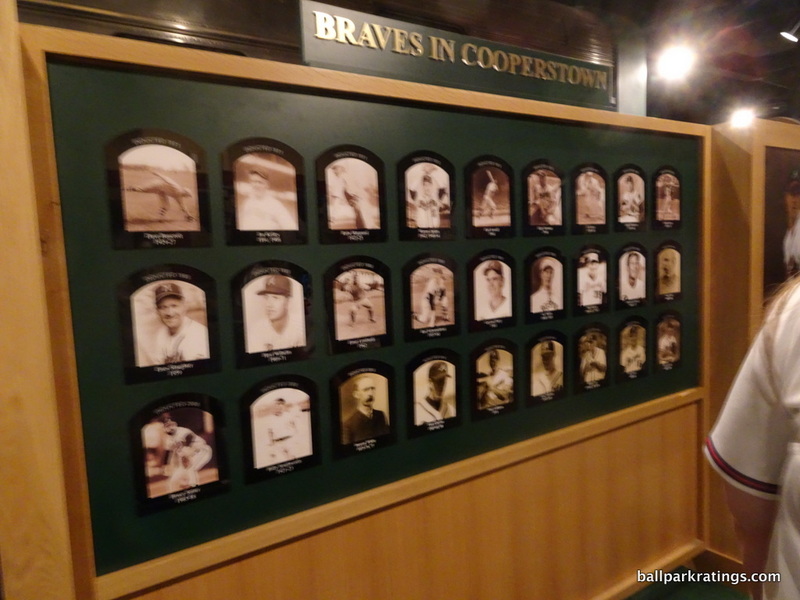 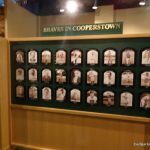 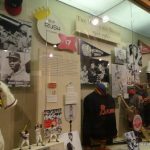 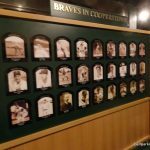 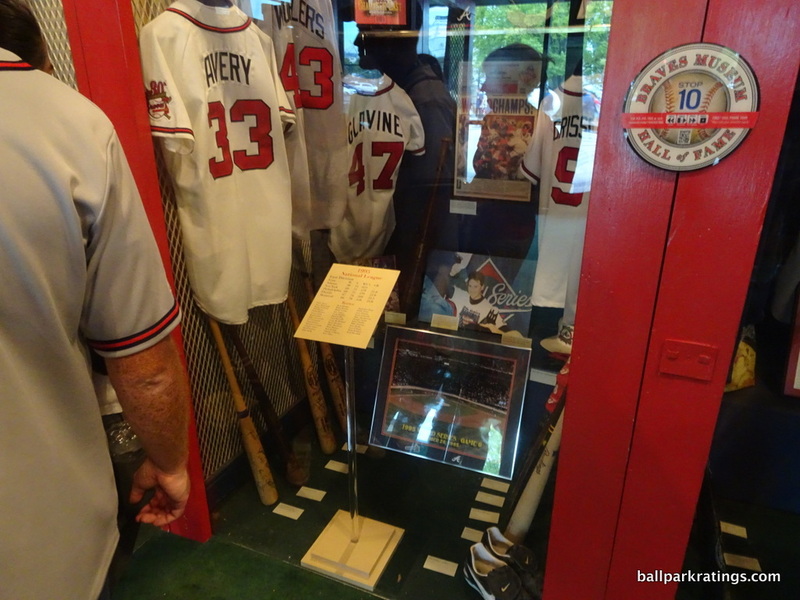 From Monument Grove and the museum, to pretty much every area on the concourses, there’s a nod to Braves history. 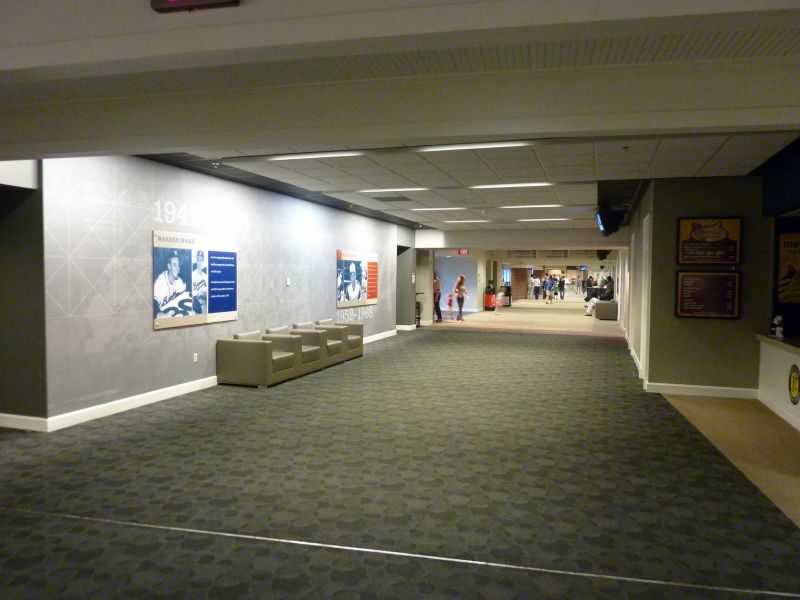 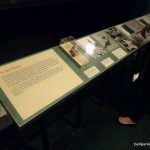 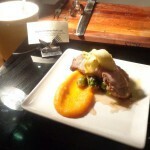 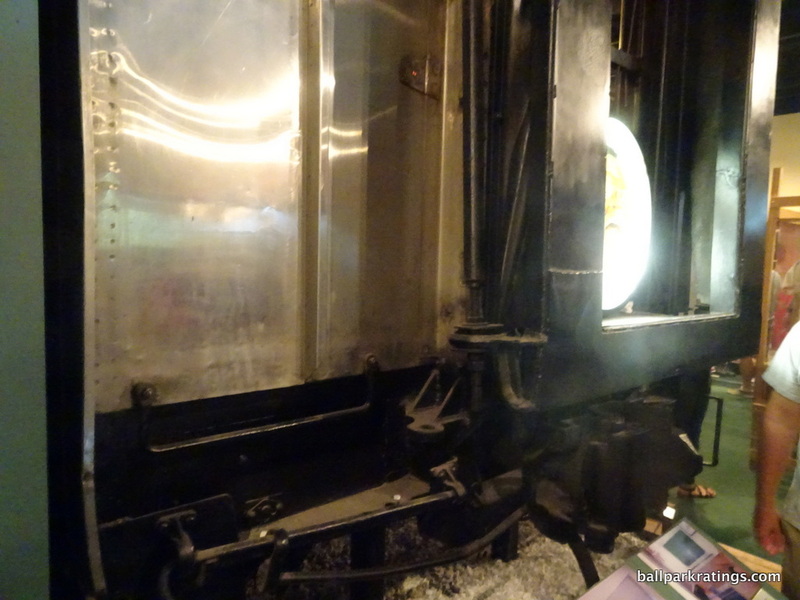 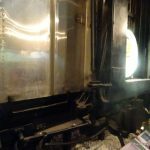 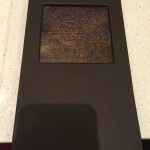 That deserves huge praise, as history mitigates the bland atmosphere. 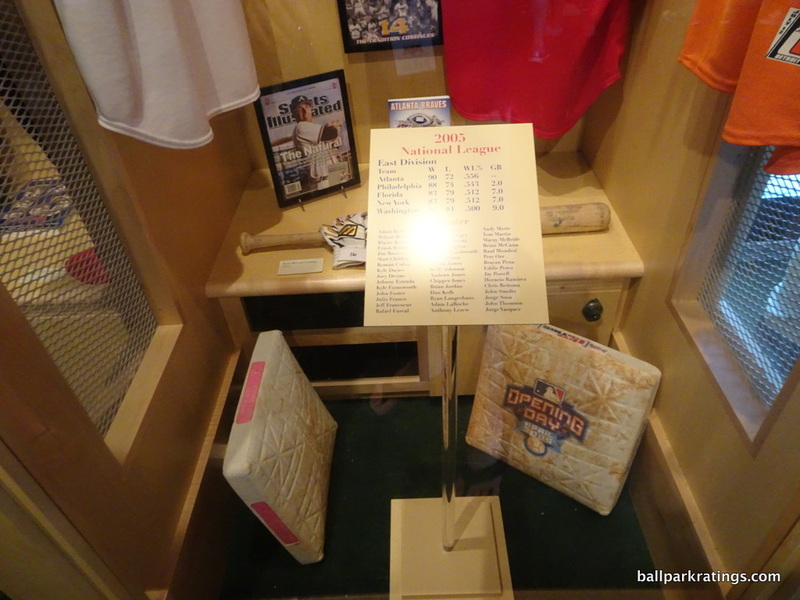 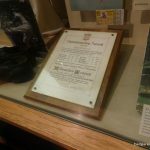 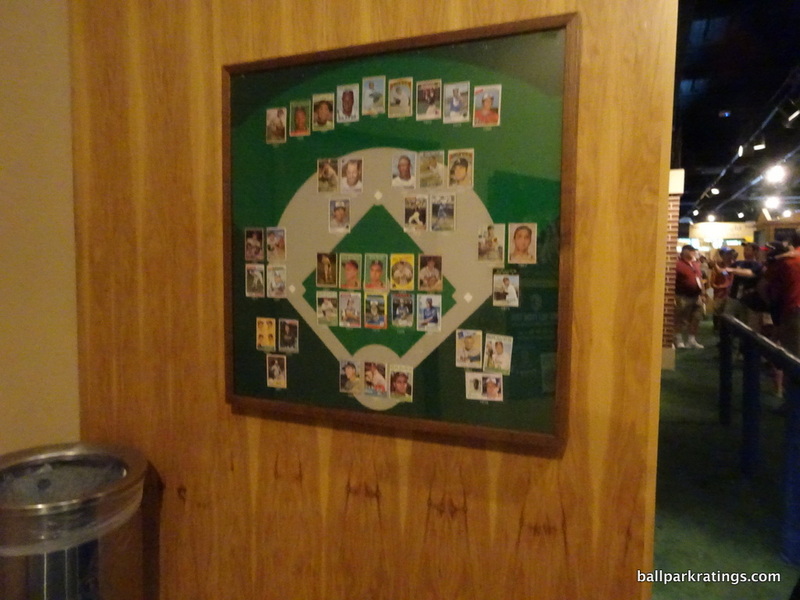 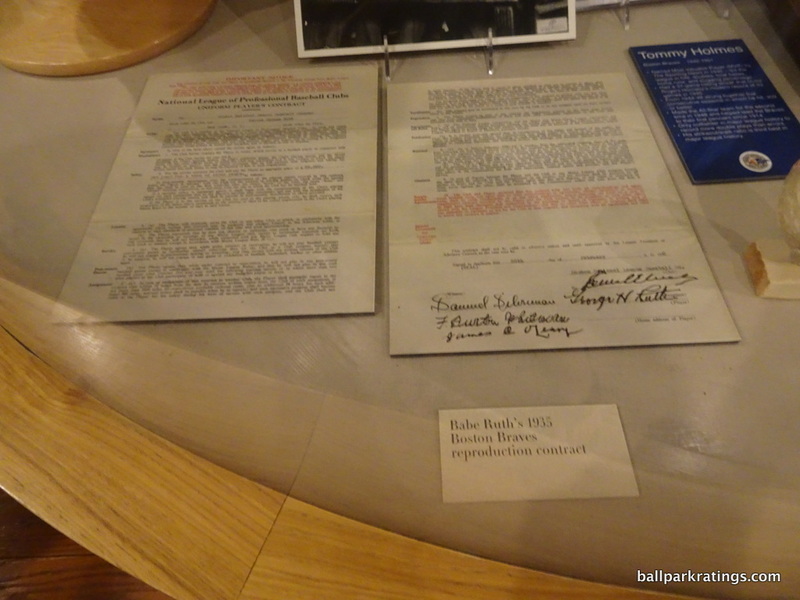 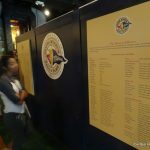 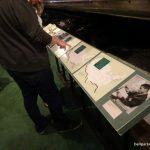 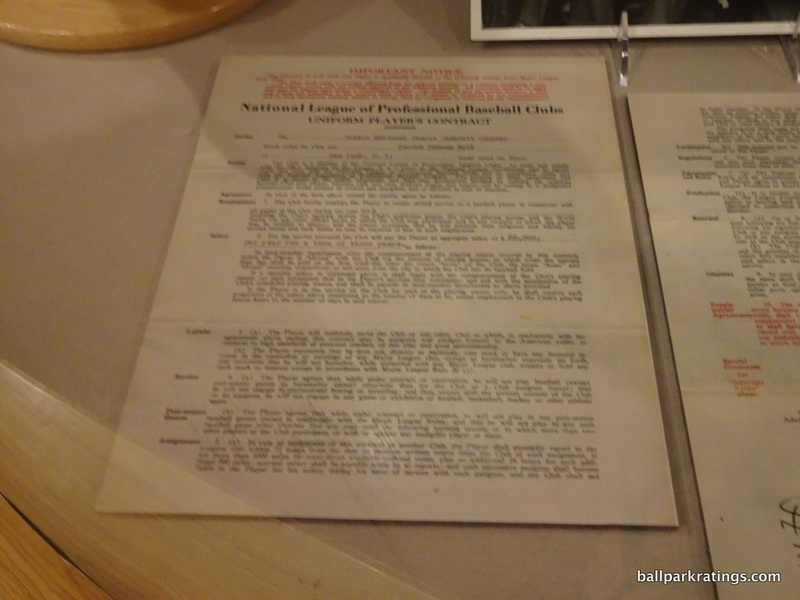 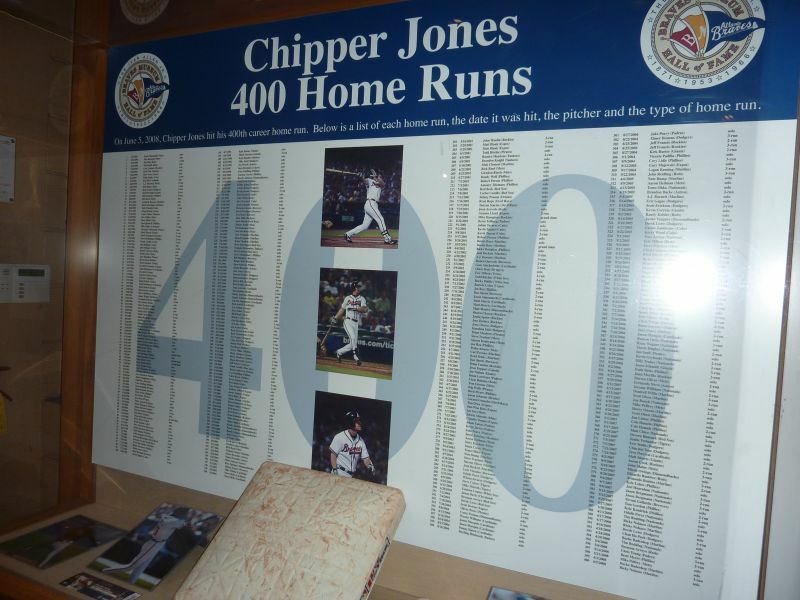 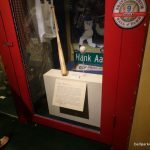 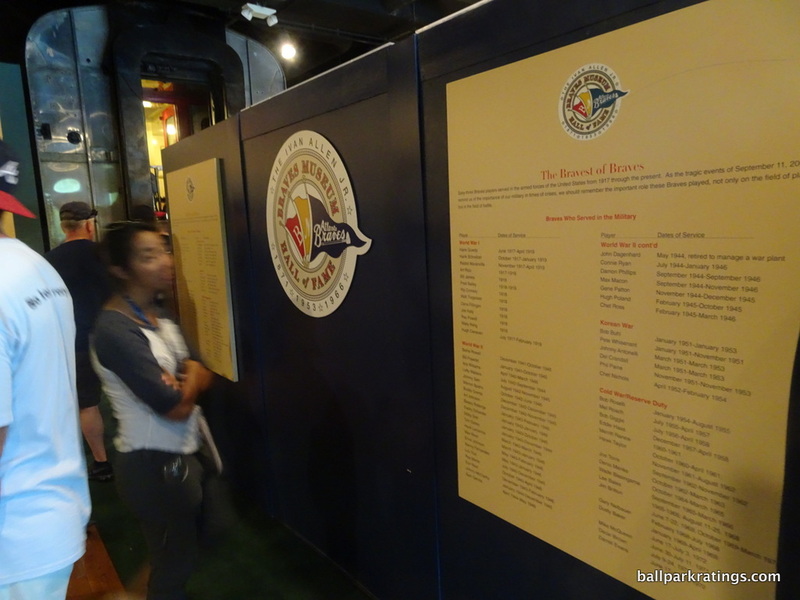 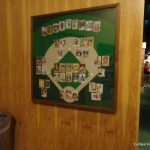 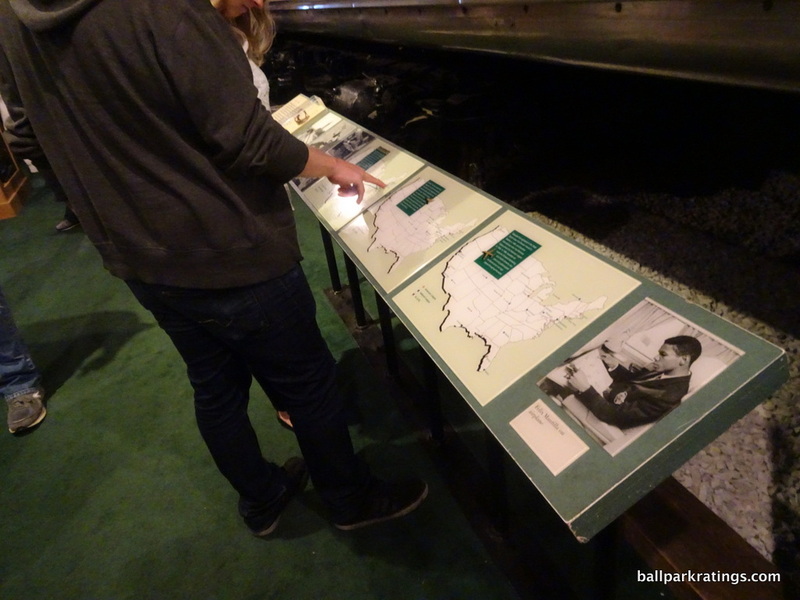 It’s almost like they knew there was no way to give the ballpark any type of distinct regional feel because of the area, so they compensated with tons of team history. 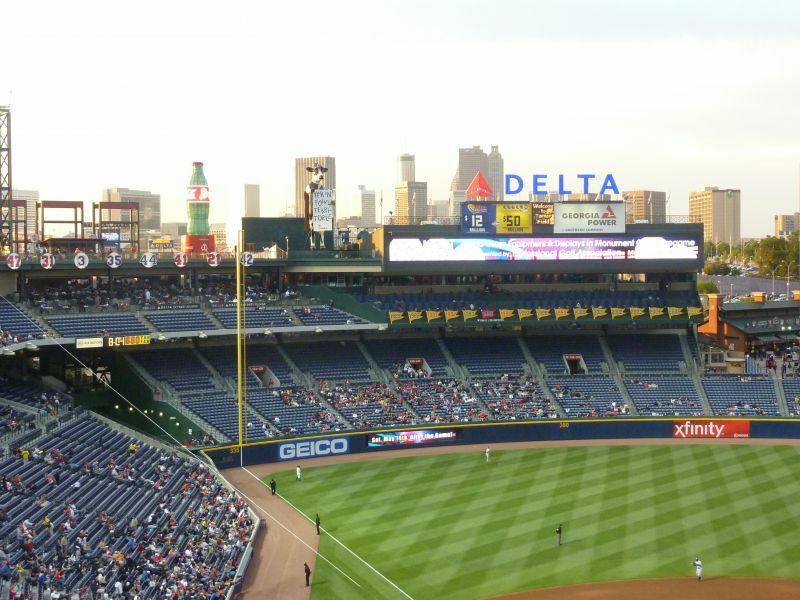 But all post-1991 ballparks are good ballparks, and I think its clear that Turner Field offers the least to the retro ballpark landscape. 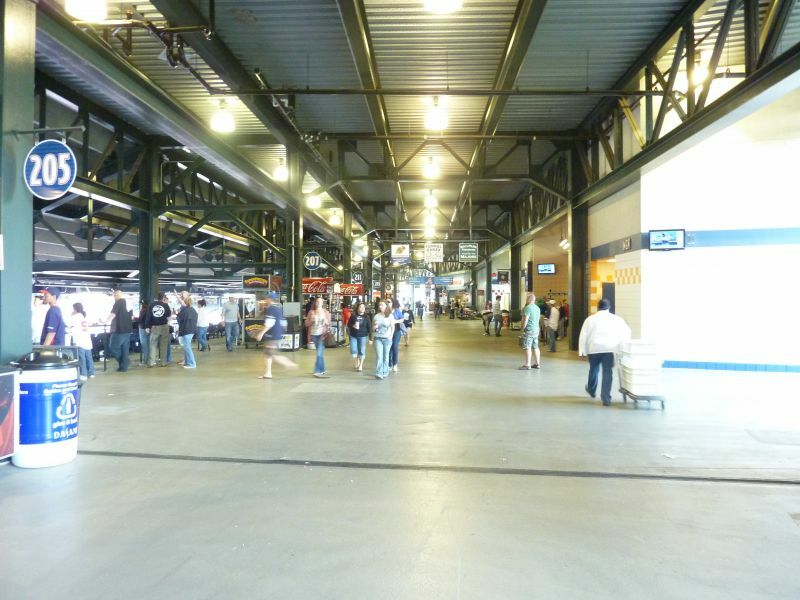 Just looking at the inside, you can tell it emphasizes an overabundance of amenities above aesthetics and contextual integration. 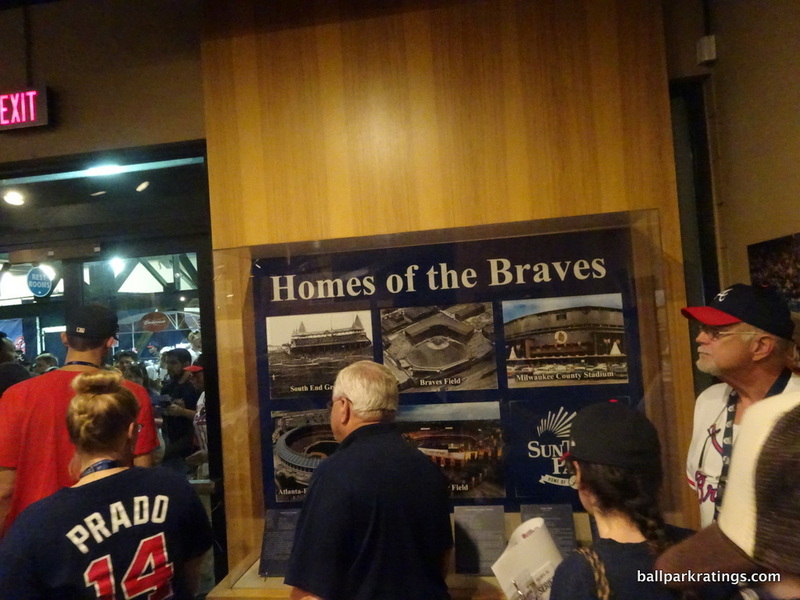 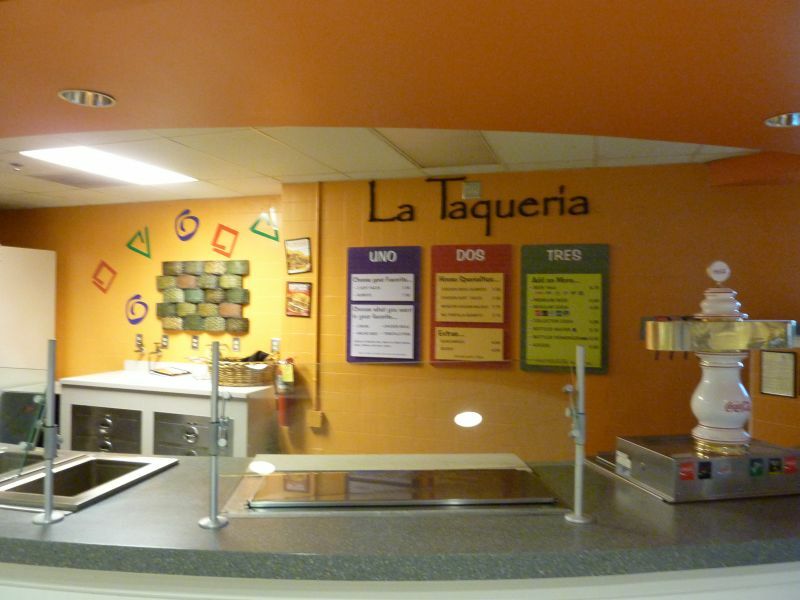 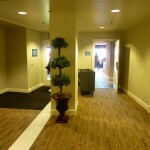 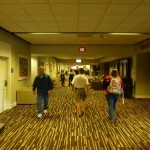 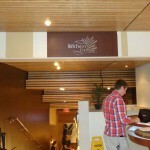 But it fails too much architecturally for you to notice some of these nice, albeit generic, fan features. 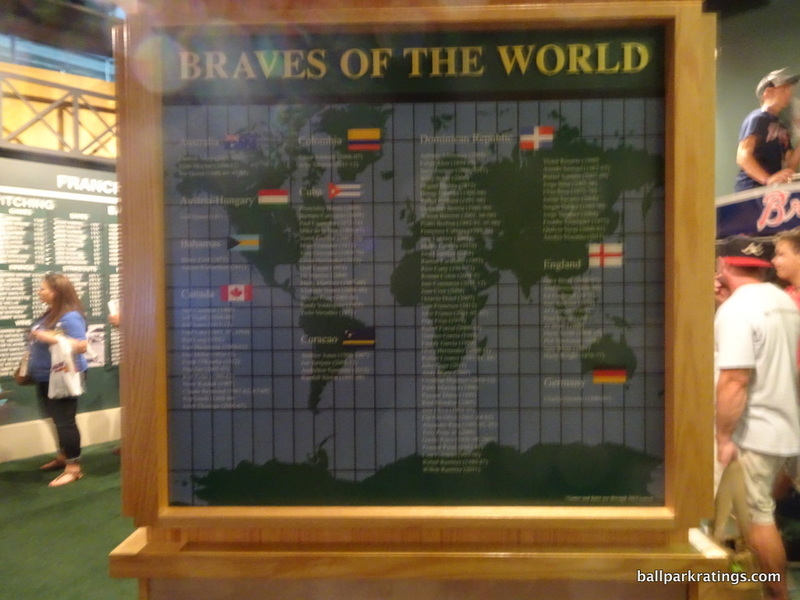 You’ll note it’s probably the least mentioned new park on the Internet as well, so that should tell you something. 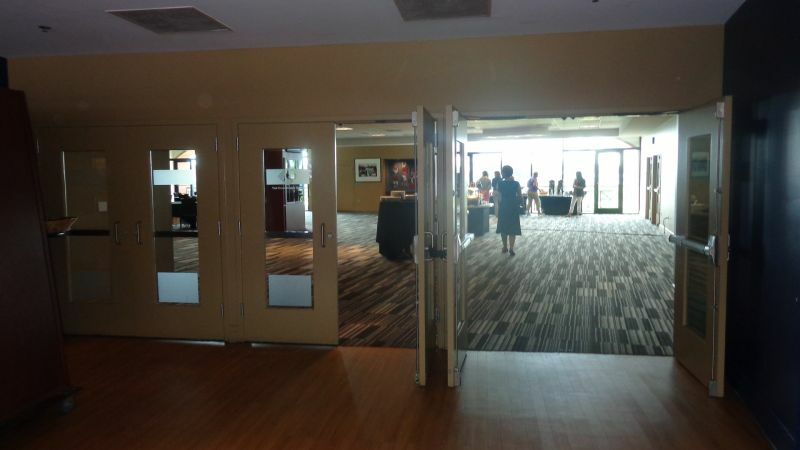 Honestly, it’s a pretty soulless venue, overtly transparent in what it actually is as a structure: a generic yet distracted renovated Olympic stadium.